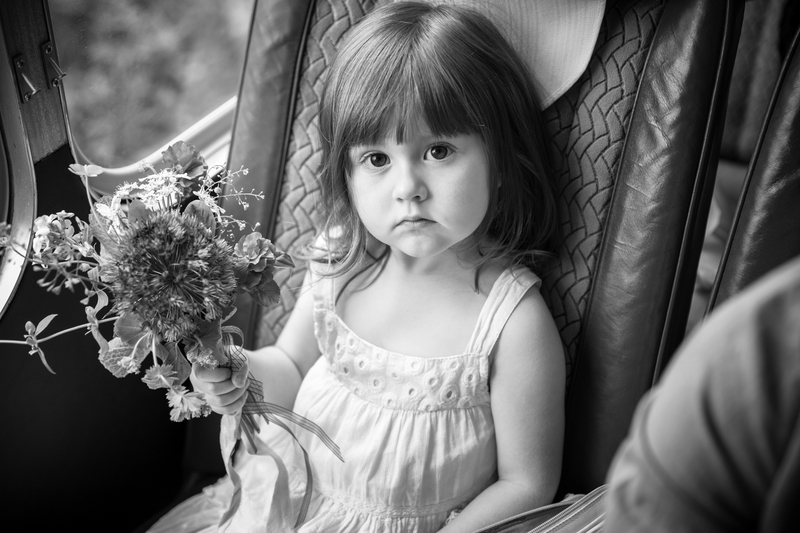 dropped her off with Chris & the boys. 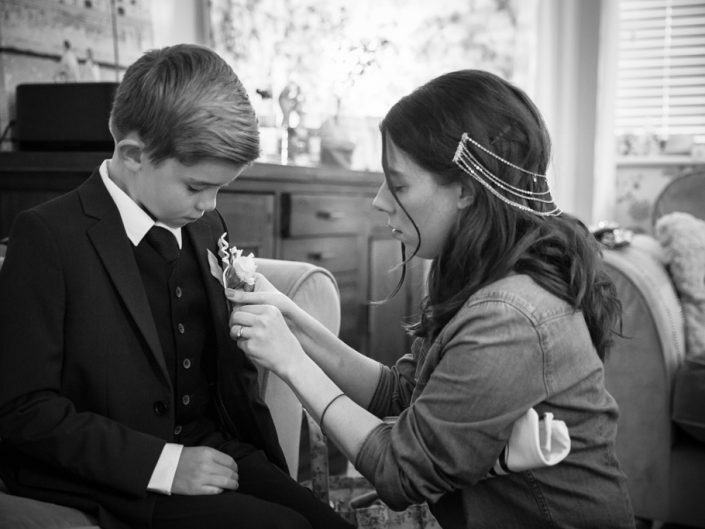 She started the day capturing some images of the boys getting ready before they headed into Oxford. 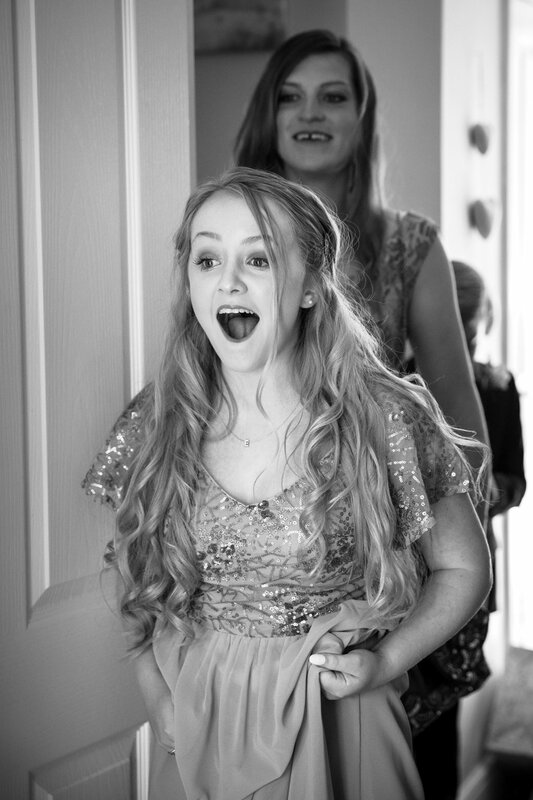 Meanwhile Becky took me to Heather’s sisters house where she was getting ready with her bridesmaids, all nine of them! 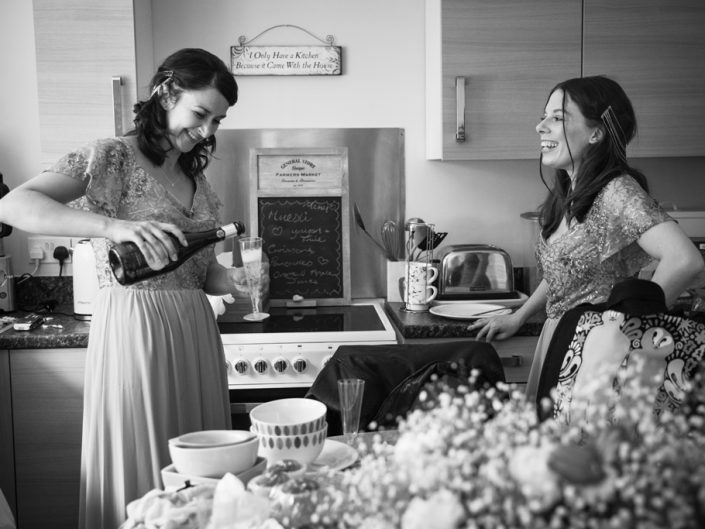 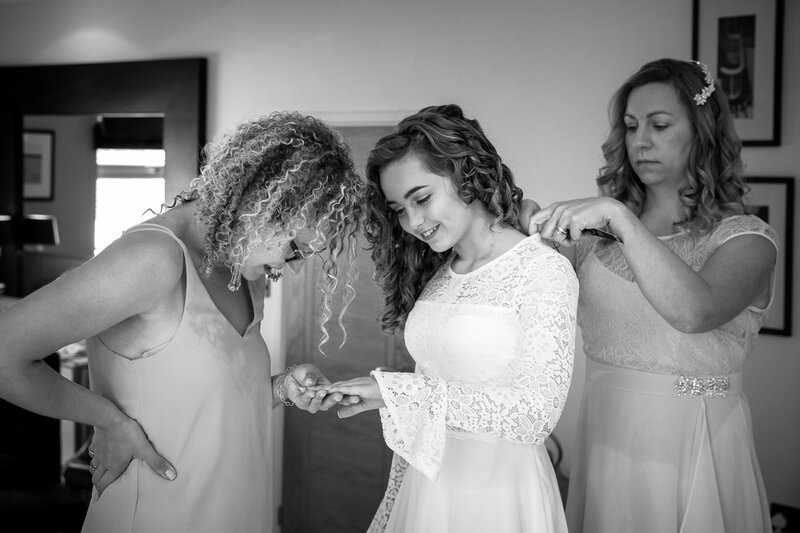 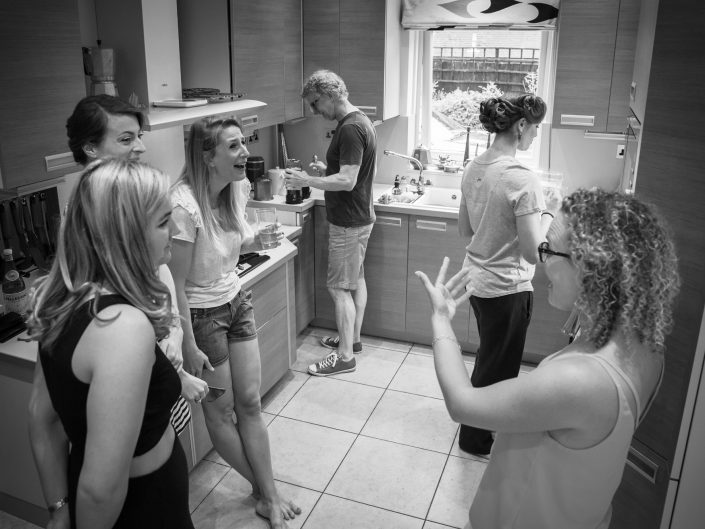 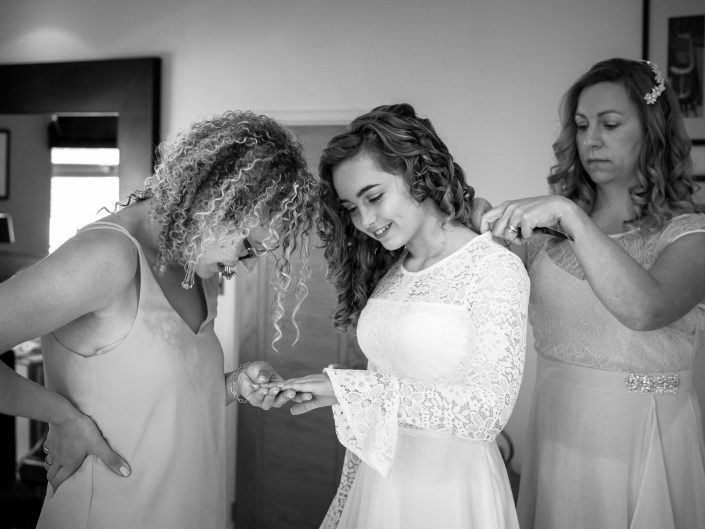 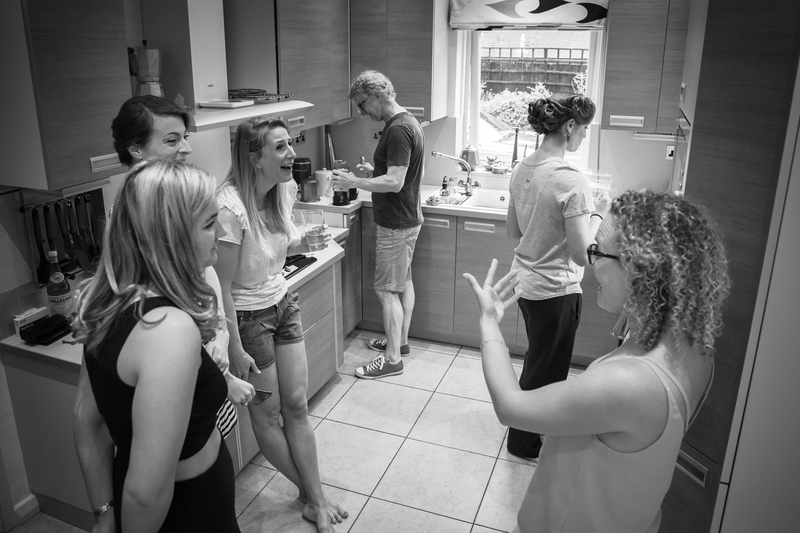 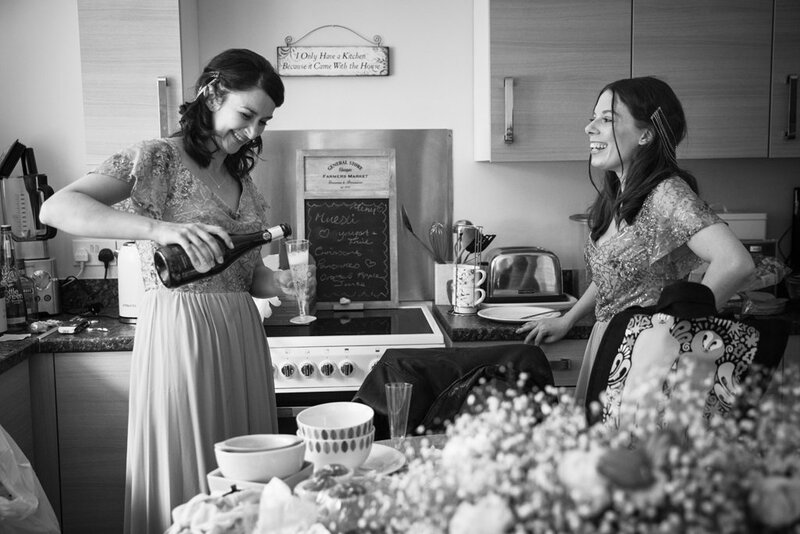 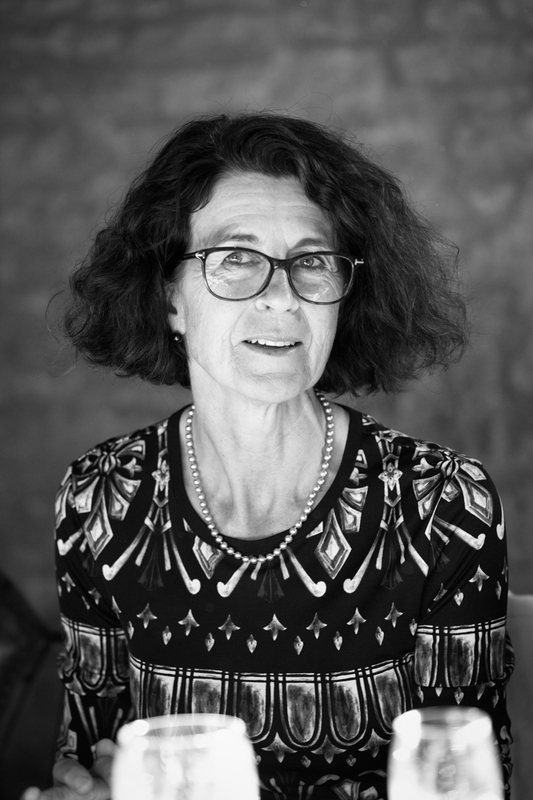 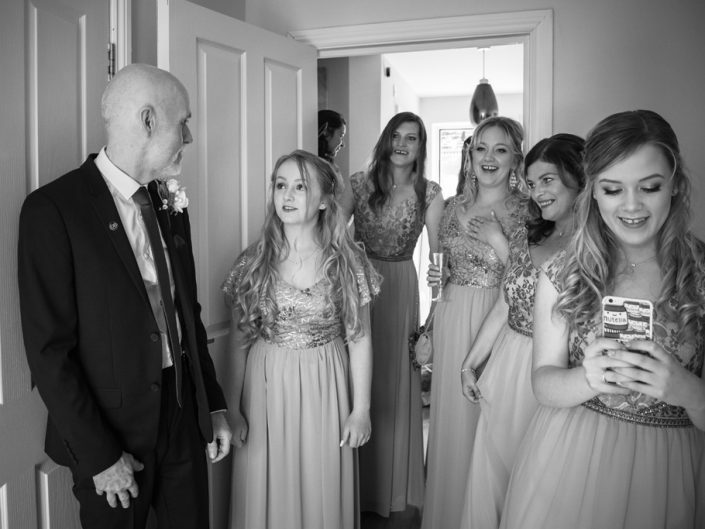 I captured some images of the girls all getting ready; it certainly was a house full with everyone bustling around making their final preparations. 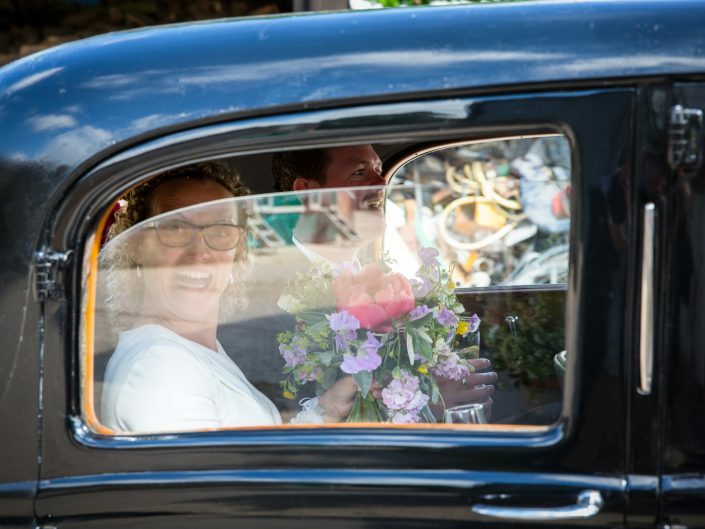 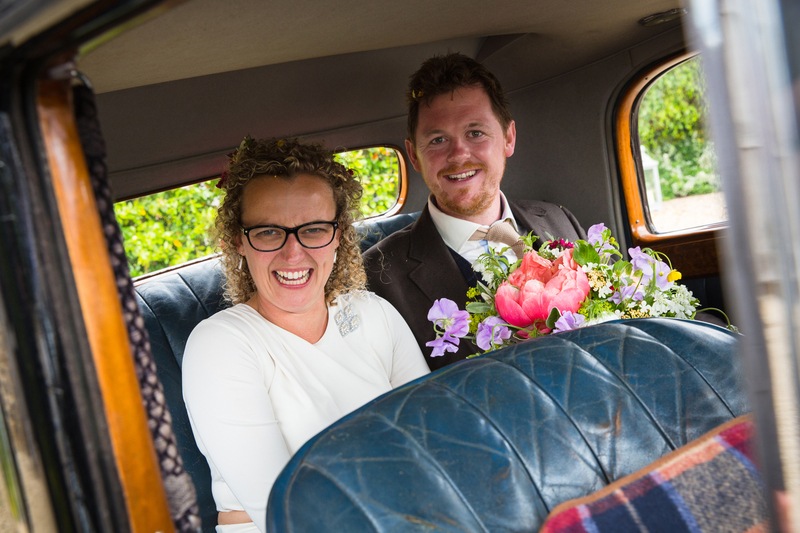 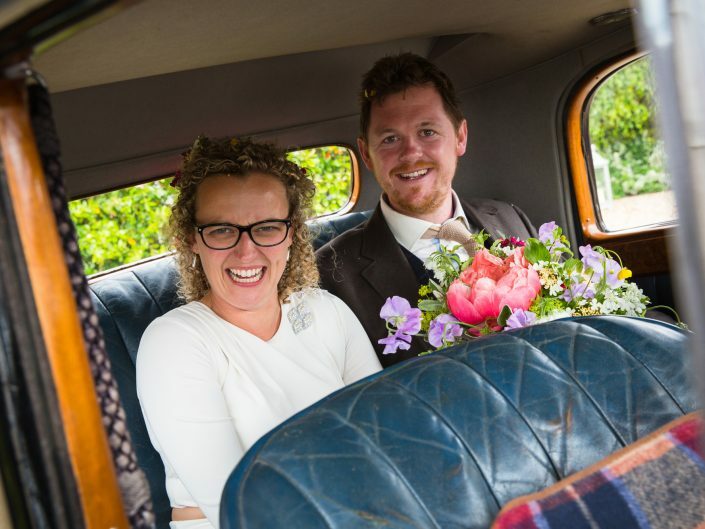 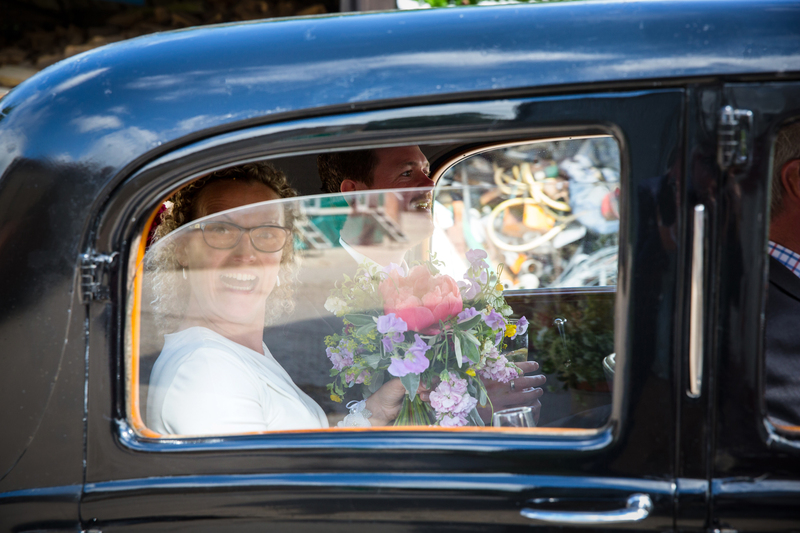 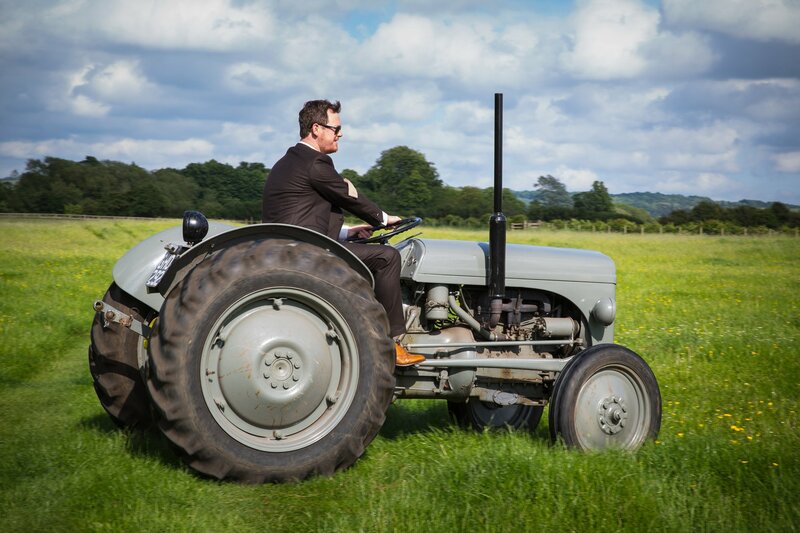 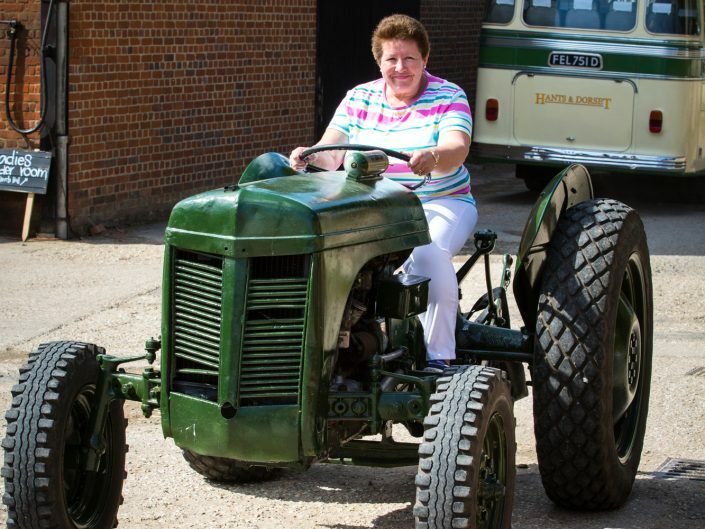 Before too long it was time for Becky to fire up the engine to get me into Oxford to the Town Hall before the bride! 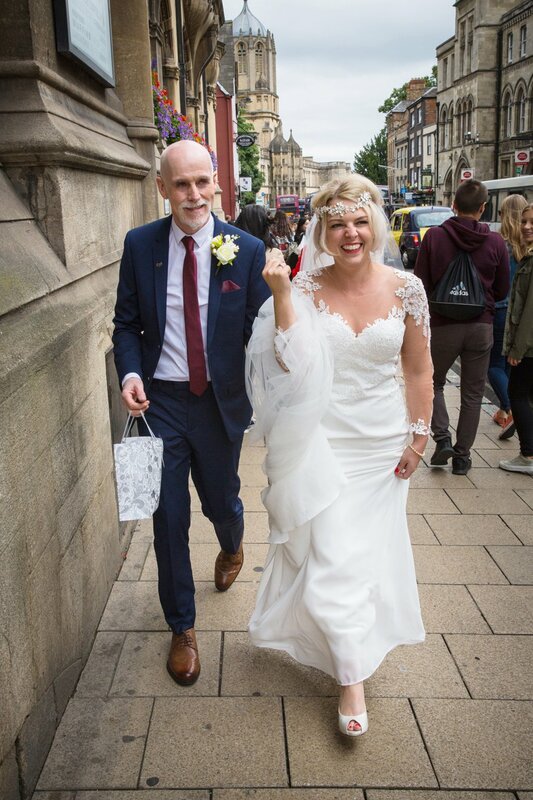 Becky dropped me outside the Town Hall & I met up with Amy who had been capturing the guests arriving & waiting for the bride’s arrival. 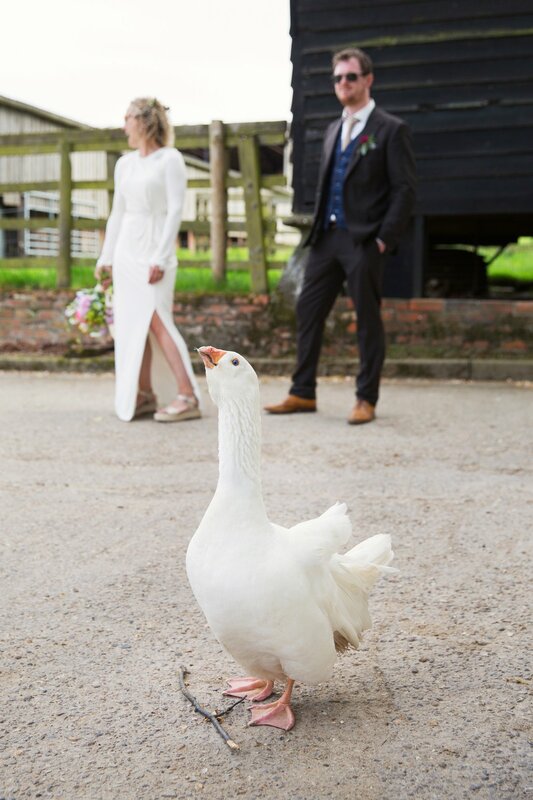 & for Chris to see his Bride! 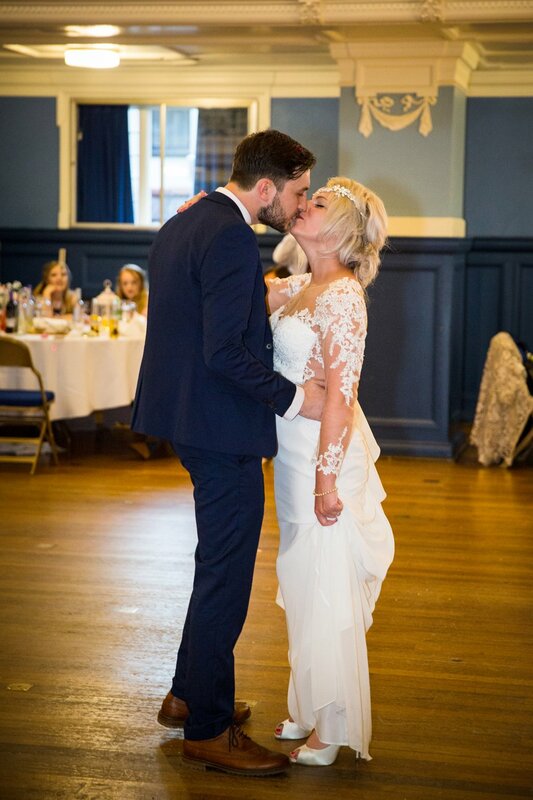 The ceremony room is a lovely light room & I am really thrilled with the wedding images that showed the love between the happy couple. 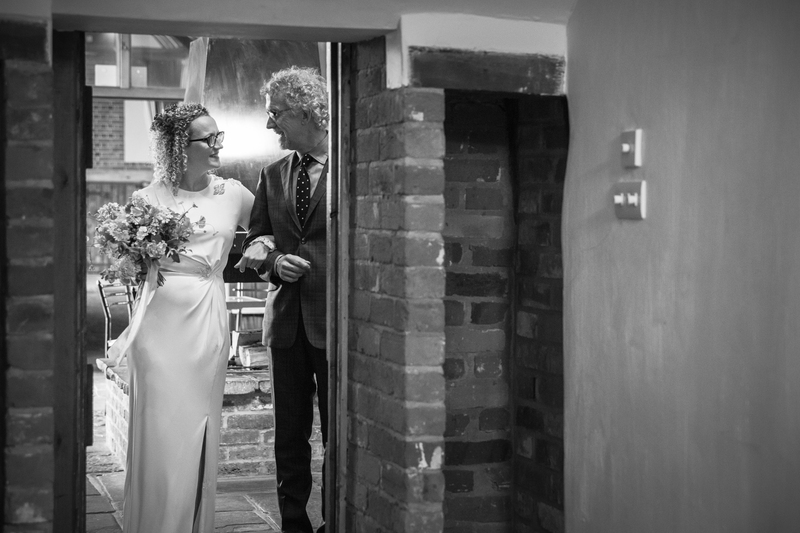 After the service the guest mingled for drinks & after greeting all their guests Amy & I took Heather & Chris away for a little while to get some shots of the two of them. 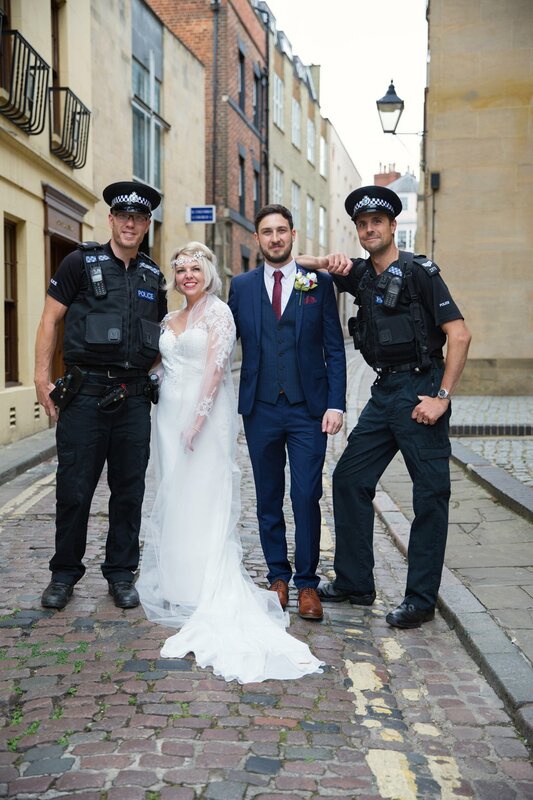 We had a great time & the streets of Oxford gave us some fantastic backdrops & a few additional ‘characters’. 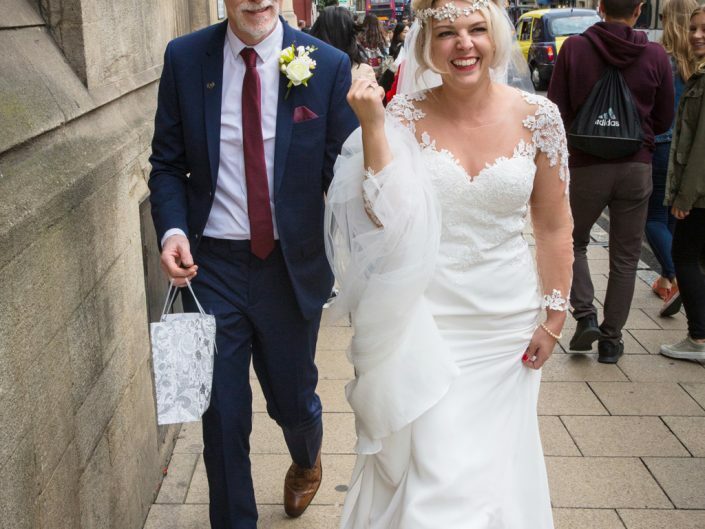 Amy & I were both so happy with the images we captured but it was soon time to get the happy couple back to their guests. 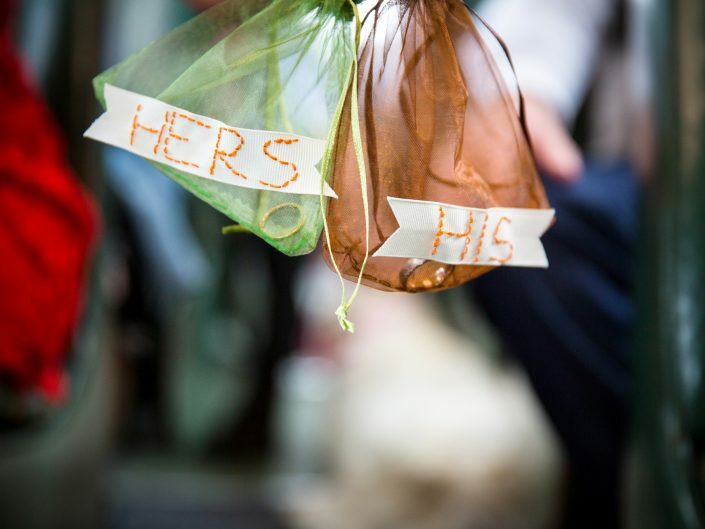 awaited the happy couple. 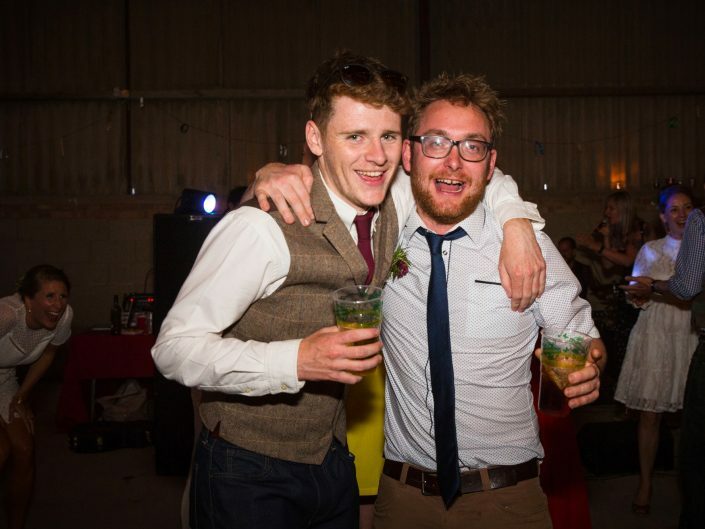 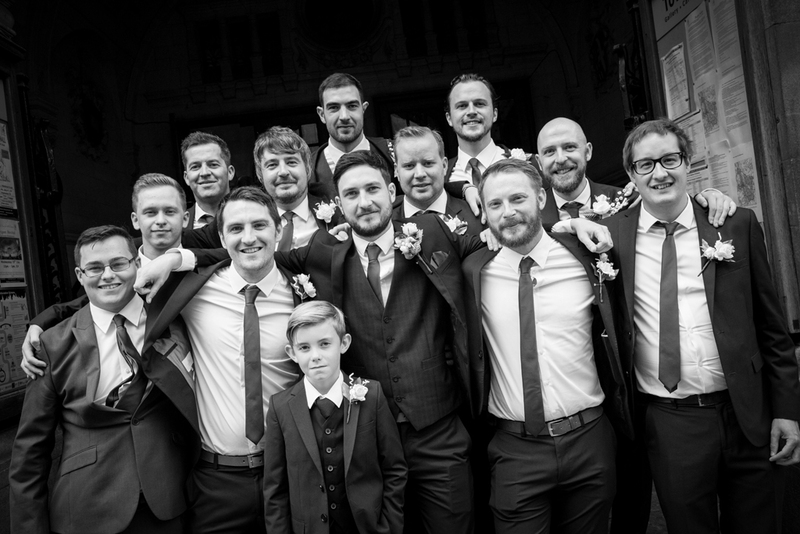 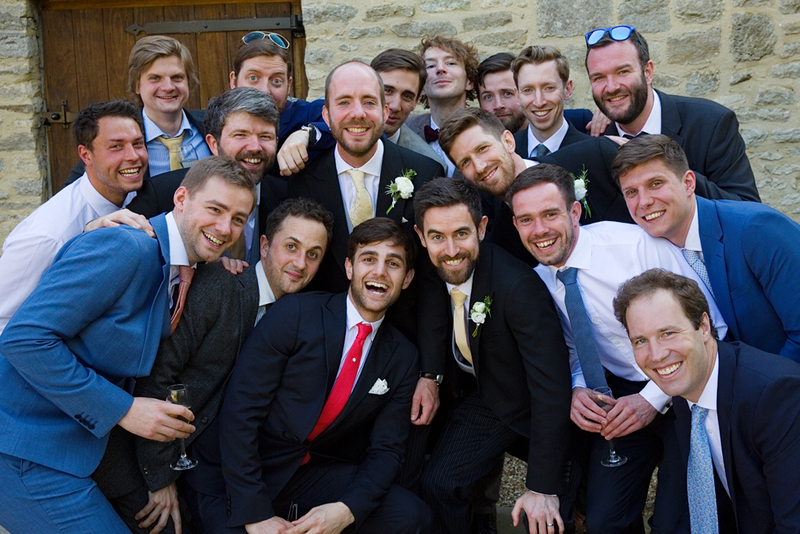 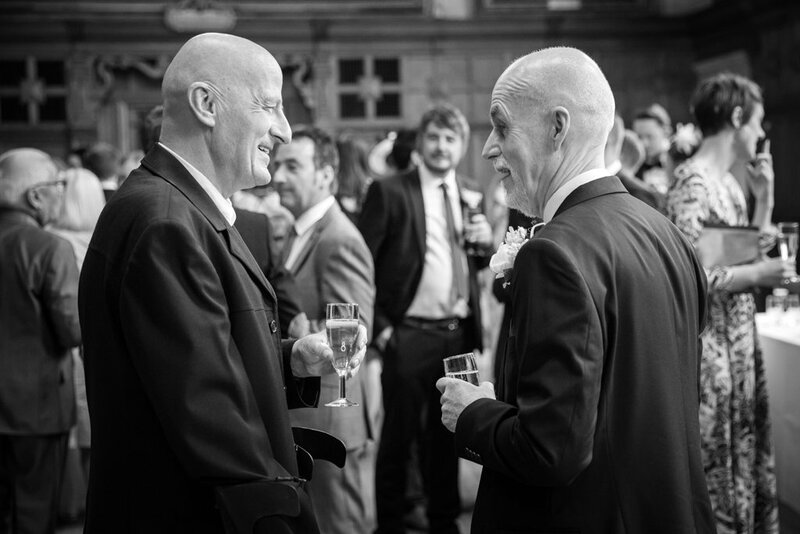 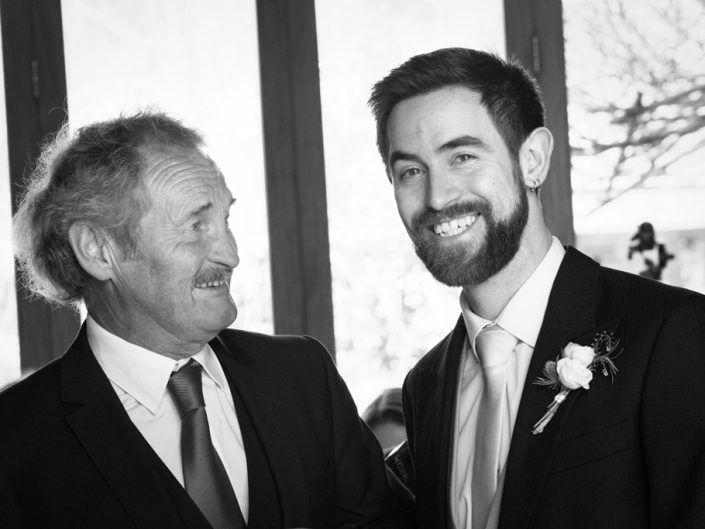 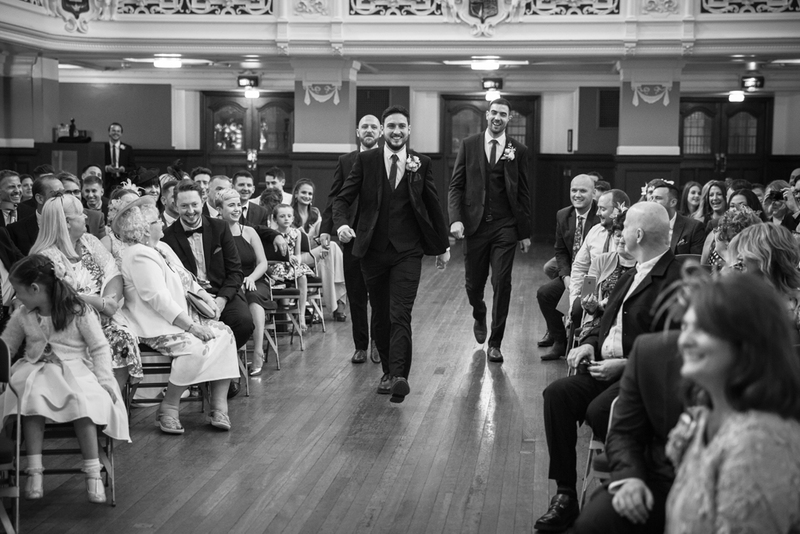 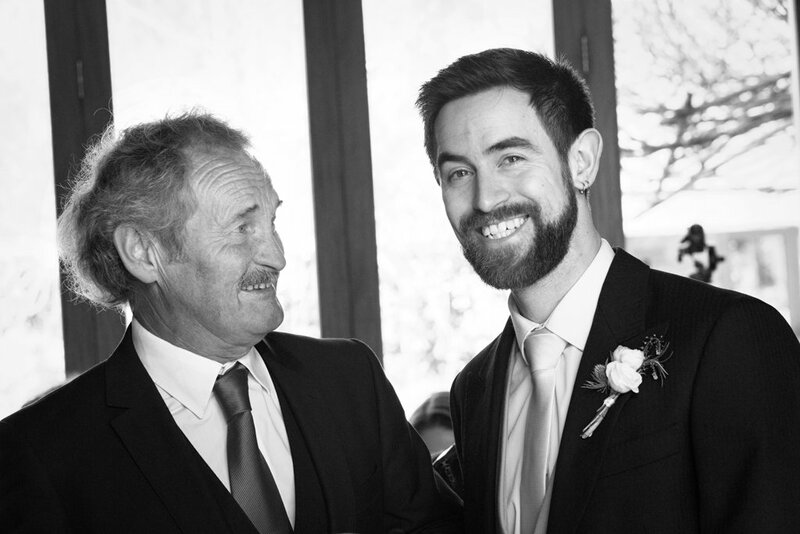 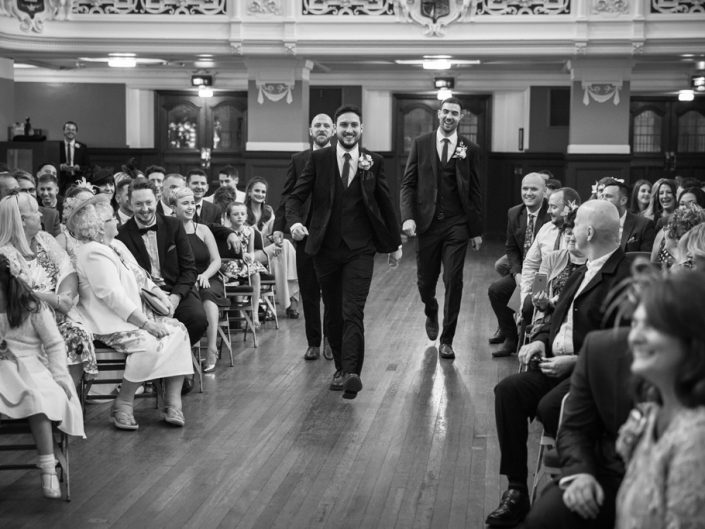 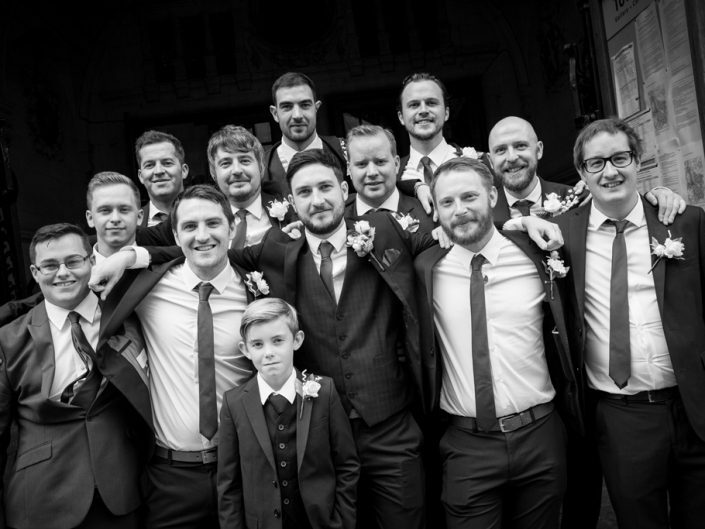 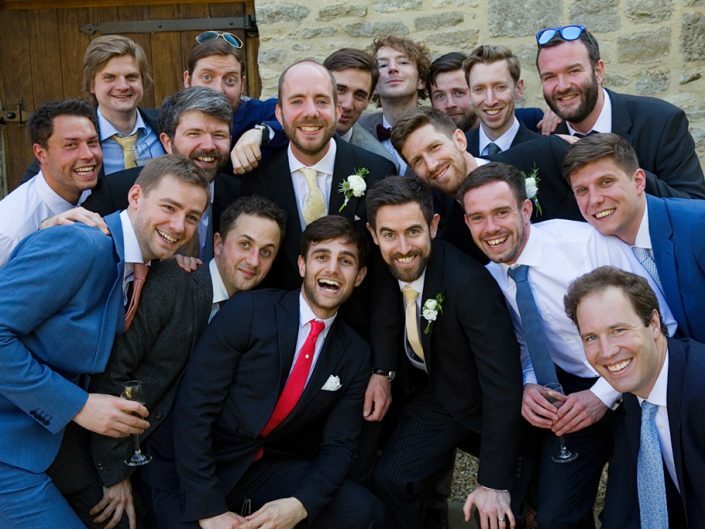 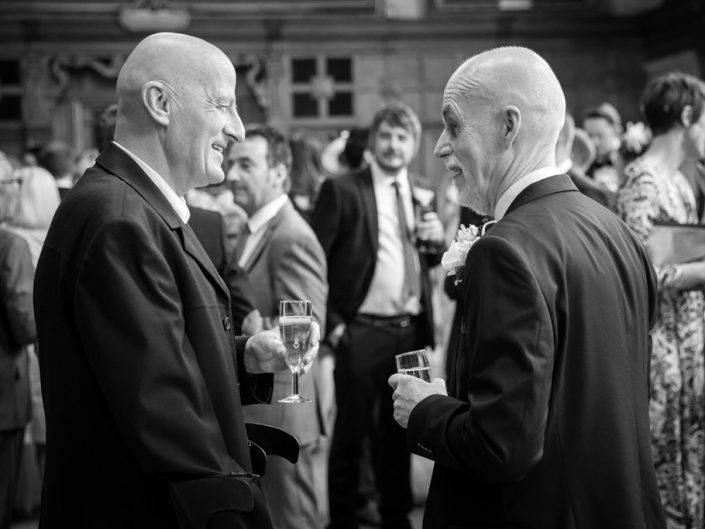 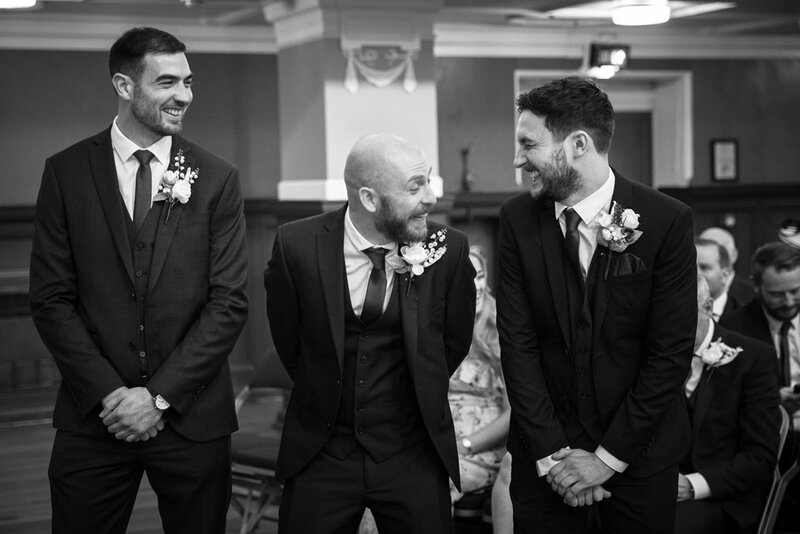 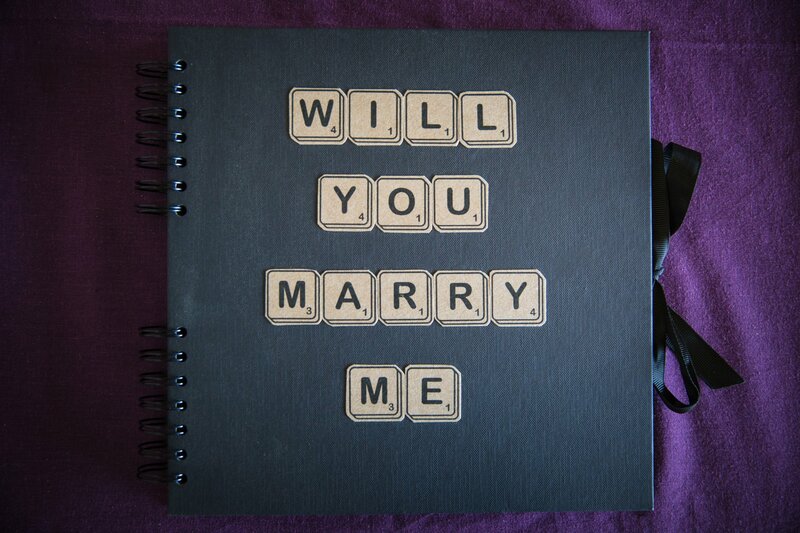 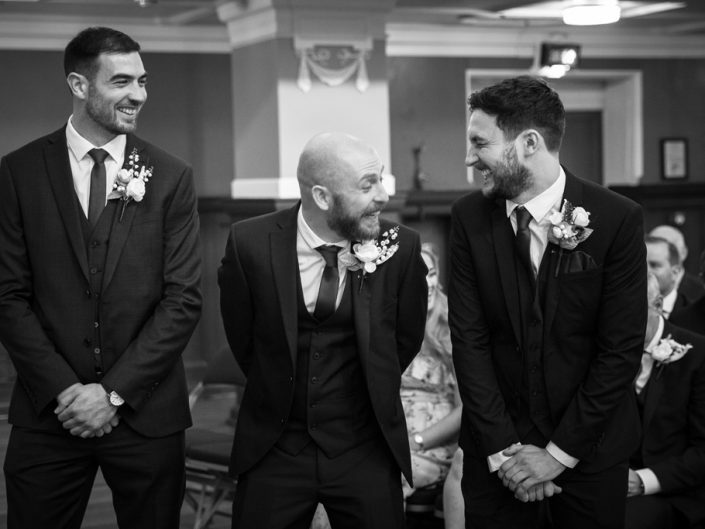 Chris’ Best Man announced them in & they entered to thunderous applause. 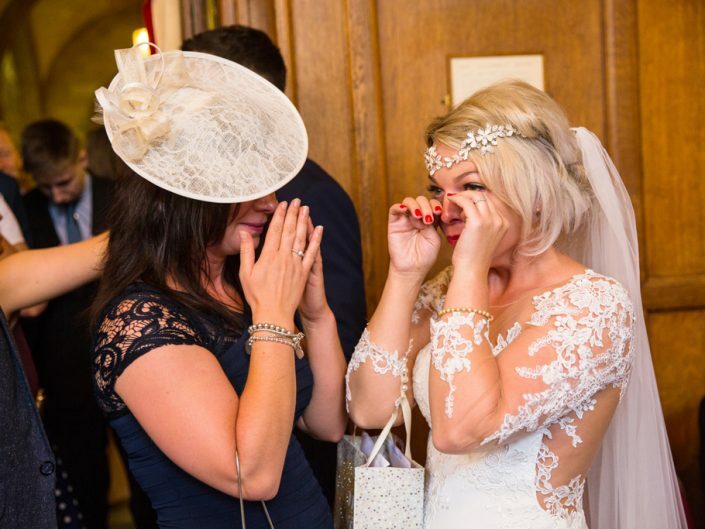 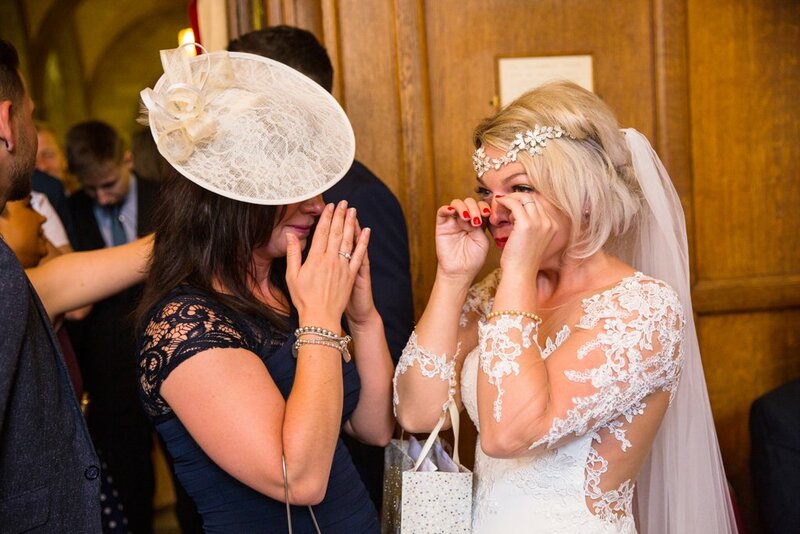 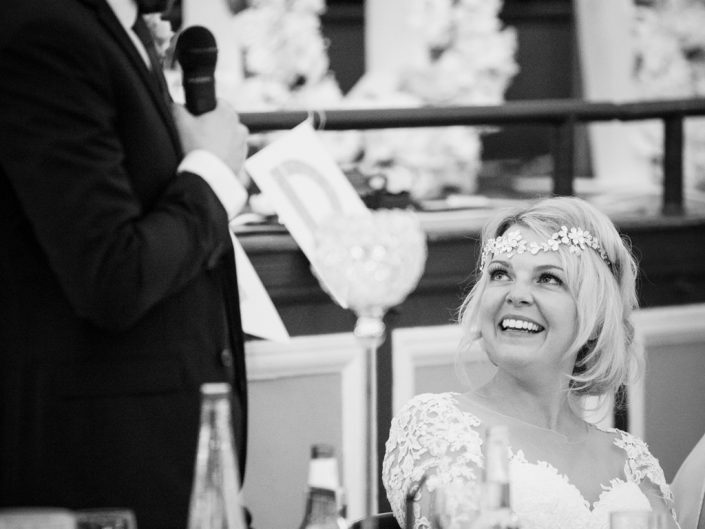 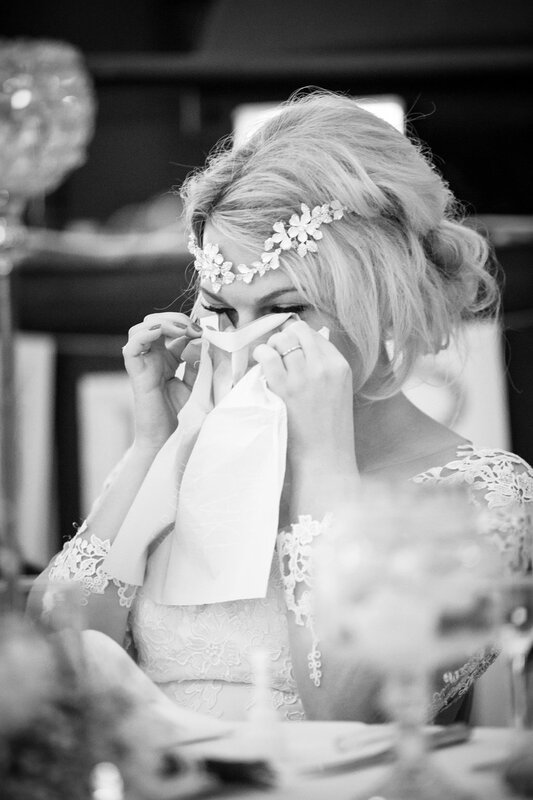 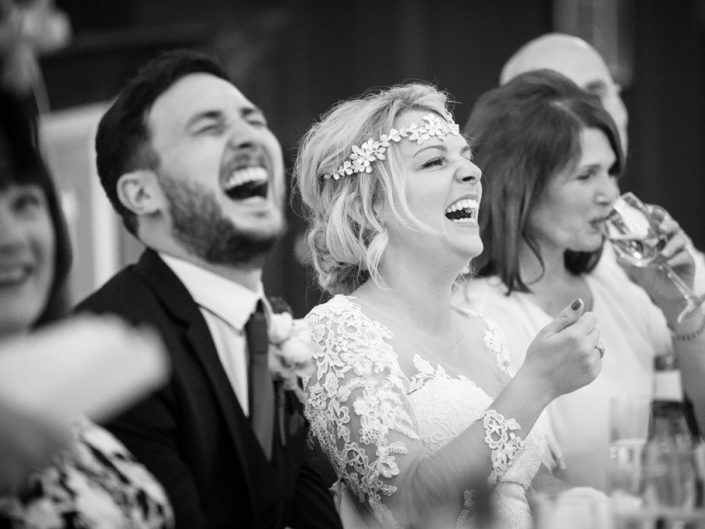 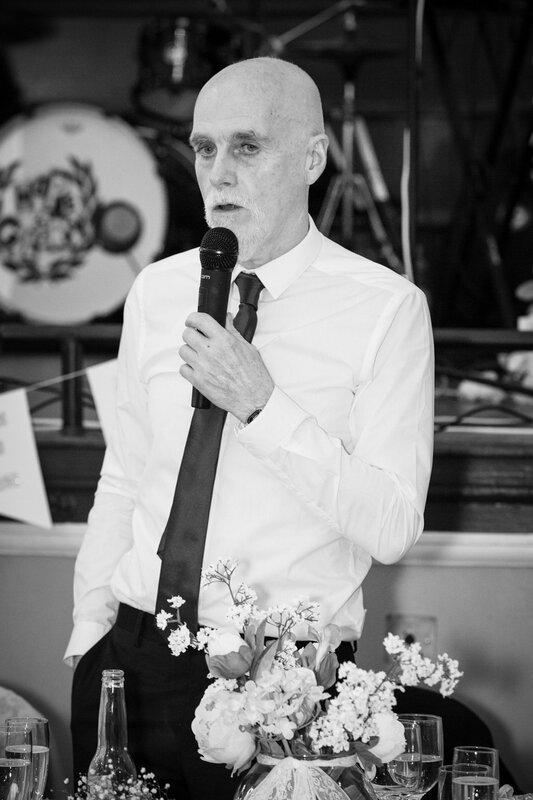 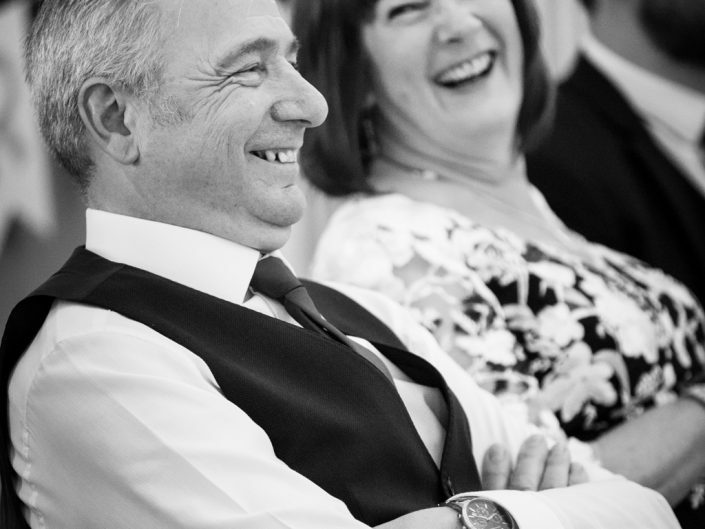 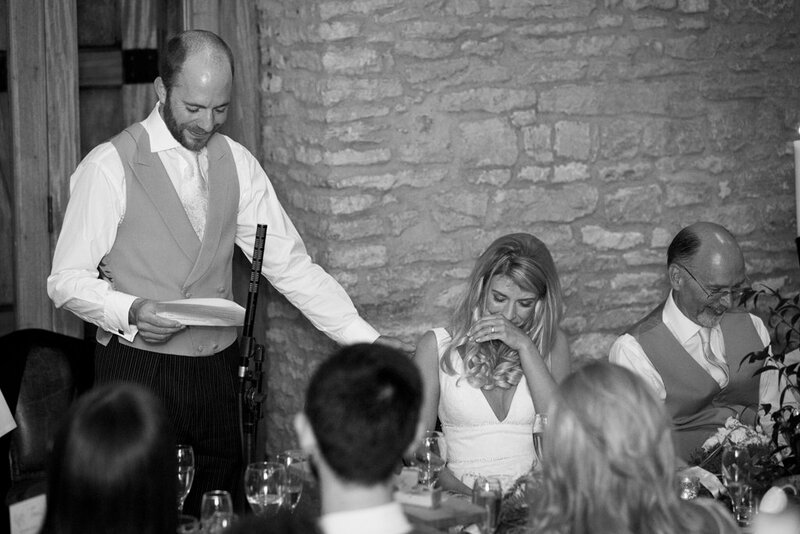 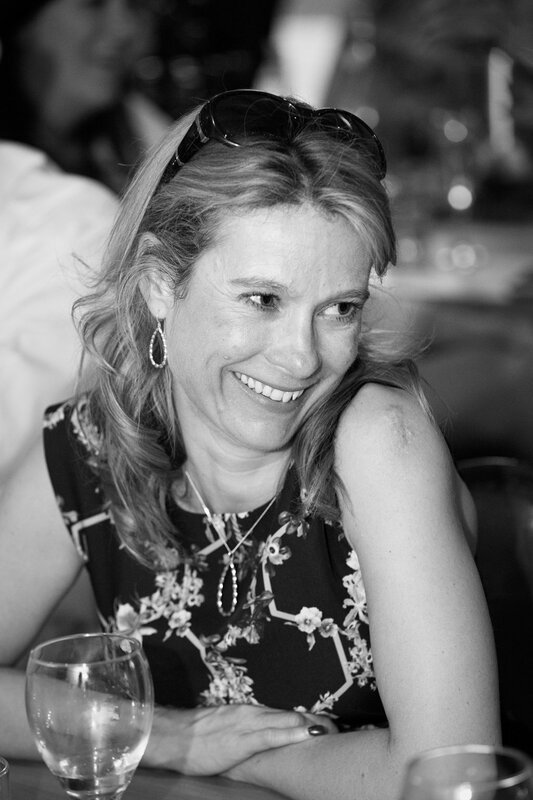 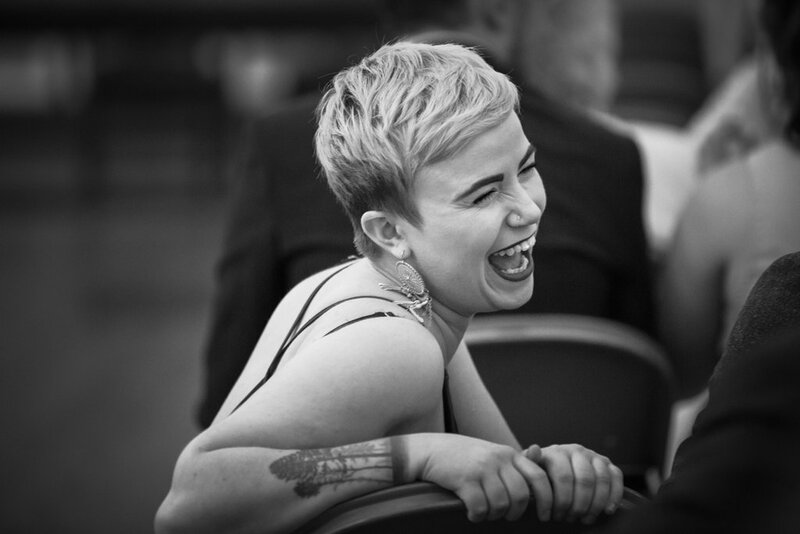 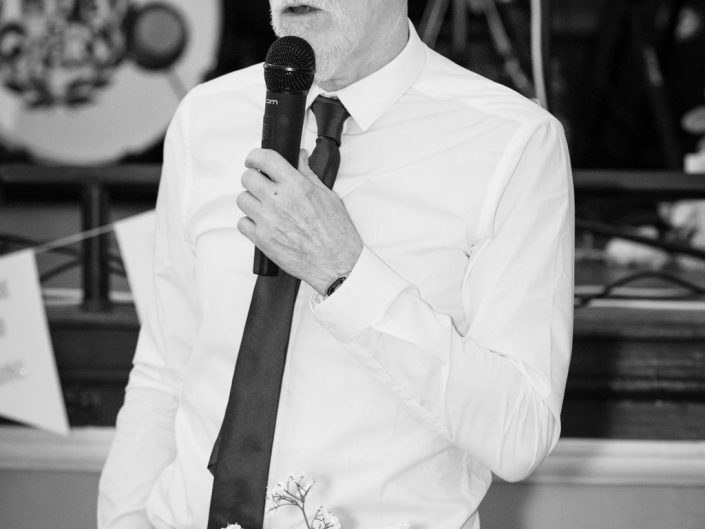 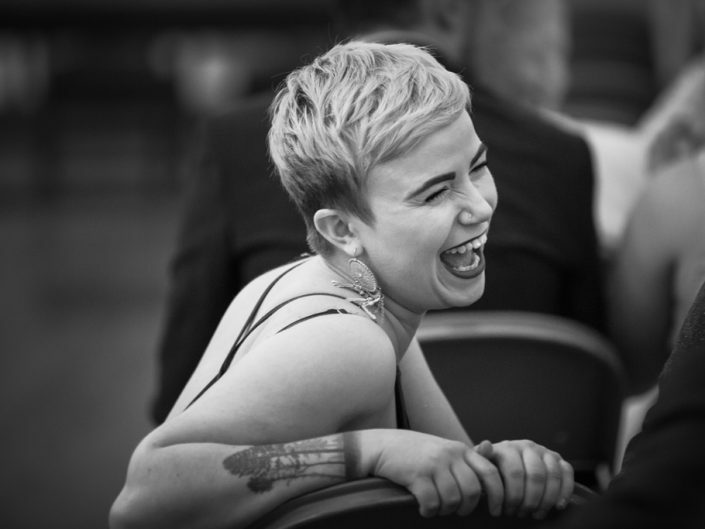 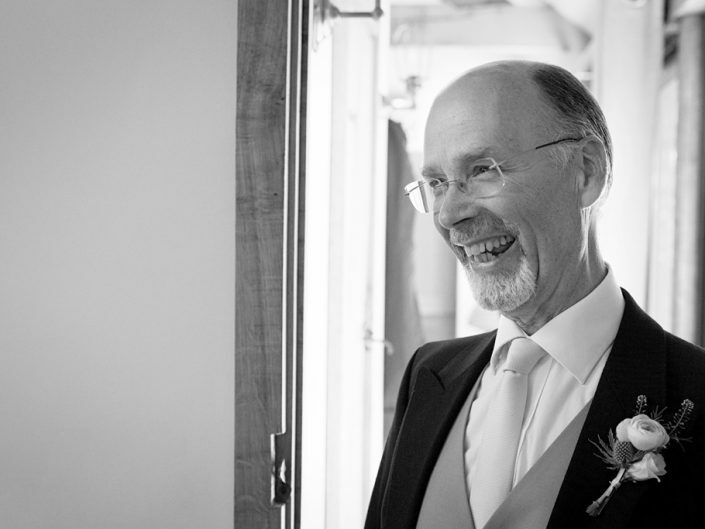 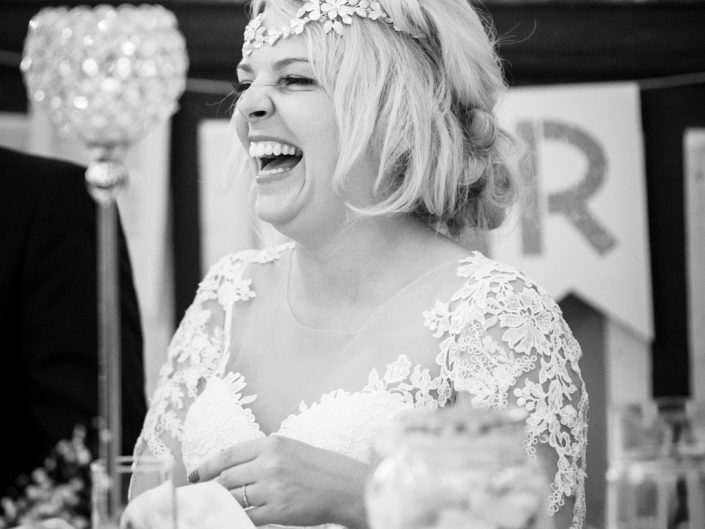 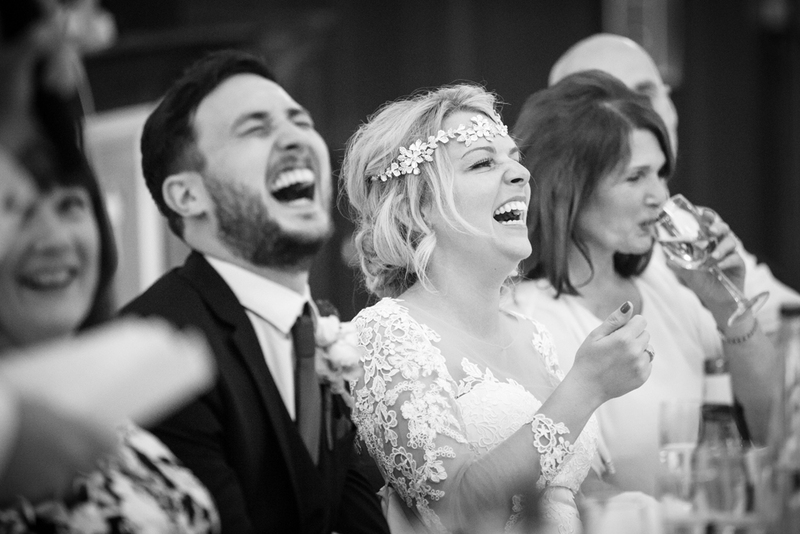 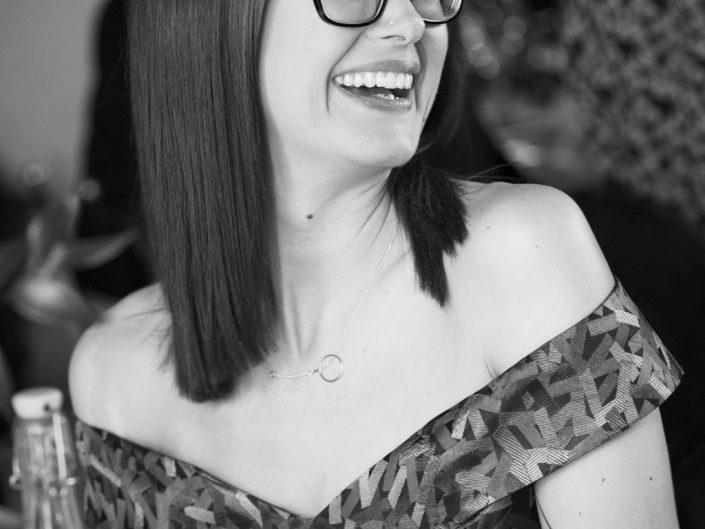 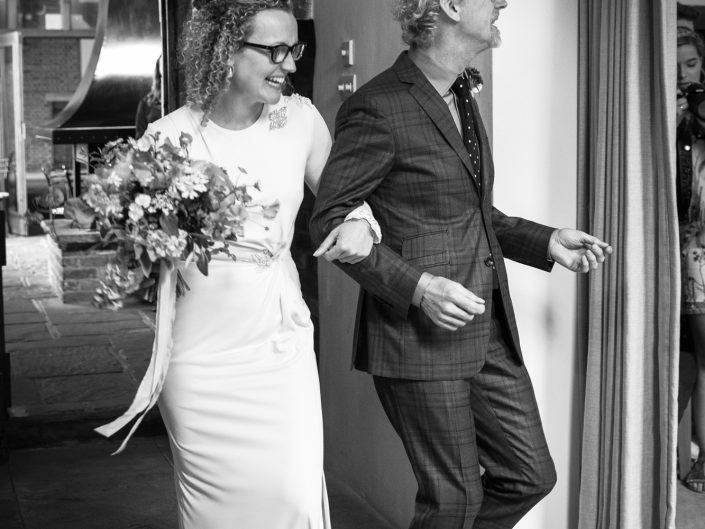 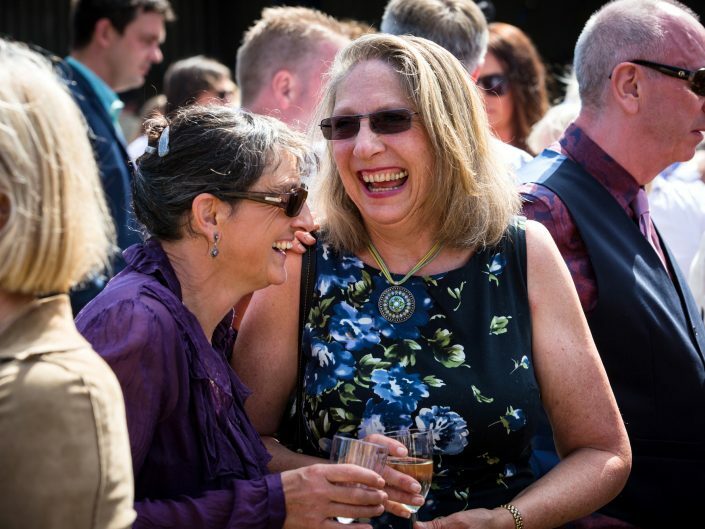 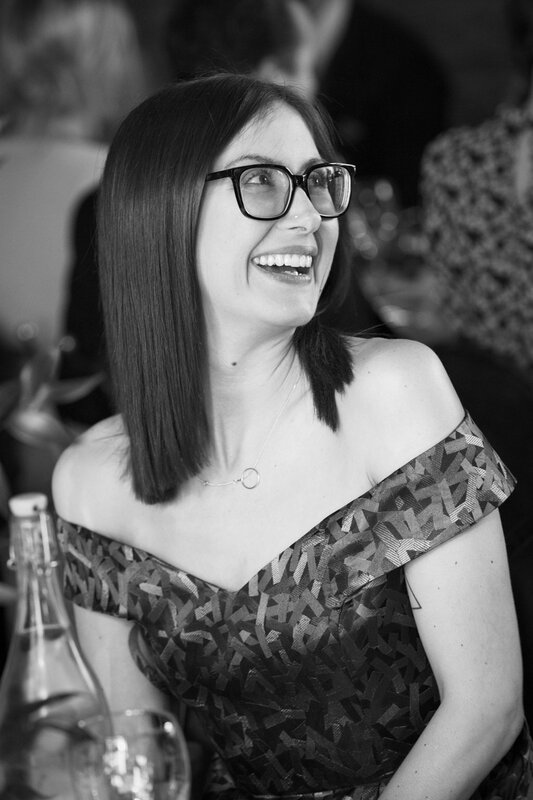 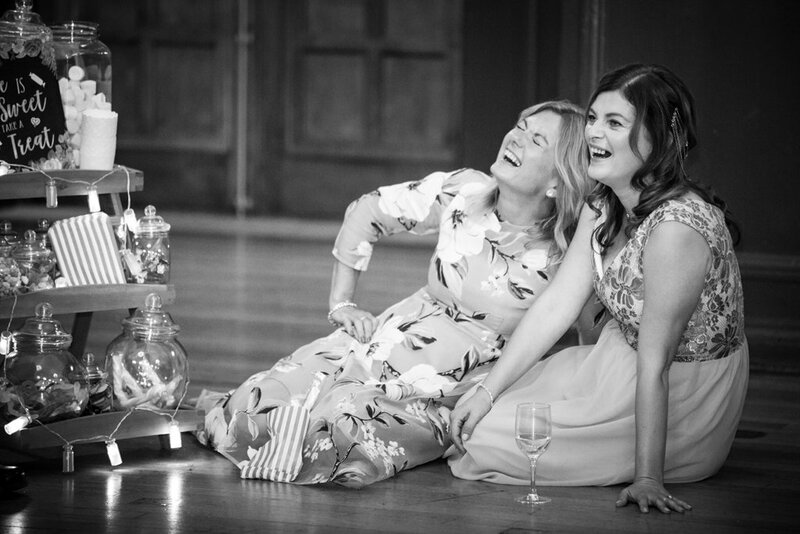 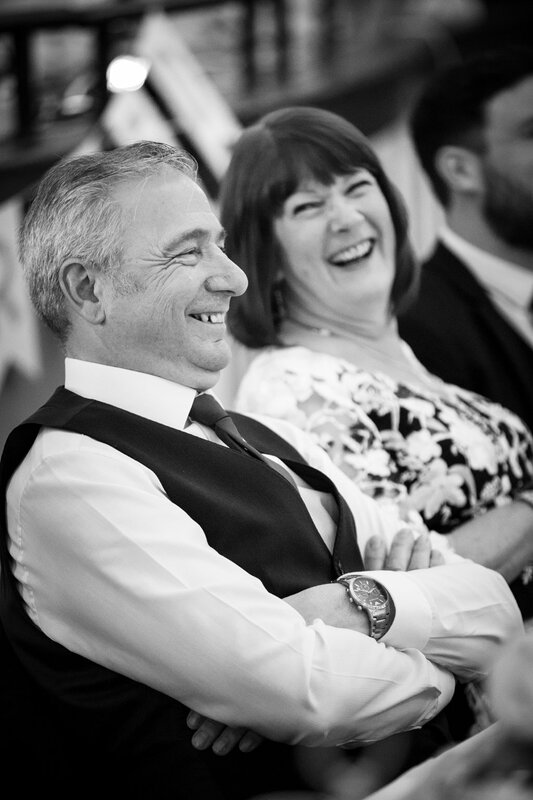 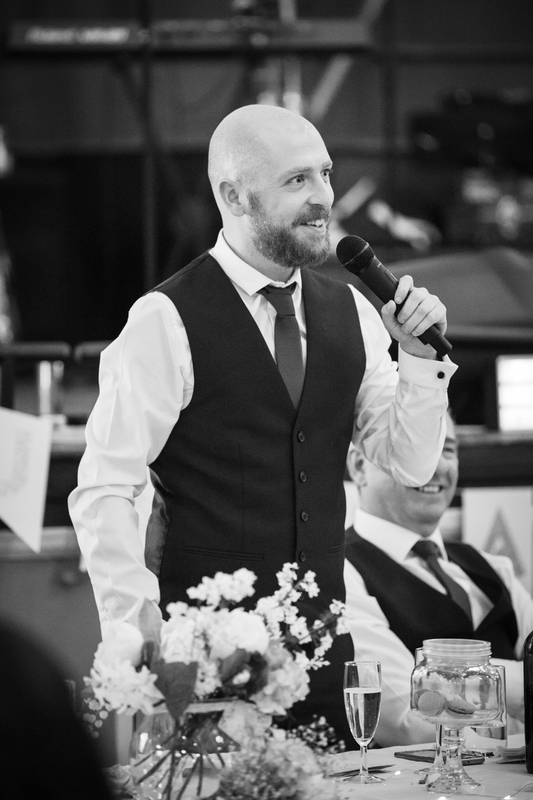 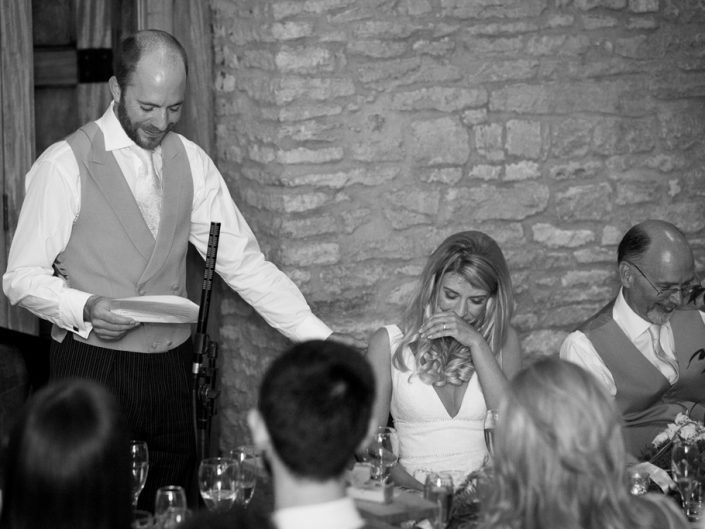 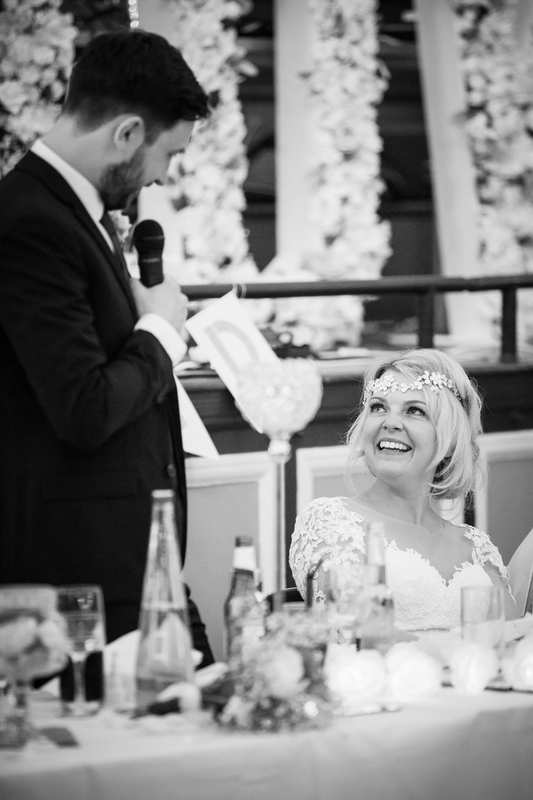 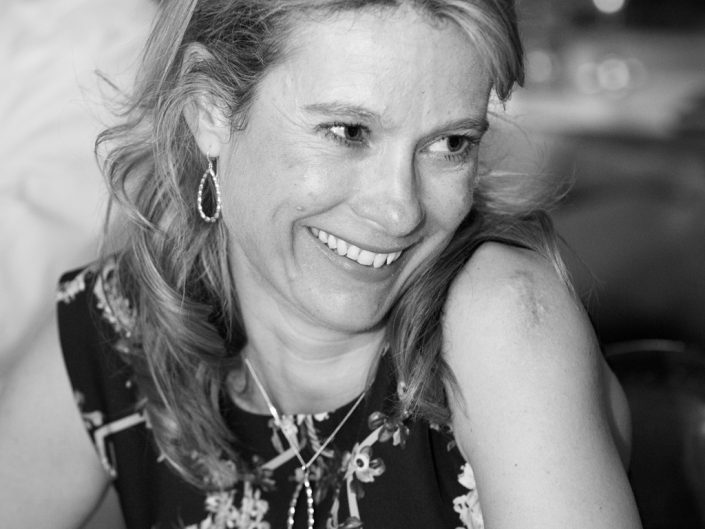 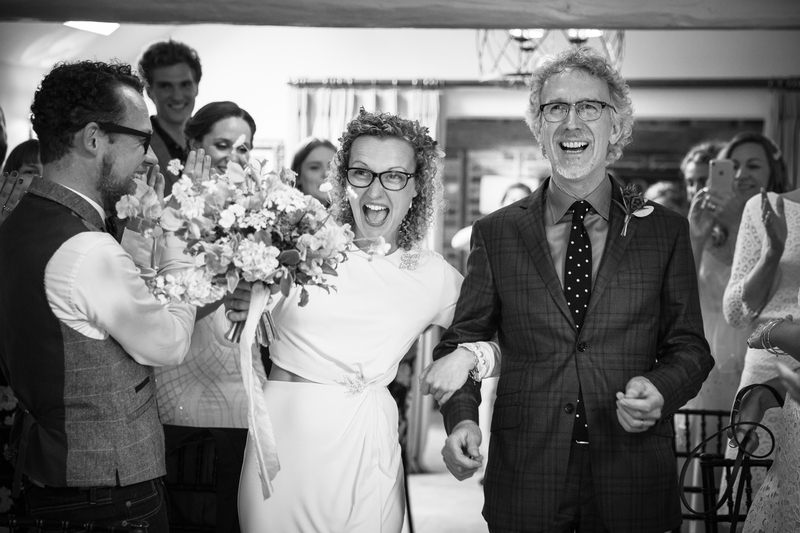 Amy & I shot the speeches, always a fun part of the day & we love taking the images of the speakers &, of course, the fabulous reactions whether they be tears or laughter. 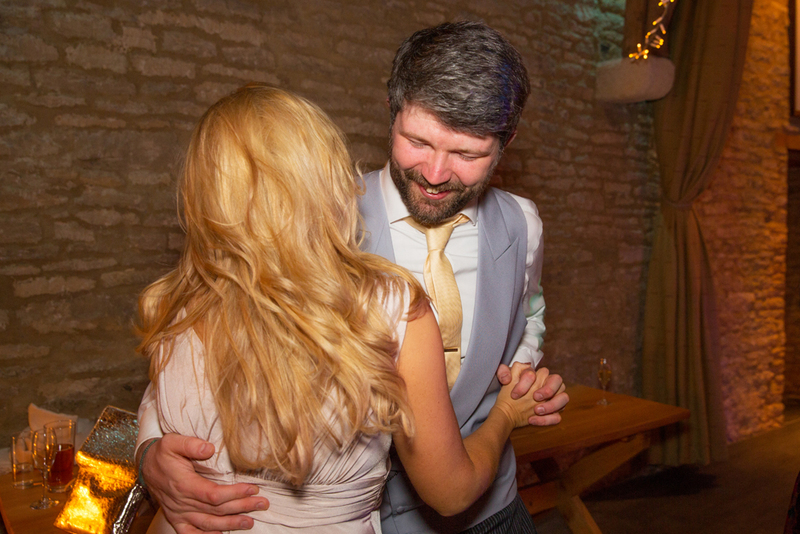 After a delicious meal & the speeches it was time for the first dance & then our driver was waiting for us outside to whisk us away. 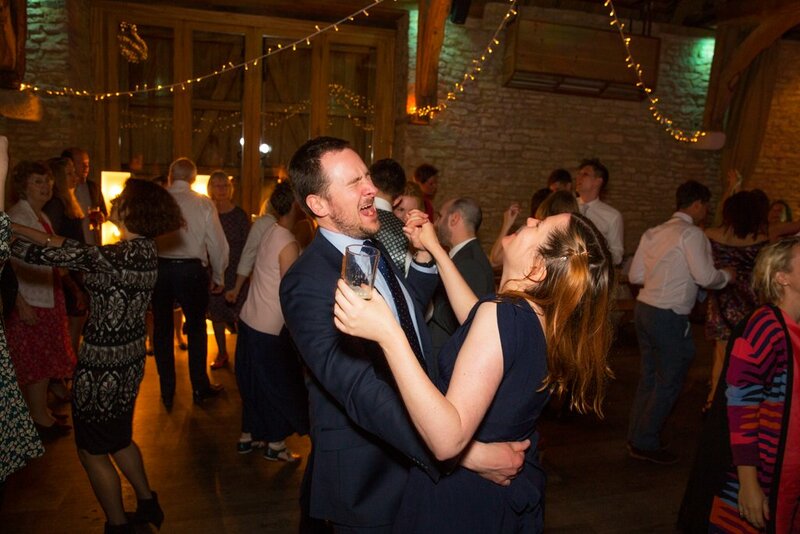 As always, we left them dancing the night away. 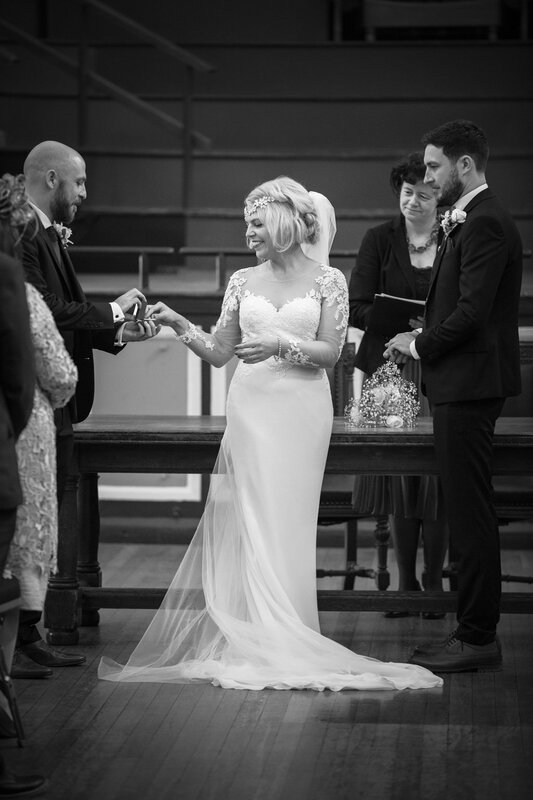 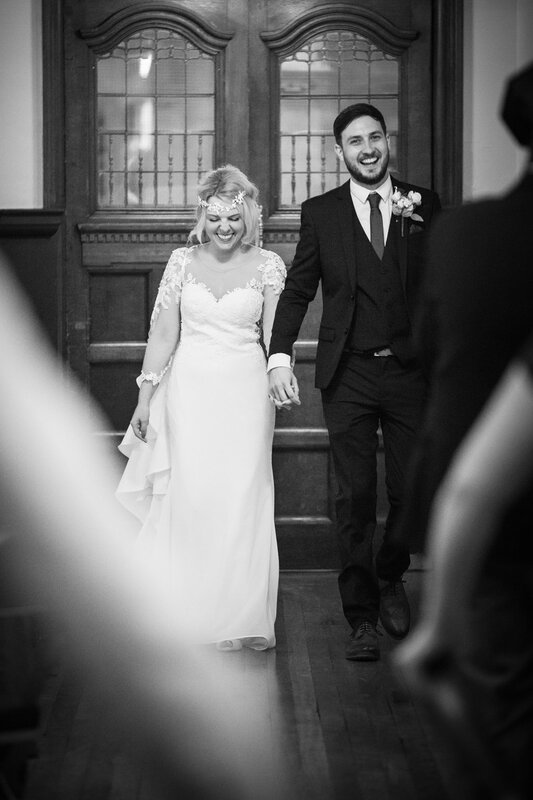 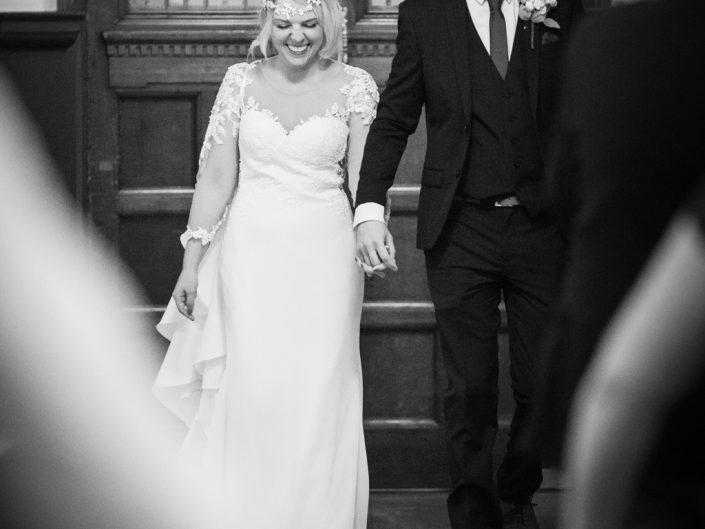 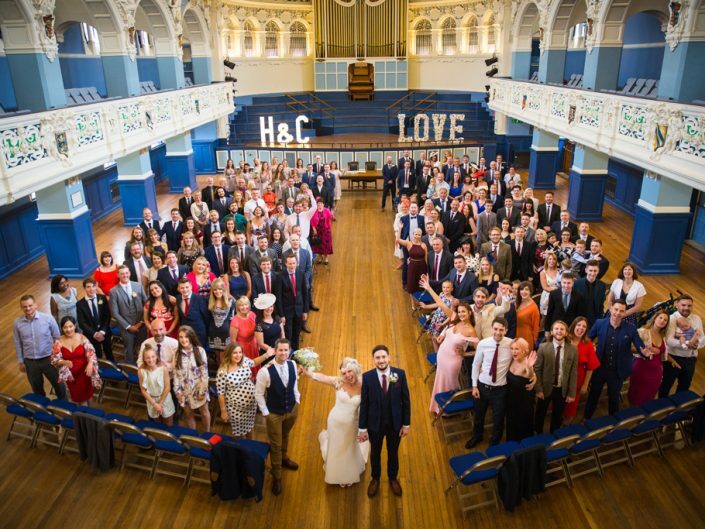 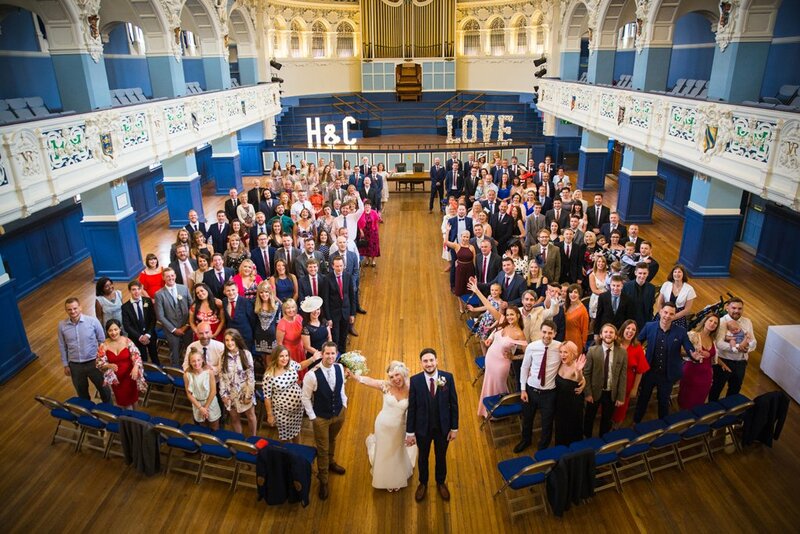 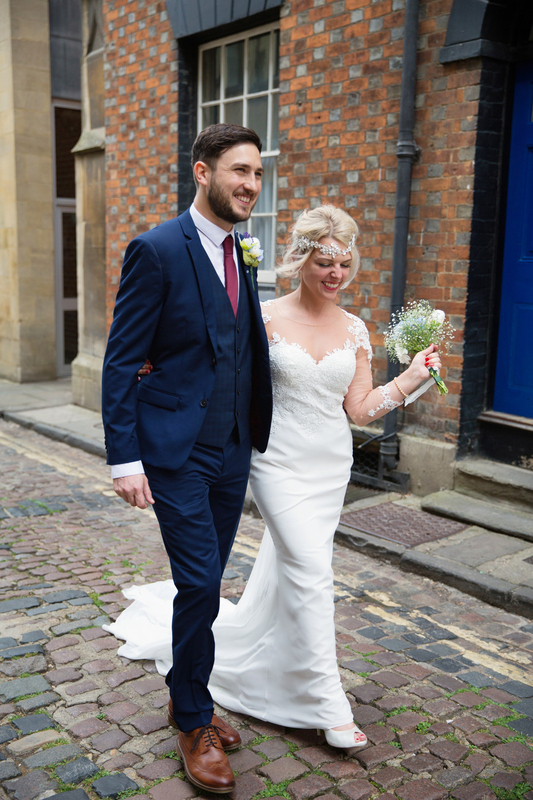 Thank you for asking to photograph your big day Heather & Chris, we hope you enjoy your sneak peek. 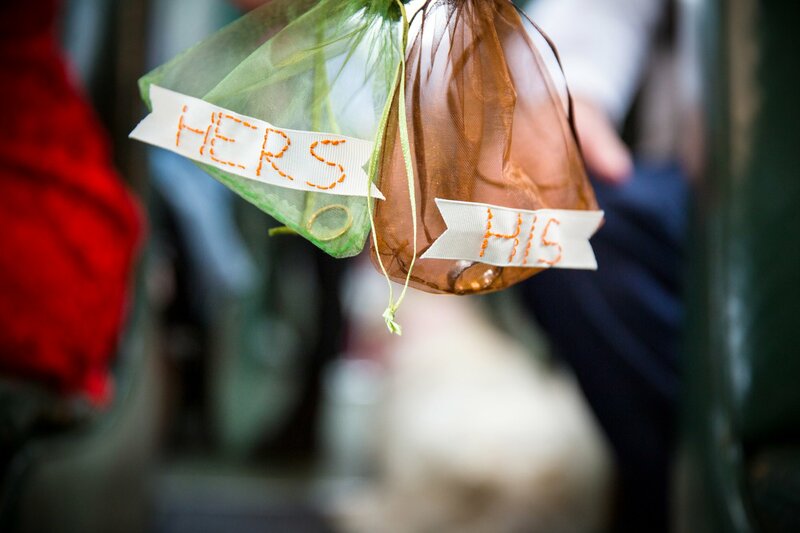 Wishing you both every happiness! 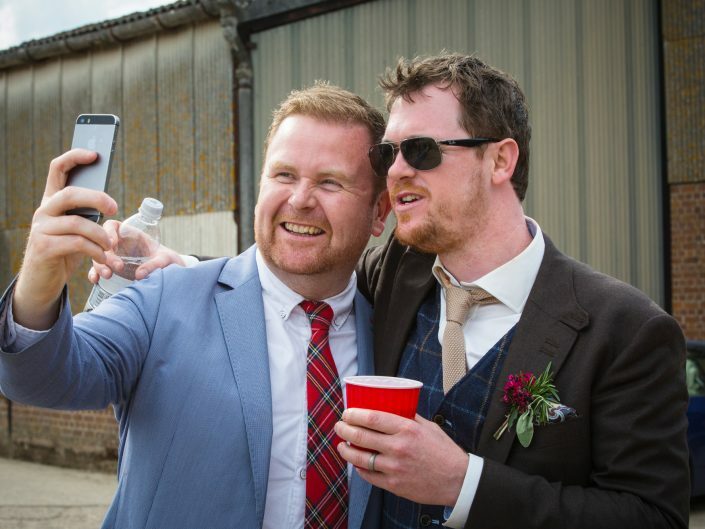 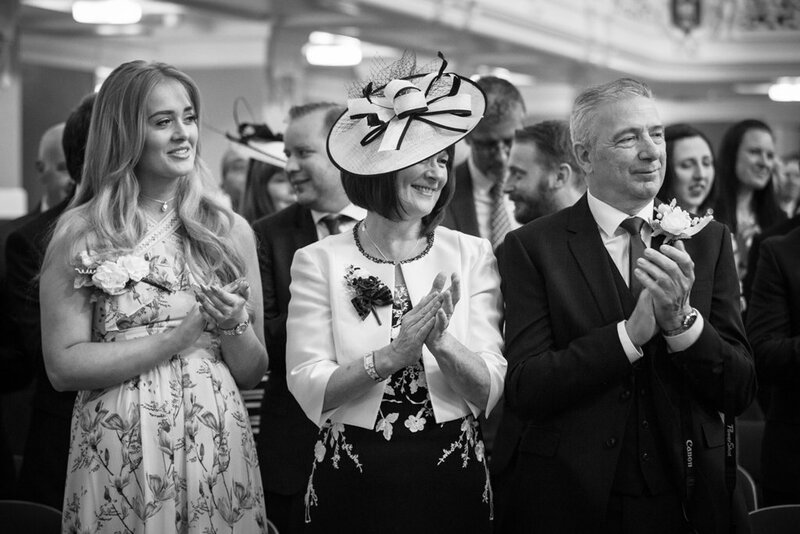 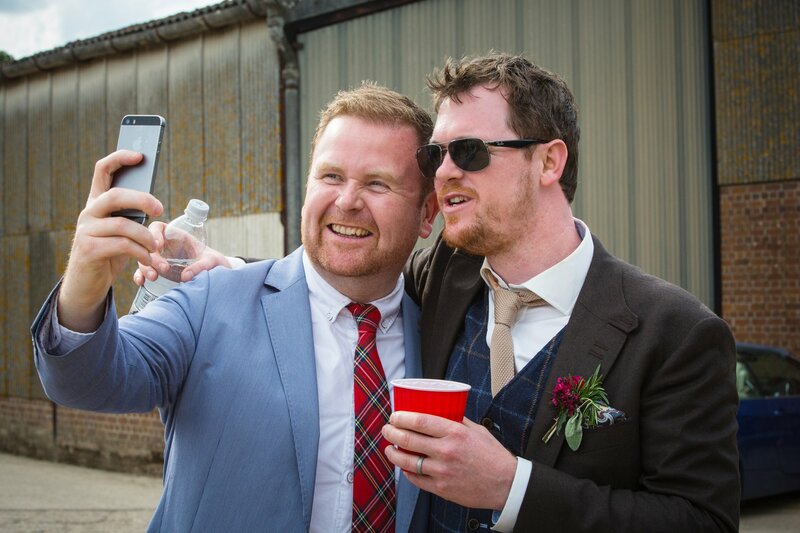 It’s always lovely to be invited to photograph a friends wedding so it was with great excitement that we headed off to photograph Andrew & Eilidh’s wedding a few weeks ago. 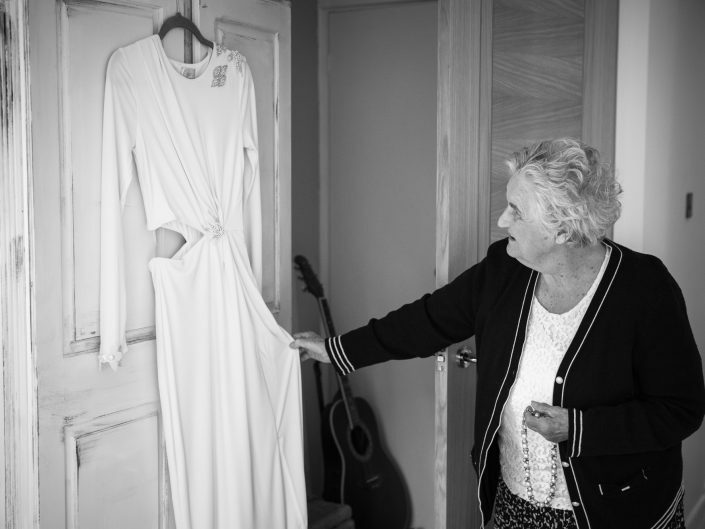 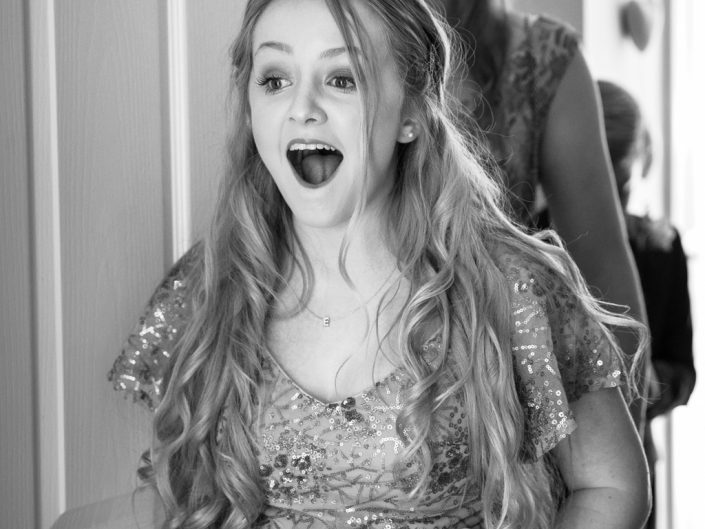 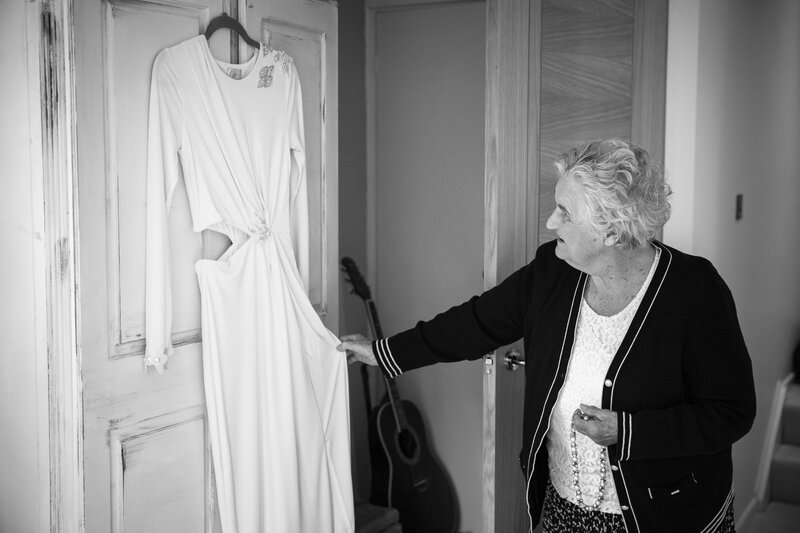 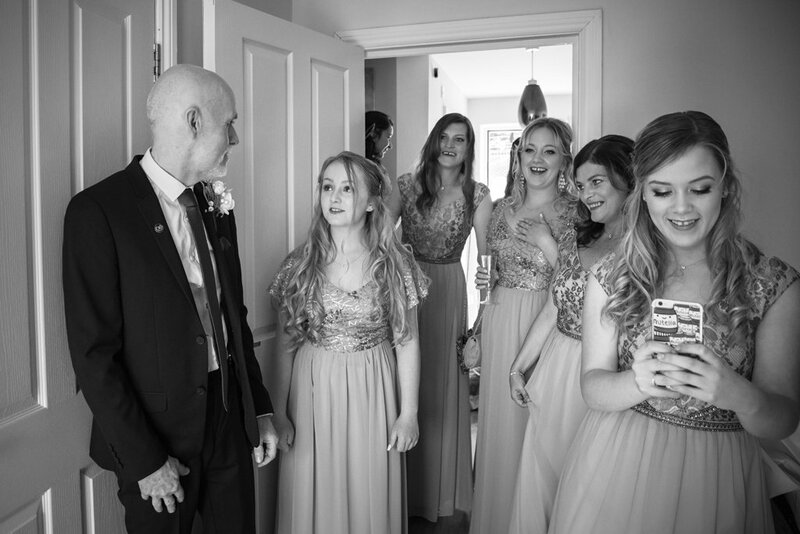 I headed straight to Eilidh’s Mum & Dad’s house where she was getting ready with her family & bridesmaids. 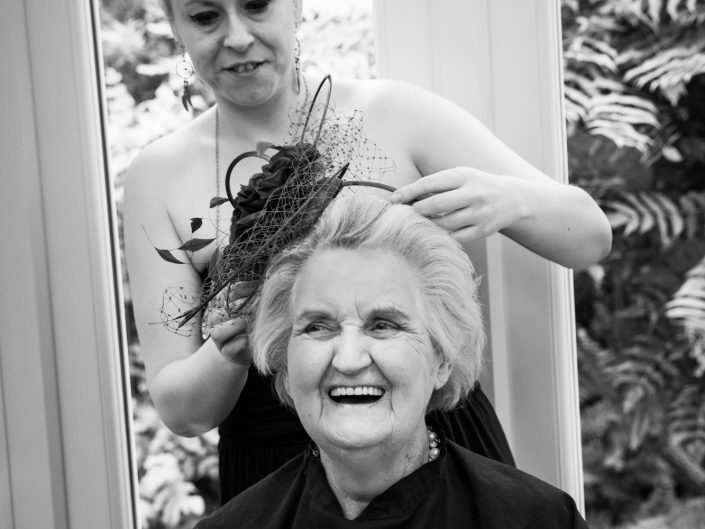 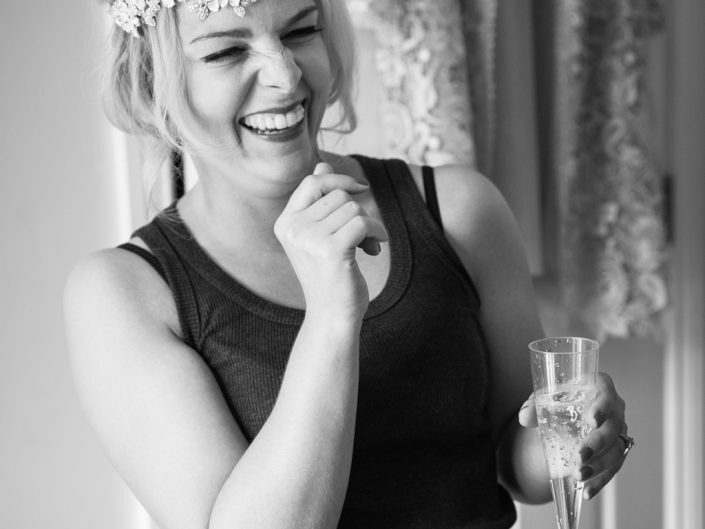 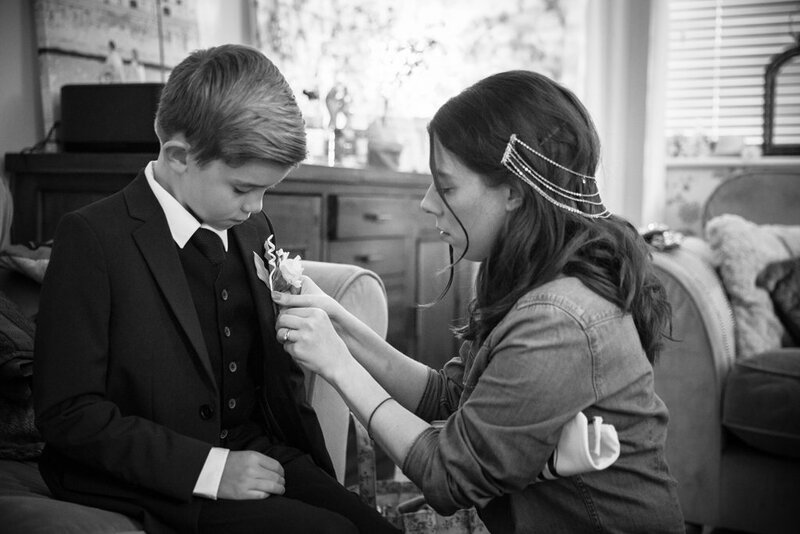 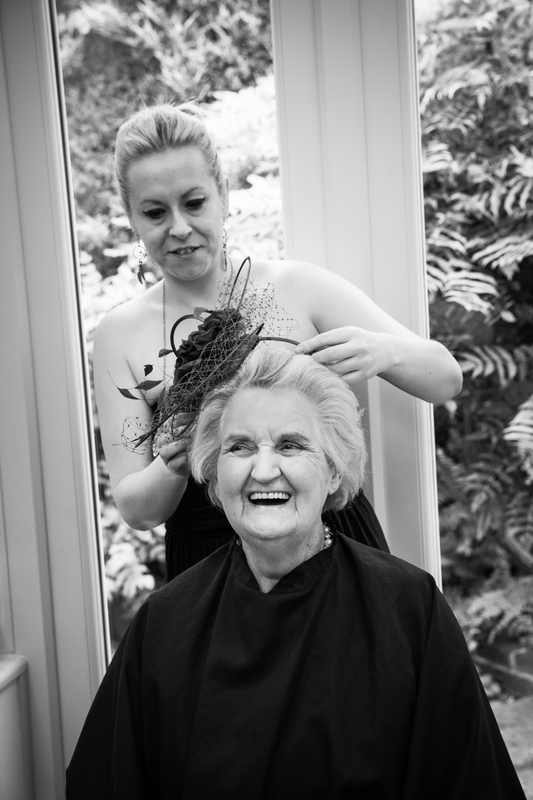 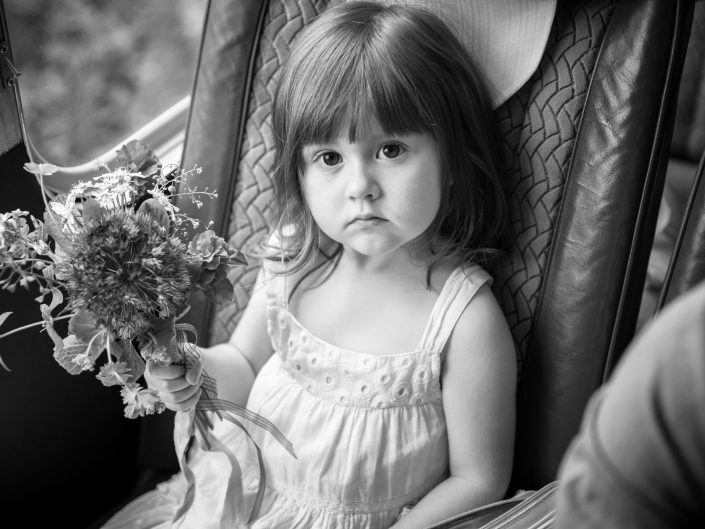 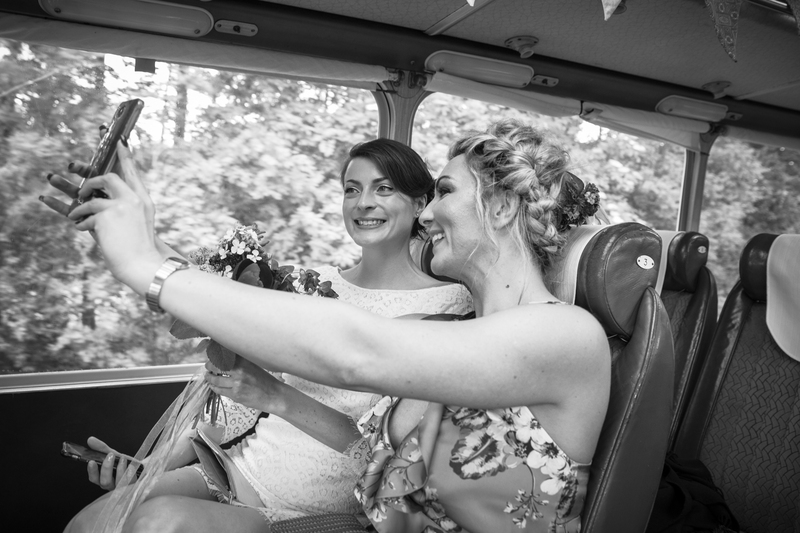 When I arrived Eilidh was making finishing touches to the bridesmaids bouquets. Andrew & Eilidh have a beautiful garden & she had grown the flowers herself. 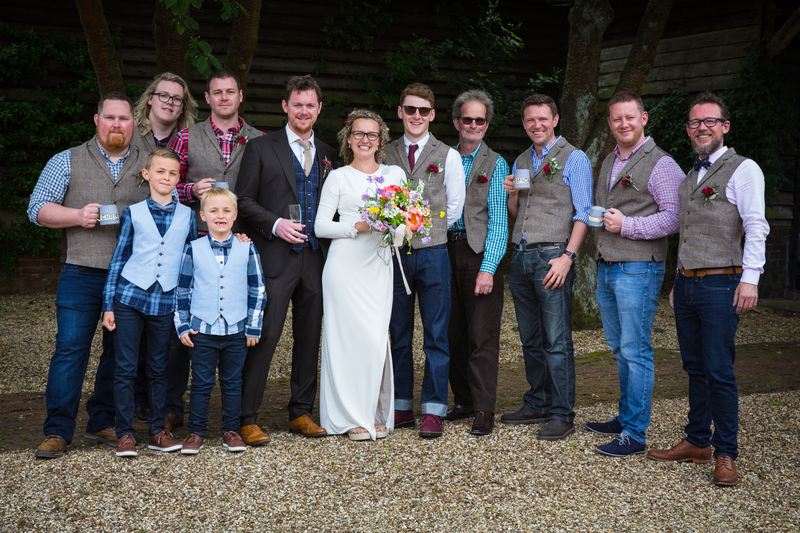 They were a wonderful mix of colours arranged in a wonderful relaxed style that reflected the day itself. 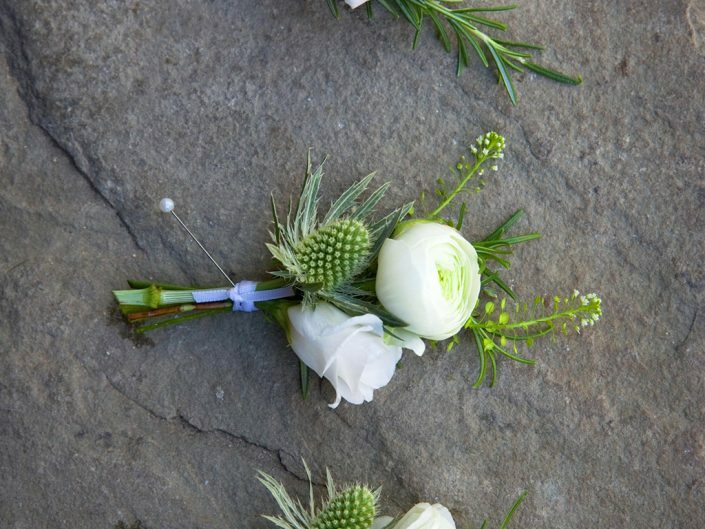 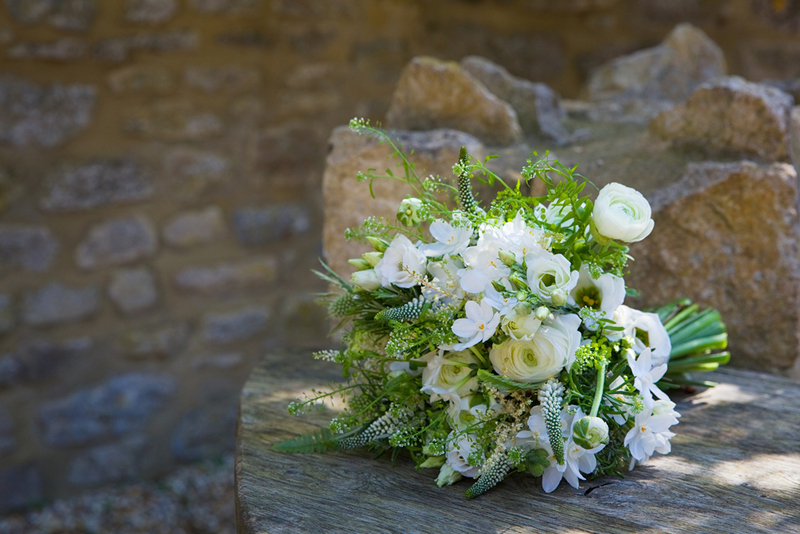 Eilidh’s bouquet & the buttonholes were done by their friends, the wonderfully talented Green & Gorgeous. 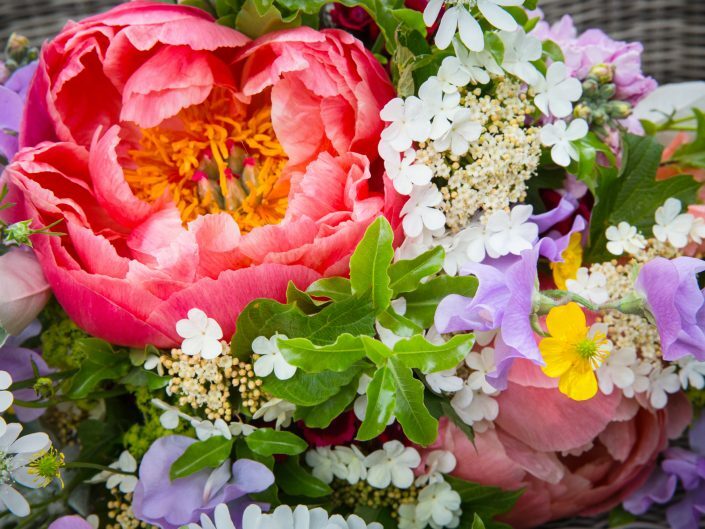 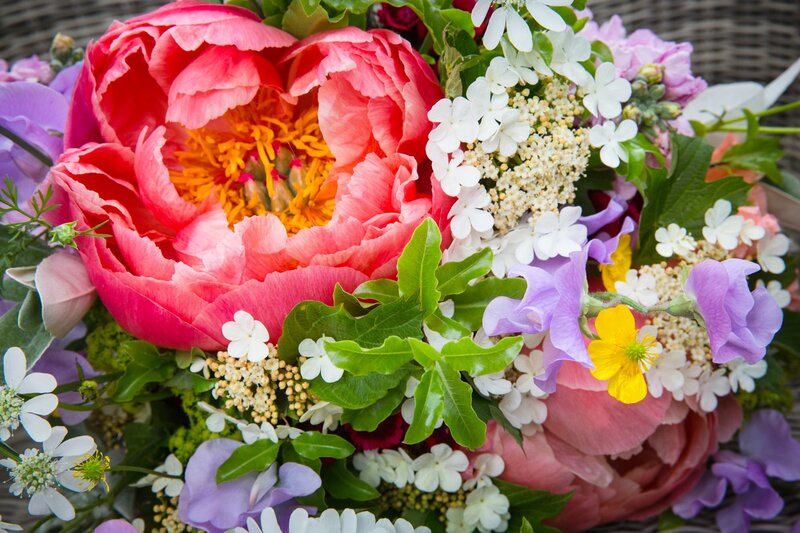 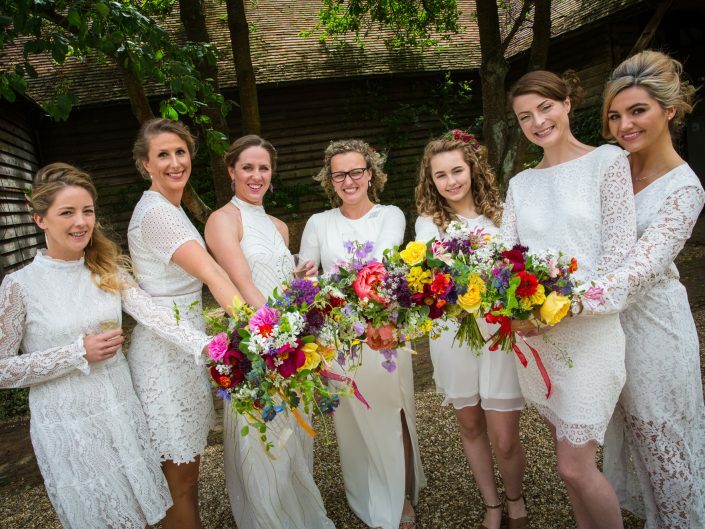 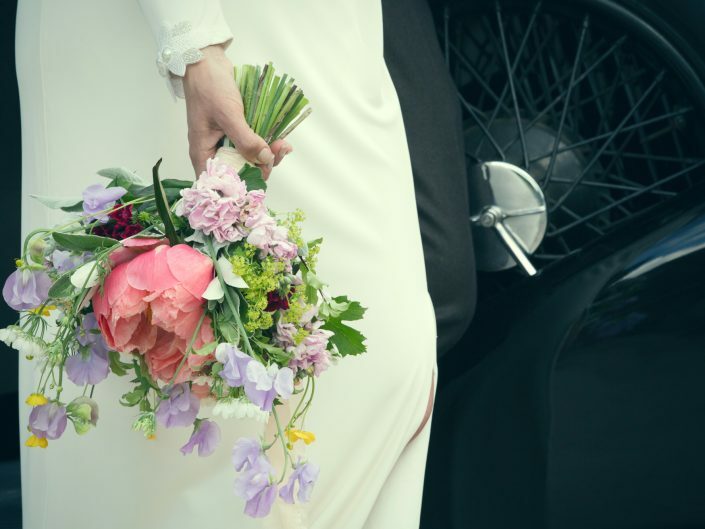 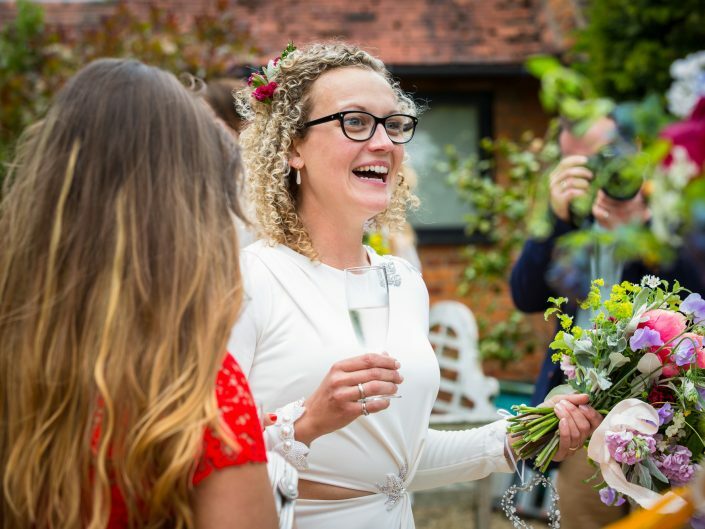 We are huge fans of Green & Gorgeous & their British grown flowers, Eilidh’s bouquet was a beautiful confection of Peonies, Sweet Peas & Buttercups. 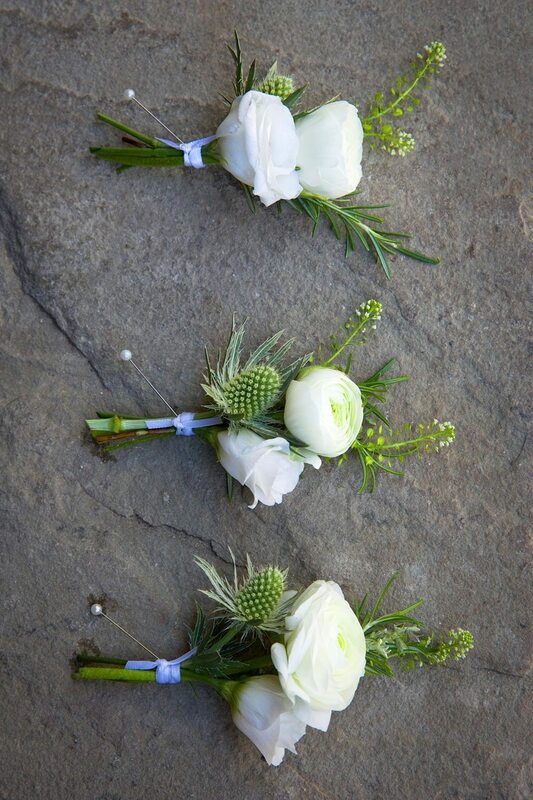 The buttonholes were fuchsia Sweet William & fragrant Rosemary. 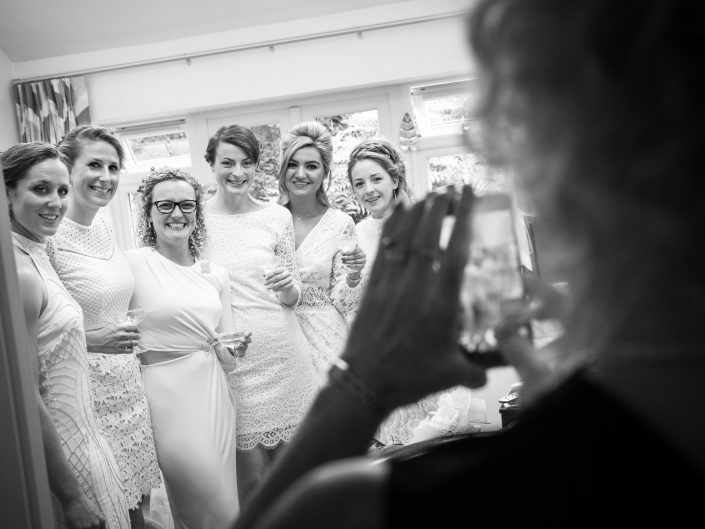 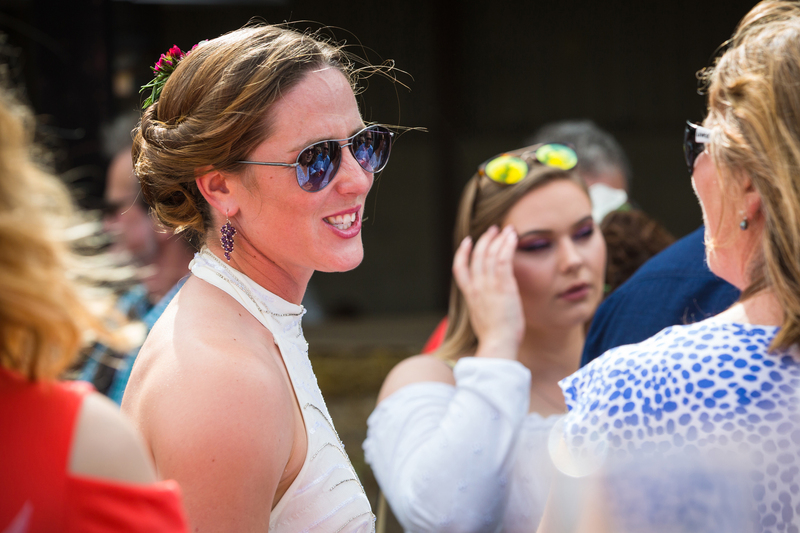 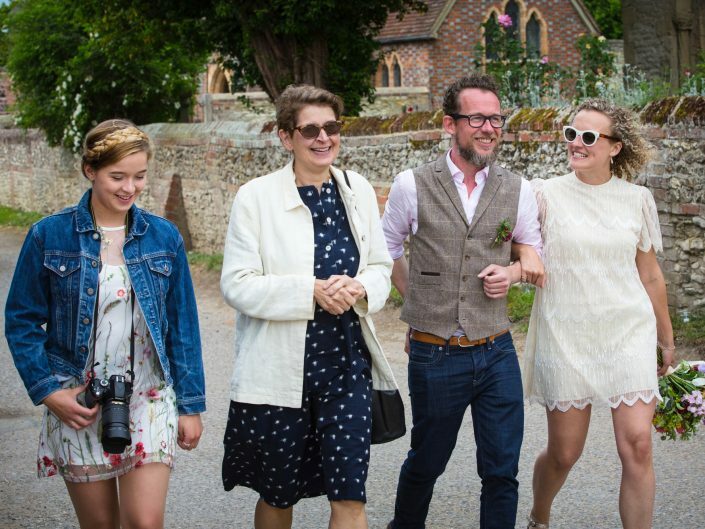 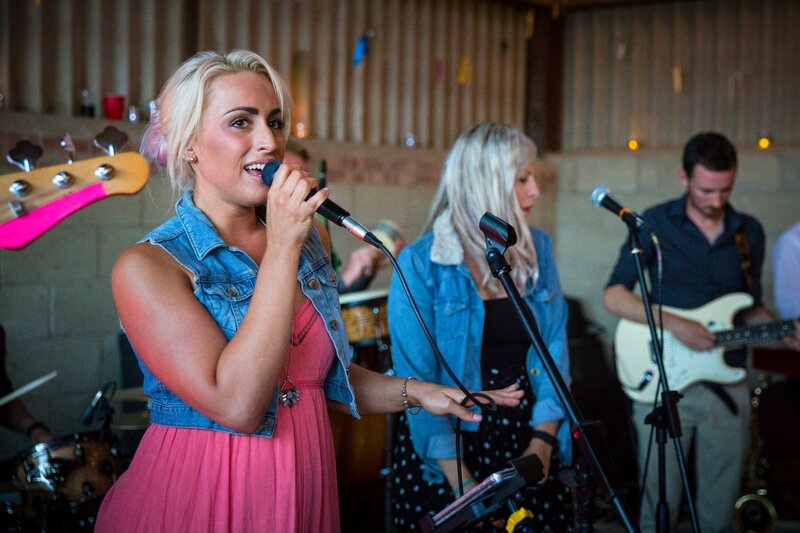 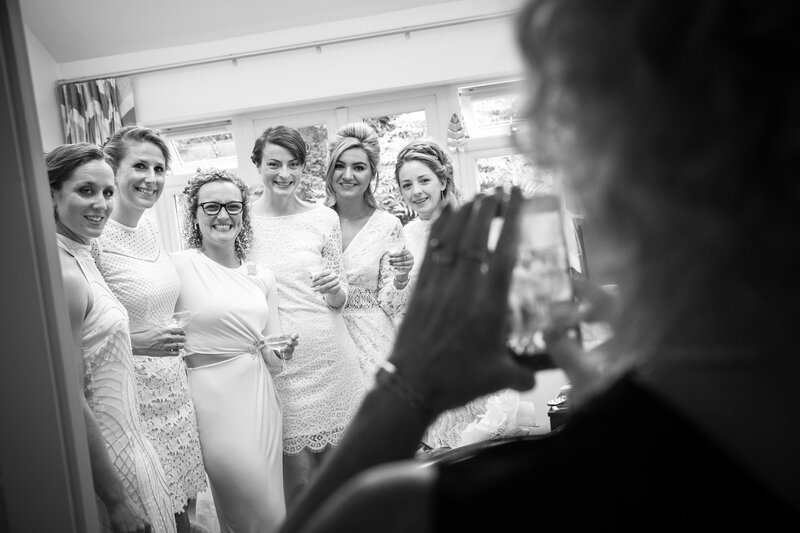 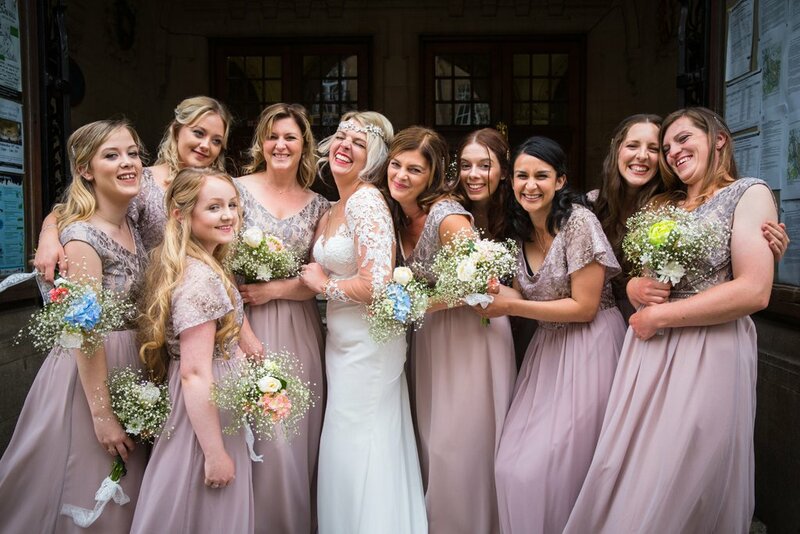 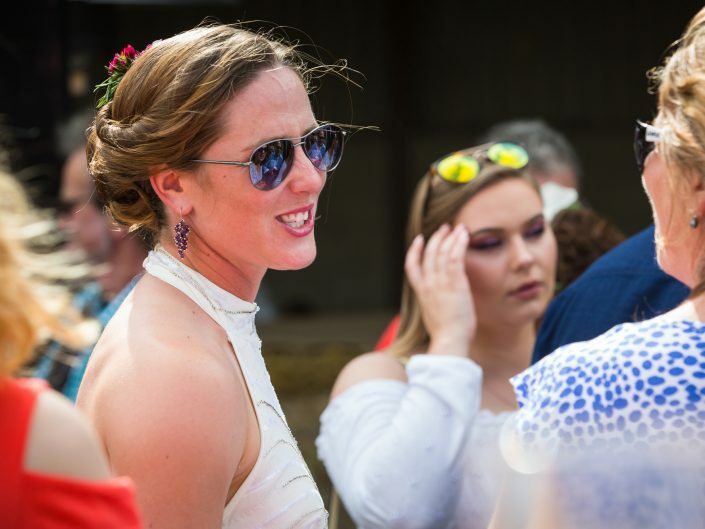 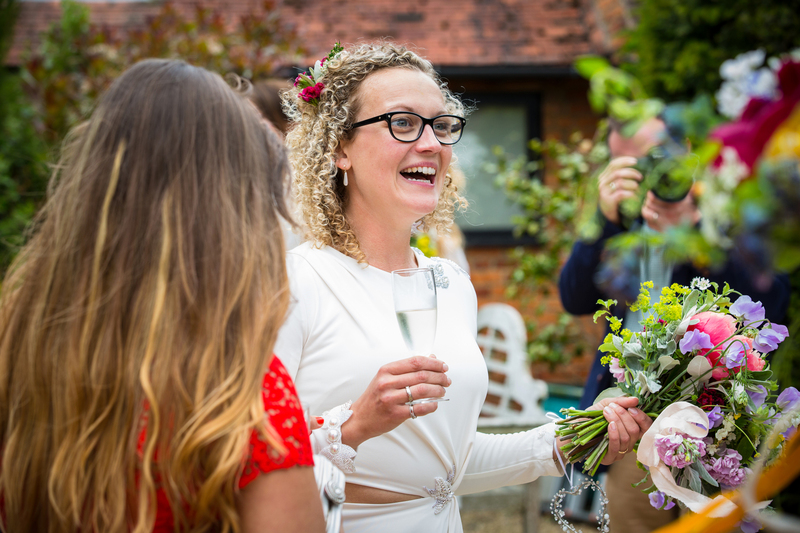 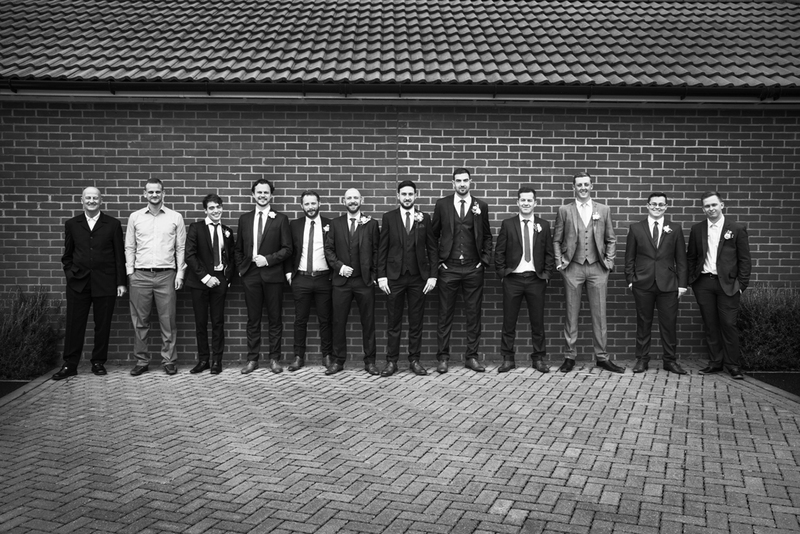 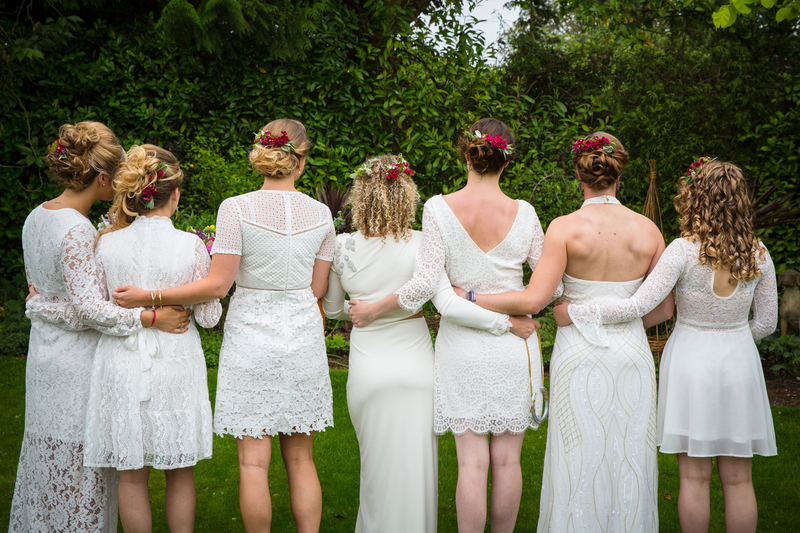 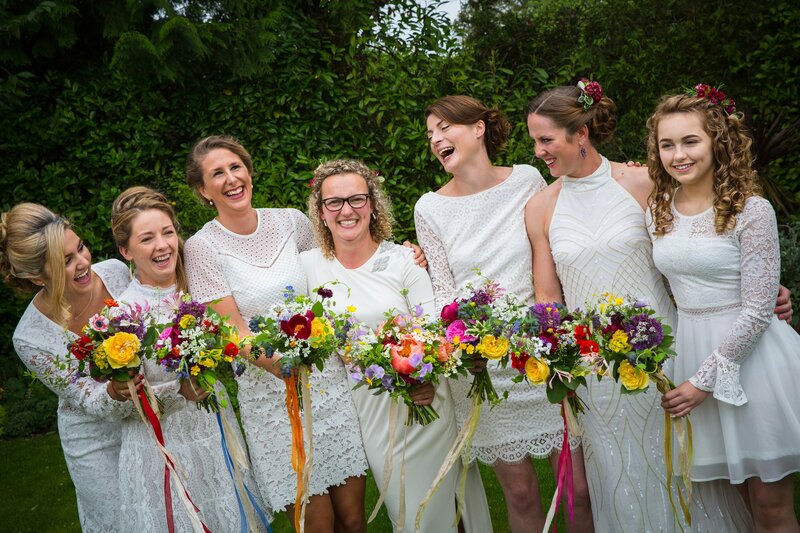 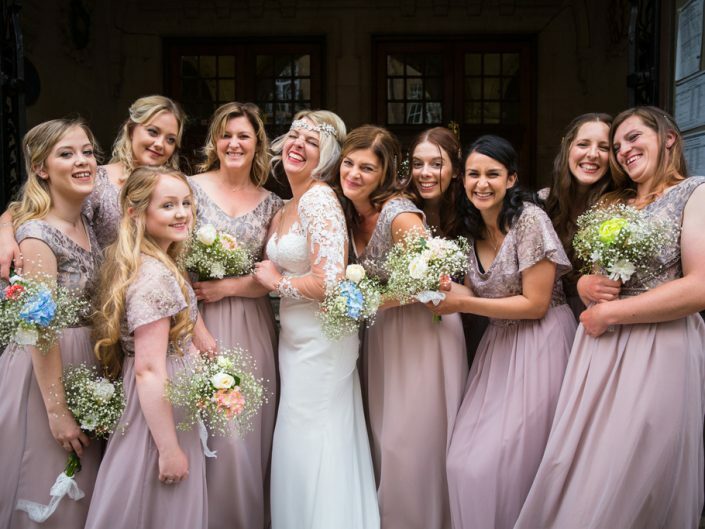 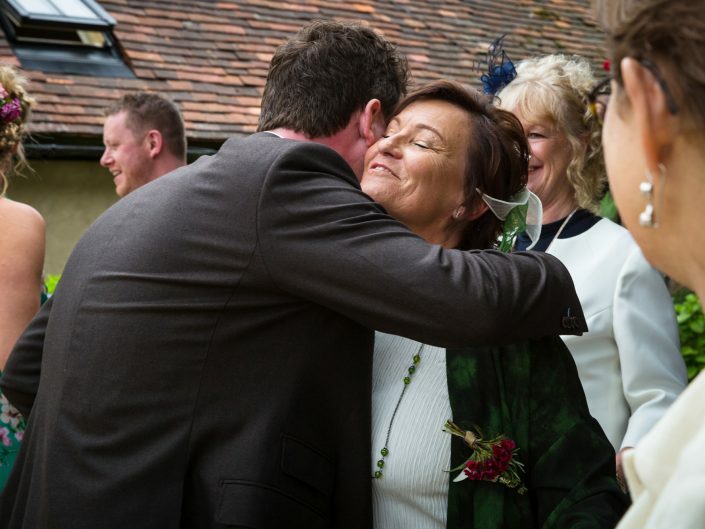 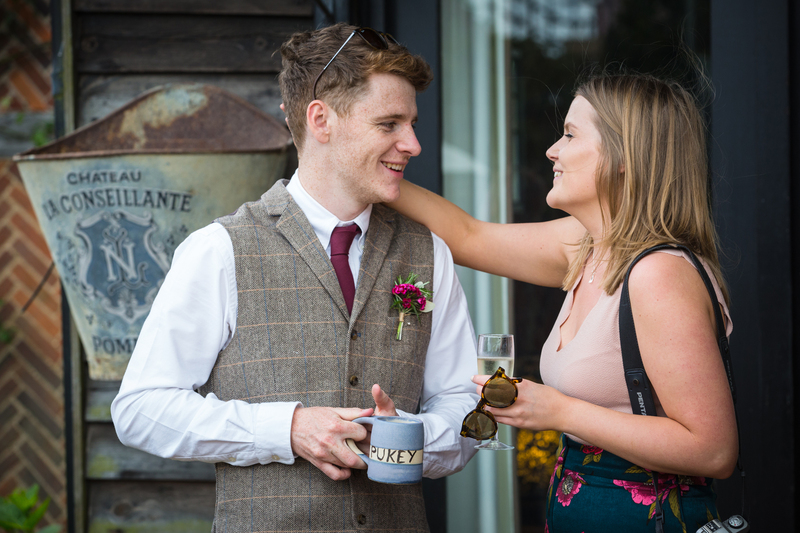 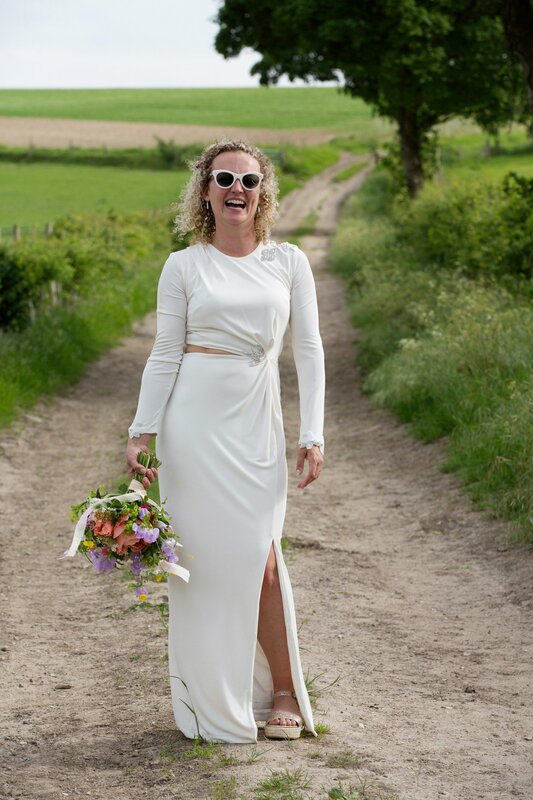 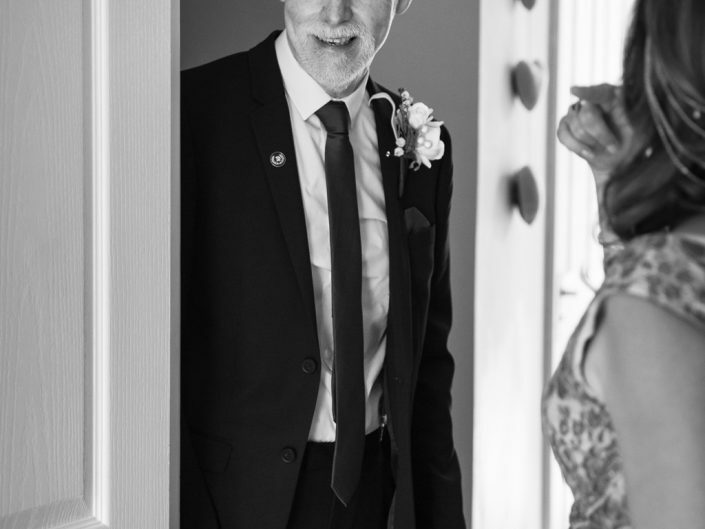 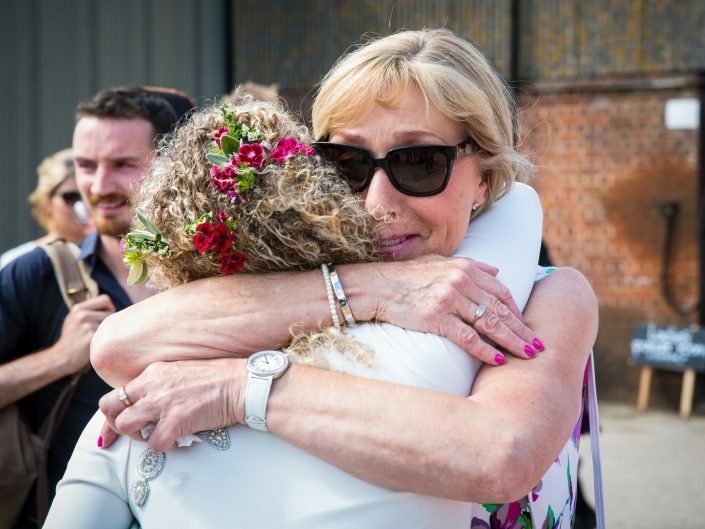 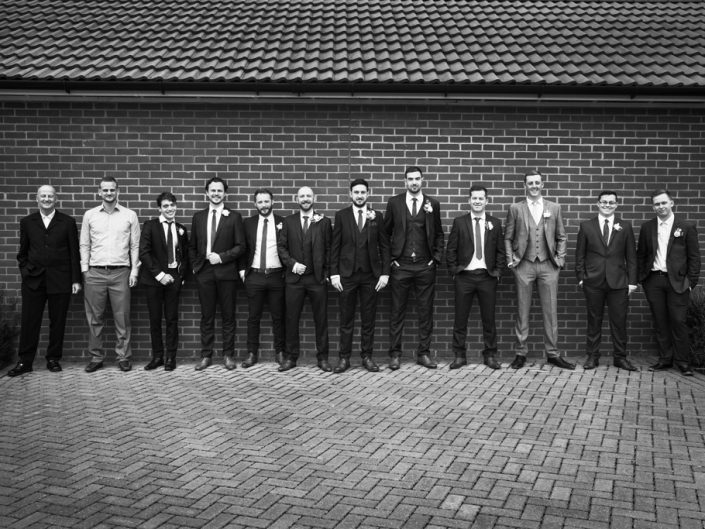 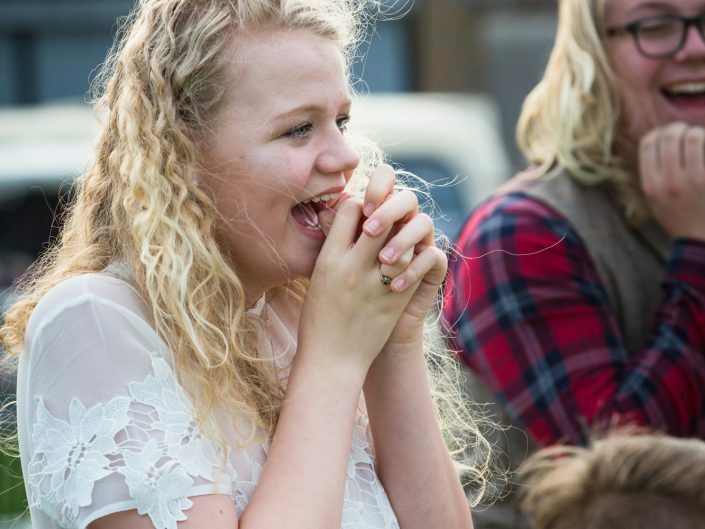 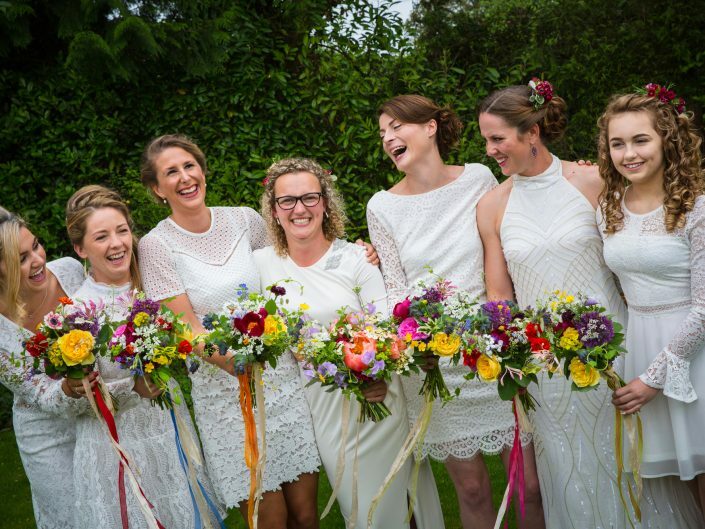 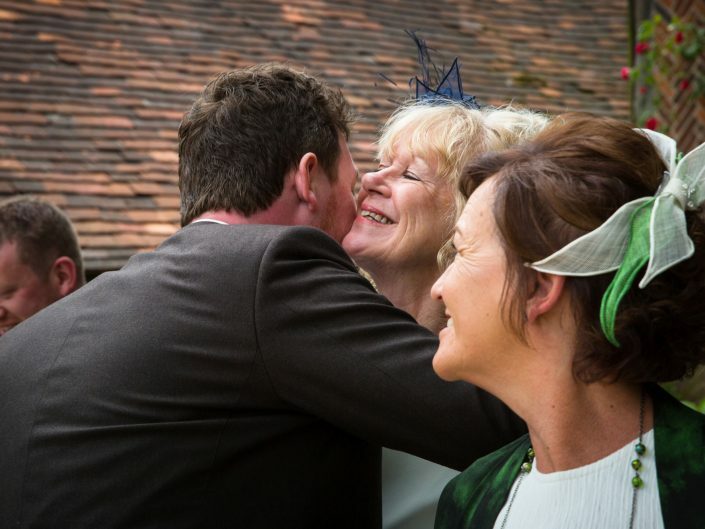 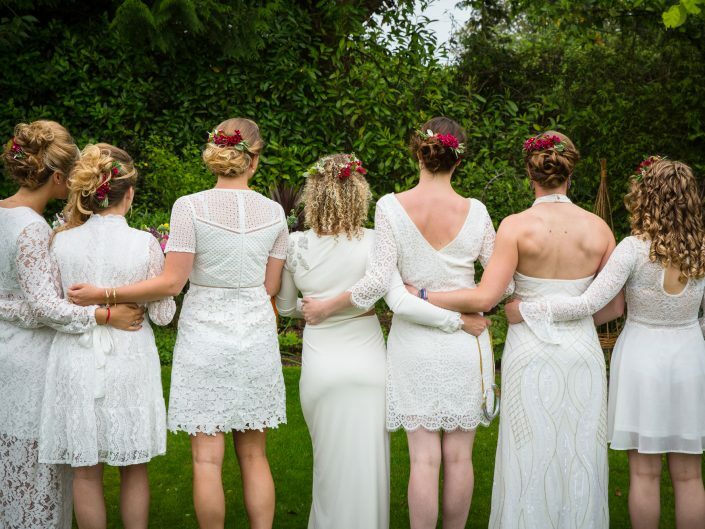 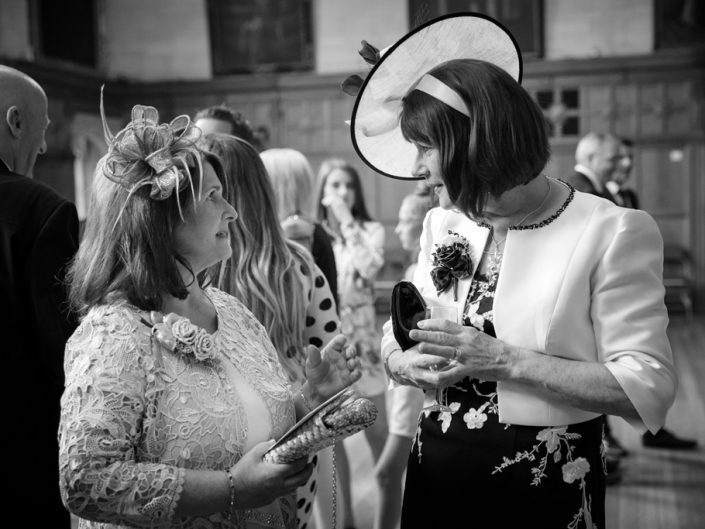 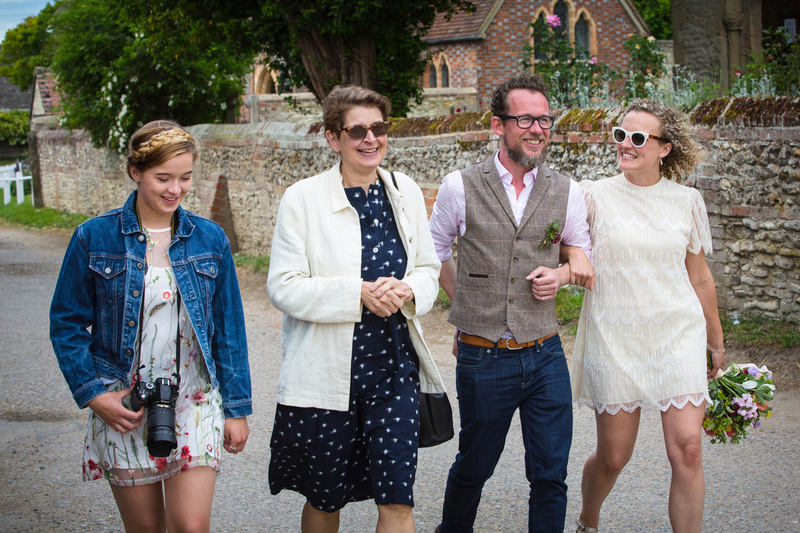 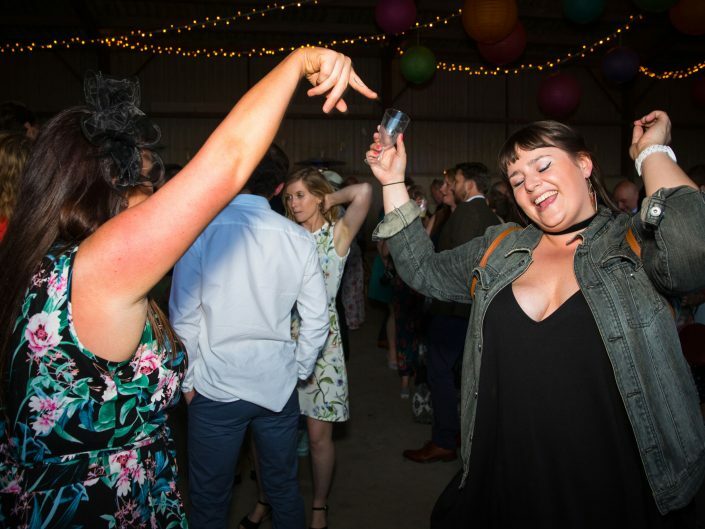 Whilst I was with the bridal party Amy was at Manor Farm at Cuxham where the relaxed festival feel reception was to be later in the day capturing the important details. 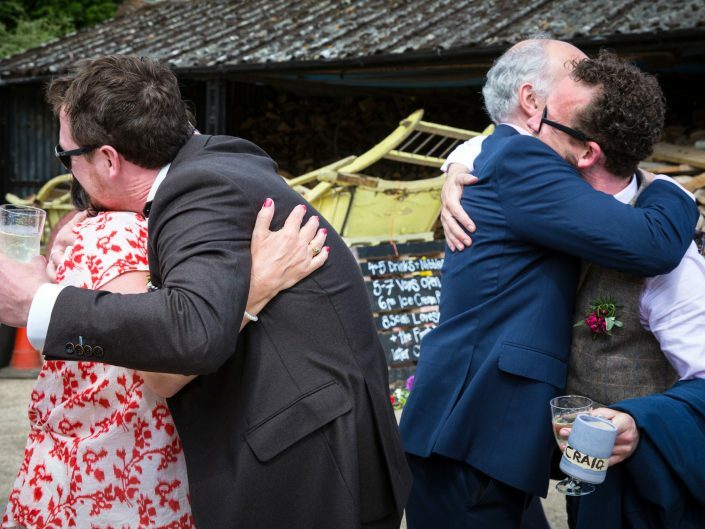 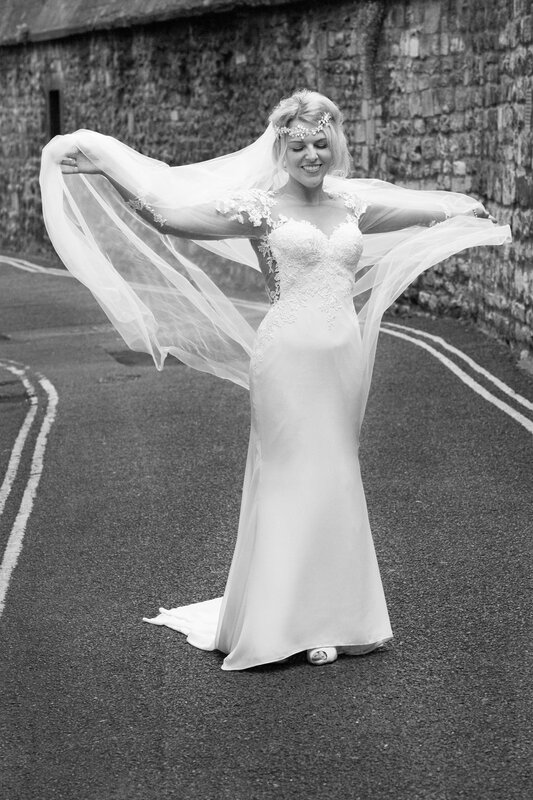 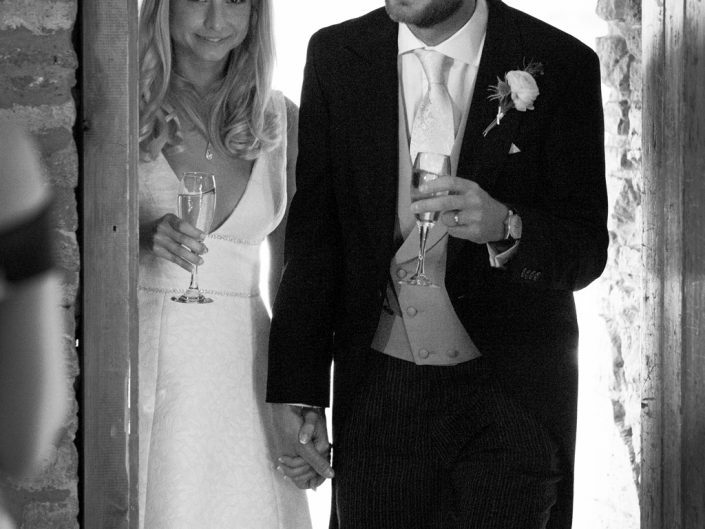 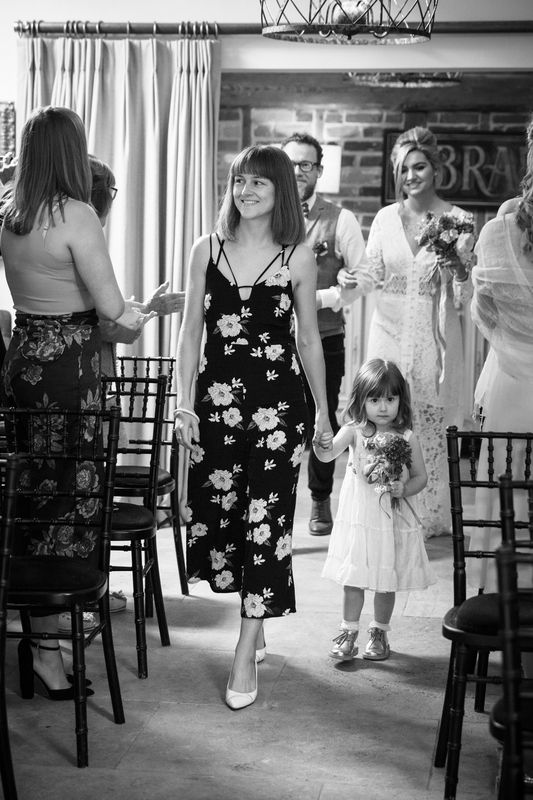 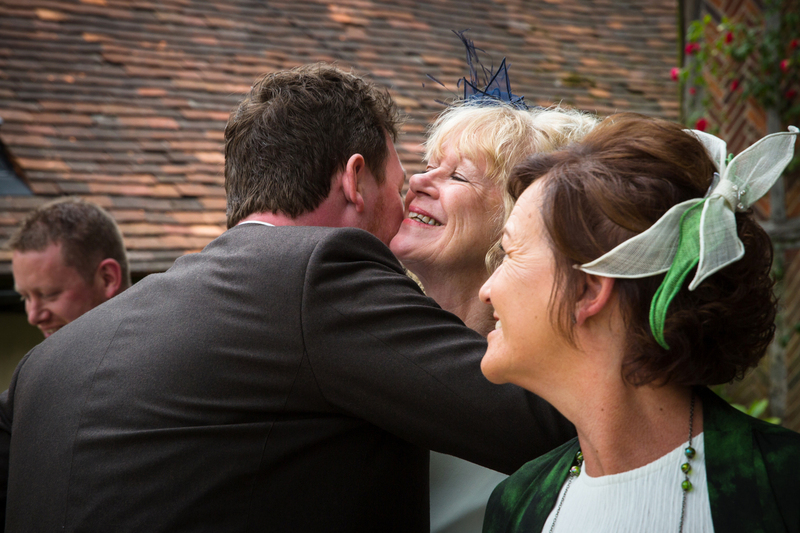 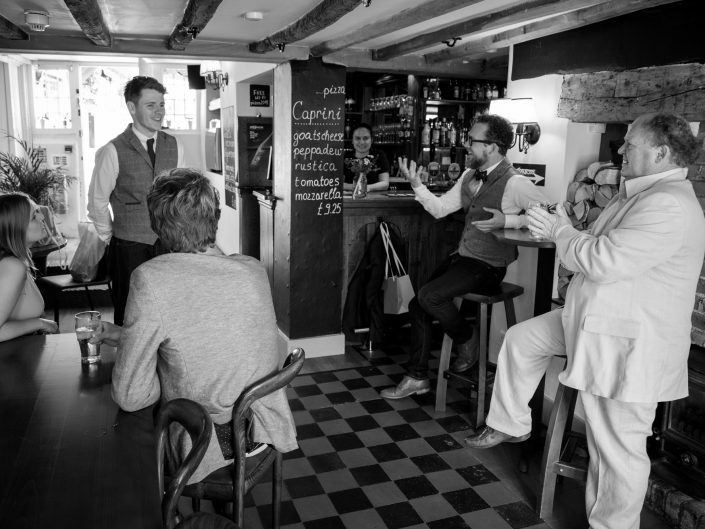 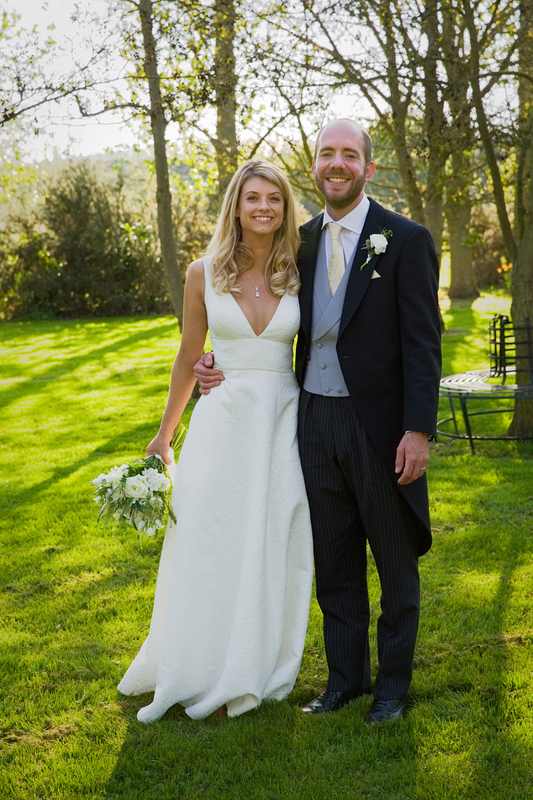 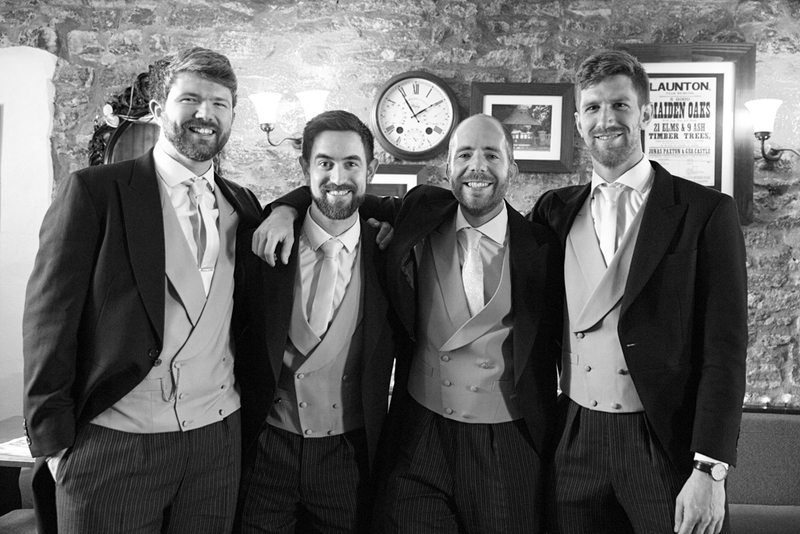 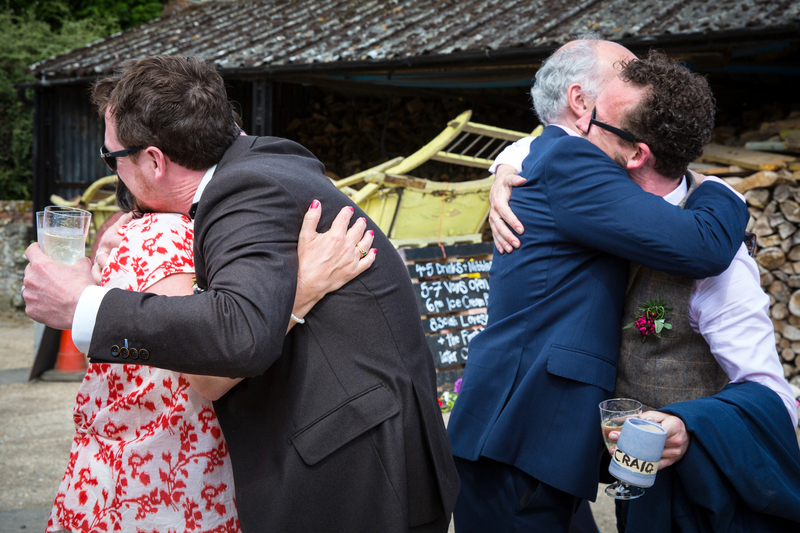 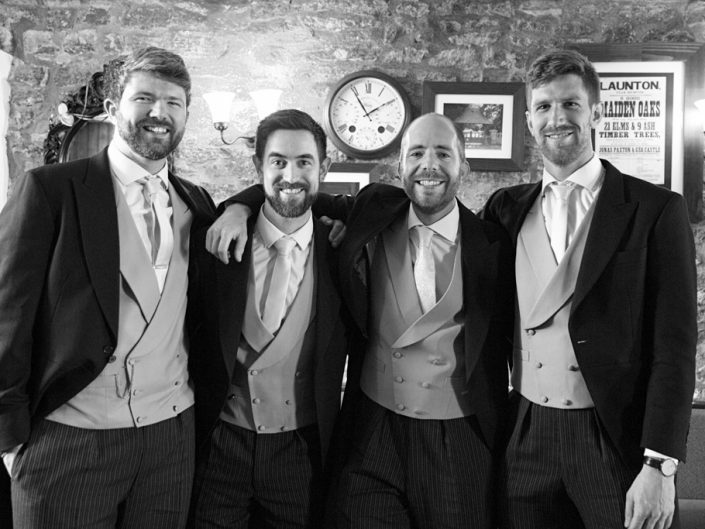 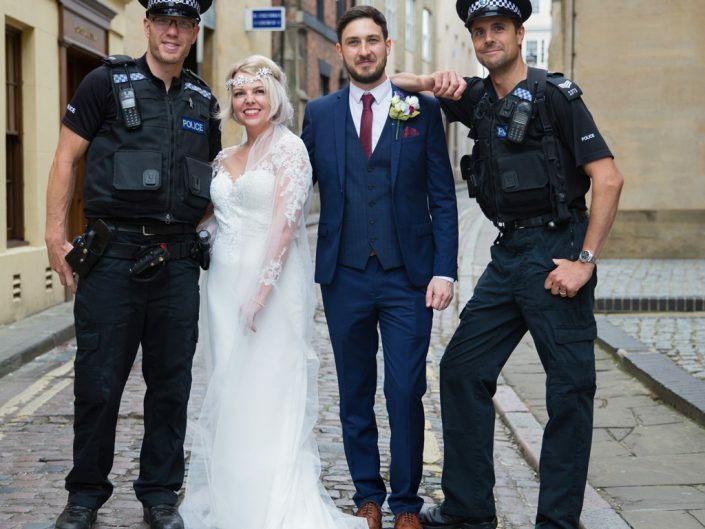 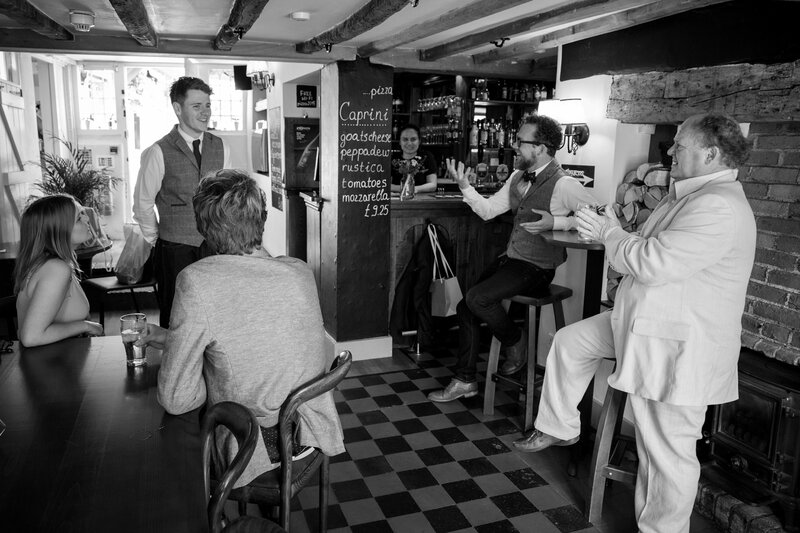 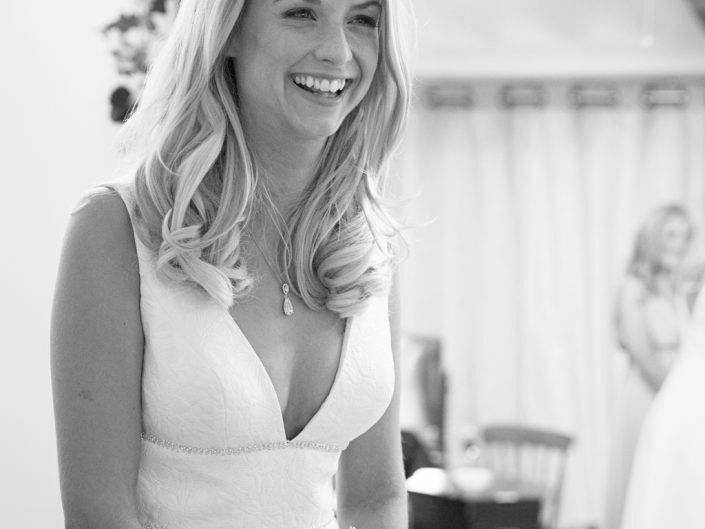 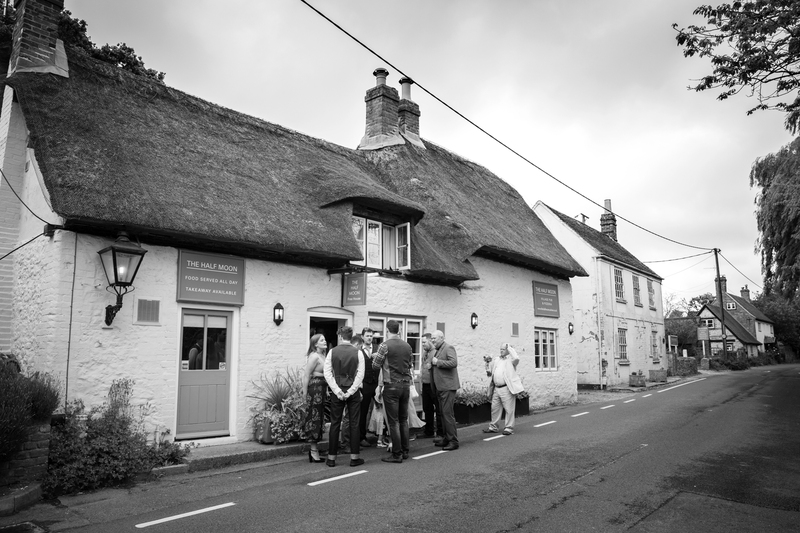 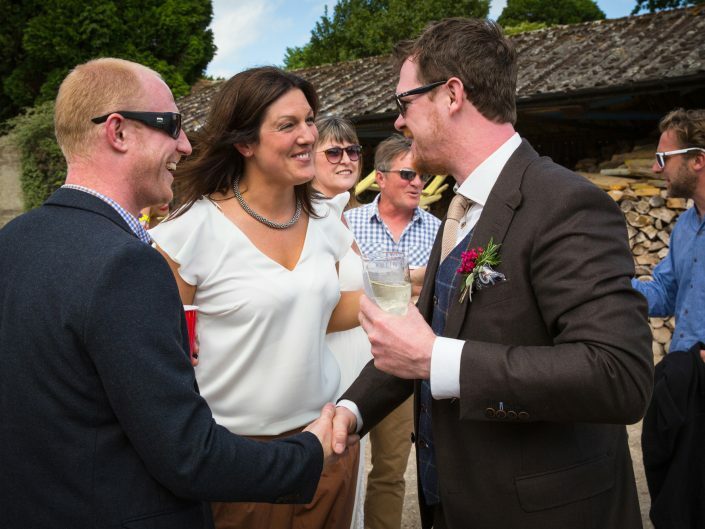 She then made her way to the village pub The Half Moon to meet the groom Andrew & the rest of the wedding party. 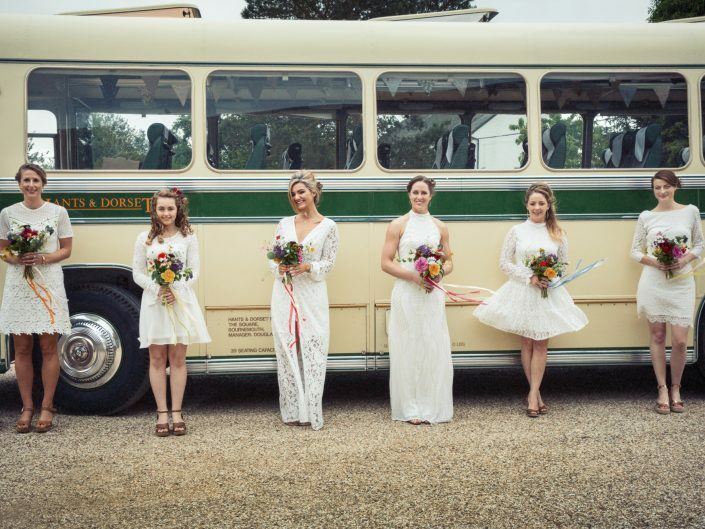 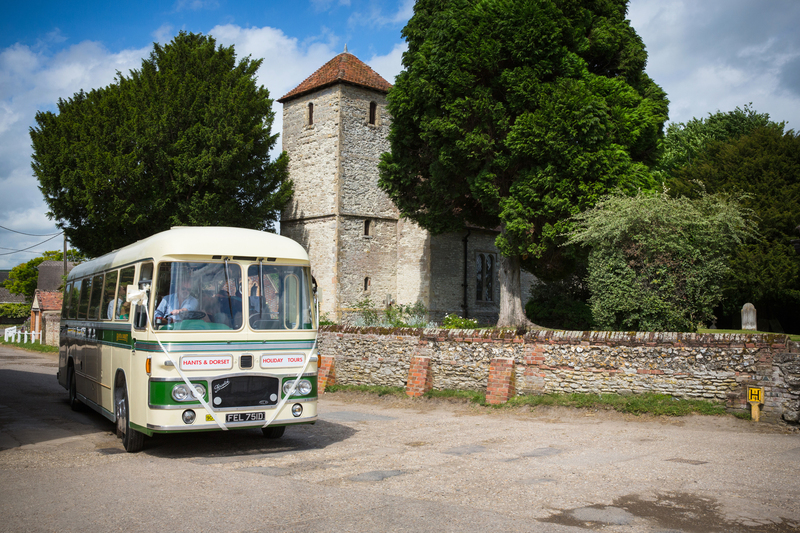 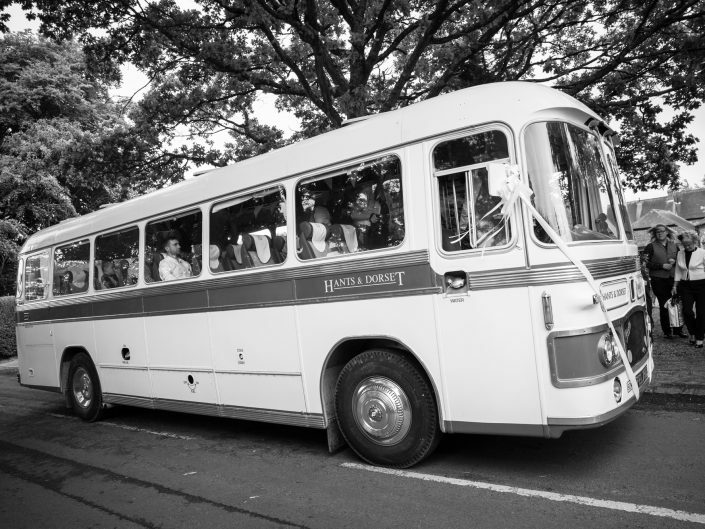 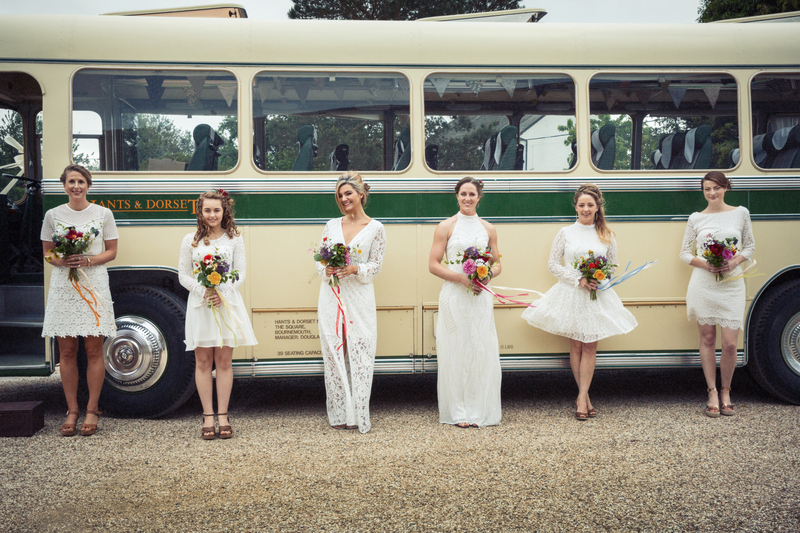 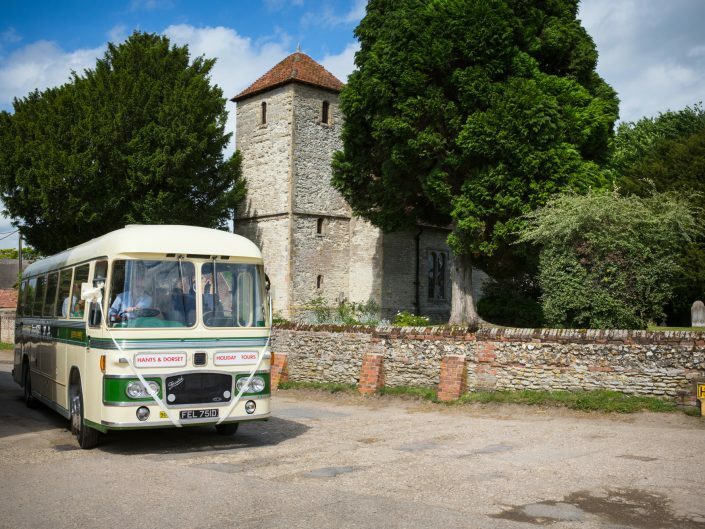 They all gathered at the farm to catch the lovely vintage bus that was to convey them all to Bix Manor for the reception. 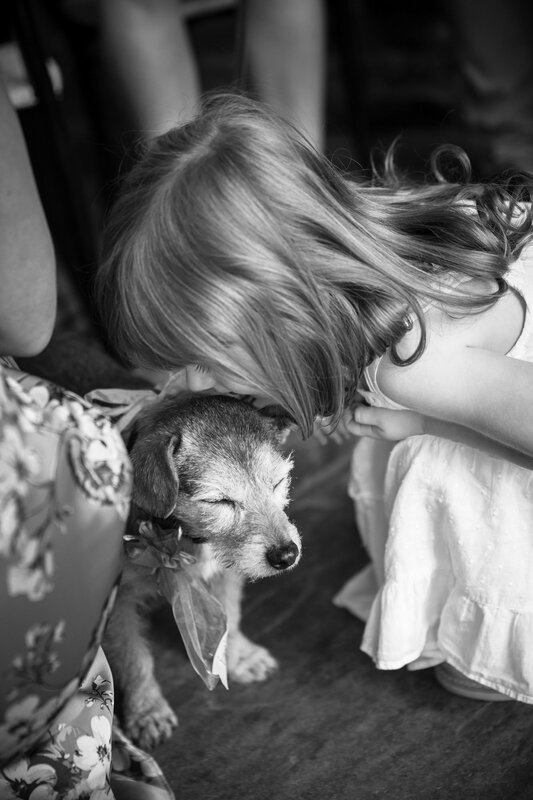 After final preparations I took the bridal party out to the garden to do some fun shots but little Maggie wasn’t quite so keen! 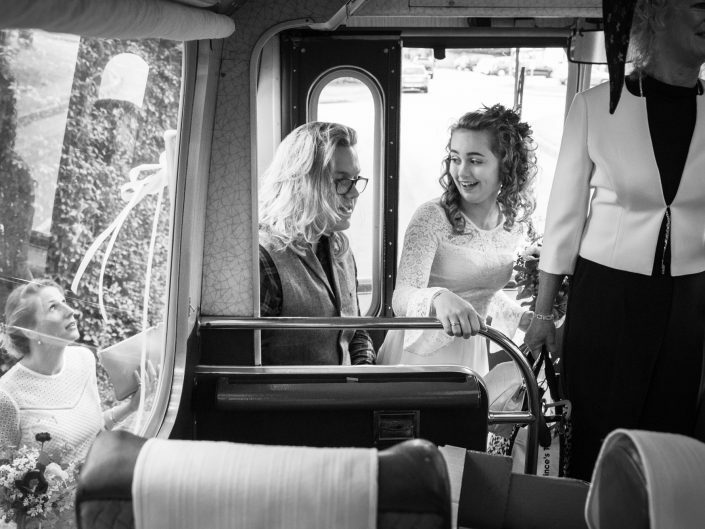 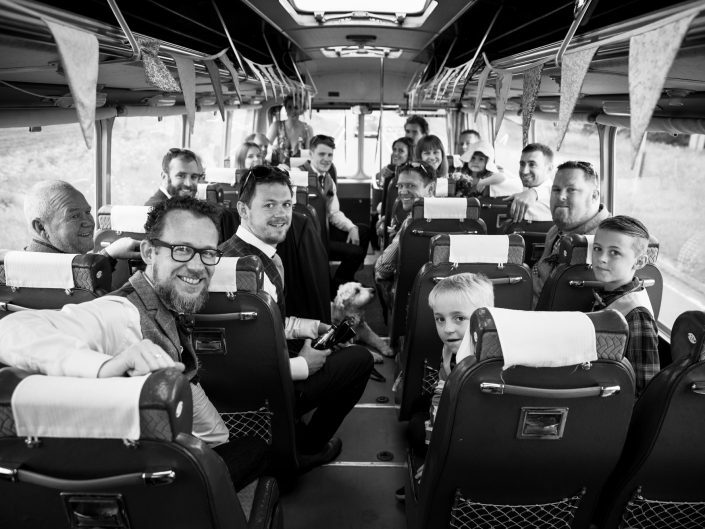 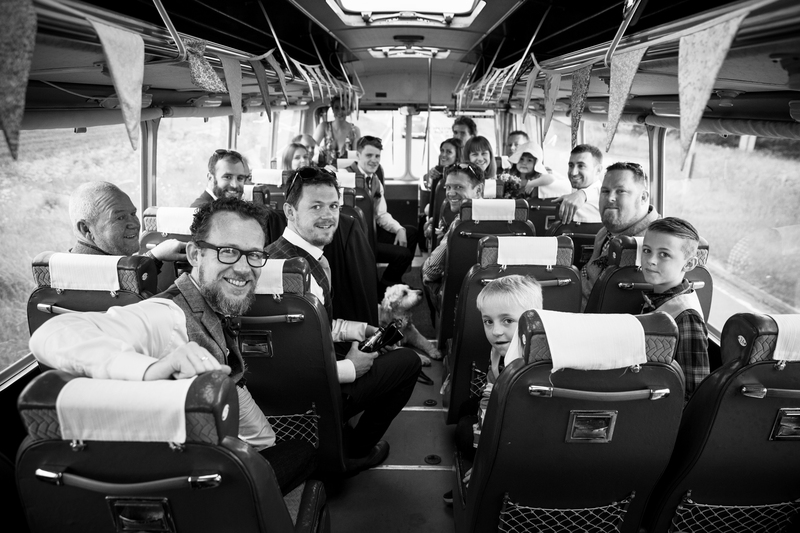 Soon it was time for the bridesmaids & the rest of the family to board the bus to join the rest of the guests who had stopped by en route. 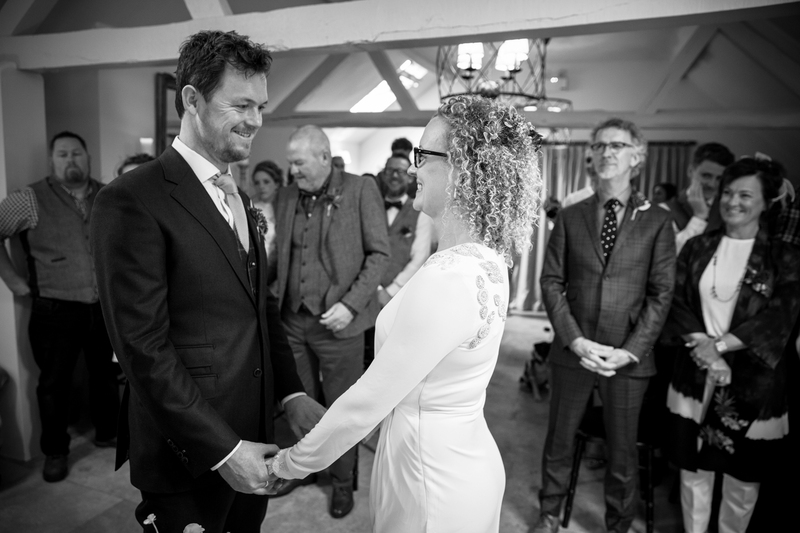 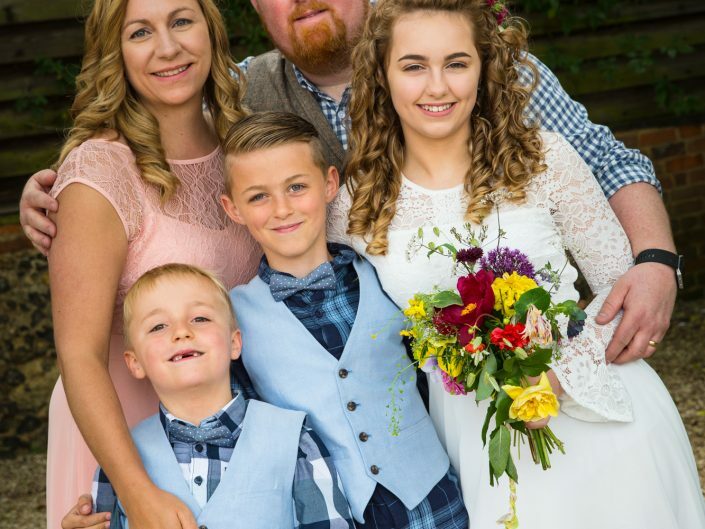 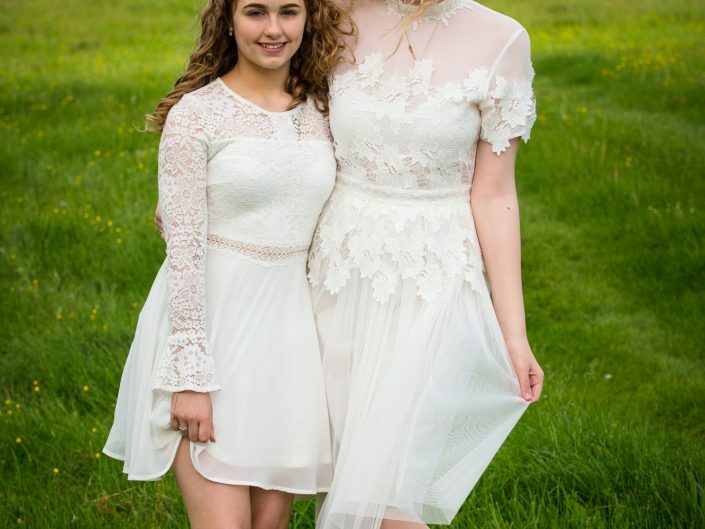 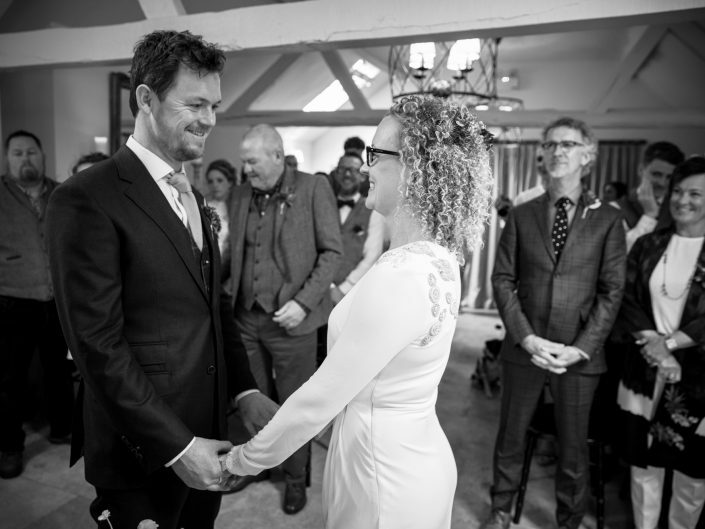 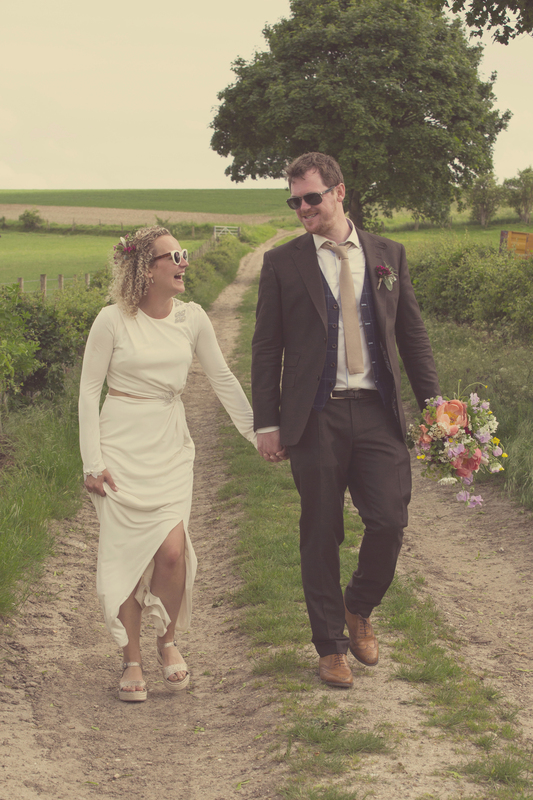 Bix Manor is a lovely rural location & Eilidh & Andrew held their ceremony in the library in front of their friends, families & two very special guests. 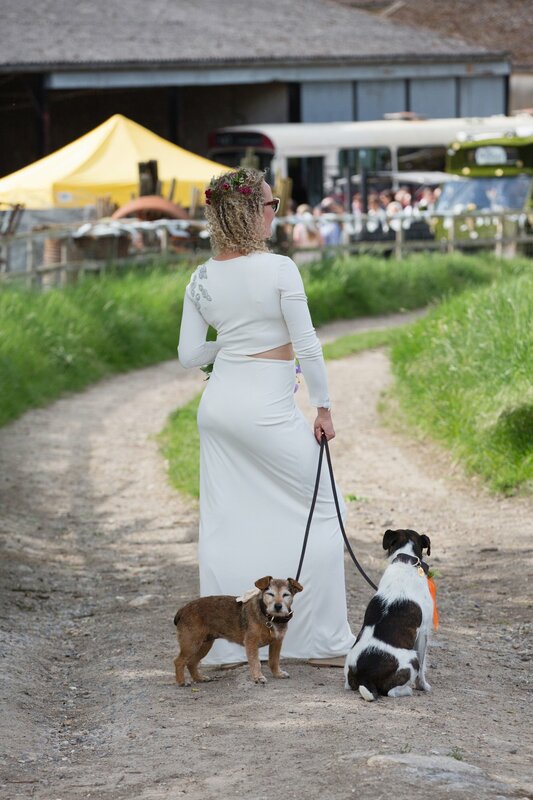 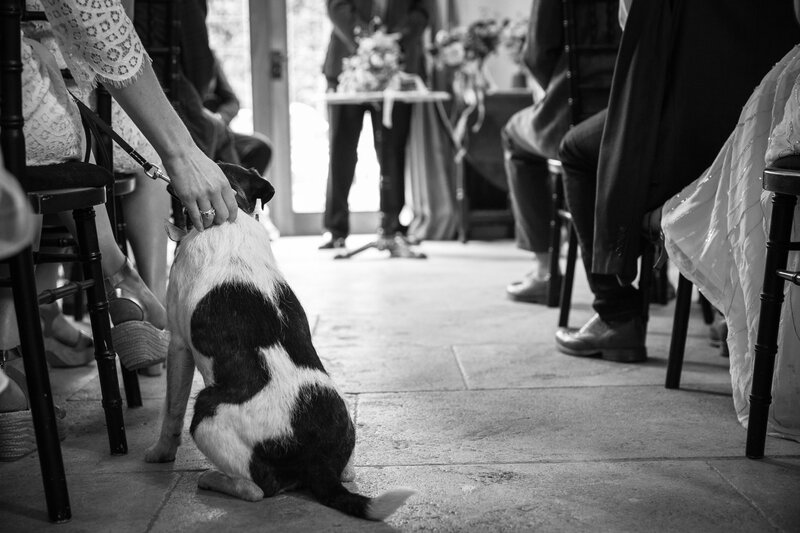 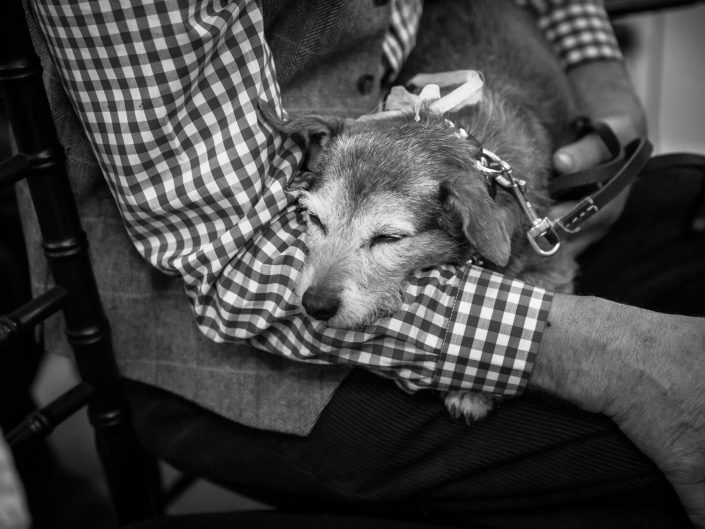 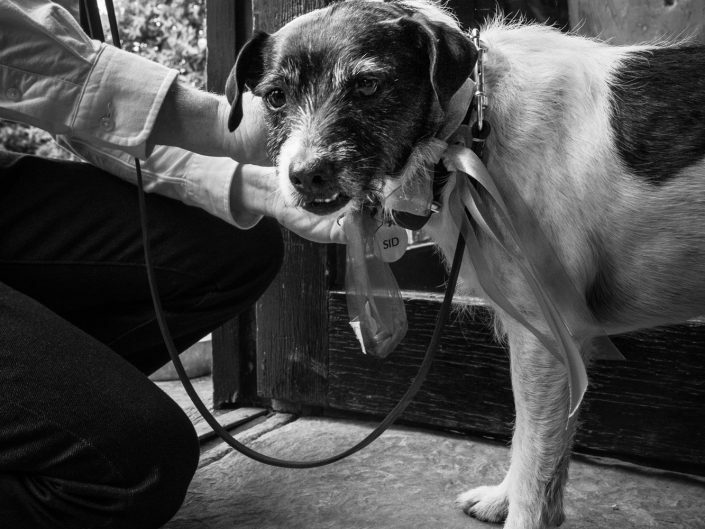 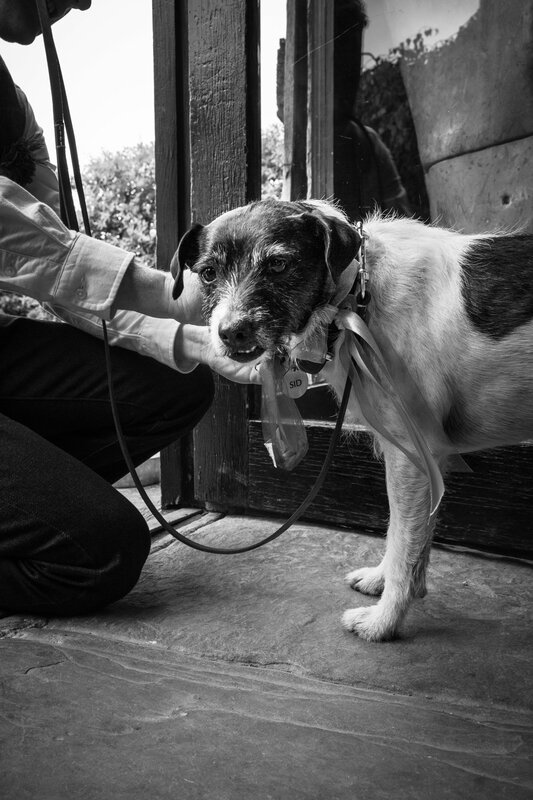 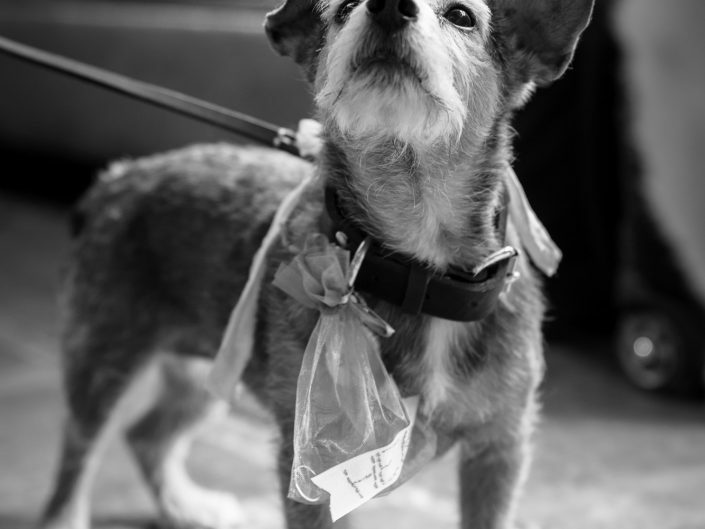 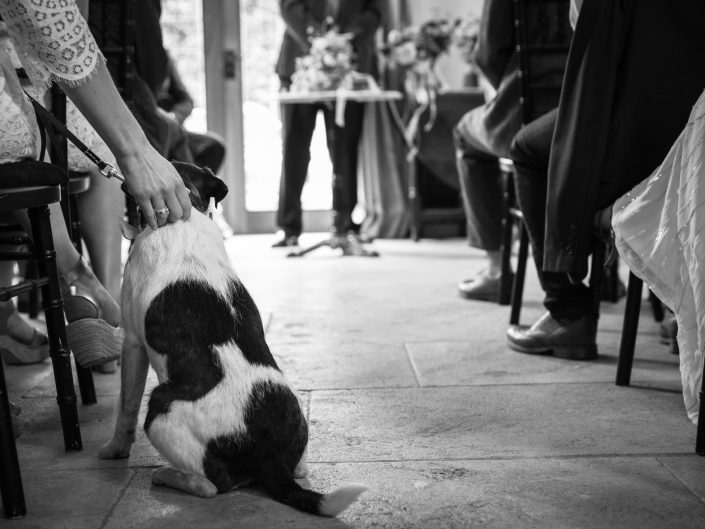 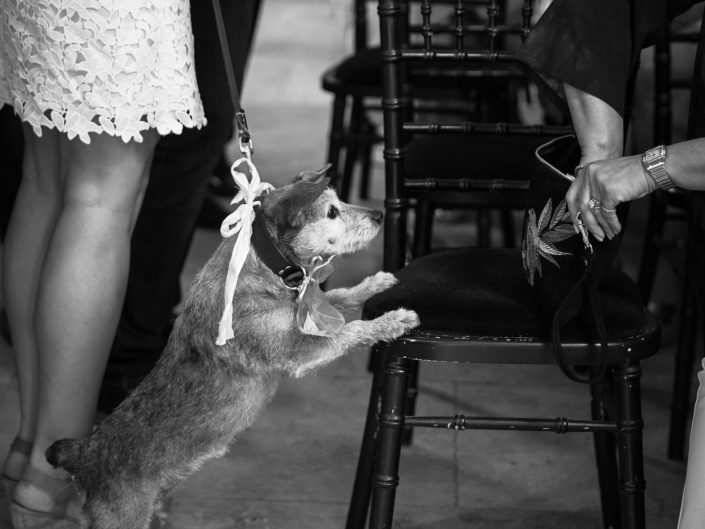 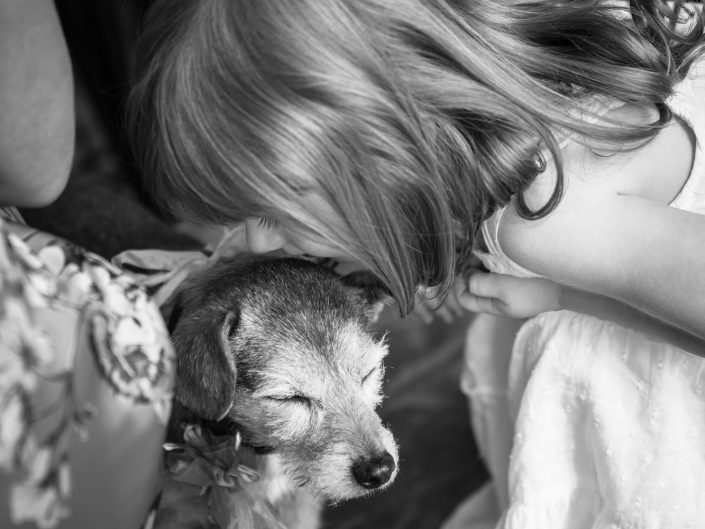 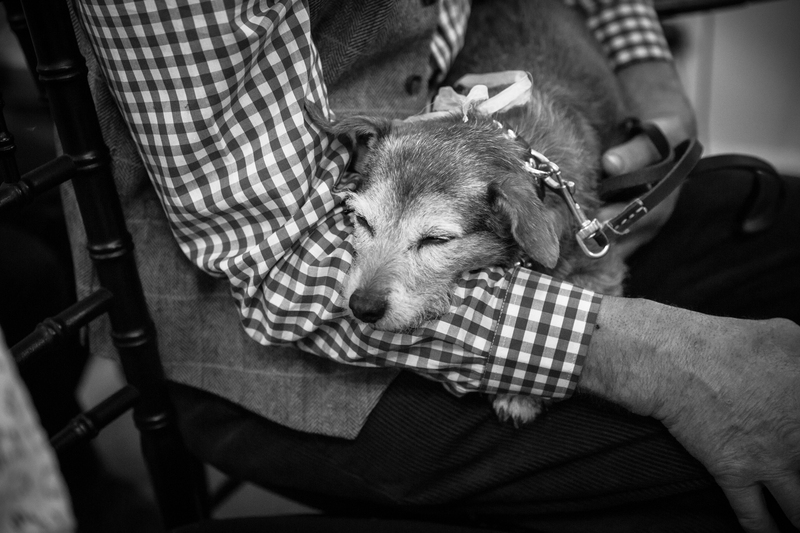 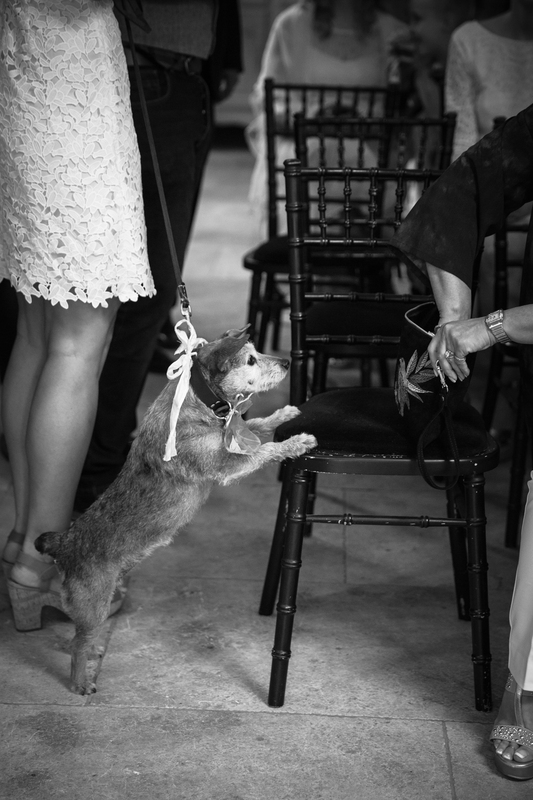 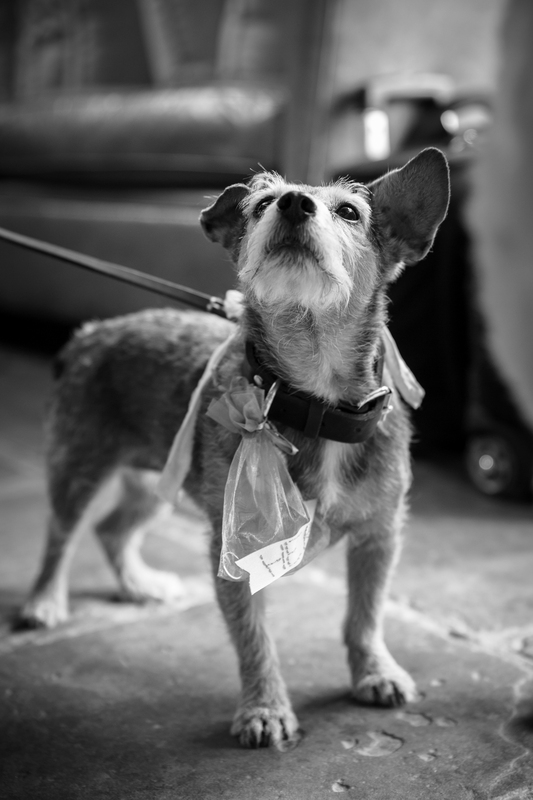 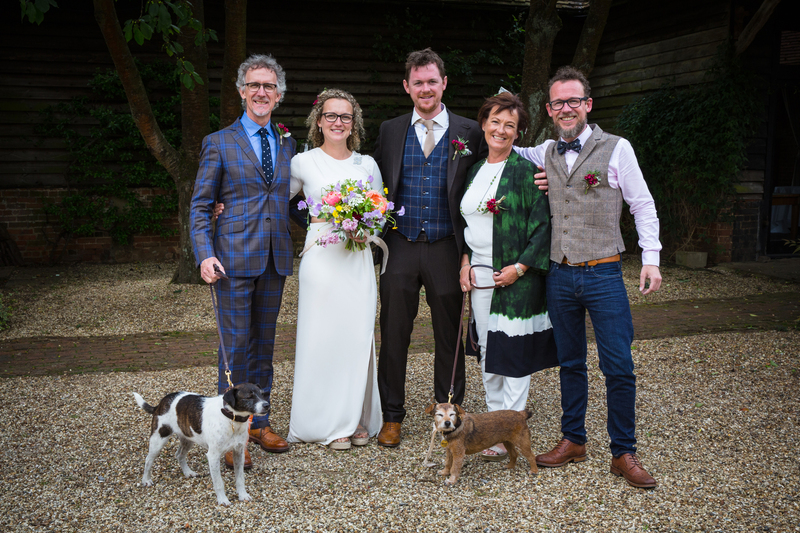 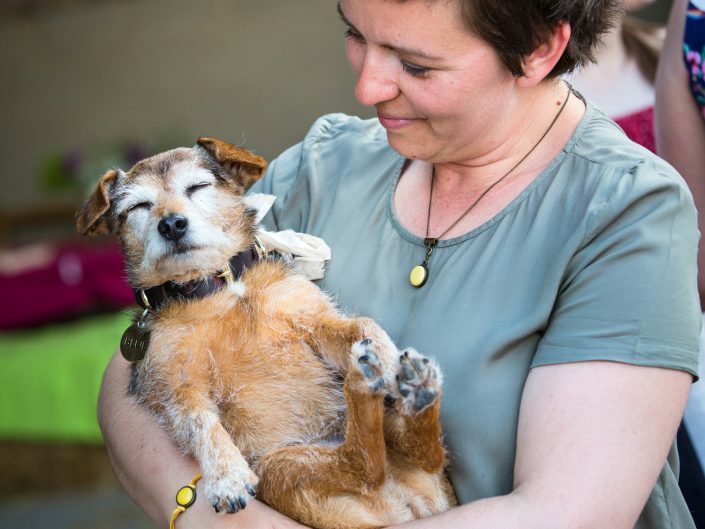 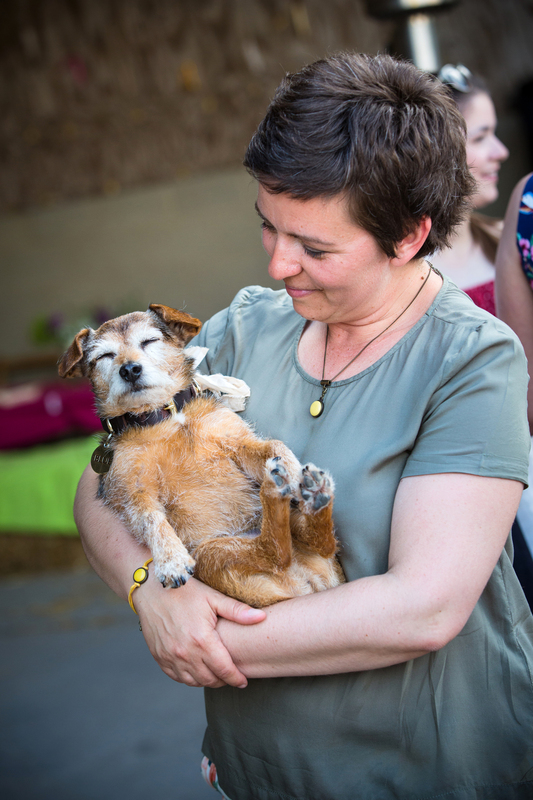 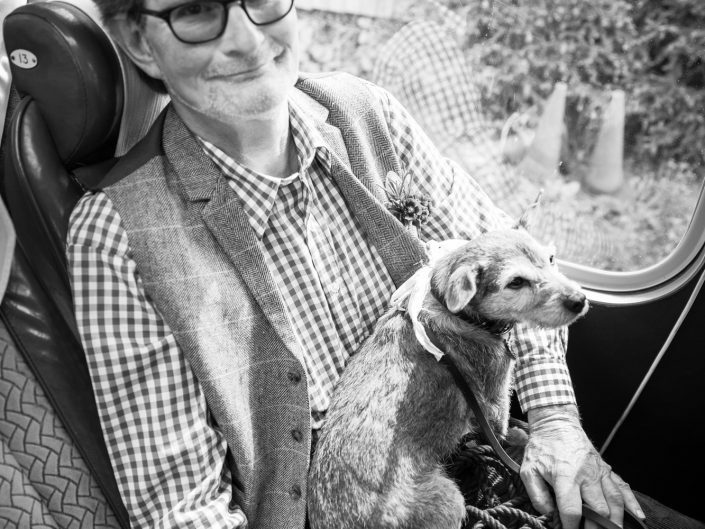 Their characterful dogs Sid & Blue also had the important job of ring bearers! 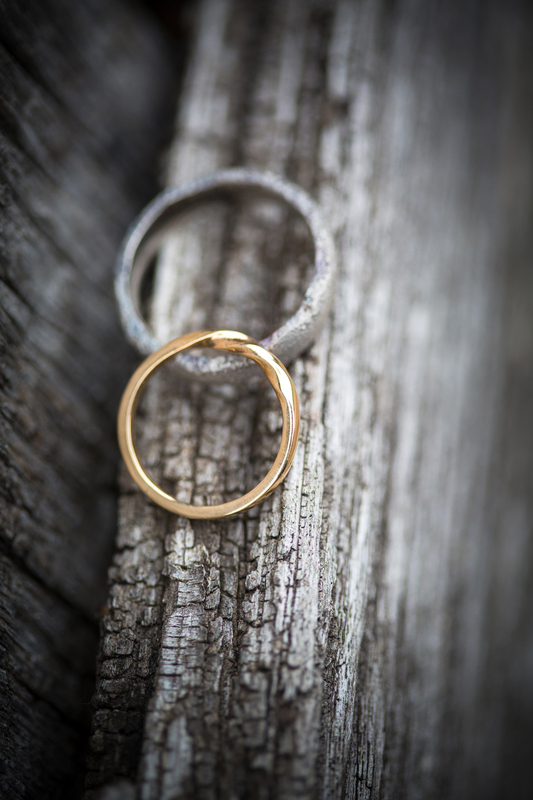 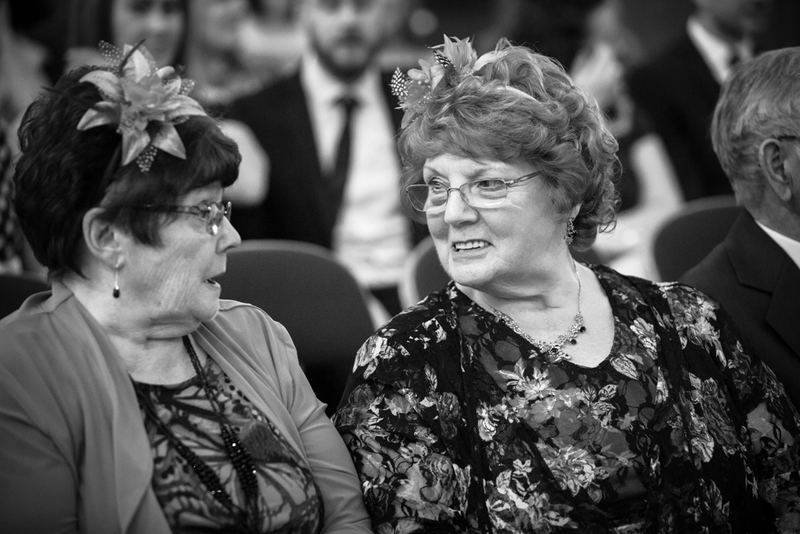 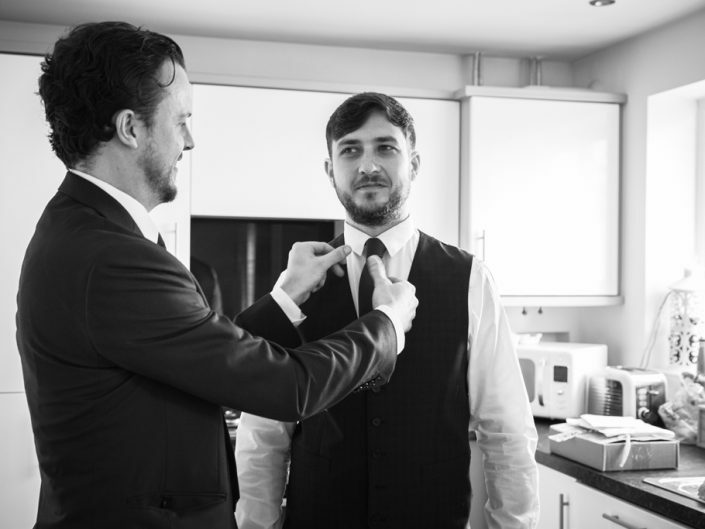 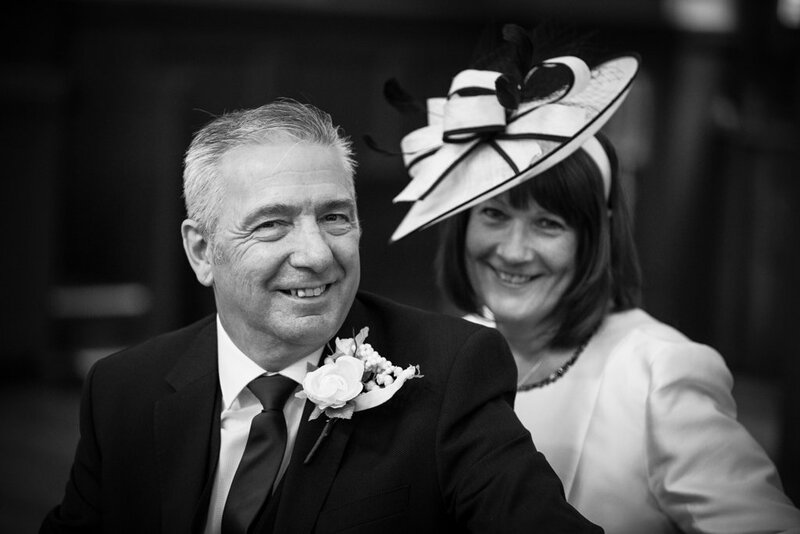 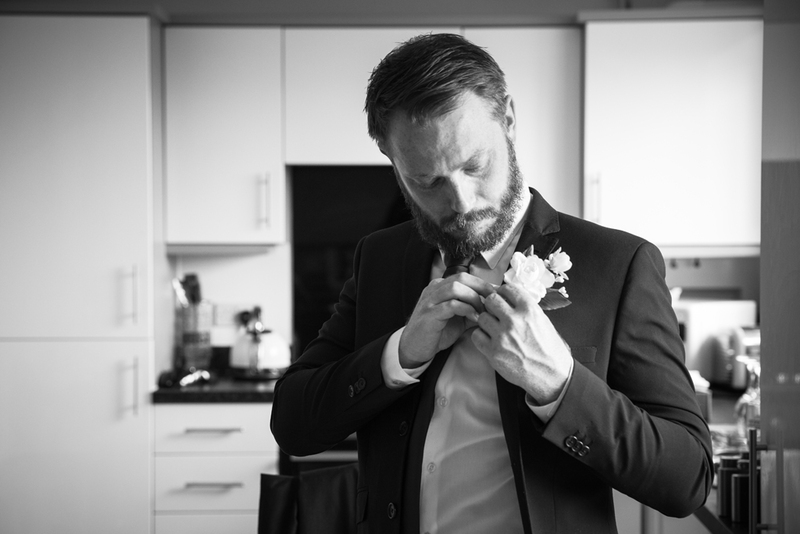 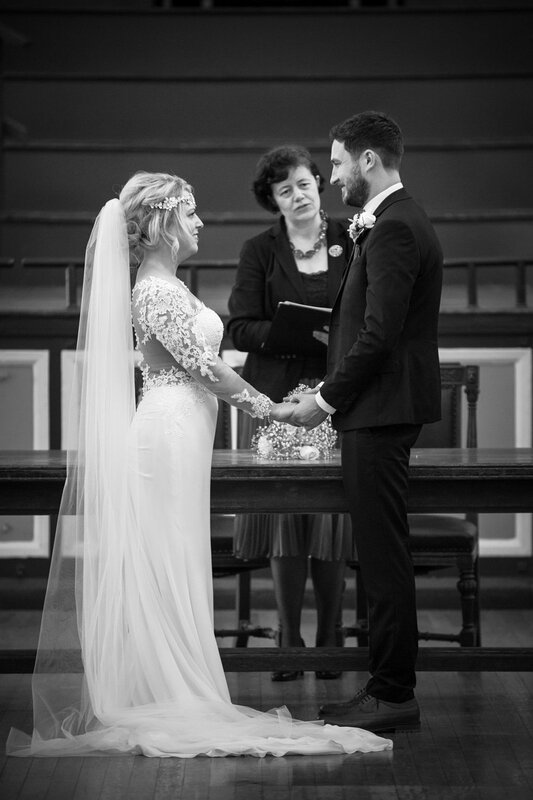 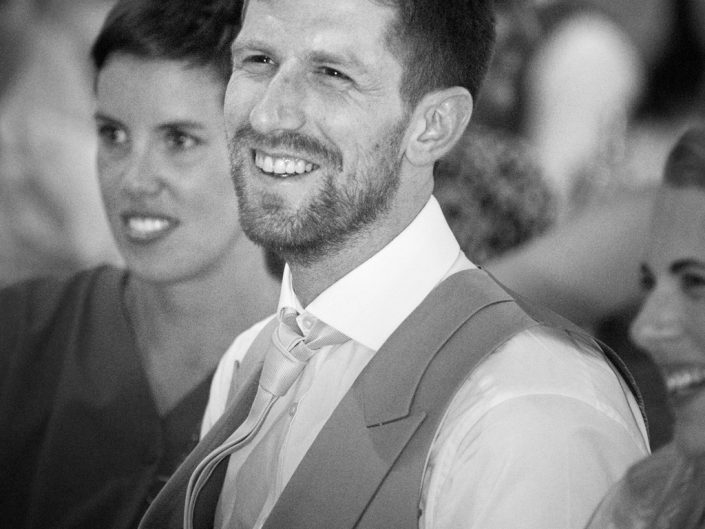 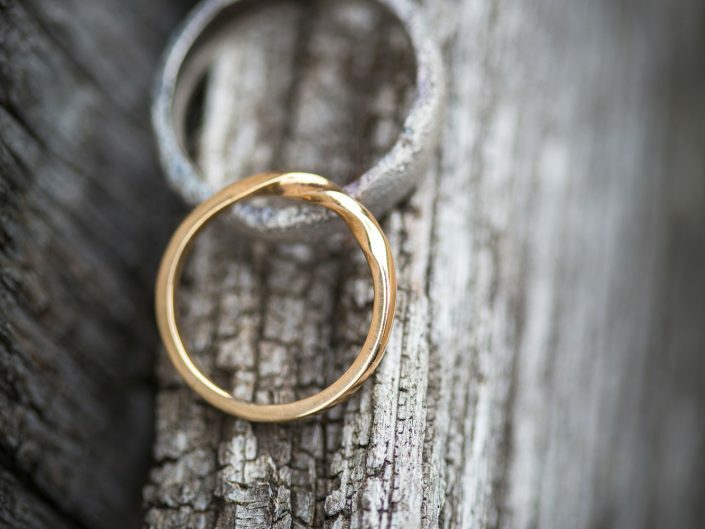 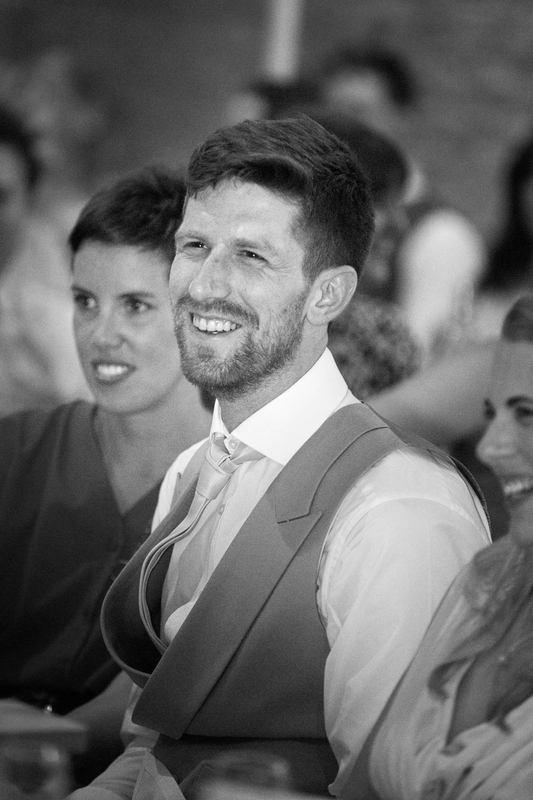 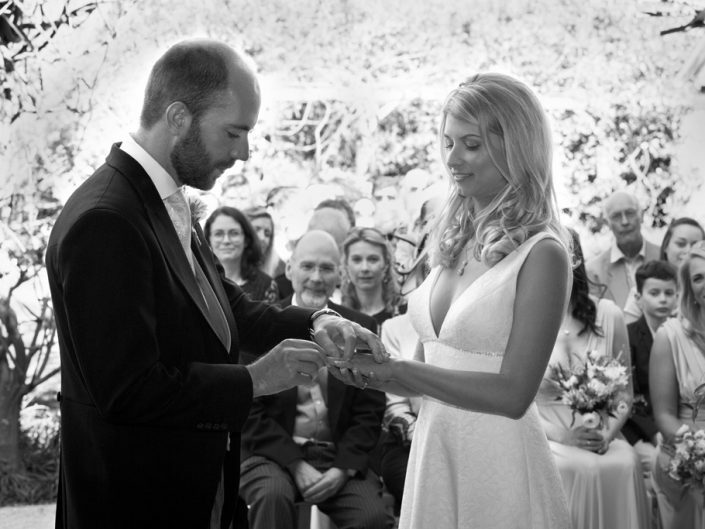 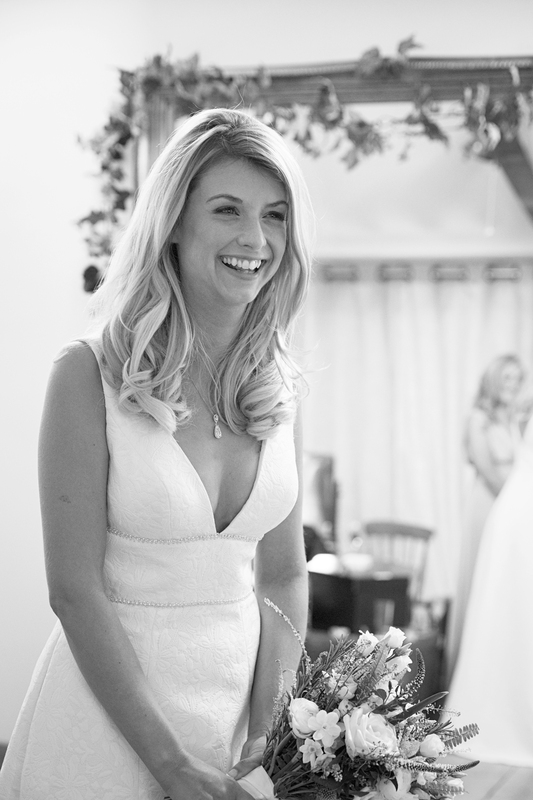 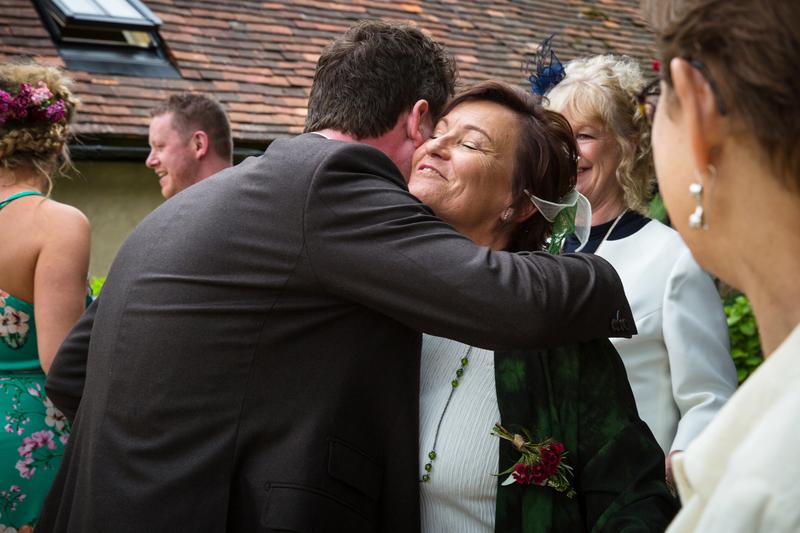 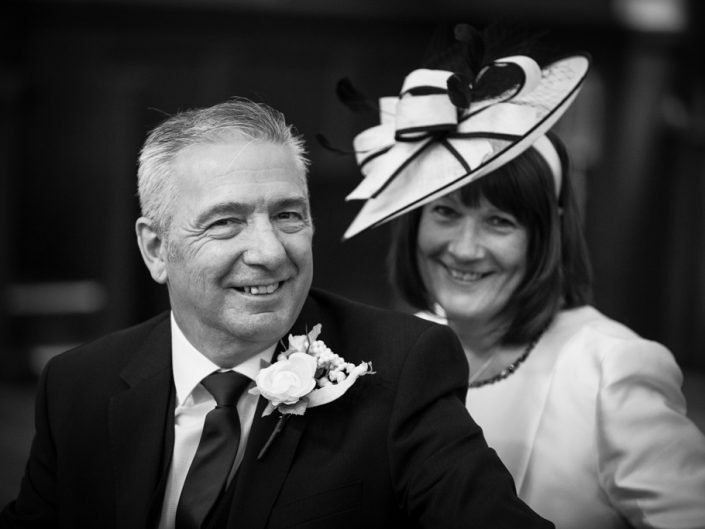 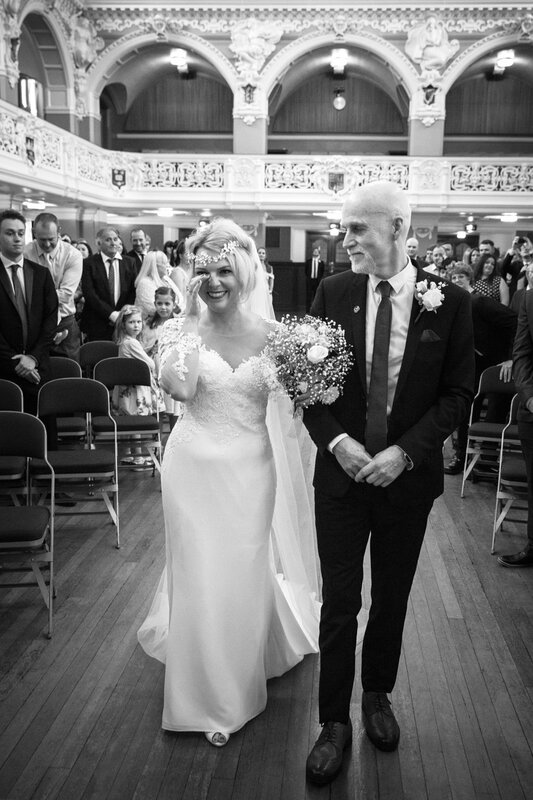 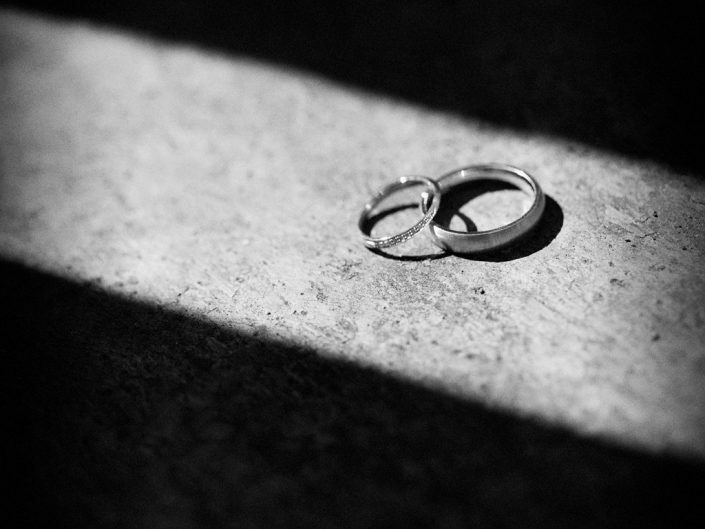 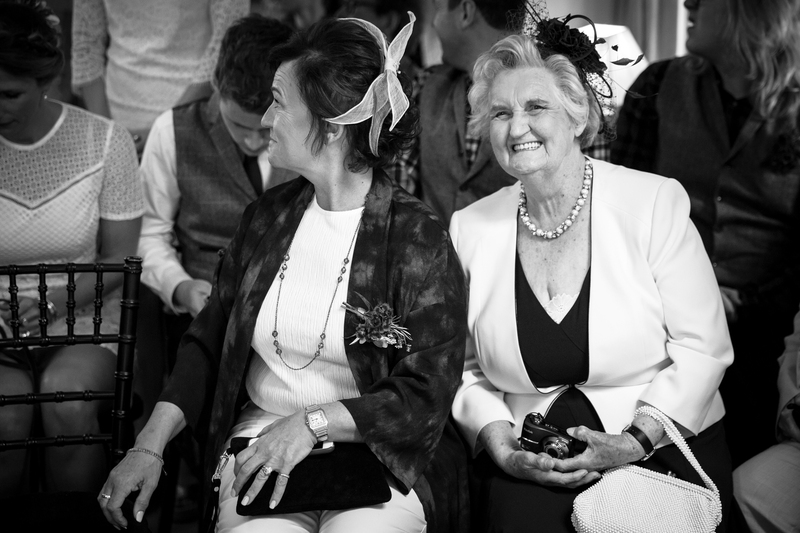 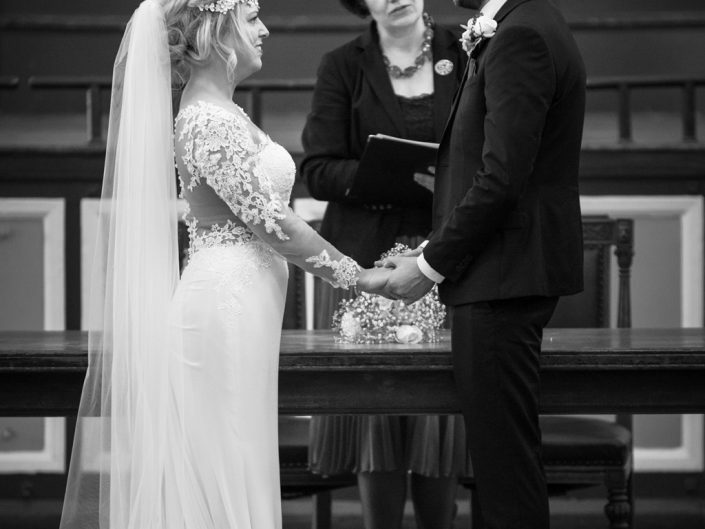 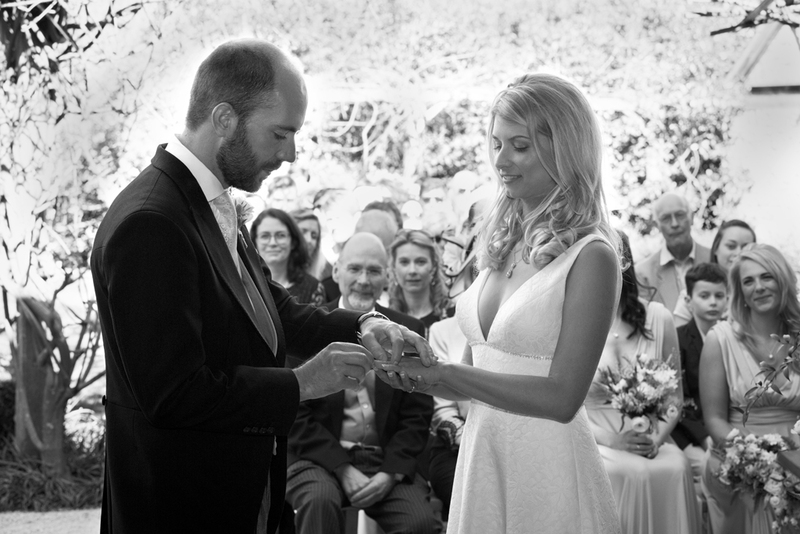 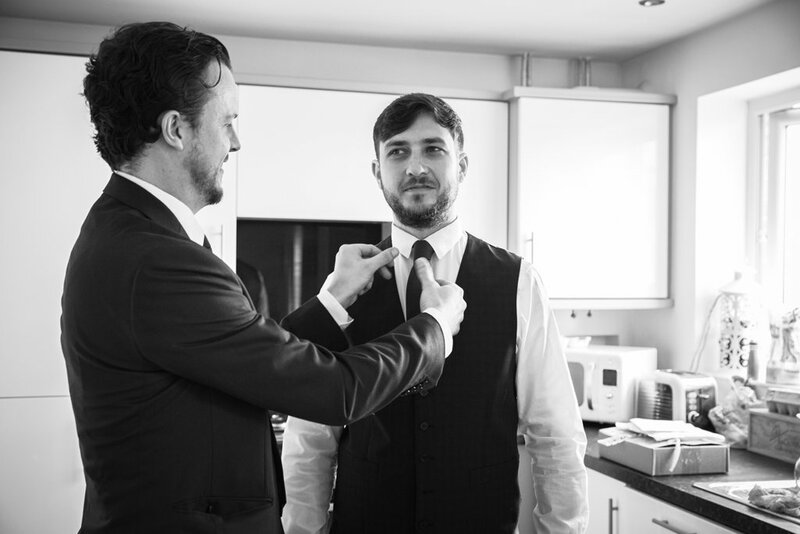 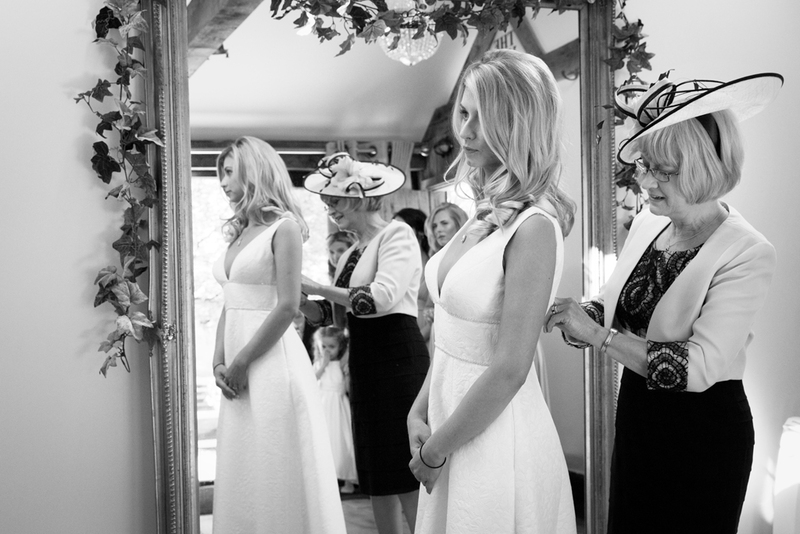 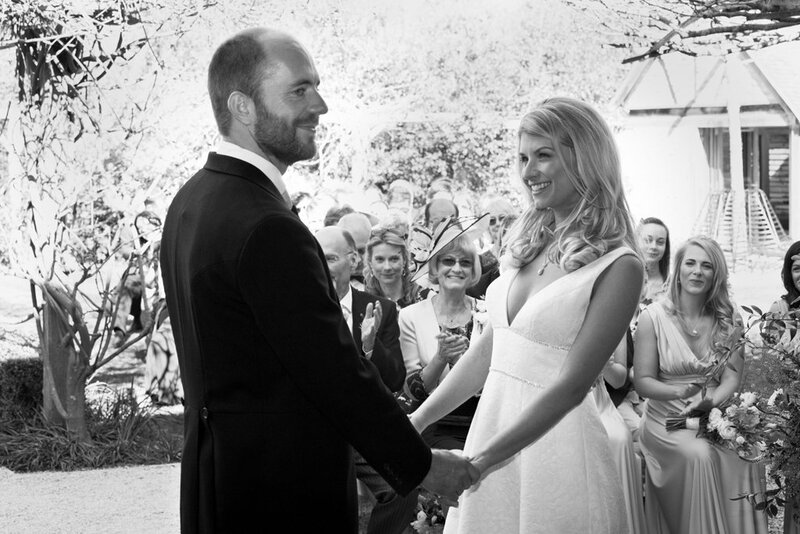 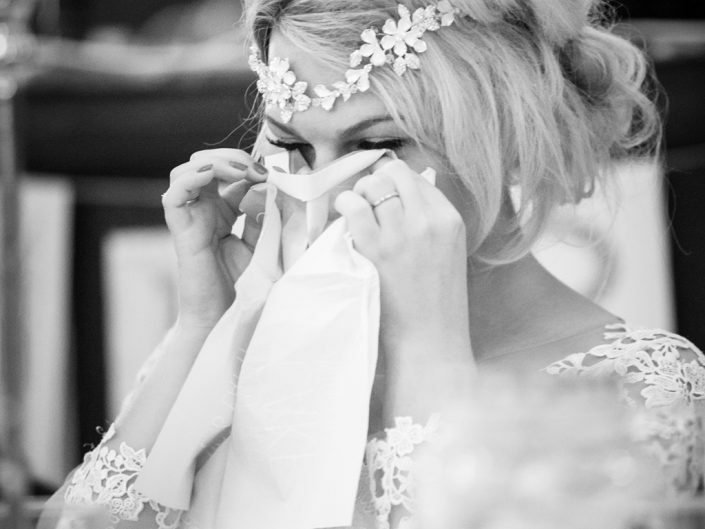 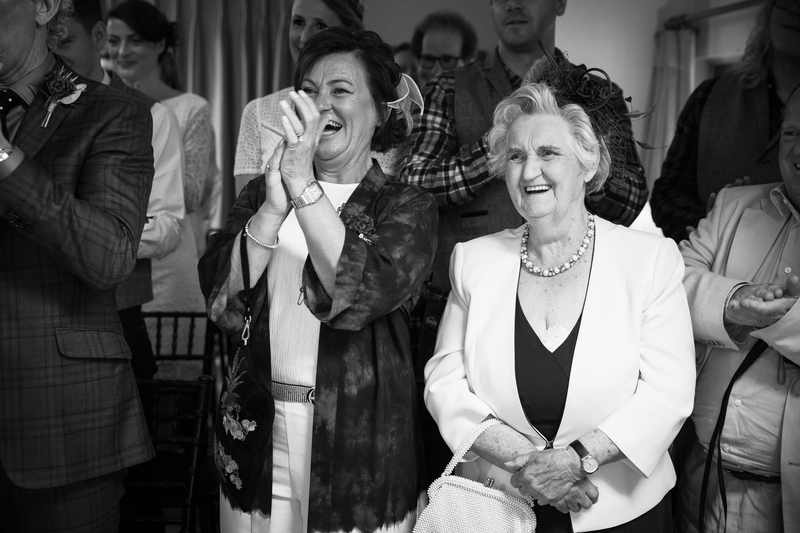 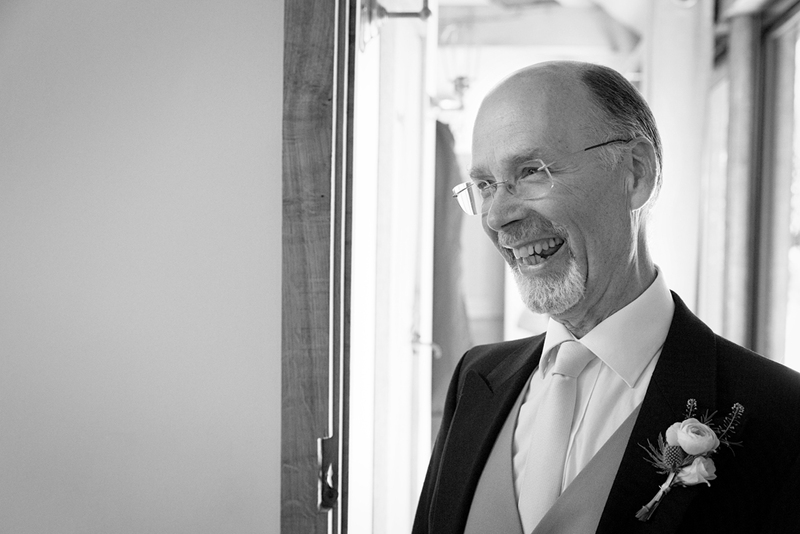 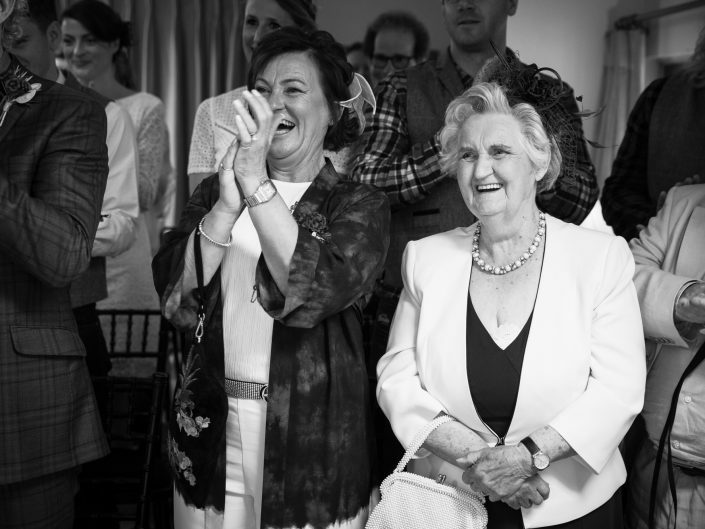 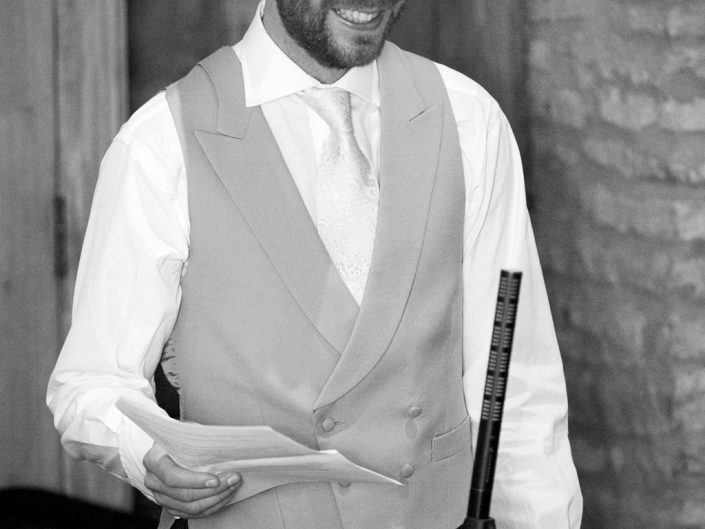 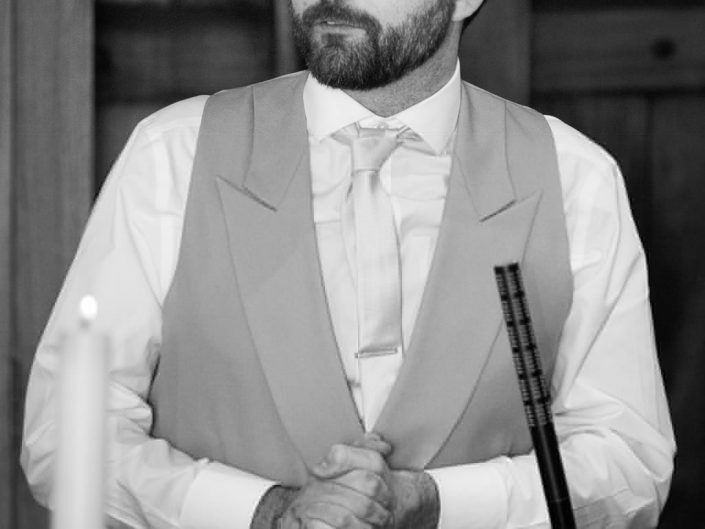 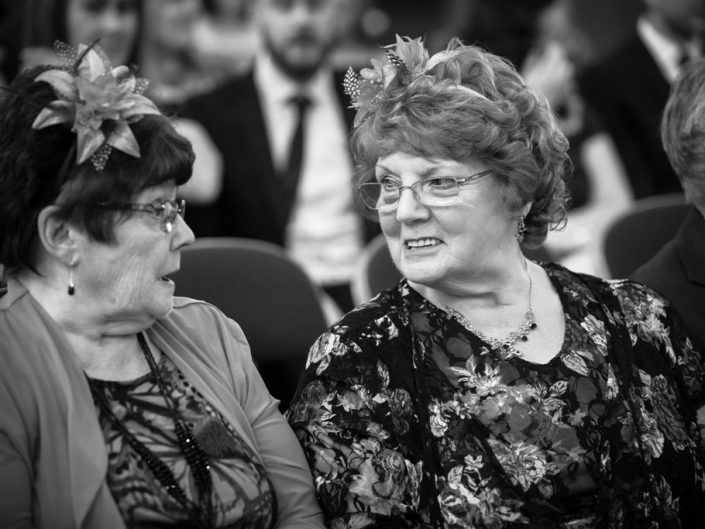 It was a beautiful, emotional service & such a pleasure to photograph two friends getting hitched. 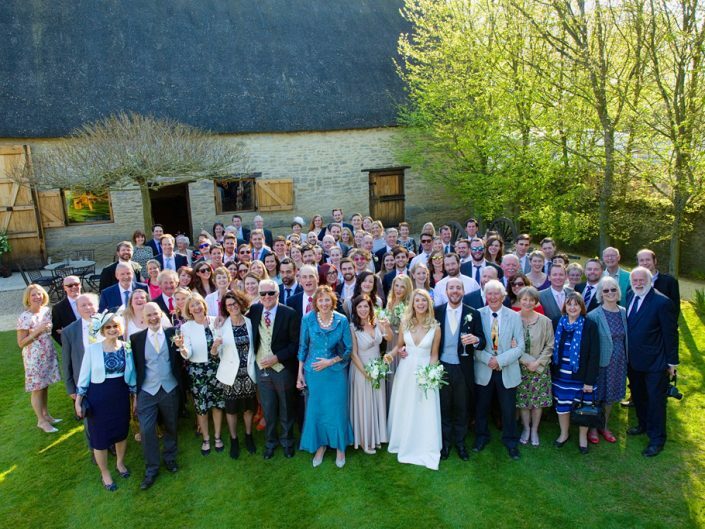 After the service everyone mingled outside in the sunshine & we gathered the groups together for the formal & not so formal group photos. 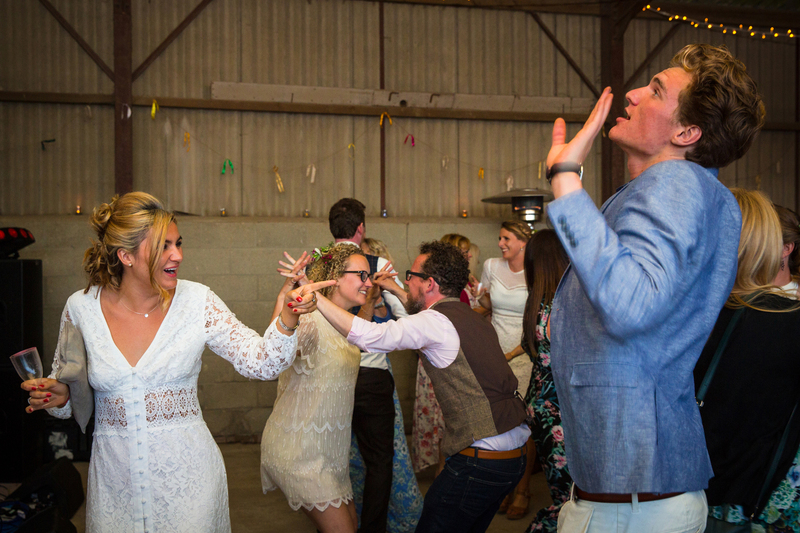 It was then time for the confetti…not just your average confetti though. 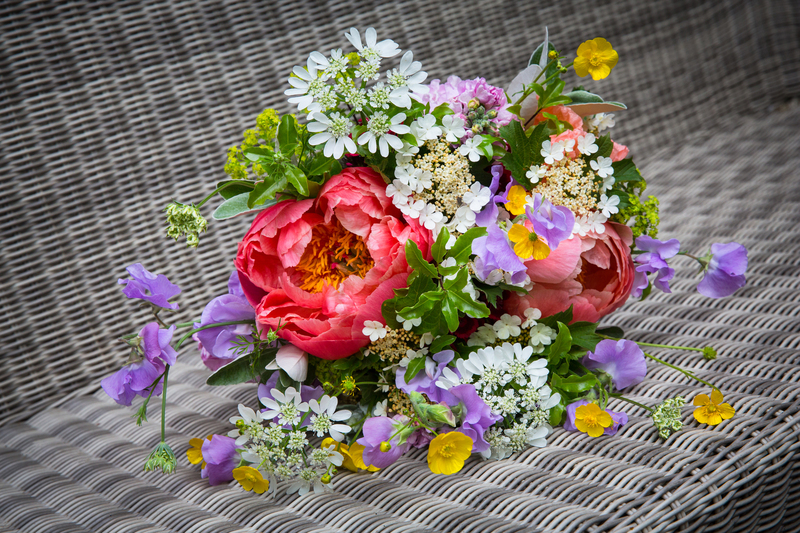 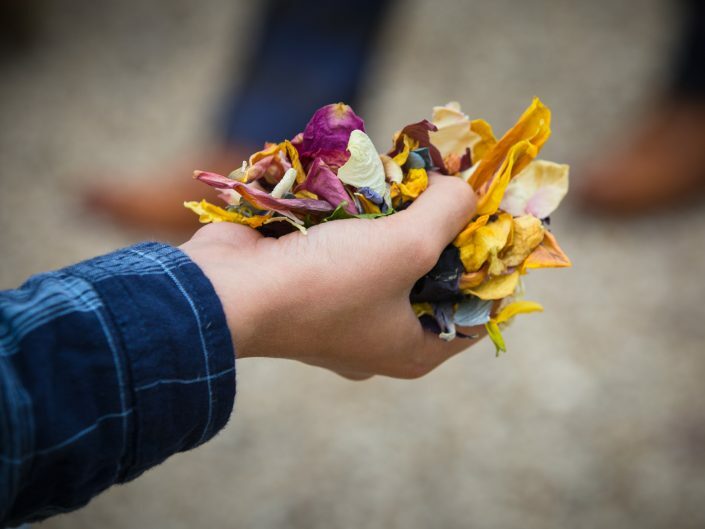 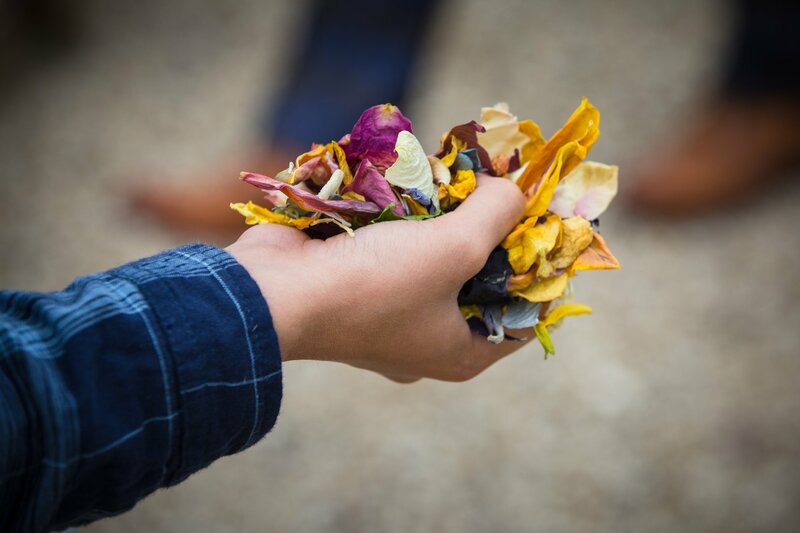 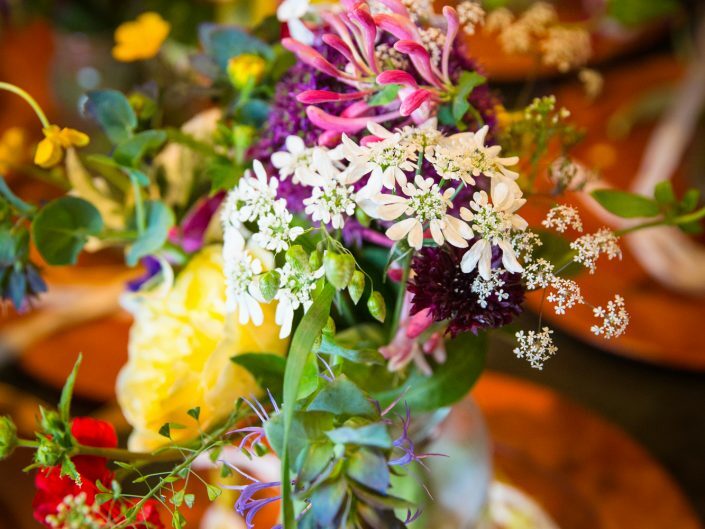 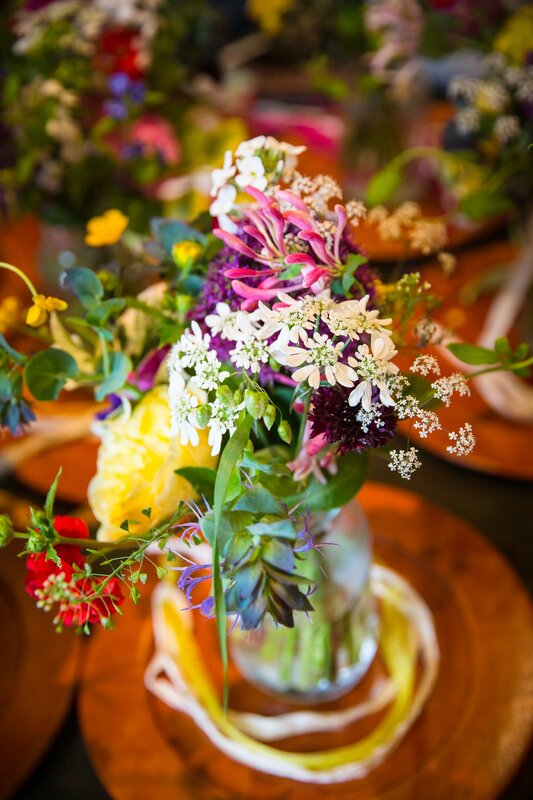 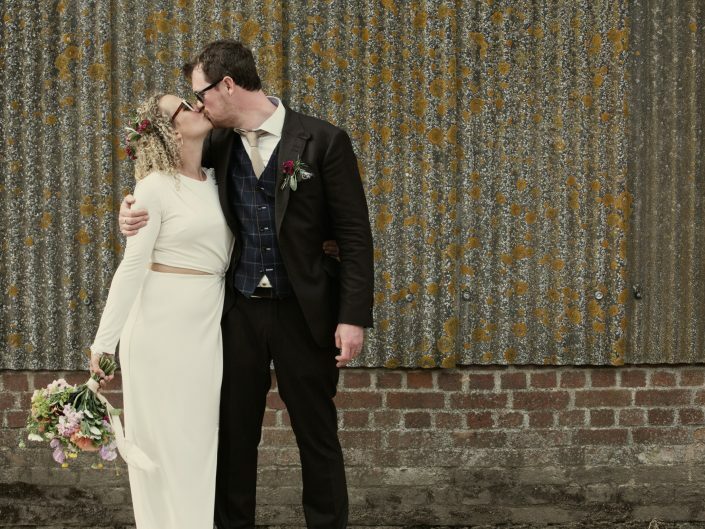 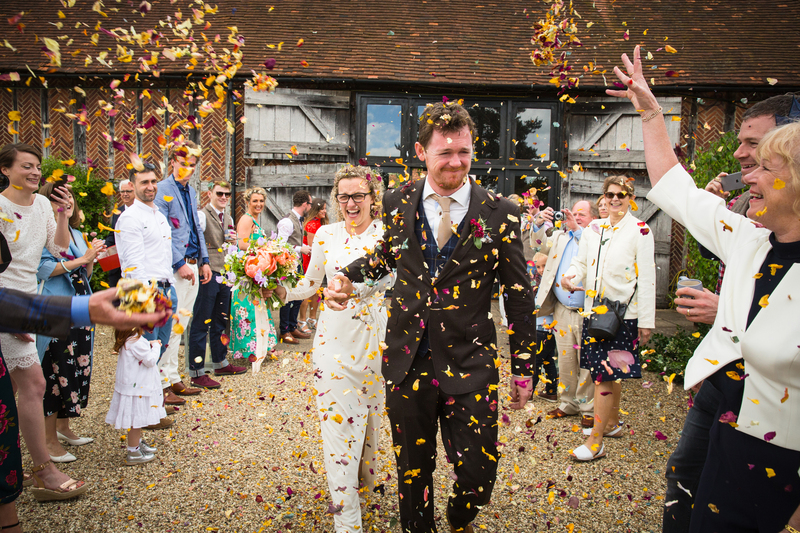 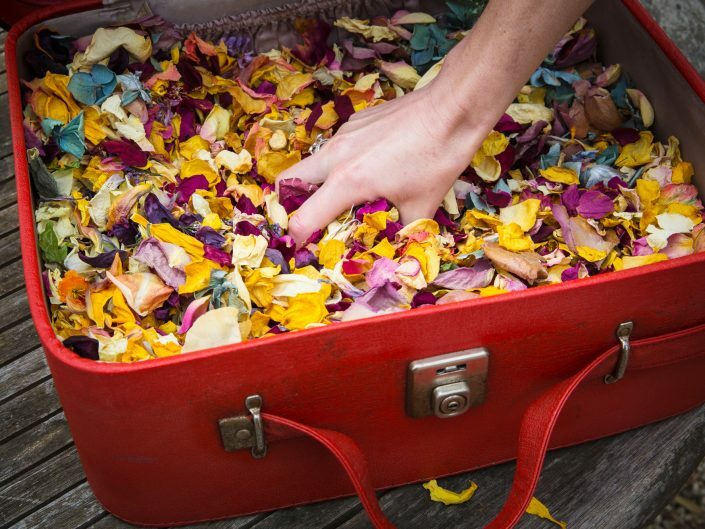 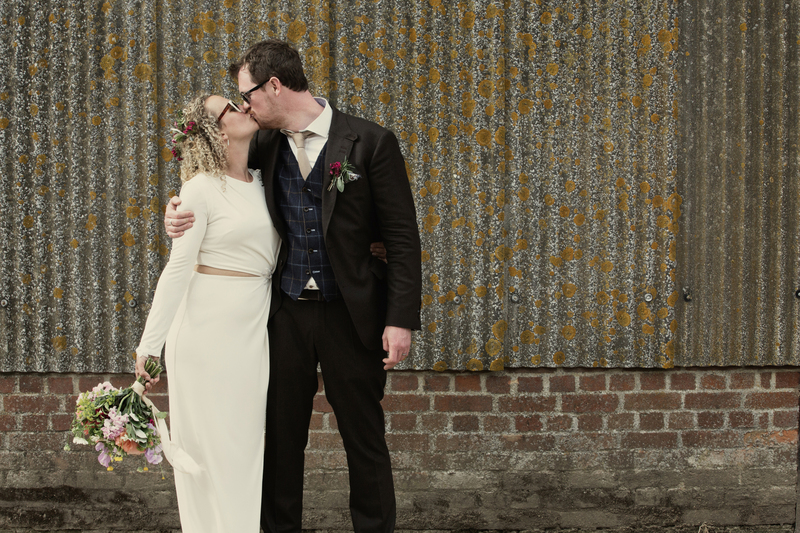 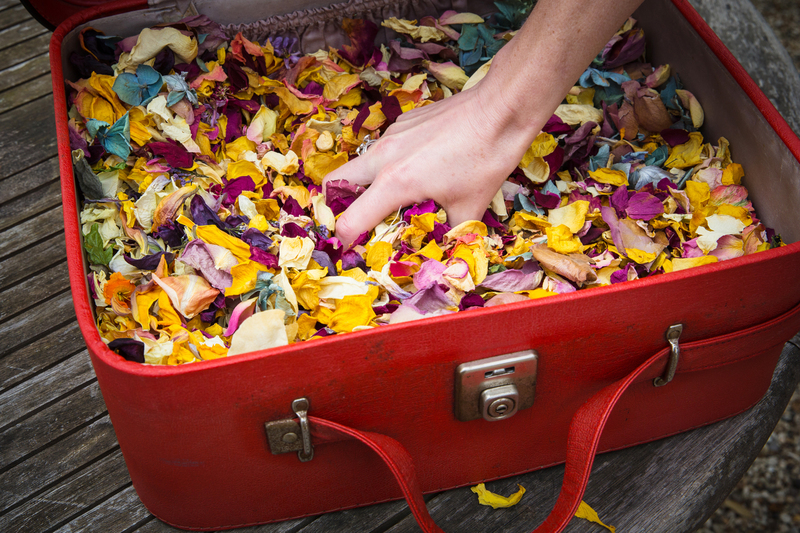 Eilidh & Andrew had made their own confetti with the flowers & blooms from their own garden. 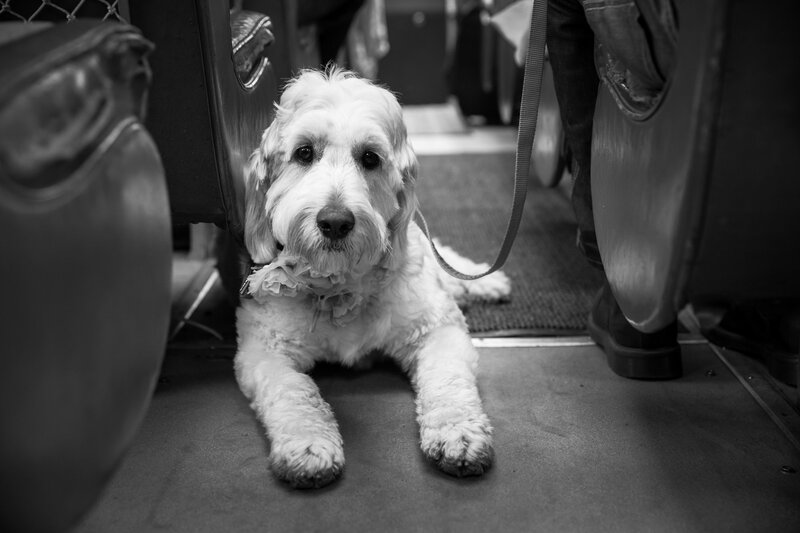 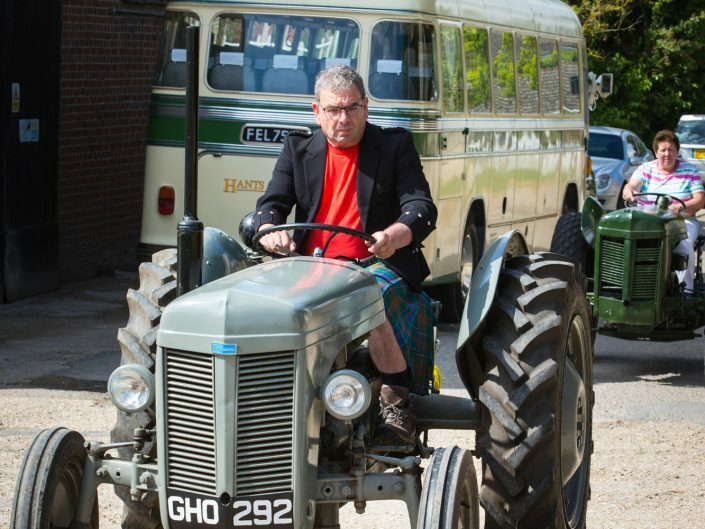 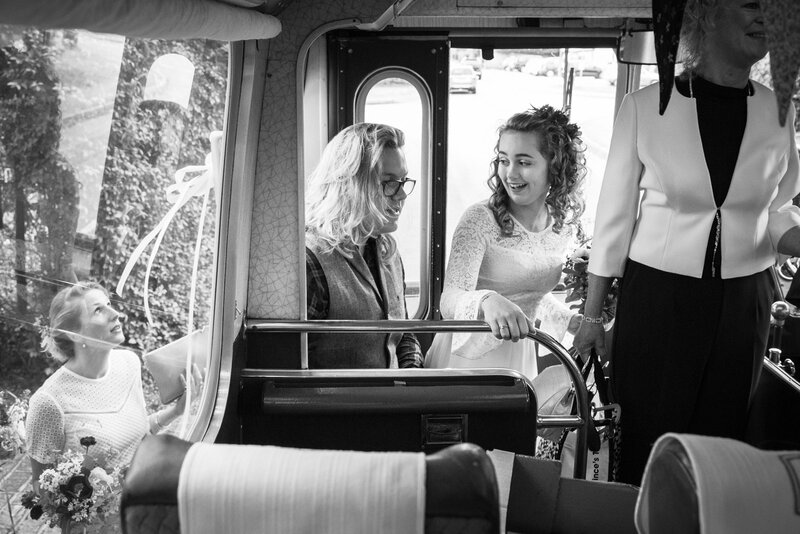 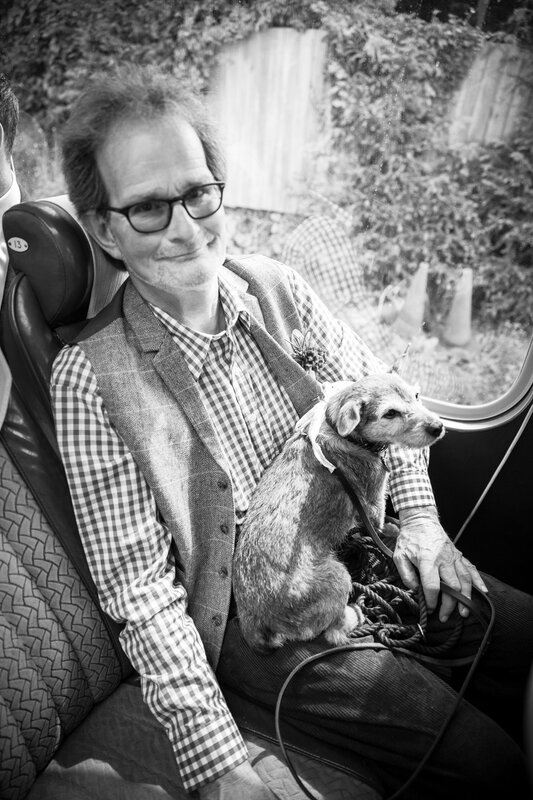 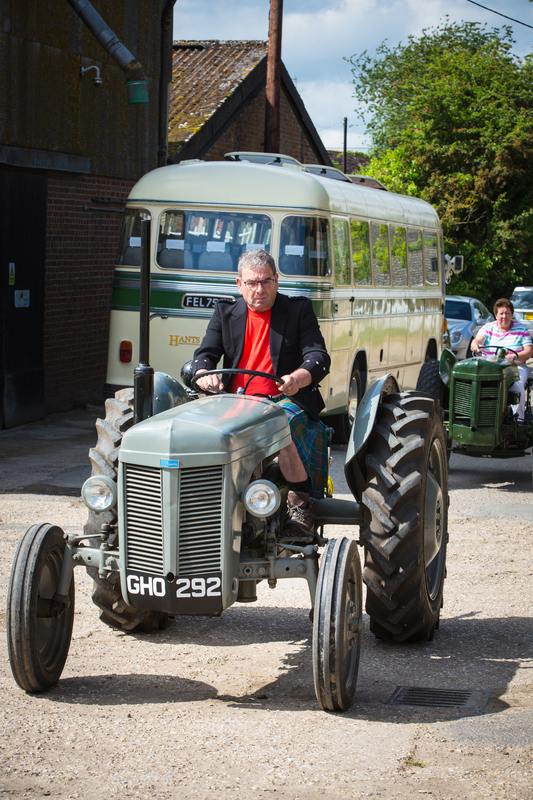 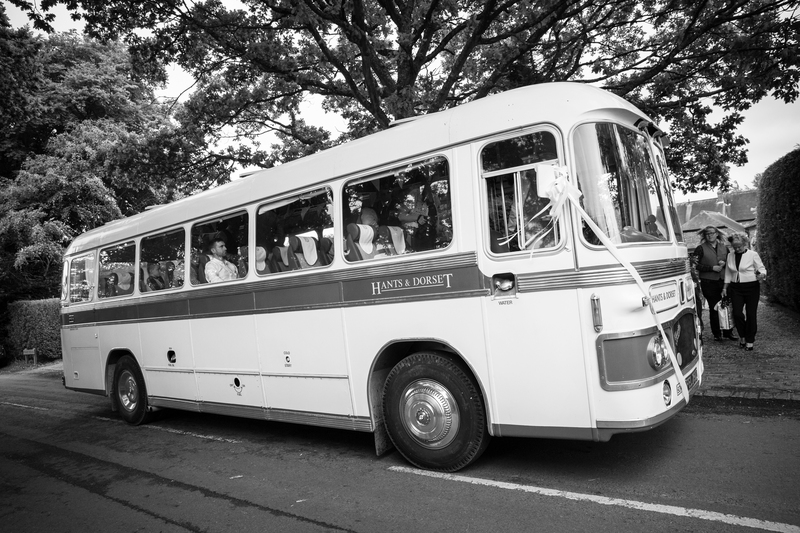 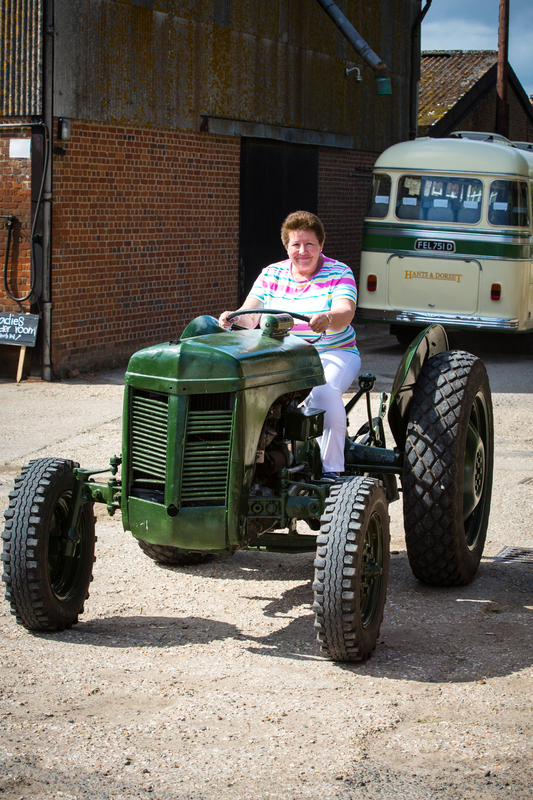 They made their way by to the farm by car with their friends & family following in the vintage coach. 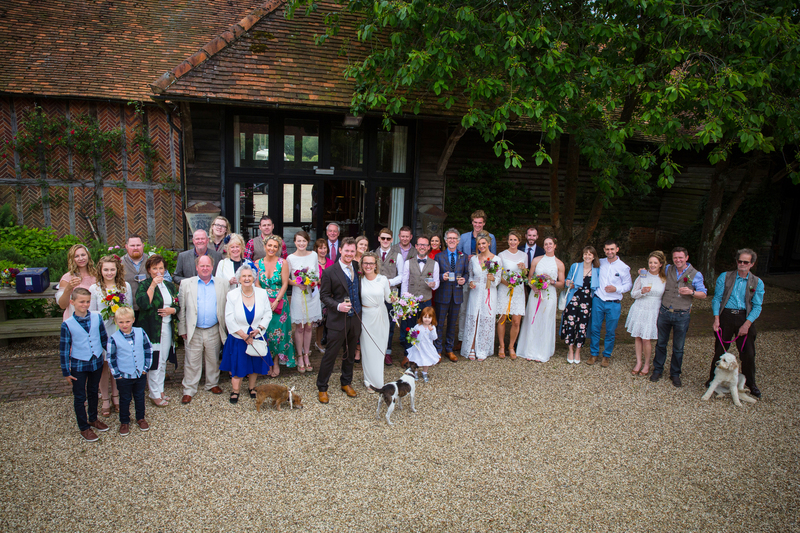 At the farm many more guests who had been invited to help them celebrate their wedding joined them for the party. 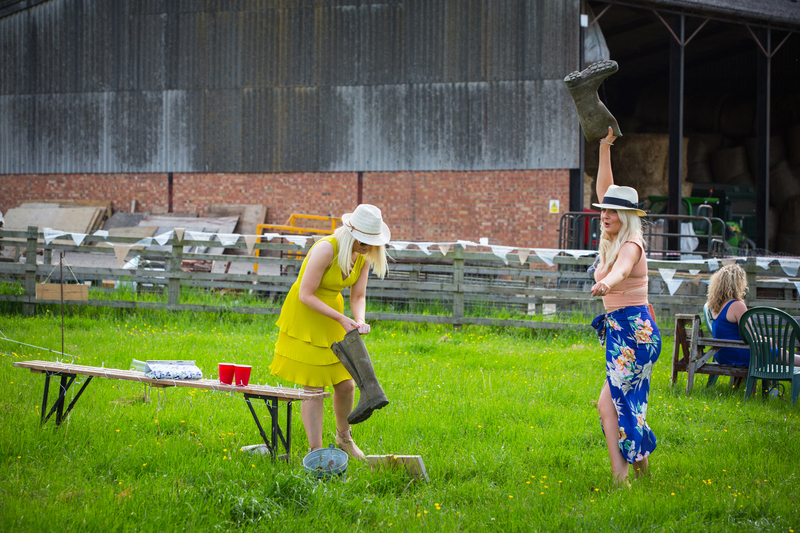 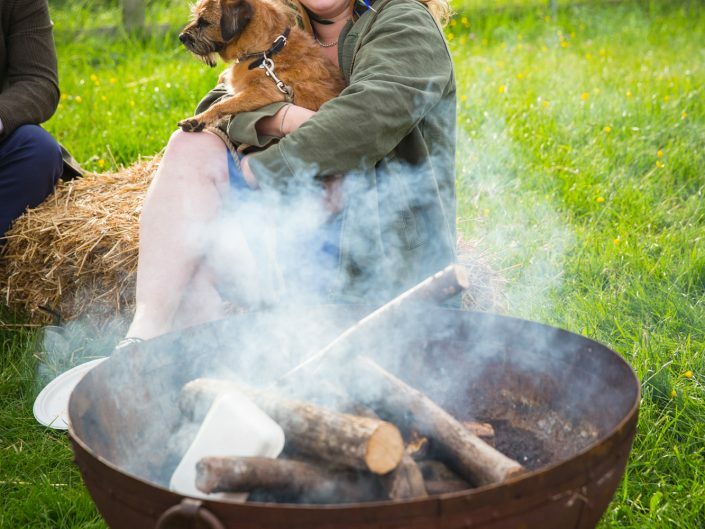 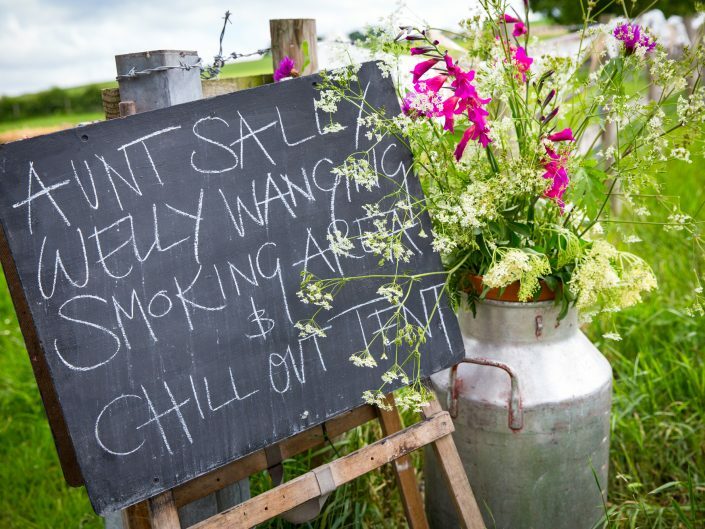 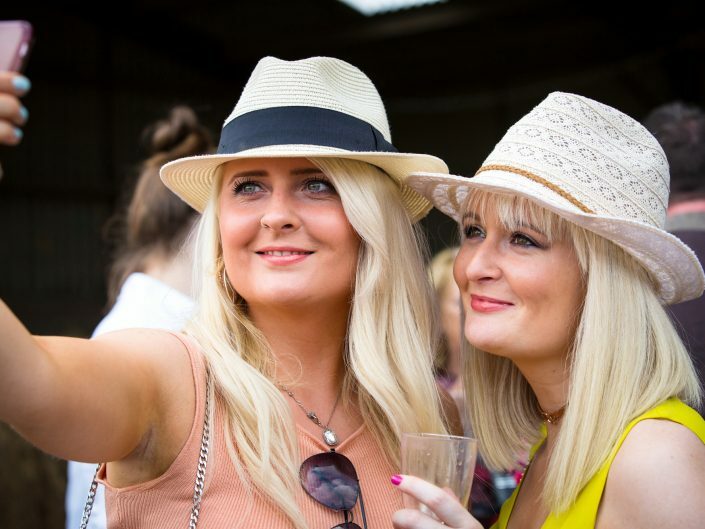 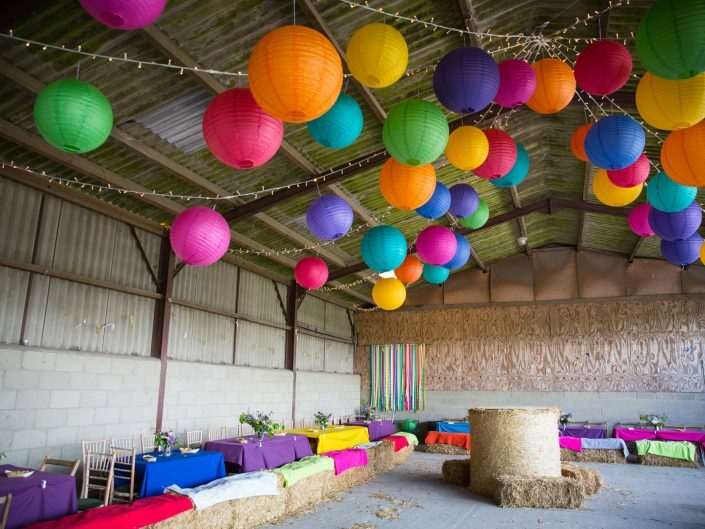 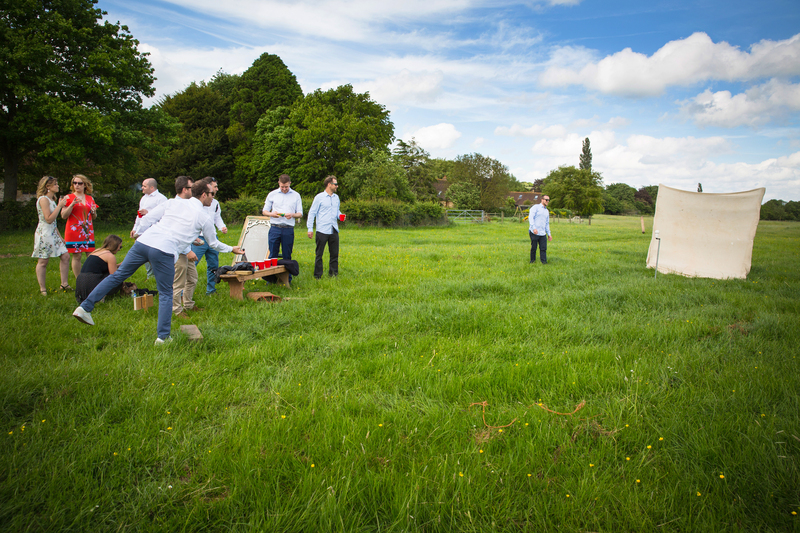 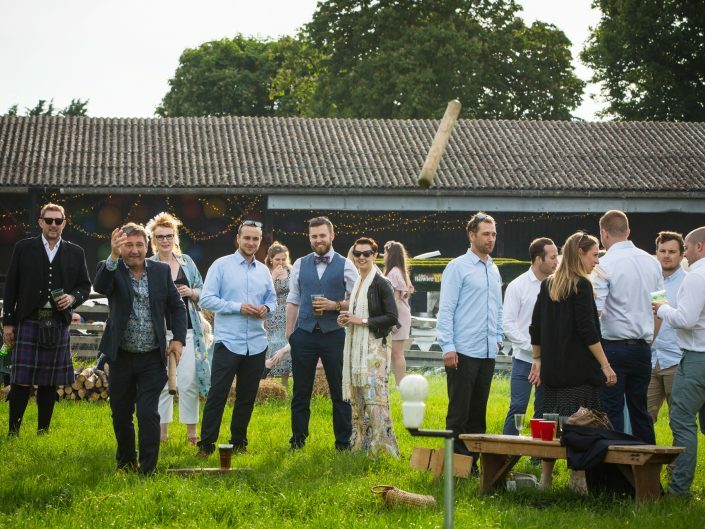 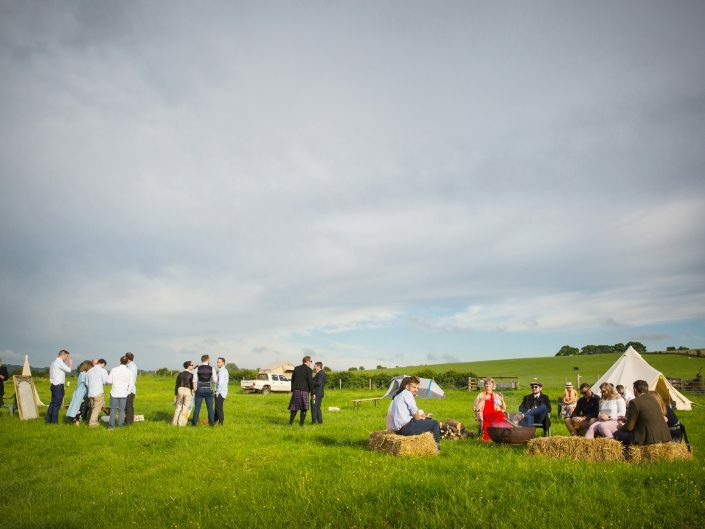 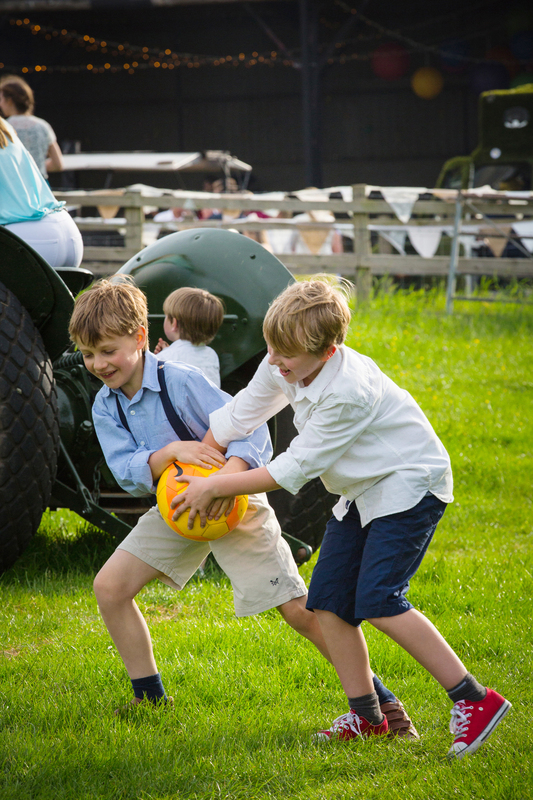 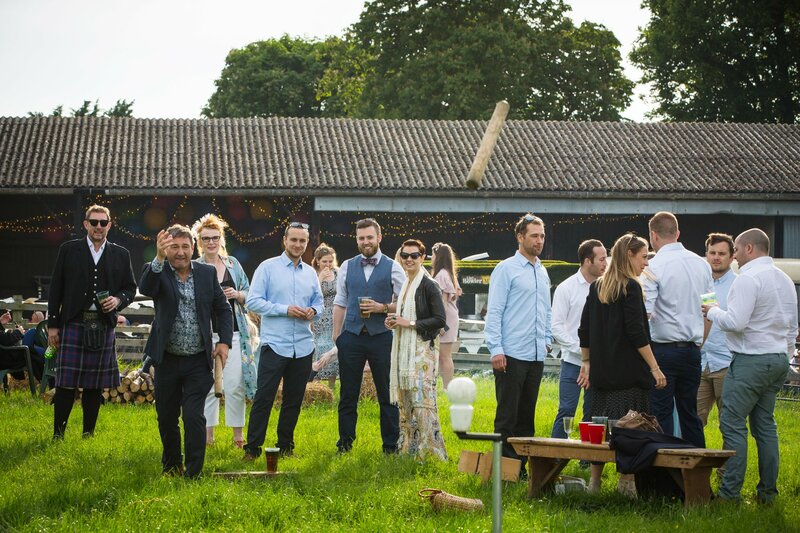 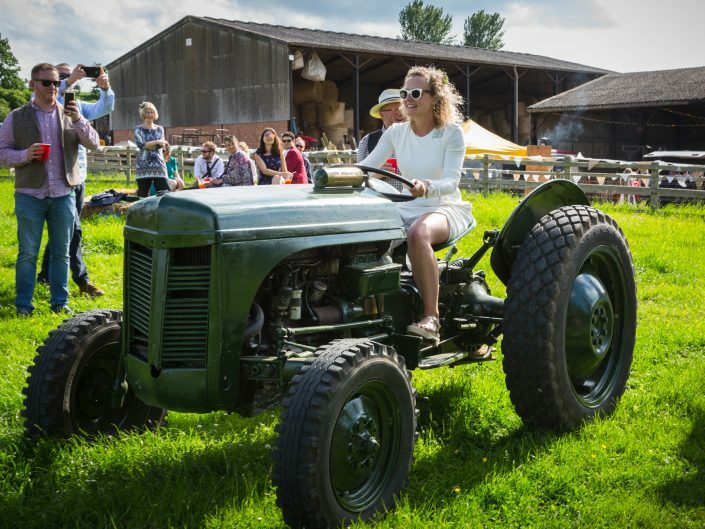 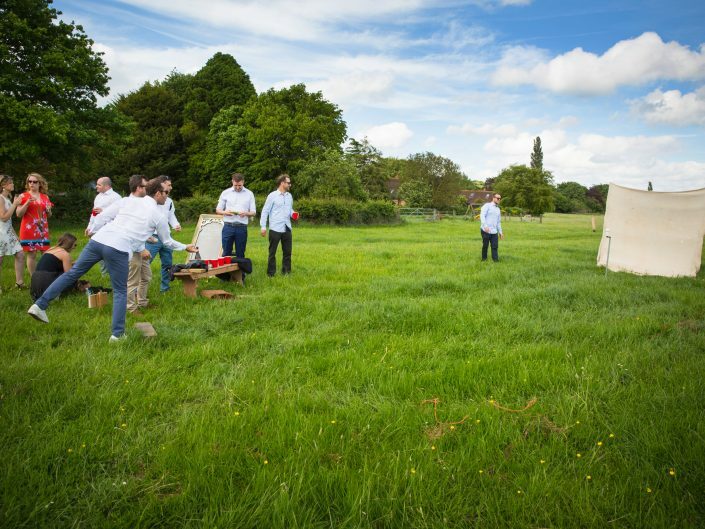 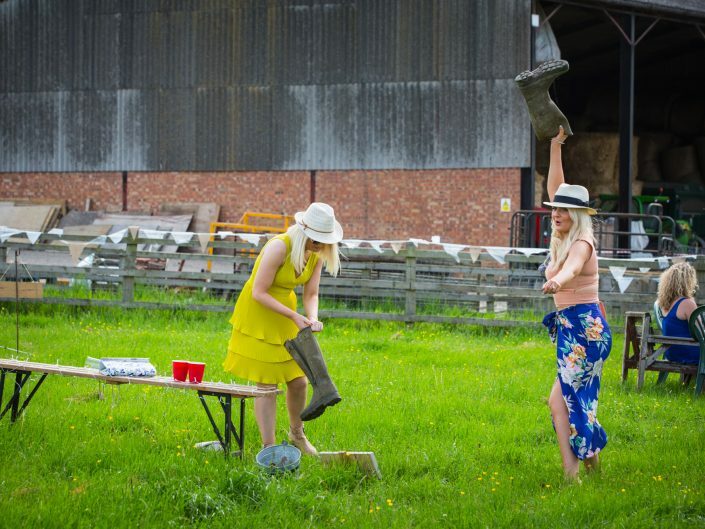 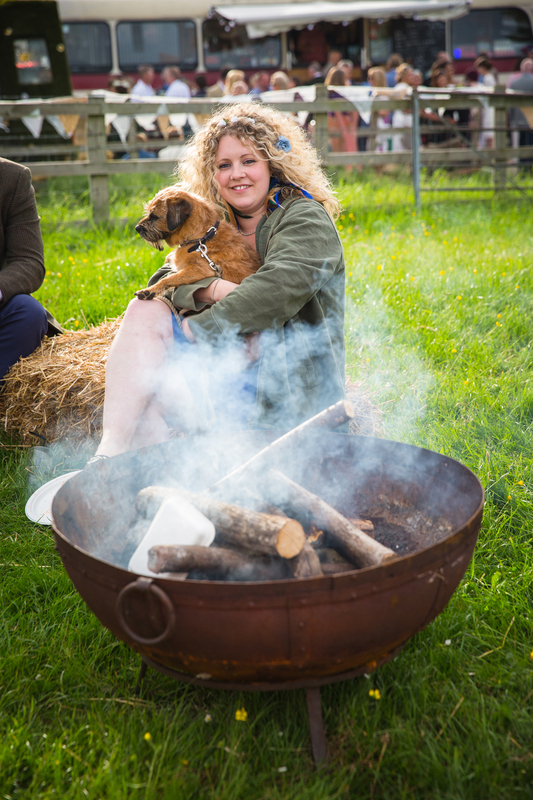 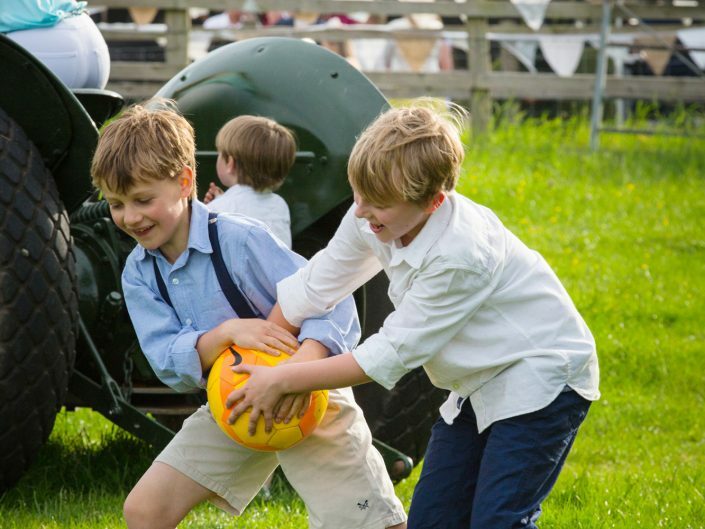 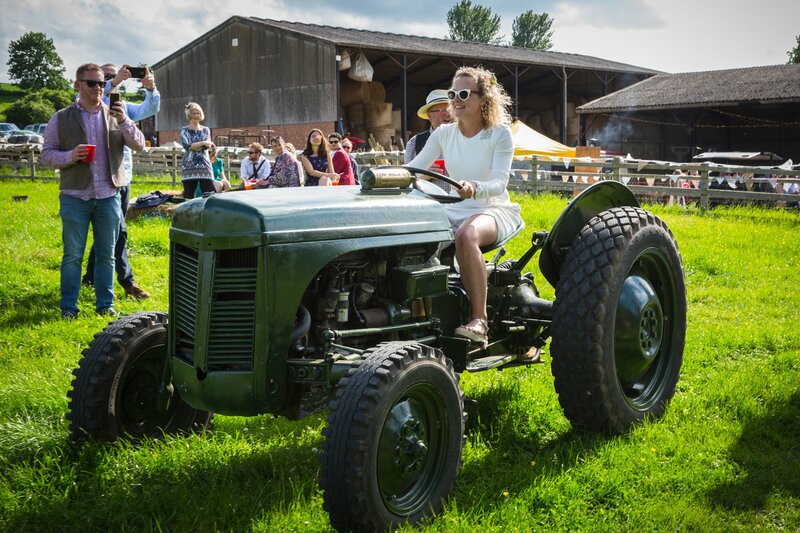 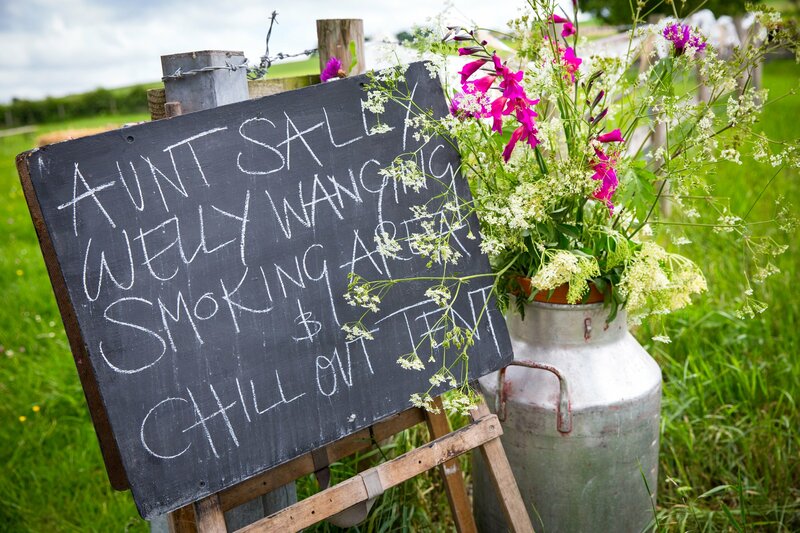 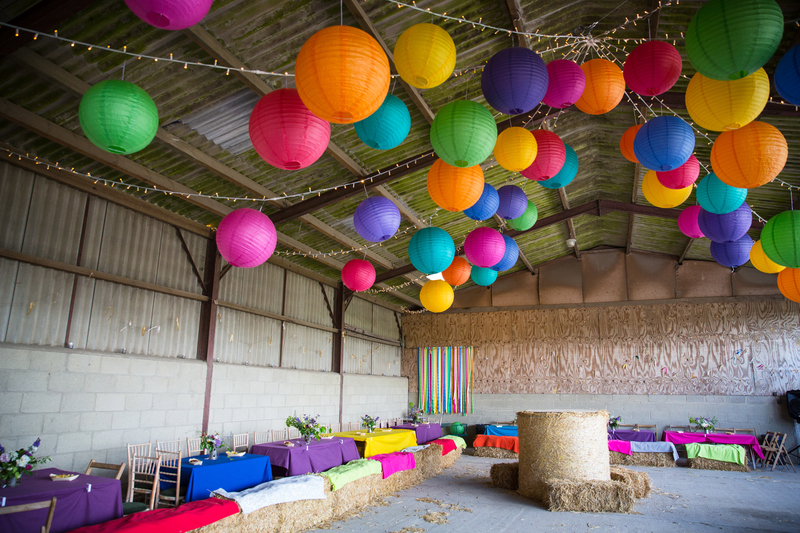 The farm looked fabulous as it was bathed in sunlight, they had set up a games & chillout area with the traditional games Aunt Sally & Welly Wanging. 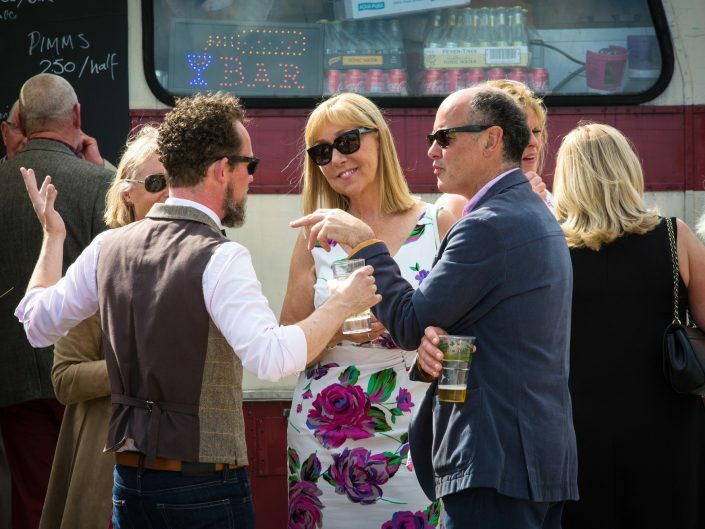 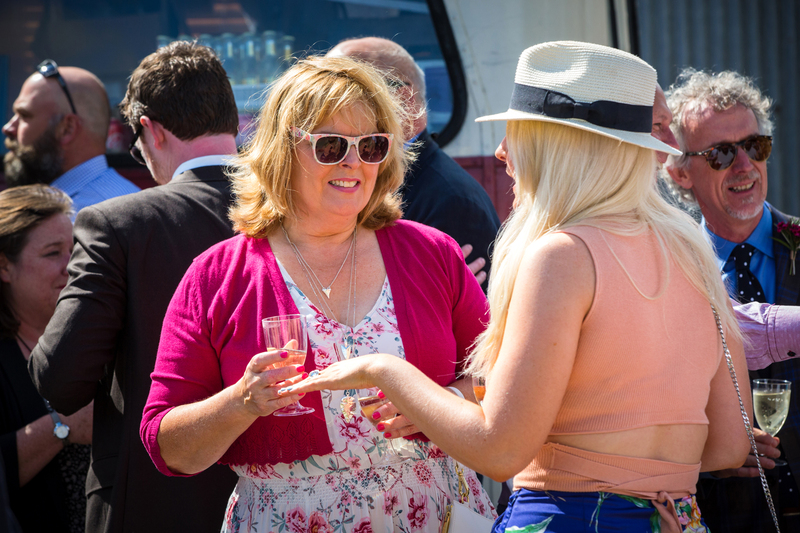 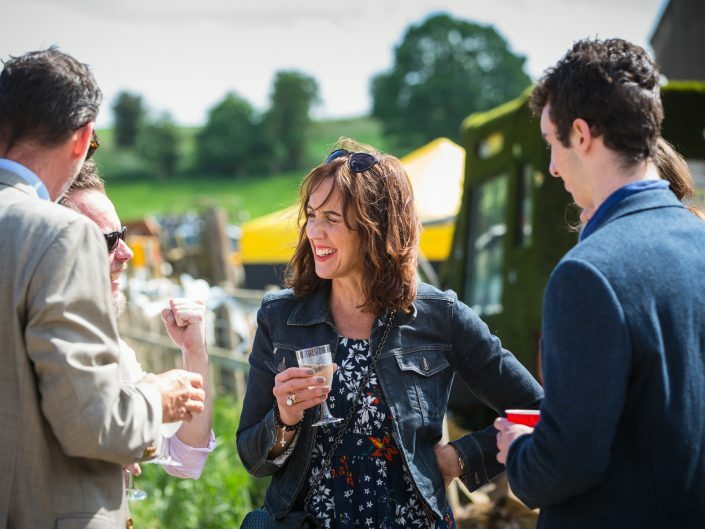 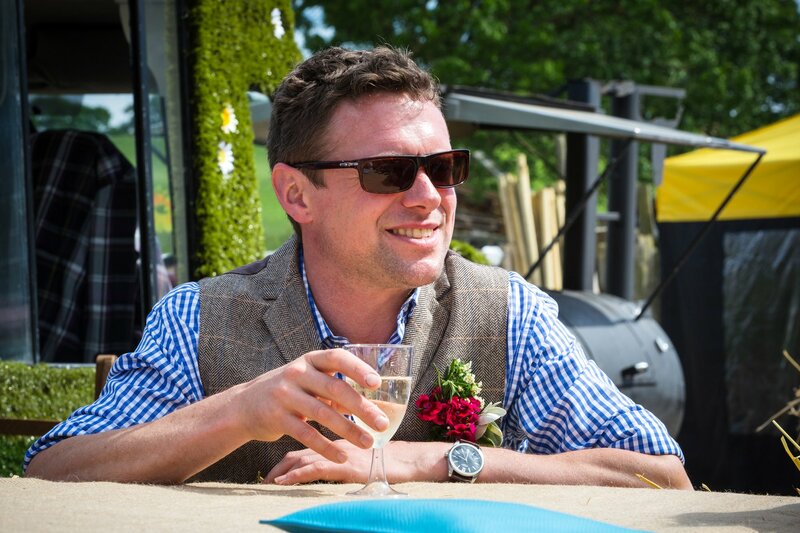 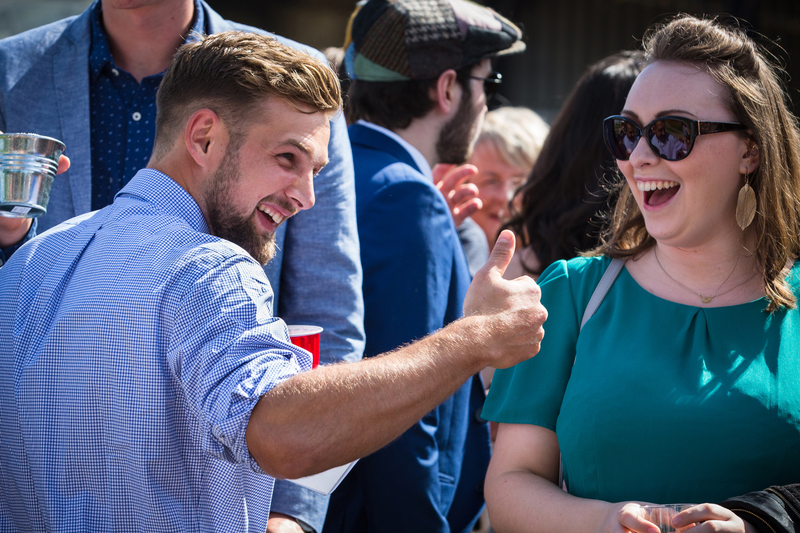 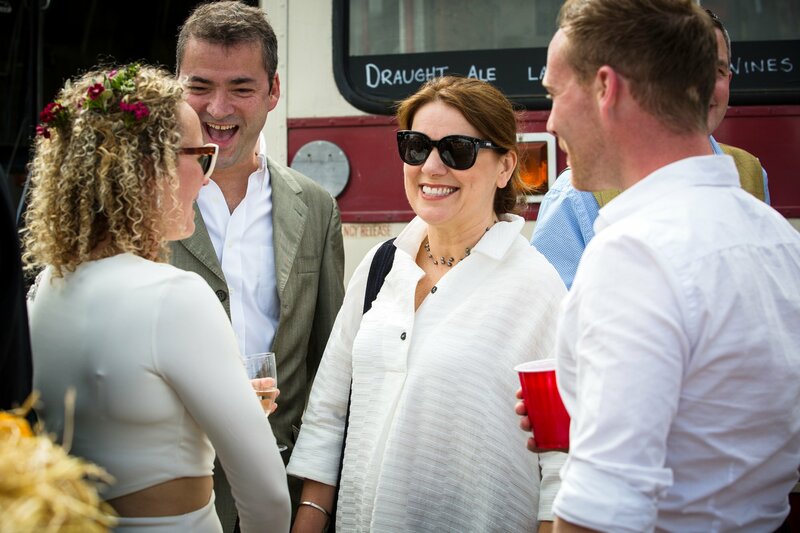 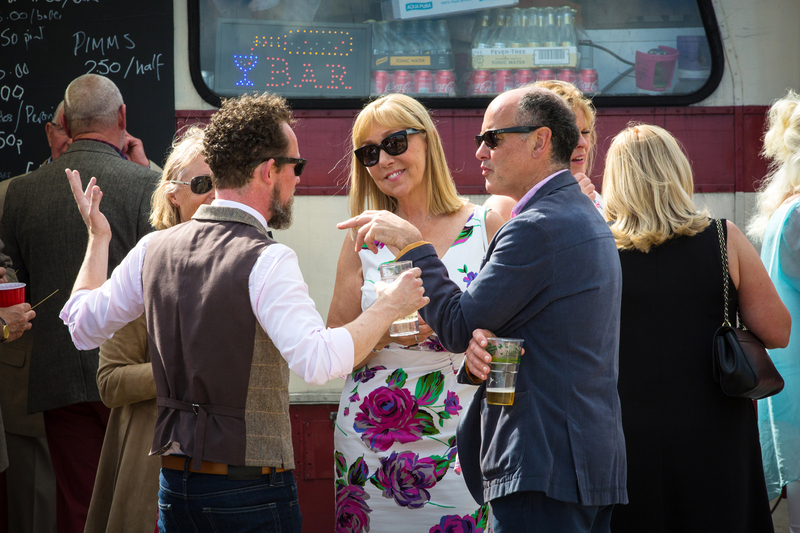 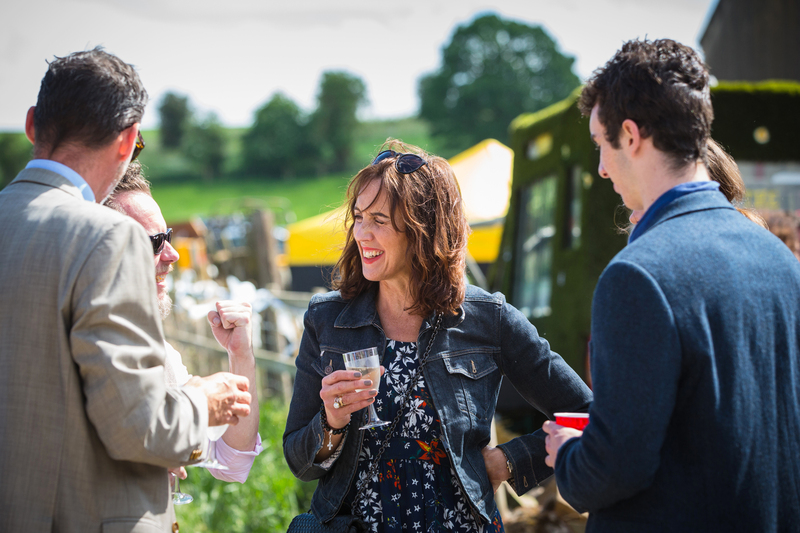 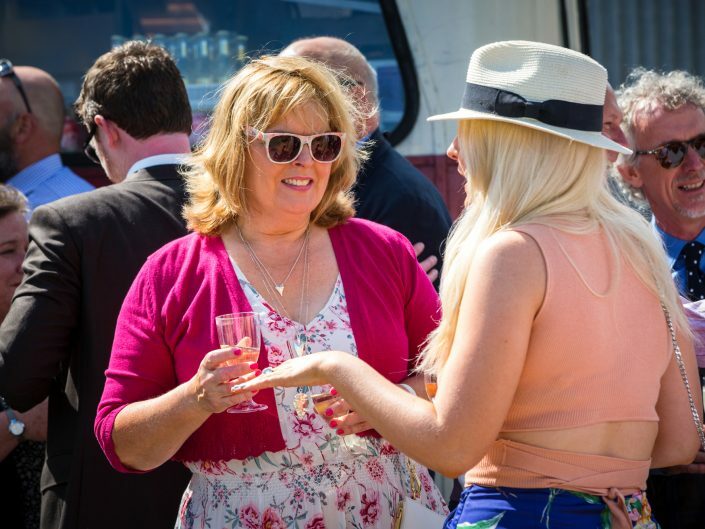 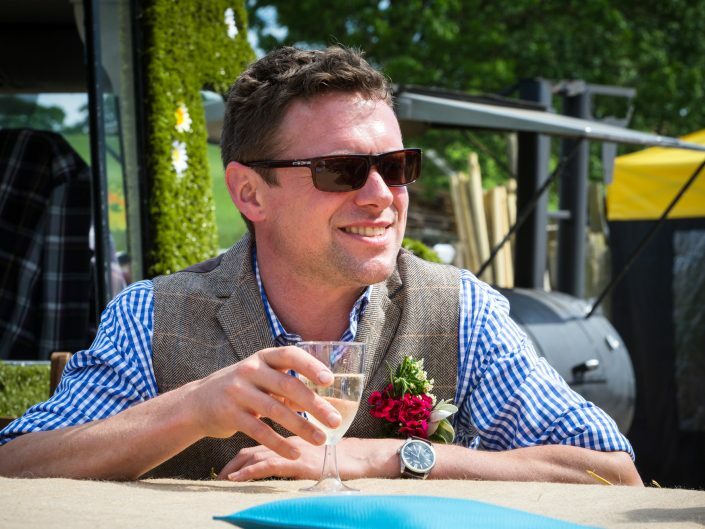 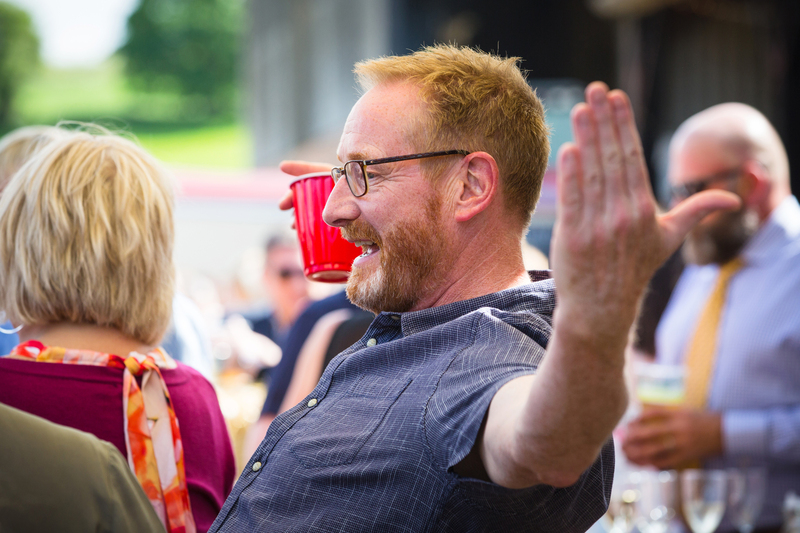 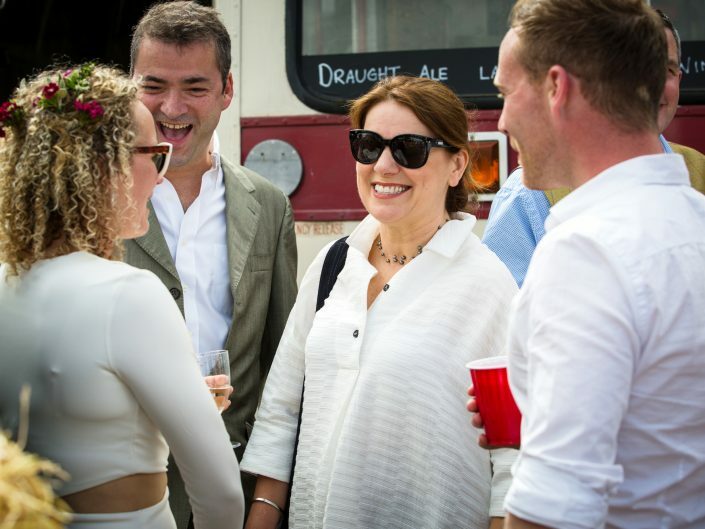 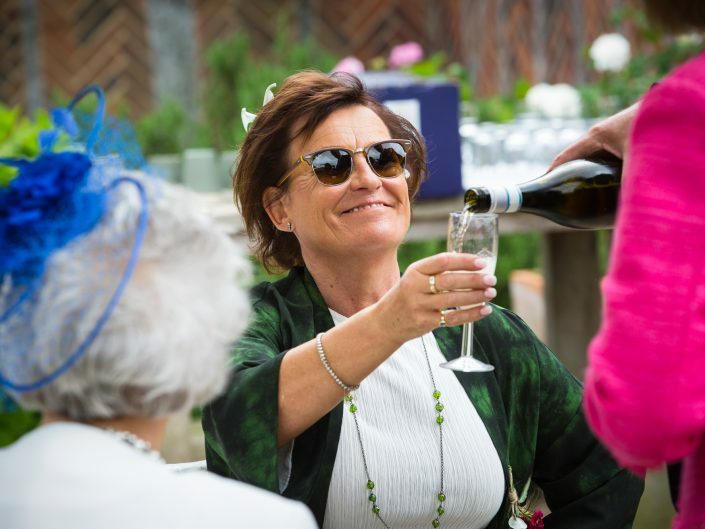 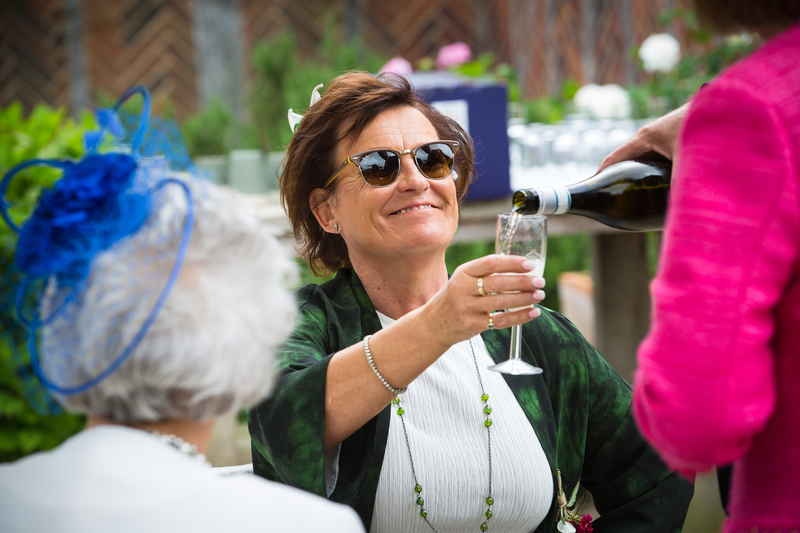 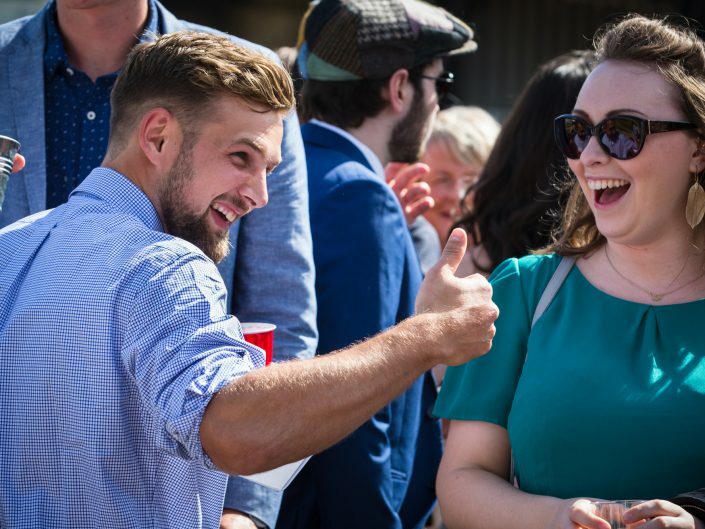 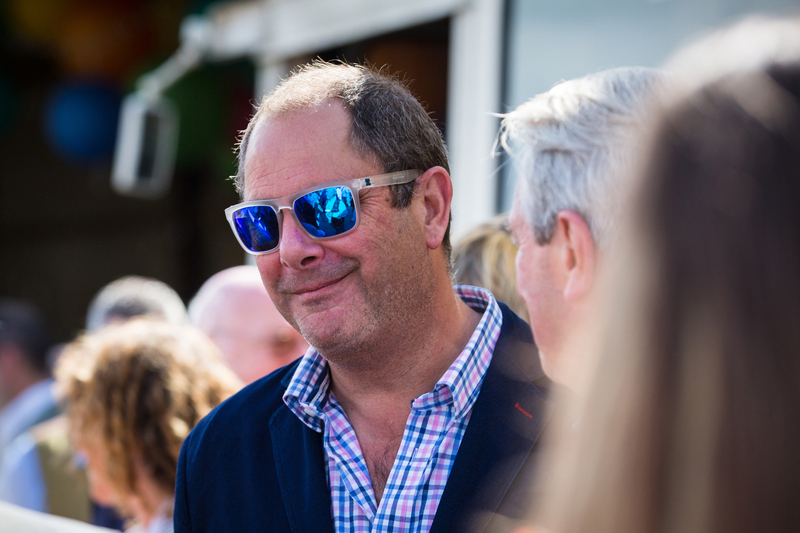 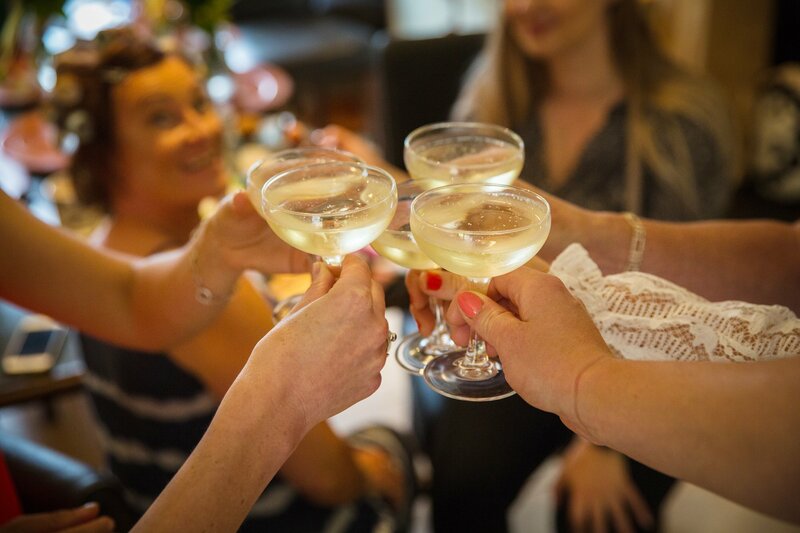 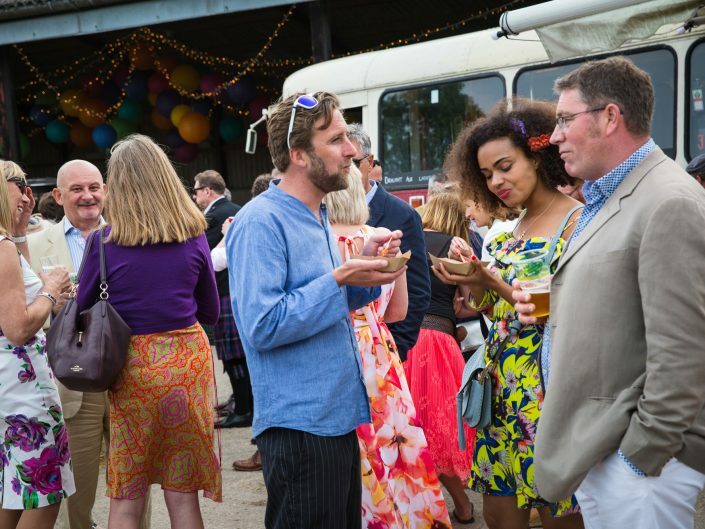 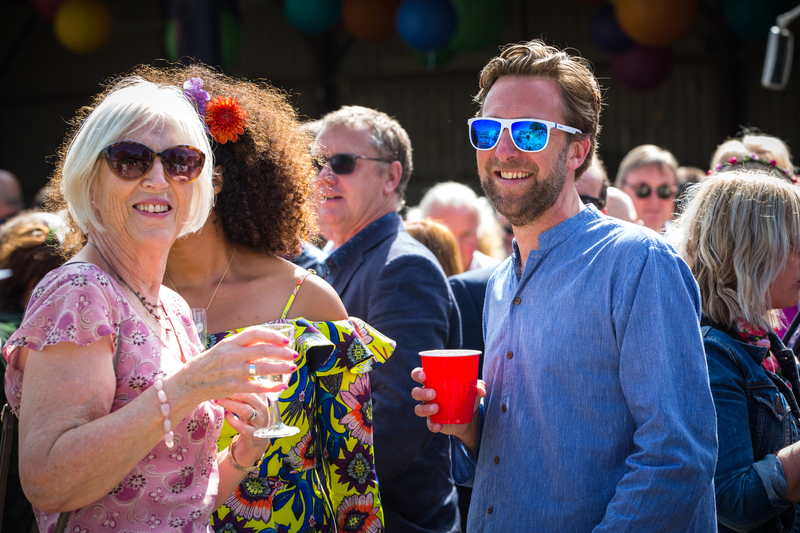 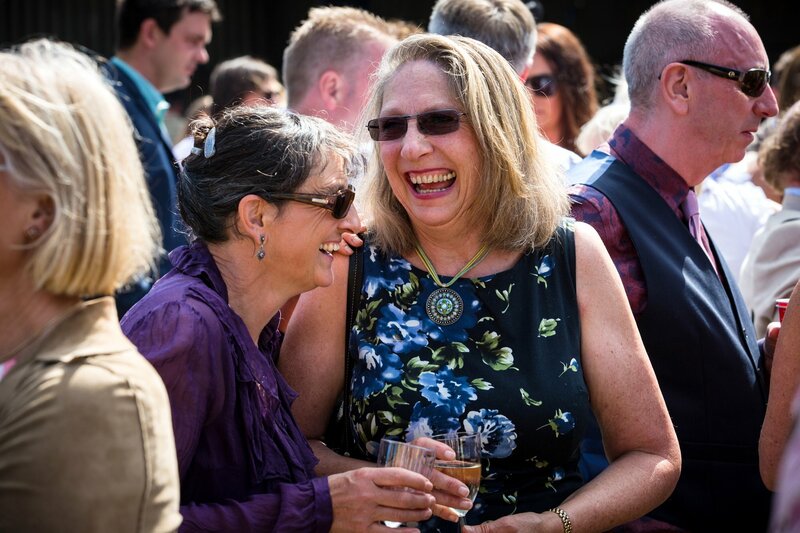 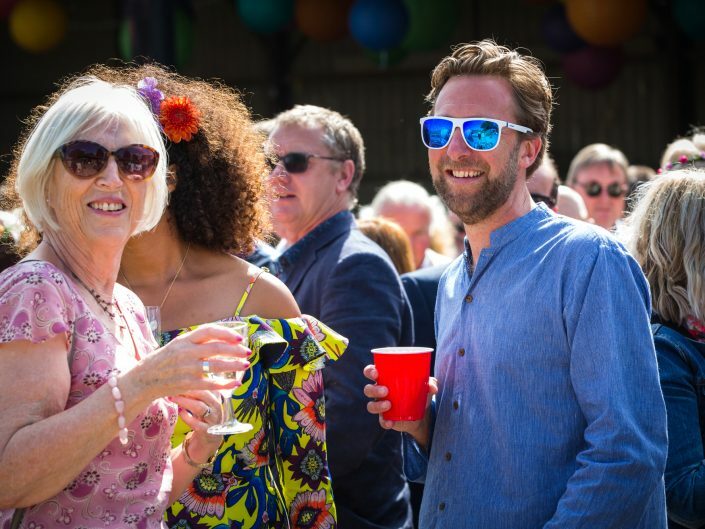 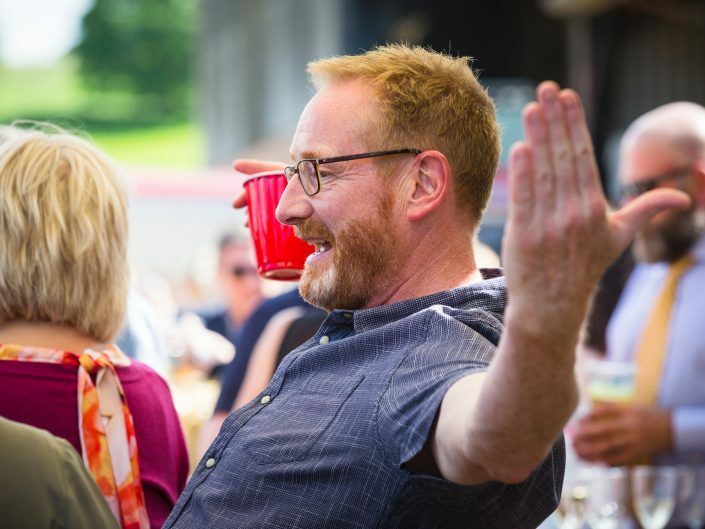 Guests gathered, enjoying a drink or two in the sunshine with the most delicious canapés from Valley Events. 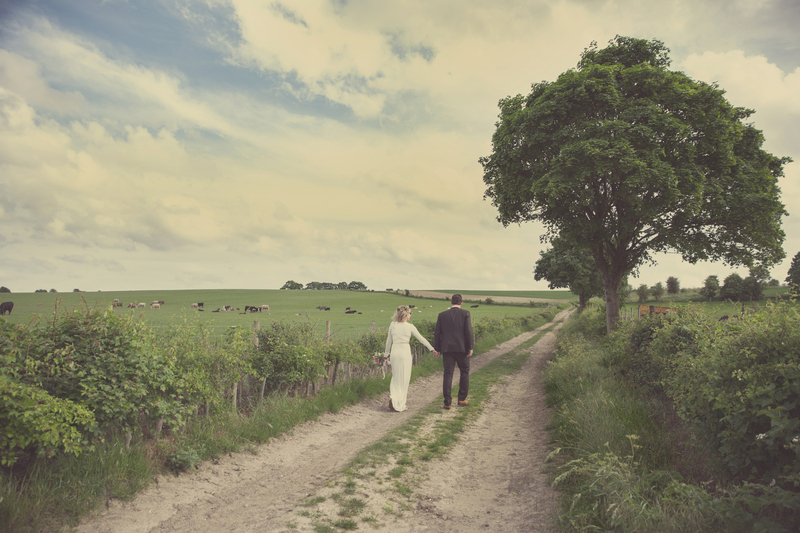 As the guests mingled we took the couple away for some shots of the two of them on & around the farm. 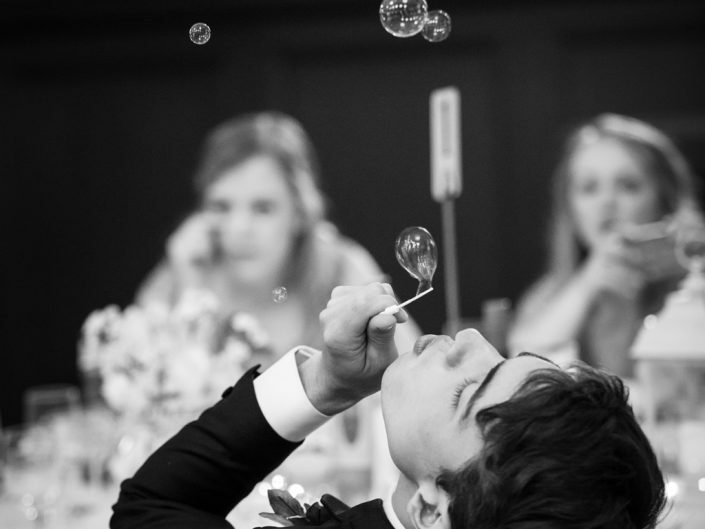 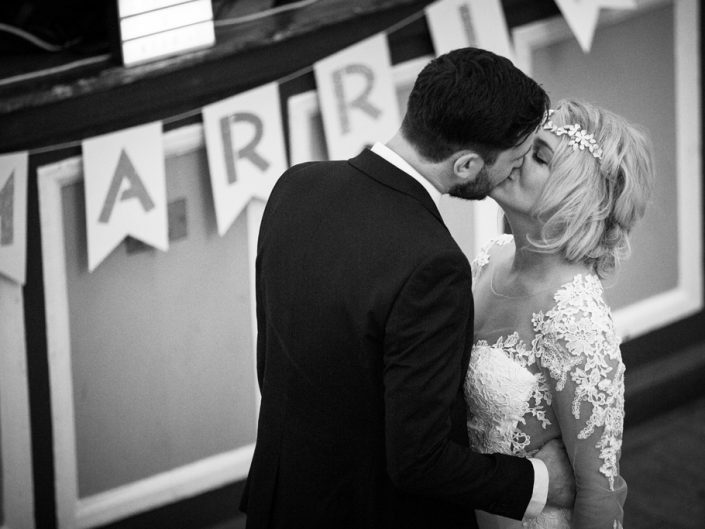 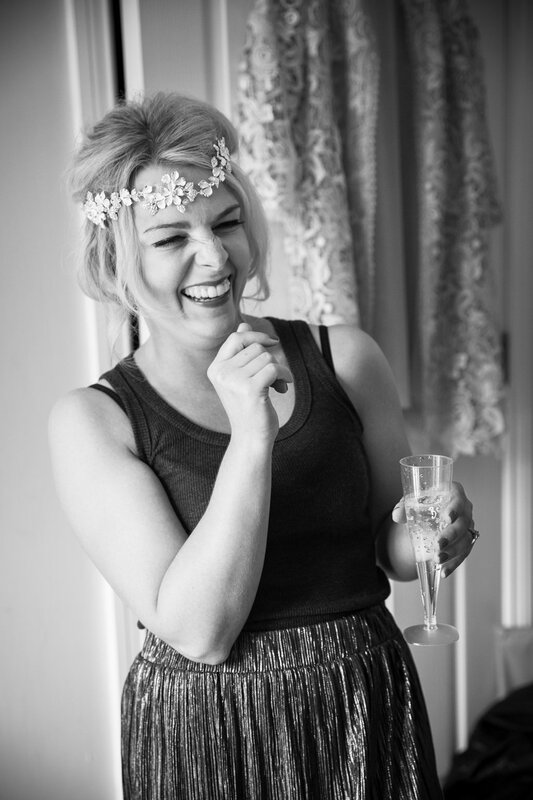 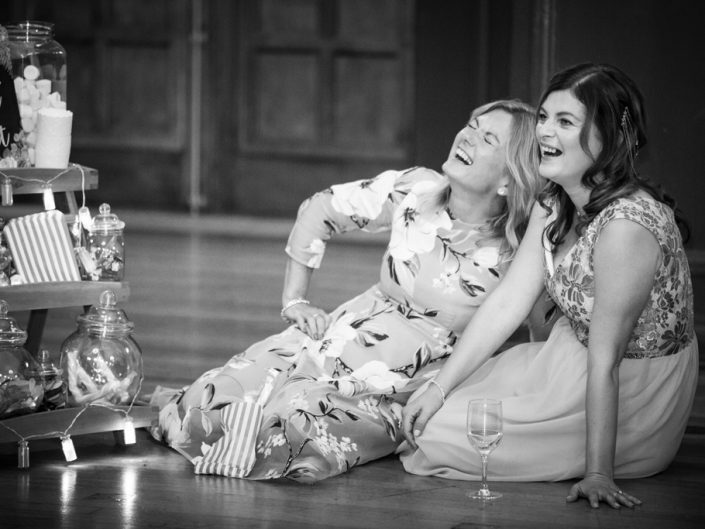 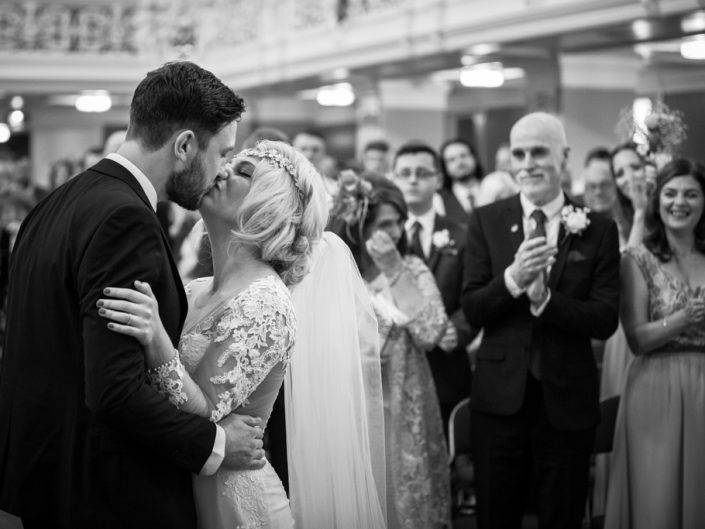 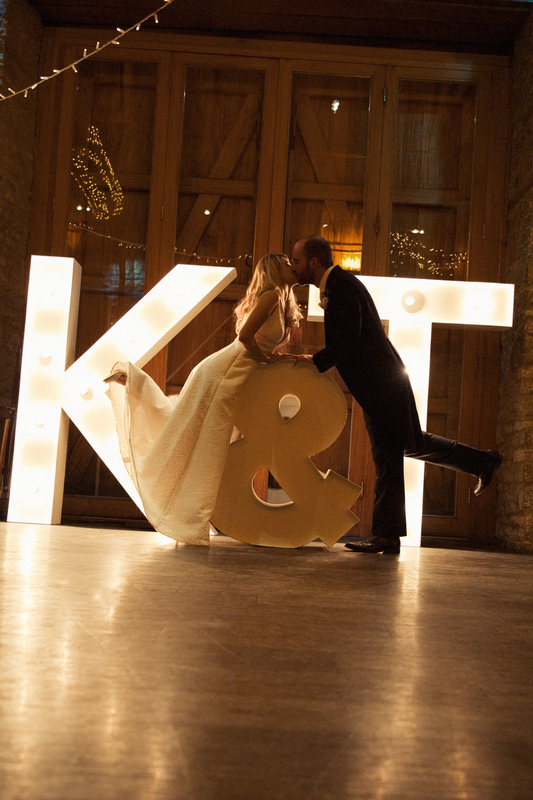 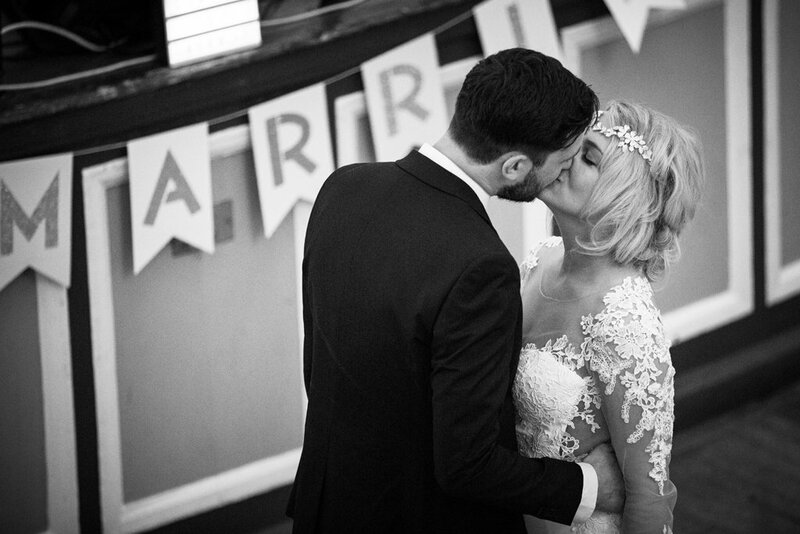 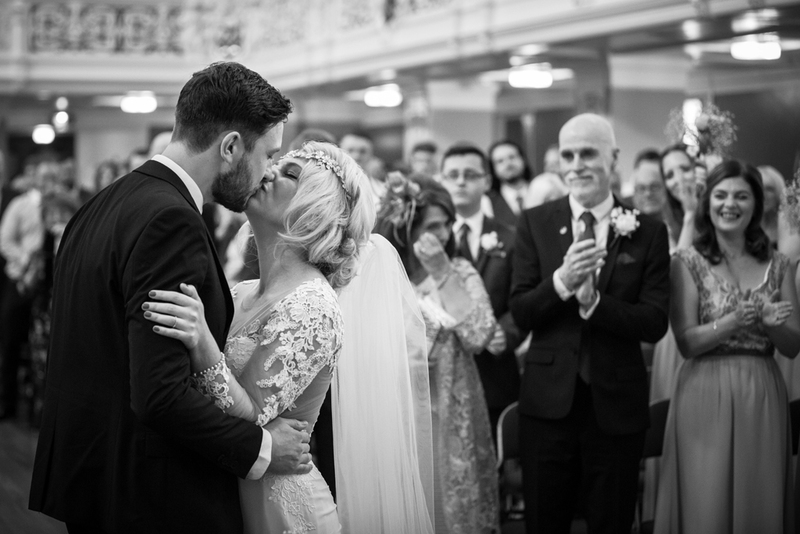 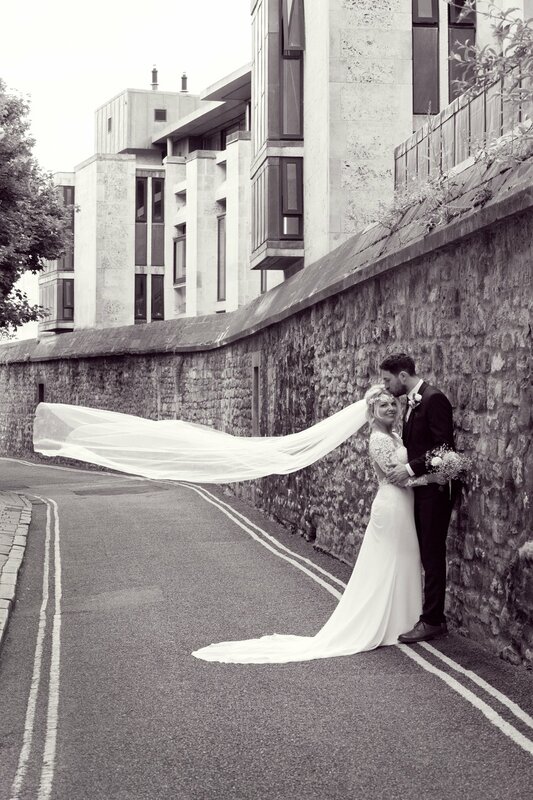 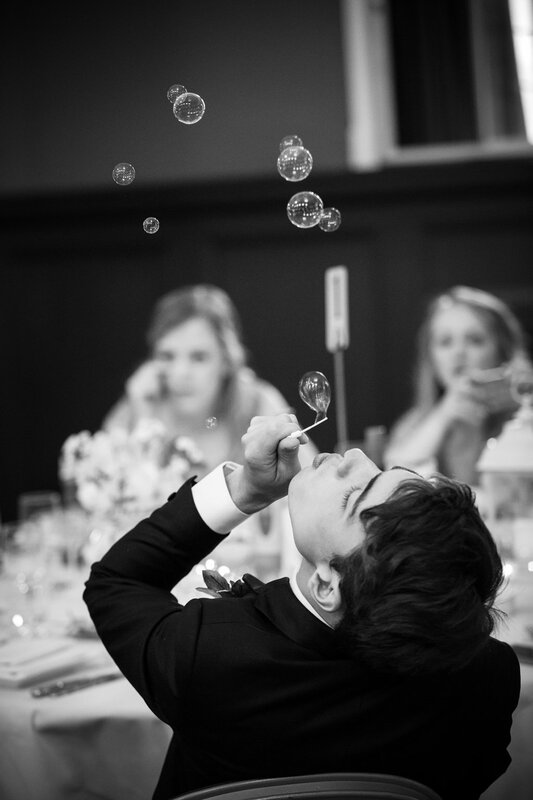 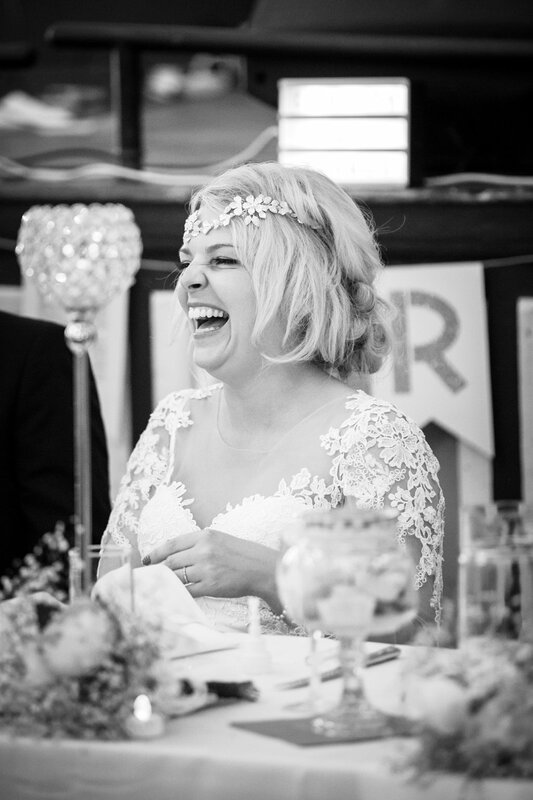 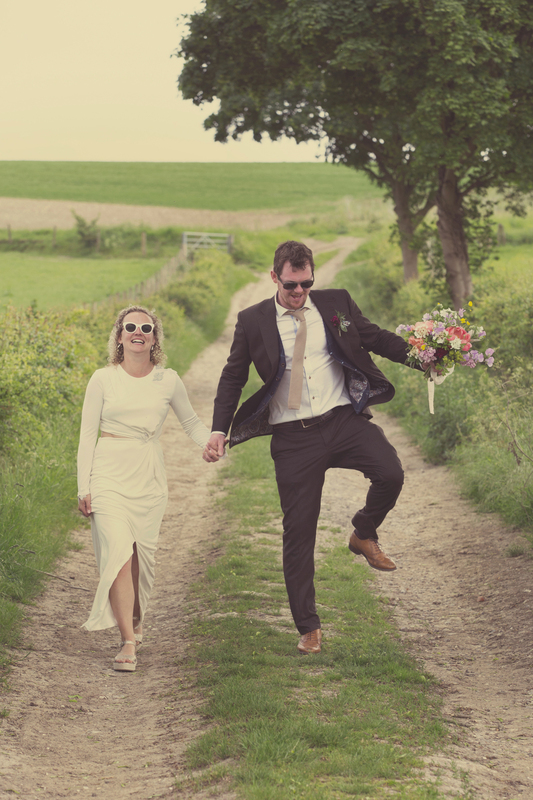 We are thrilled with these images & feel they really reflect the gorgeous, fun couple. 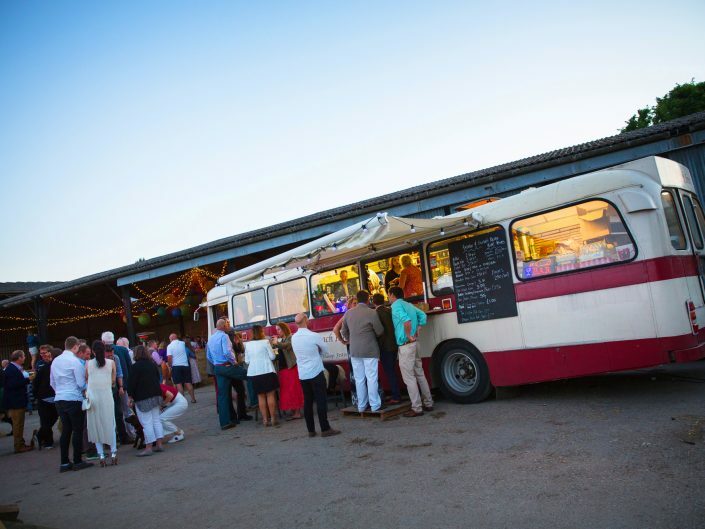 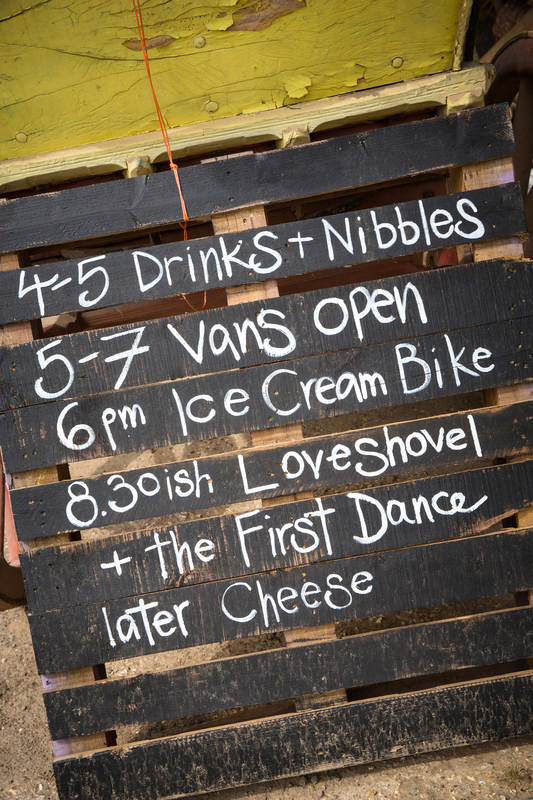 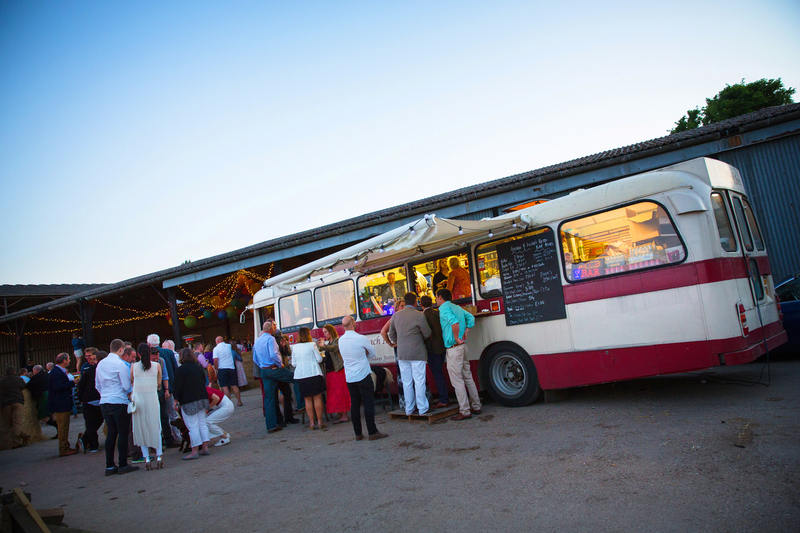 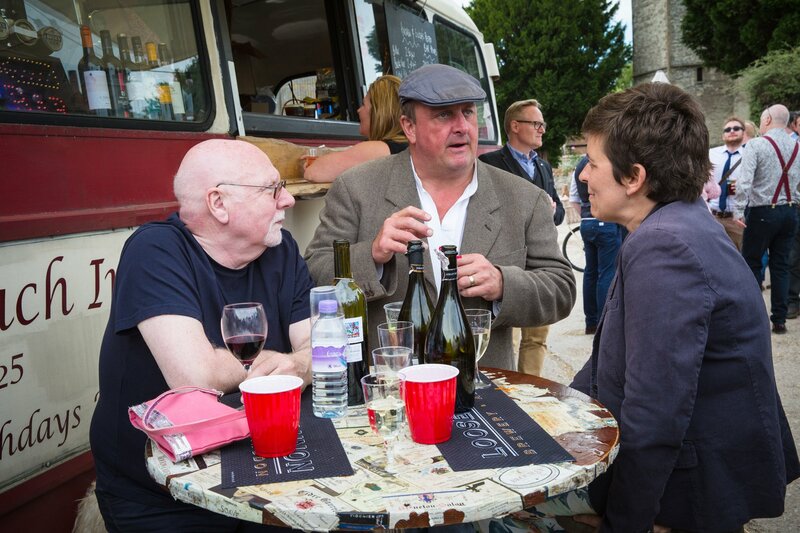 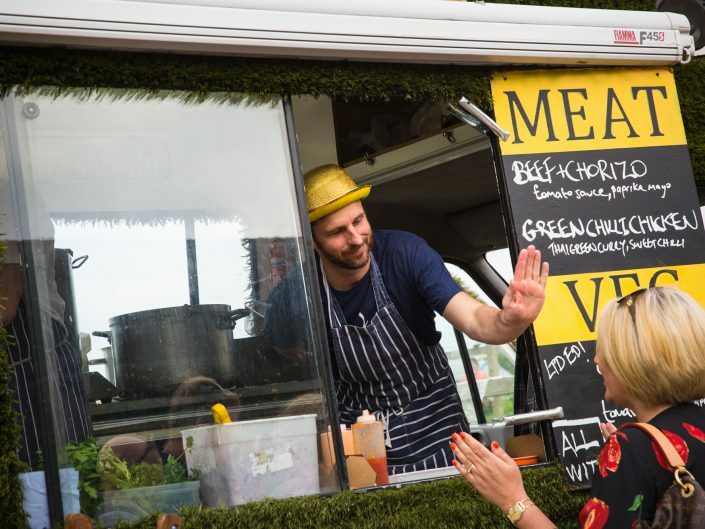 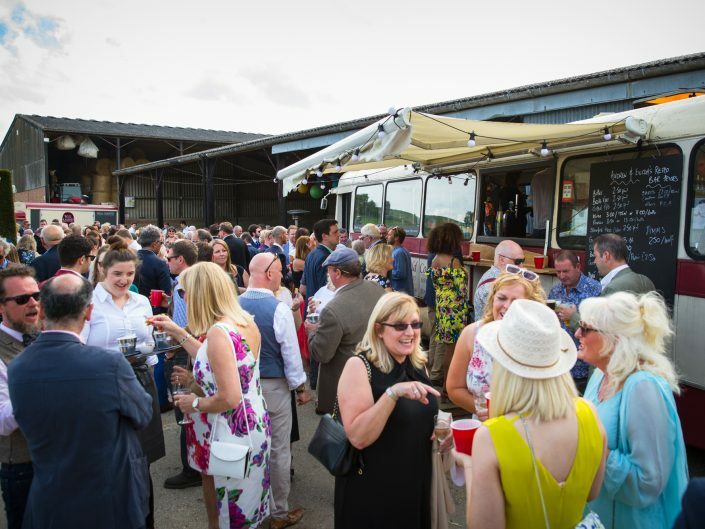 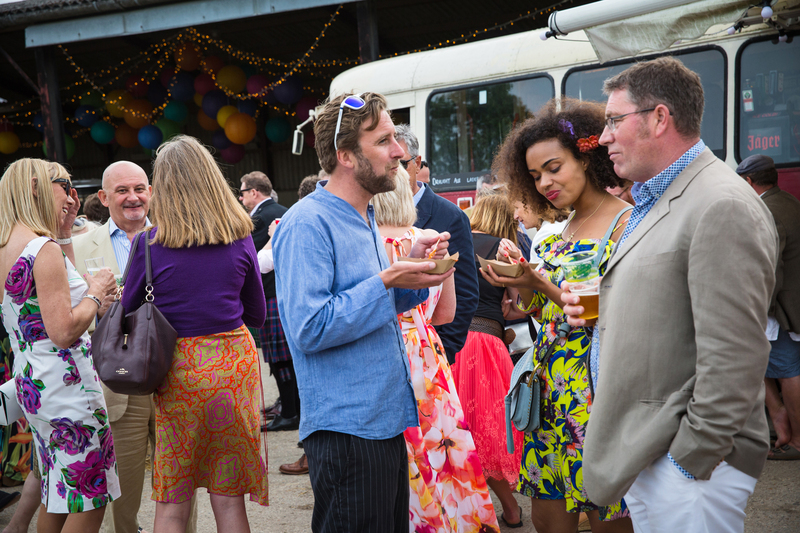 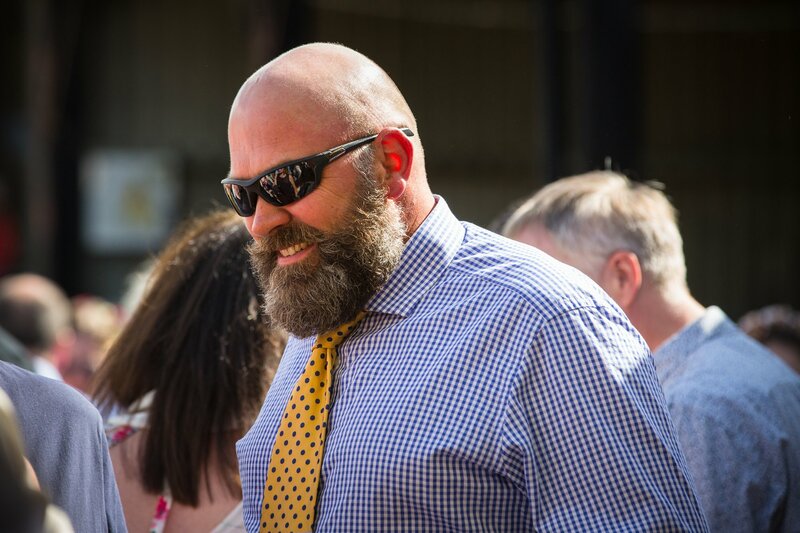 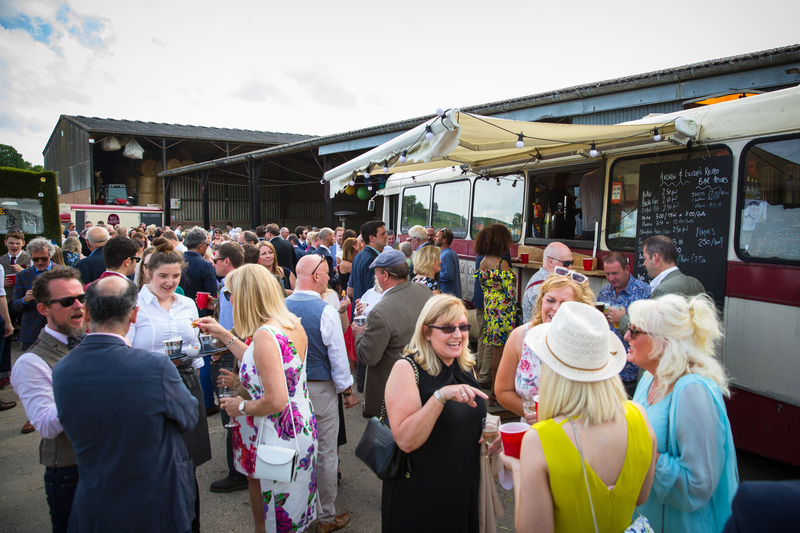 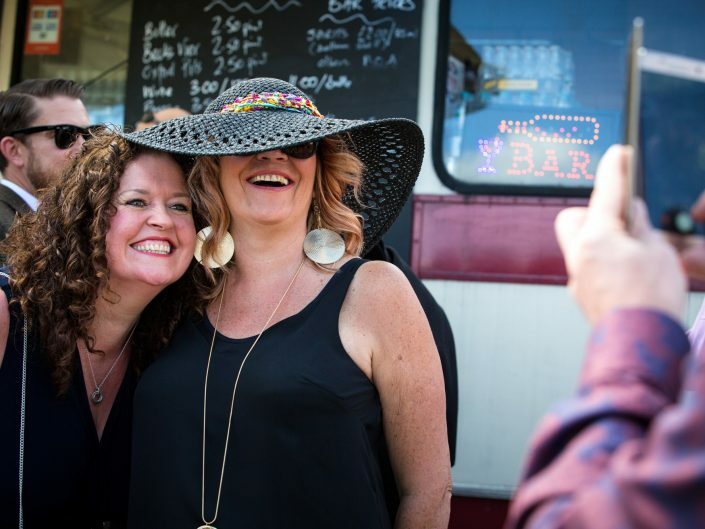 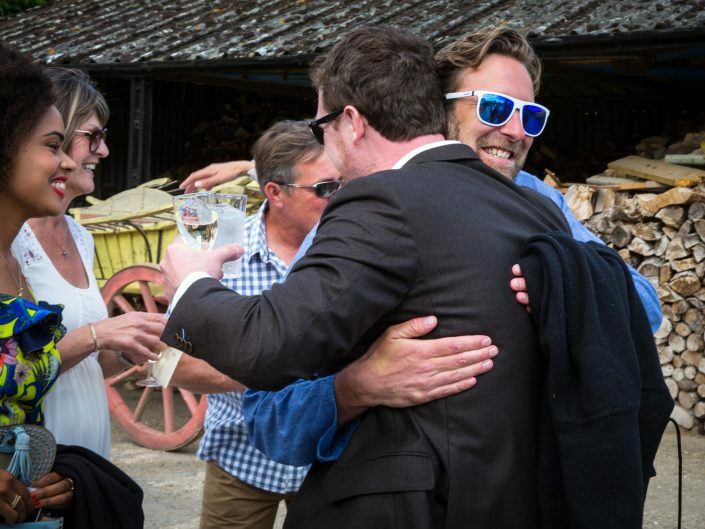 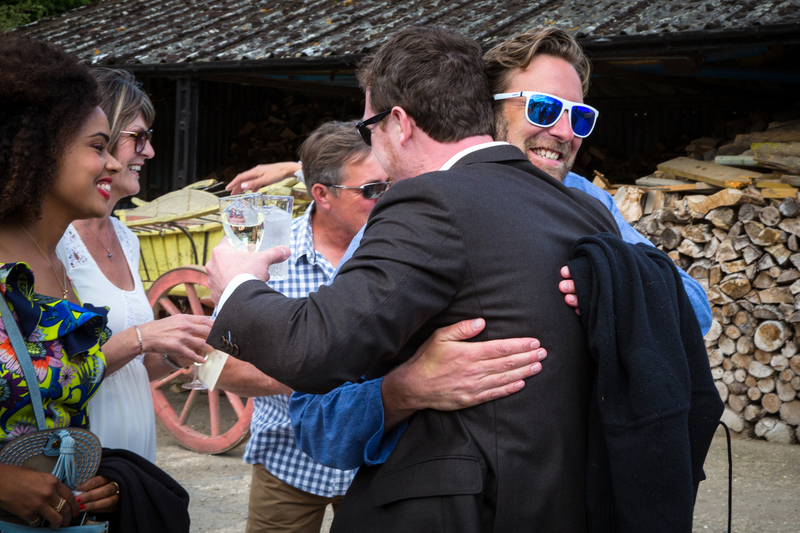 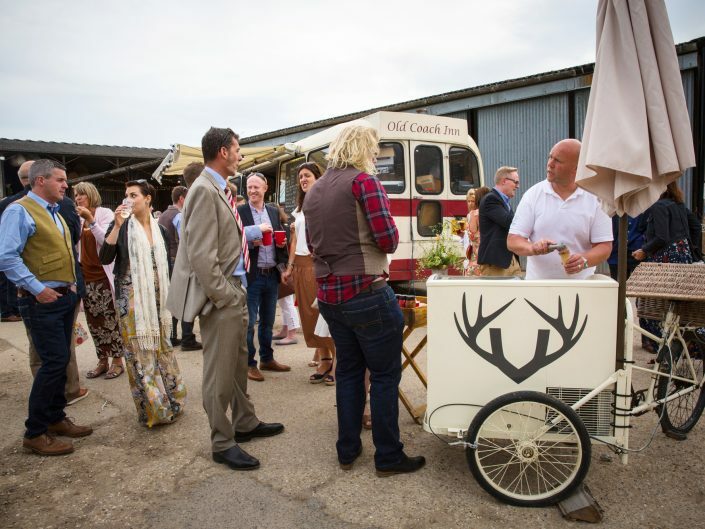 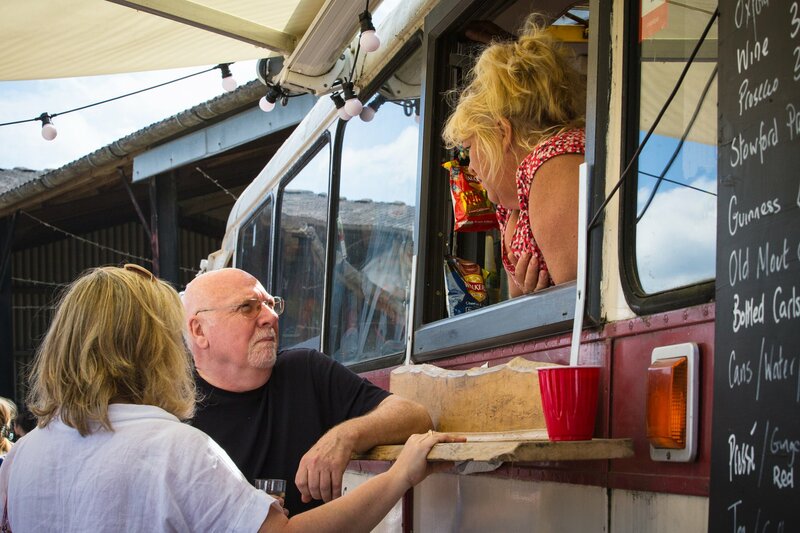 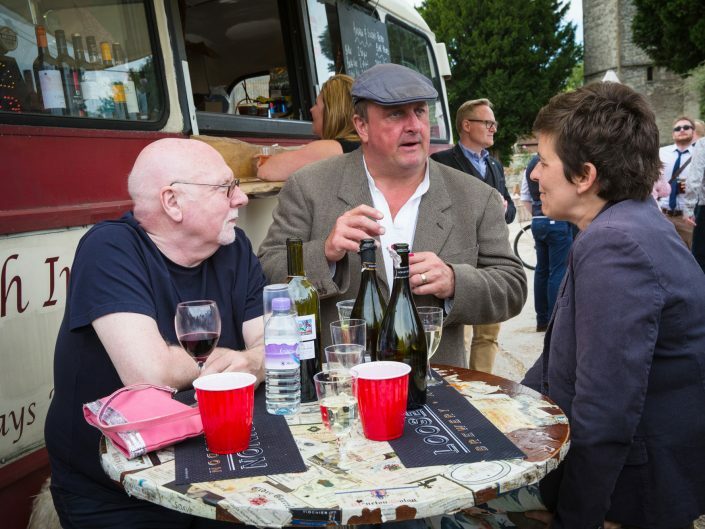 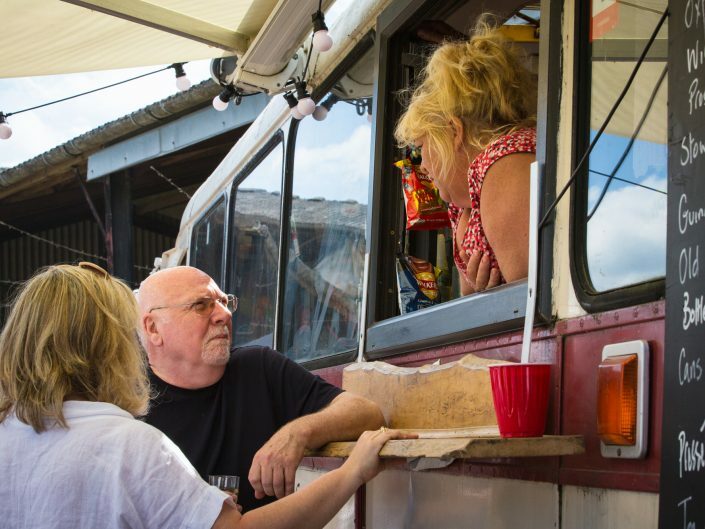 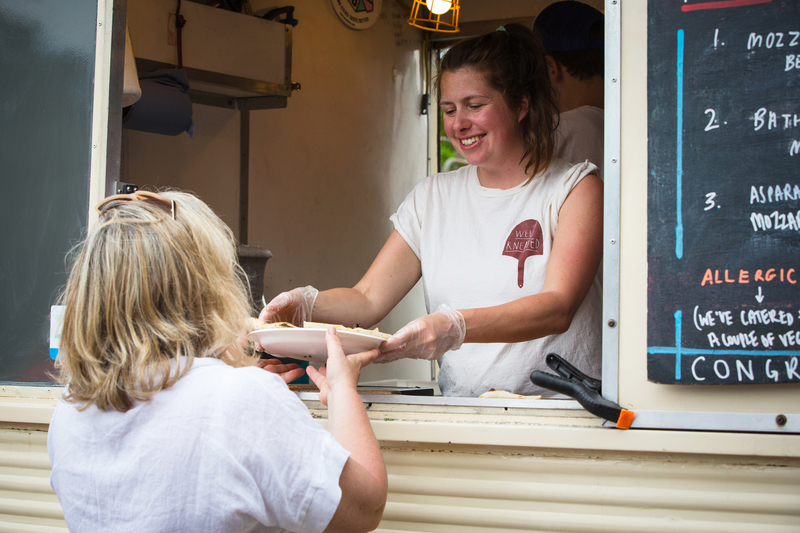 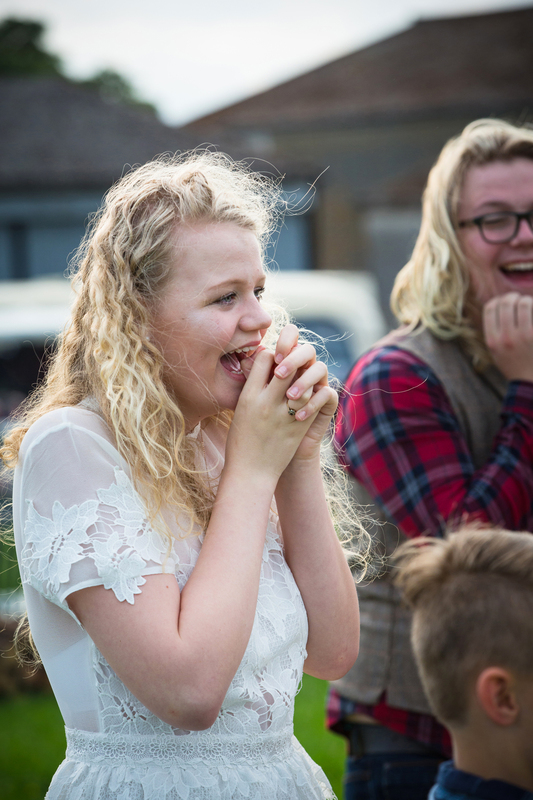 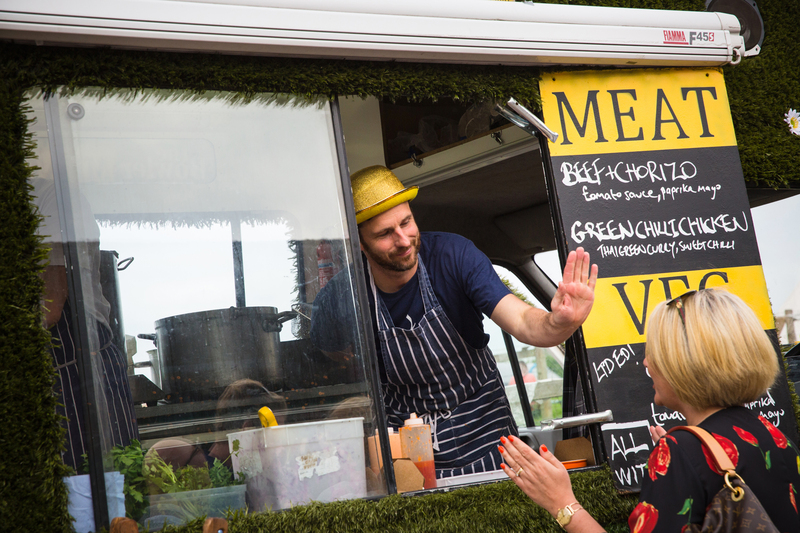 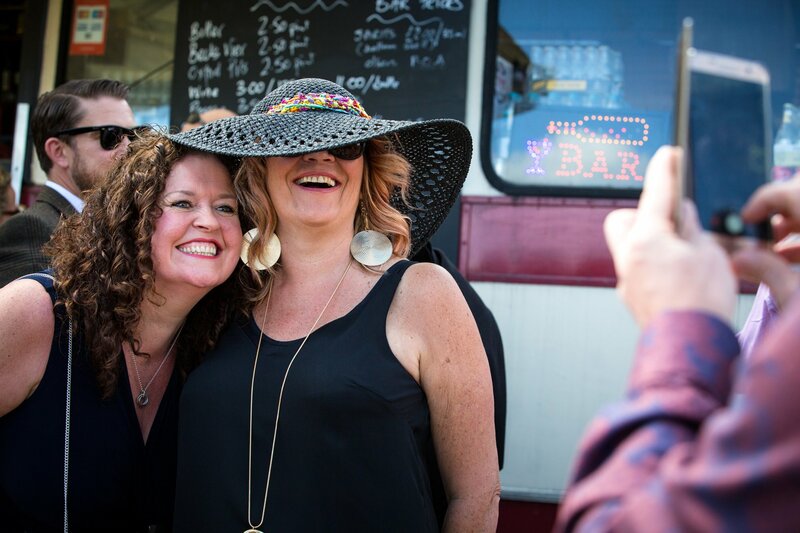 It was time for the happy couple to rejoin their guests & to tuck into the food trucks. 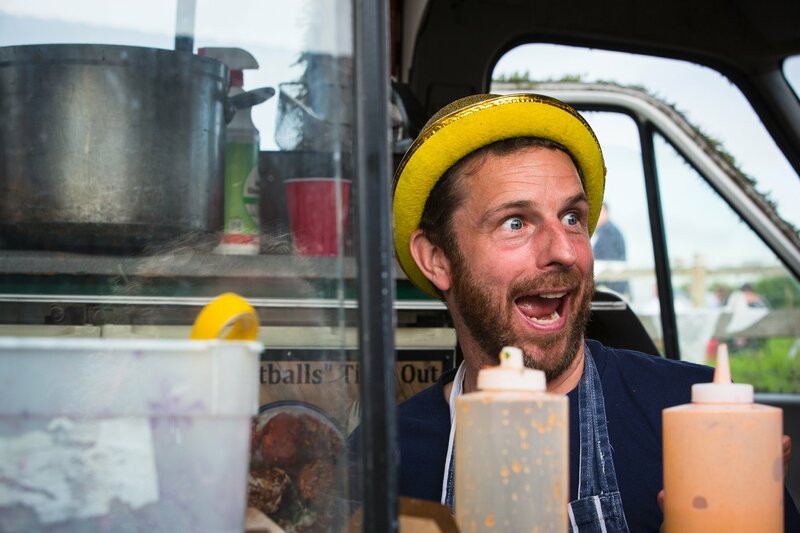 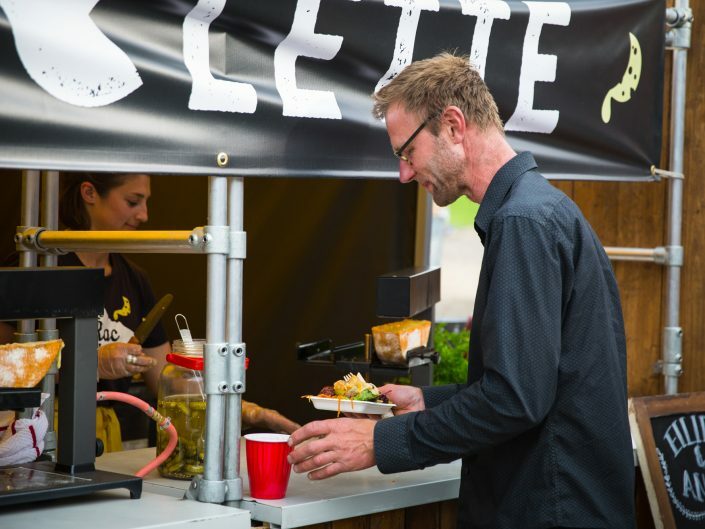 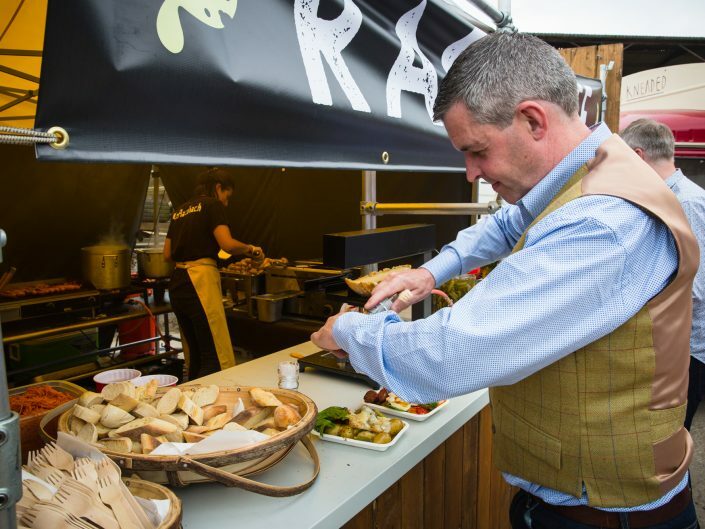 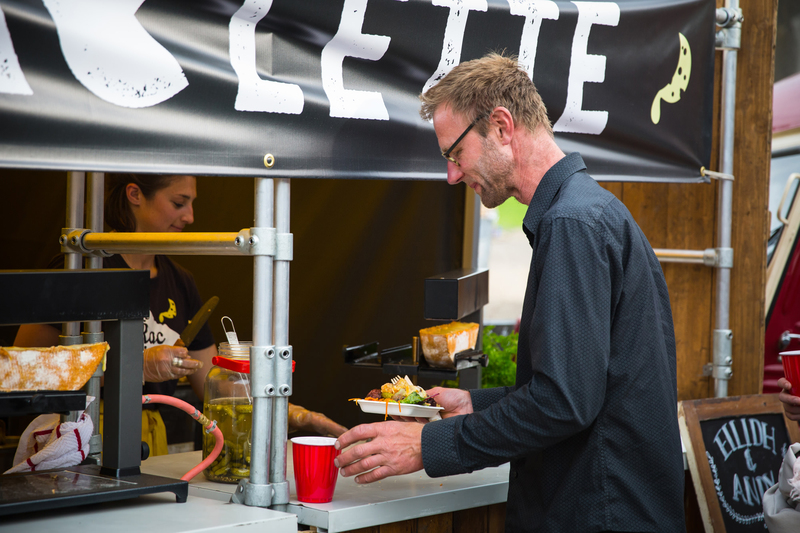 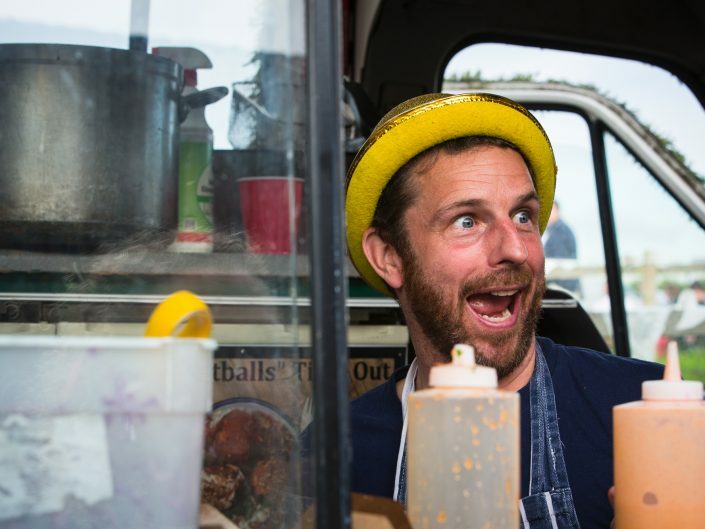 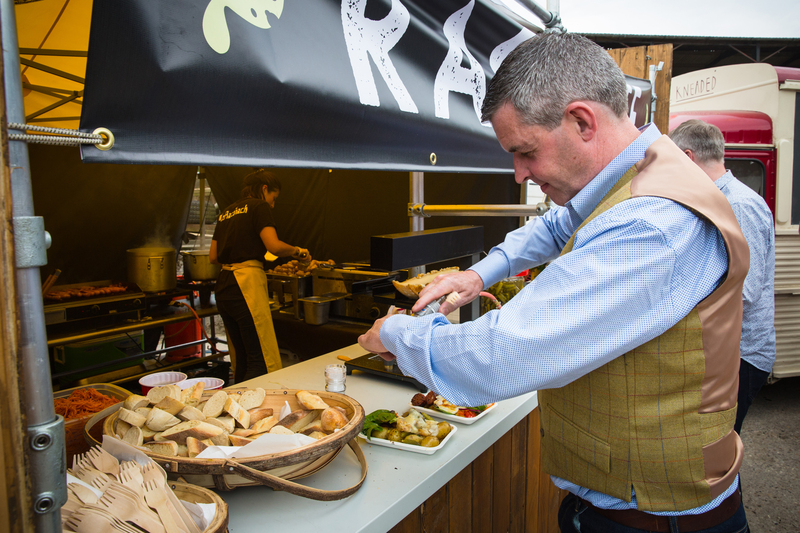 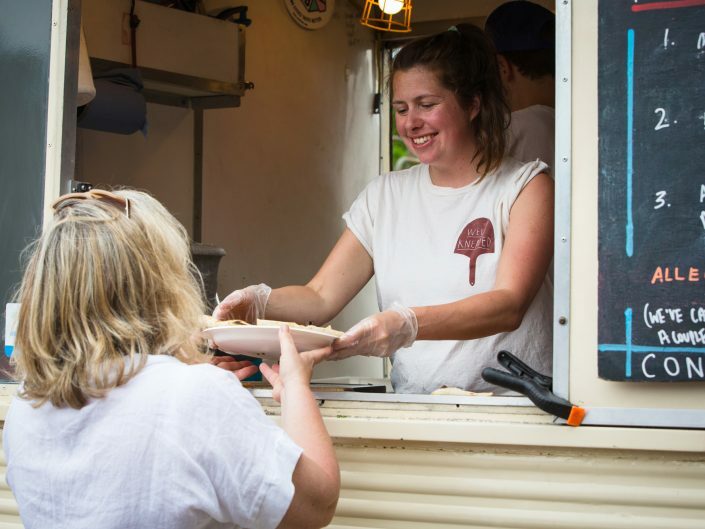 There was a fantastic selection from meatballs from The Bowler, pizzas from Well Kneaded & raclette Le Rac Shack. 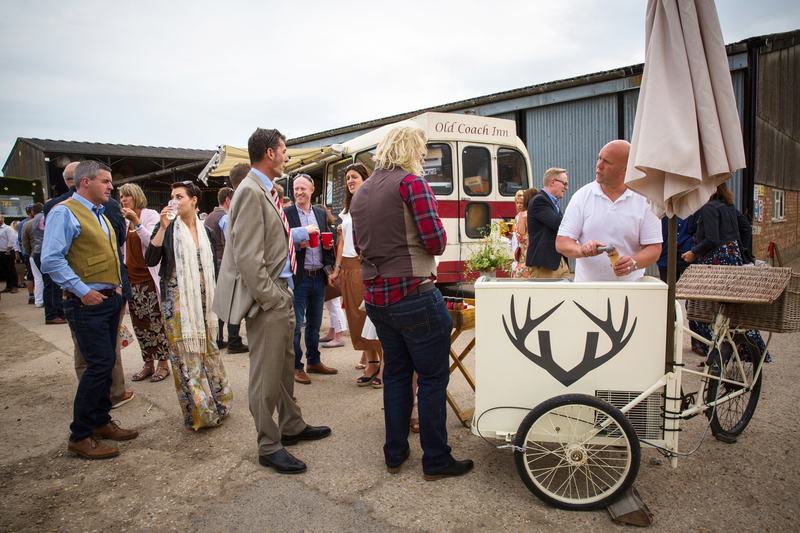 Beverages were all served from an old coach, The Old Coach Inn. 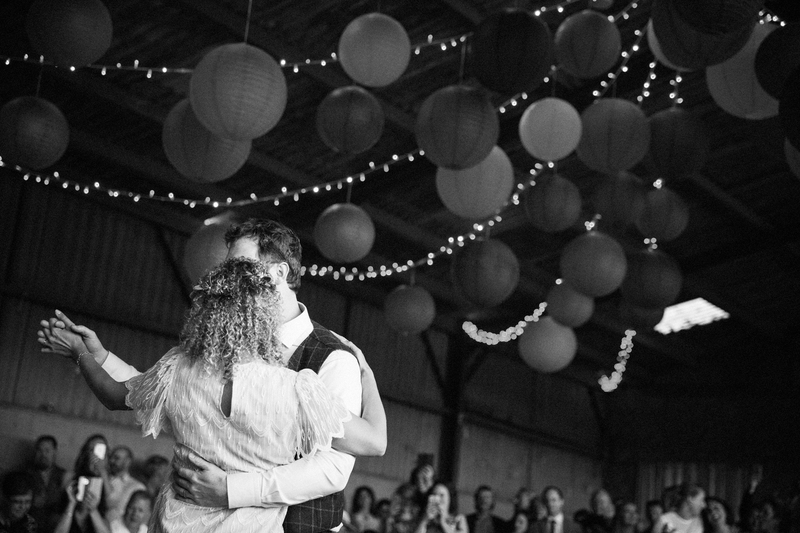 After much happy mingling it was time for the bride & groom to hit the dance floor for their first dance. 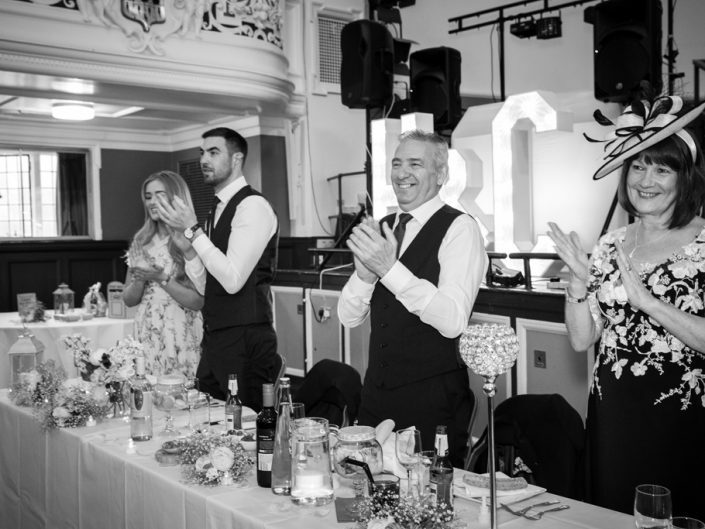 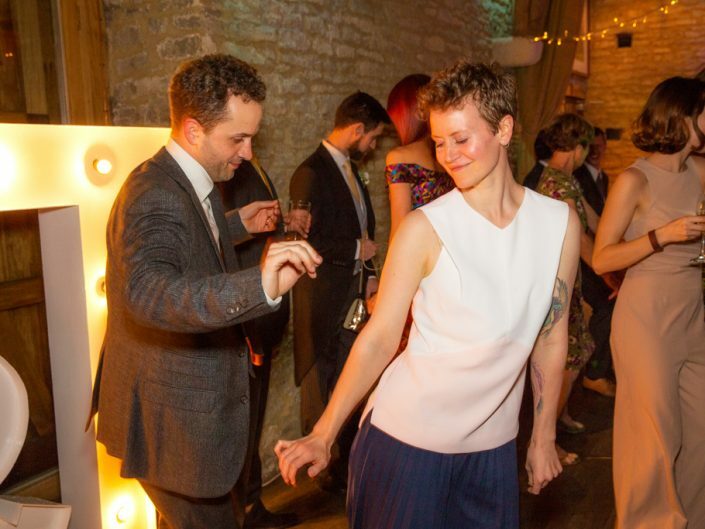 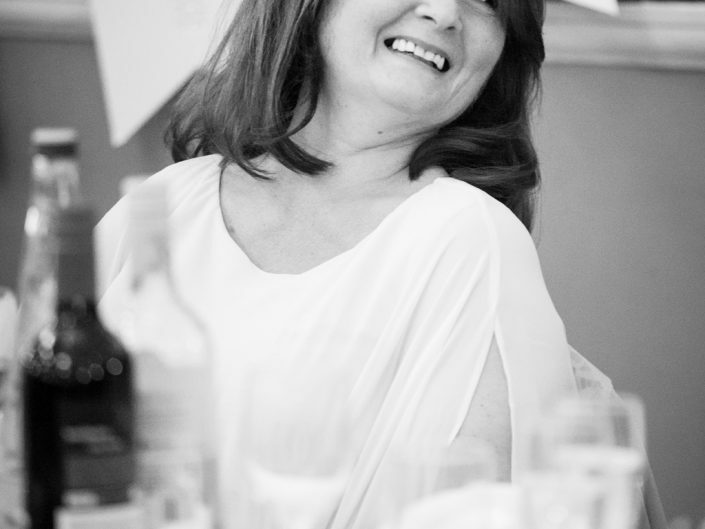 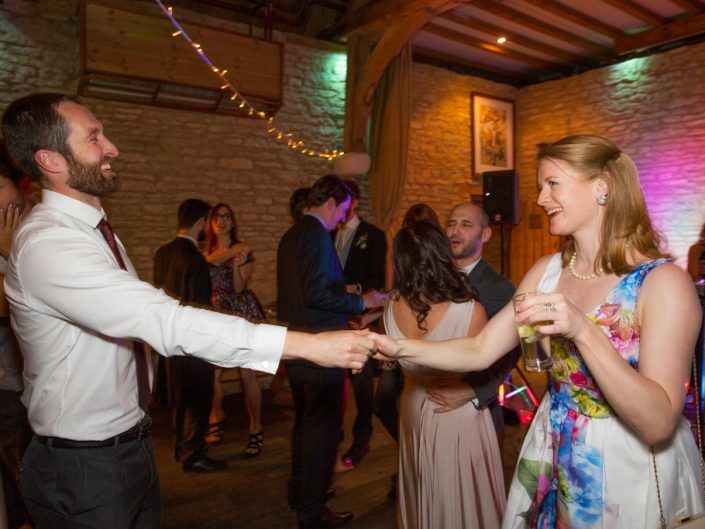 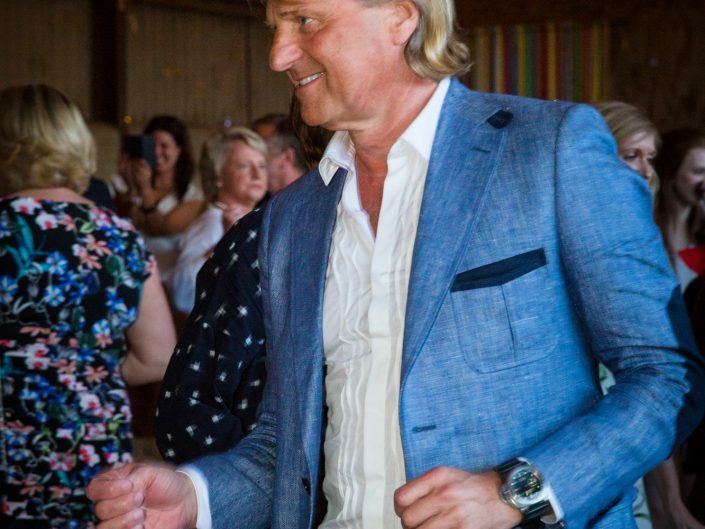 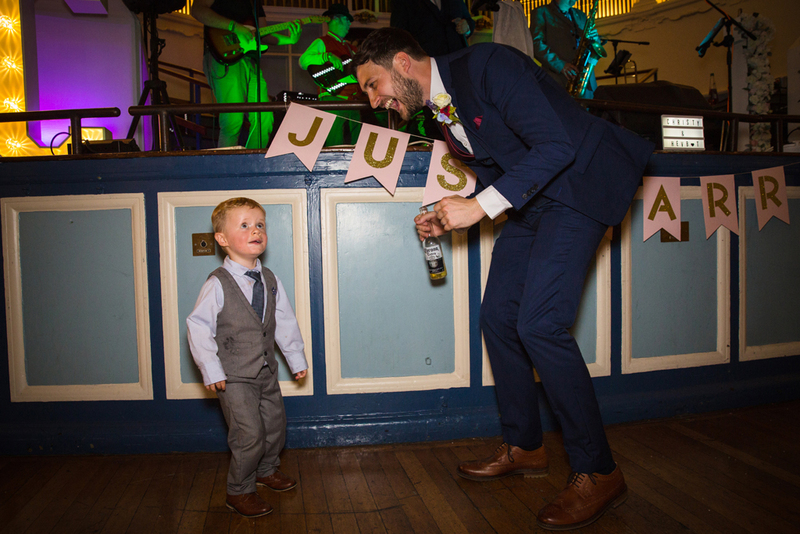 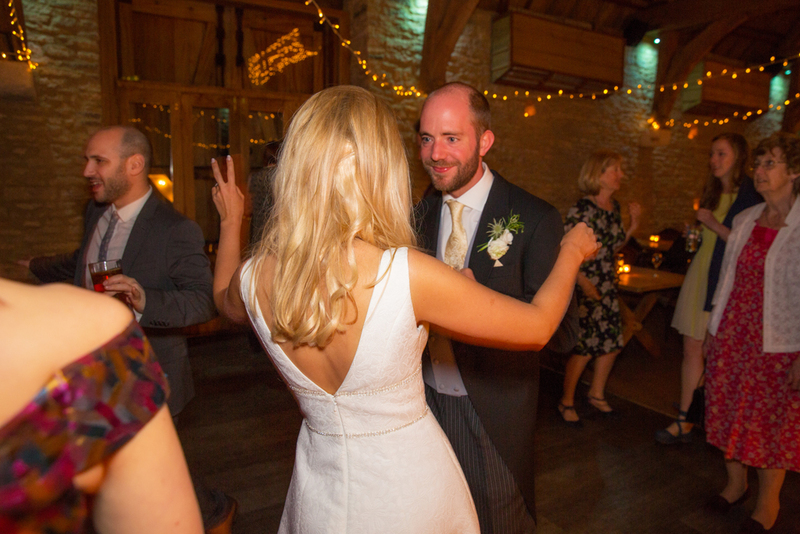 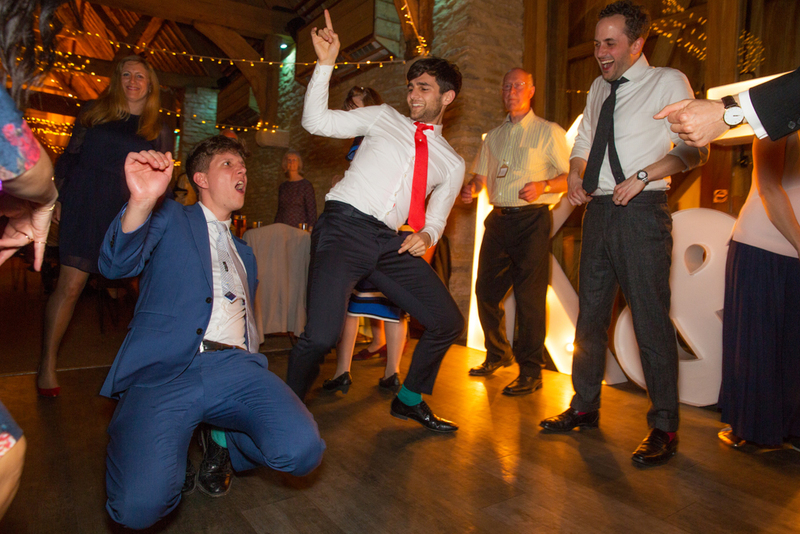 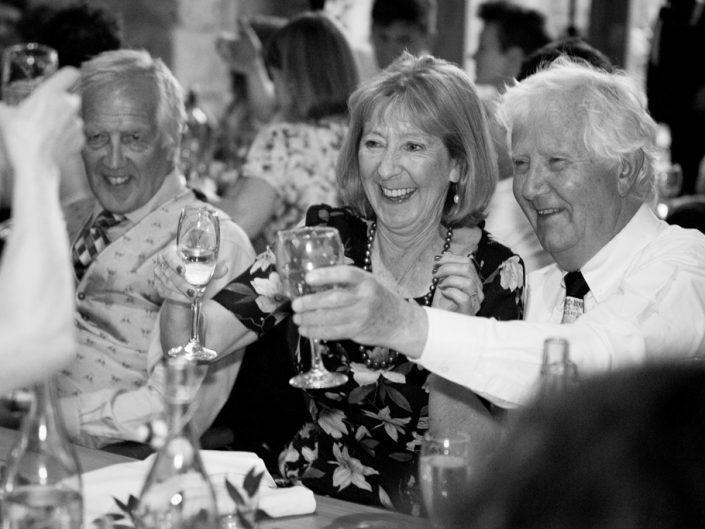 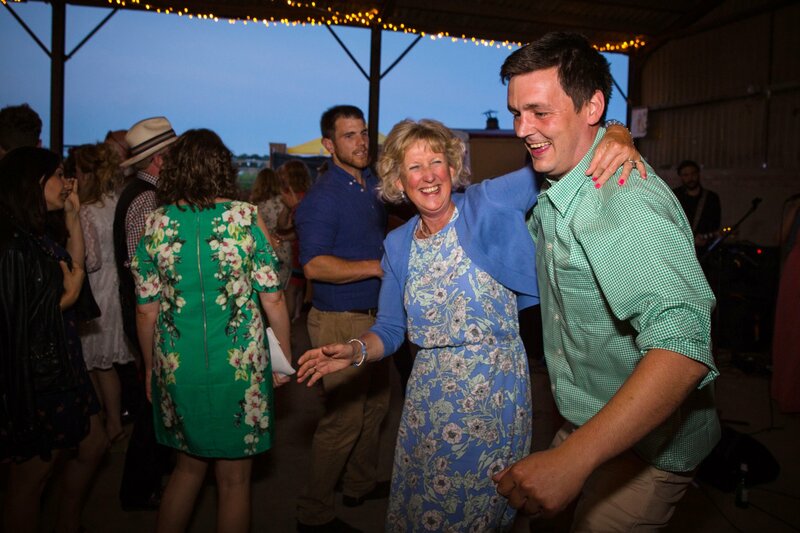 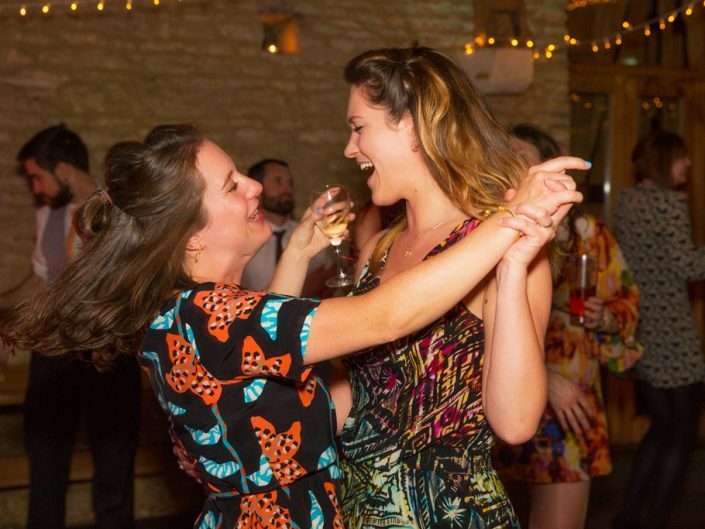 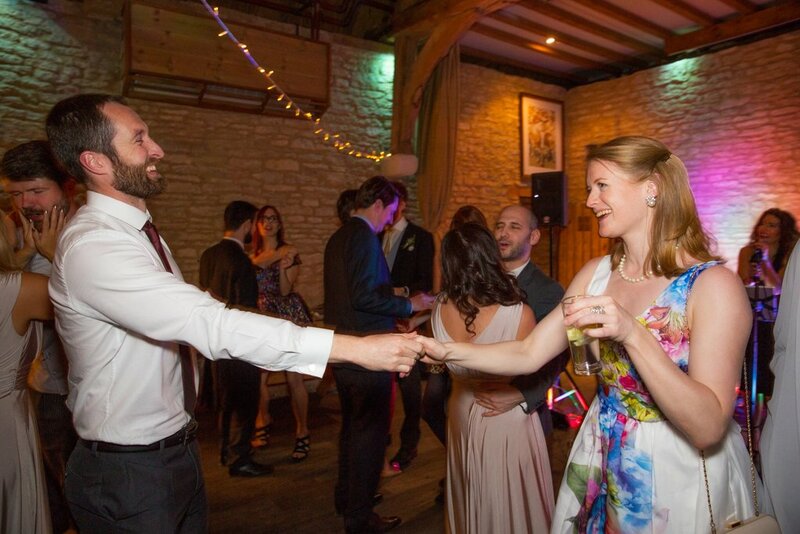 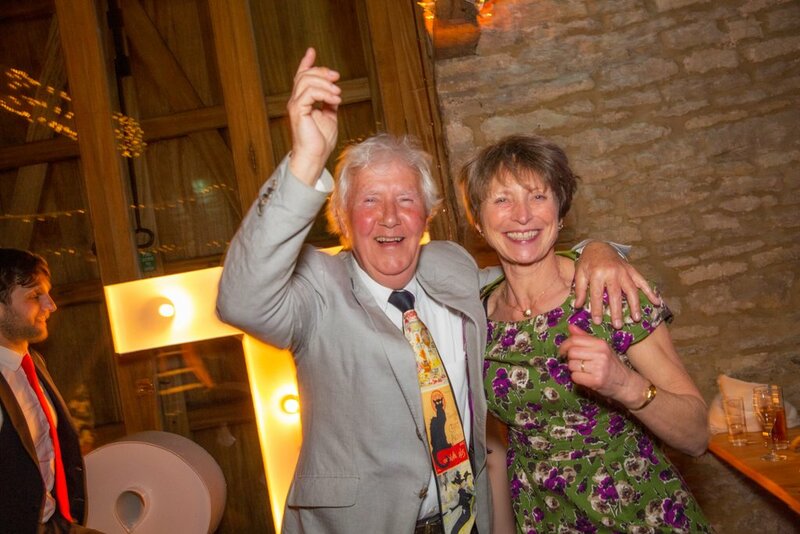 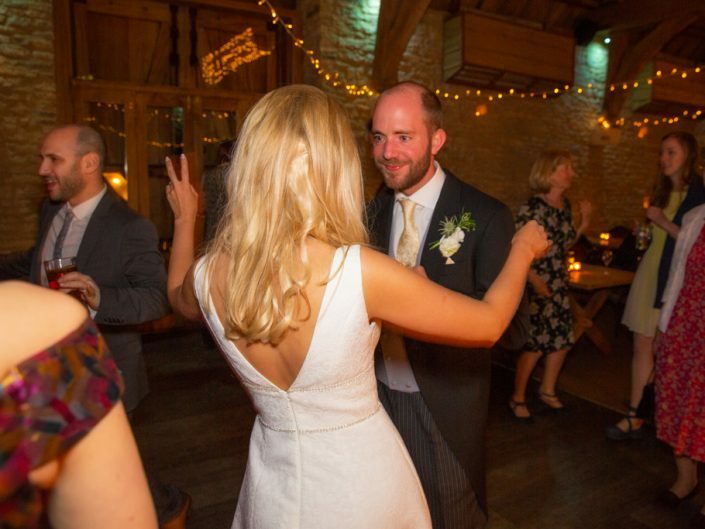 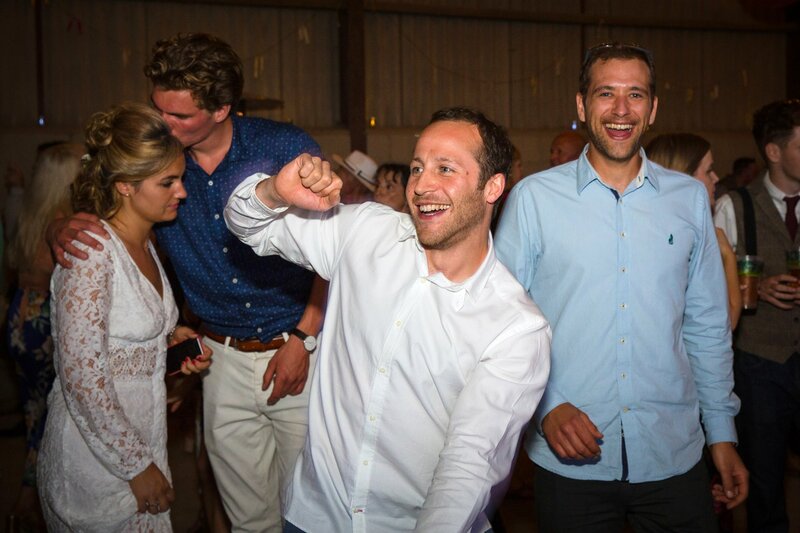 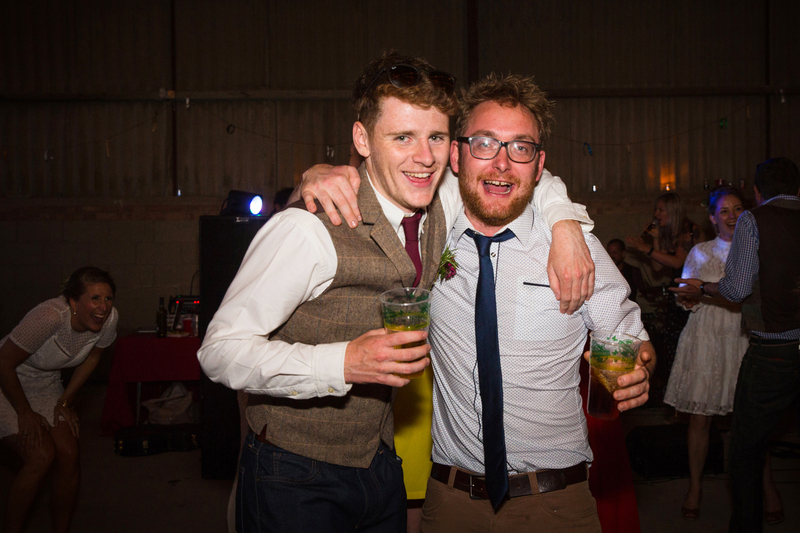 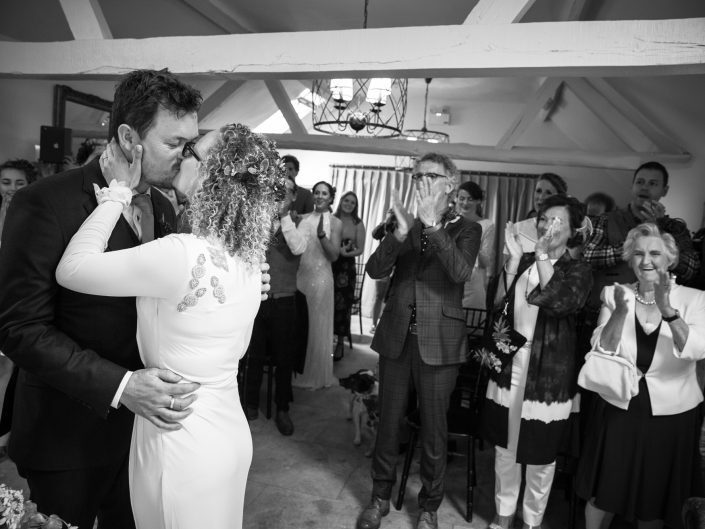 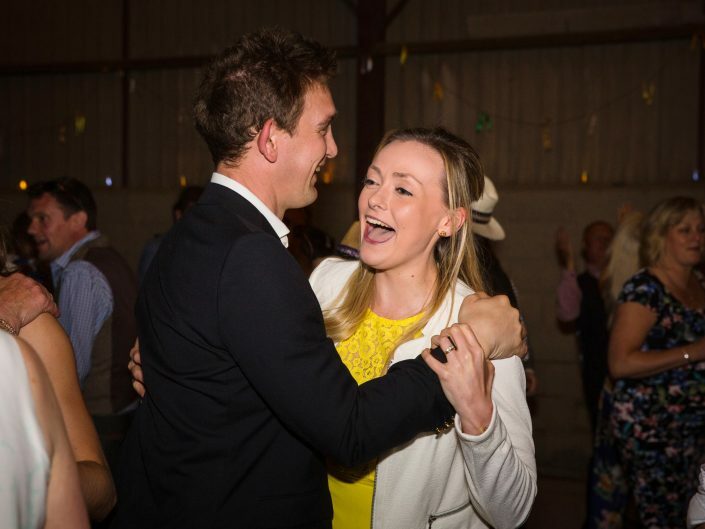 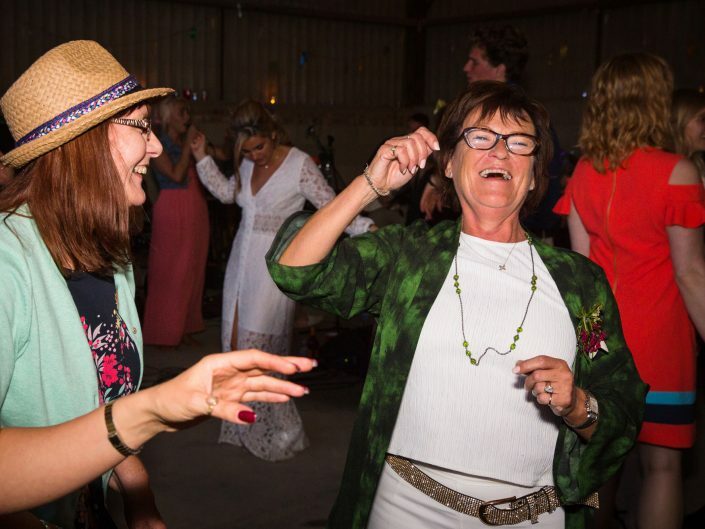 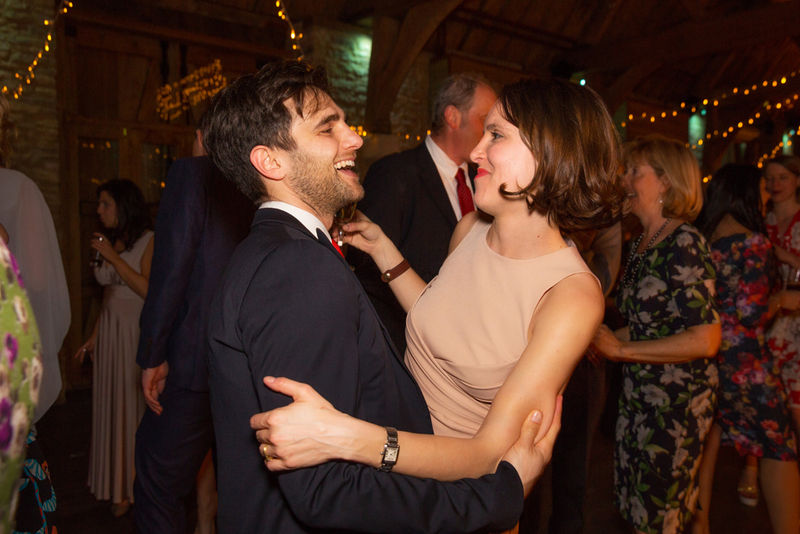 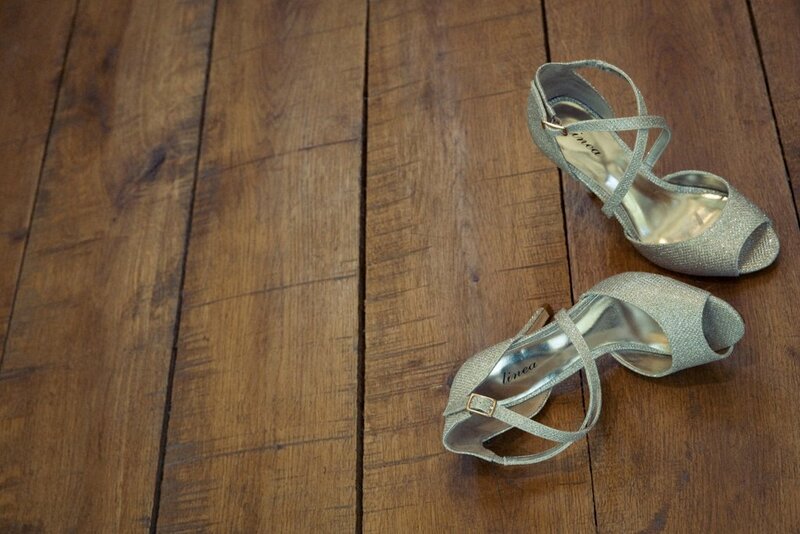 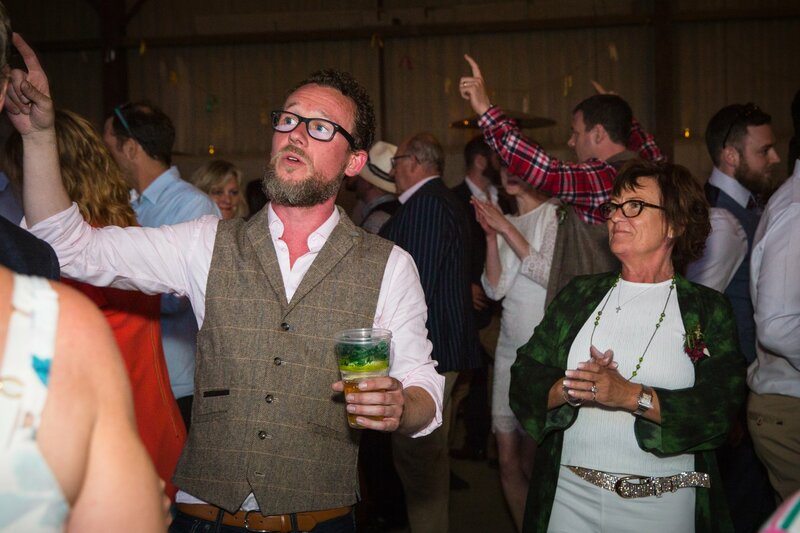 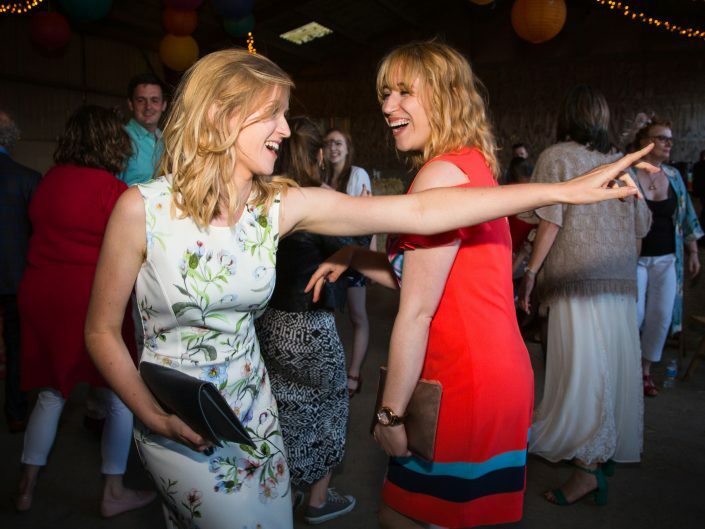 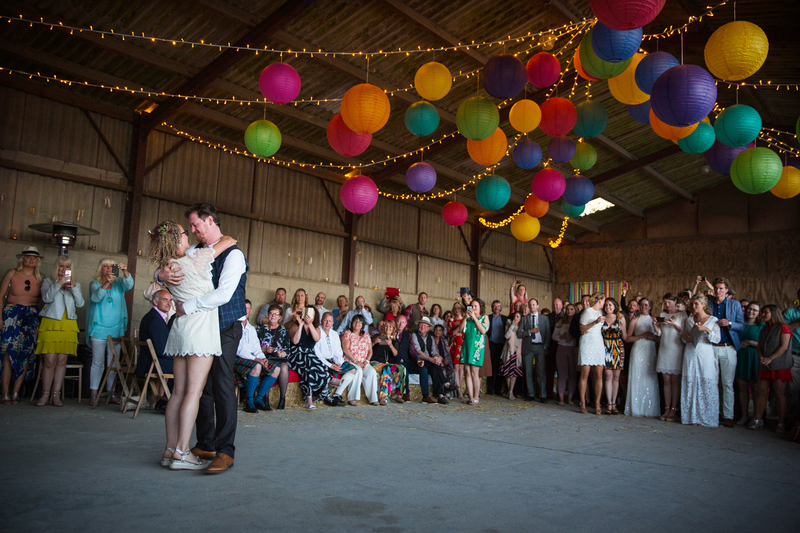 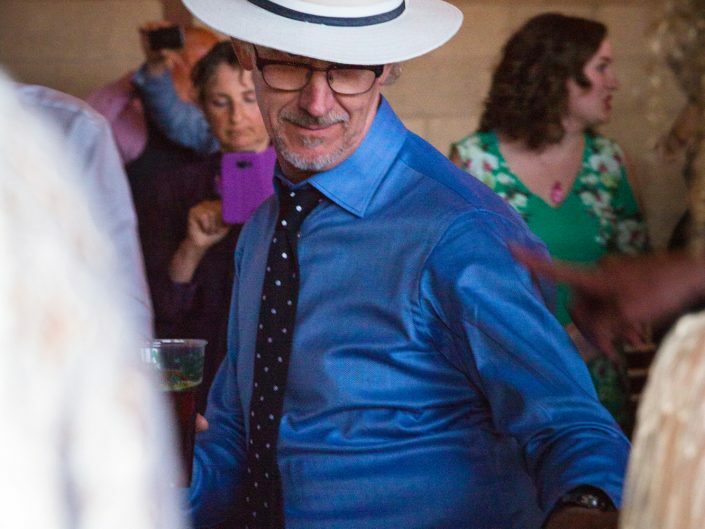 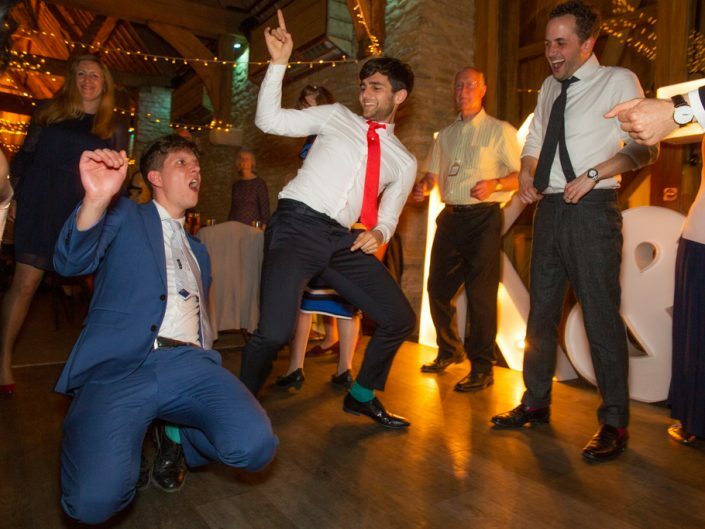 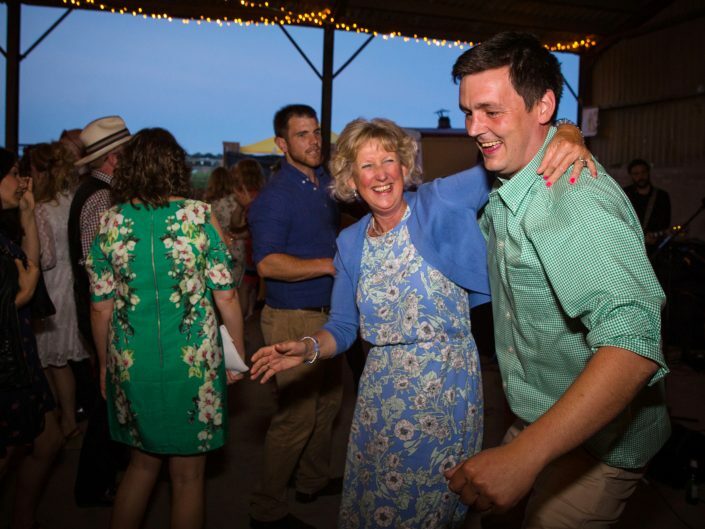 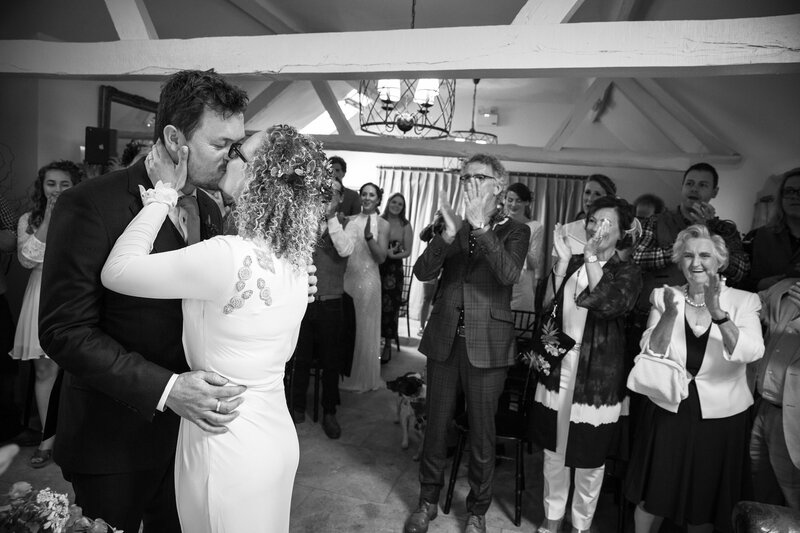 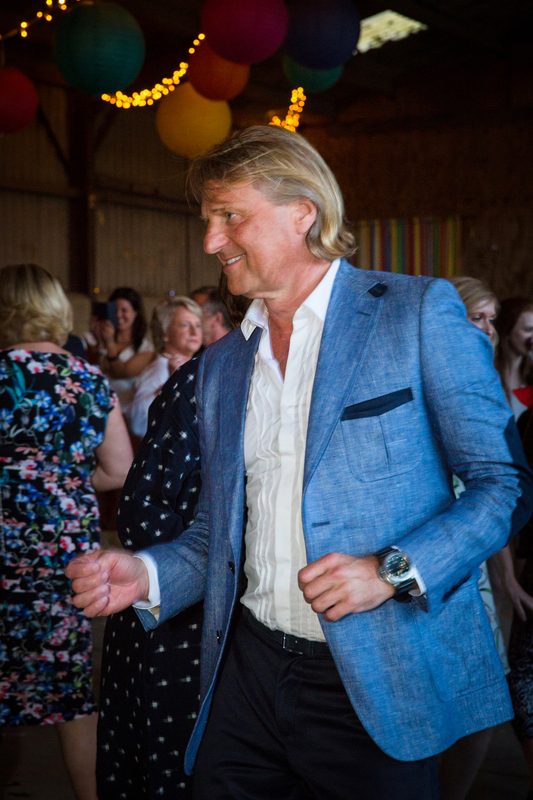 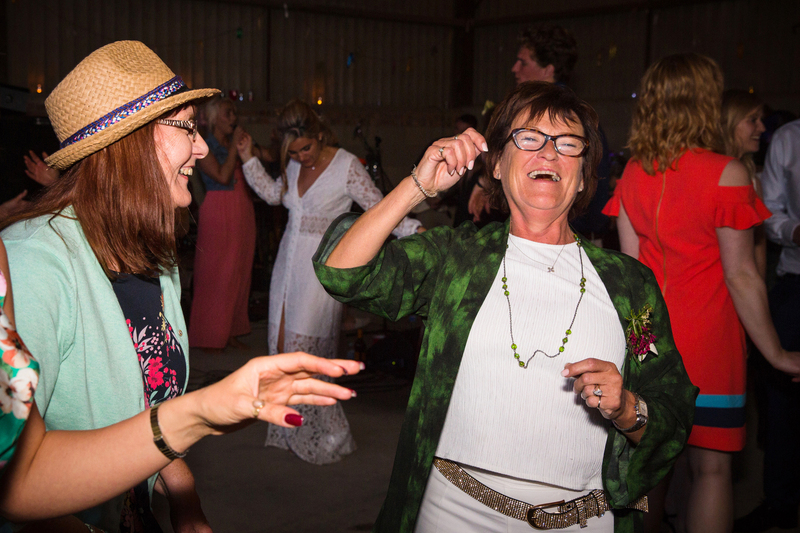 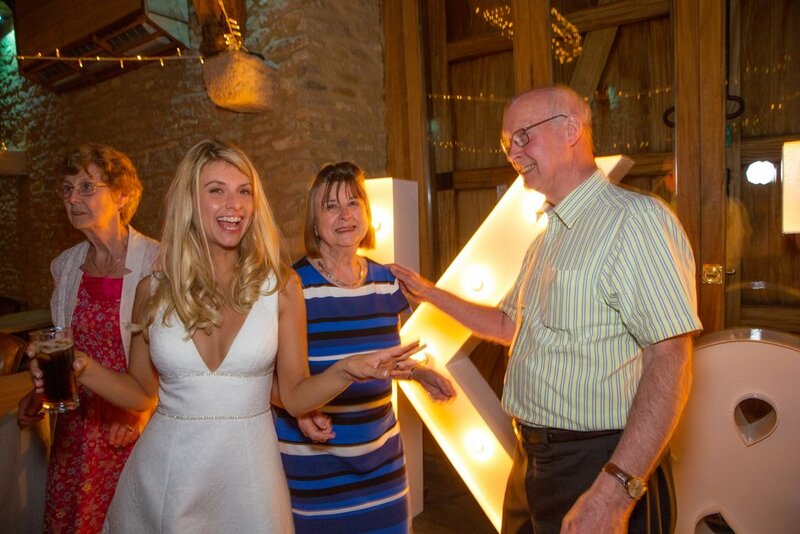 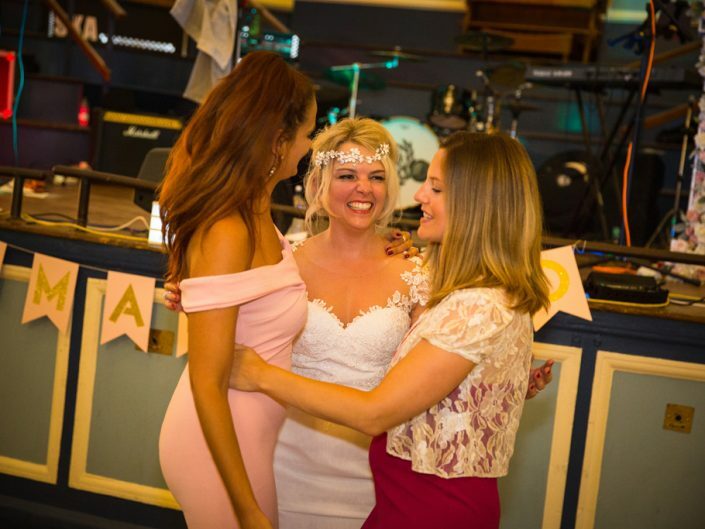 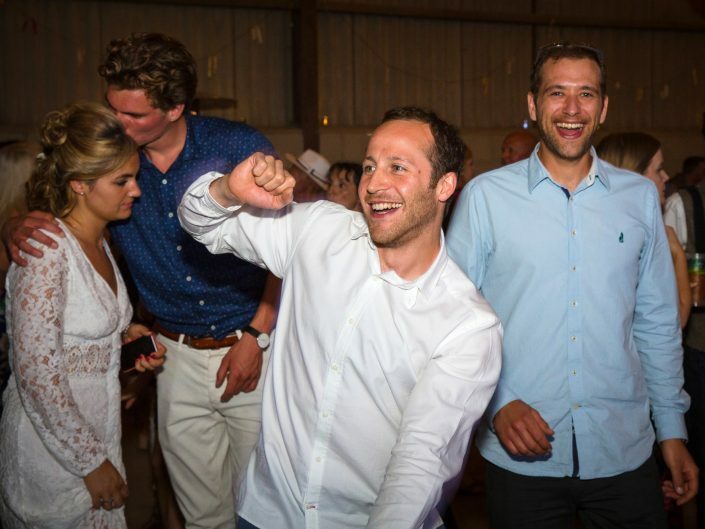 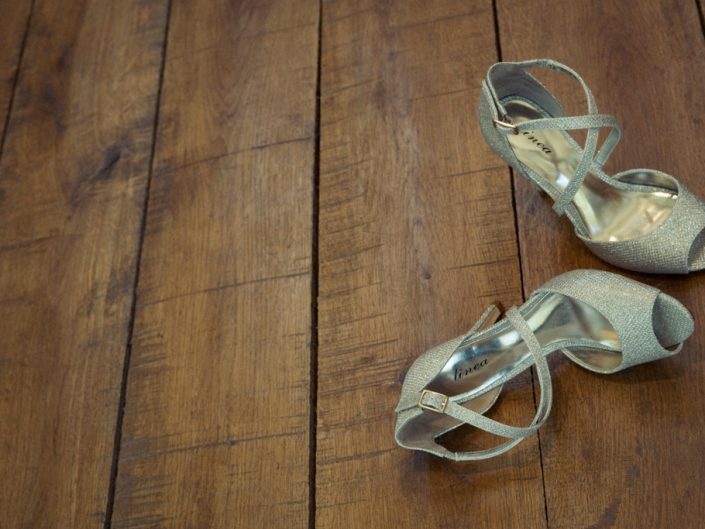 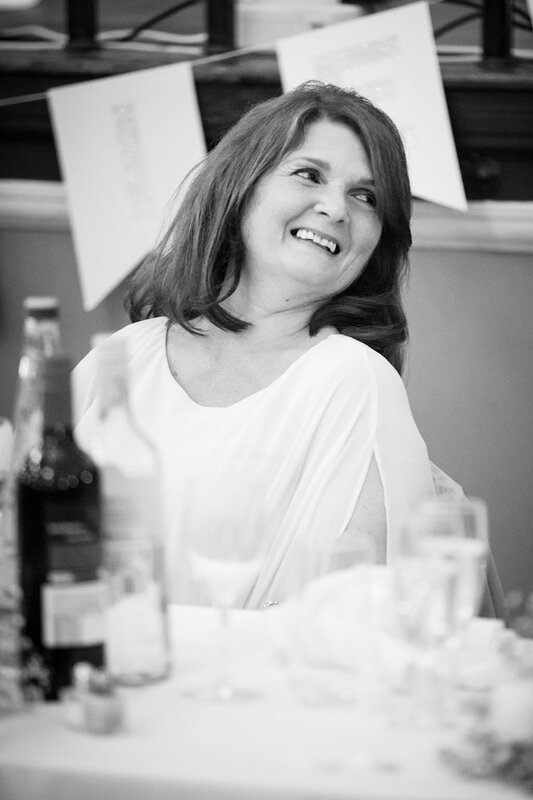 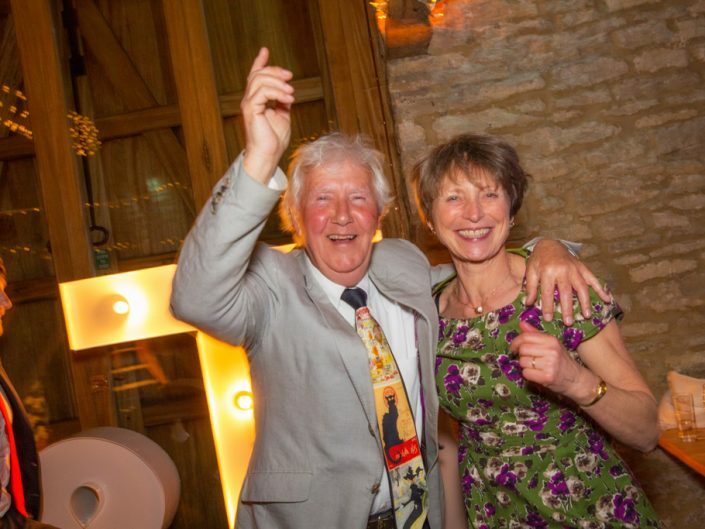 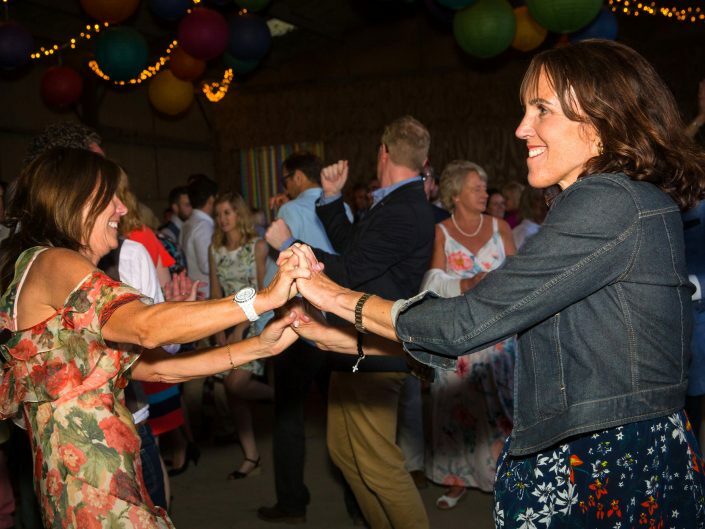 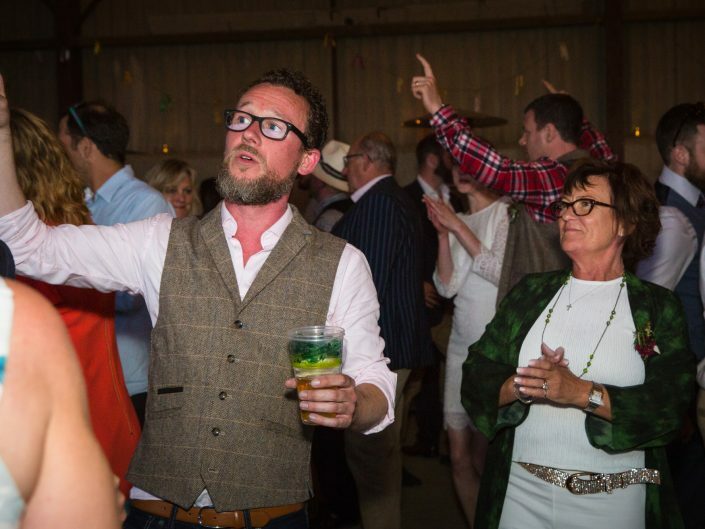 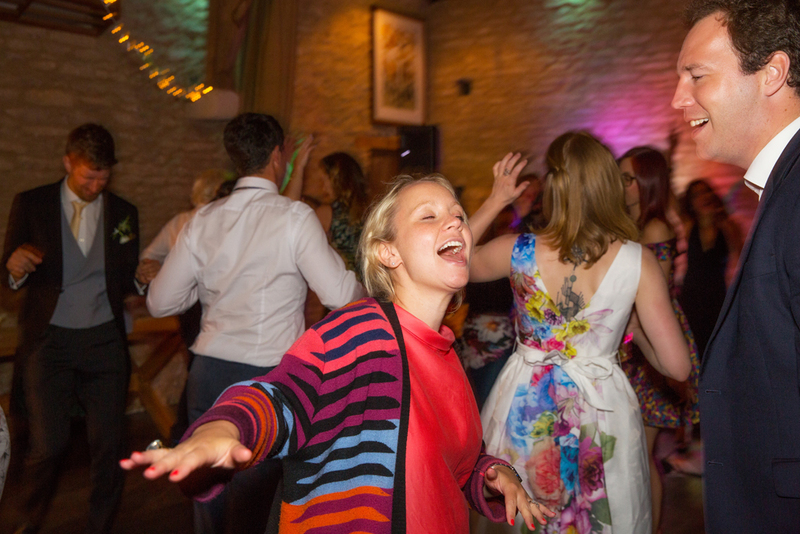 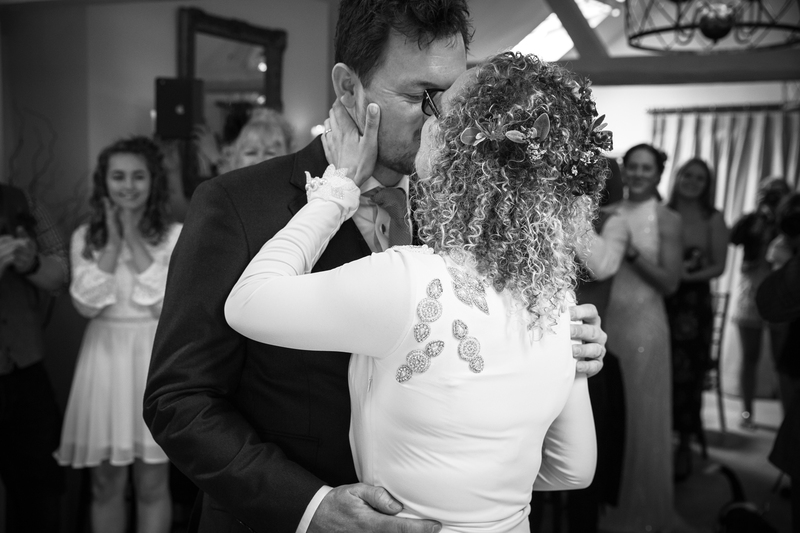 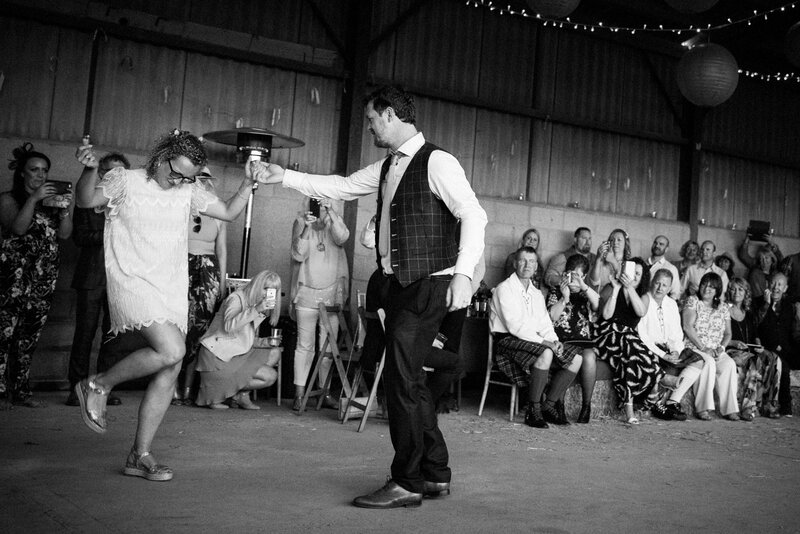 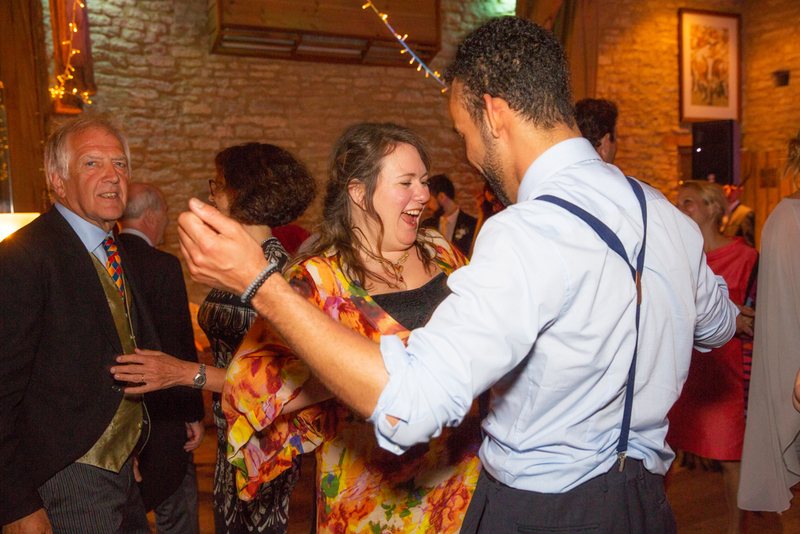 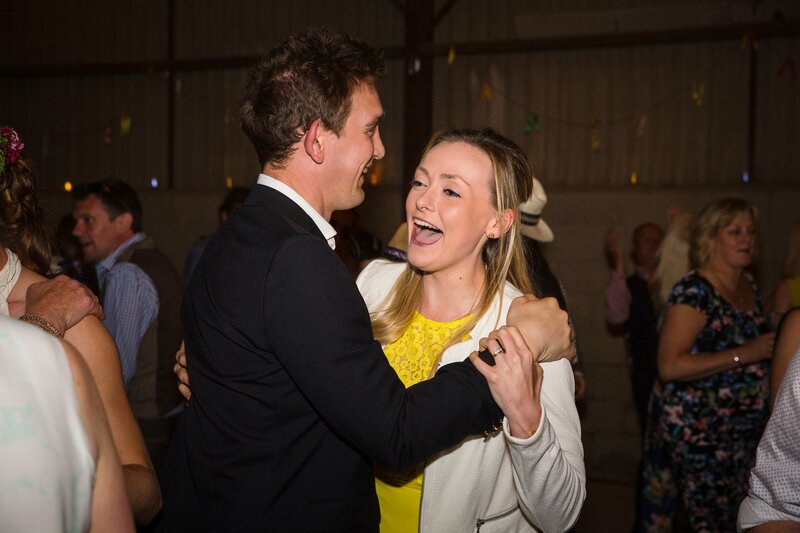 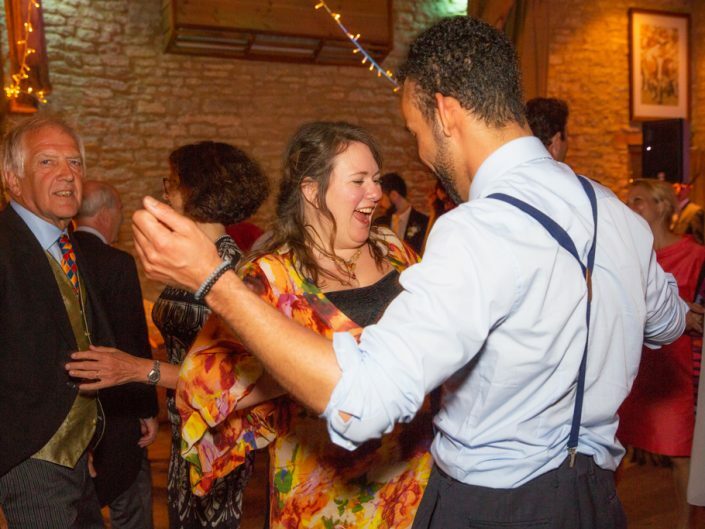 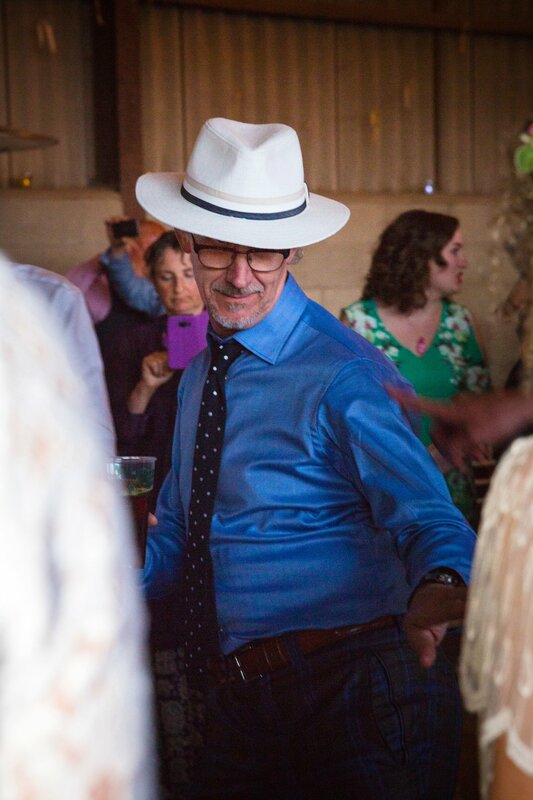 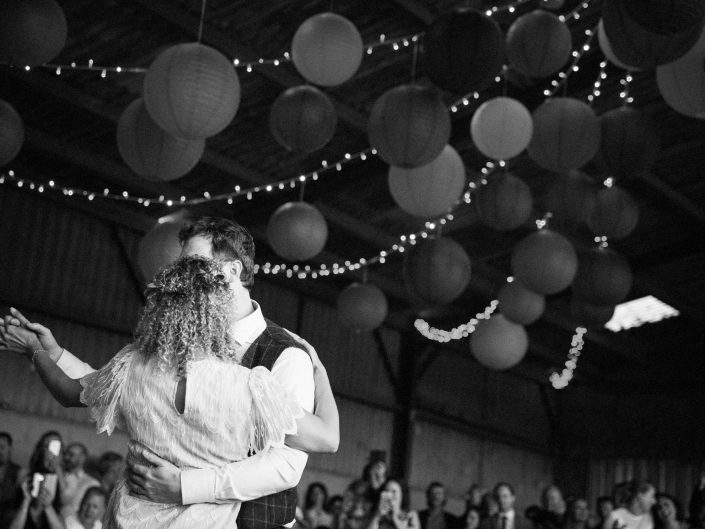 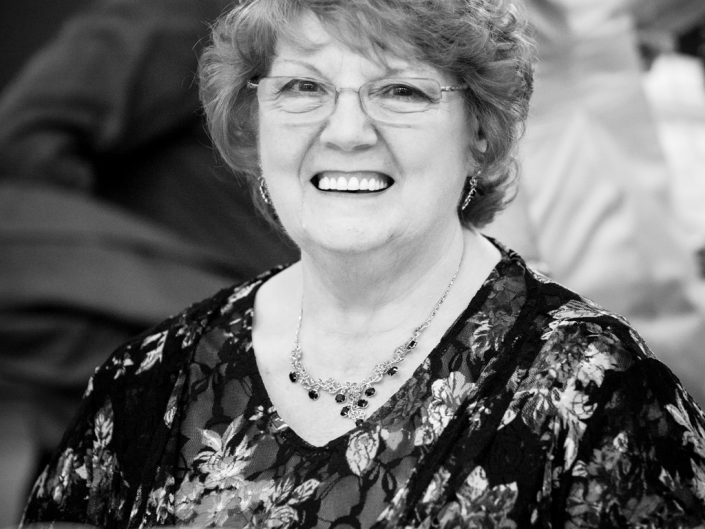 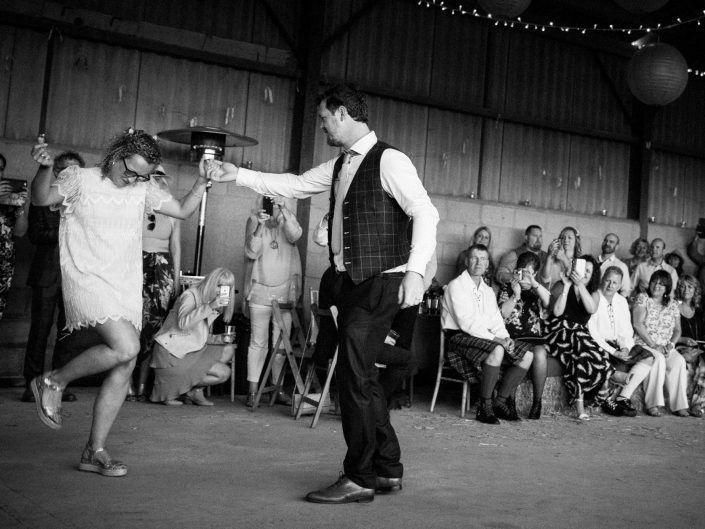 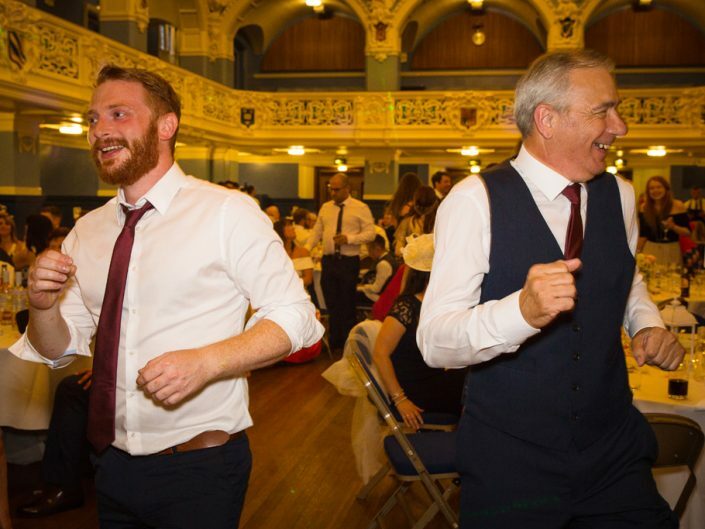 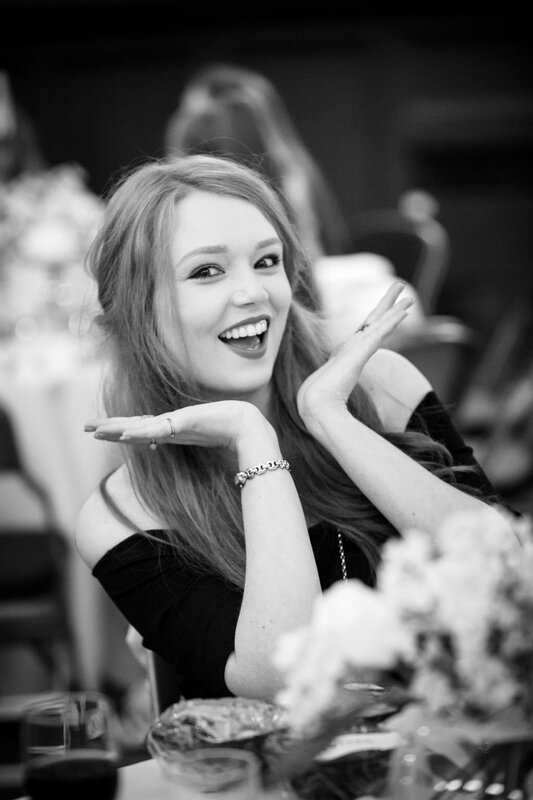 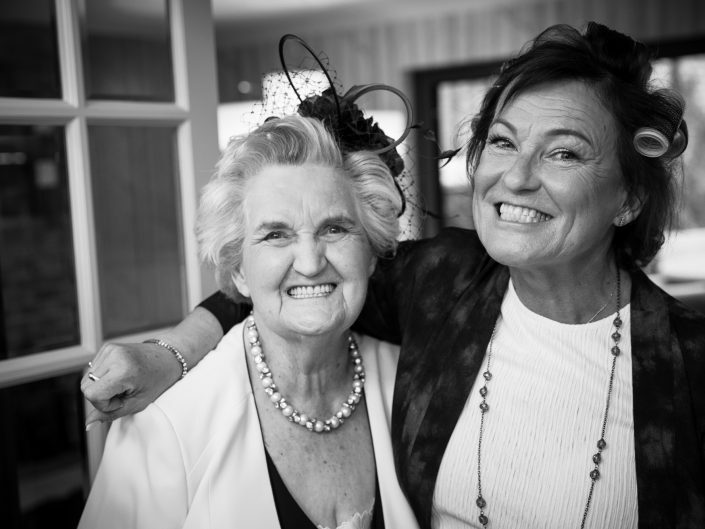 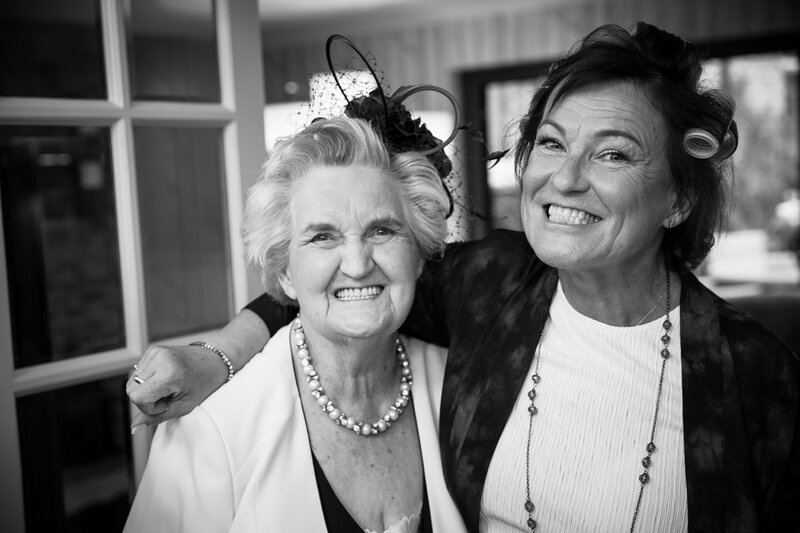 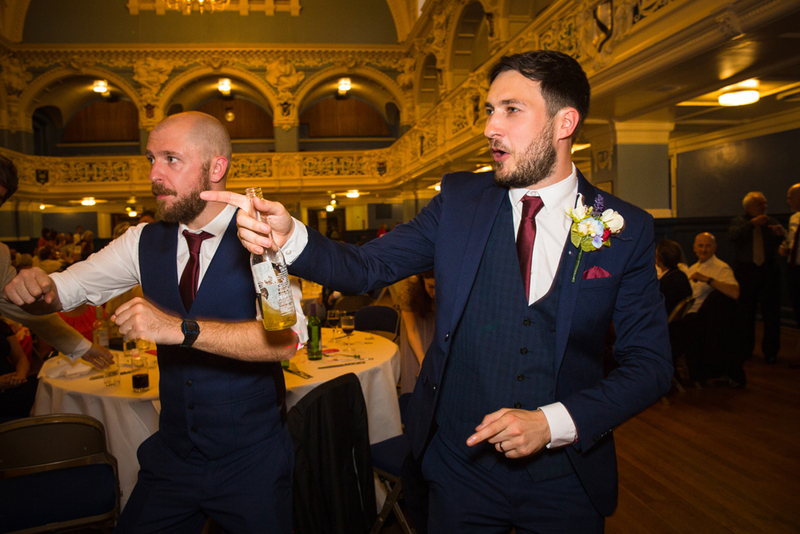 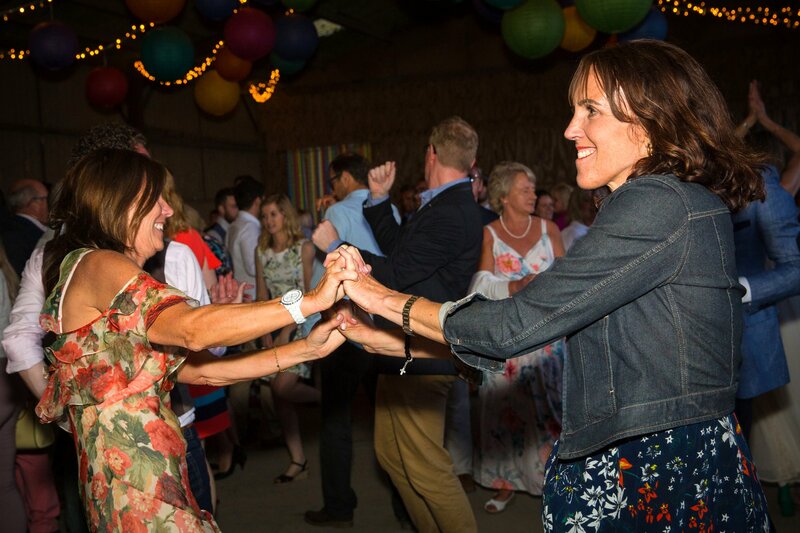 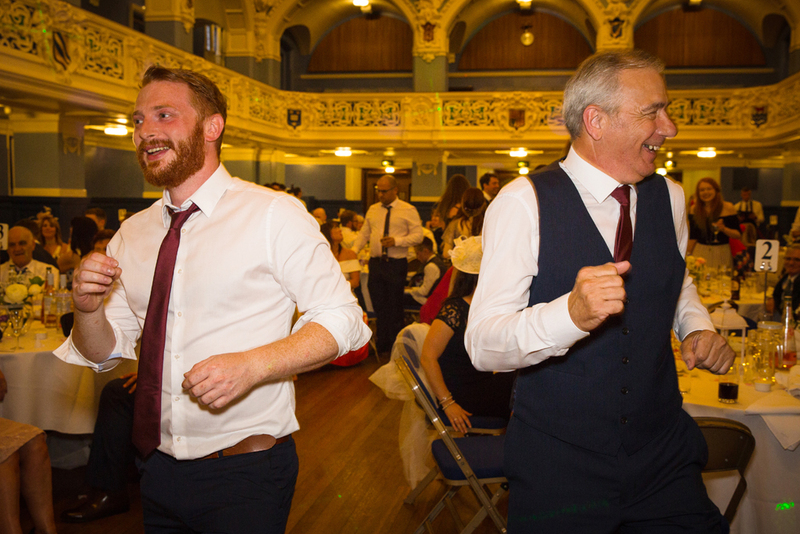 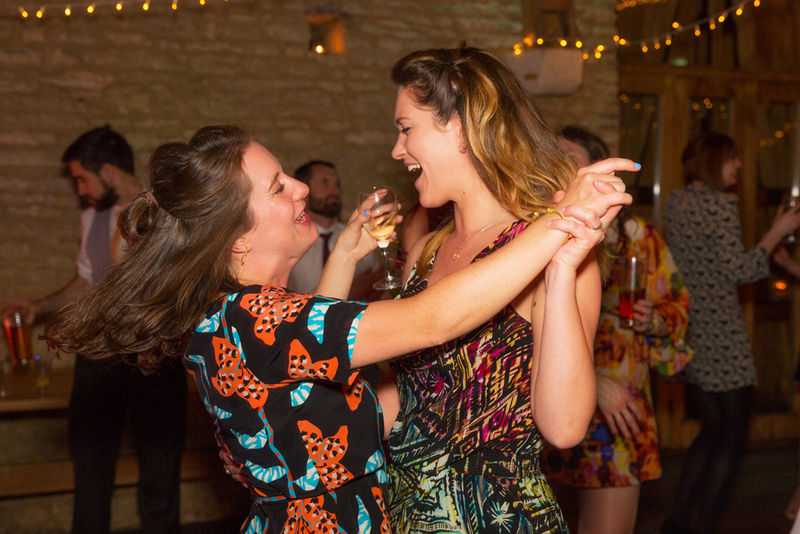 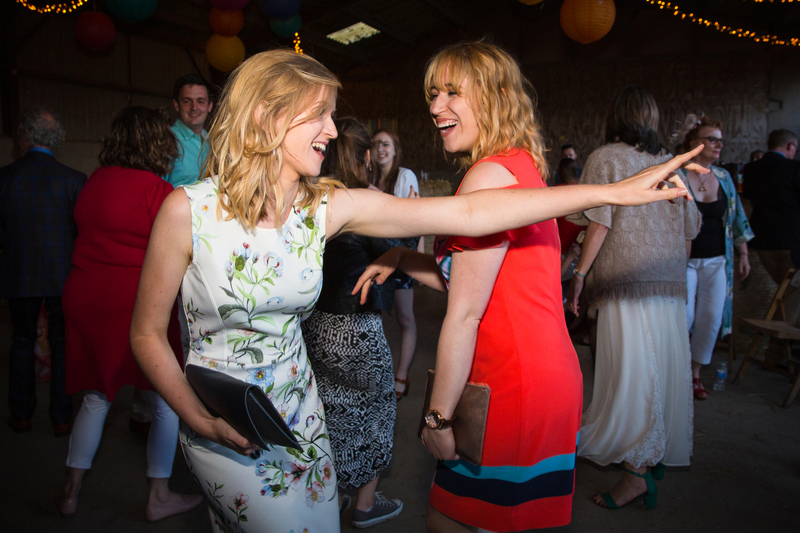 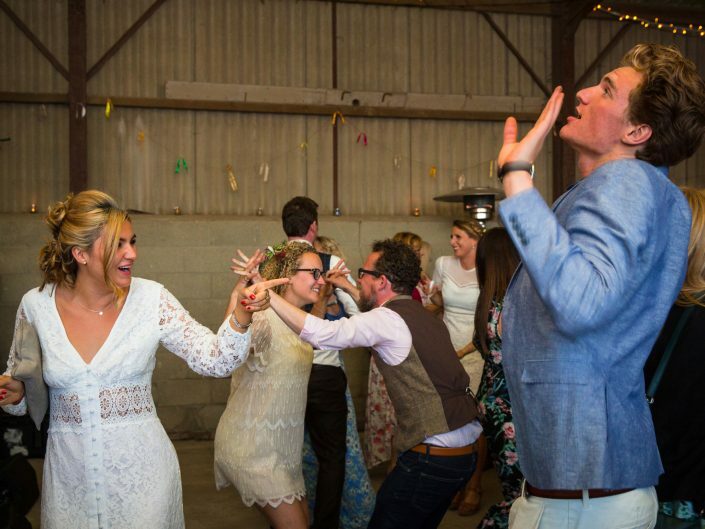 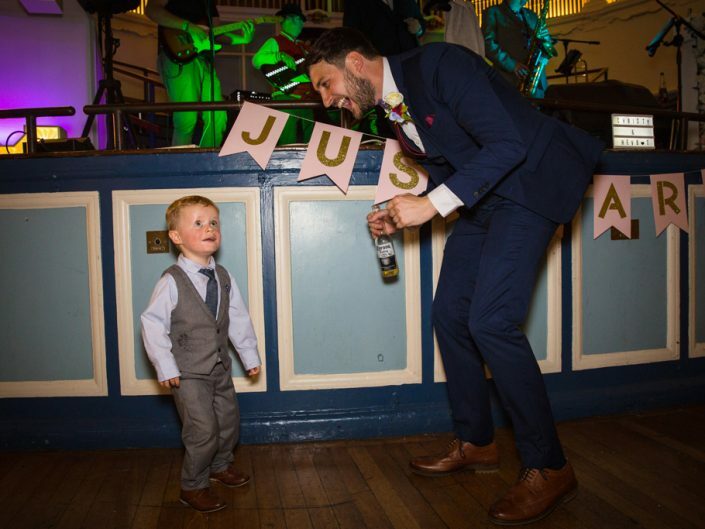 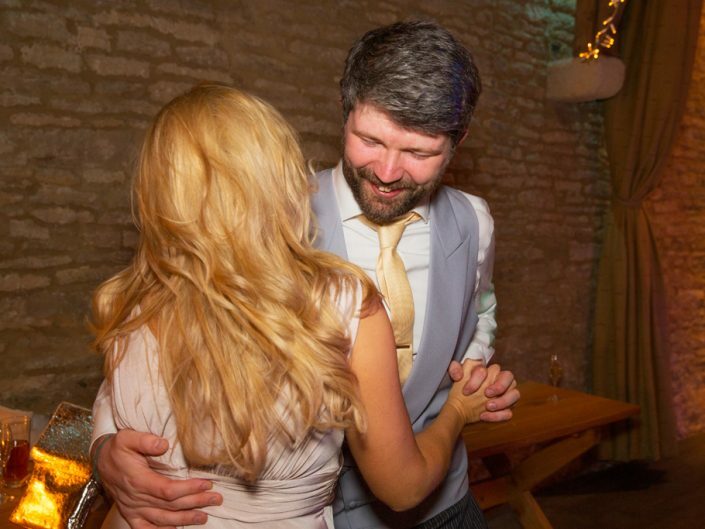 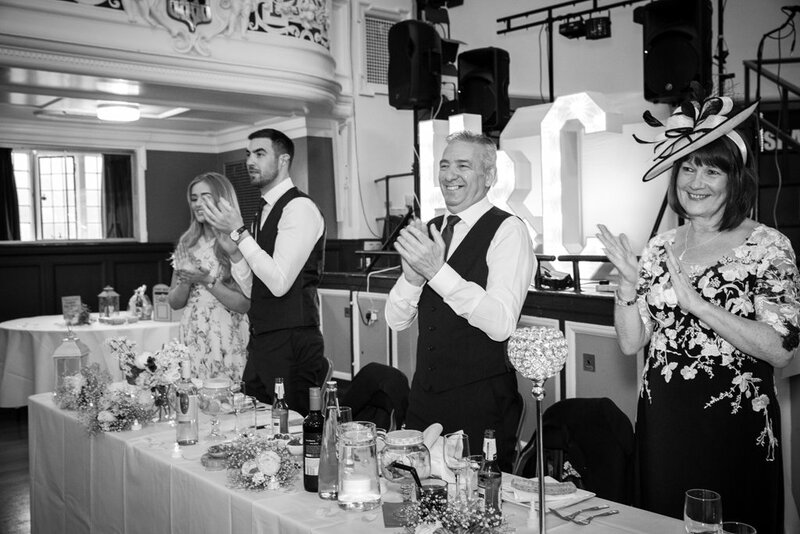 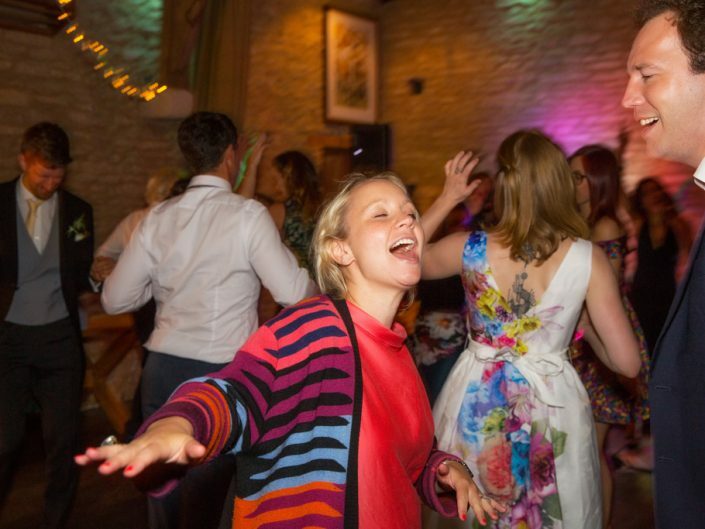 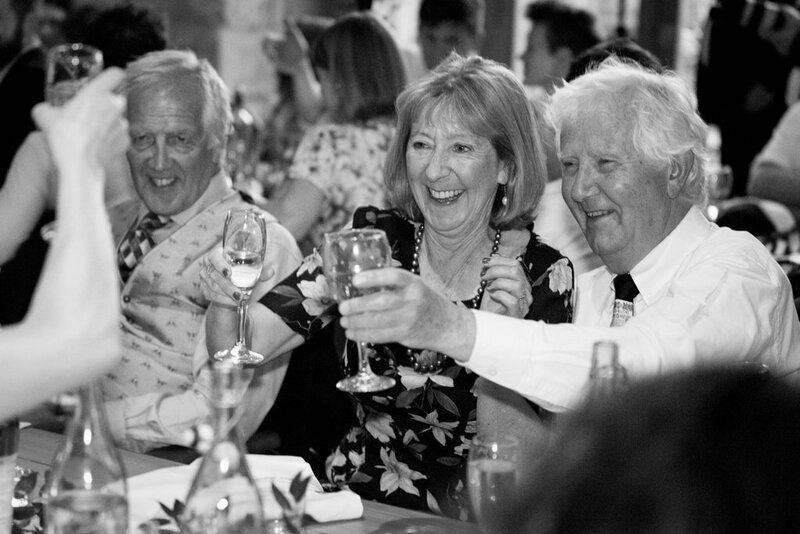 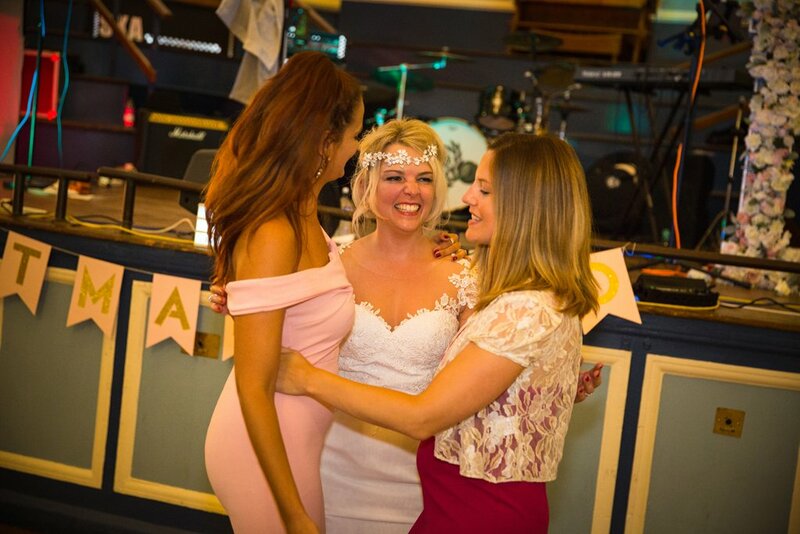 They were soon joined on the dance floor by their friends & family….& we then joined them to dance the night away! 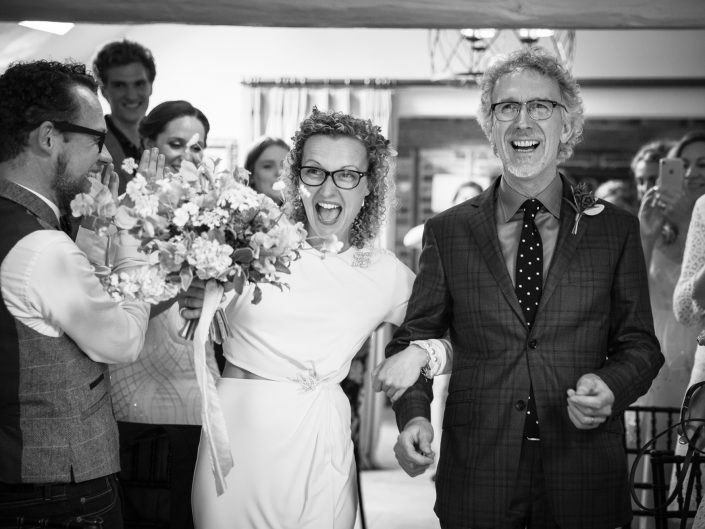 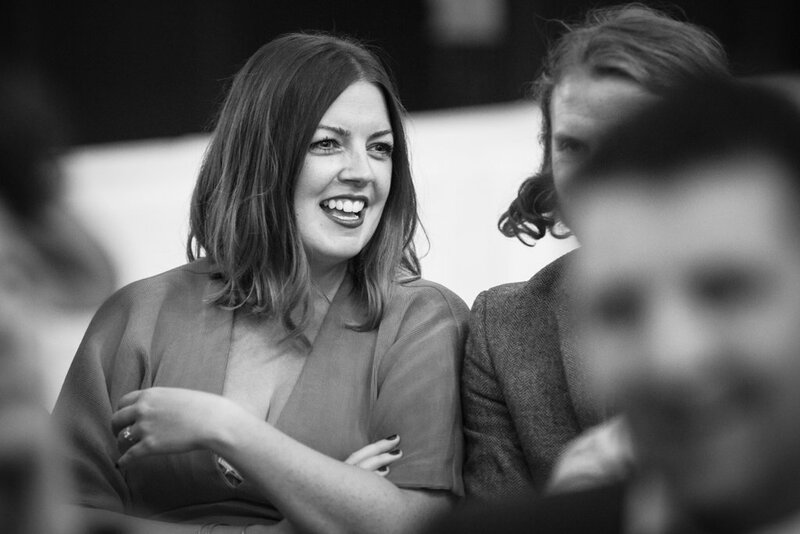 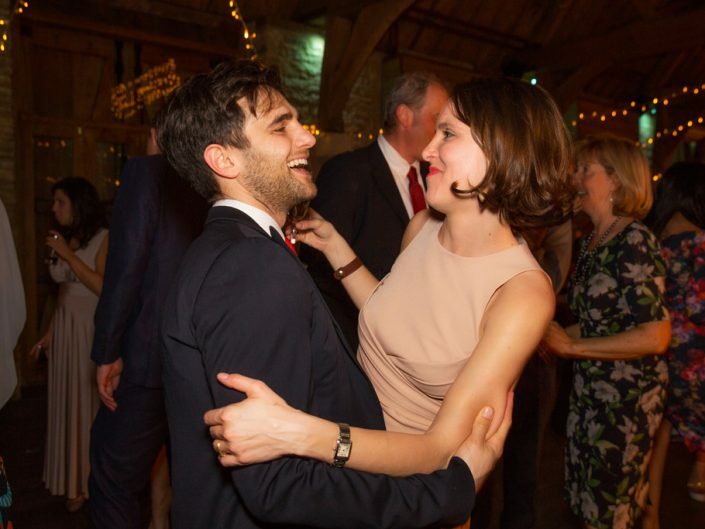 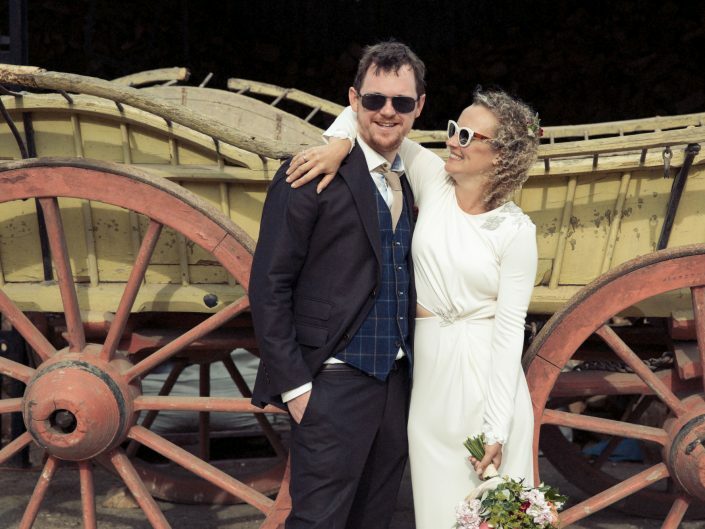 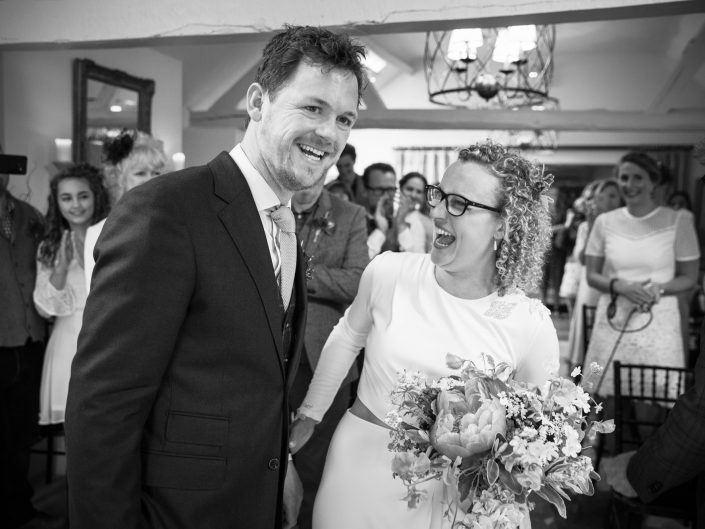 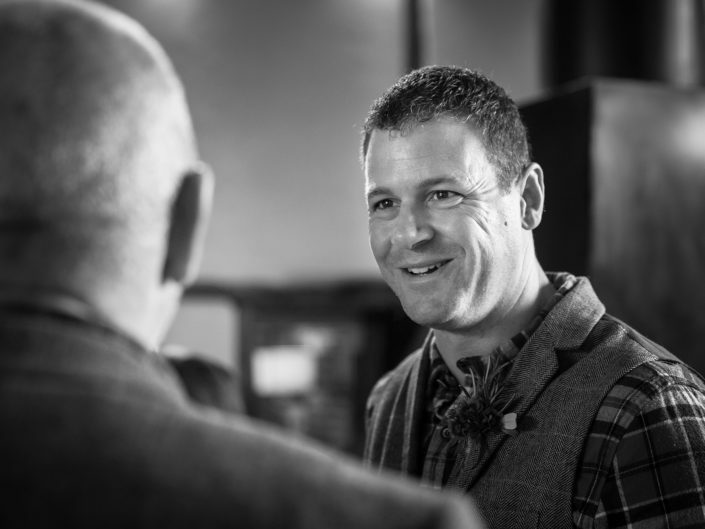 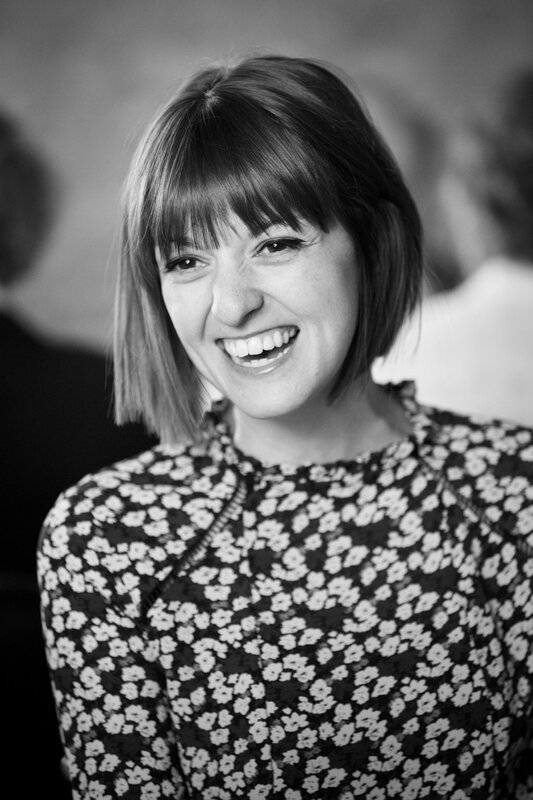 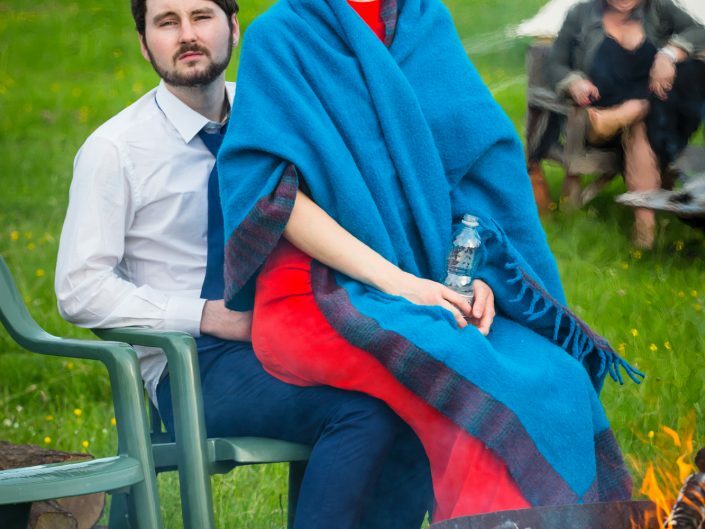 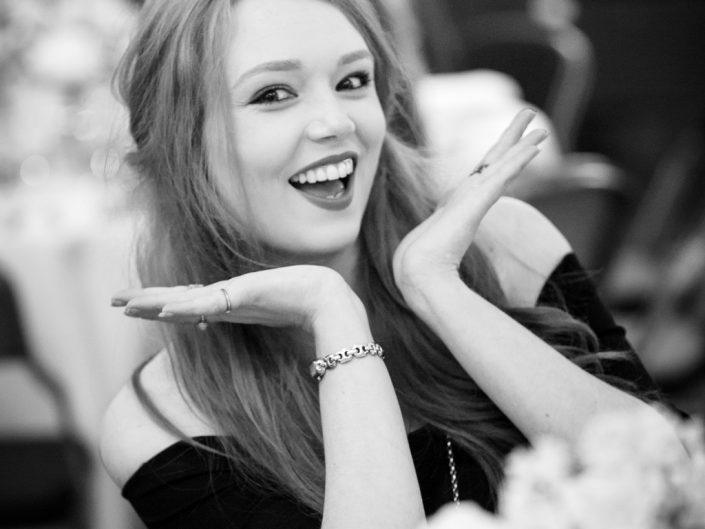 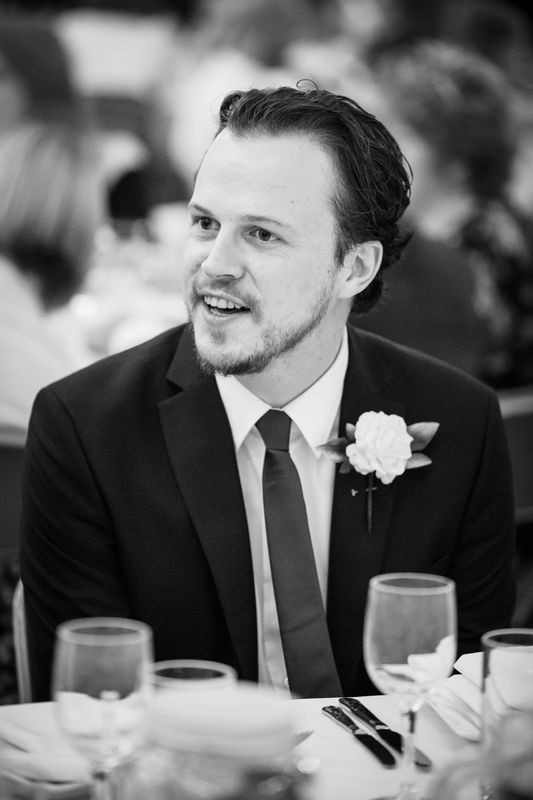 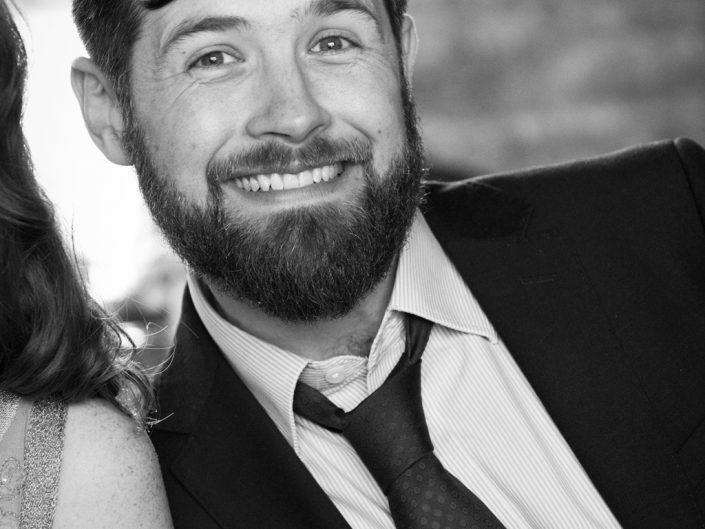 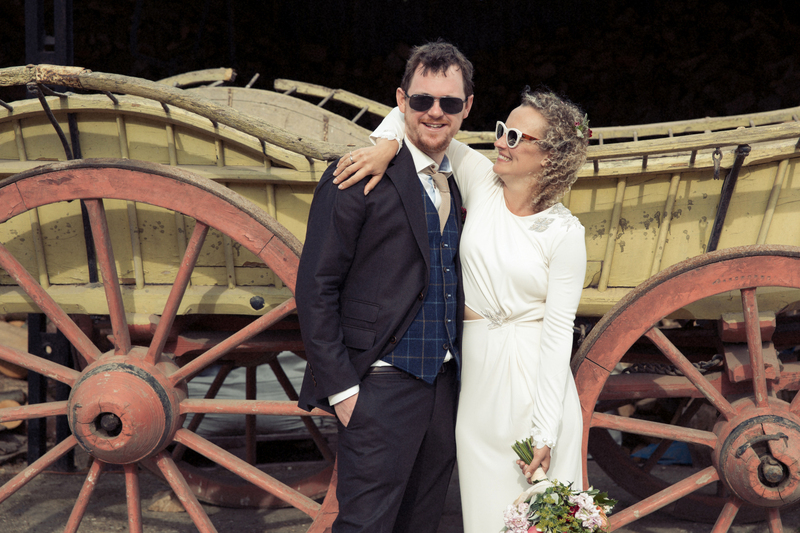 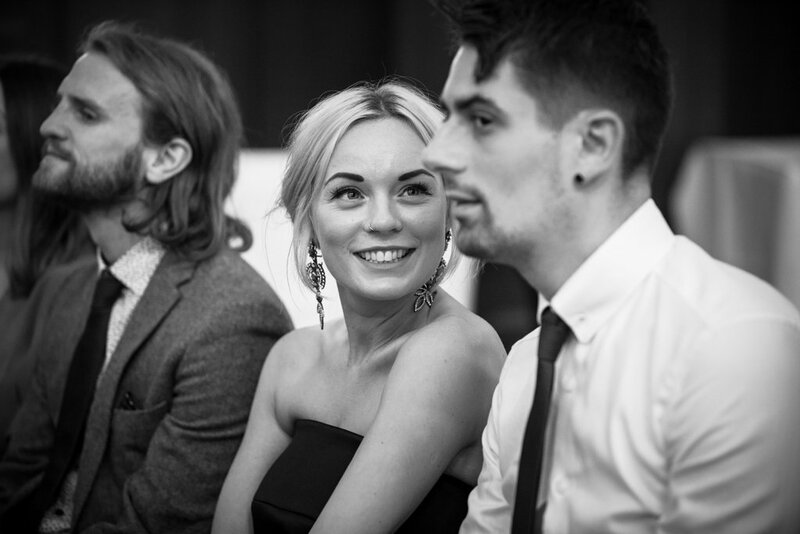 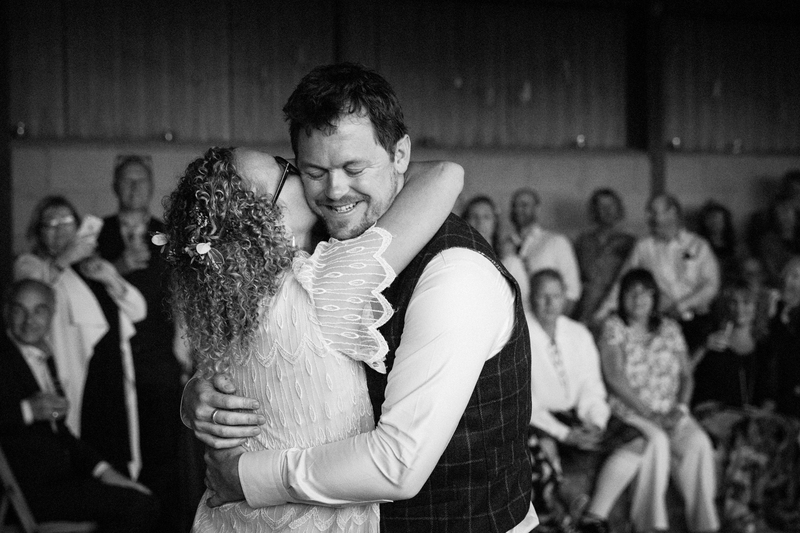 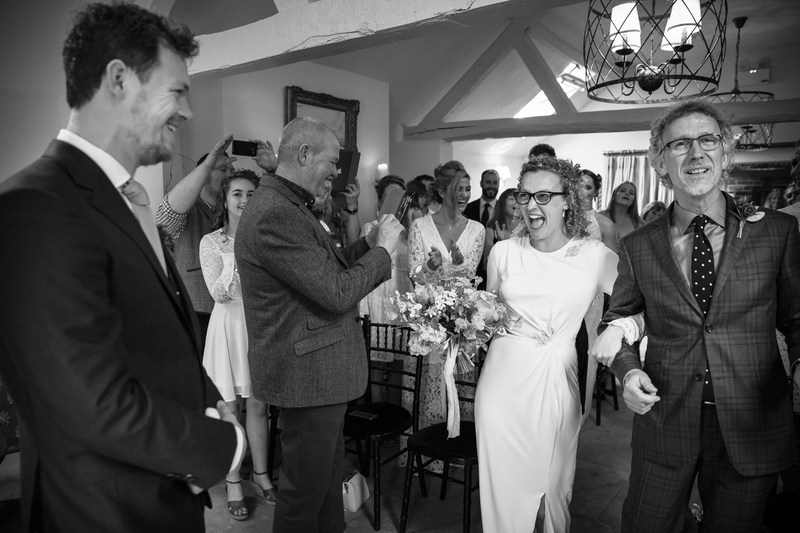 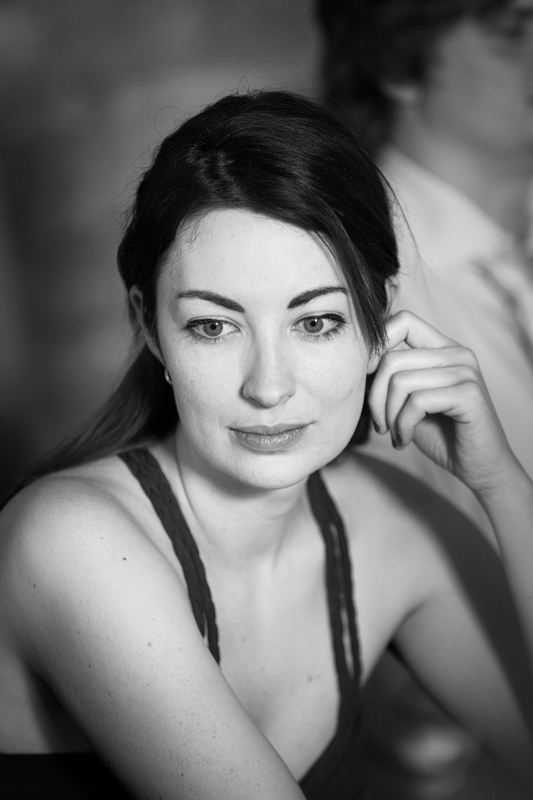 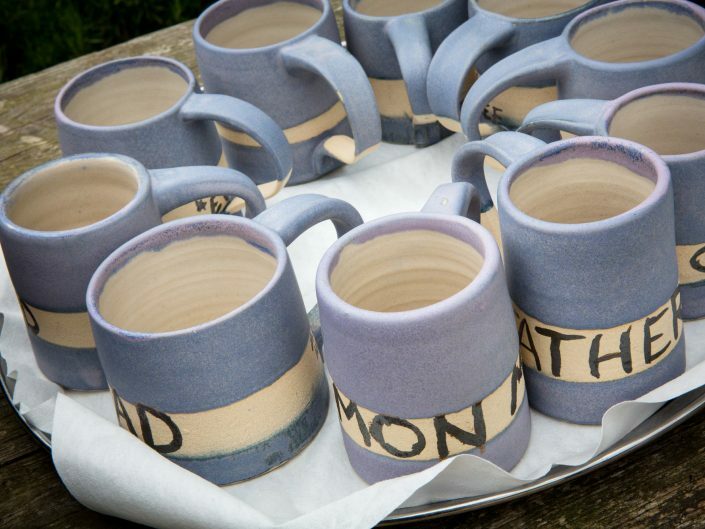 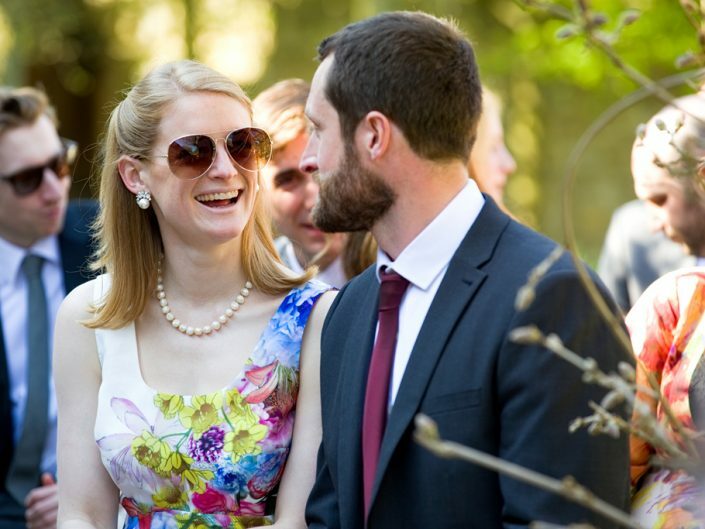 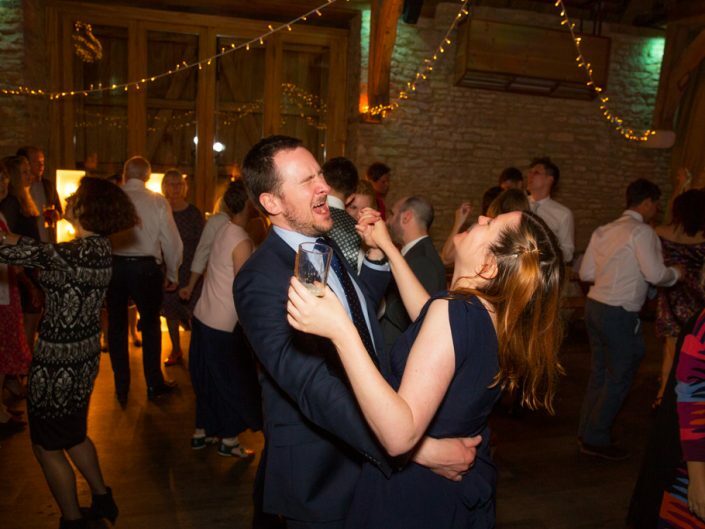 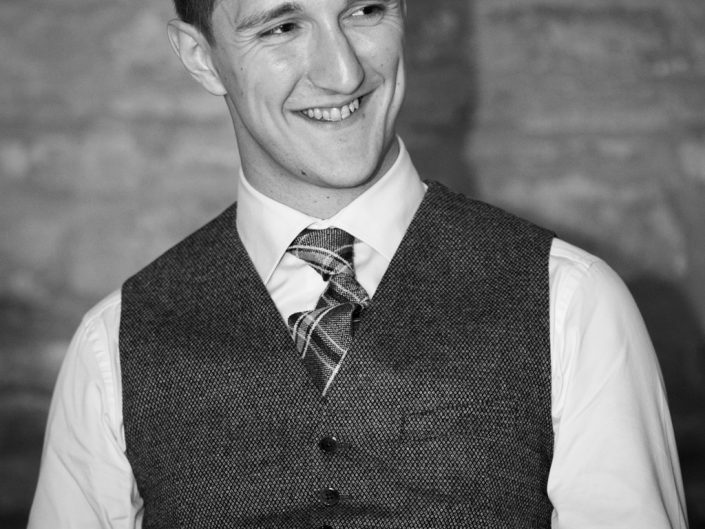 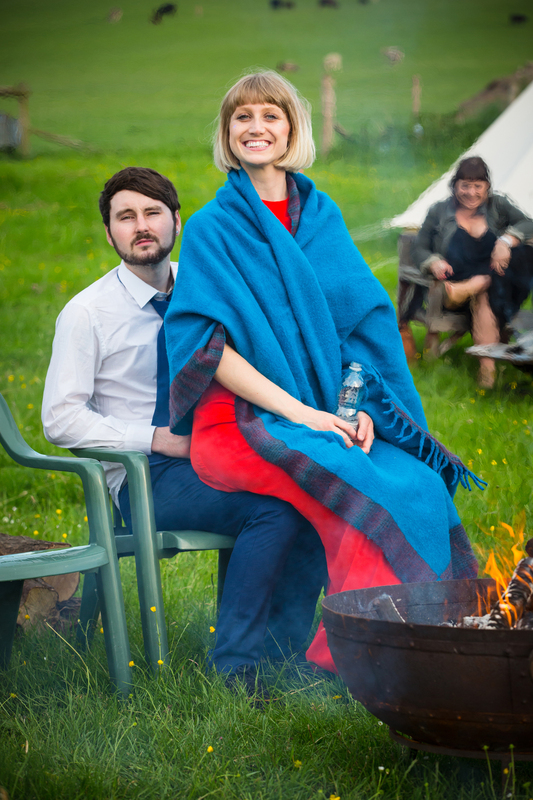 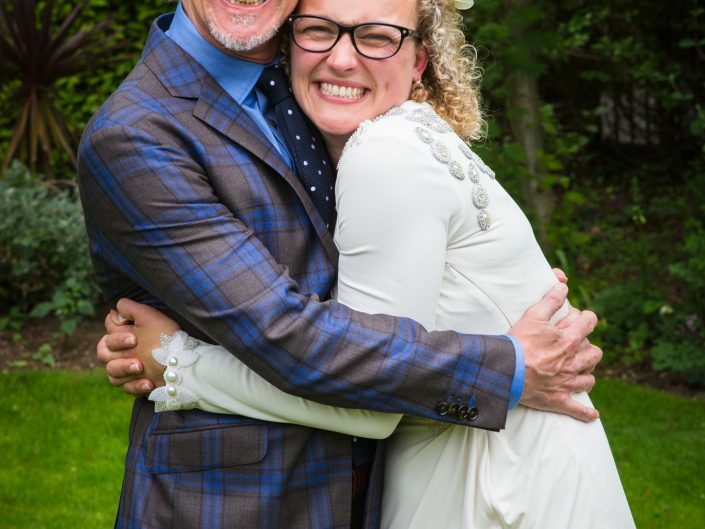 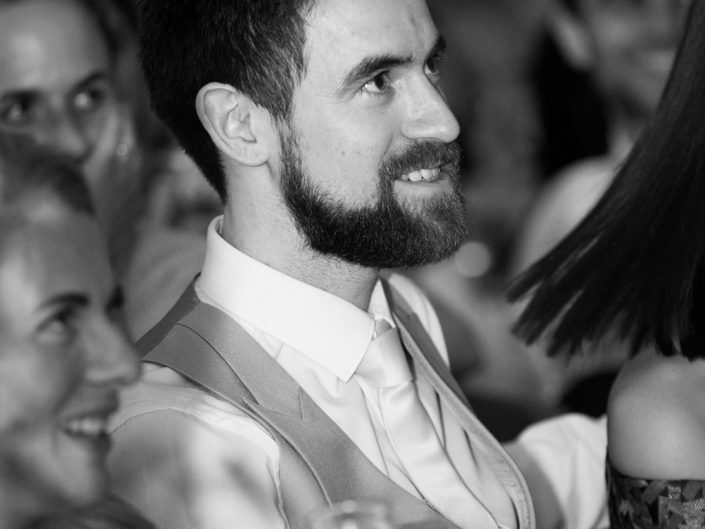 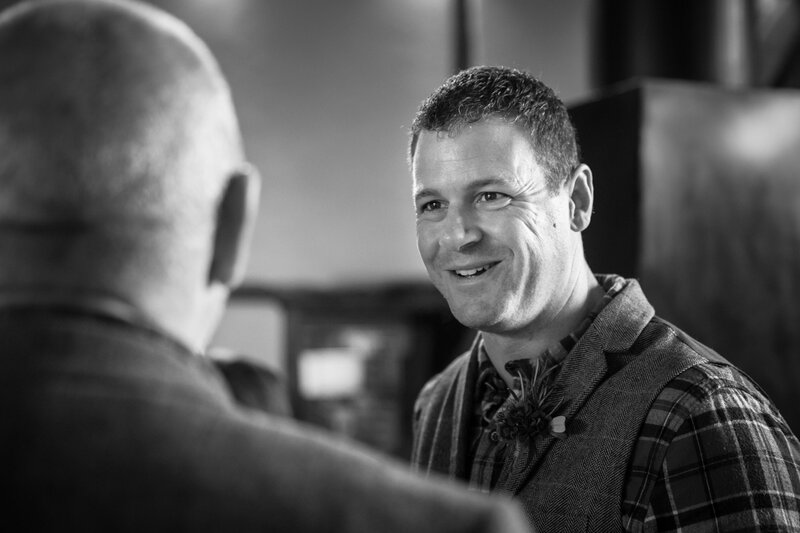 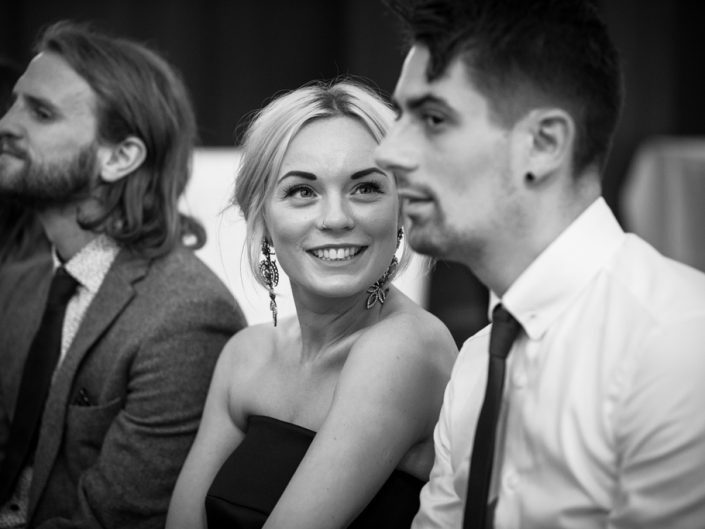 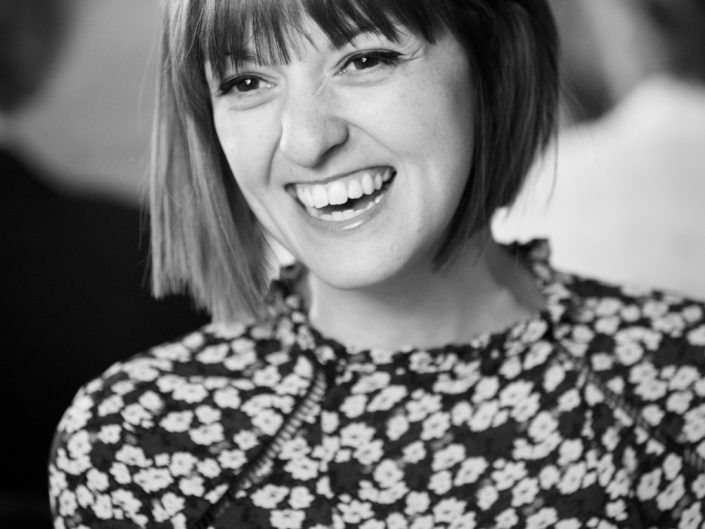 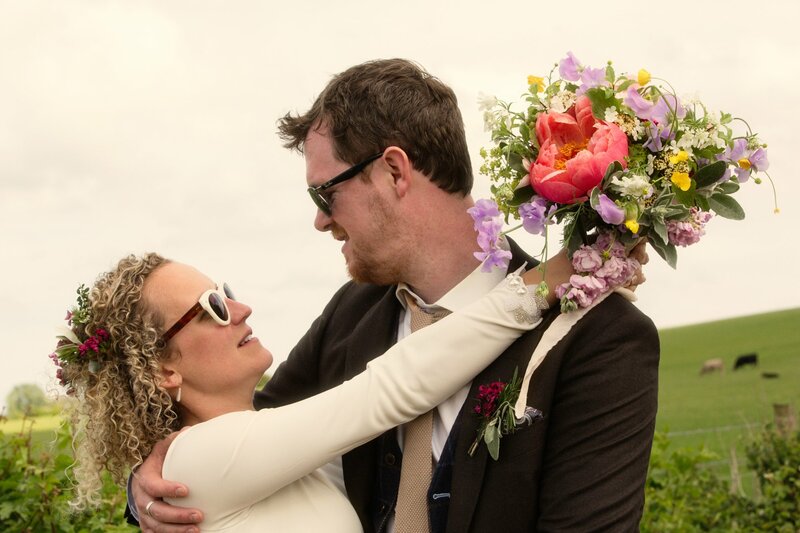 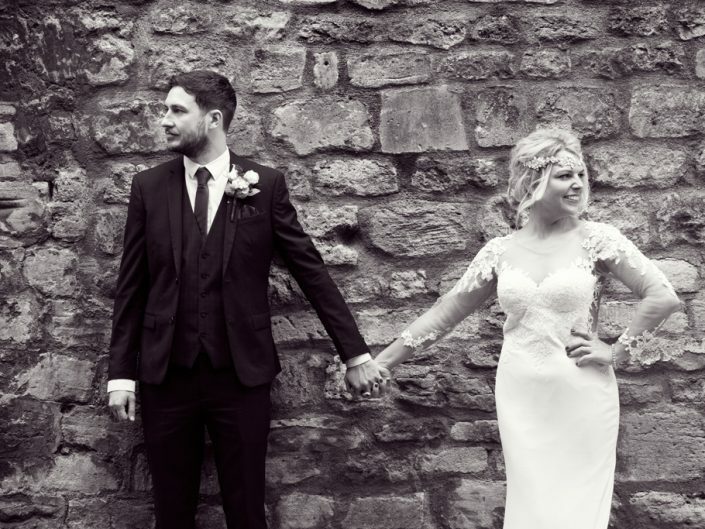 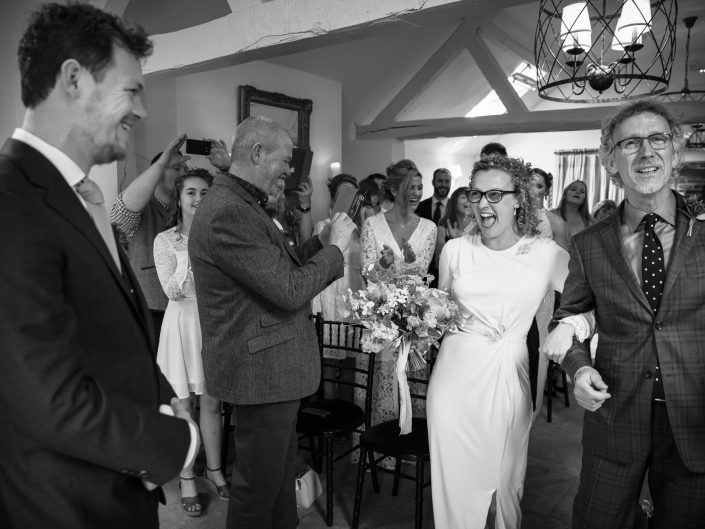 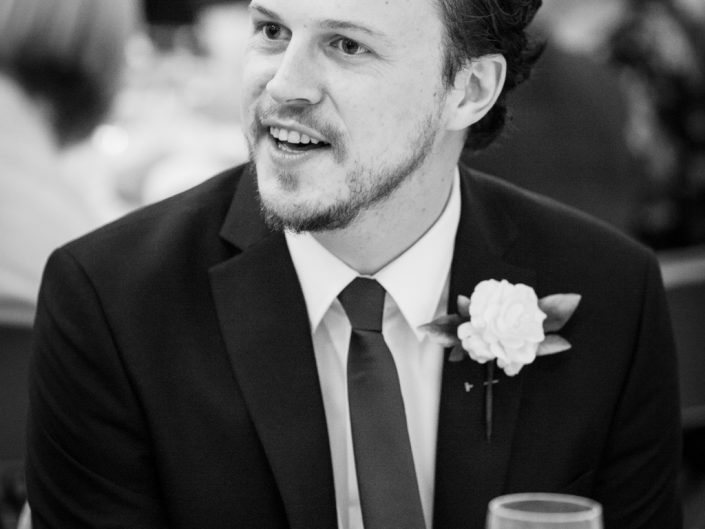 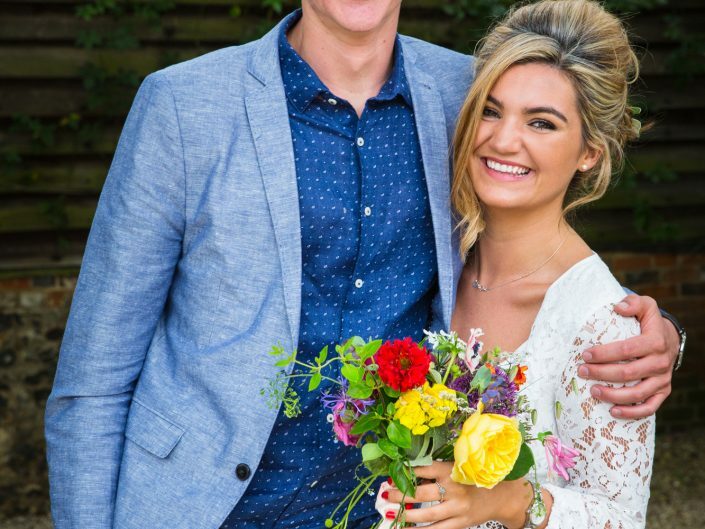 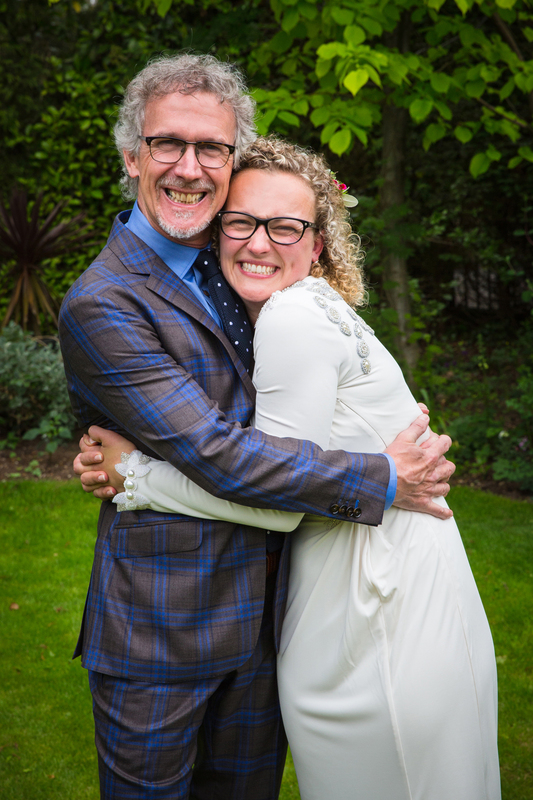 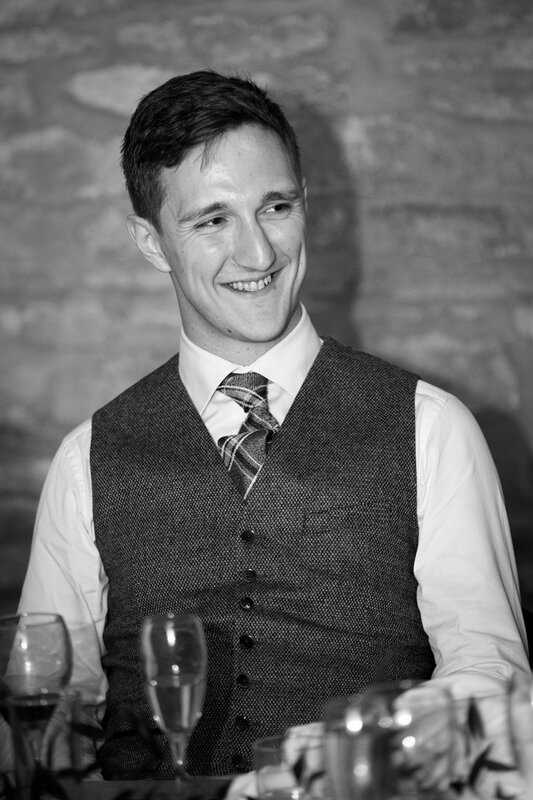 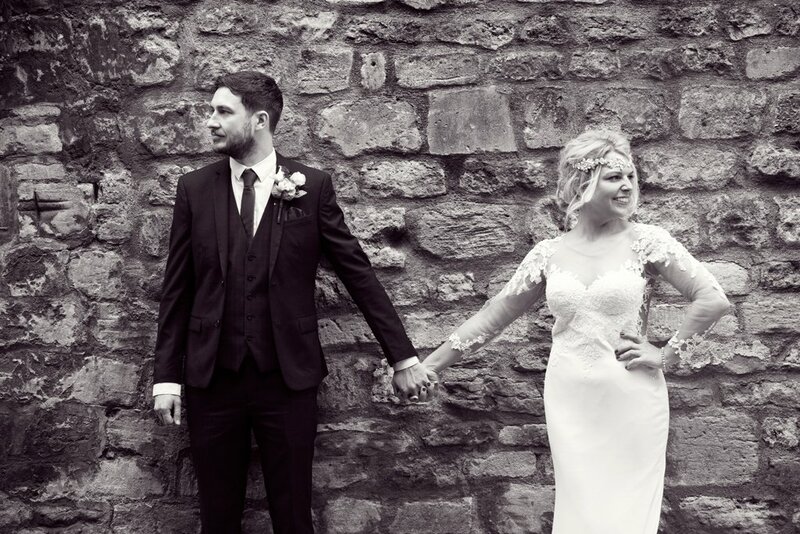 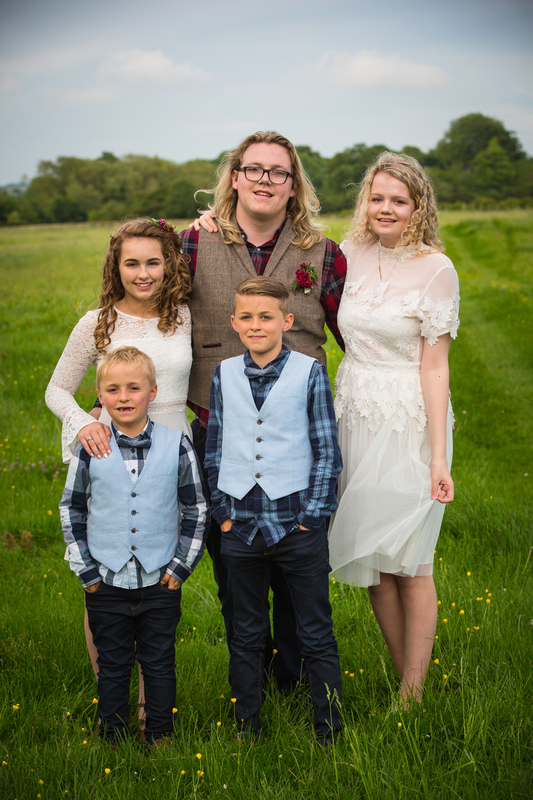 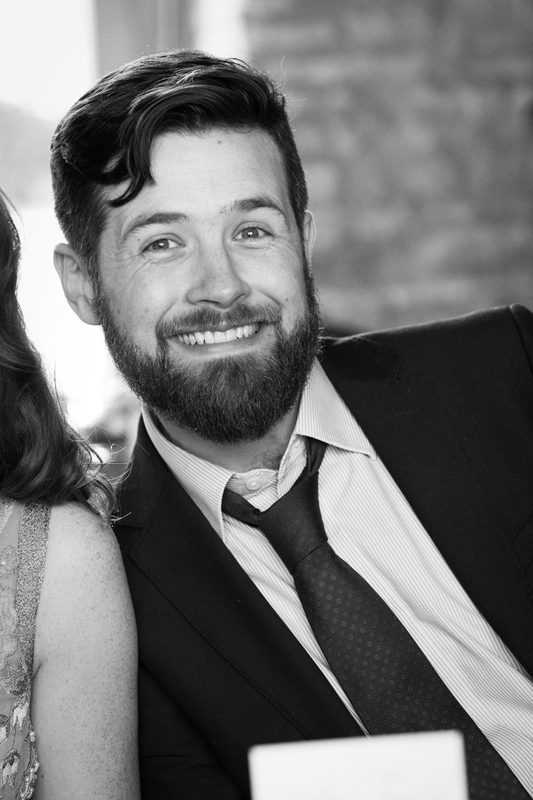 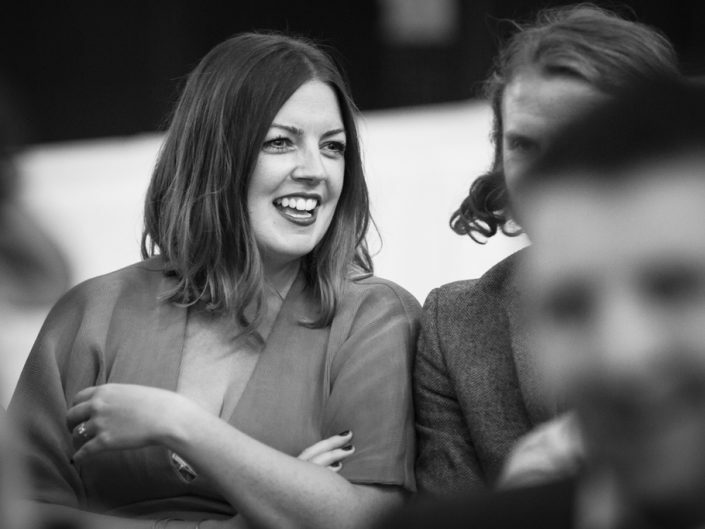 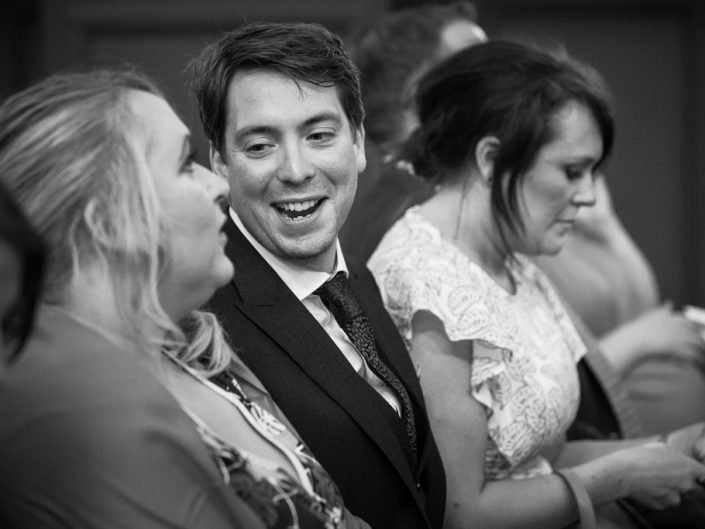 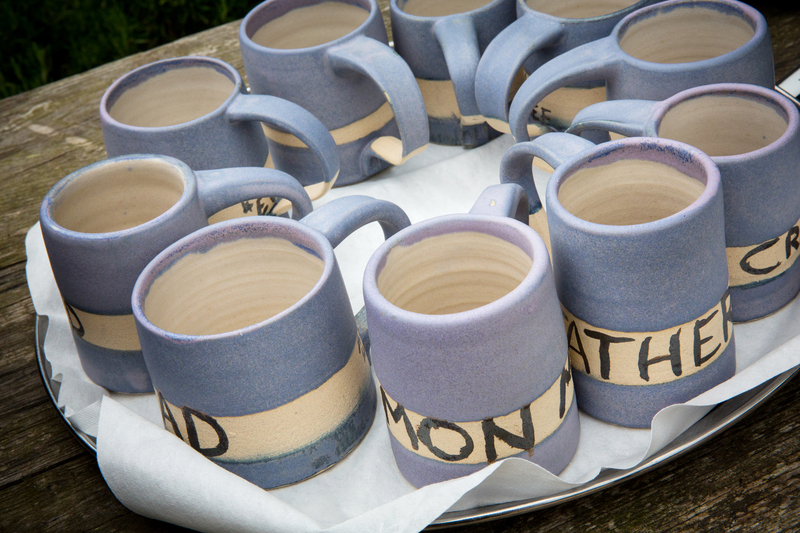 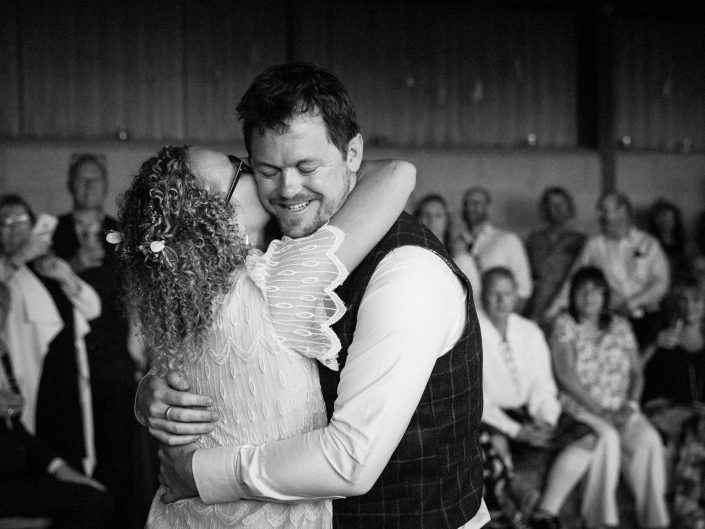 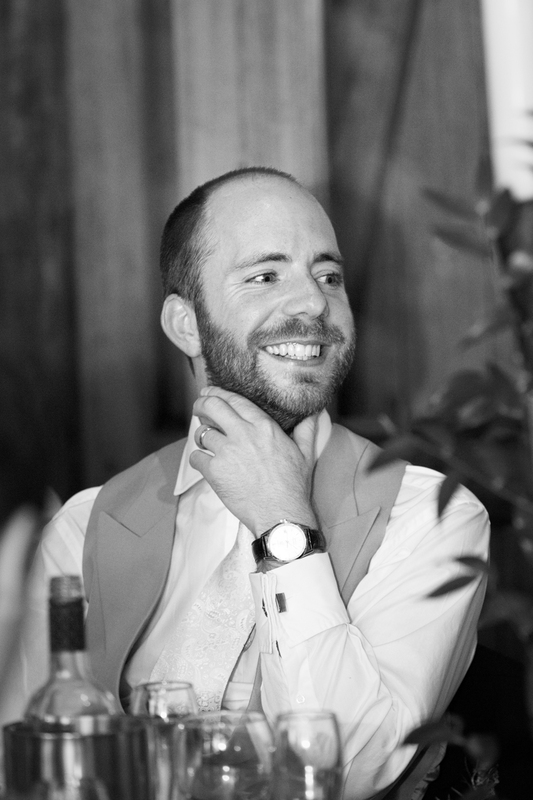 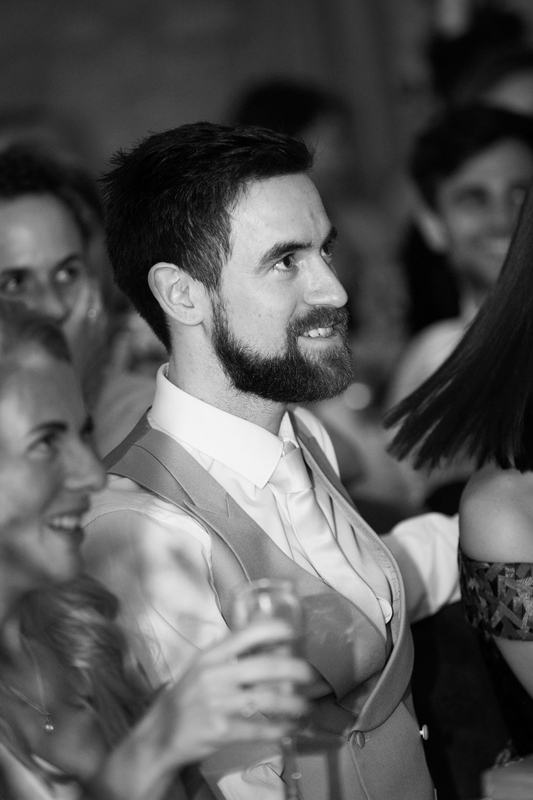 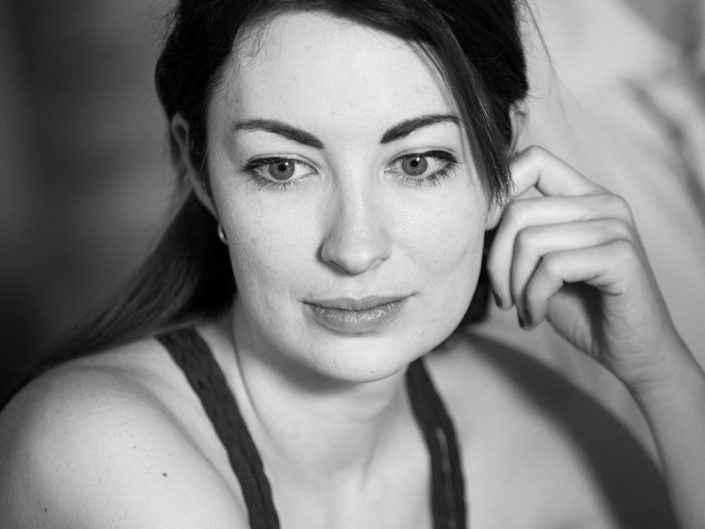 About the happy couple: Andrew & Eilidh are an incredibly talented pair. 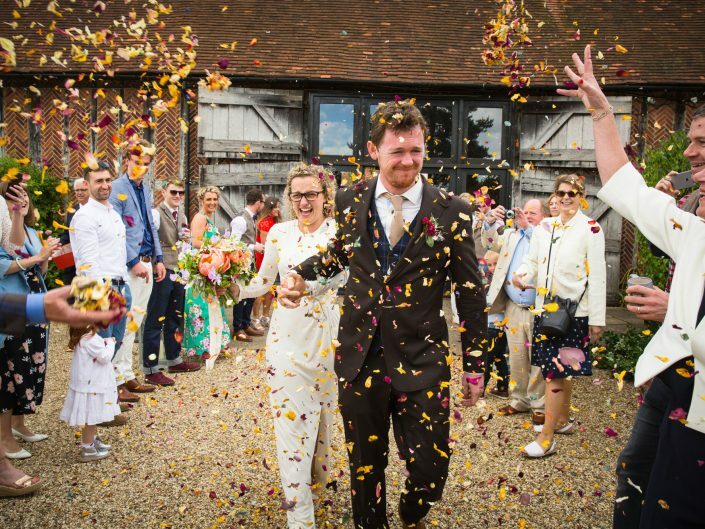 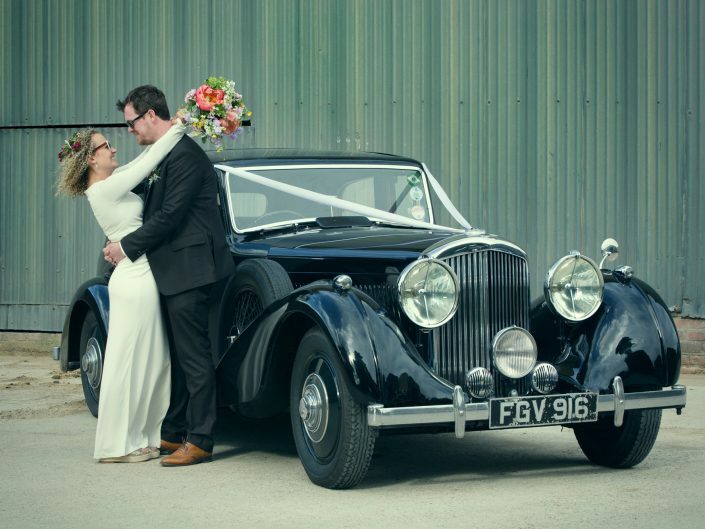 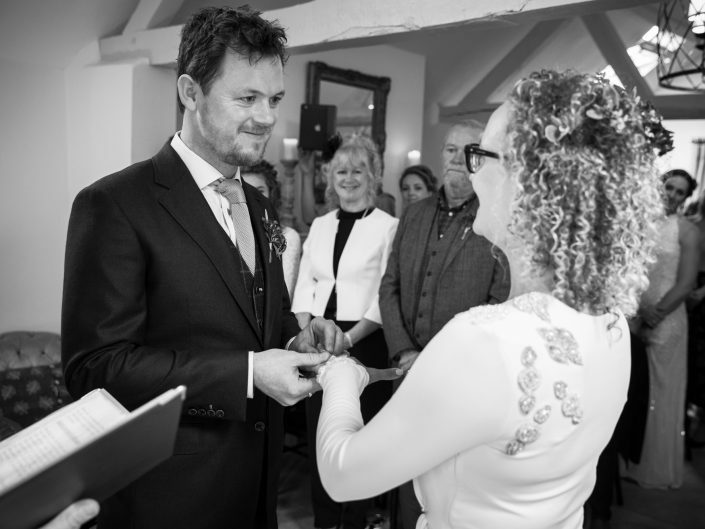 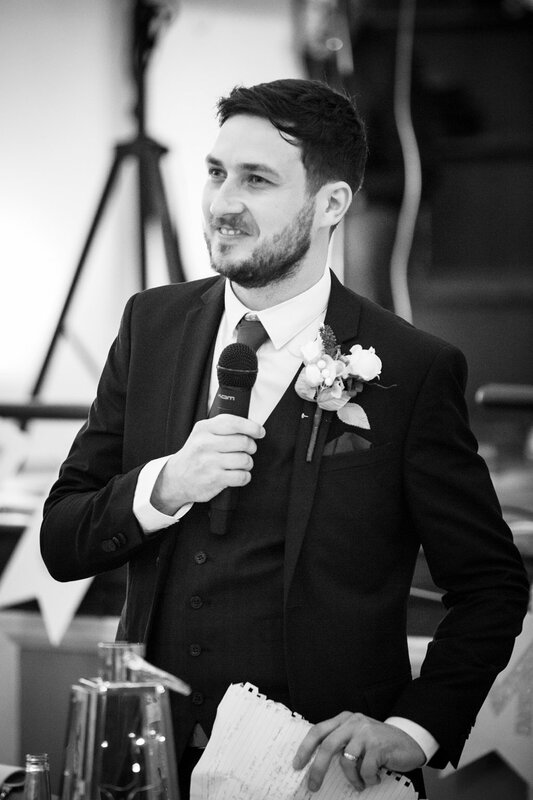 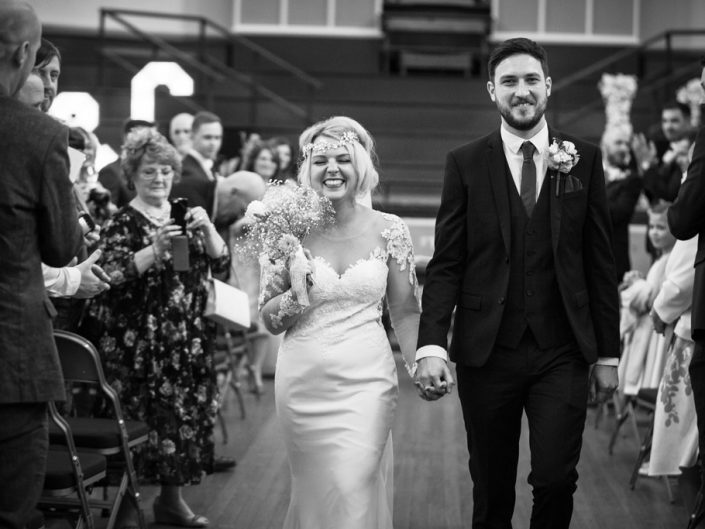 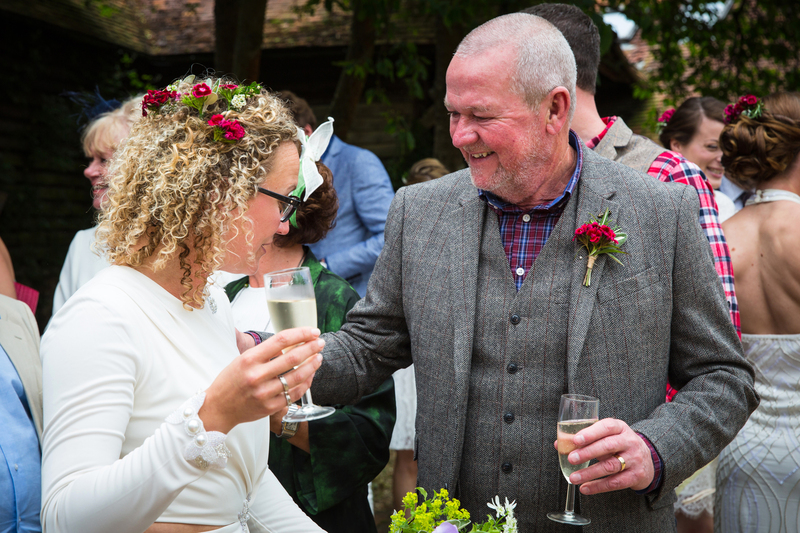 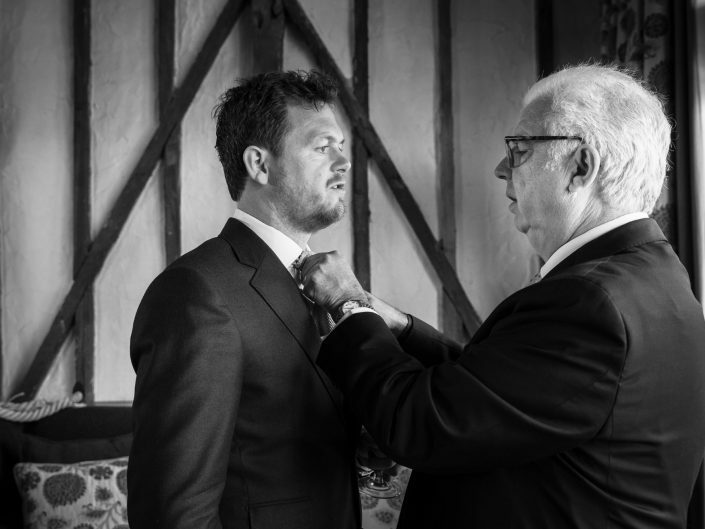 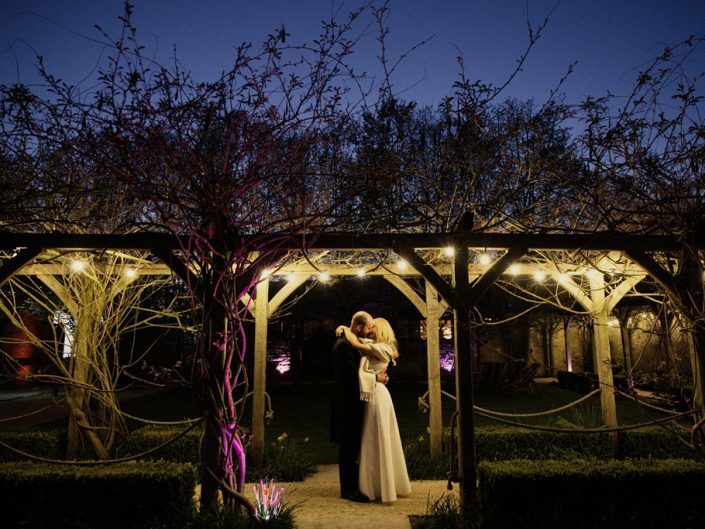 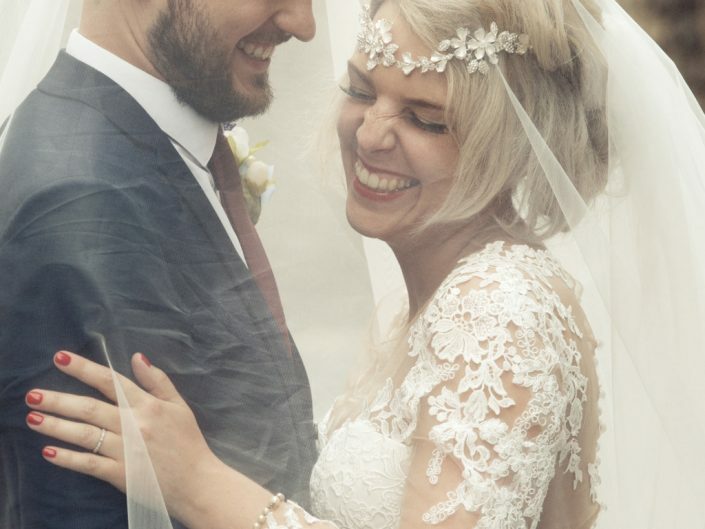 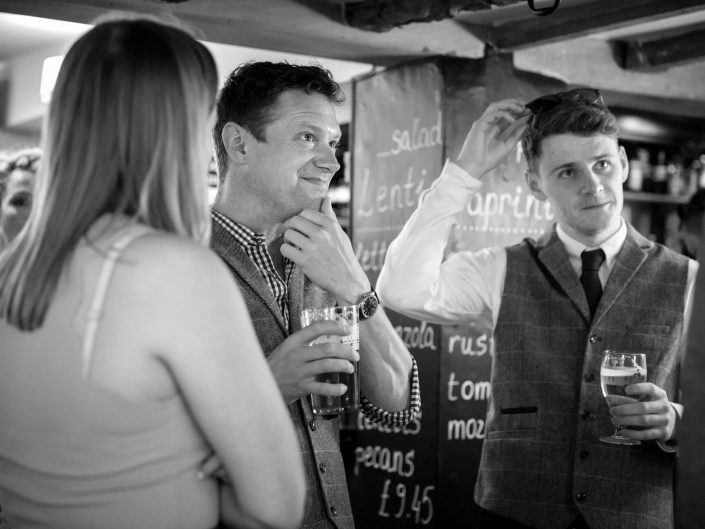 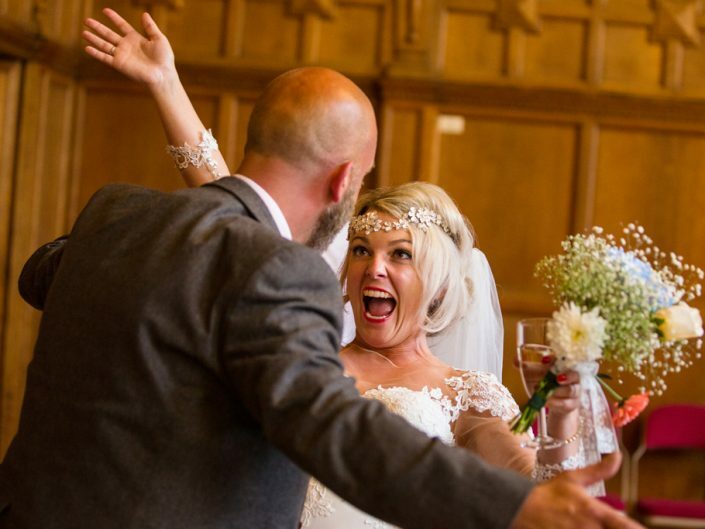 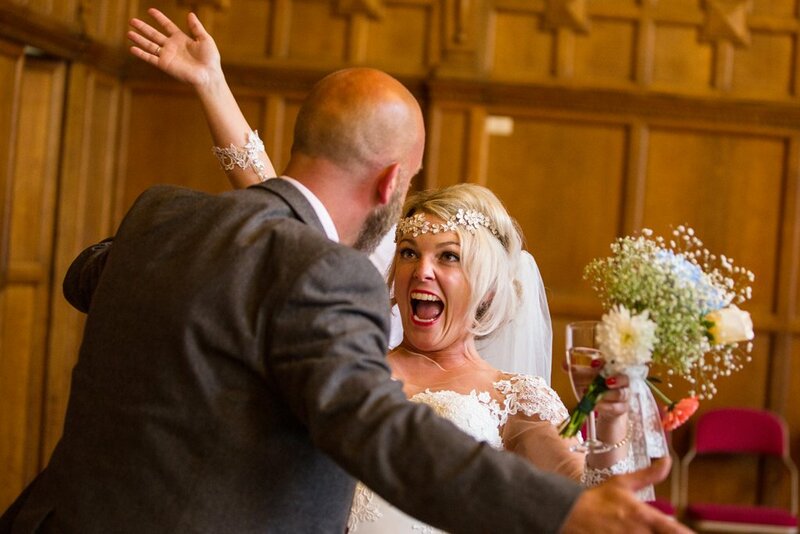 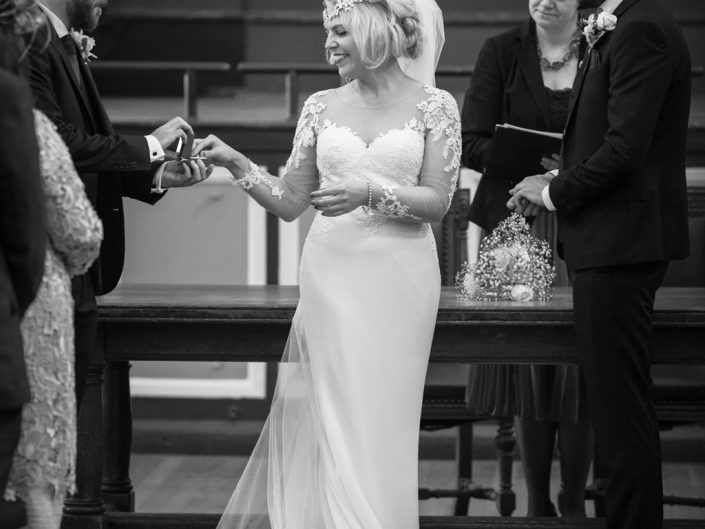 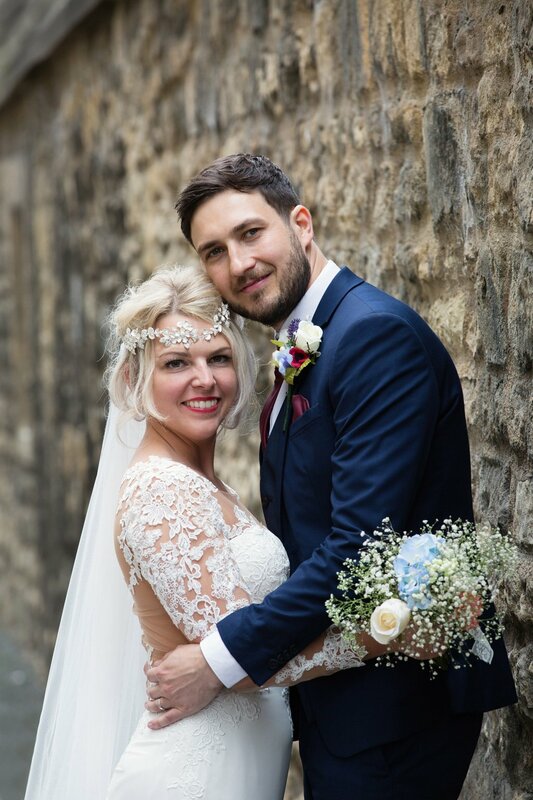 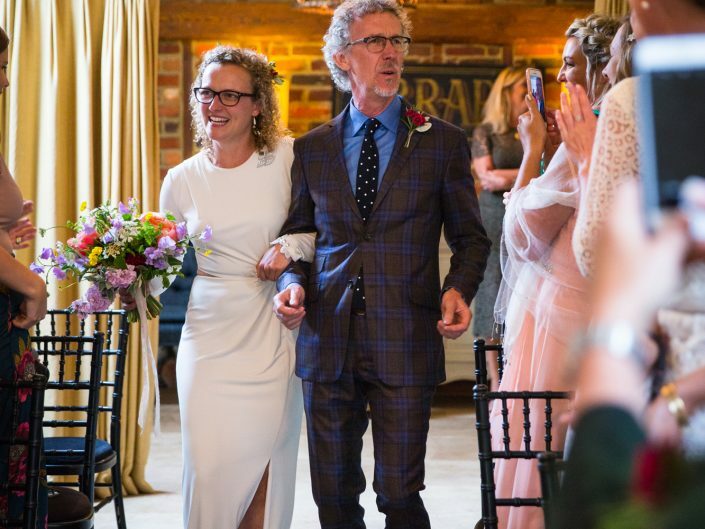 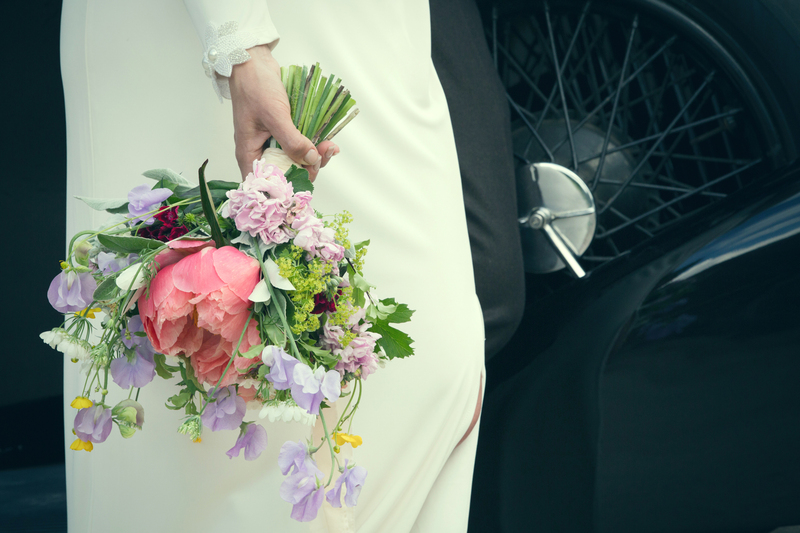 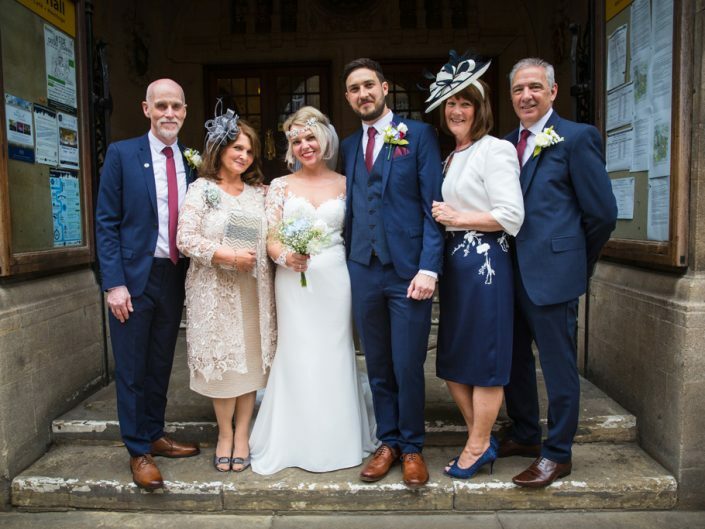 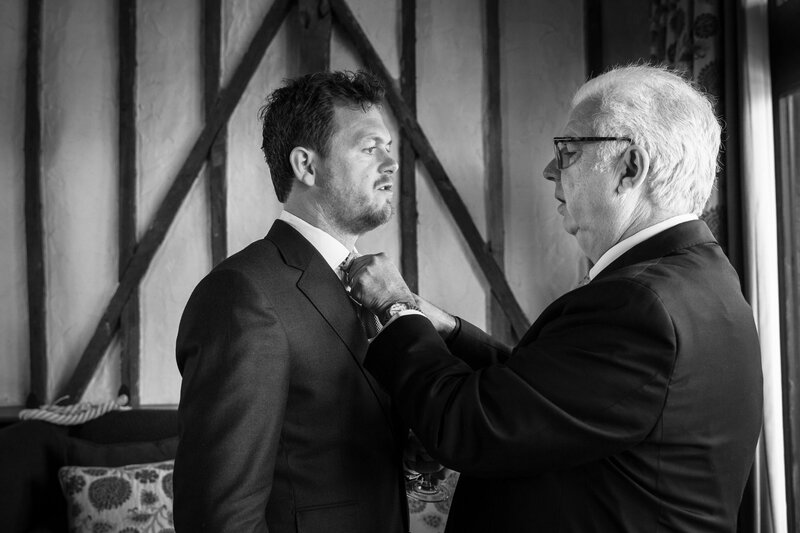 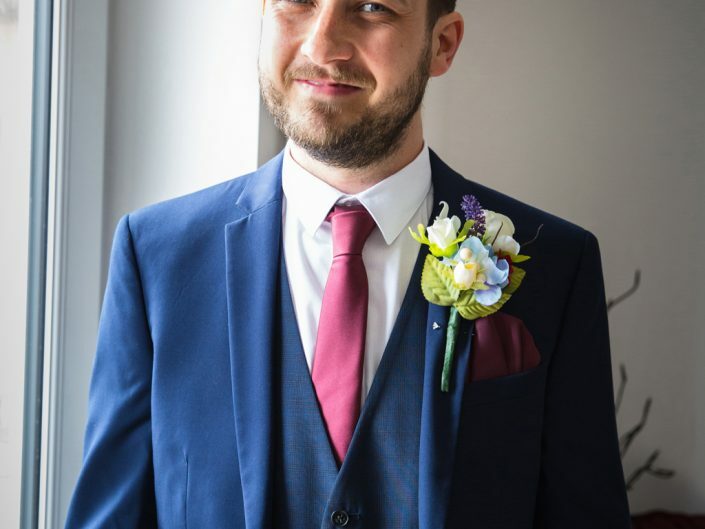 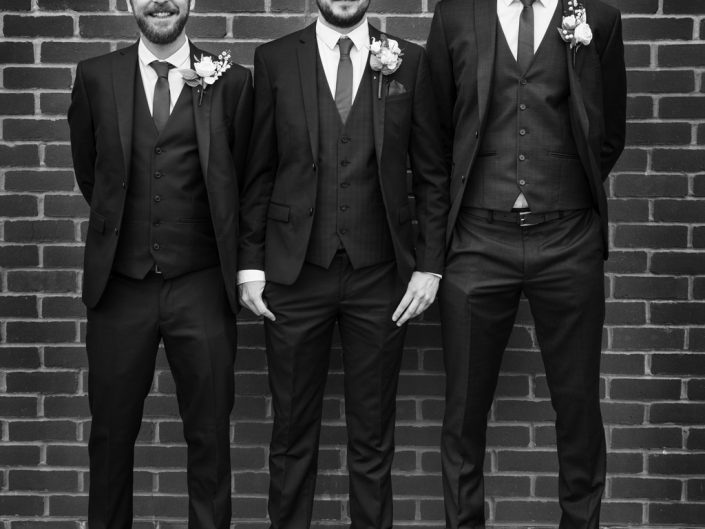 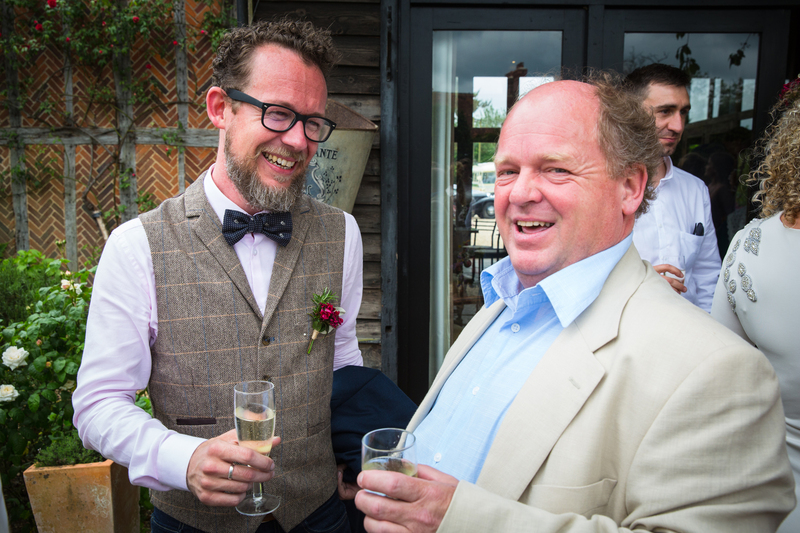 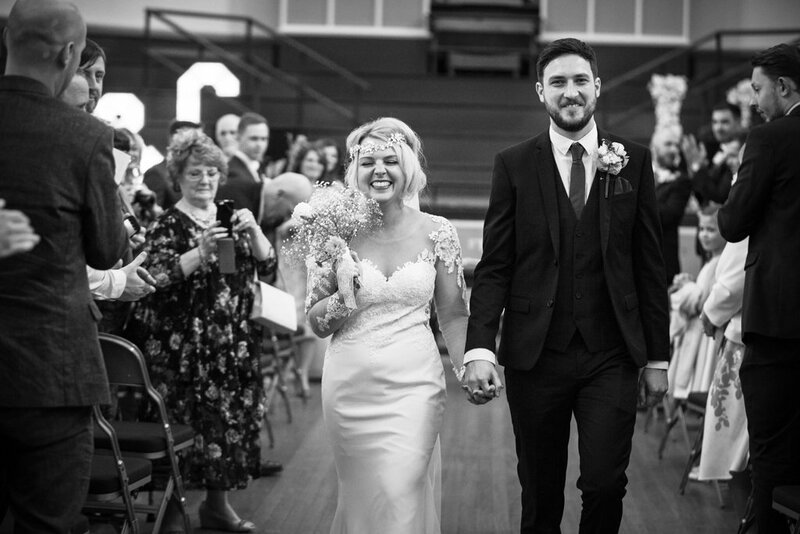 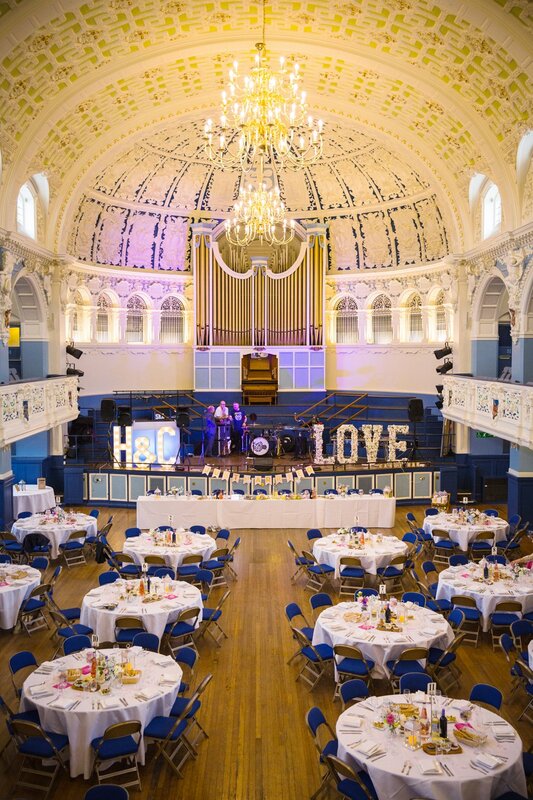 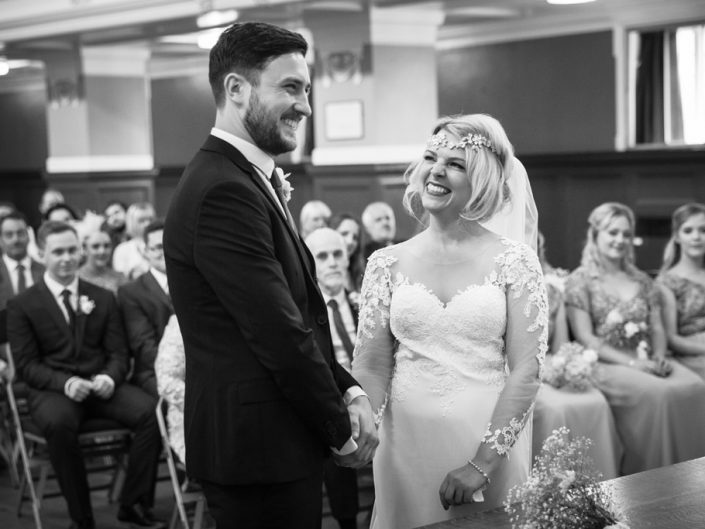 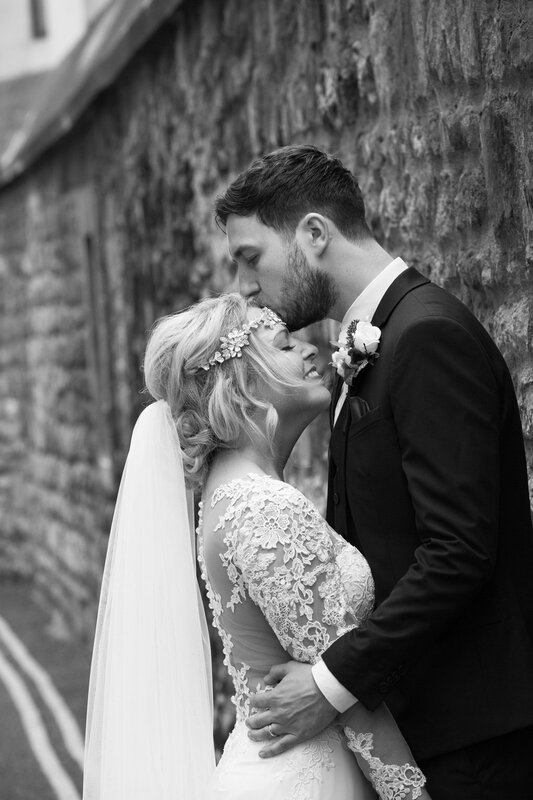 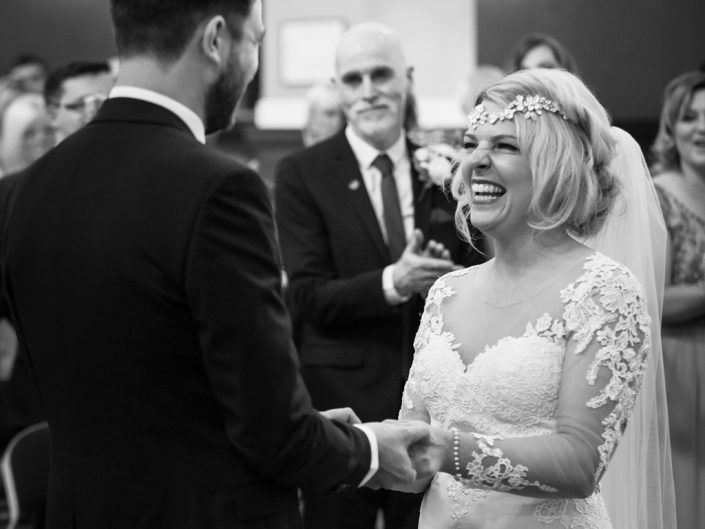 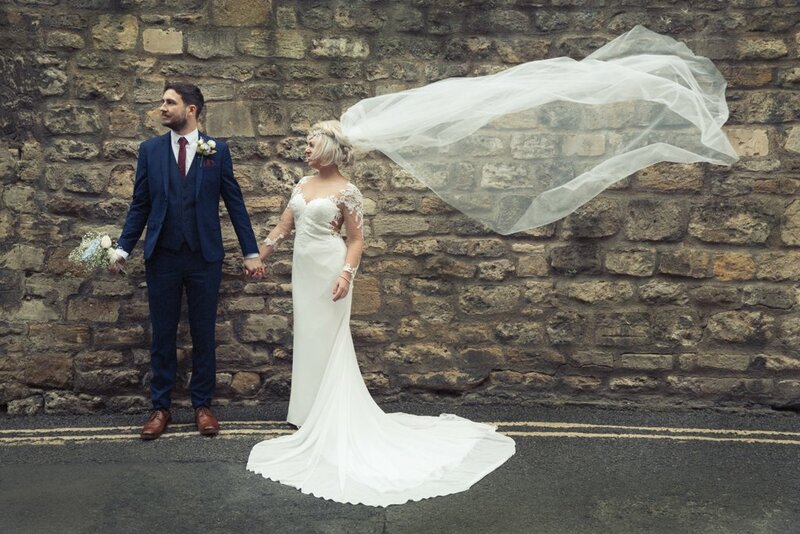 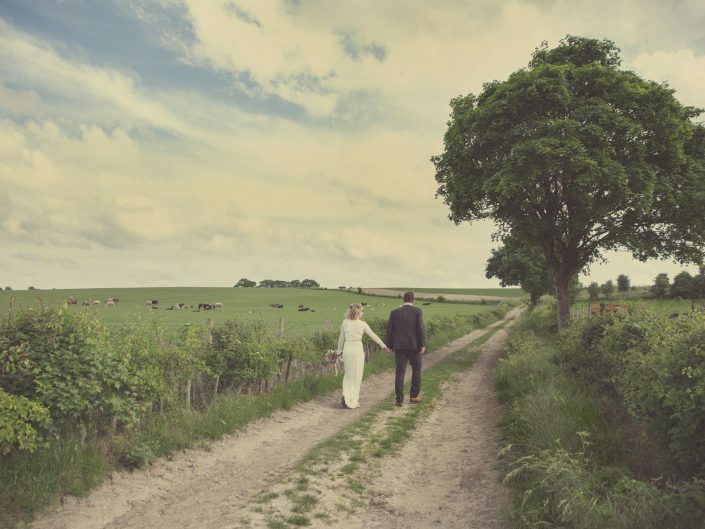 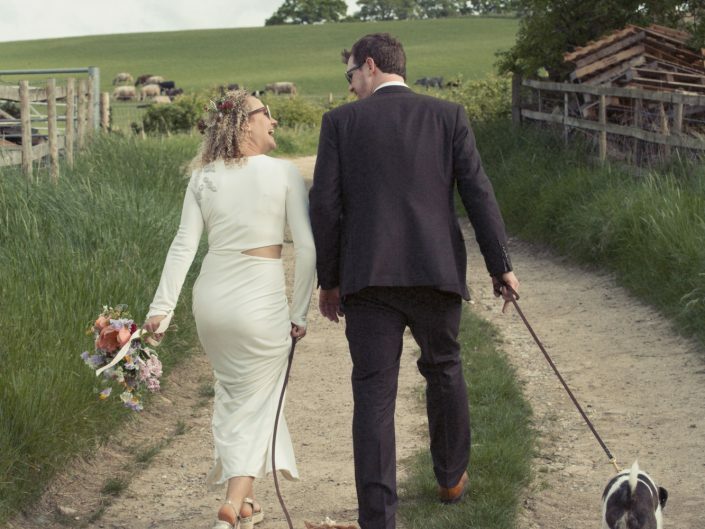 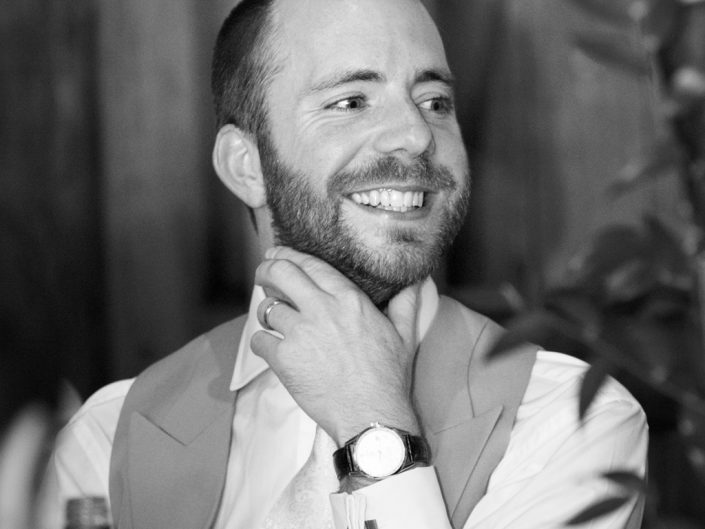 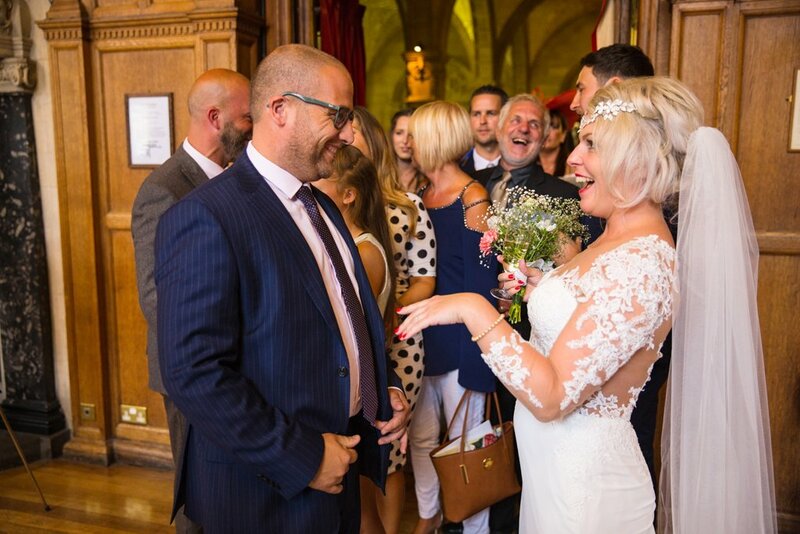 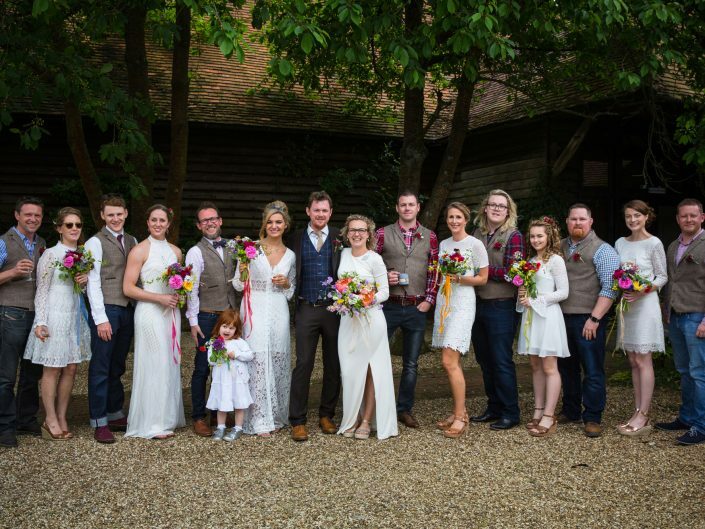 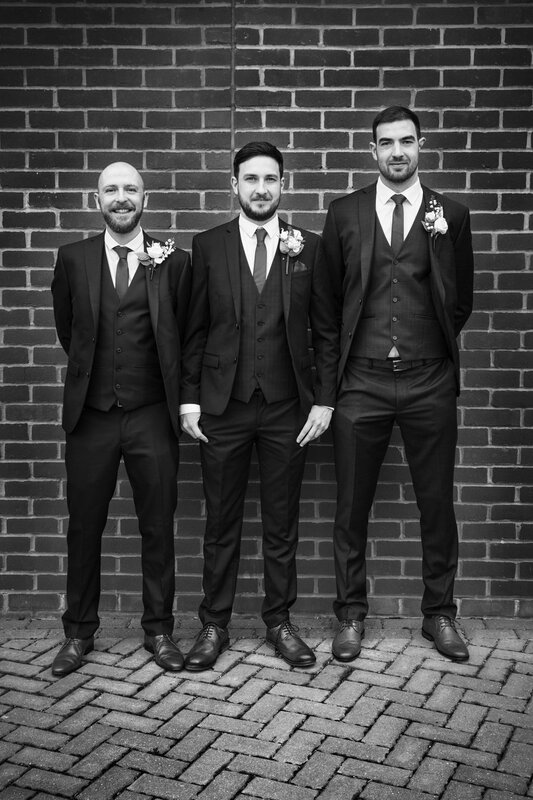 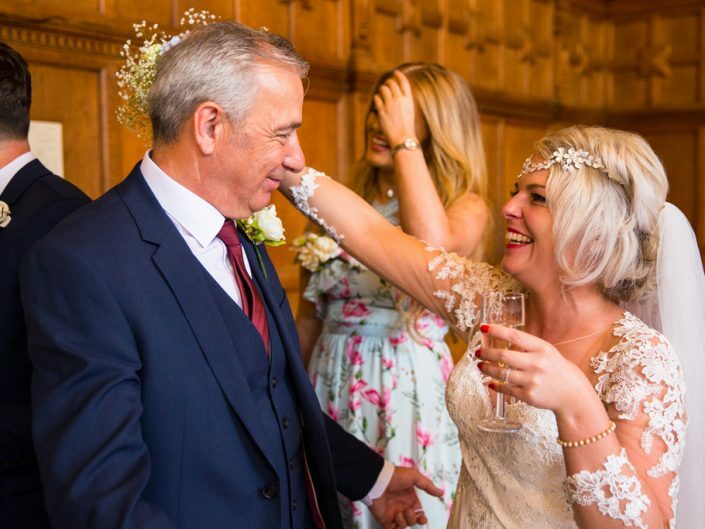 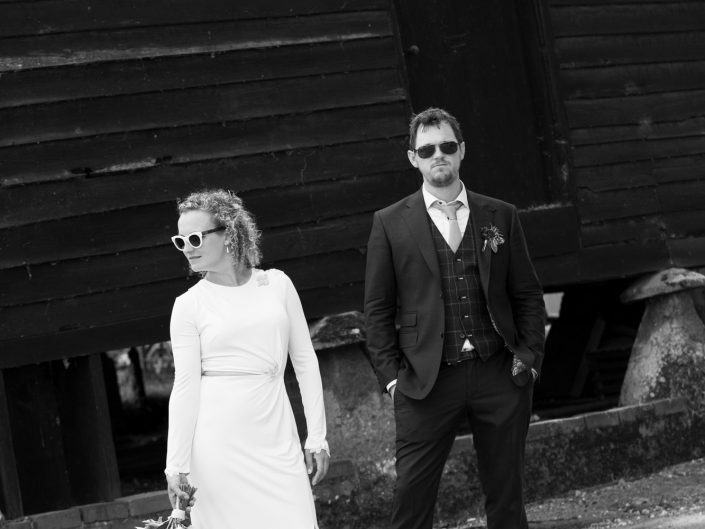 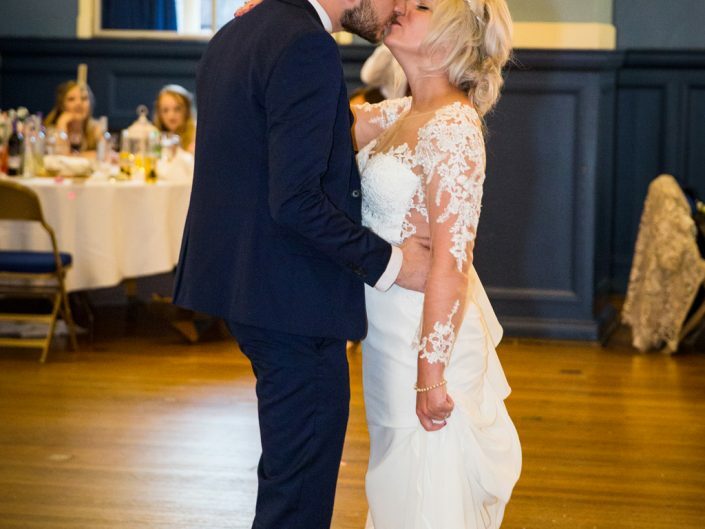 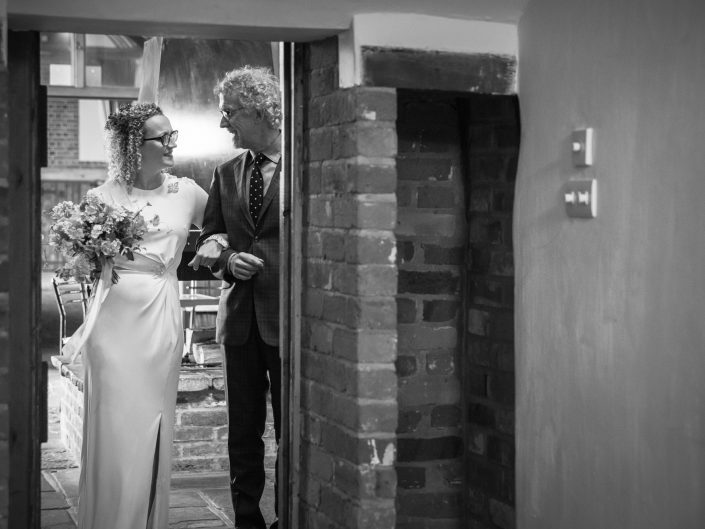 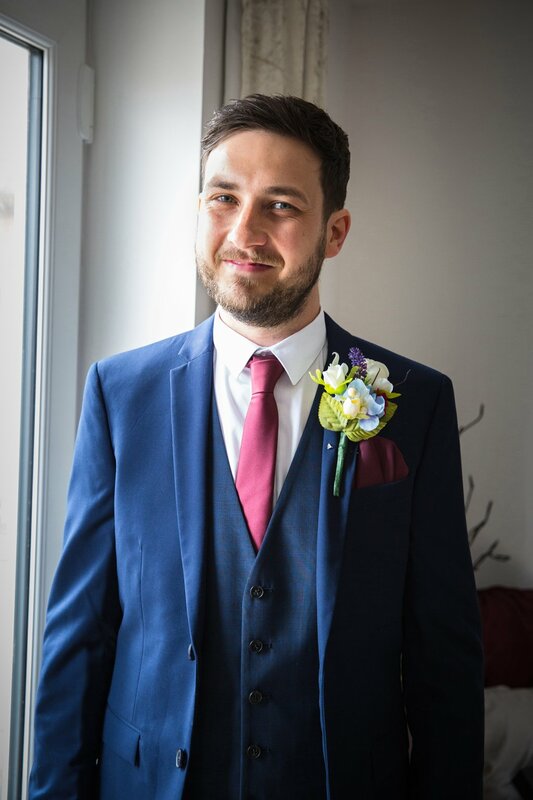 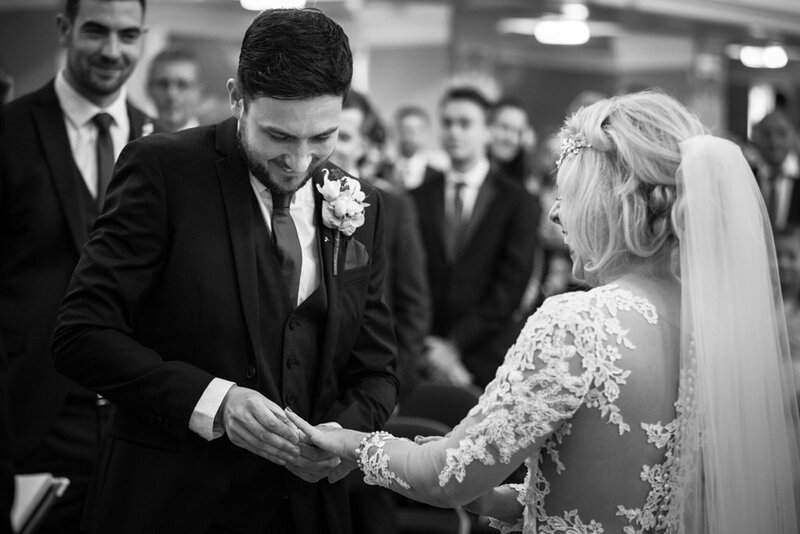 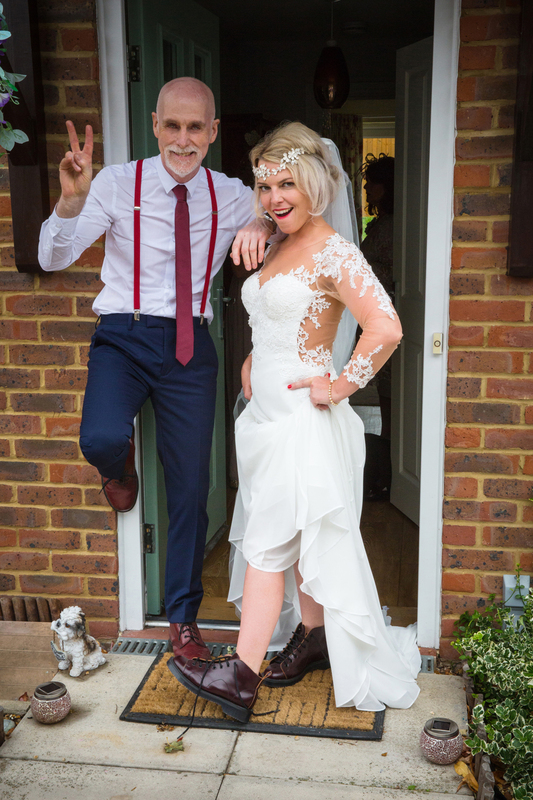 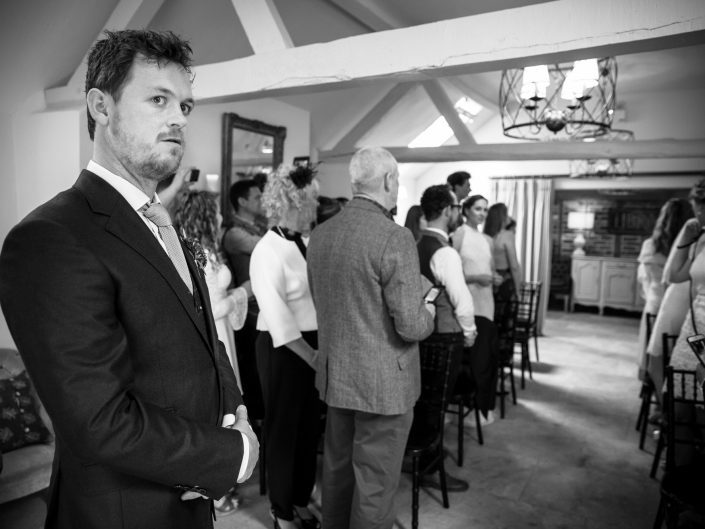 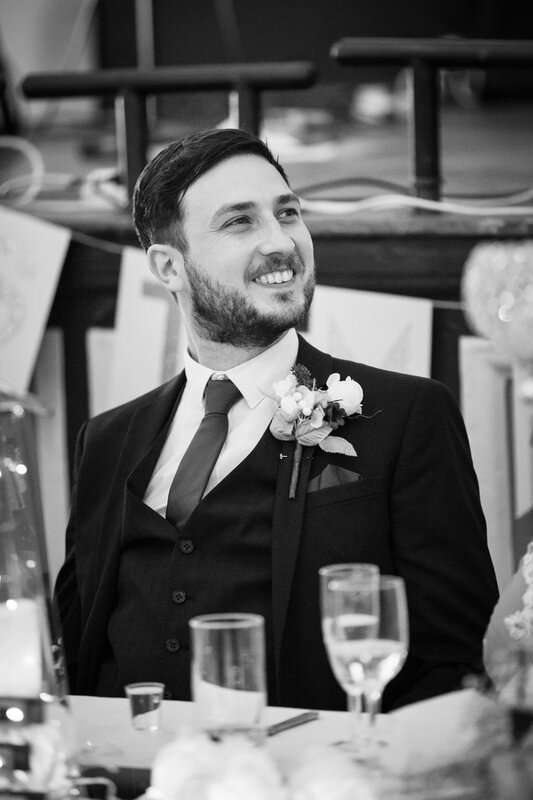 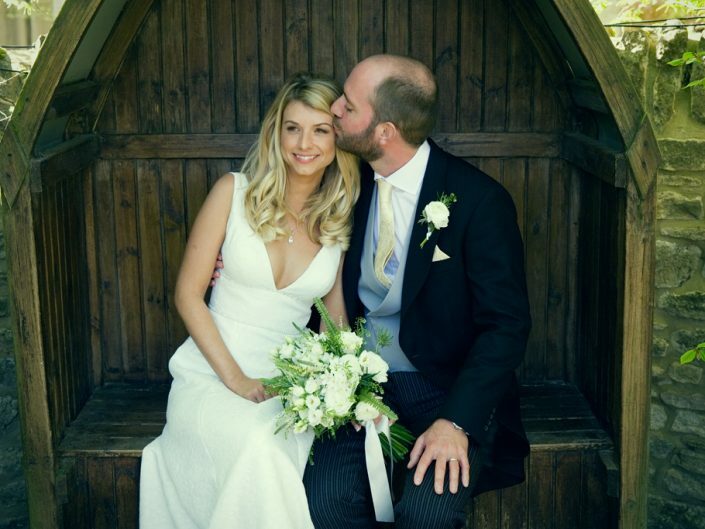 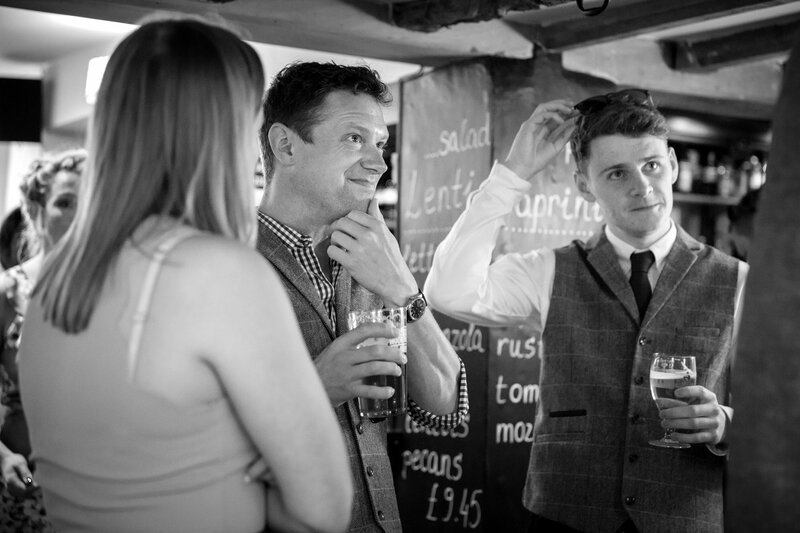 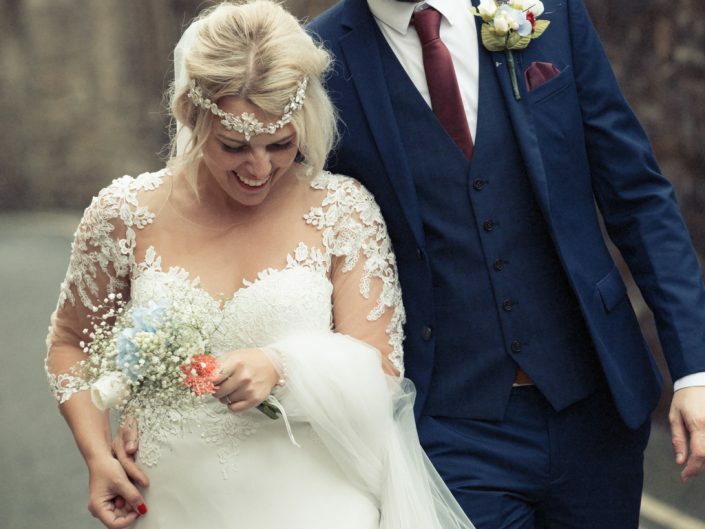 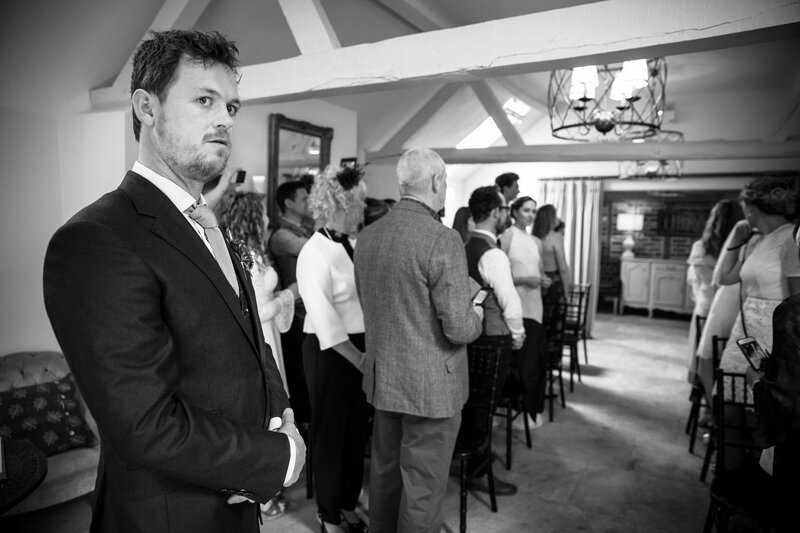 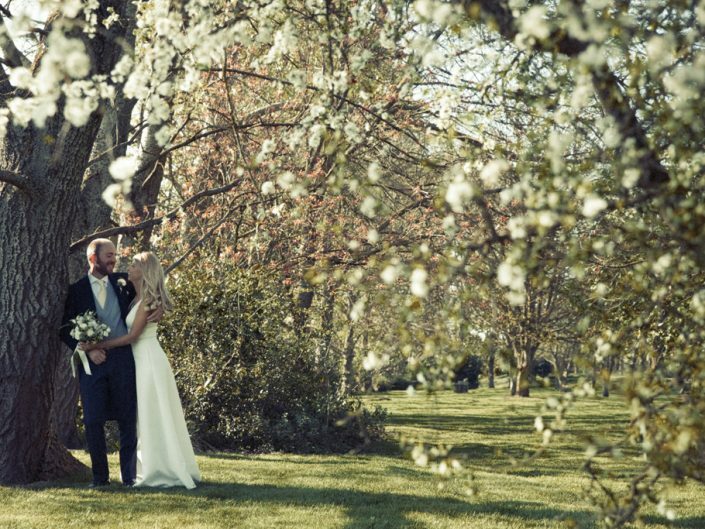 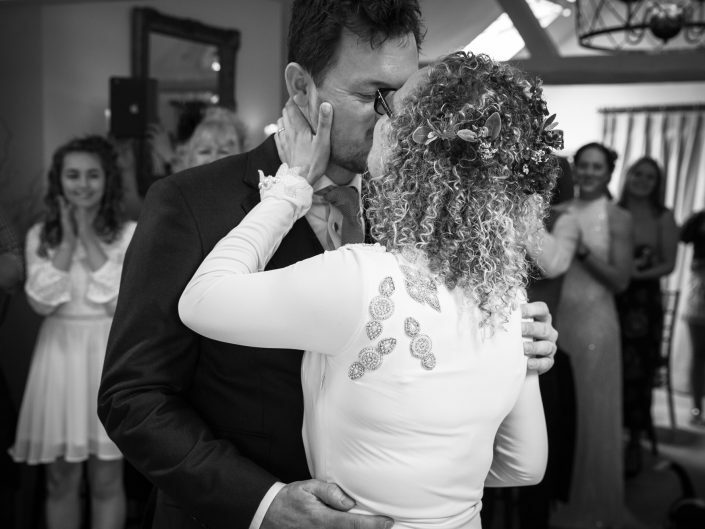 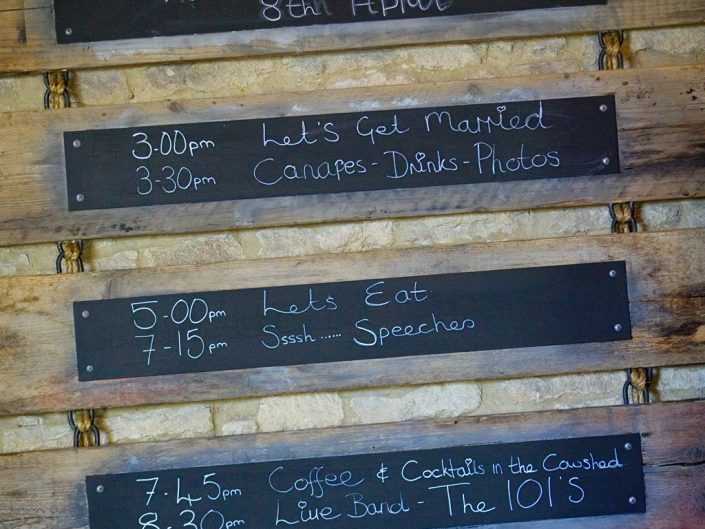 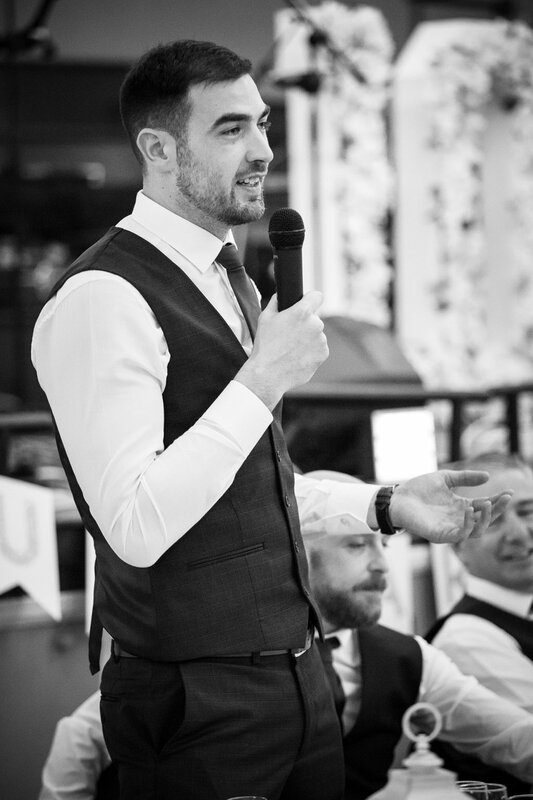 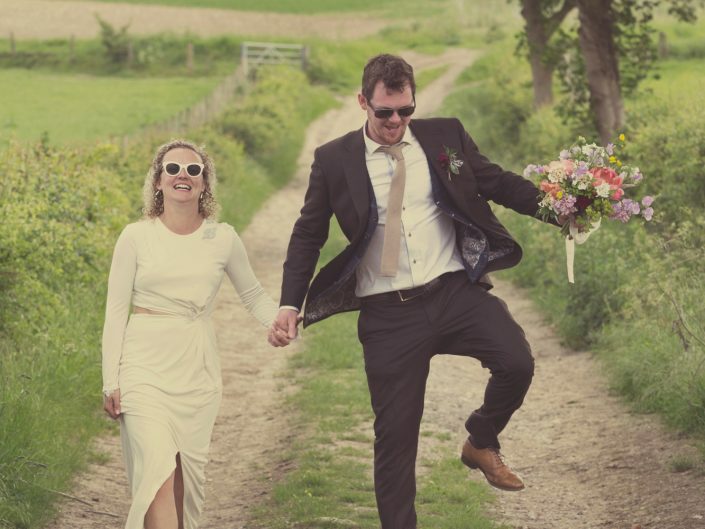 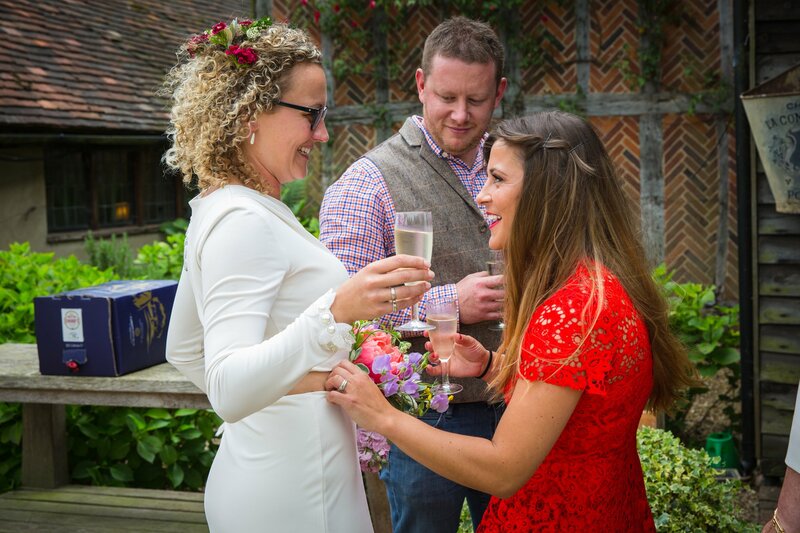 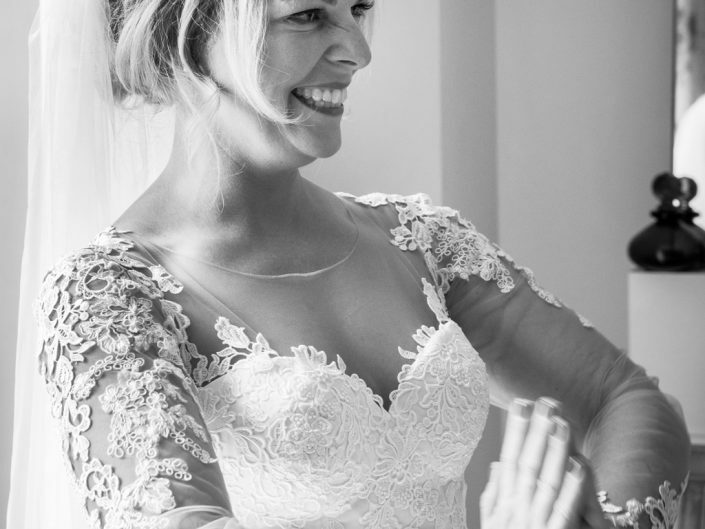 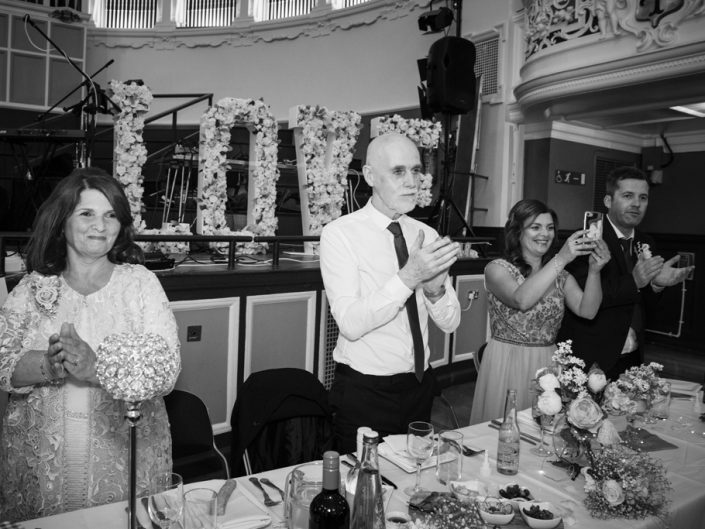 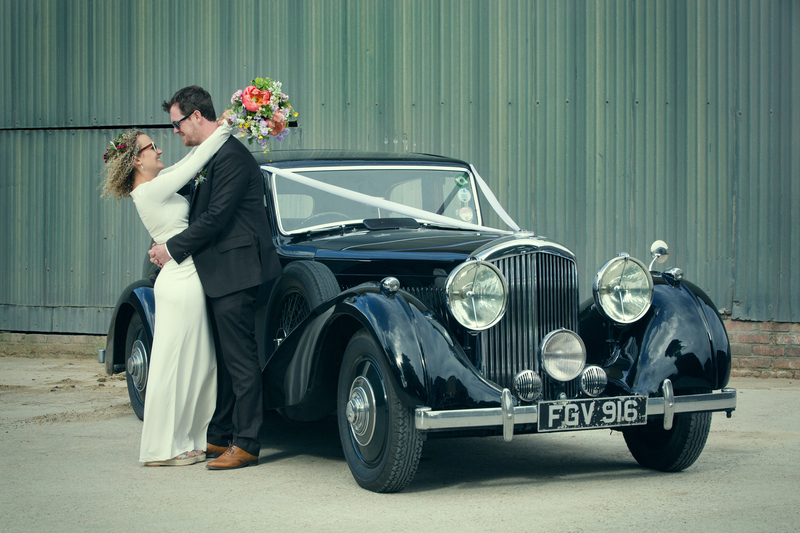 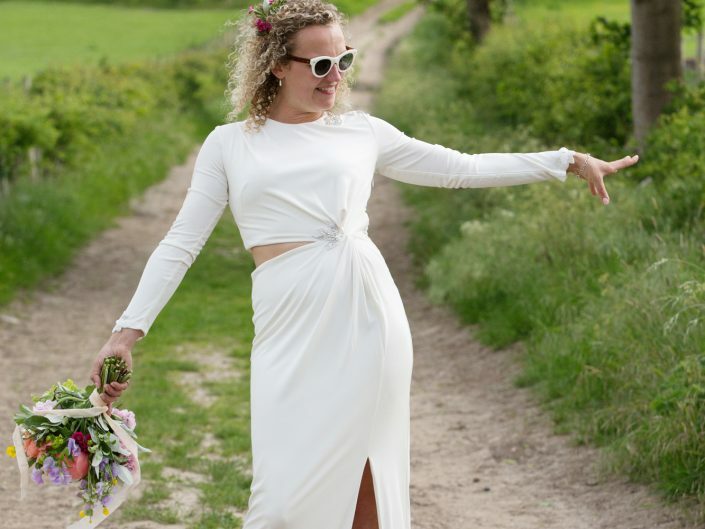 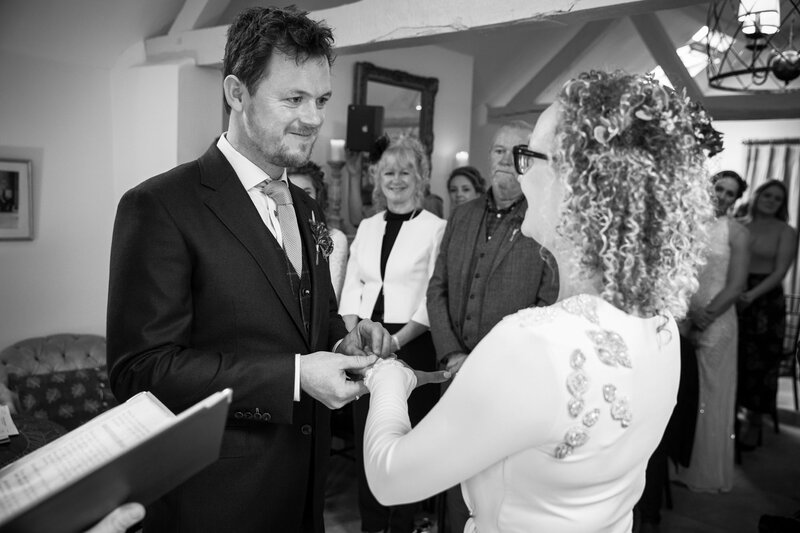 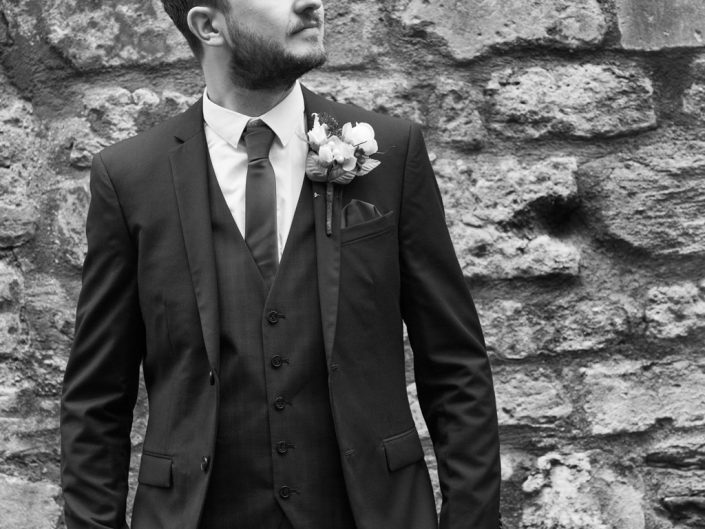 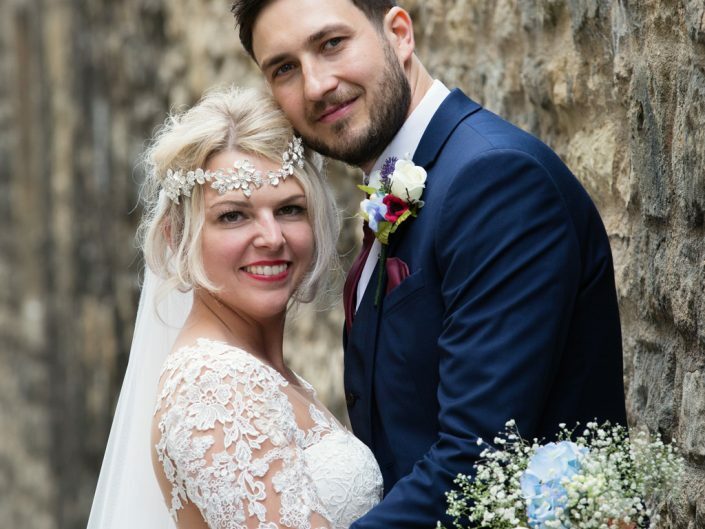 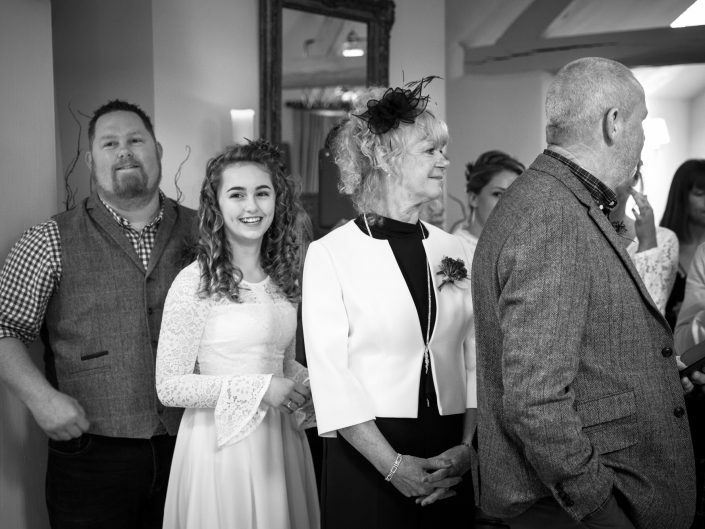 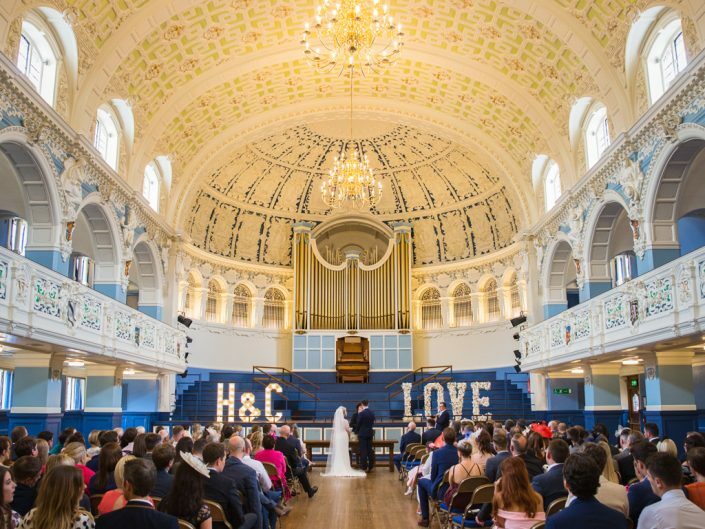 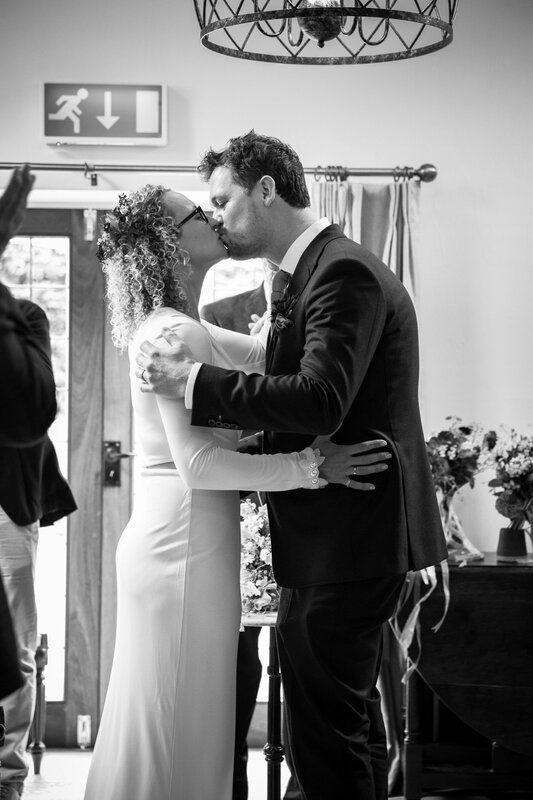 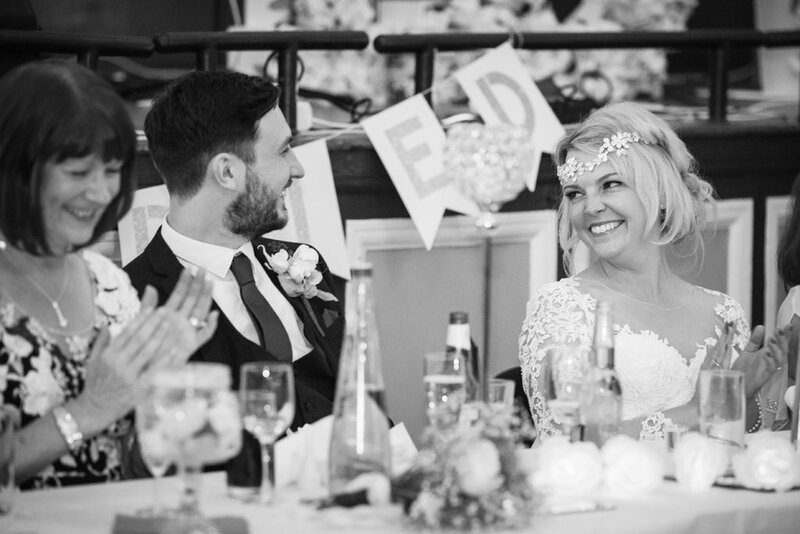 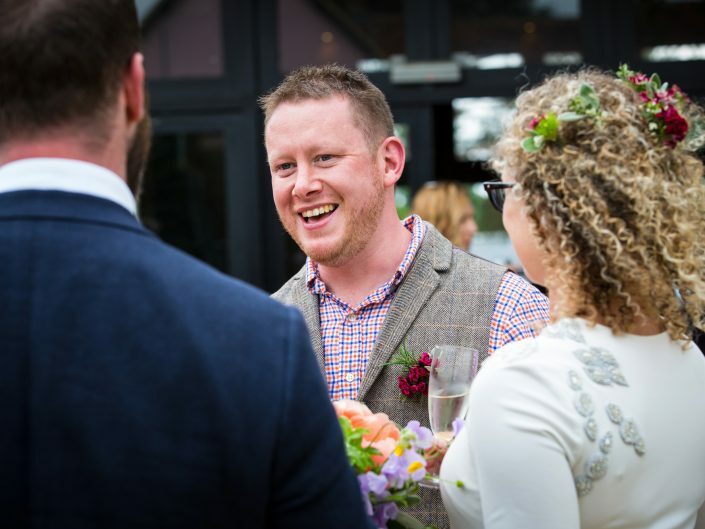 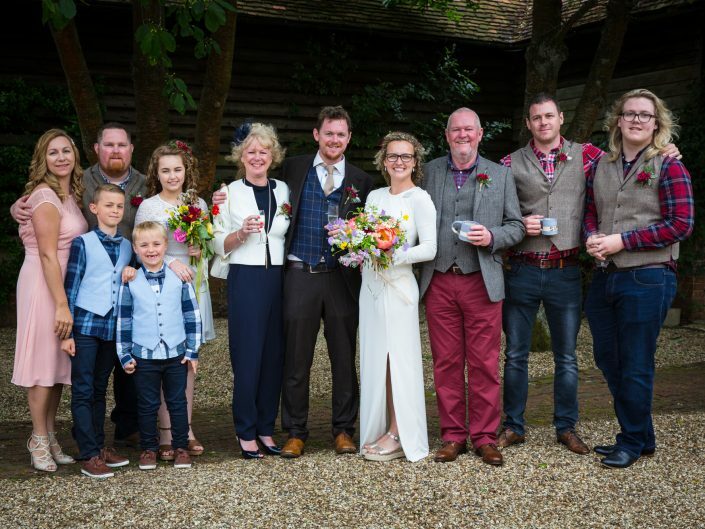 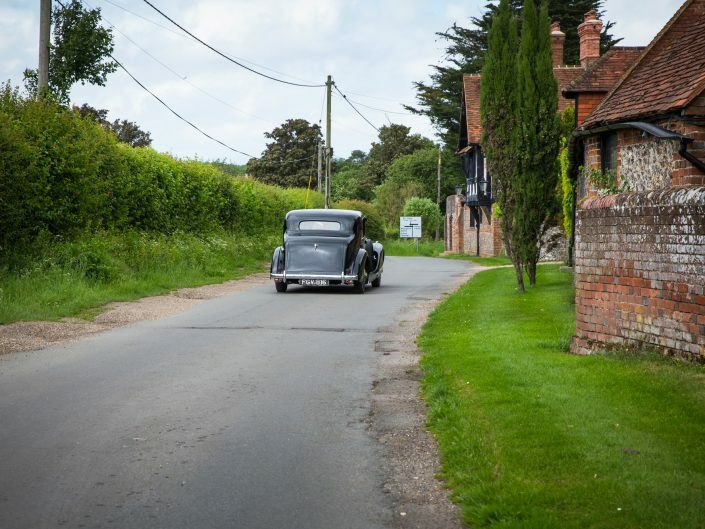 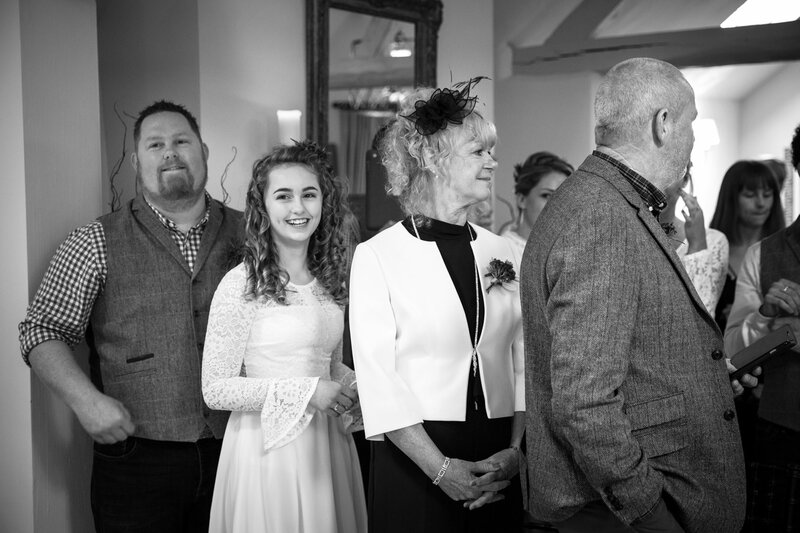 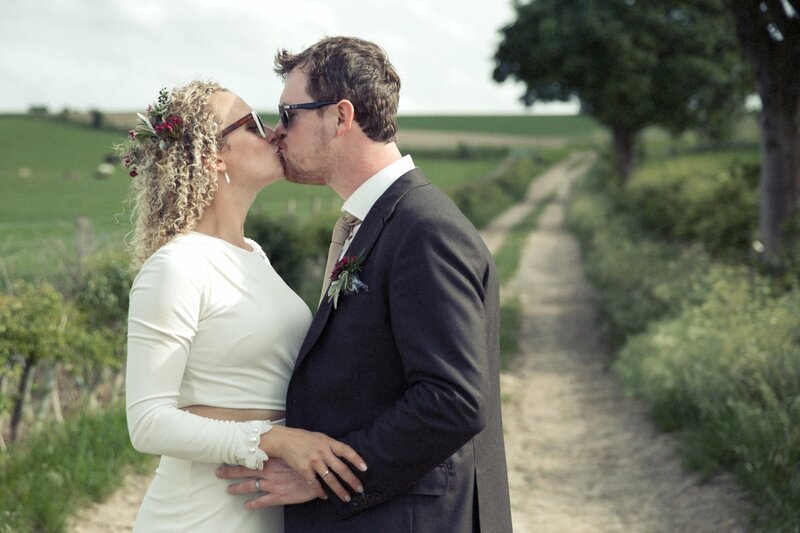 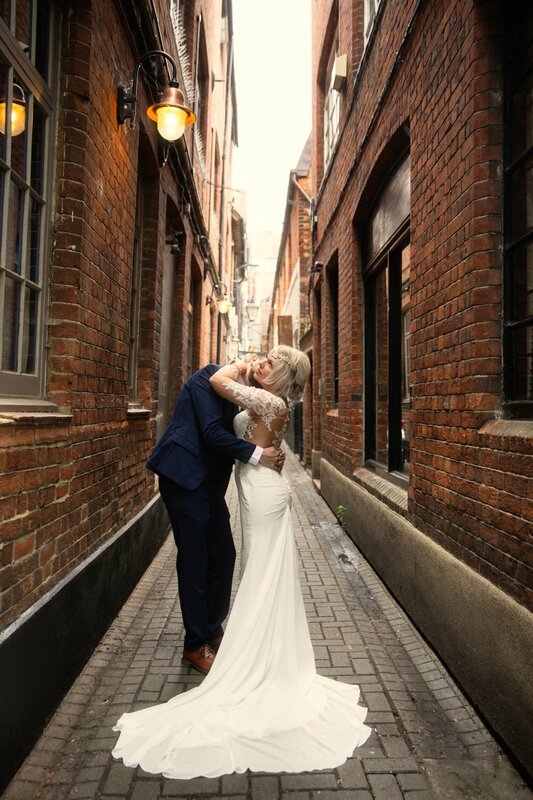 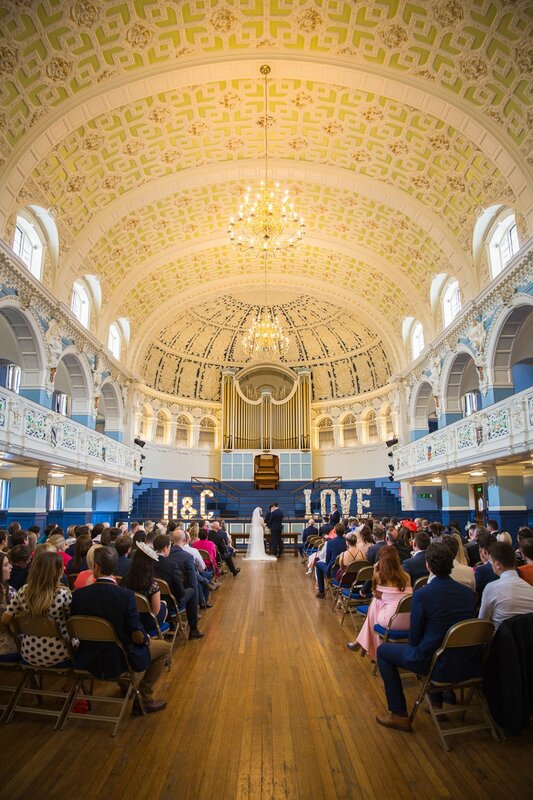 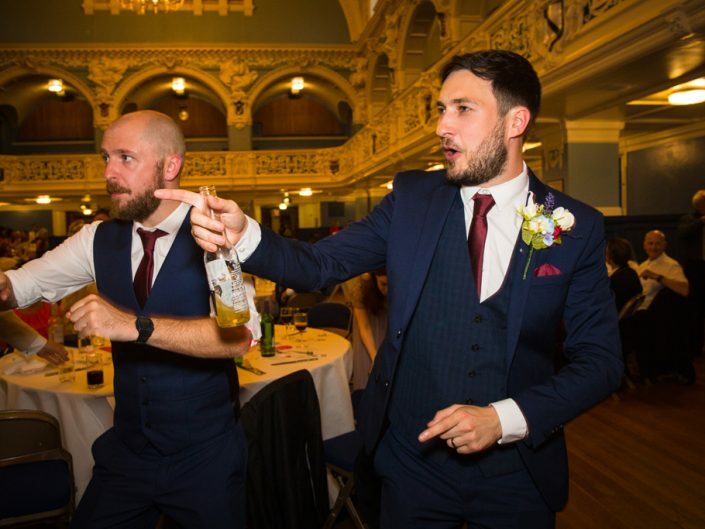 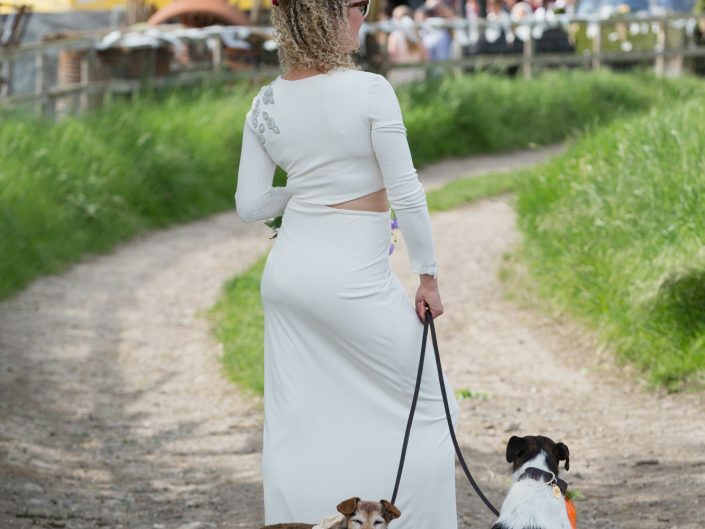 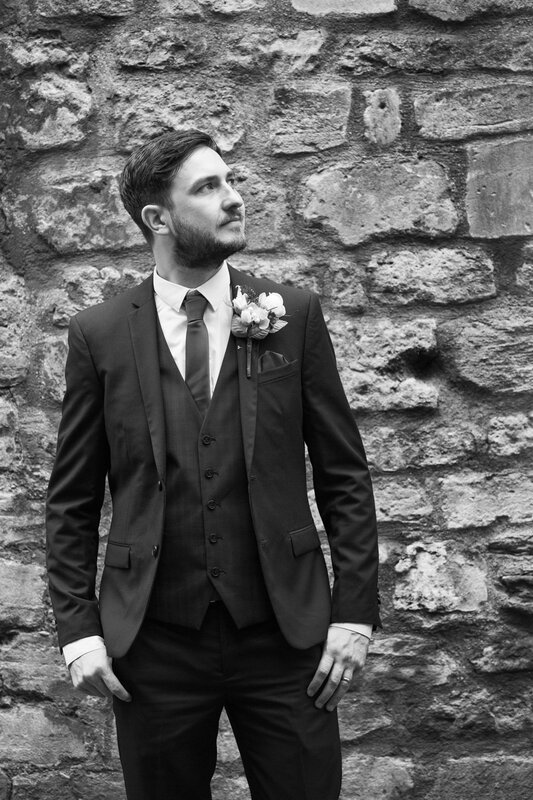 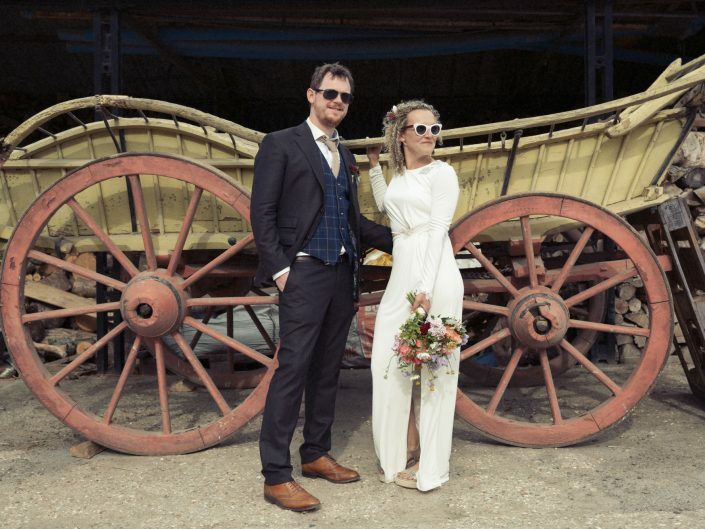 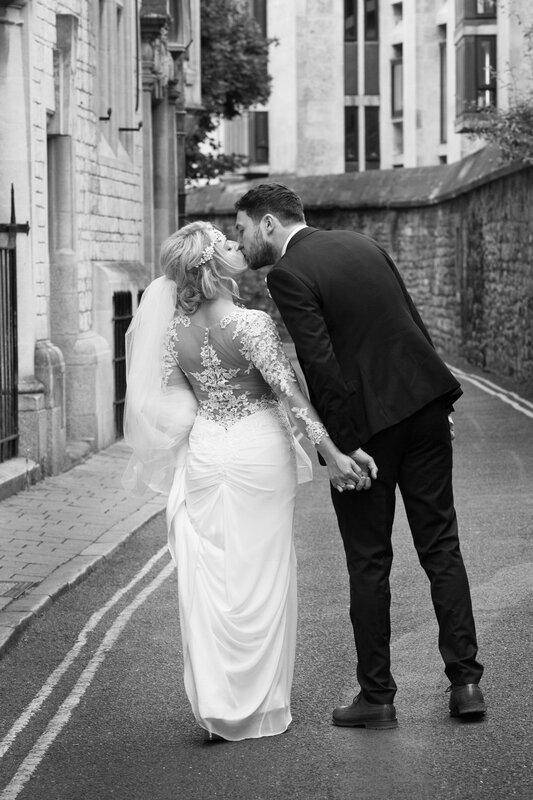 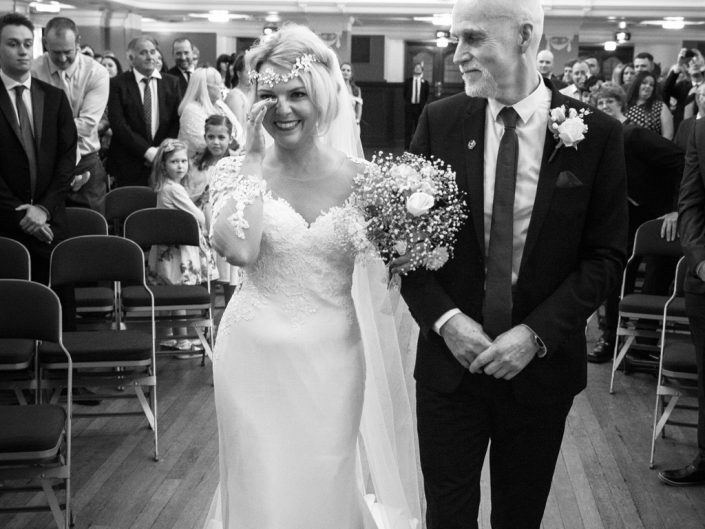 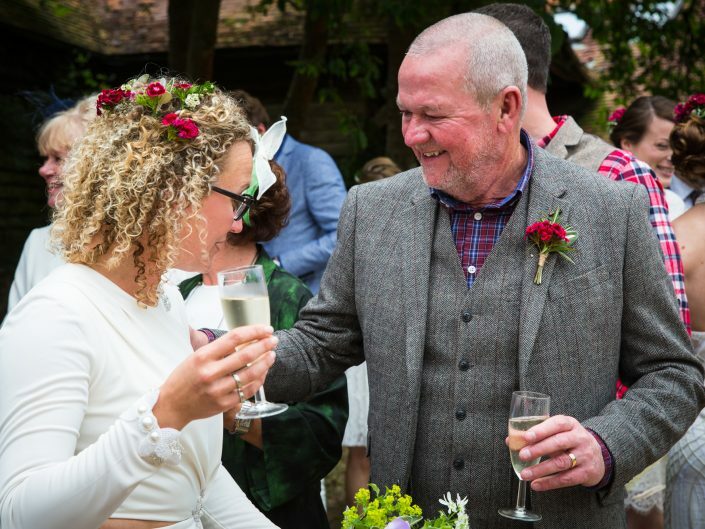 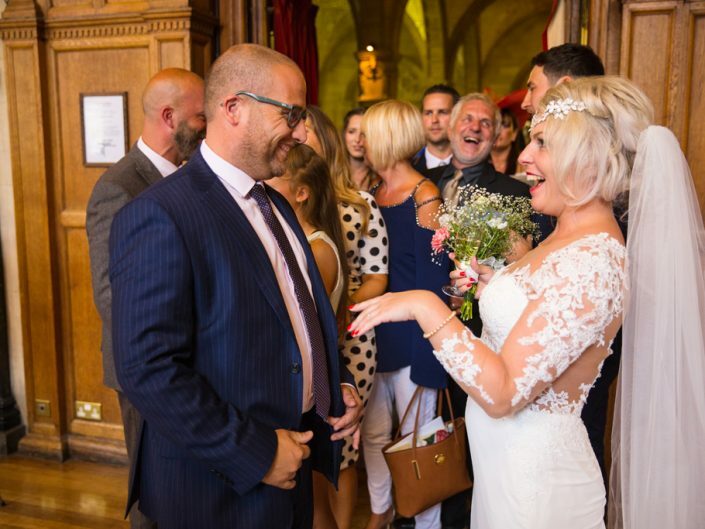 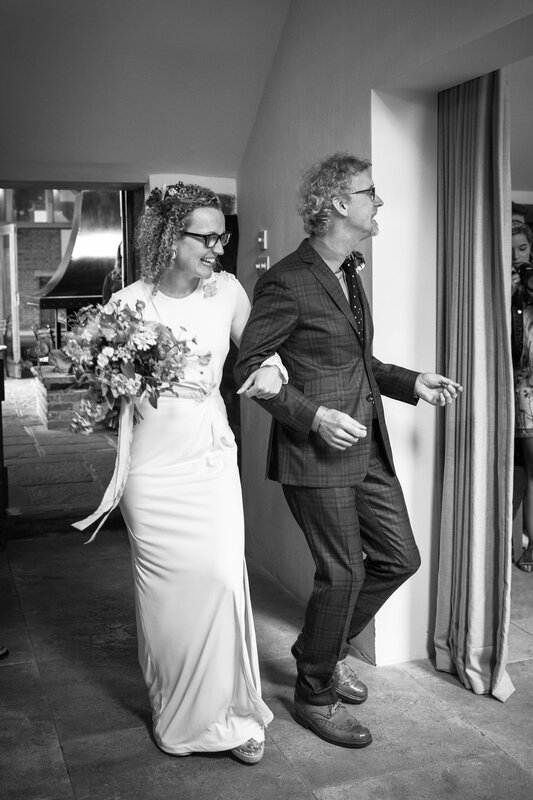 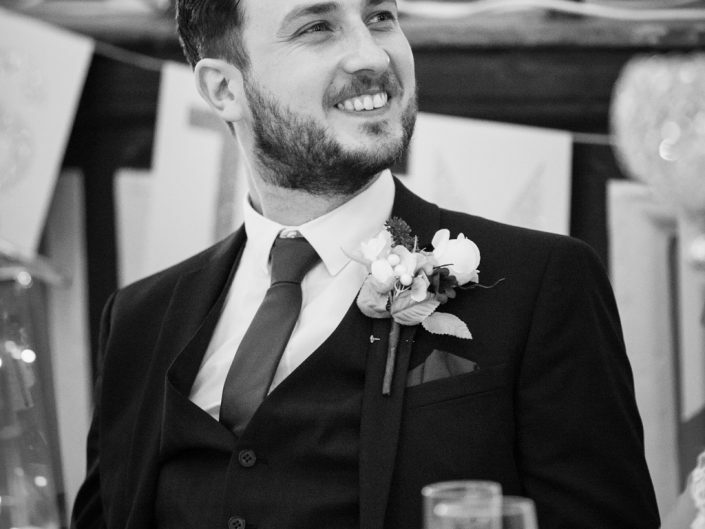 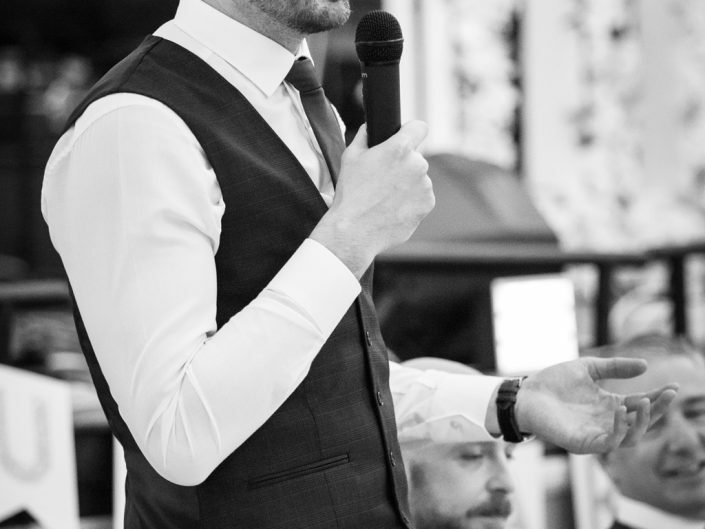 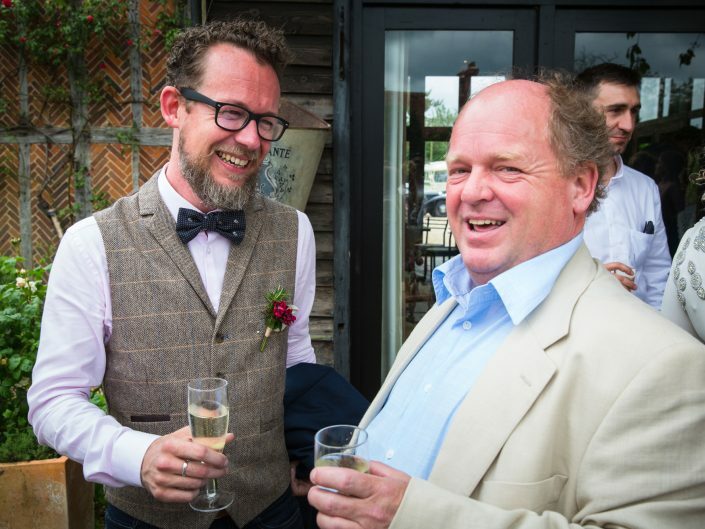 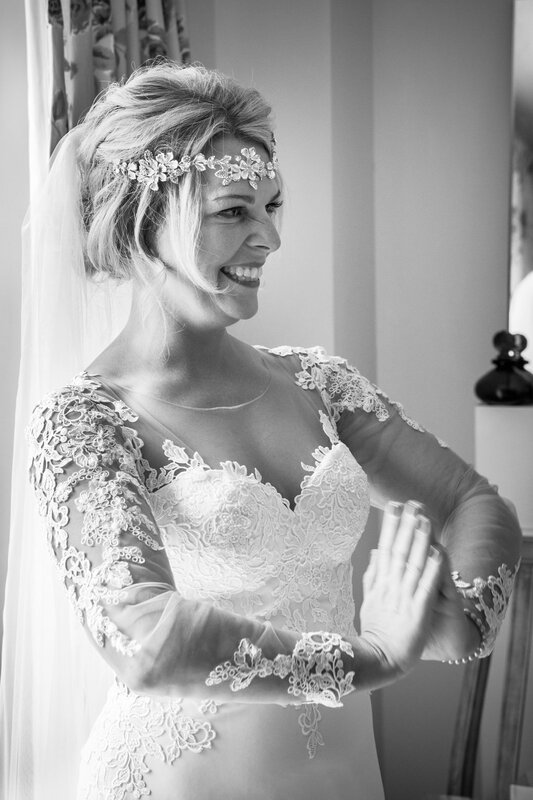 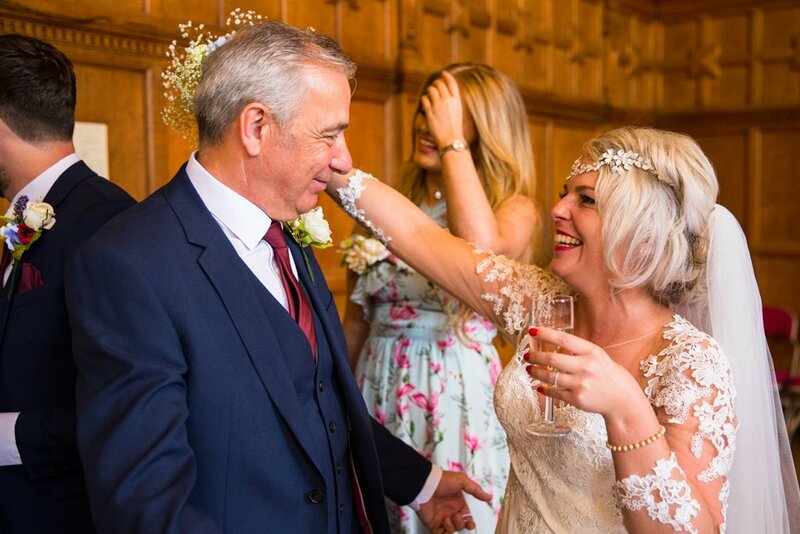 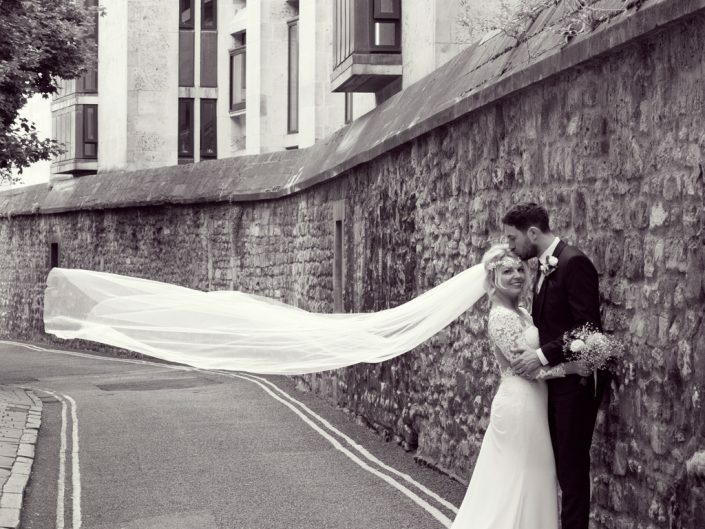 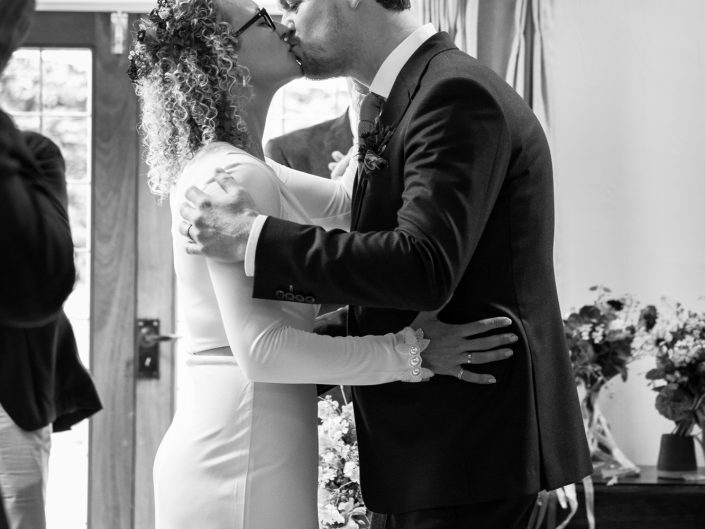 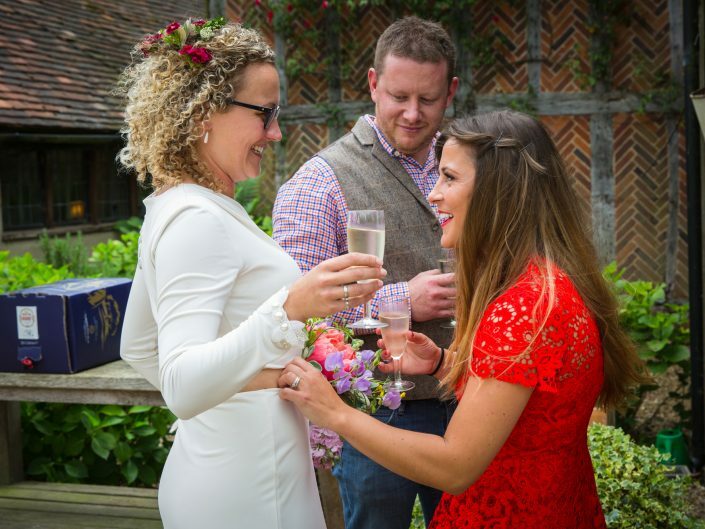 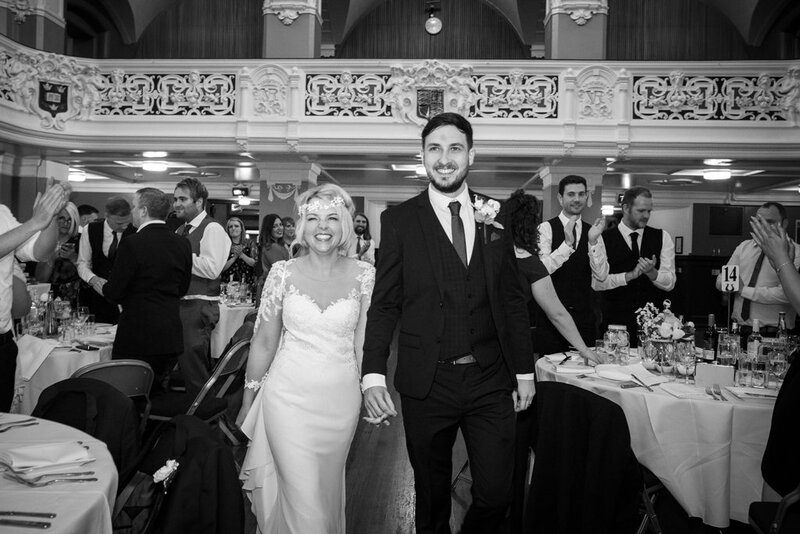 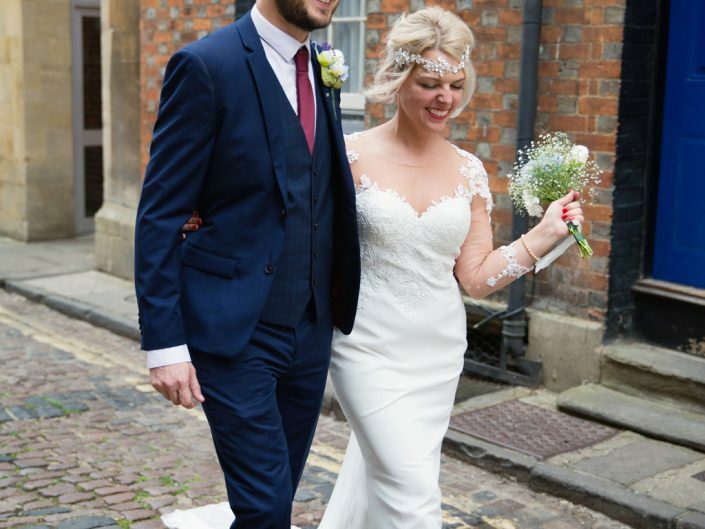 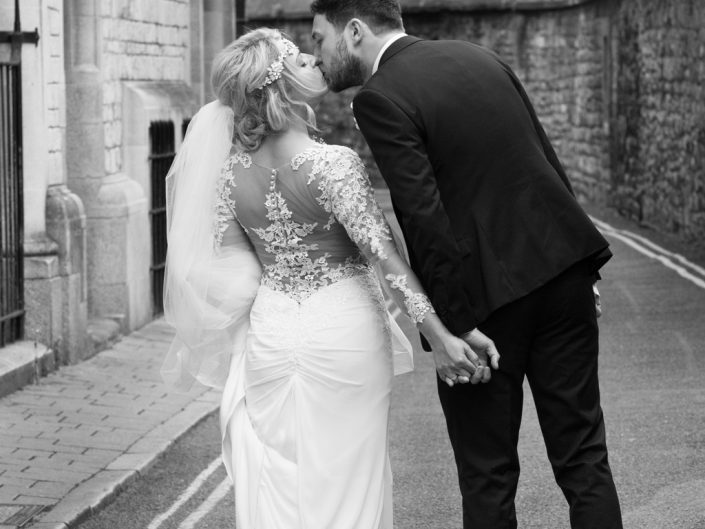 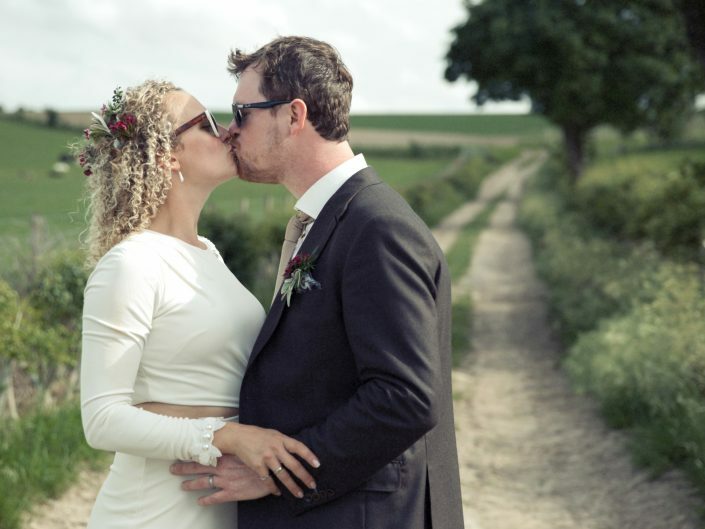 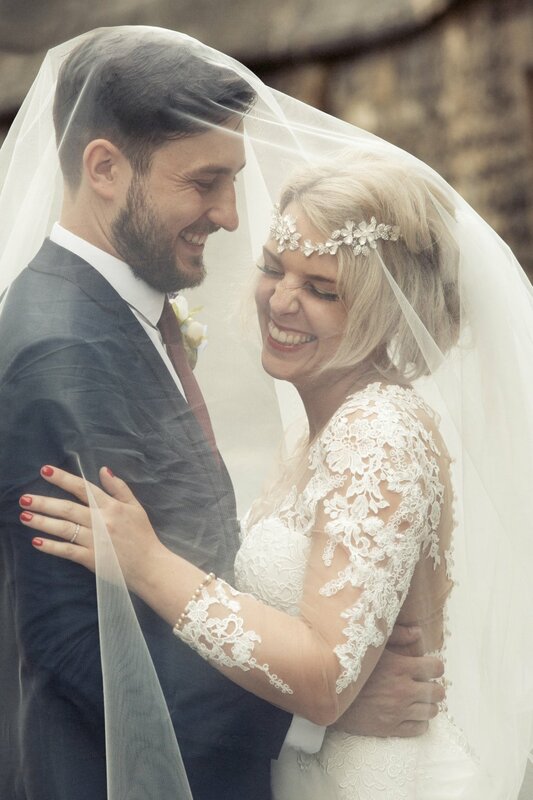 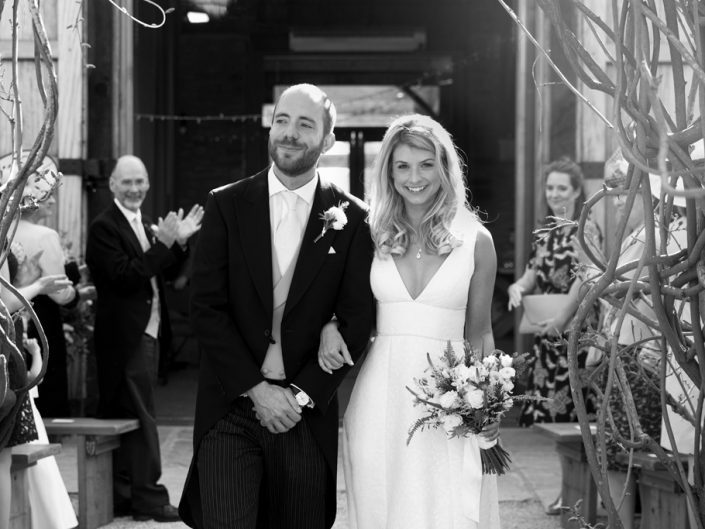 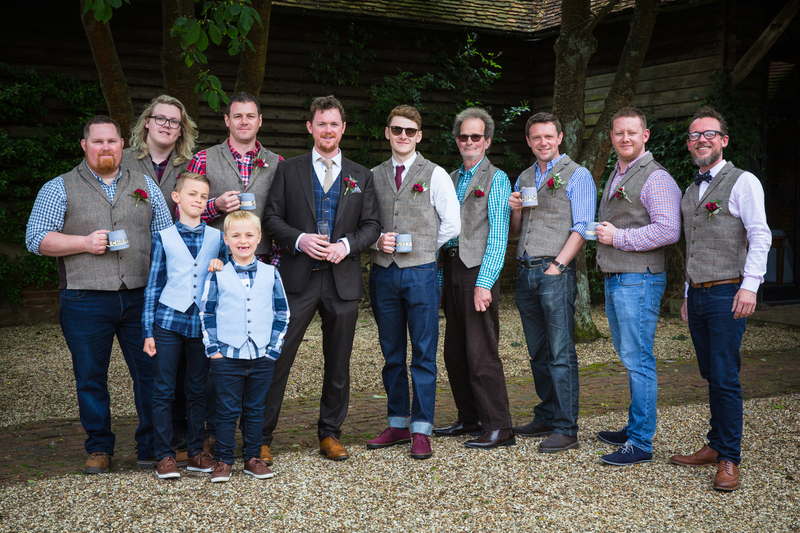 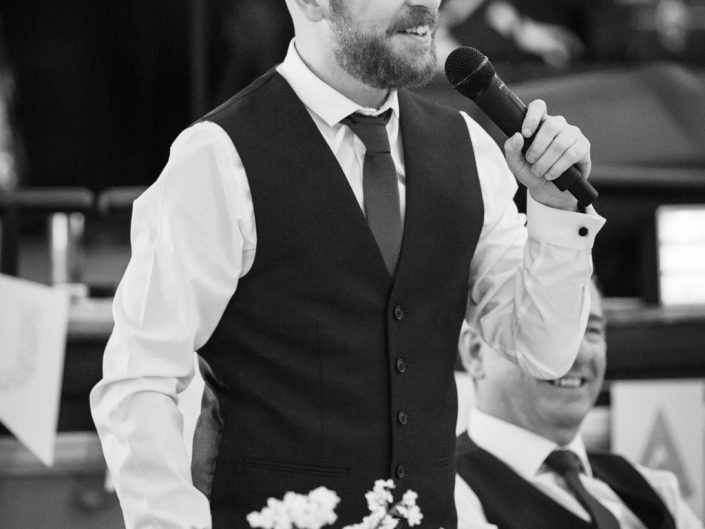 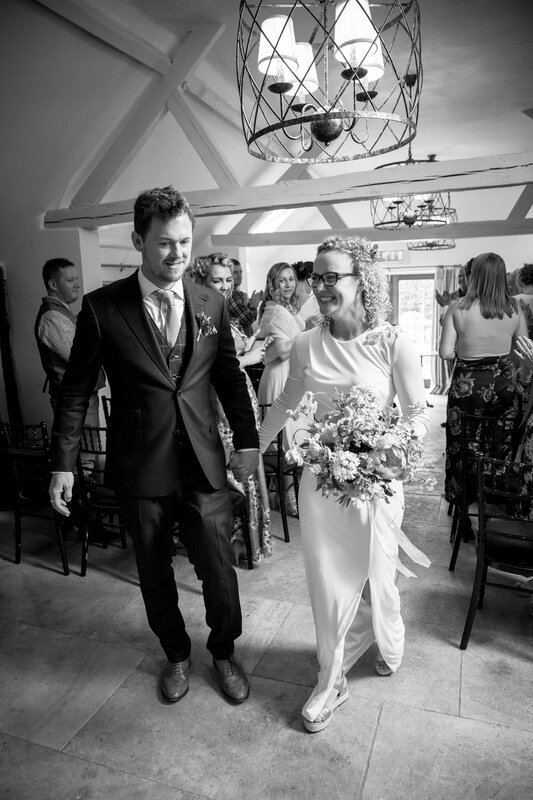 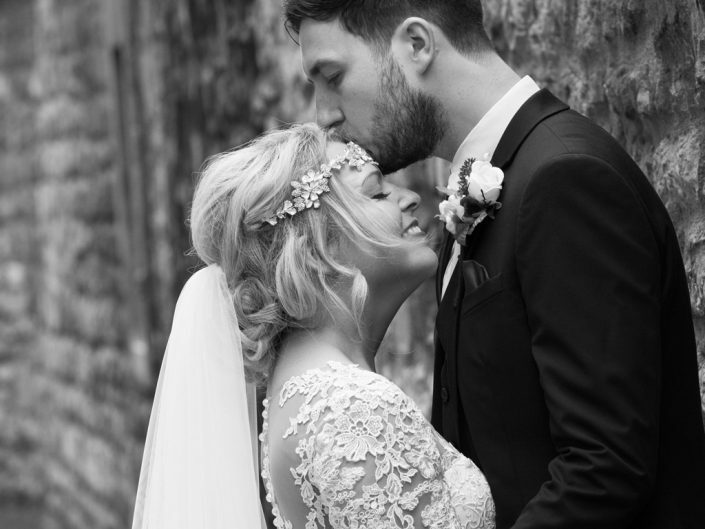 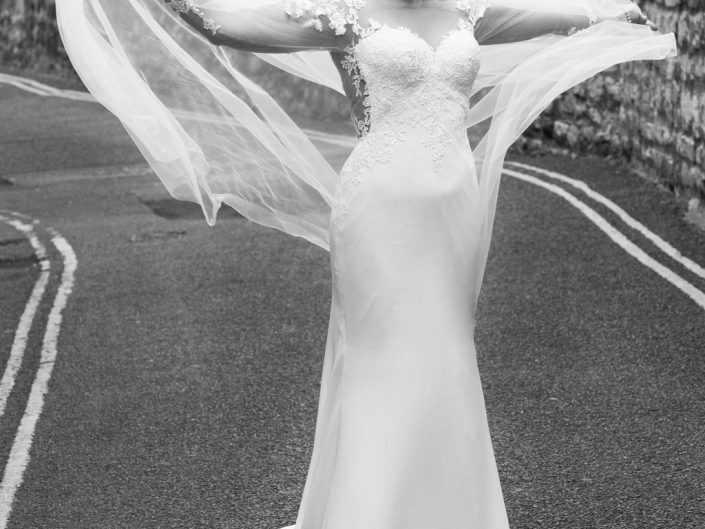 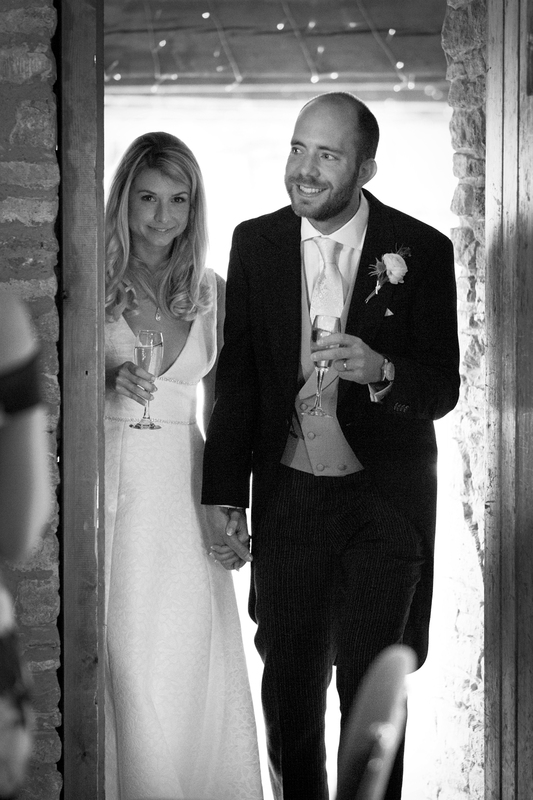 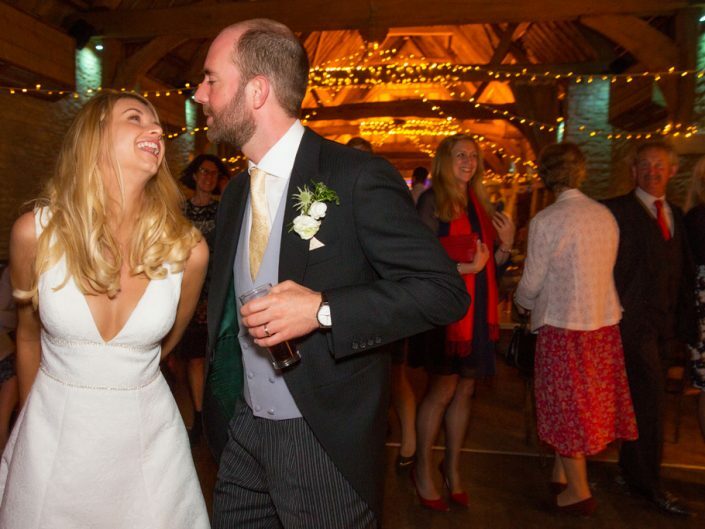 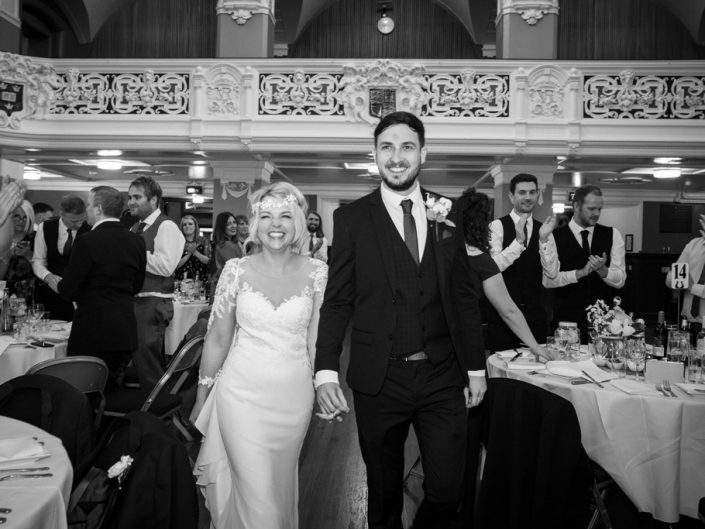 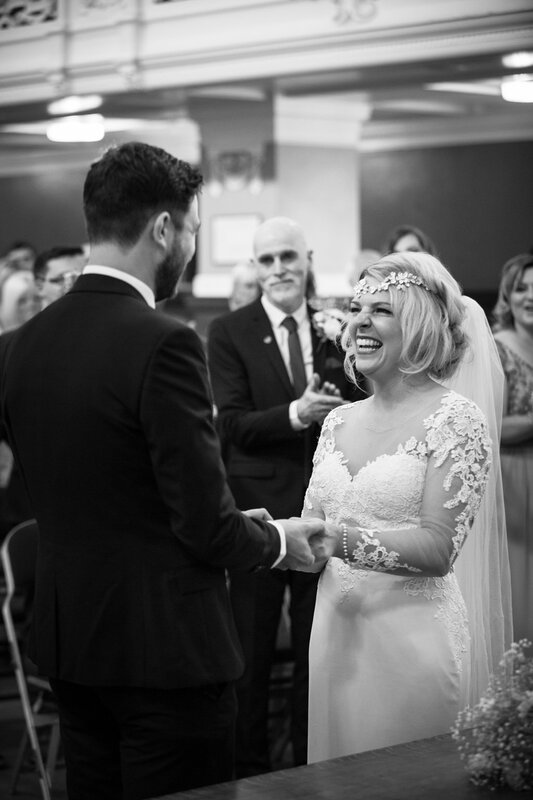 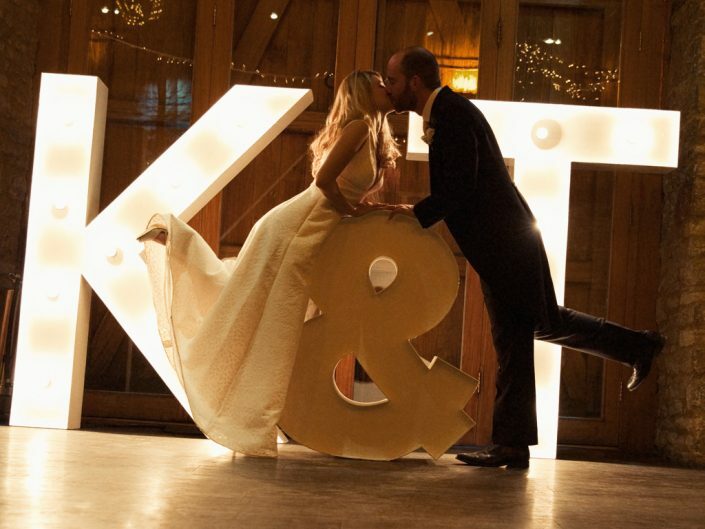 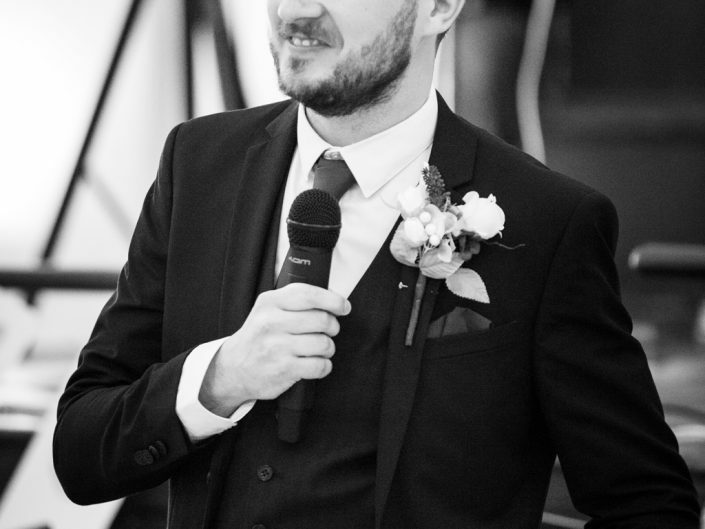 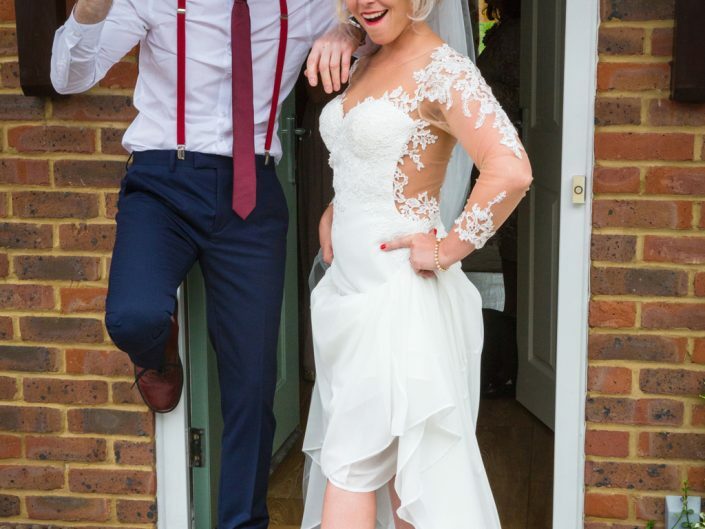 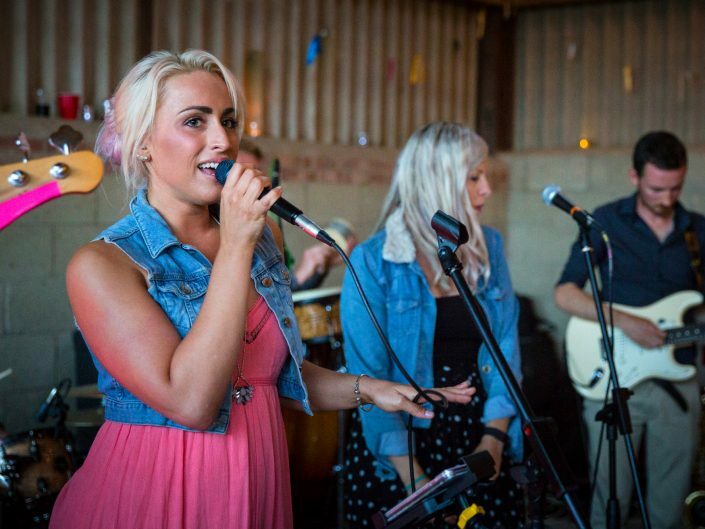 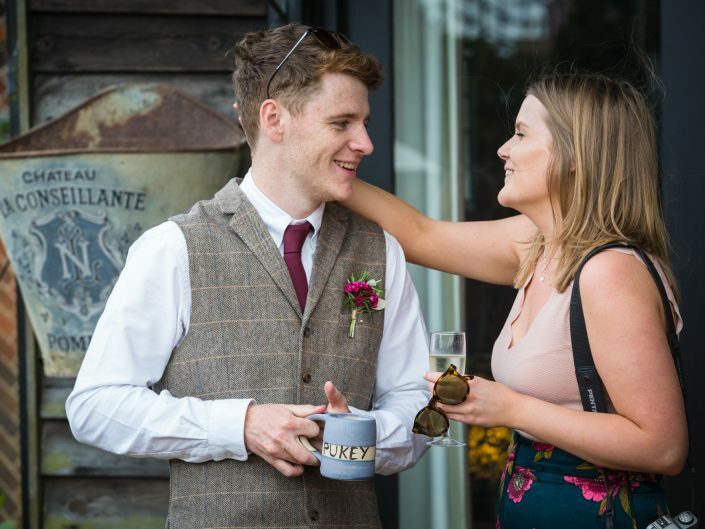 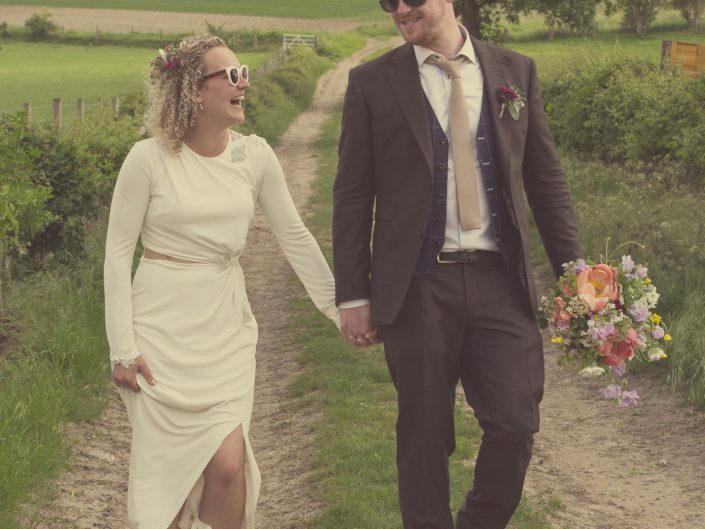 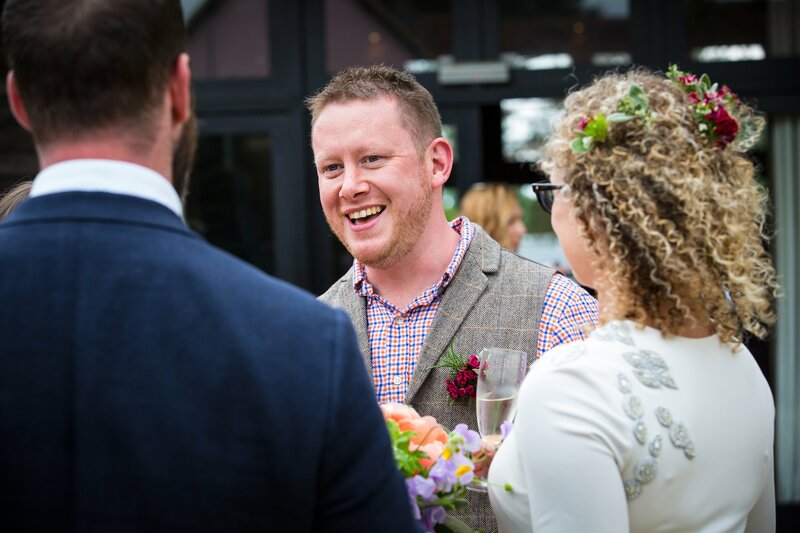 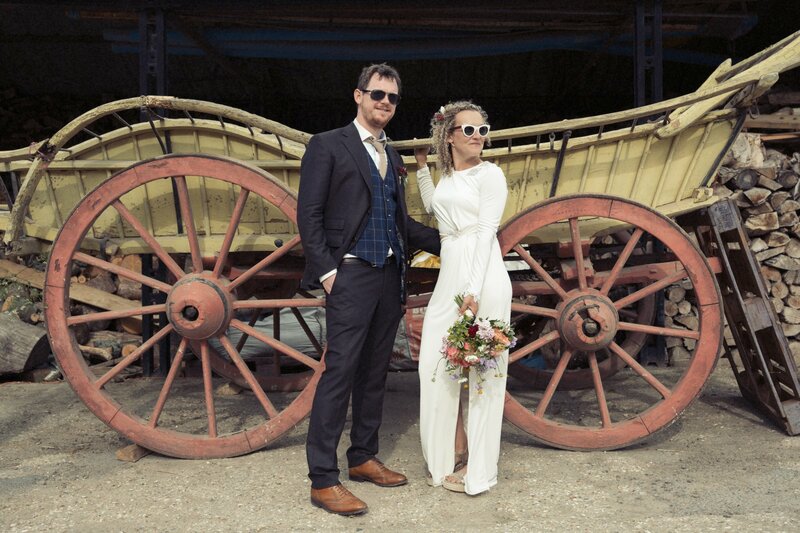 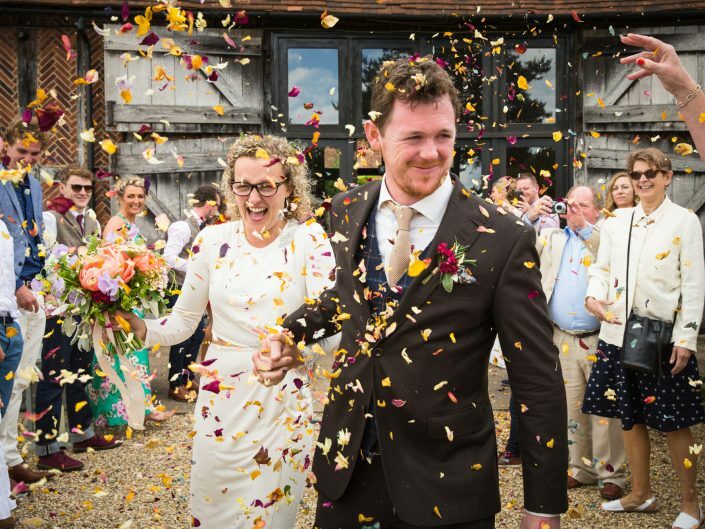 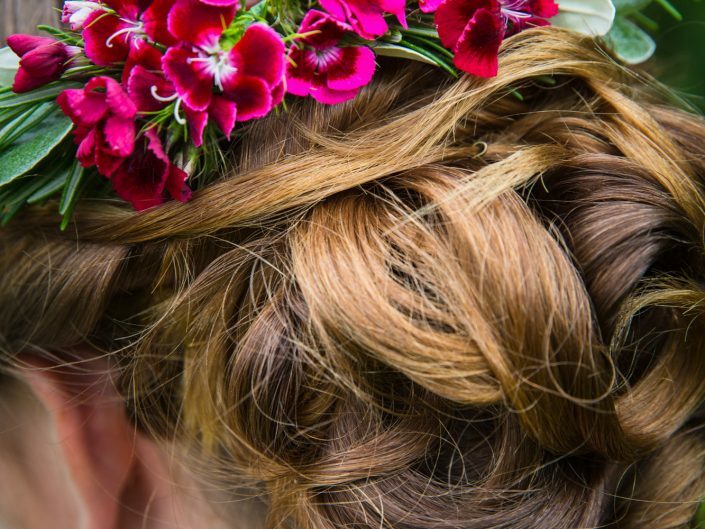 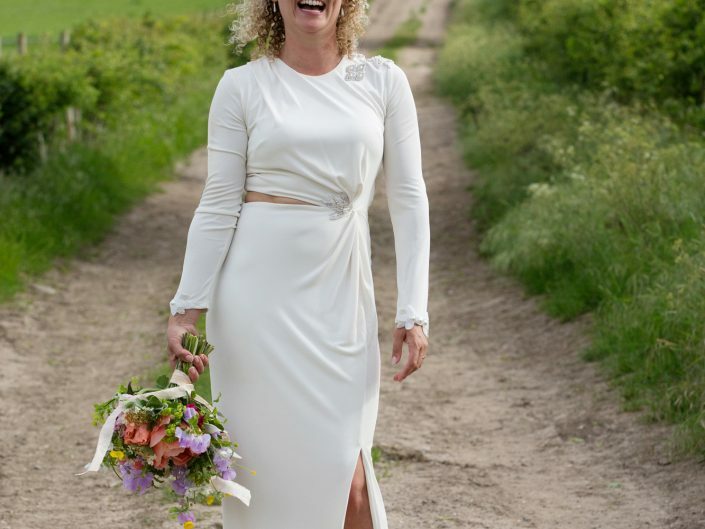 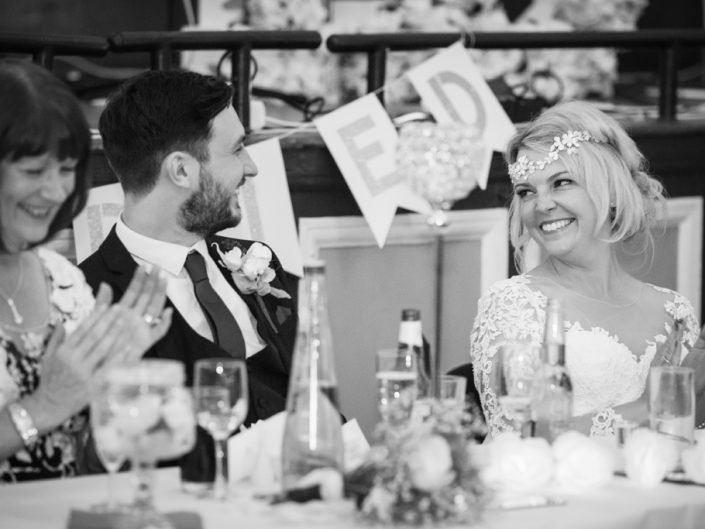 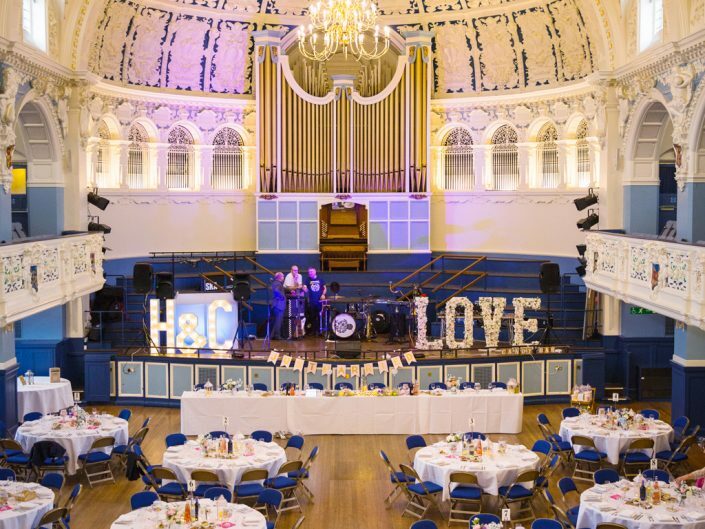 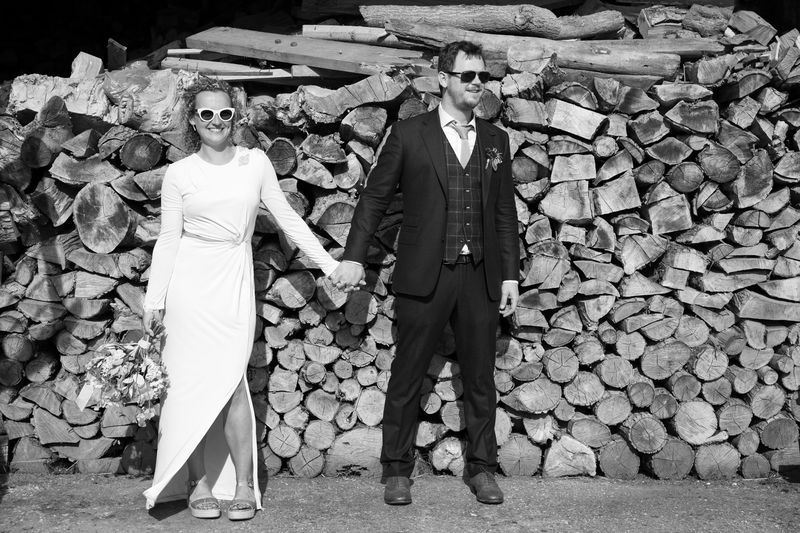 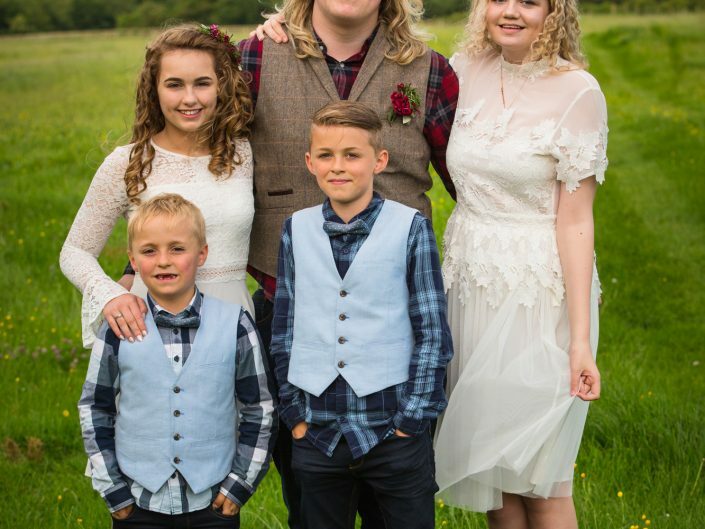 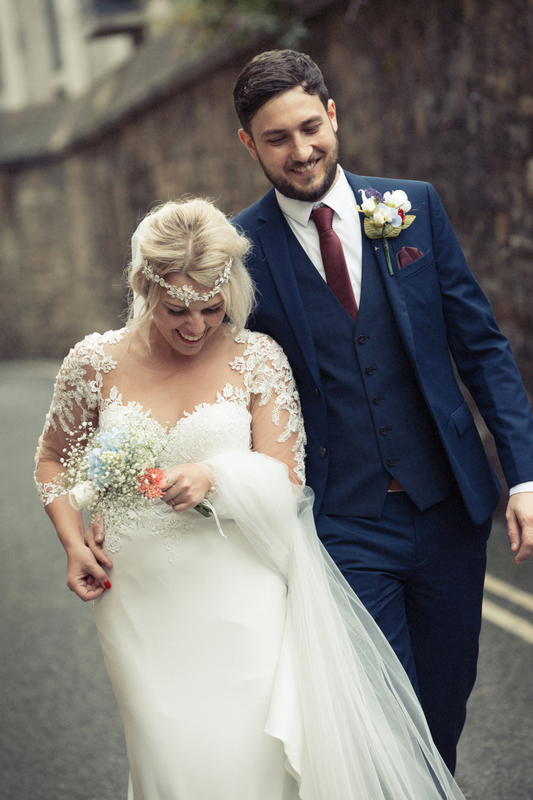 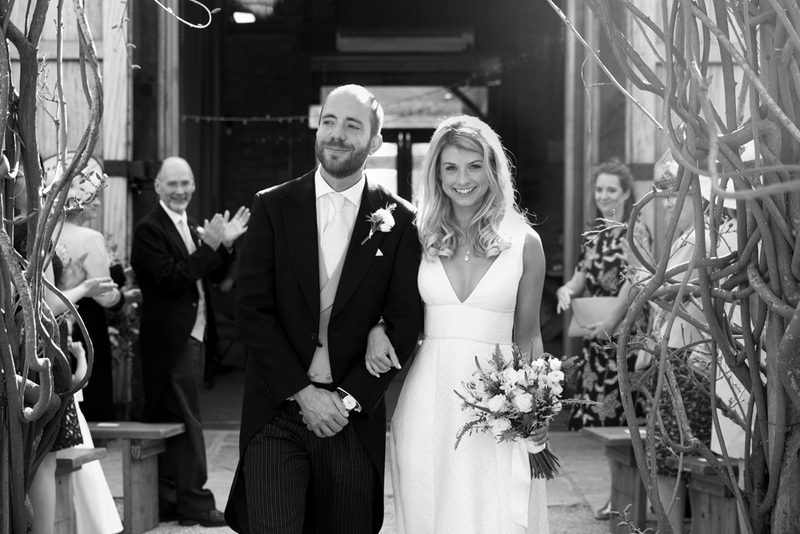 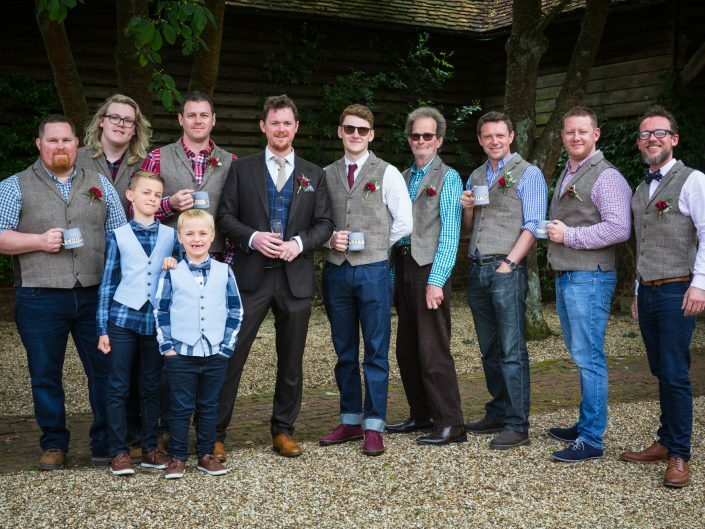 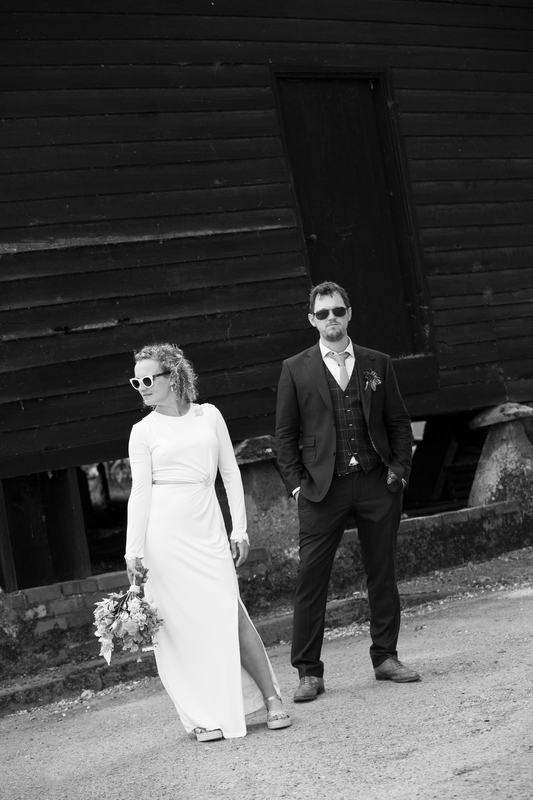 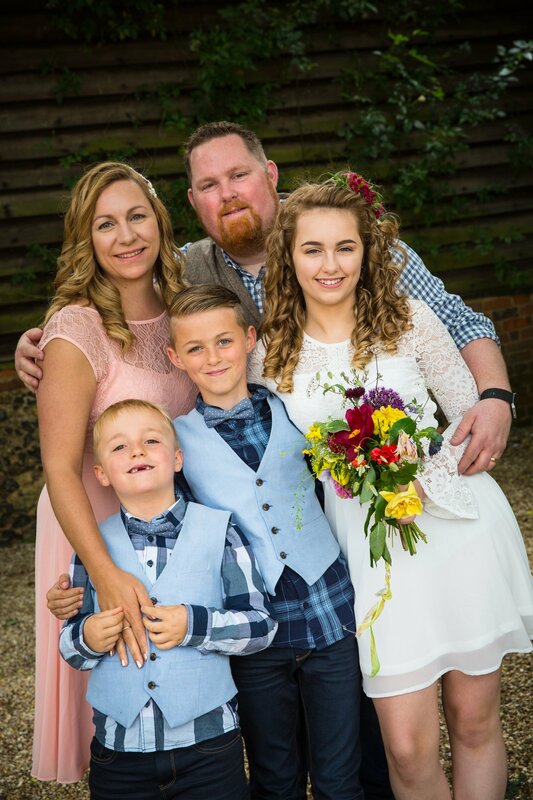 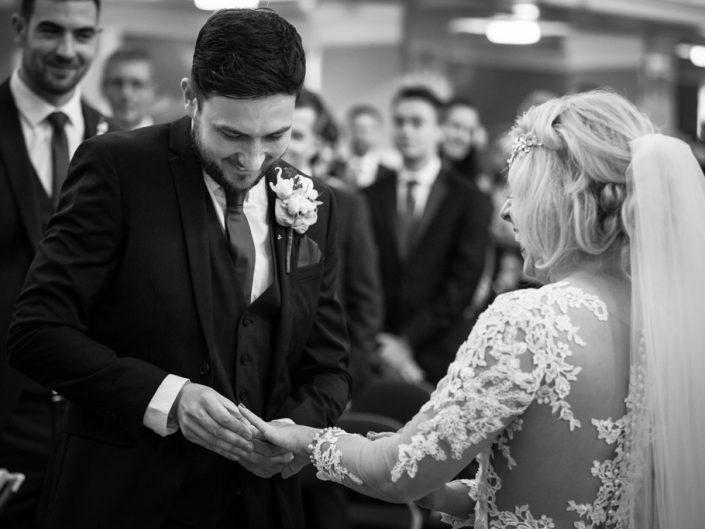 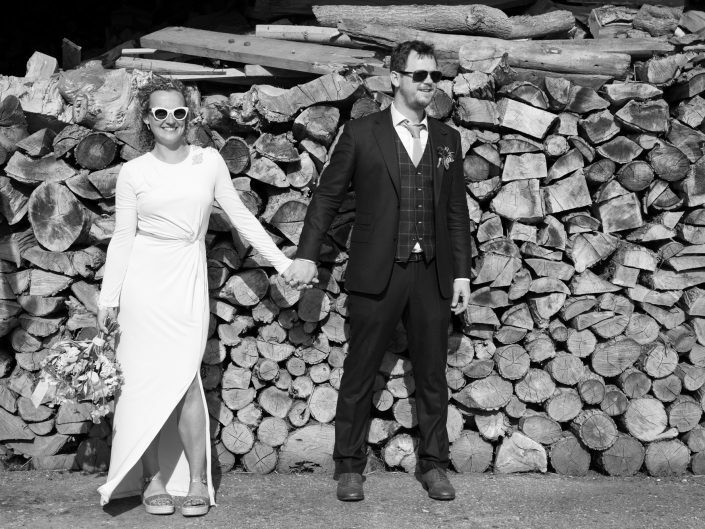 They have a background in food & have run highly regarded restaurants The Half Moon, Cuxham & The Red Lion, Britwell Salome so we knew the food & styling of this wedding would be amazing! 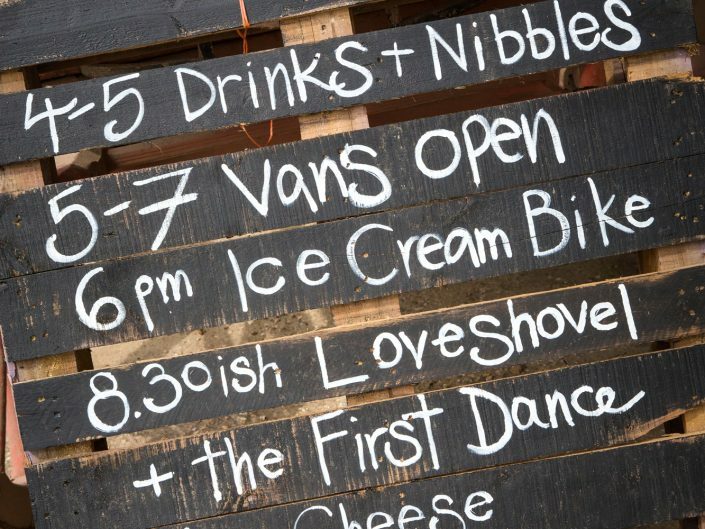 They are busy renovating The Mill in Cuxham, running pop up restaurants & have an amazing holiday let at The Mill, called The Granary. 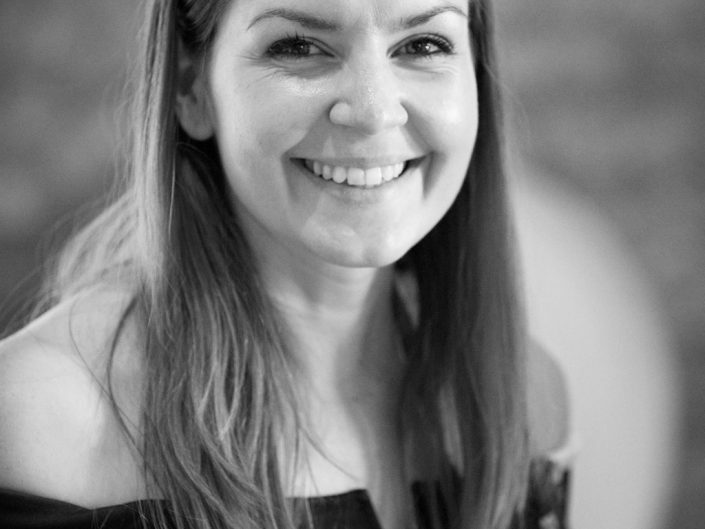 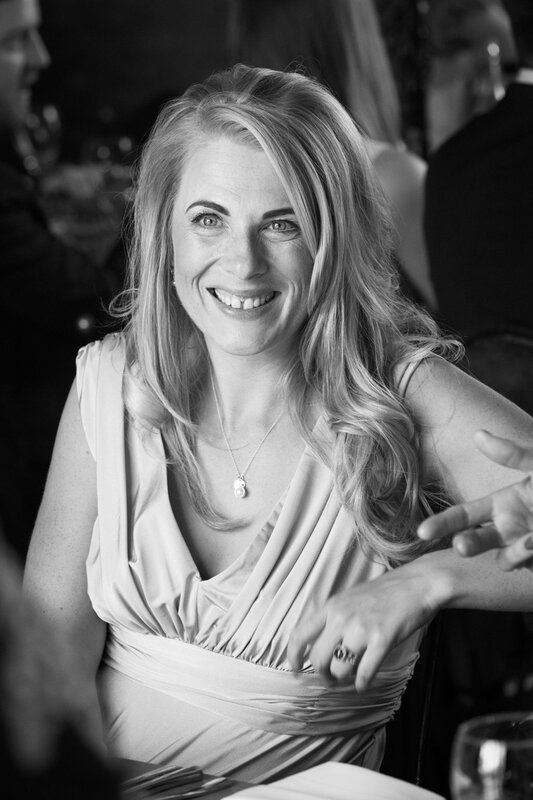 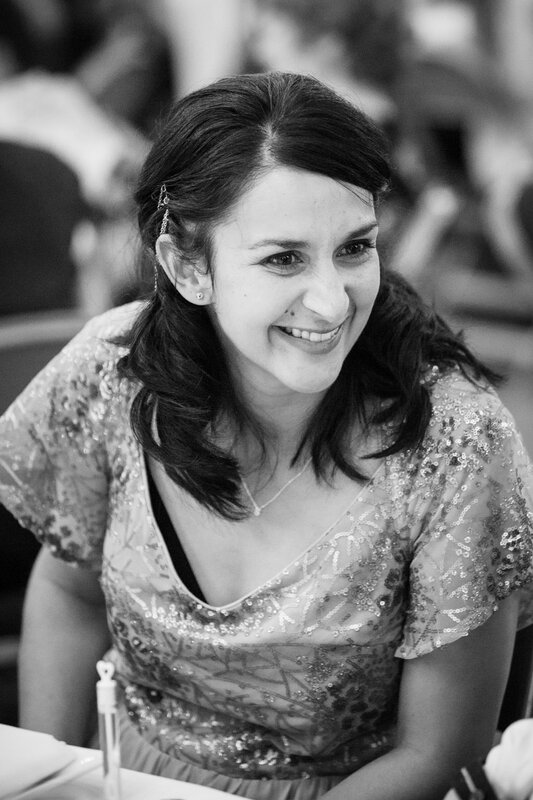 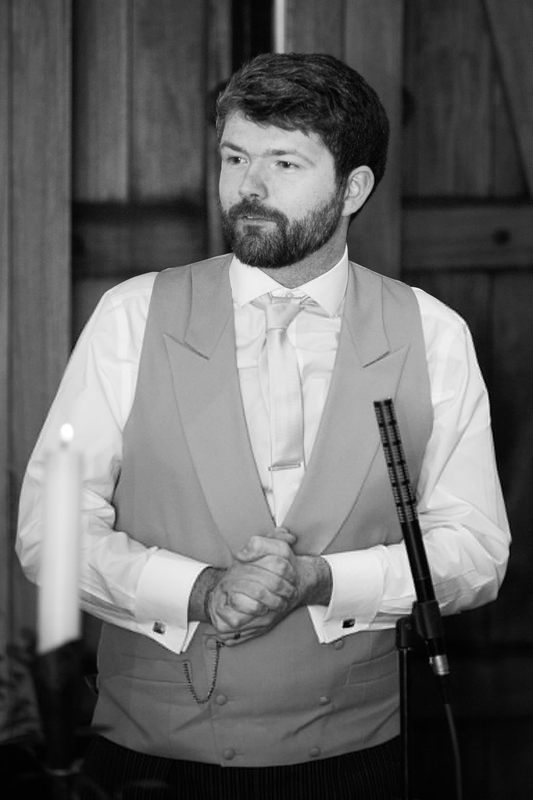 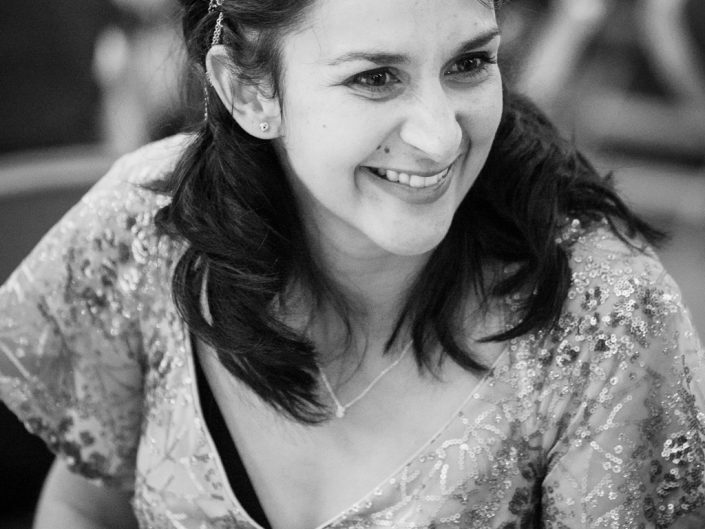 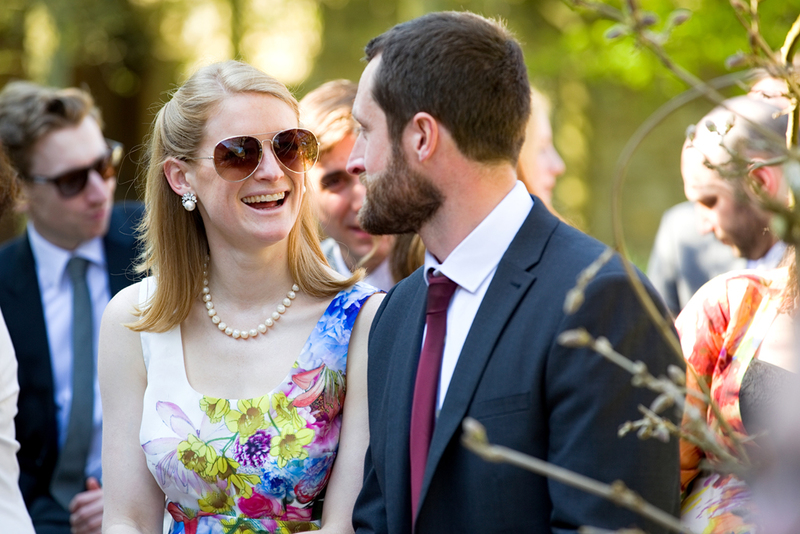 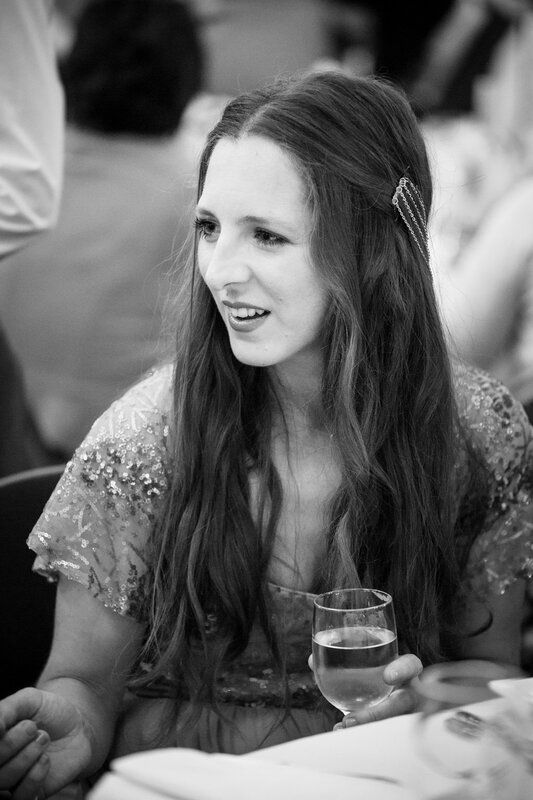 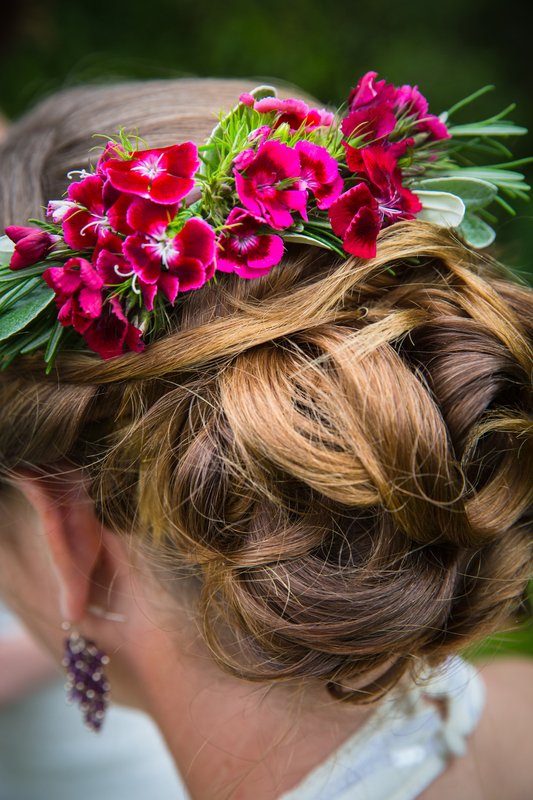 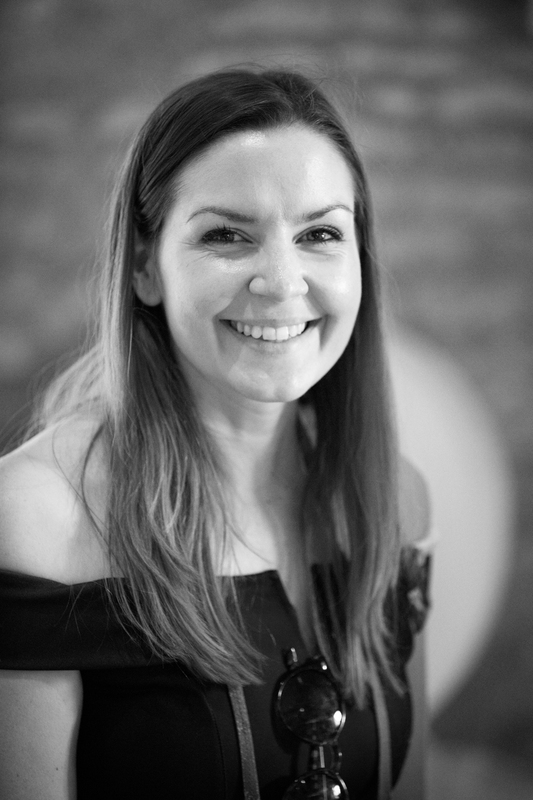 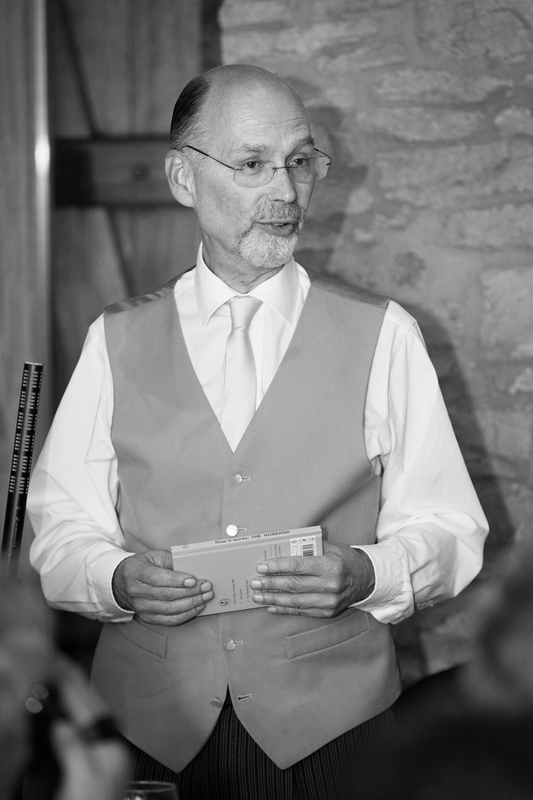 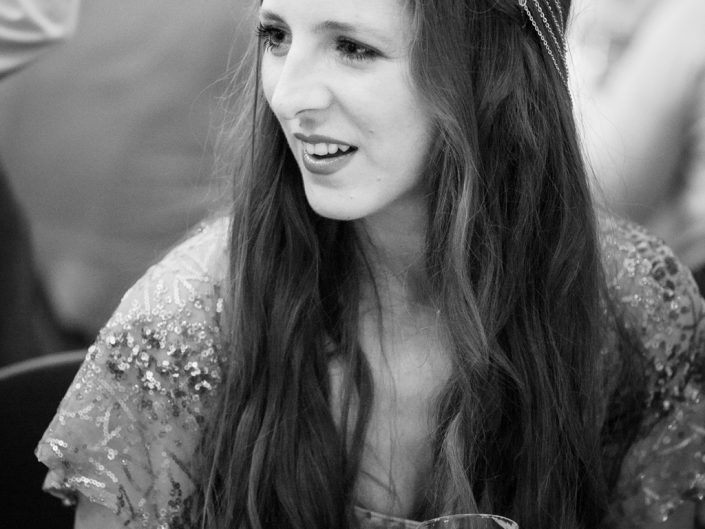 Recently Amy & headed to The Pavilion at Lane End to photograph the wedding of Martha & Nick. 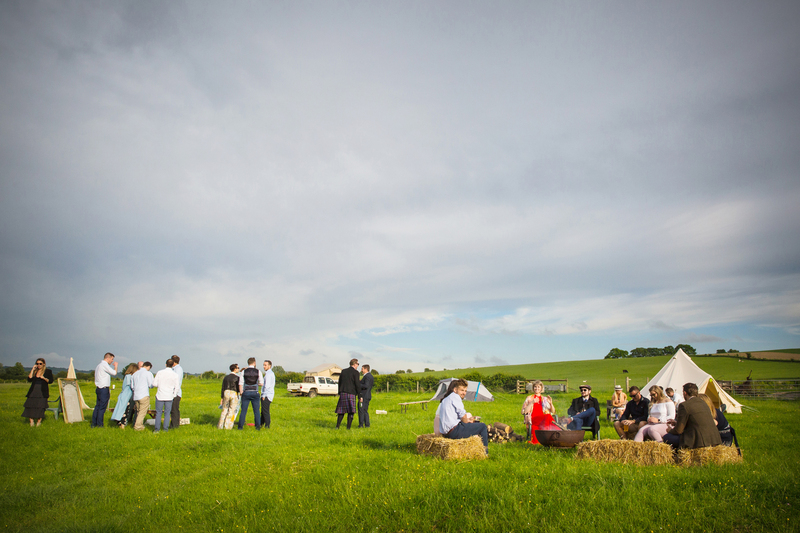 With a week of rain before the wedding we had our fingers crossed that we night have some sunshine! 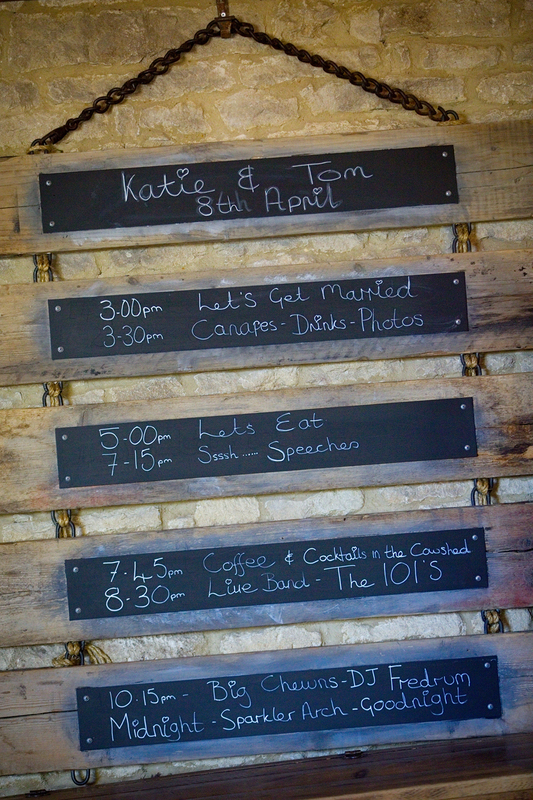 Both Amy & I started just before the ceremony photographing Martha & Nick’s friends & families arriving. 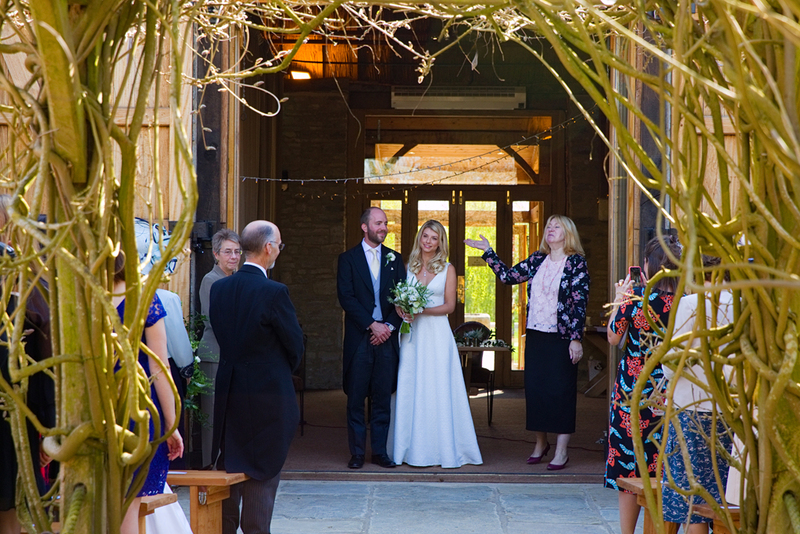 With showers blowing through the ceremony was held in a lovely light conservatory. 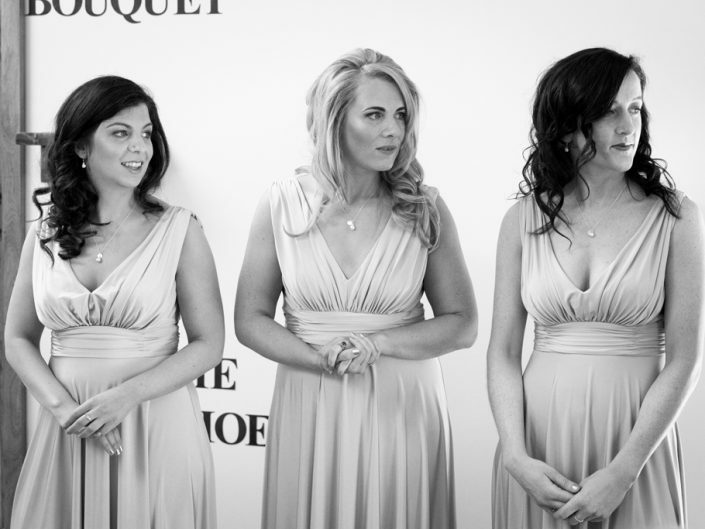 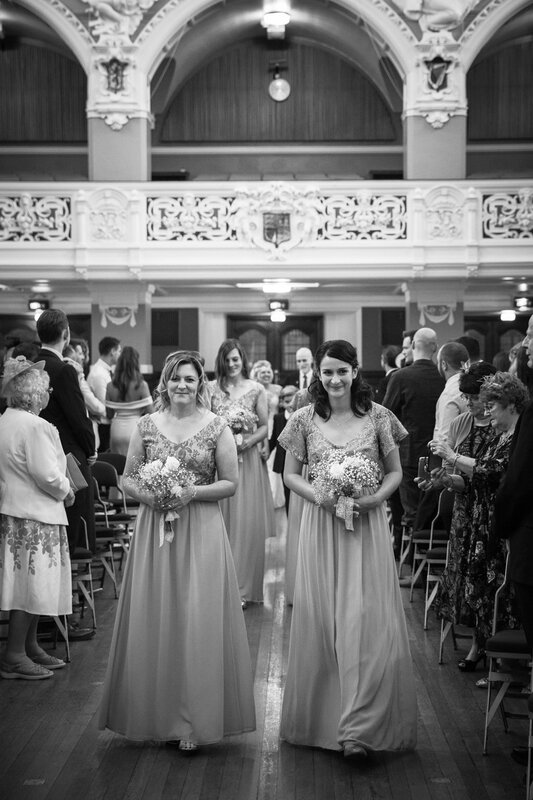 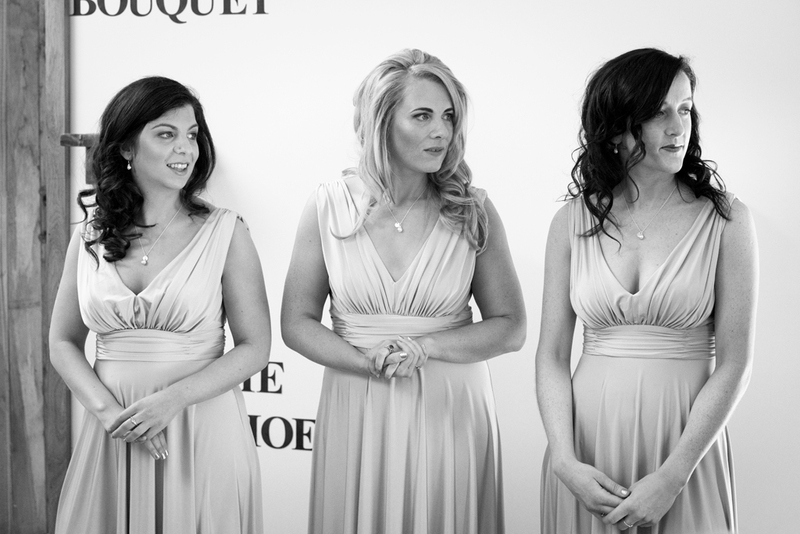 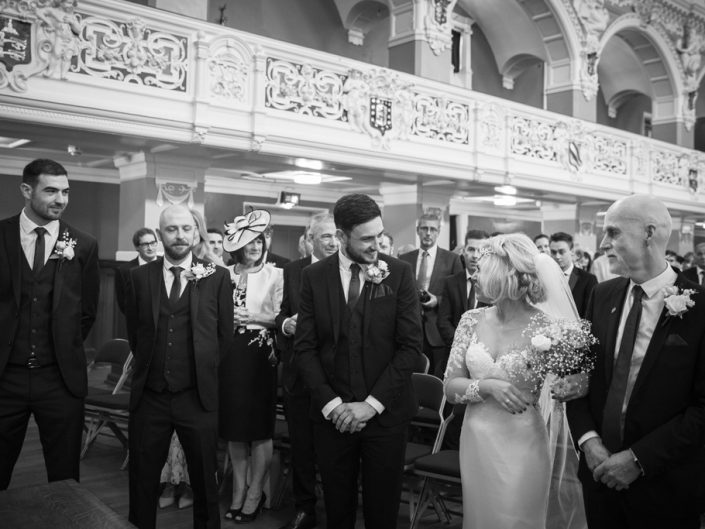 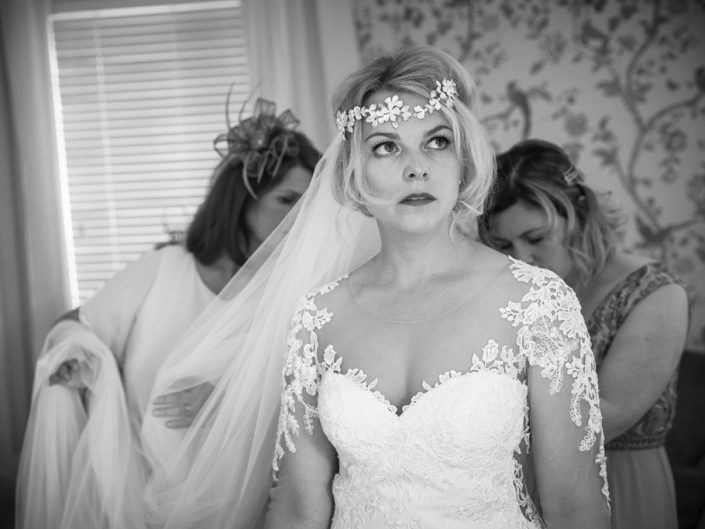 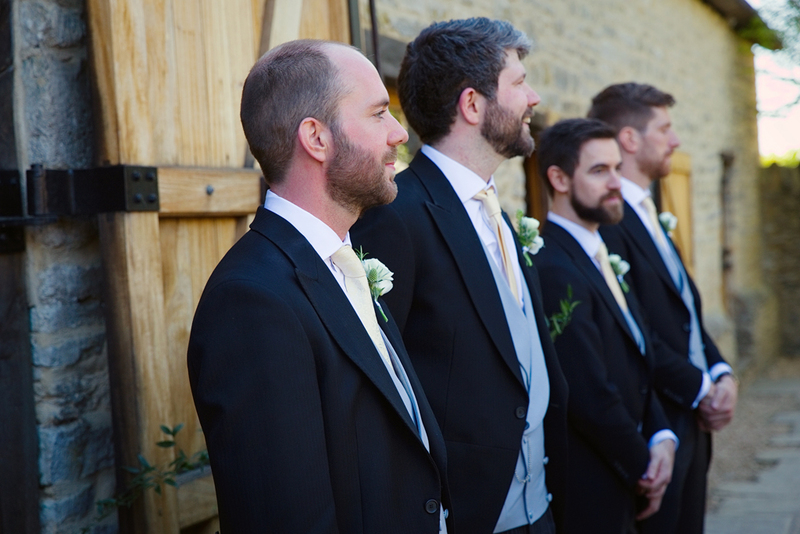 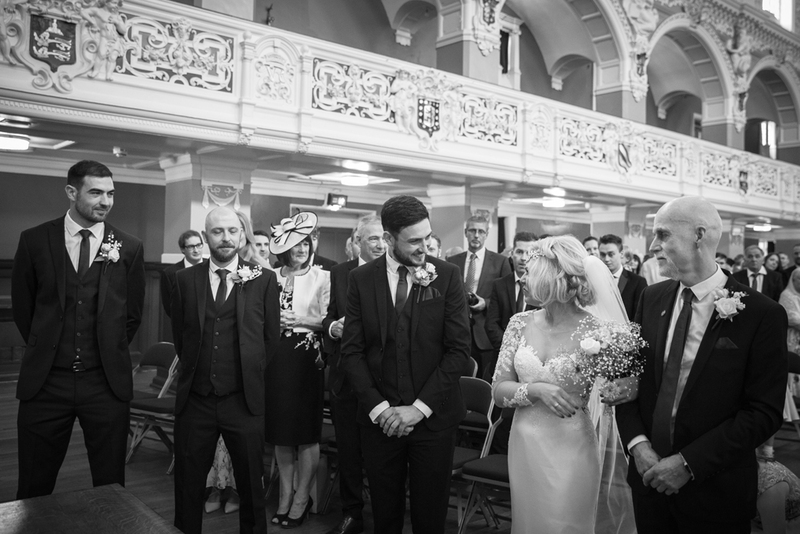 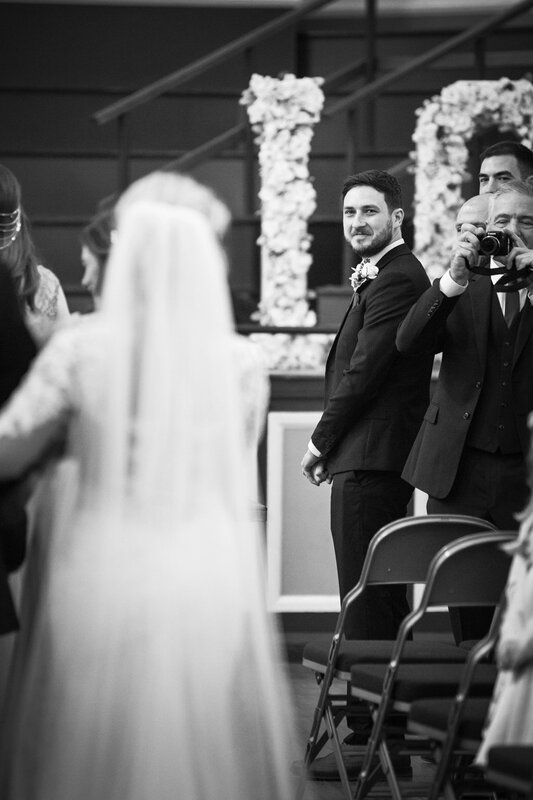 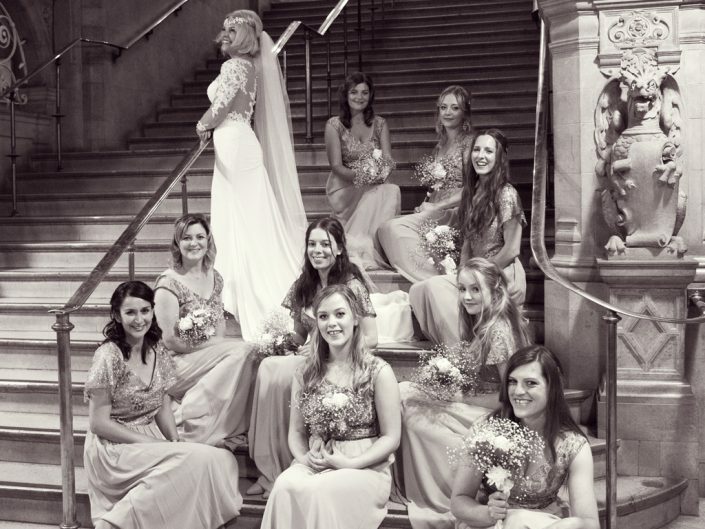 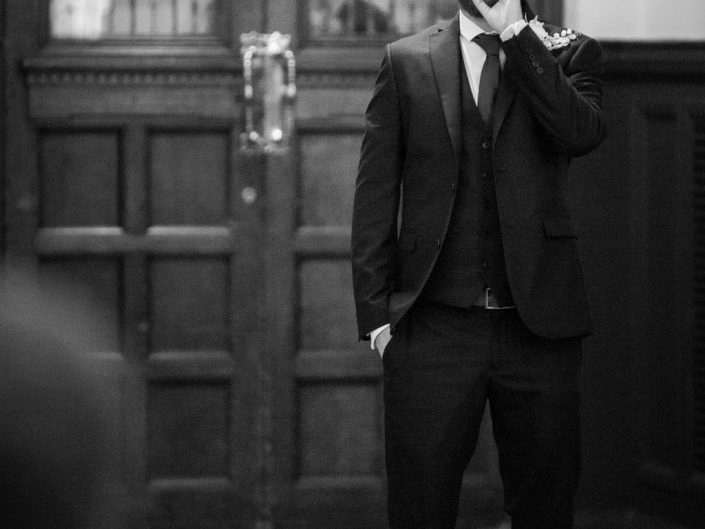 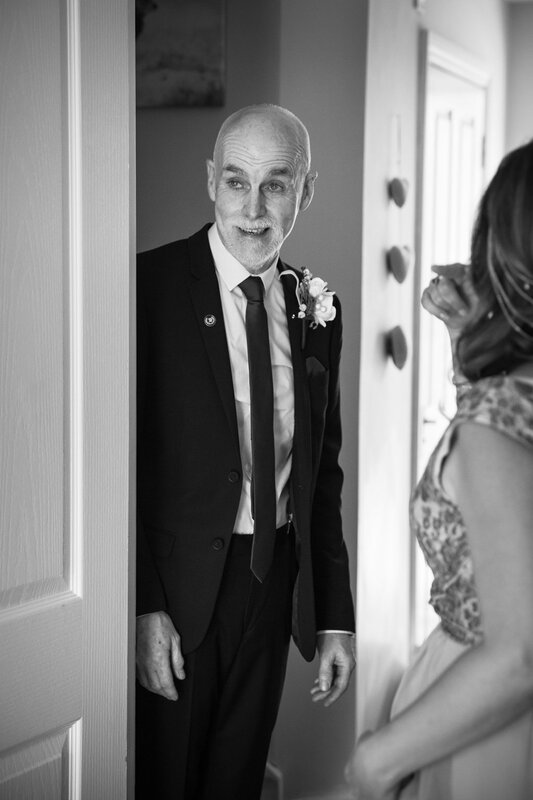 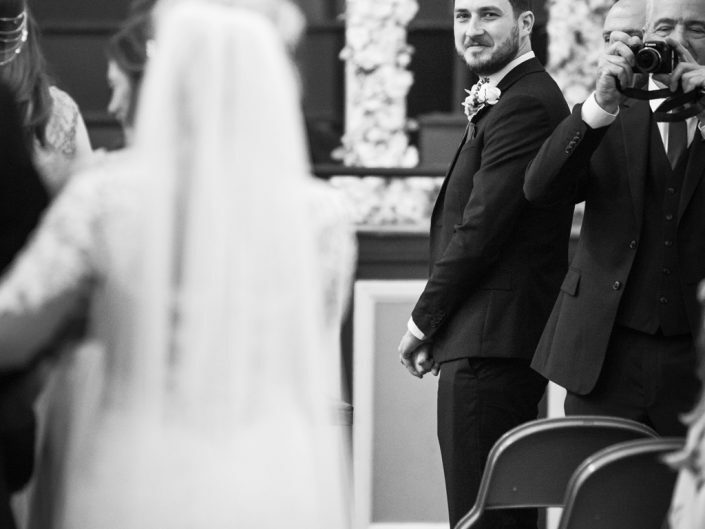 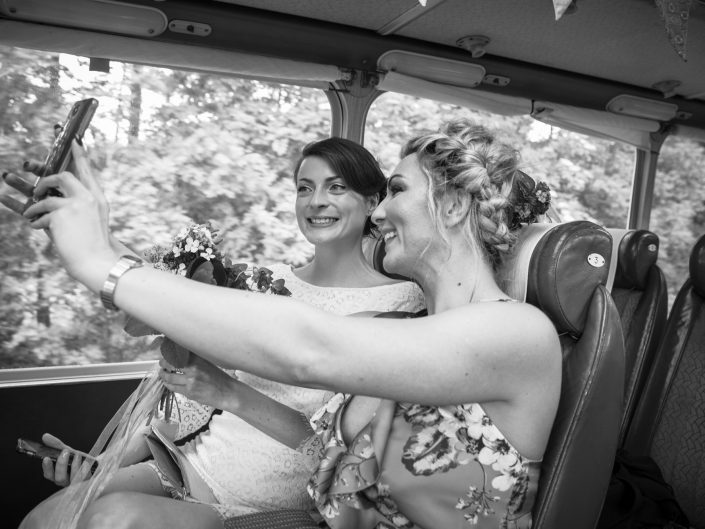 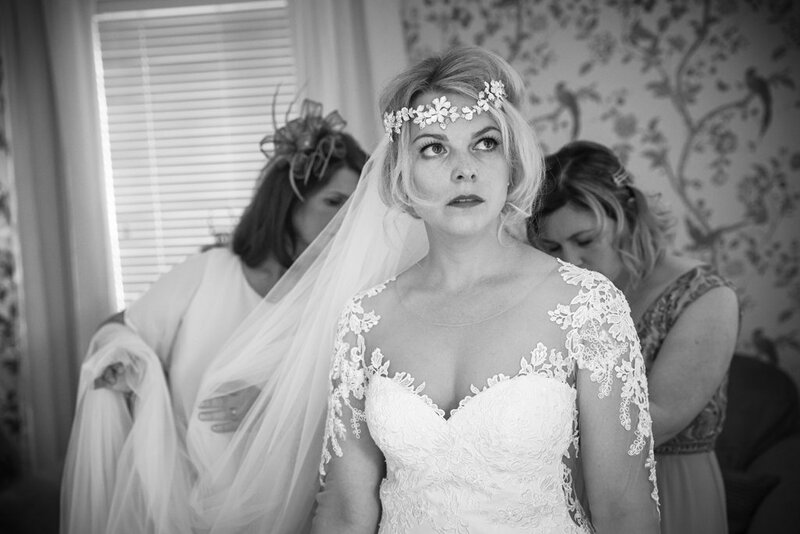 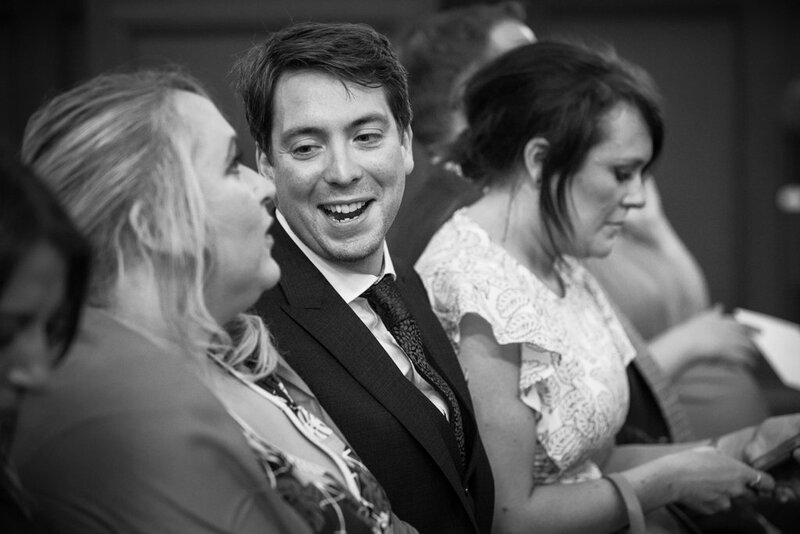 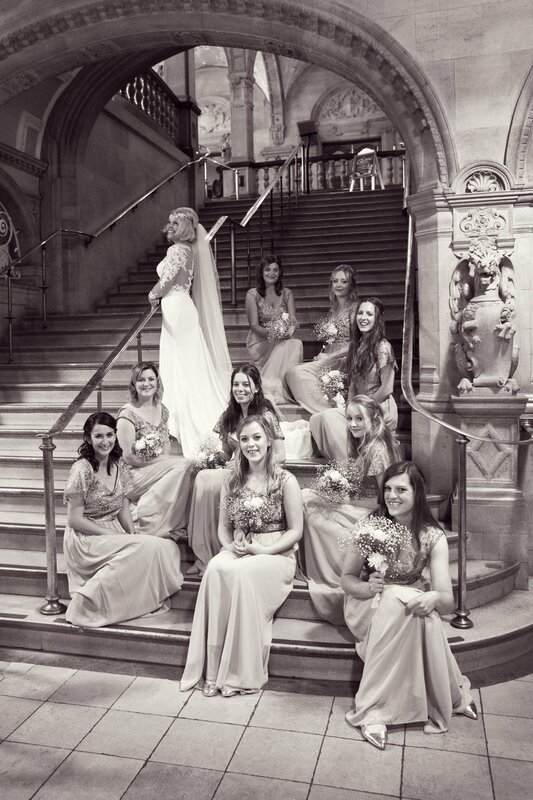 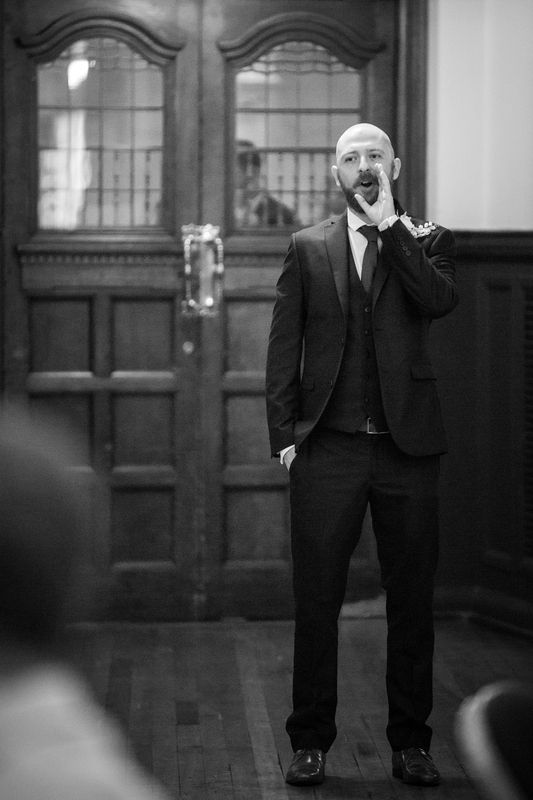 I placed myself at the front & Amy was positioned at the back to capture the bride’s arrival. 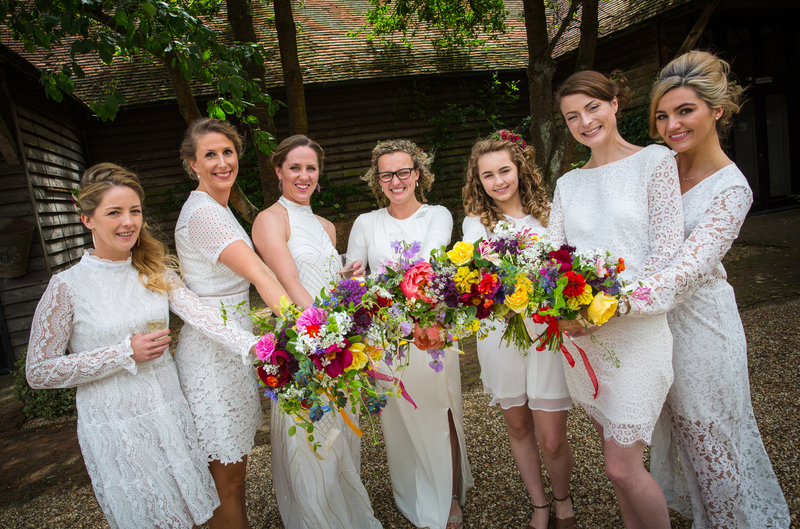 The flowers for the wedding were done by some lovely friends of ours Londa & Charlotte from The Daisy Chain in Princes Risborough. 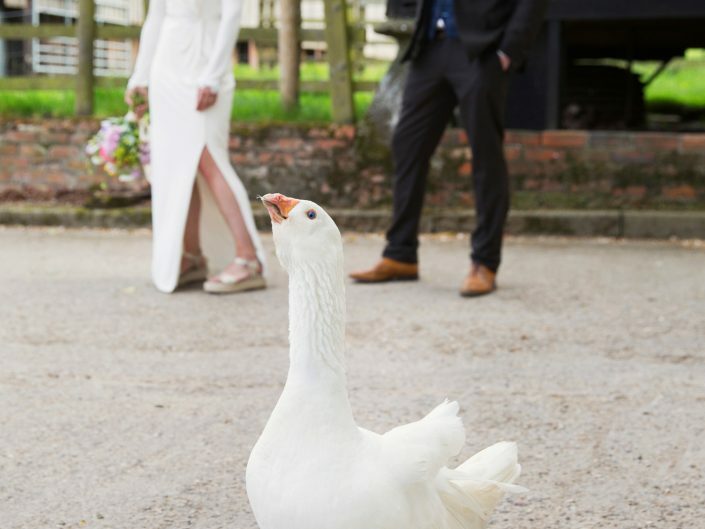 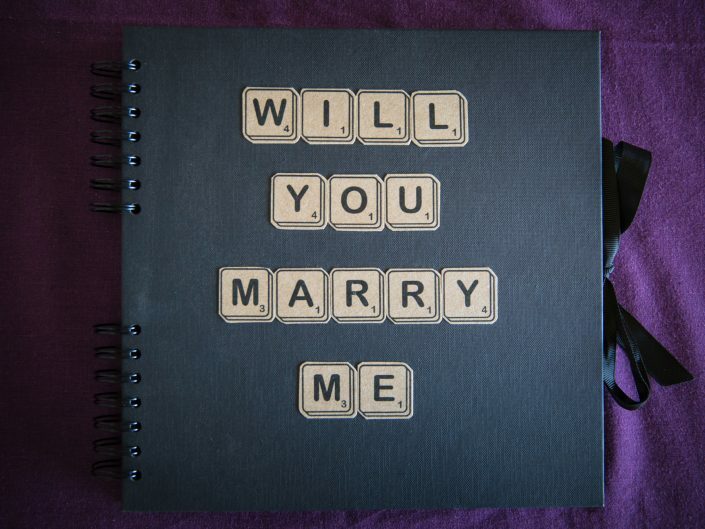 In fact, they recommend us to the happy couple! 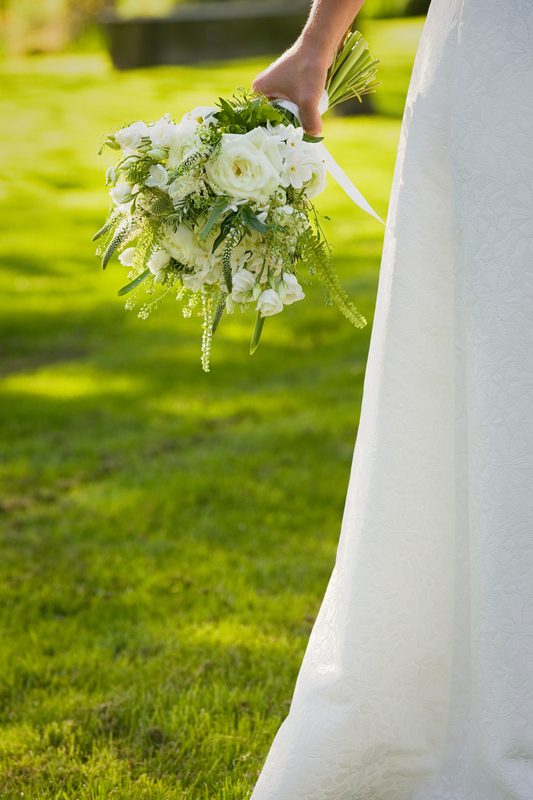 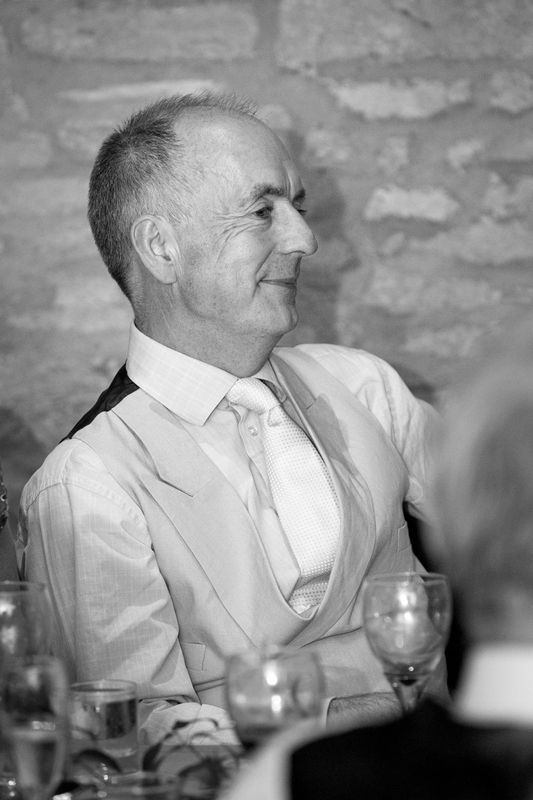 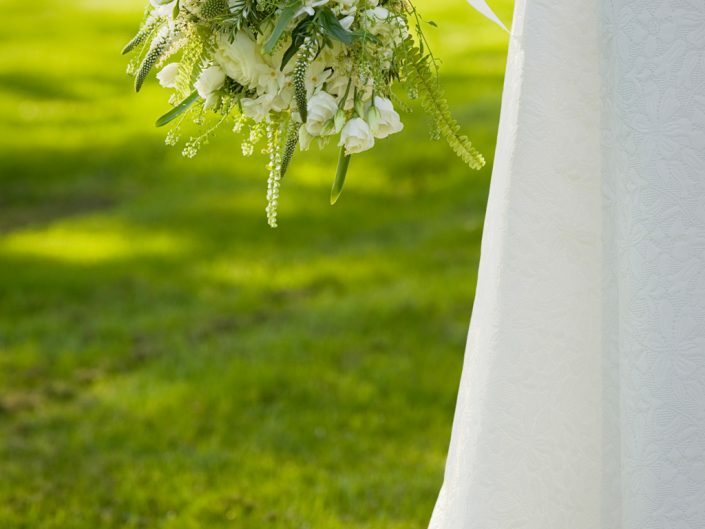 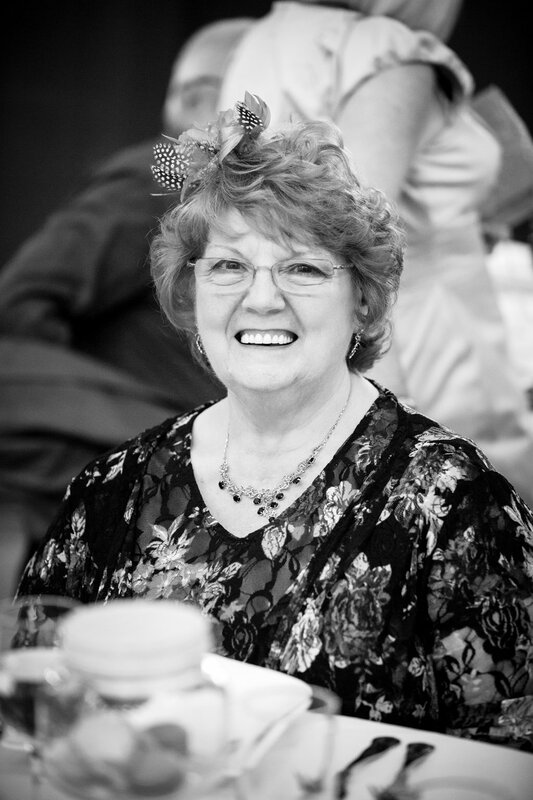 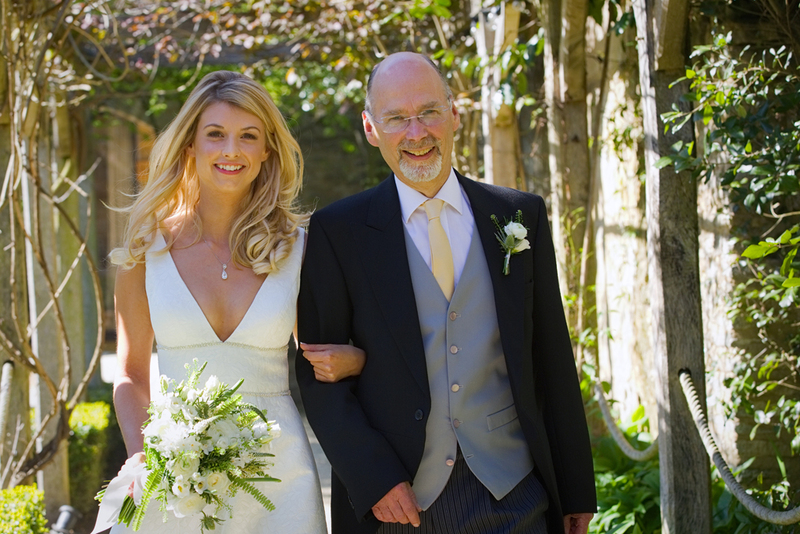 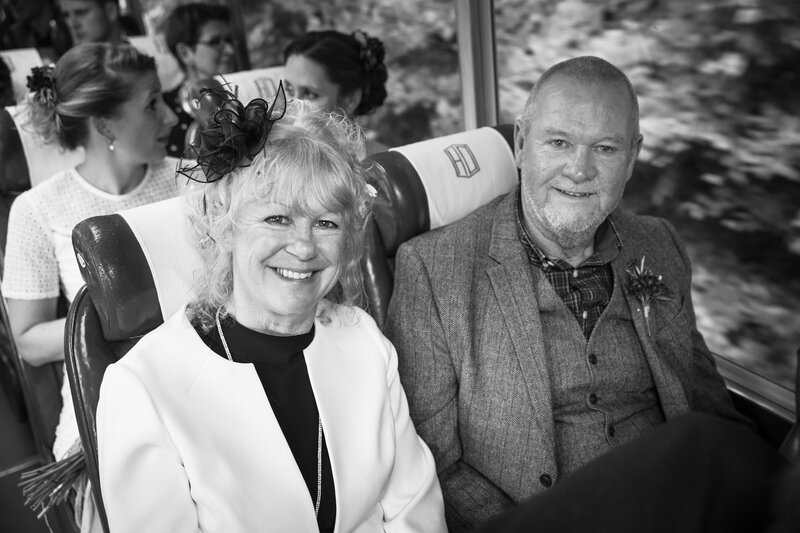 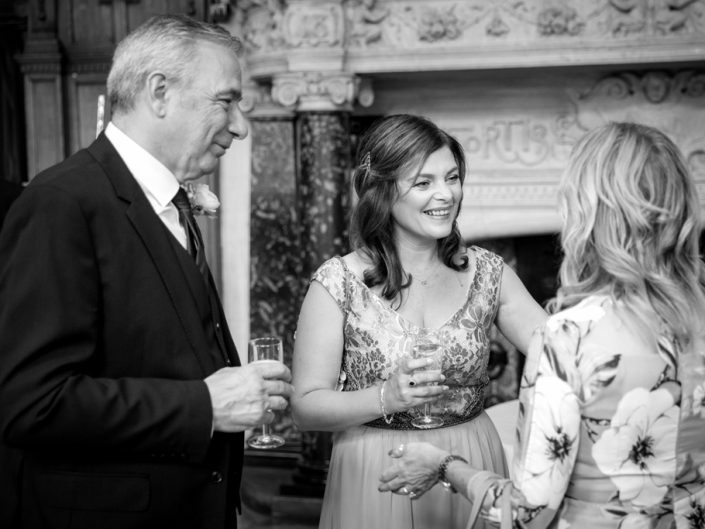 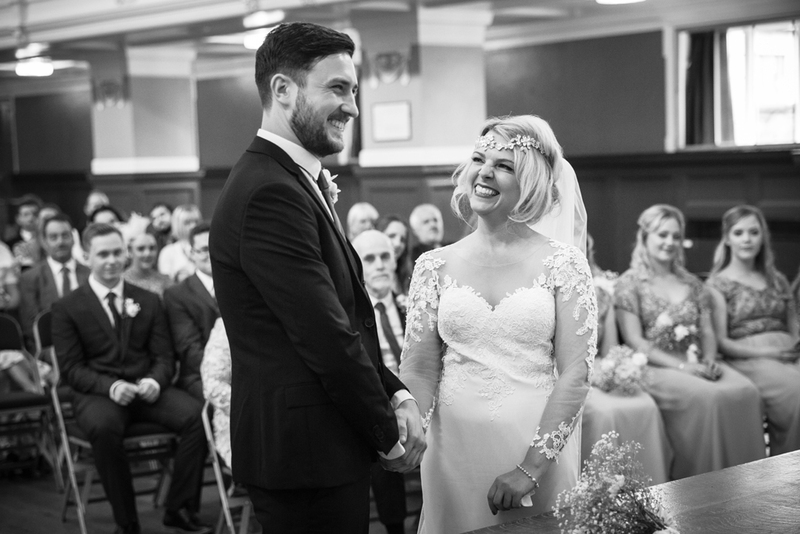 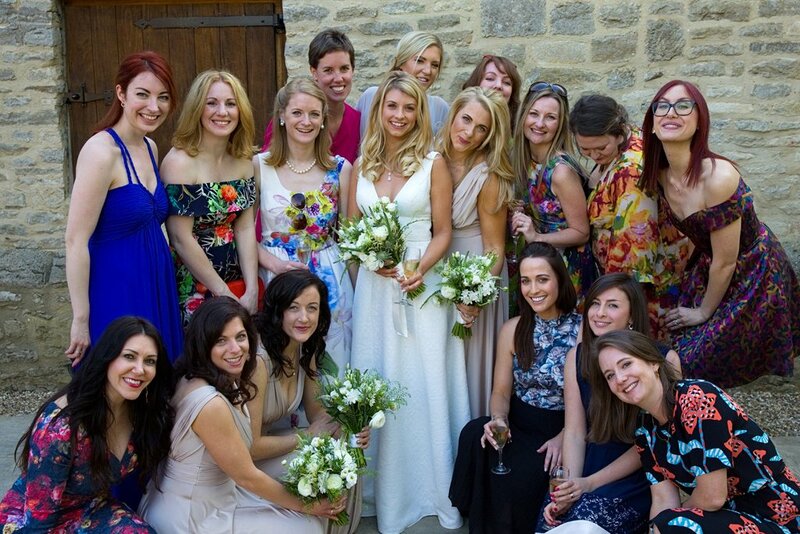 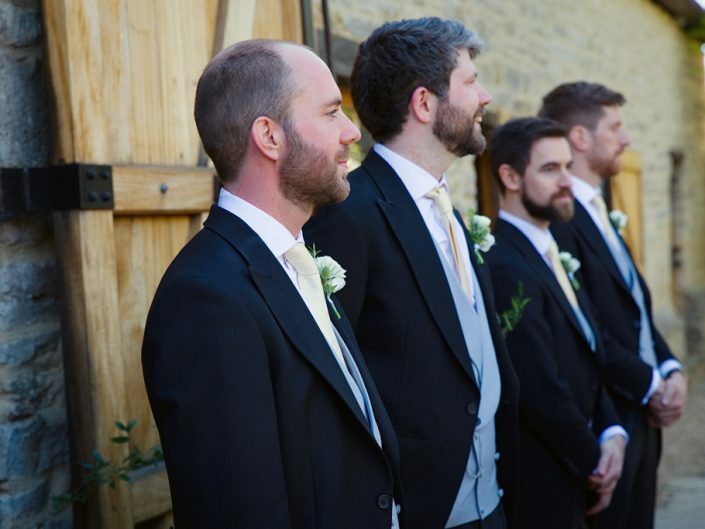 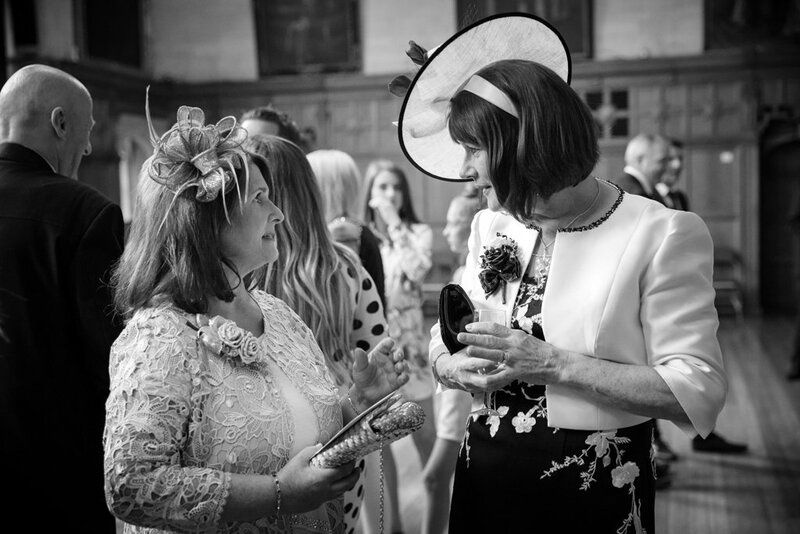 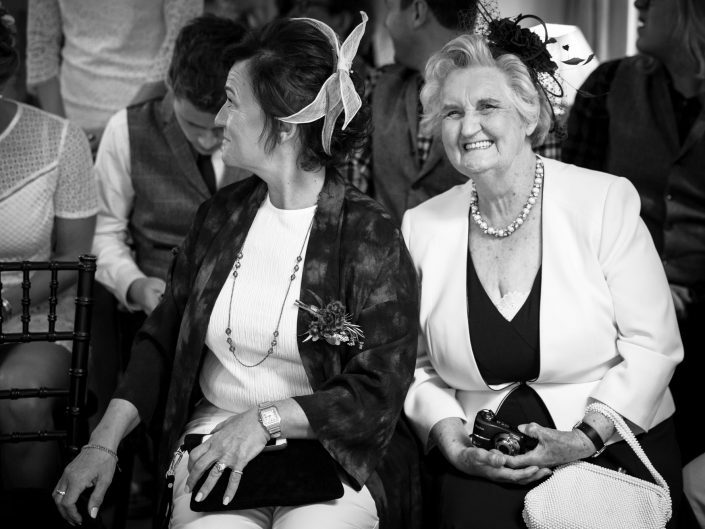 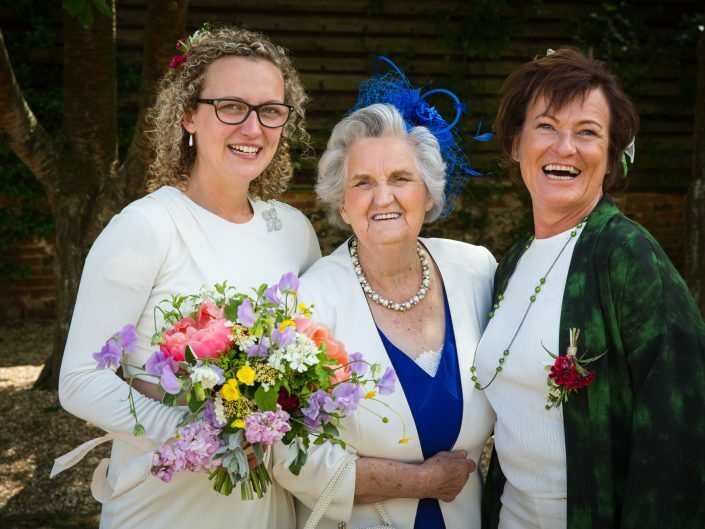 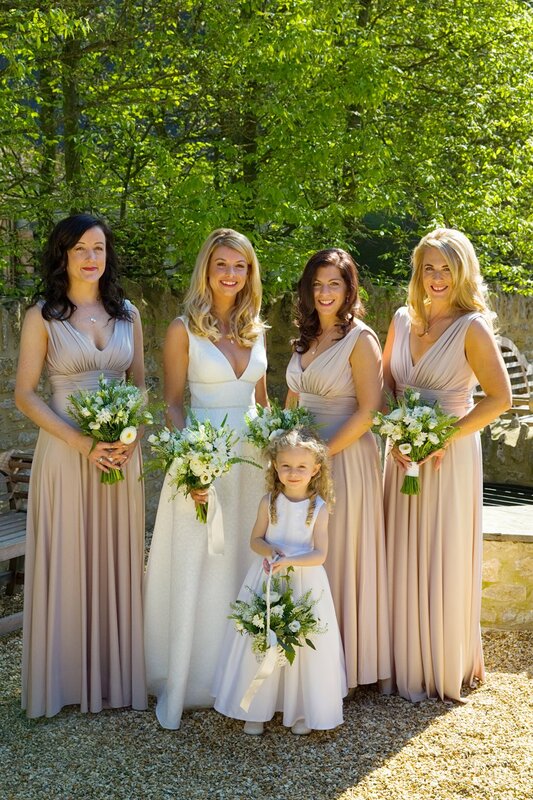 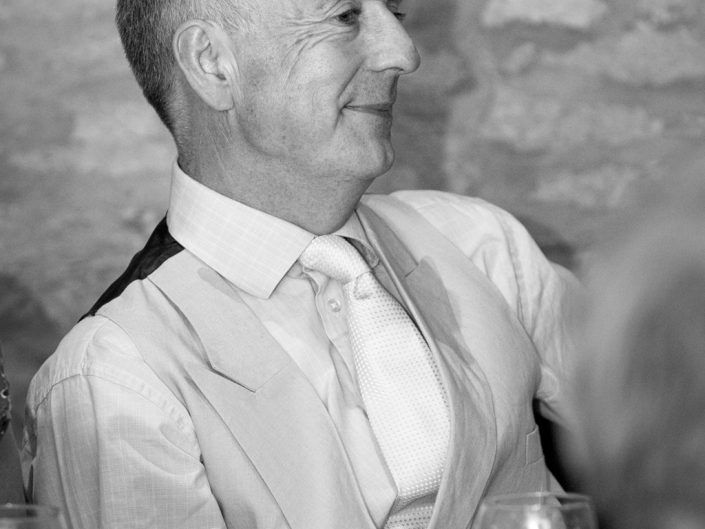 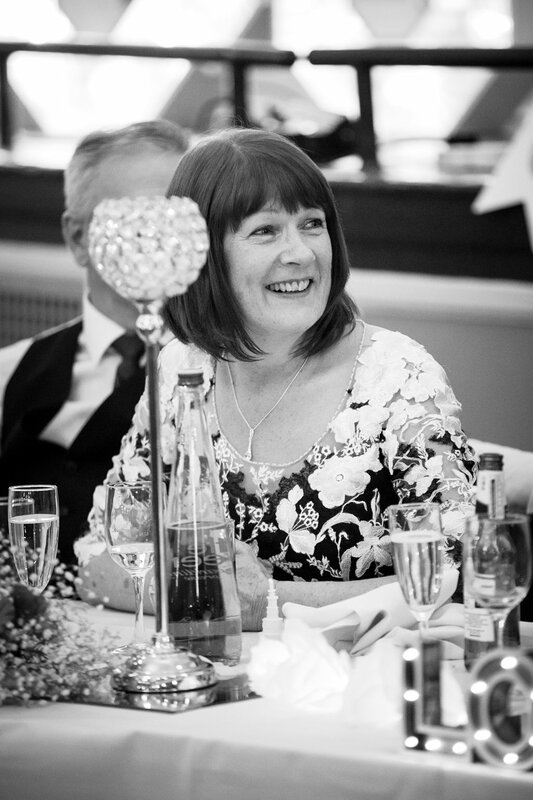 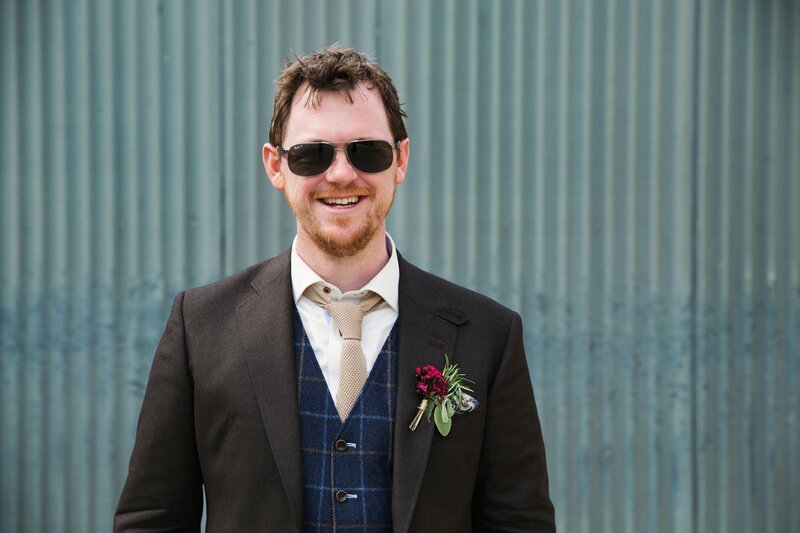 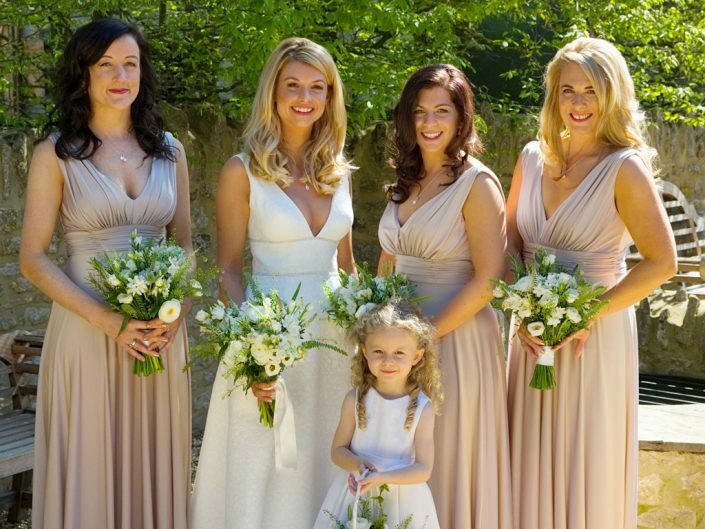 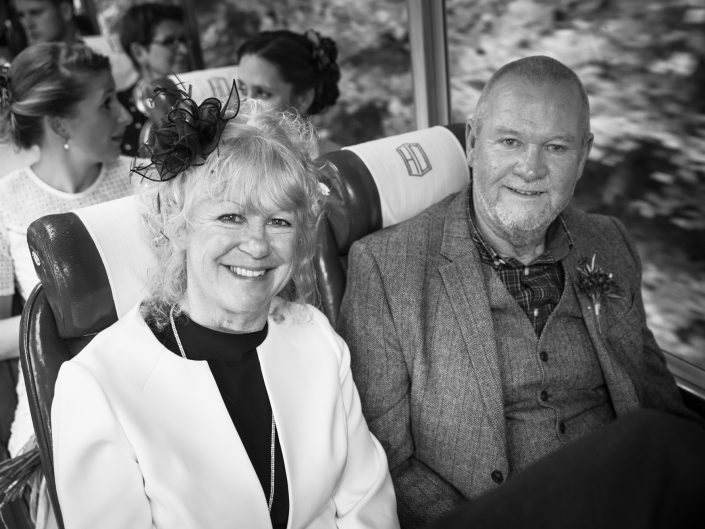 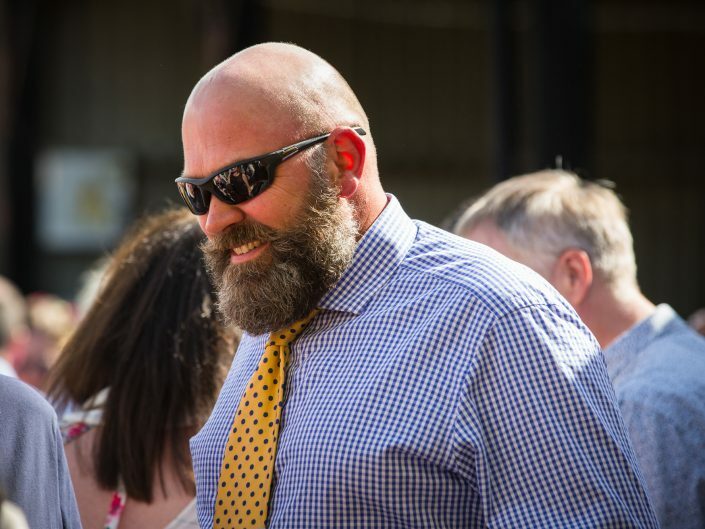 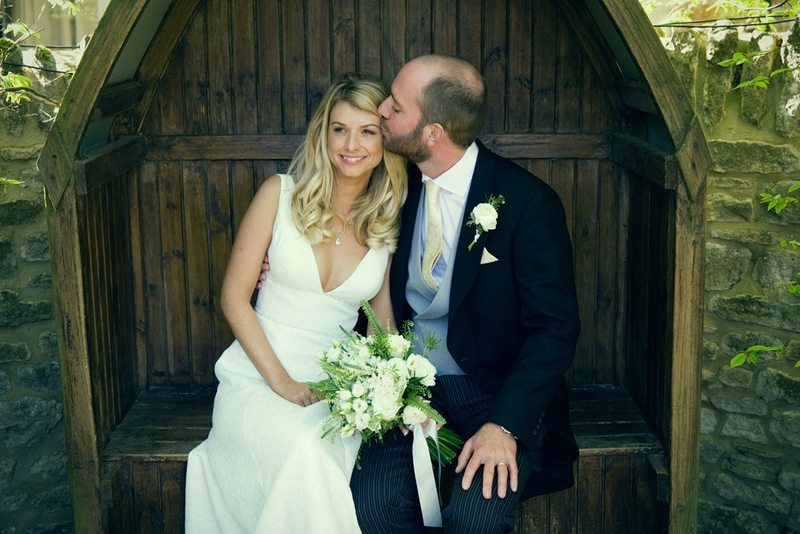 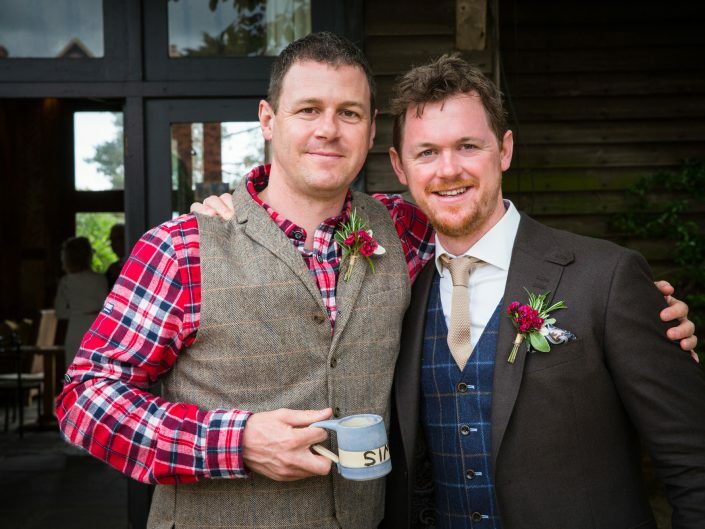 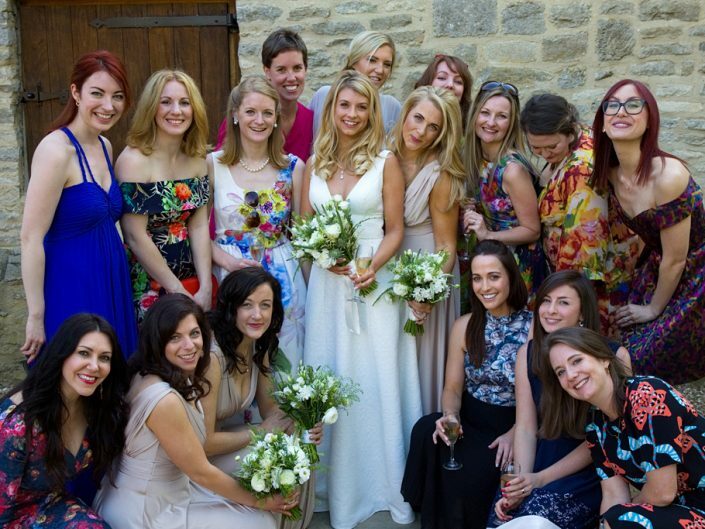 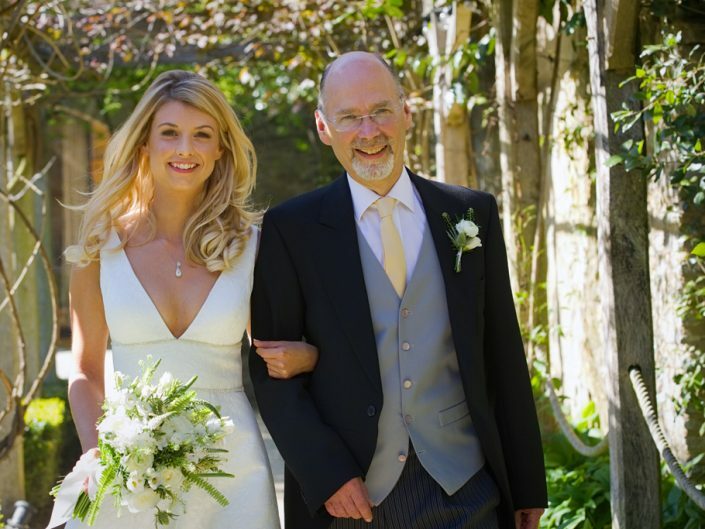 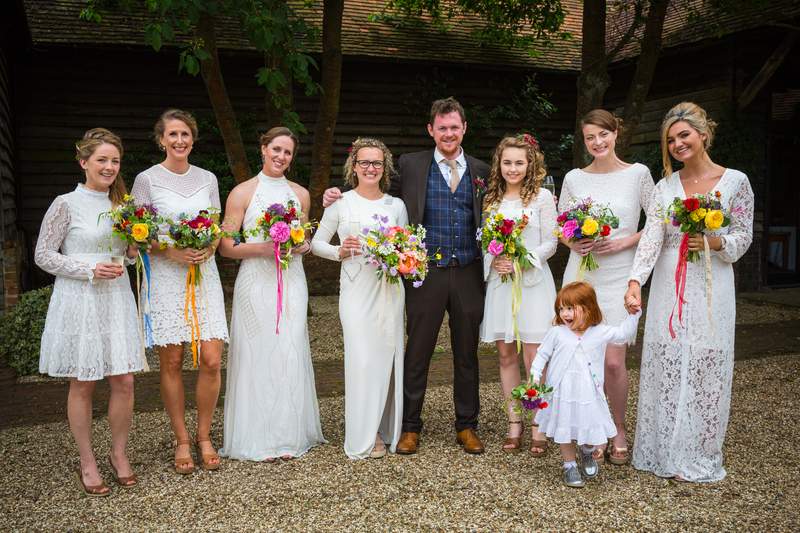 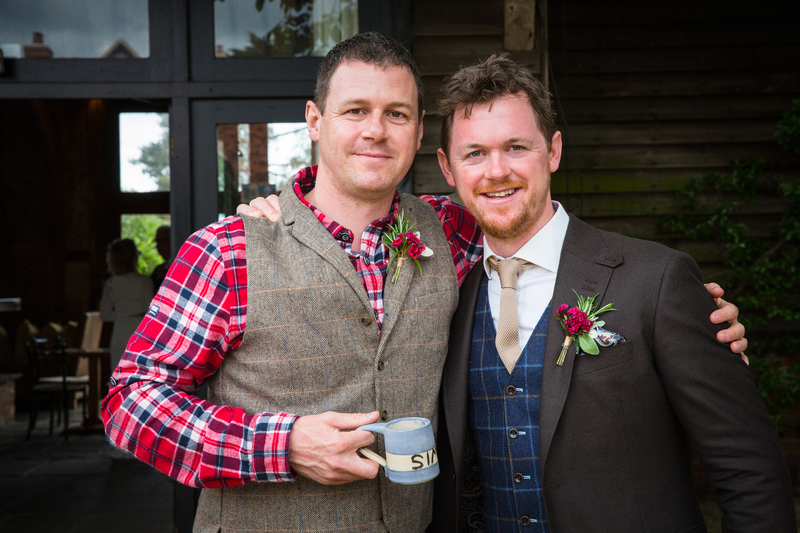 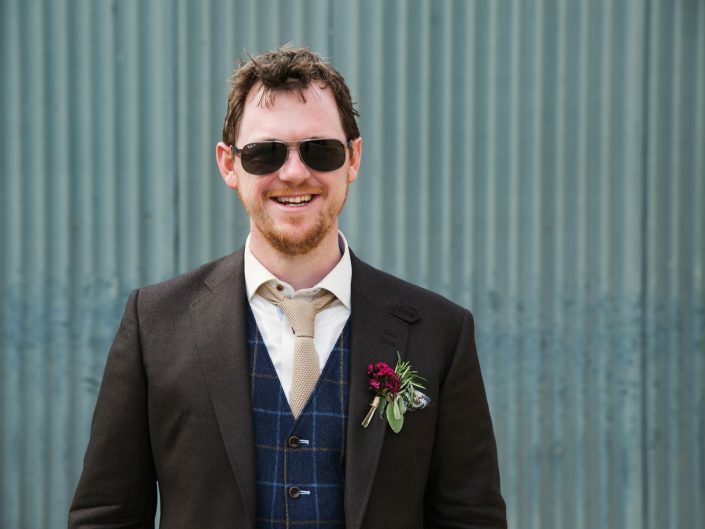 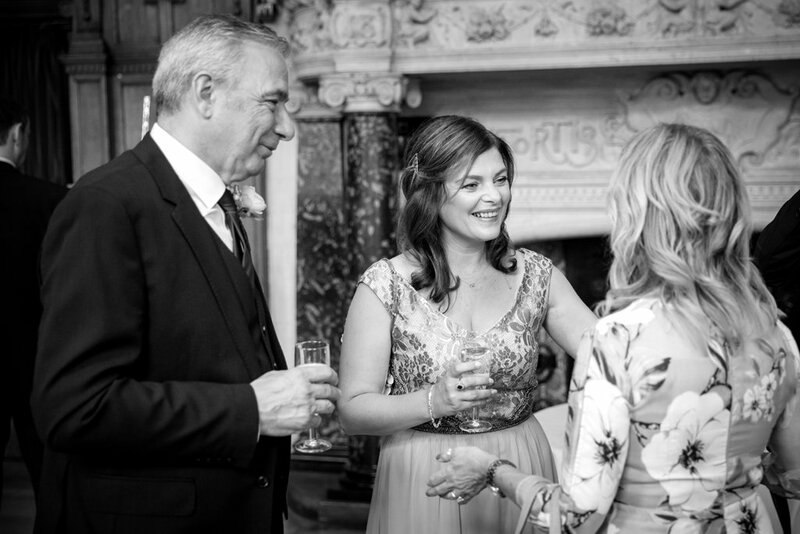 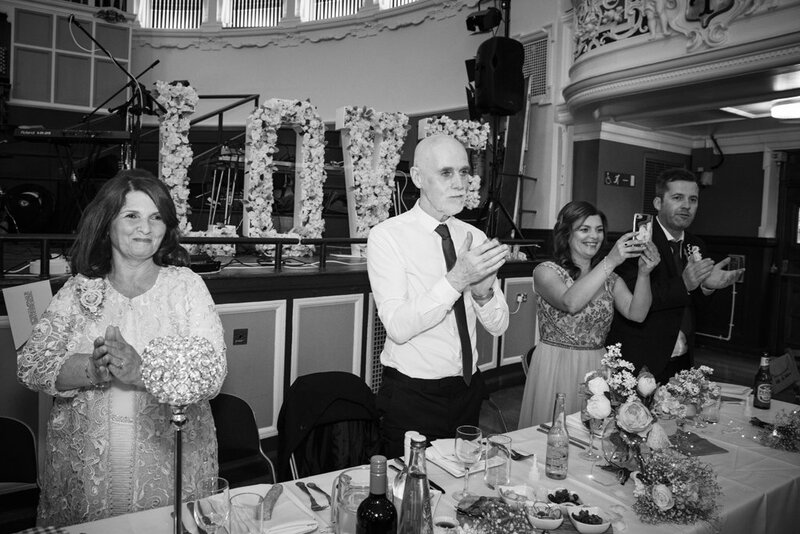 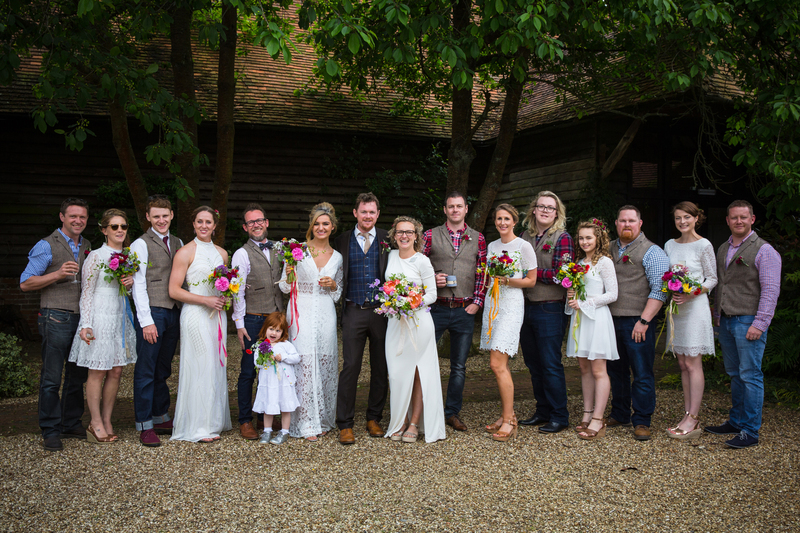 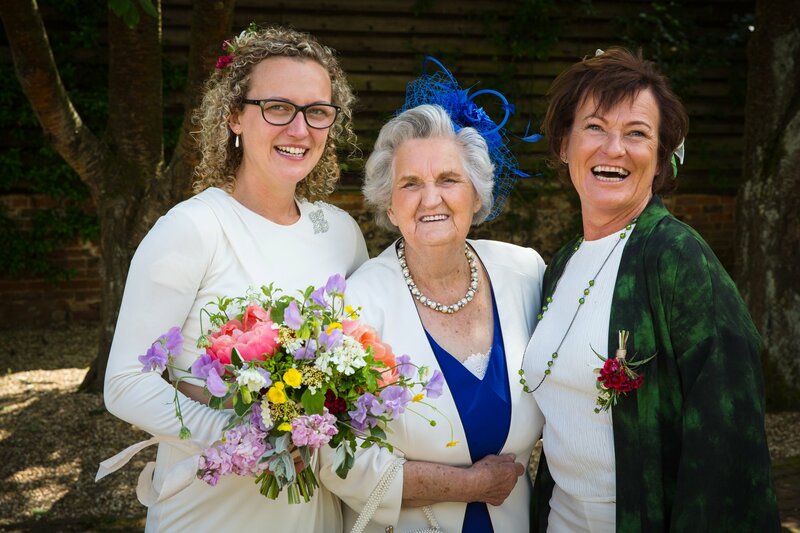 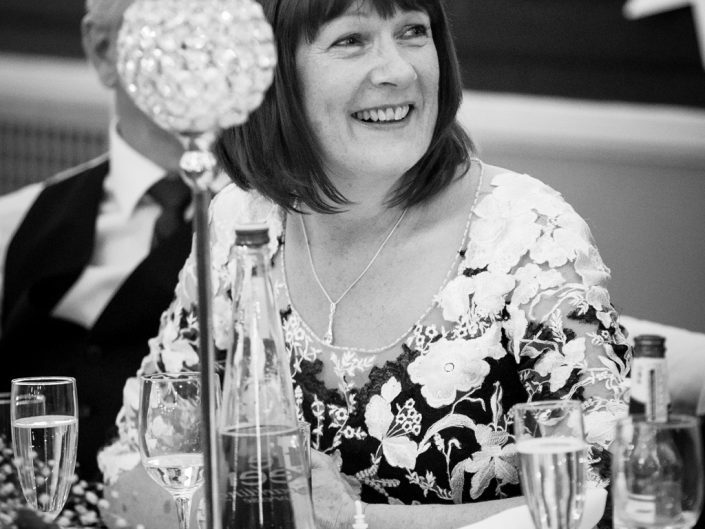 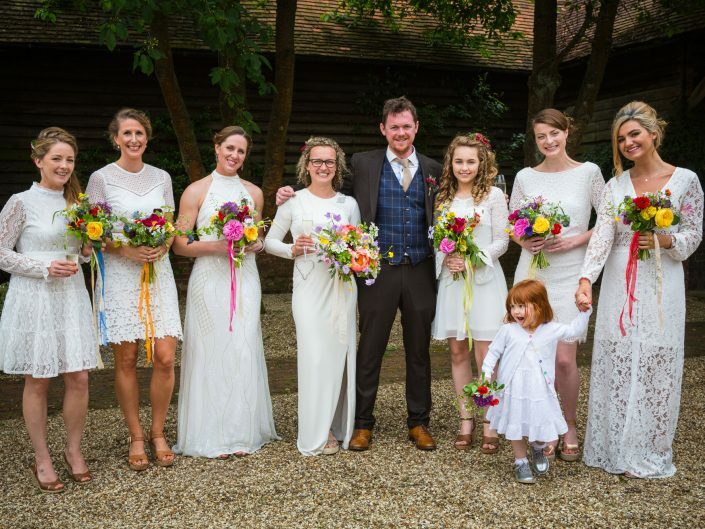 The flowers were a lovely mix of yellow & perfectly matched the relaxed style of the wedding. 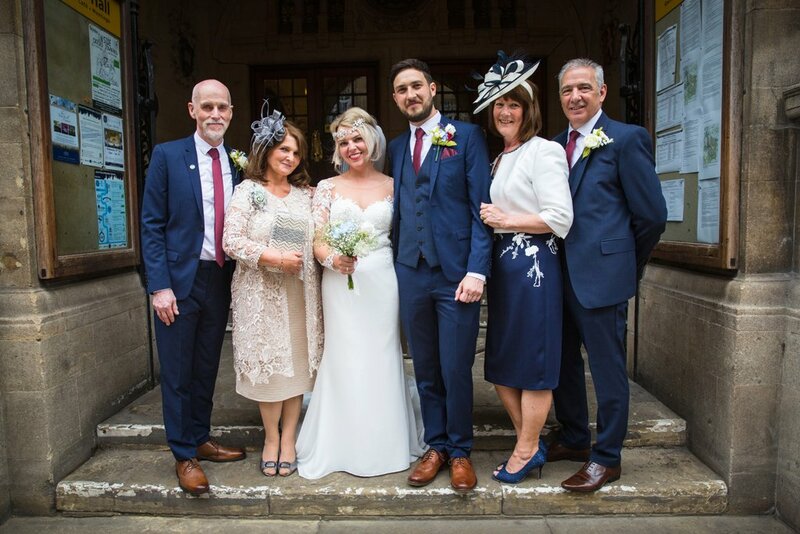 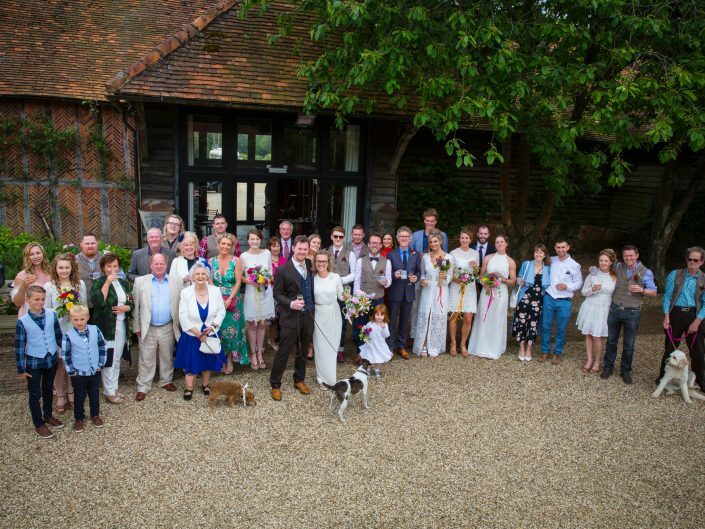 After a lovely service as the guests mingled we did the formal group photos, at one moment we thought we may have to do them indoors but just at the last minute the skies cleared & the sun came out. 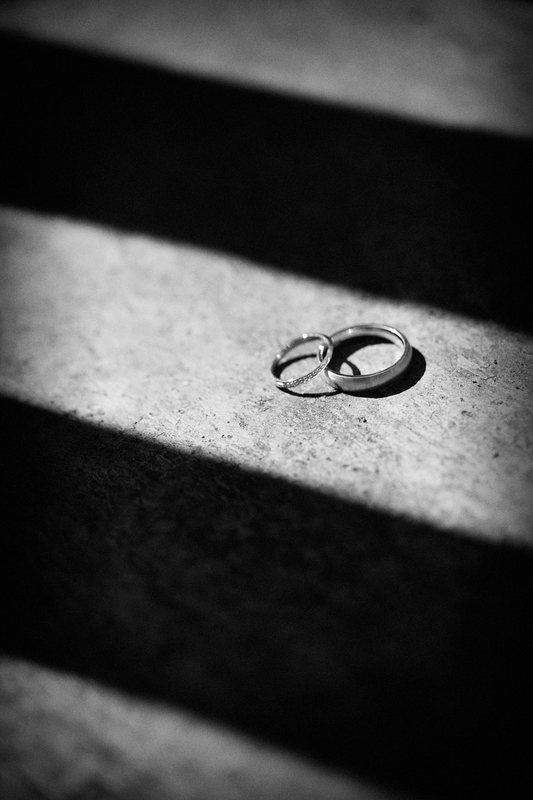 With the sun shining we took the opportunity to steal the couple away to do some images of the two of them. 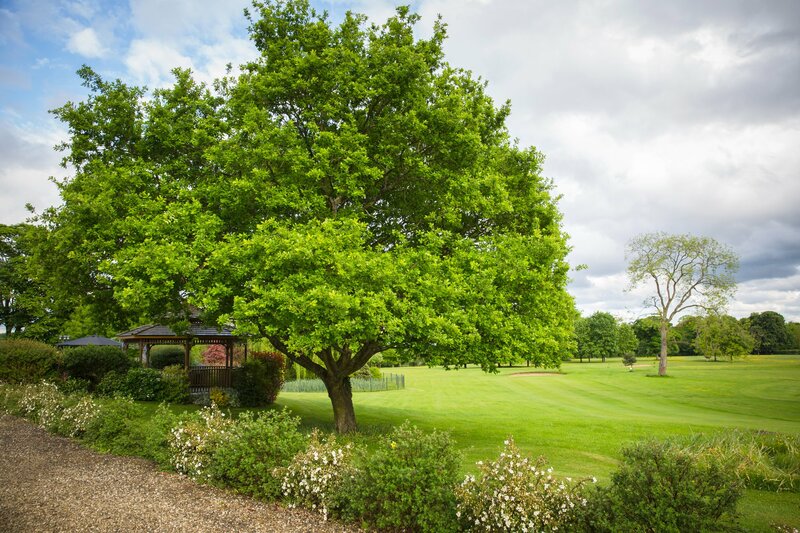 The grounds were beautiful & looked fabulous at this time of year. 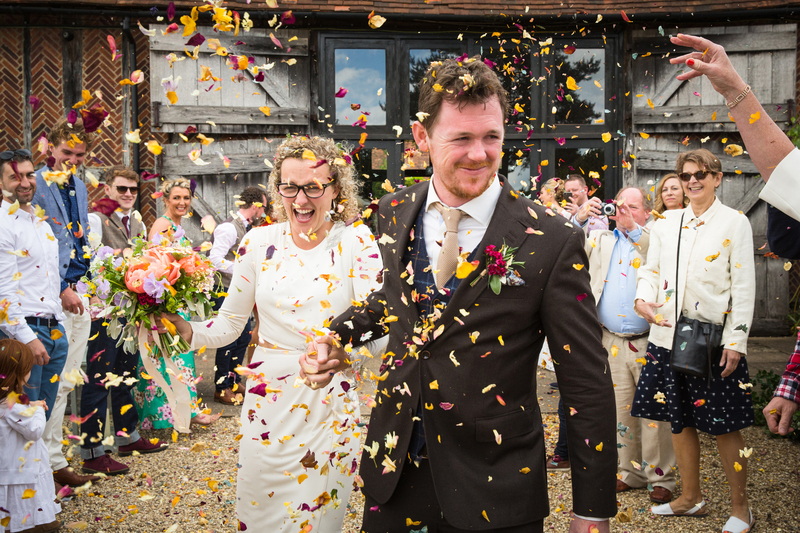 We ended the shoot with a flurry of confetti & it was time for the happy couple to re join their friends & family for the wedding breakfast. 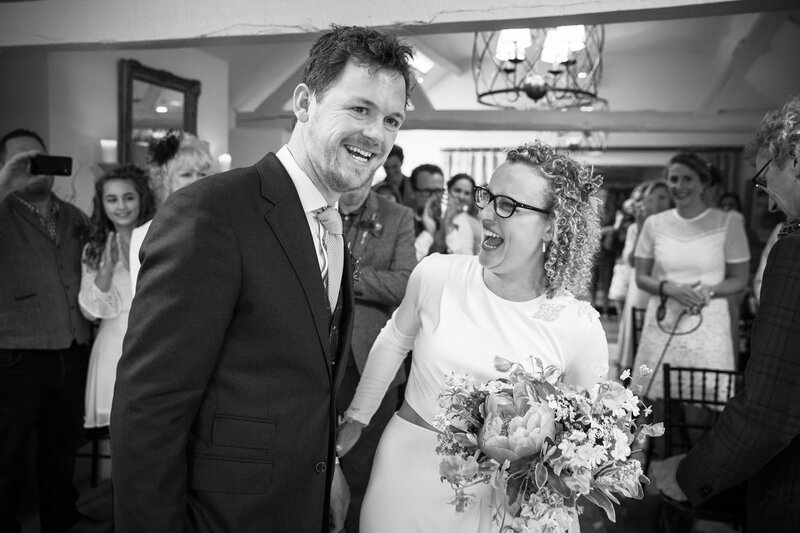 Amy & I photographed the speeches, the tears & the laughter & then it was time to cut the cake. 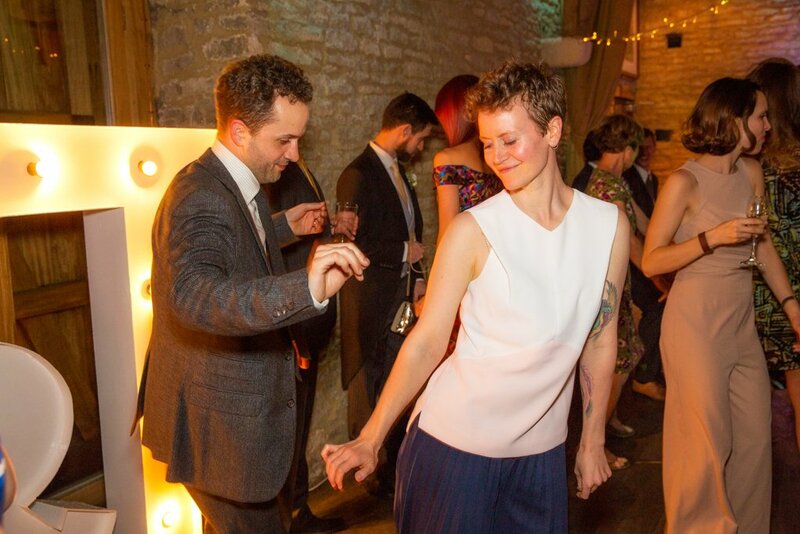 We then made our way home as they prepared to hit the dancefloor. 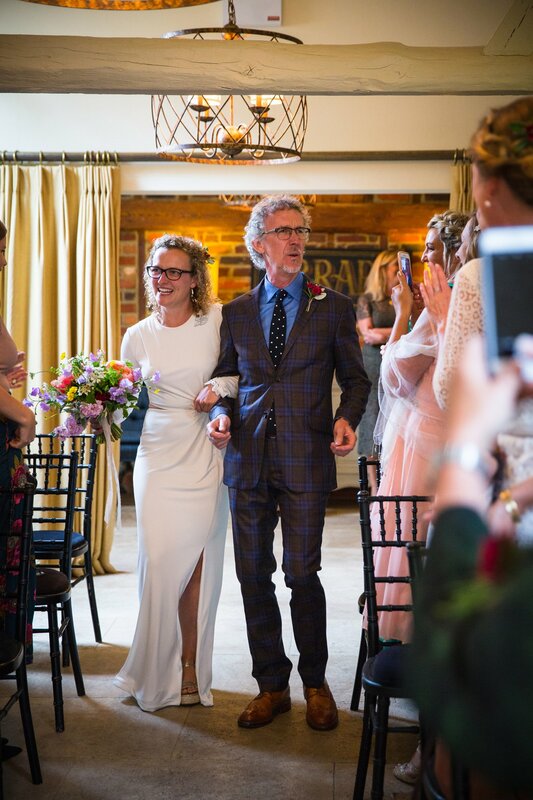 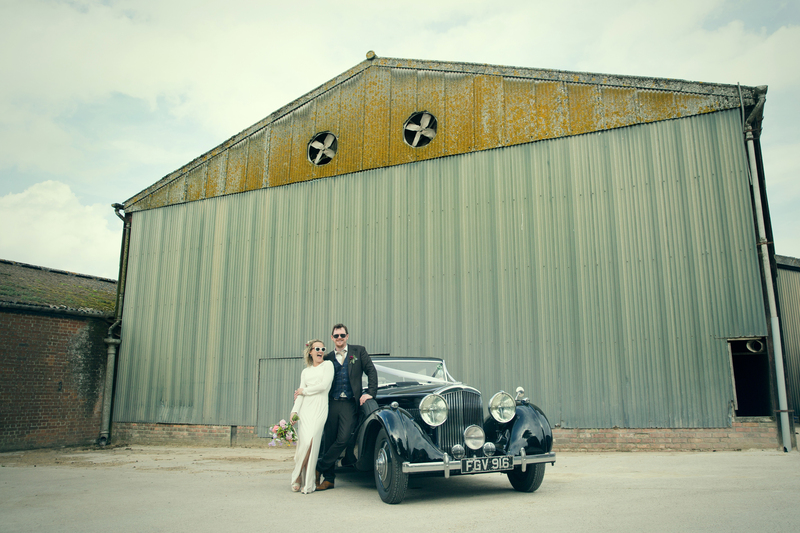 It was a beautiful Spring morning as Amy & I headed to The Tythe Barn for Katie & Tom’s wedding. 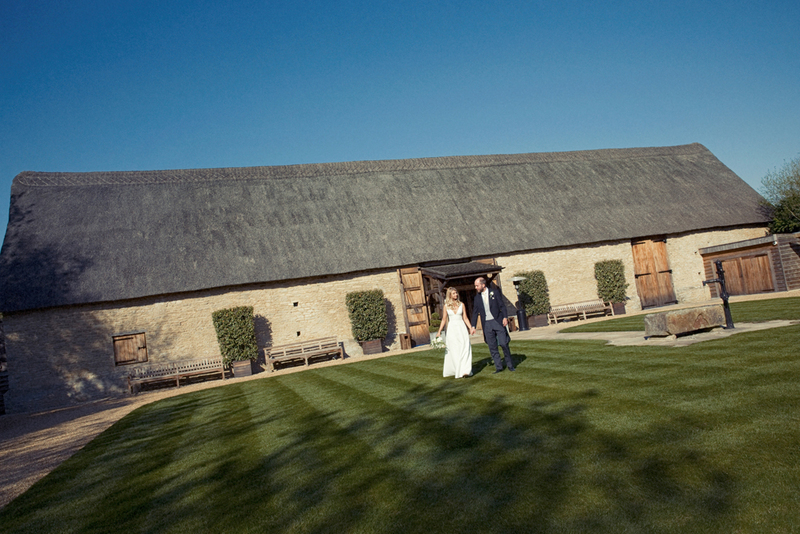 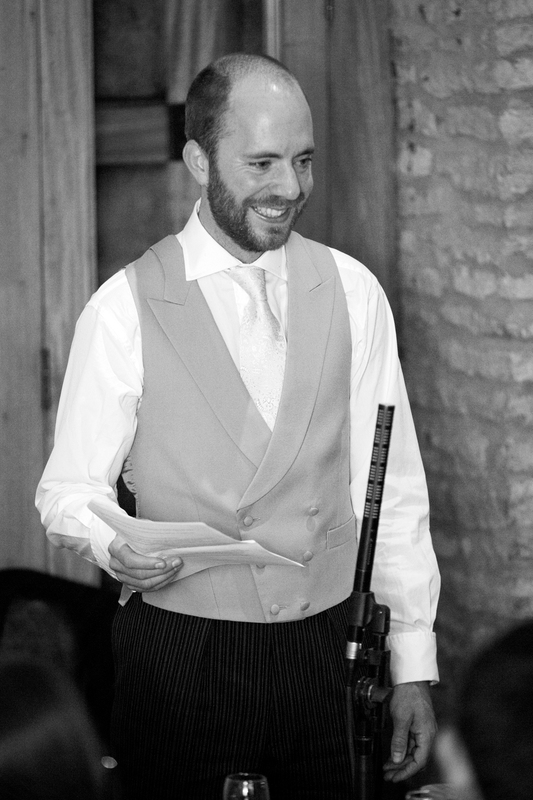 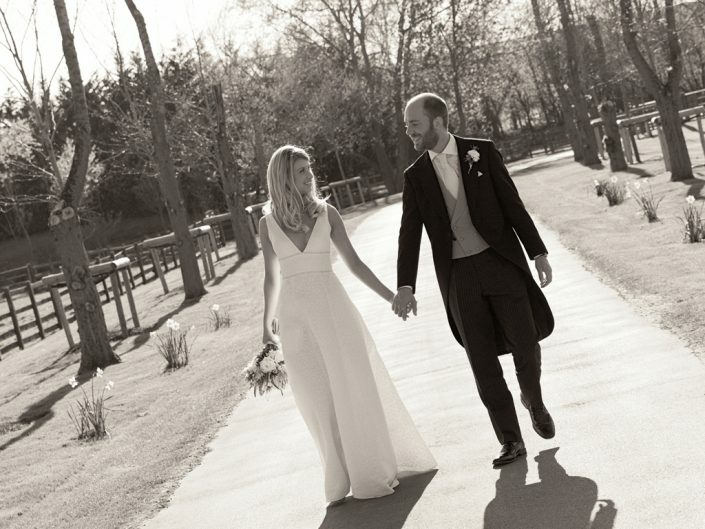 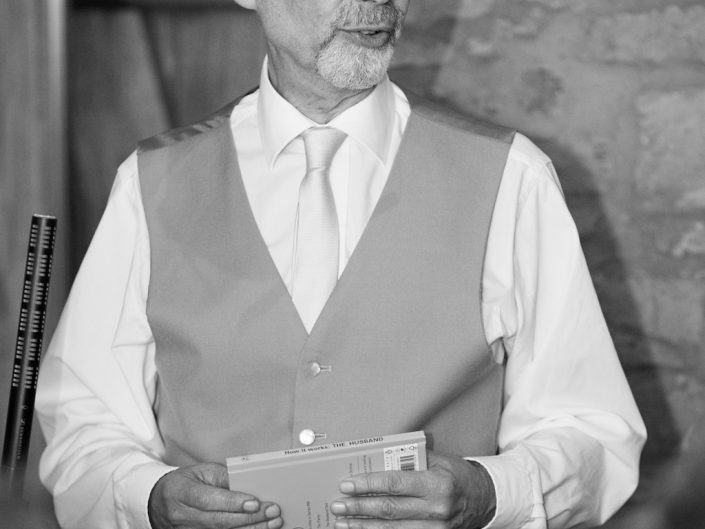 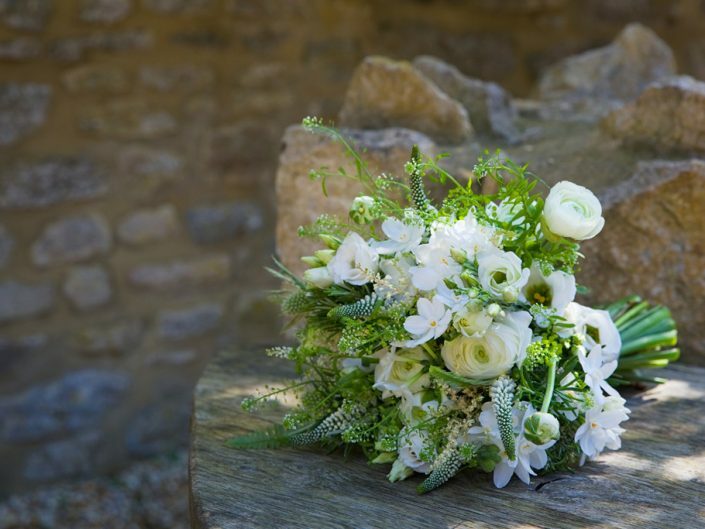 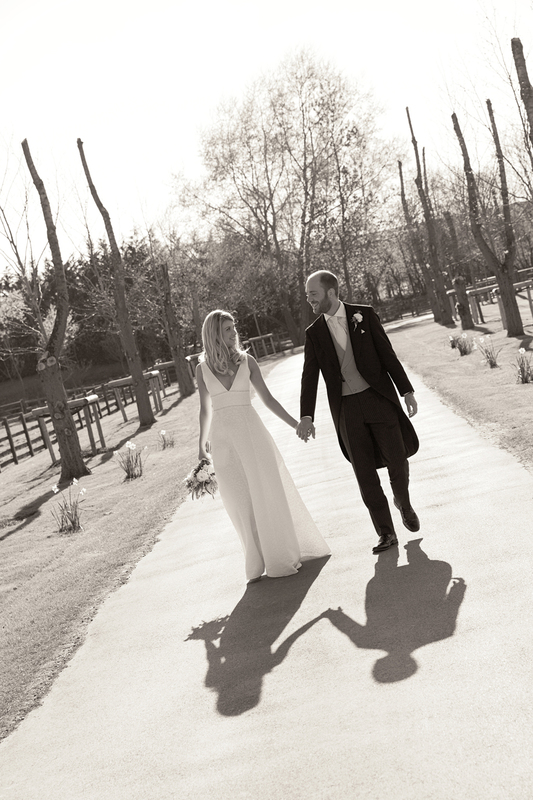 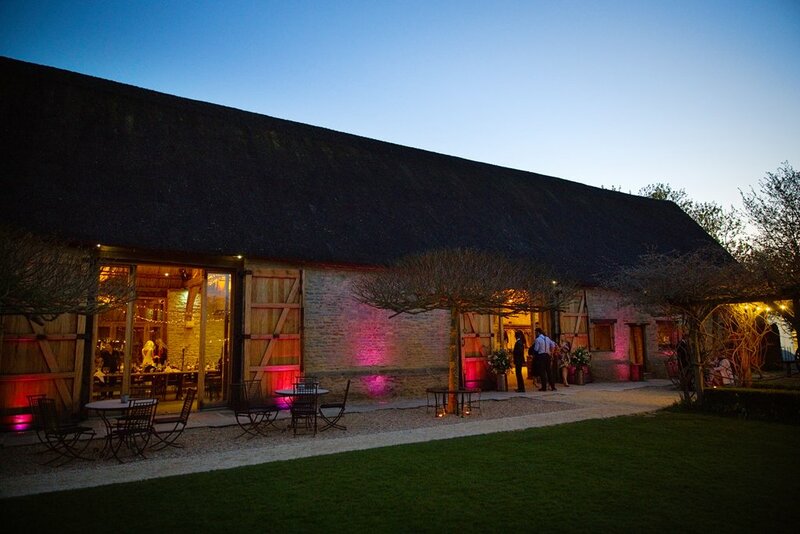 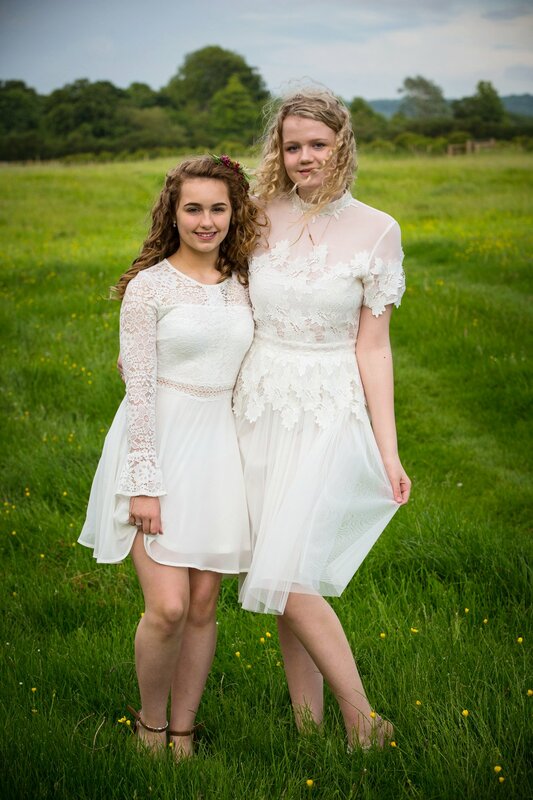 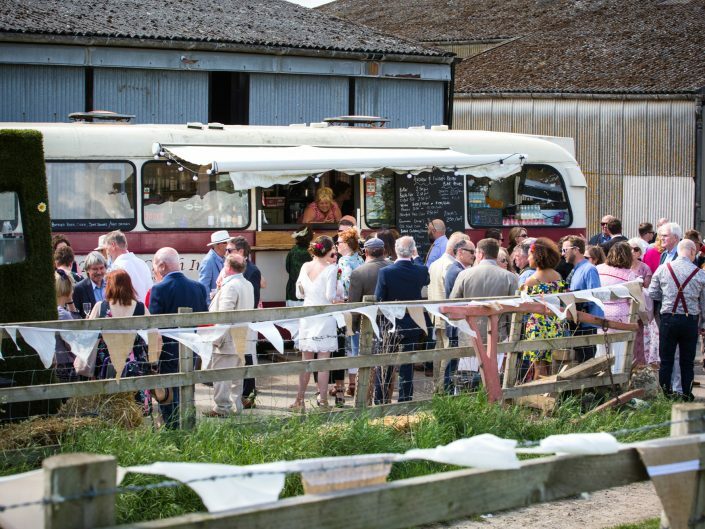 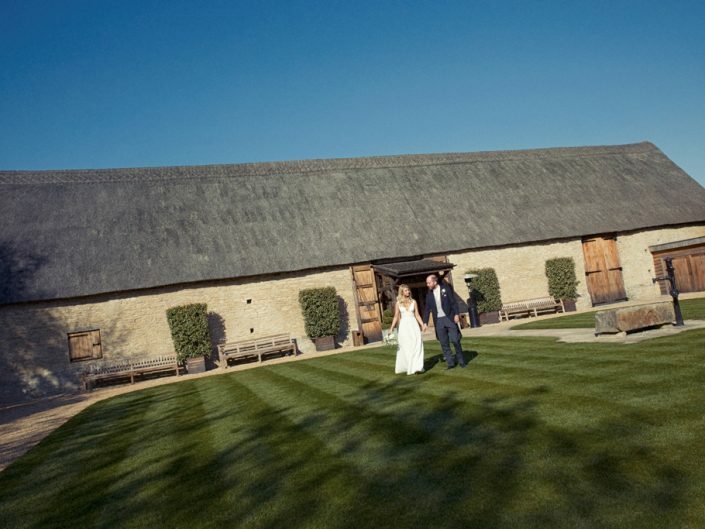 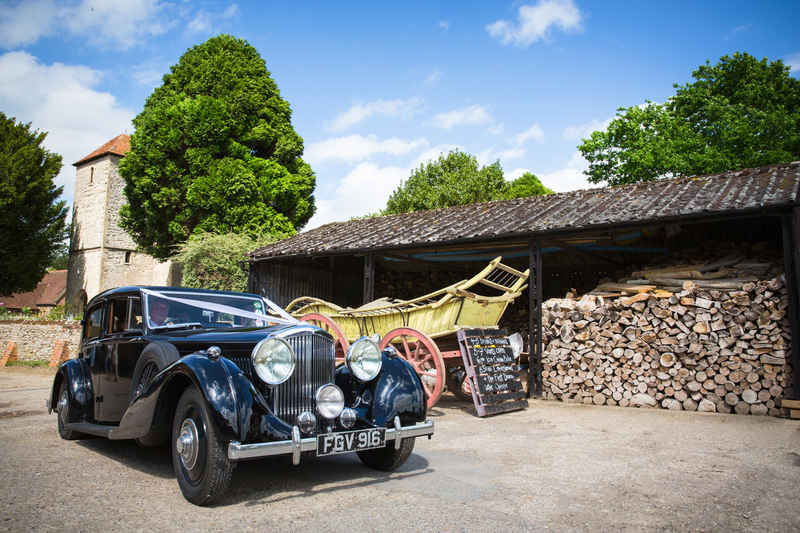 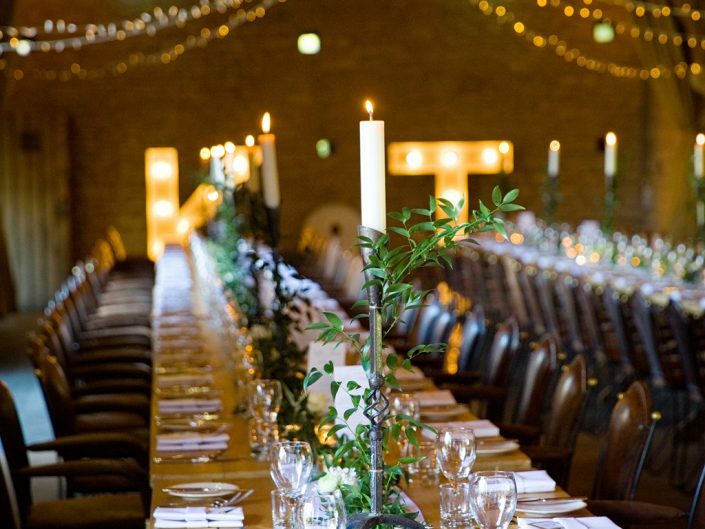 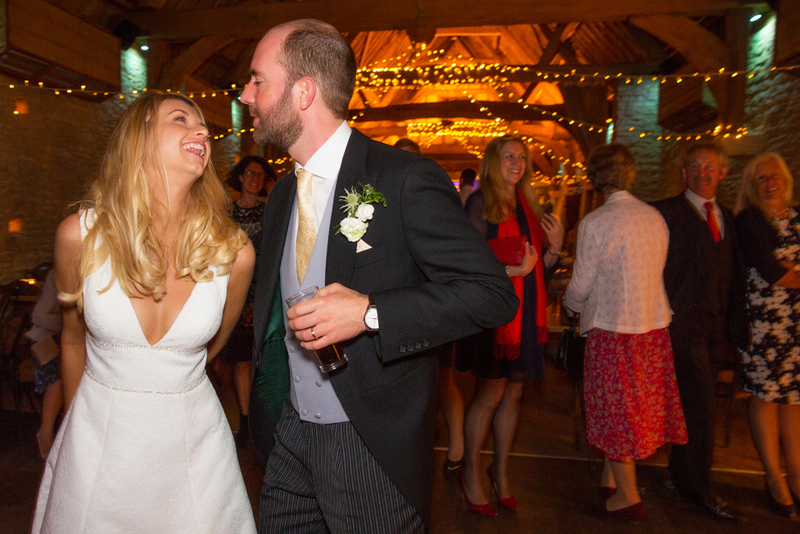 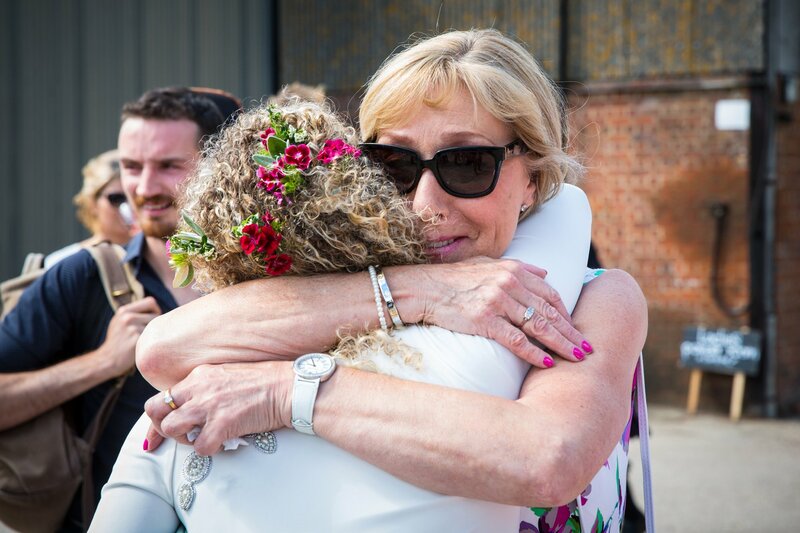 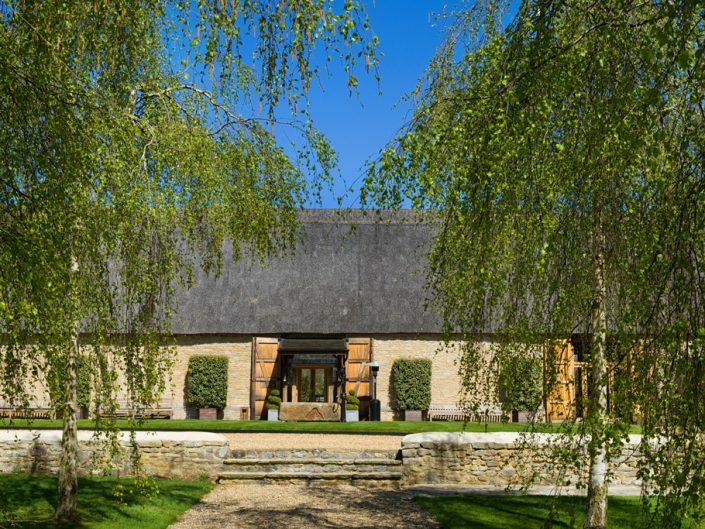 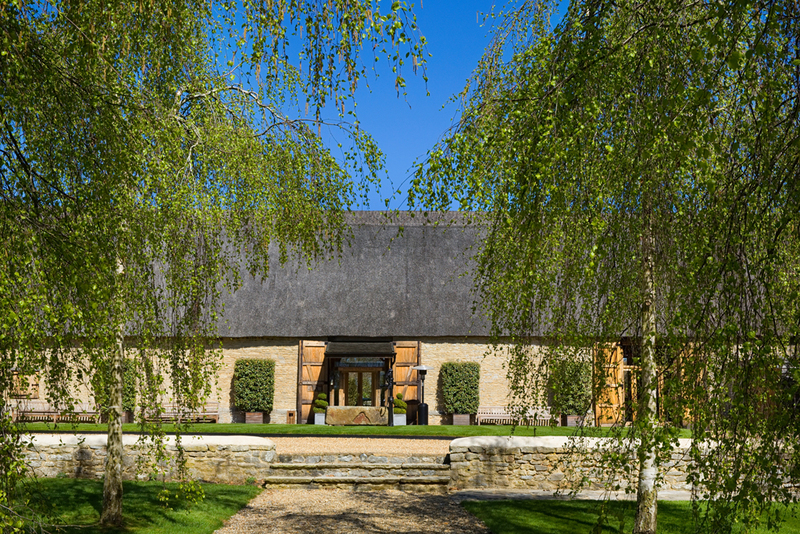 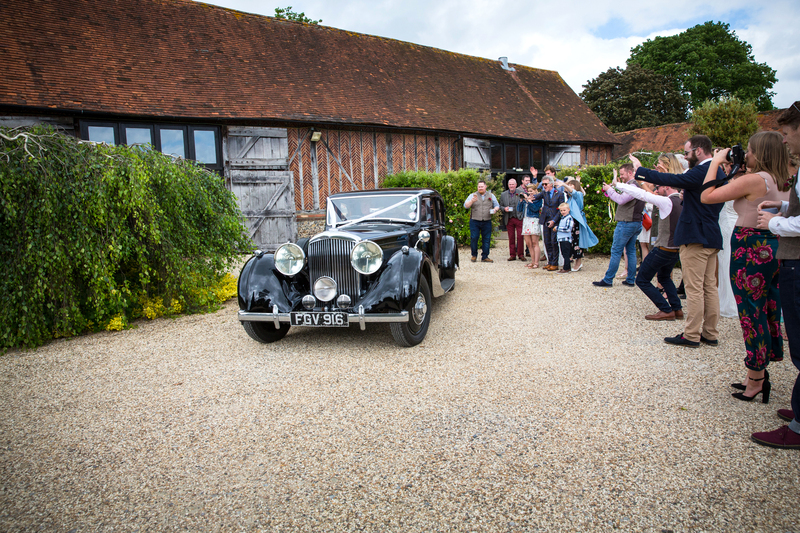 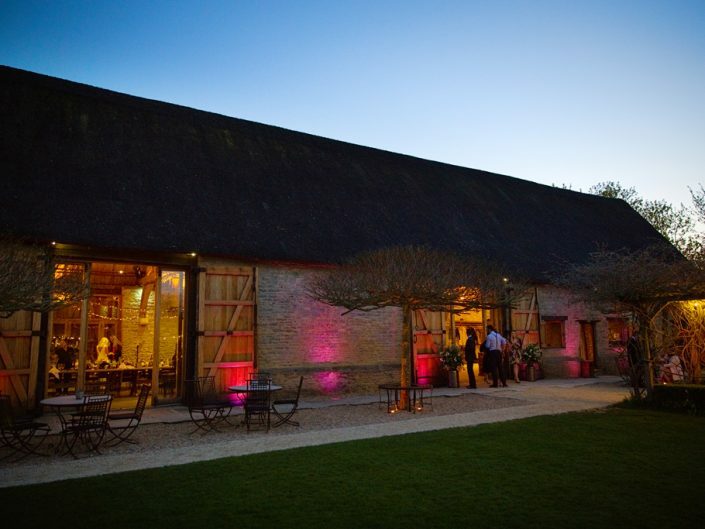 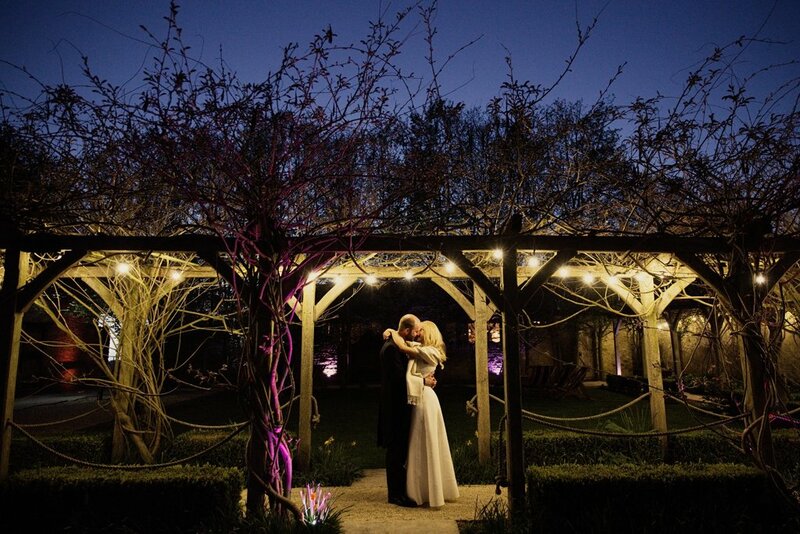 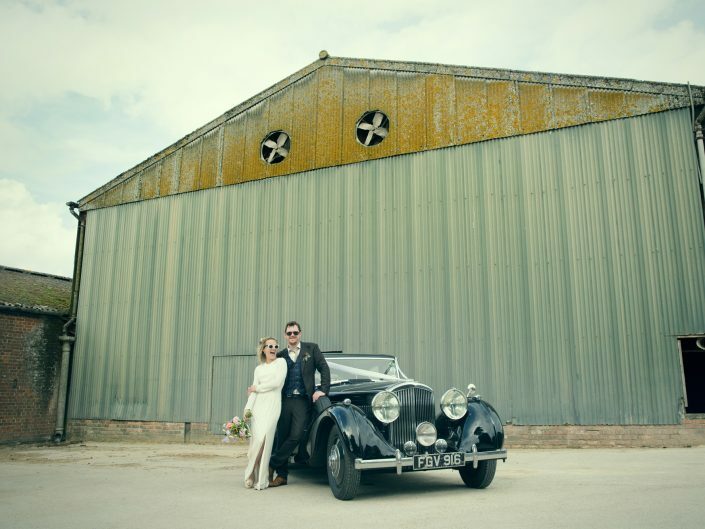 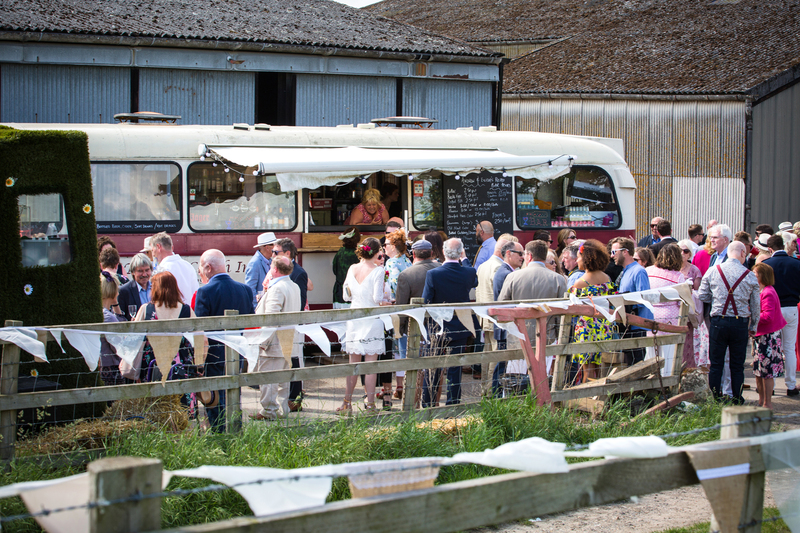 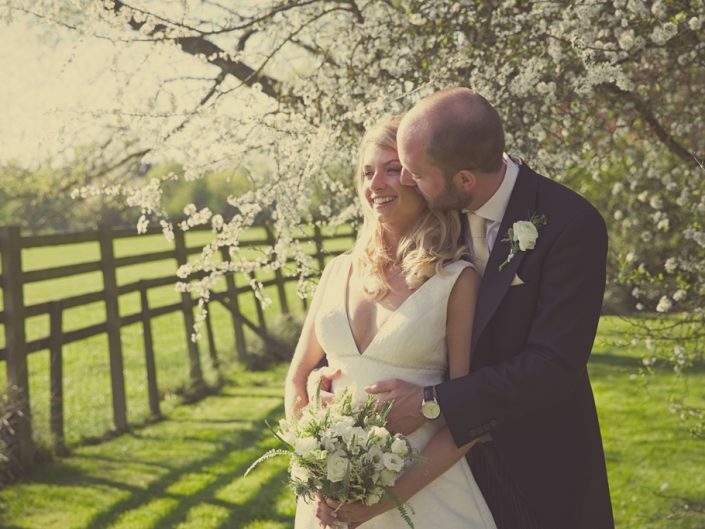 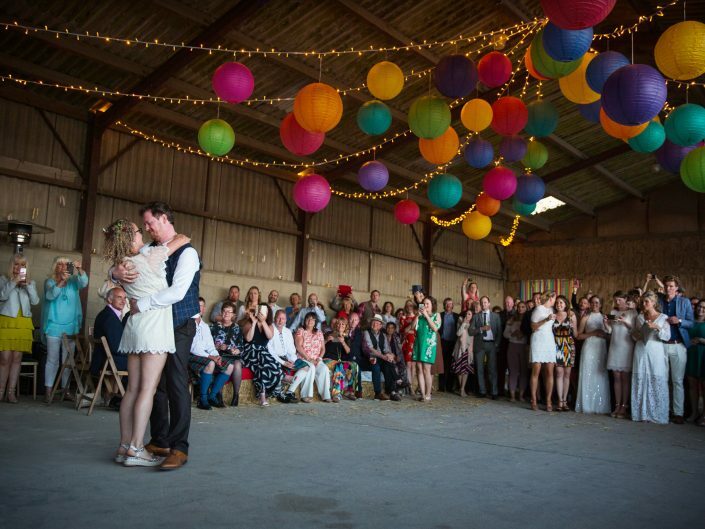 The Tythe Barn is a beautiful venue whatever the weather but looked wonderful in the sunshine as we arrived. 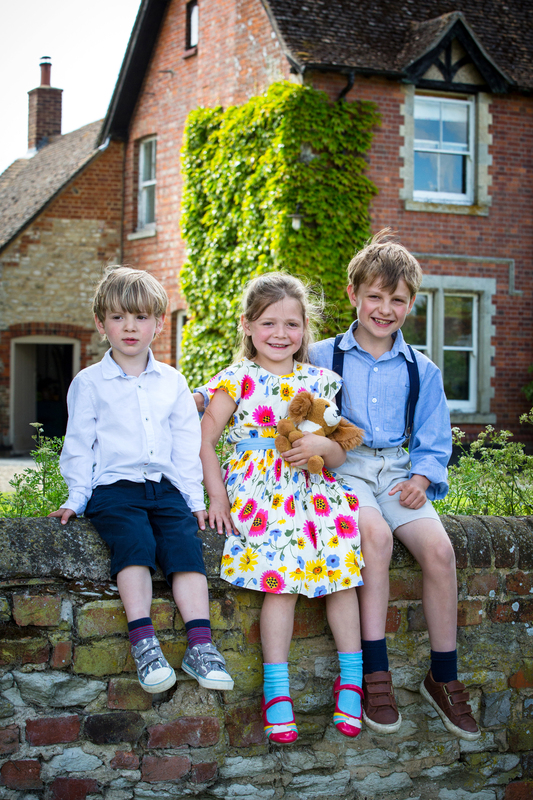 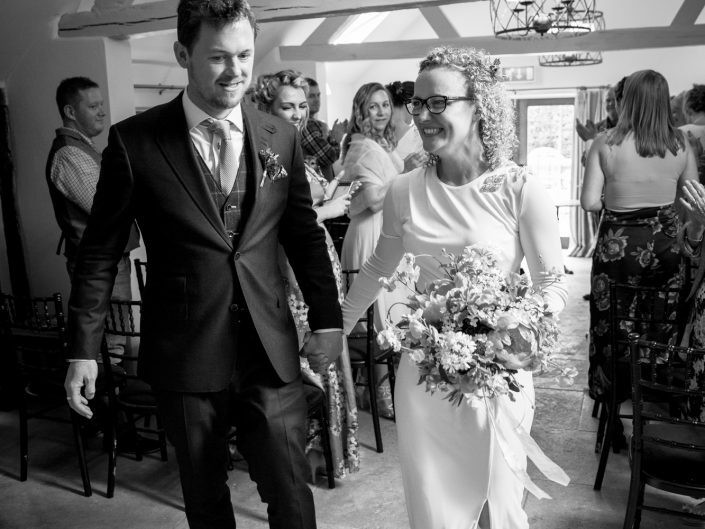 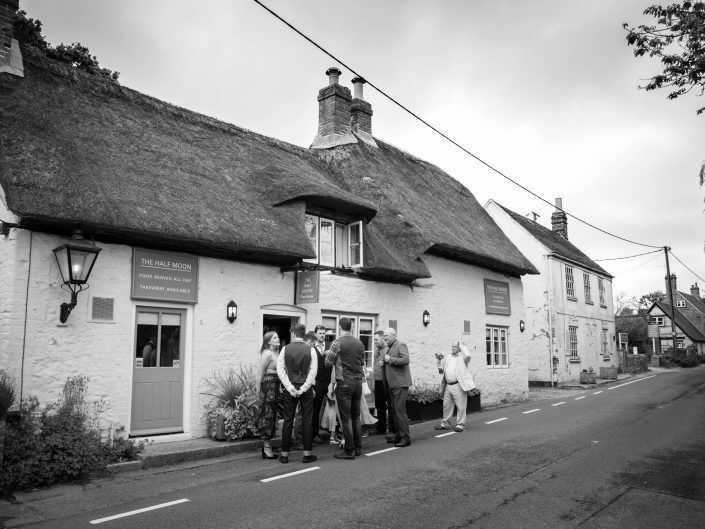 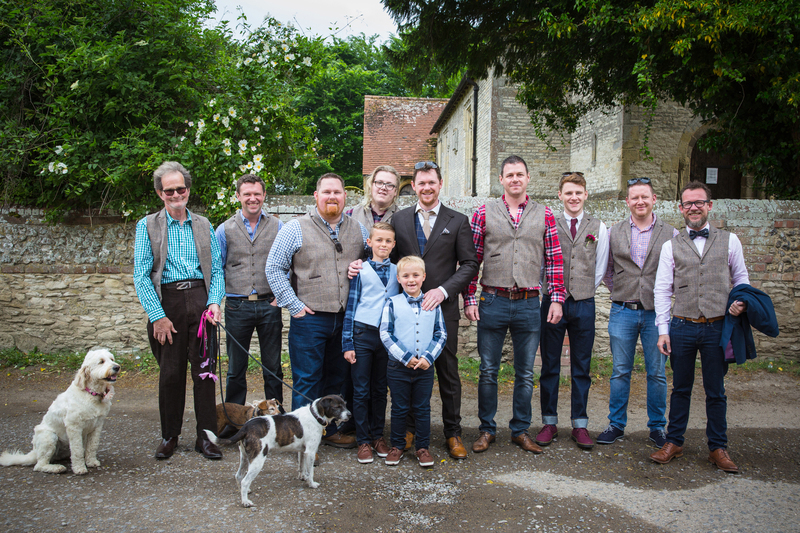 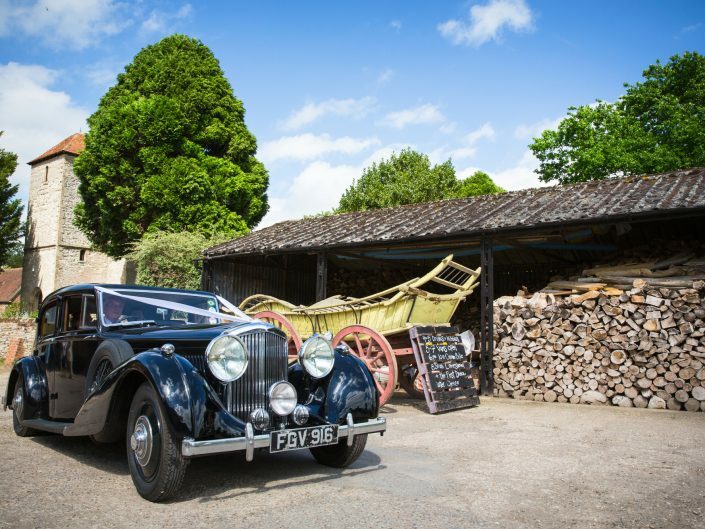 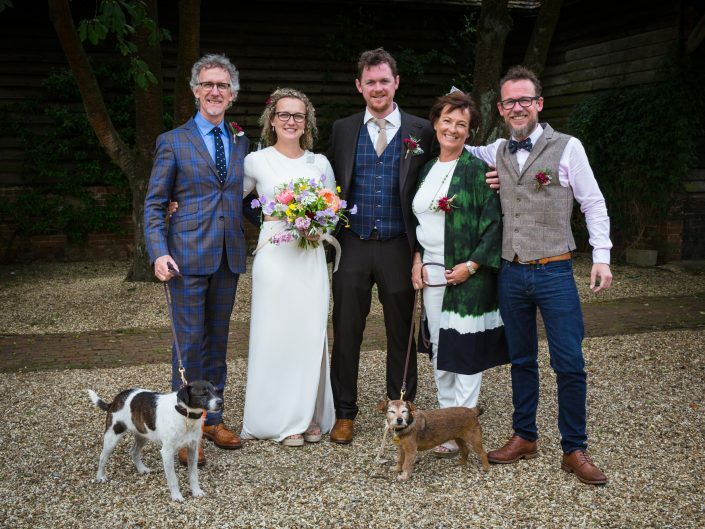 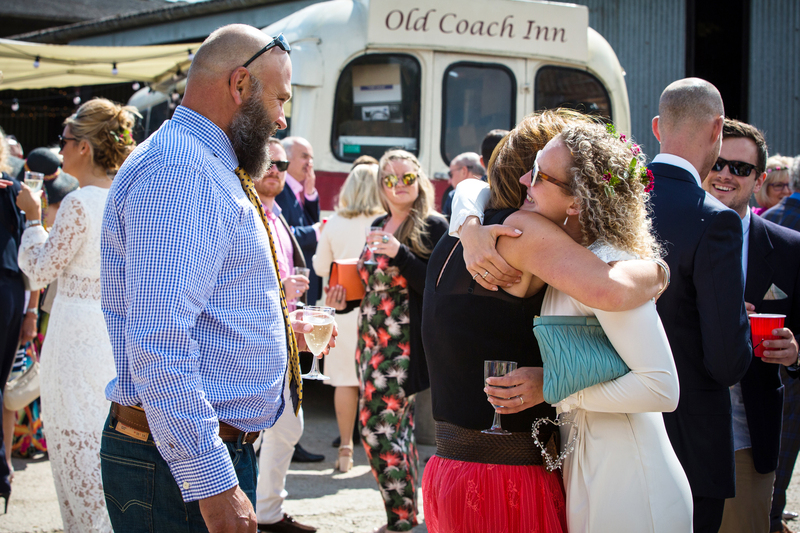 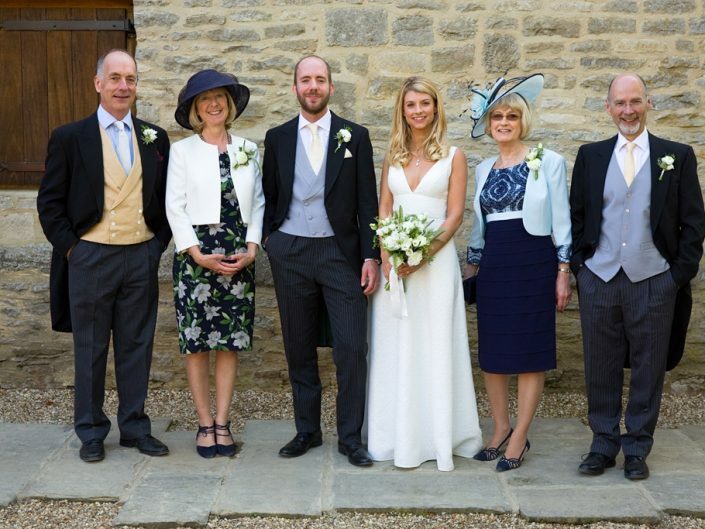 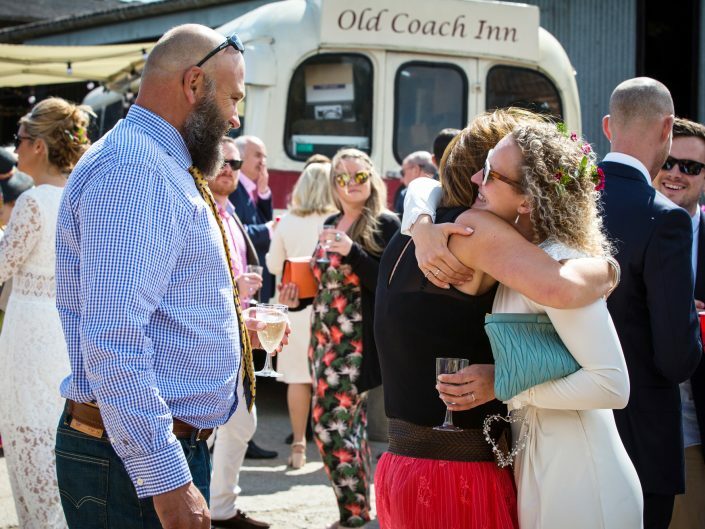 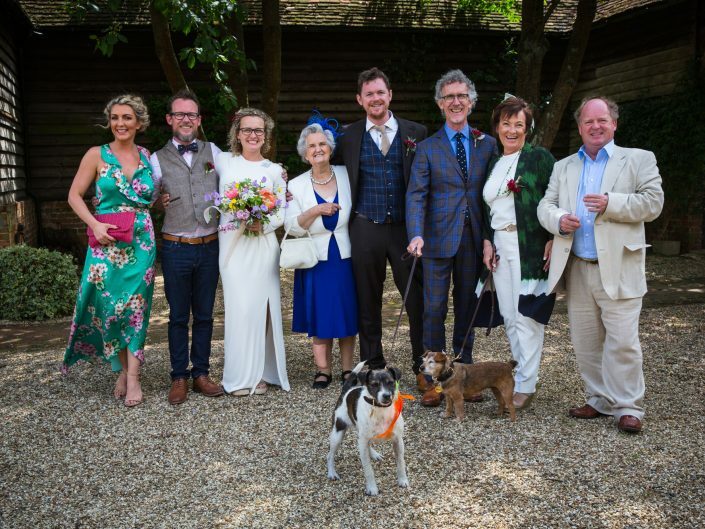 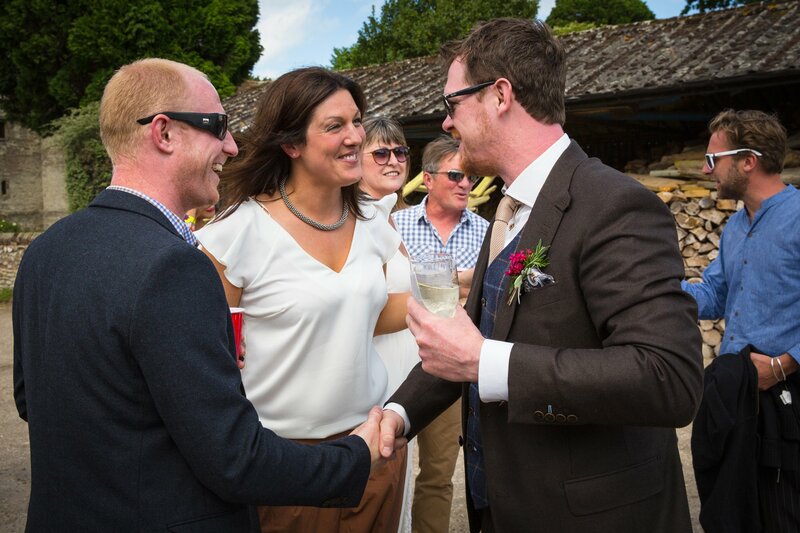 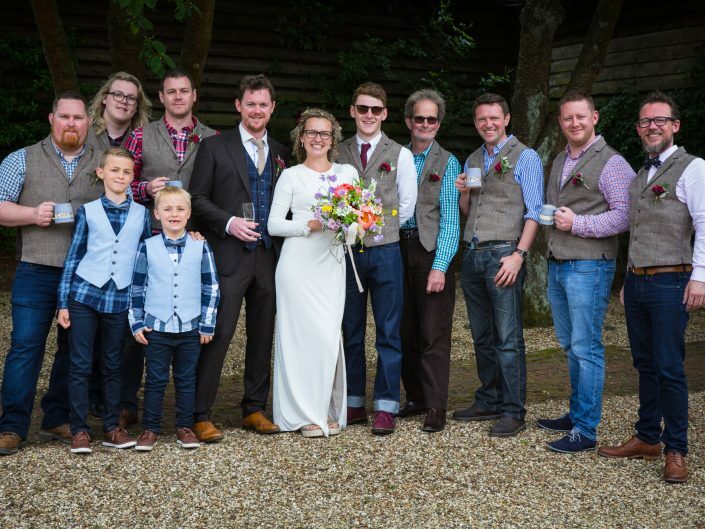 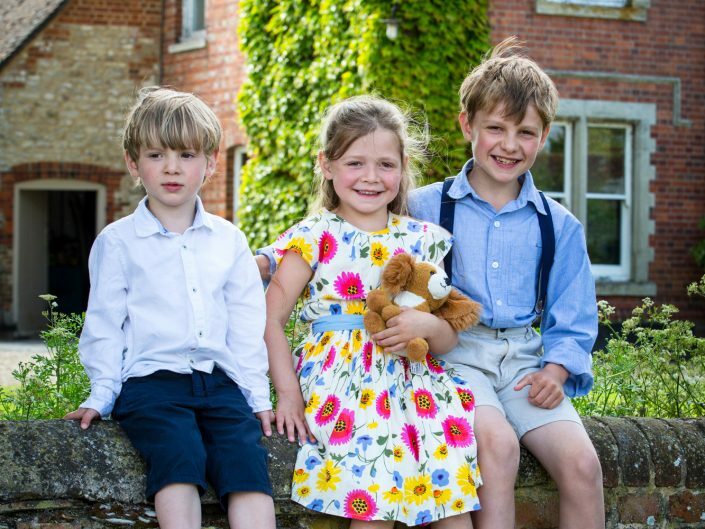 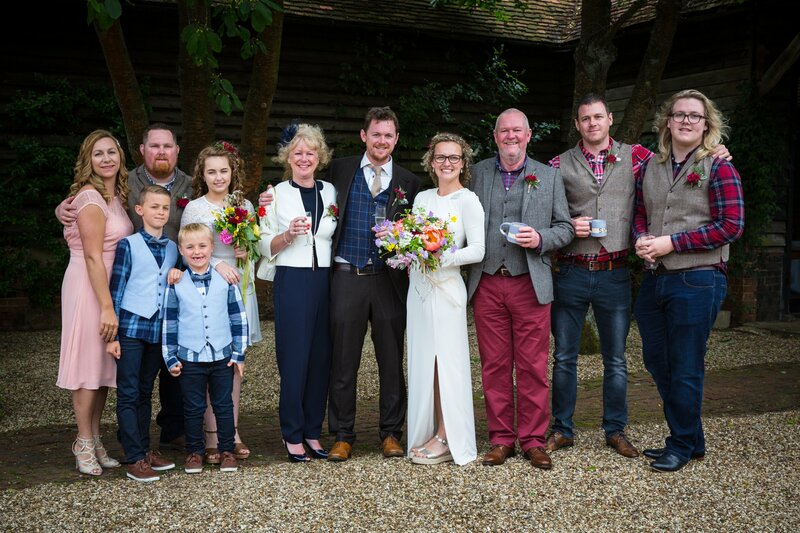 Amy started the day with Tom, the boys & Tom’s family at The Bull in nearby Launton village before making their way to the barn in readiness to greet the guests. 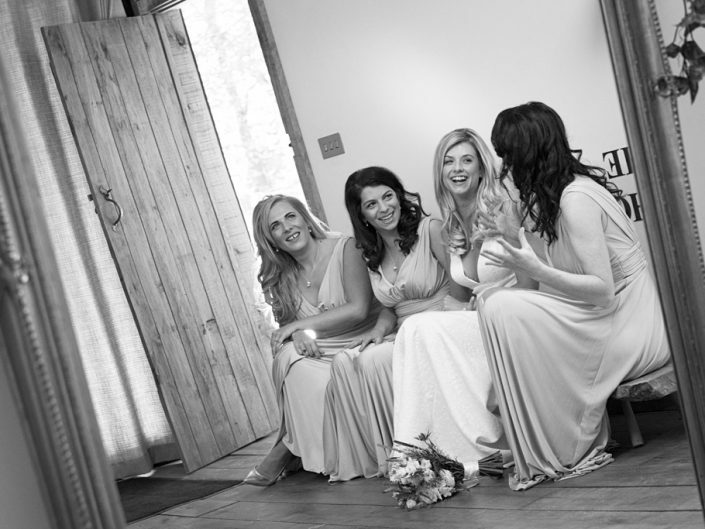 Meanwhile I was at The Nook where Katie, her family & bridesmaids were getting ready. 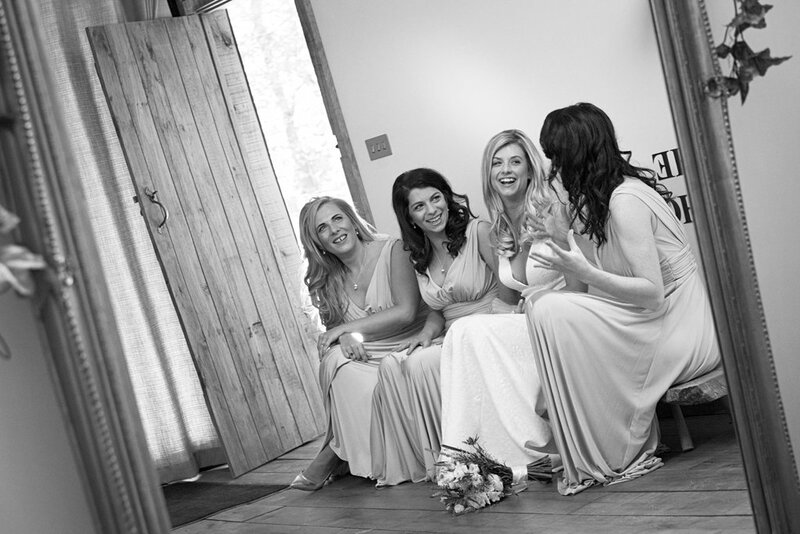 The Nook is a wonderful secluded spot where the bridal party can get ready together in comfort & close proximity to the barn. 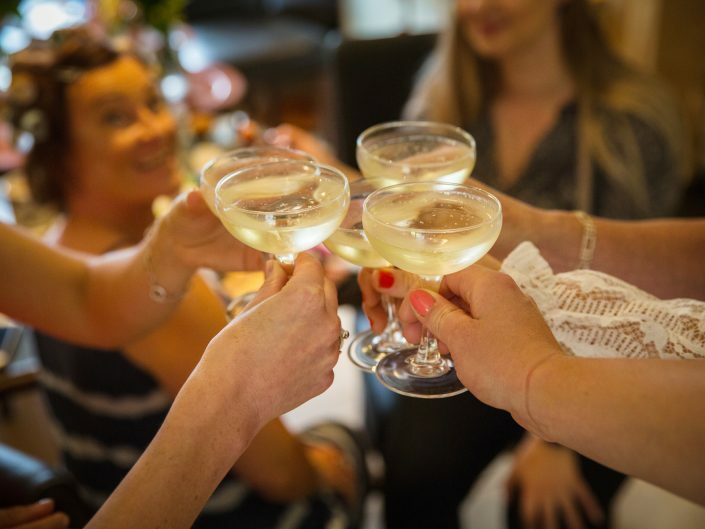 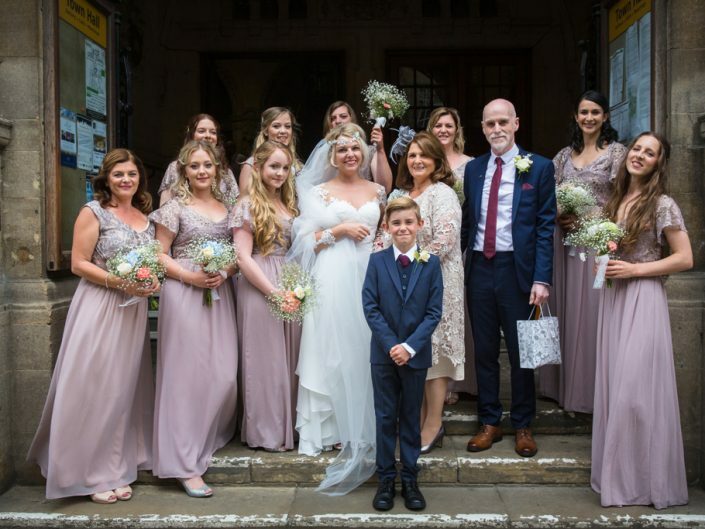 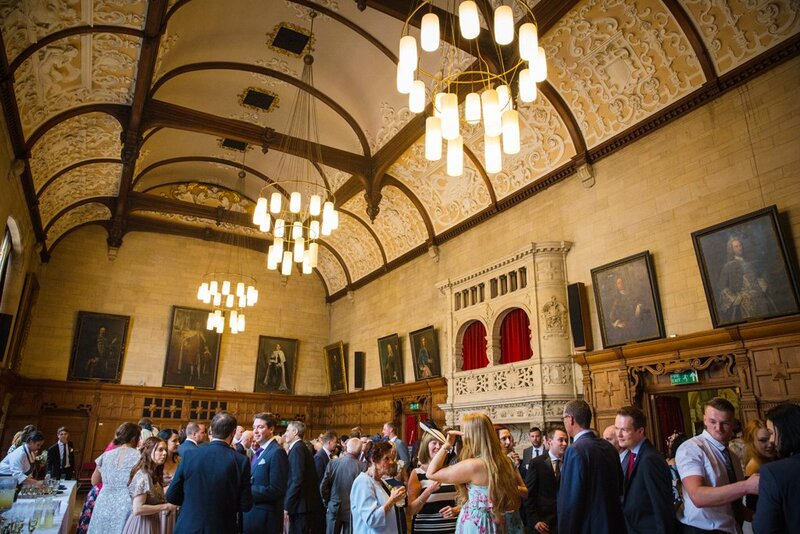 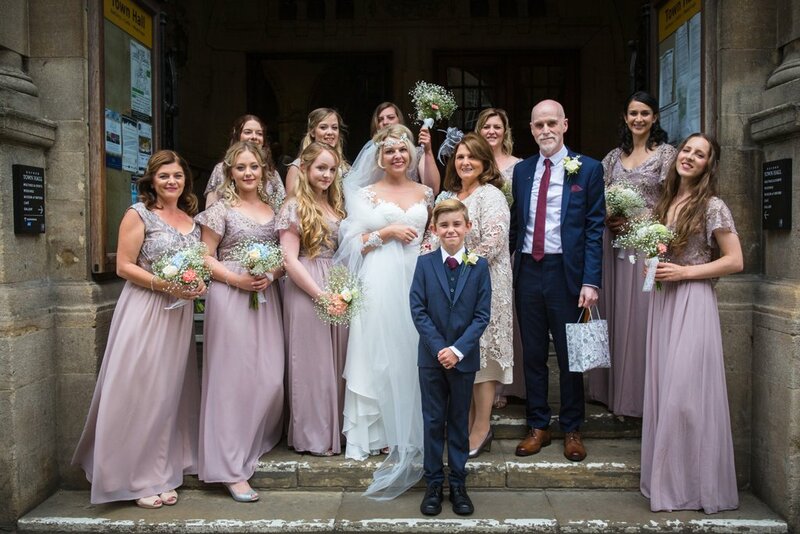 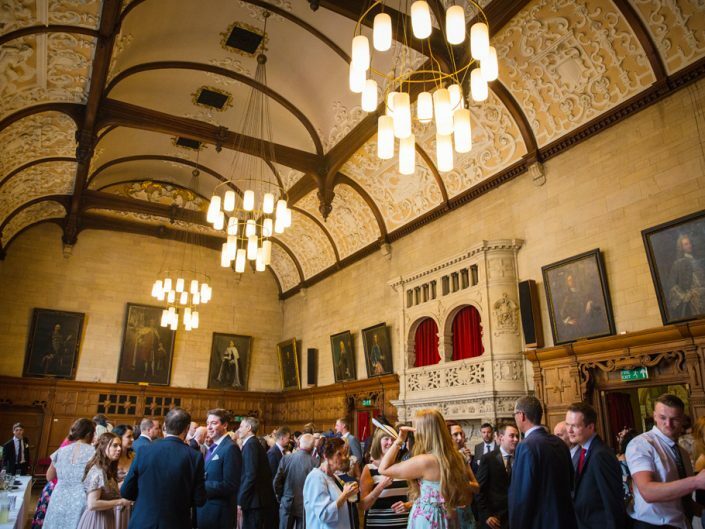 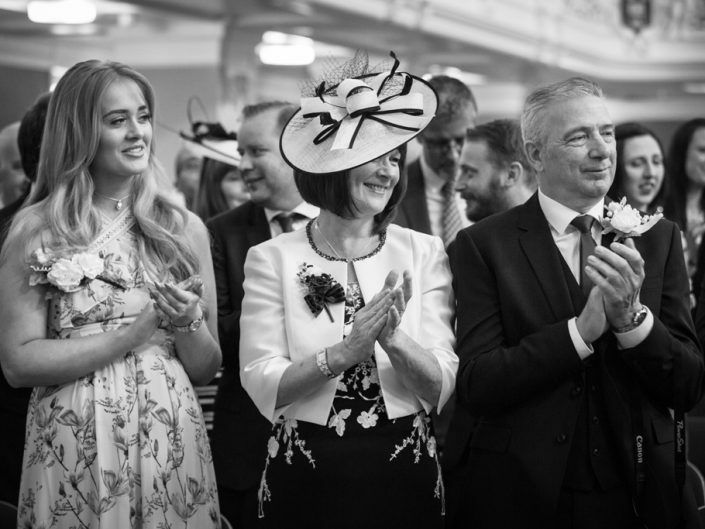 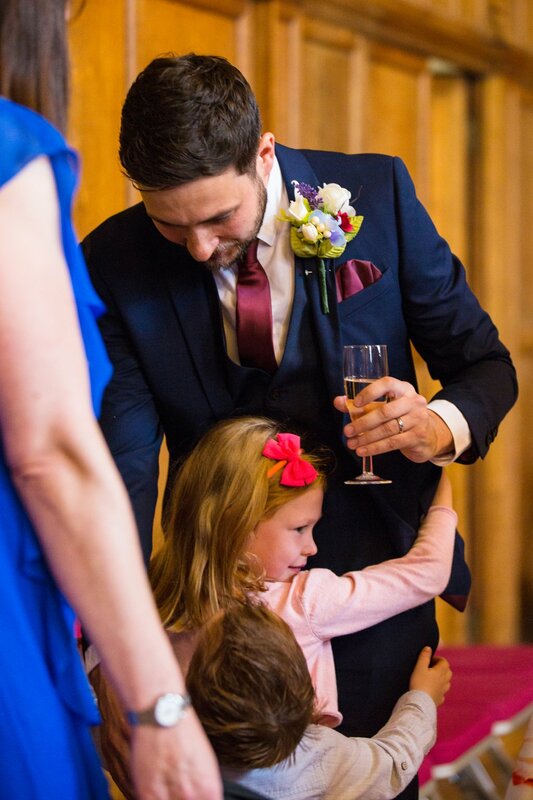 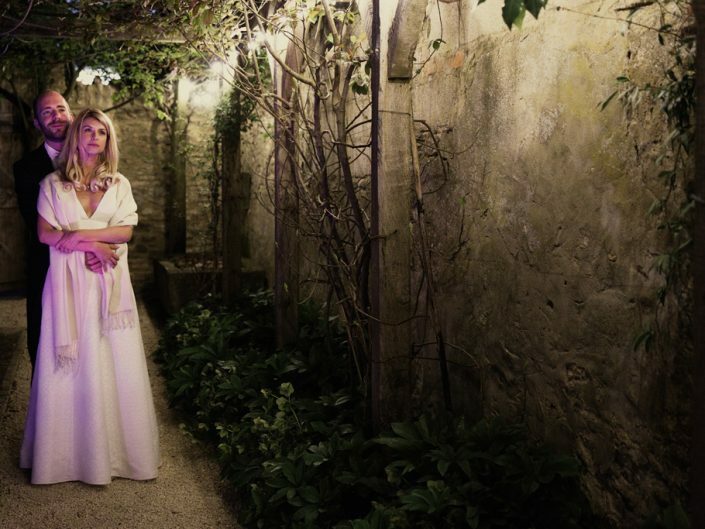 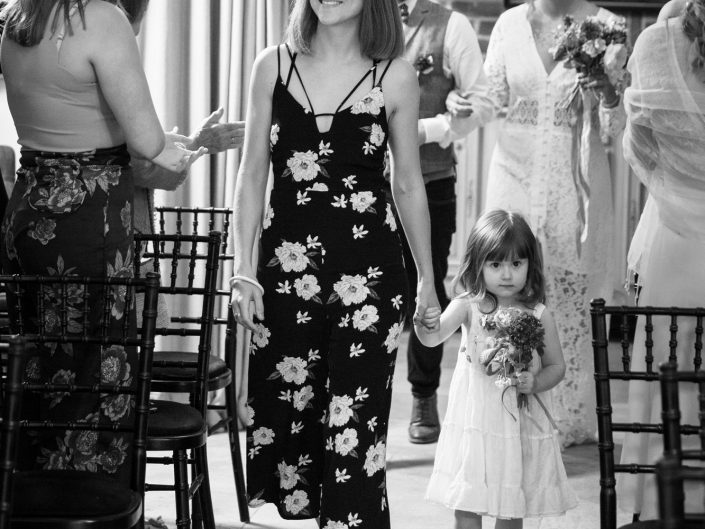 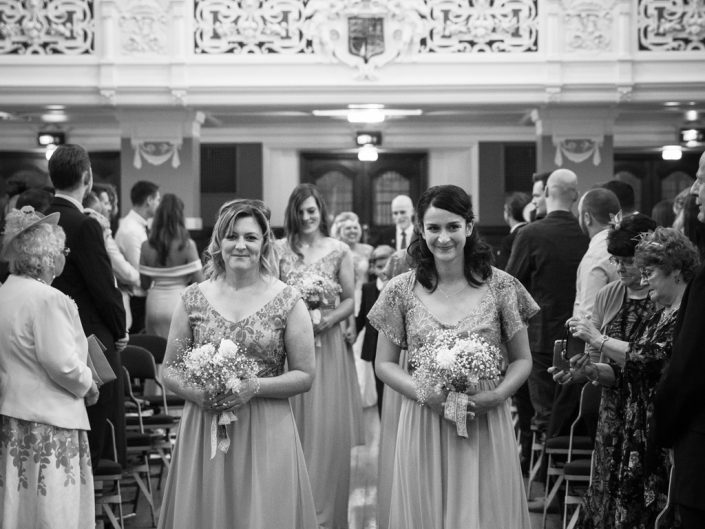 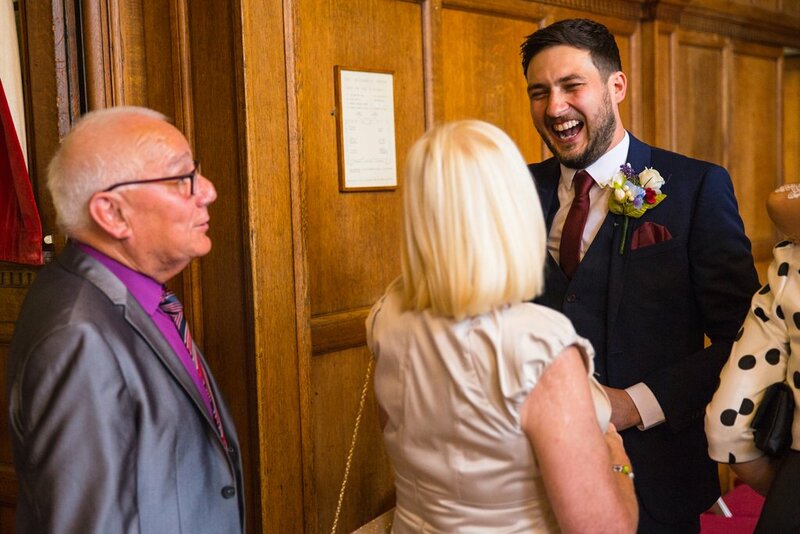 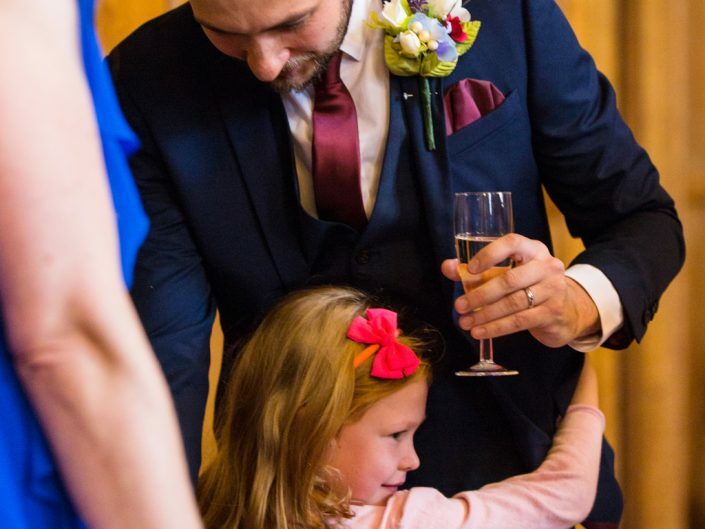 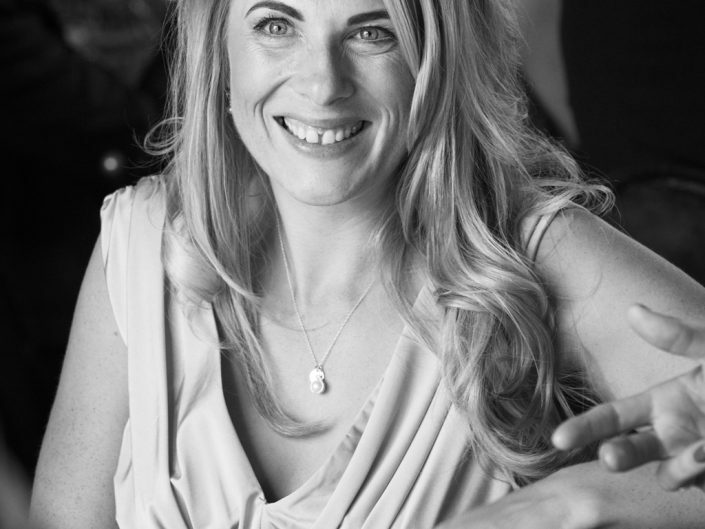 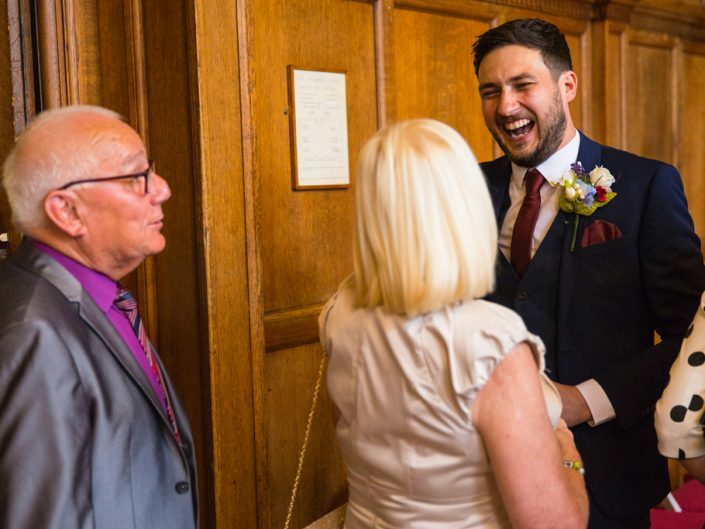 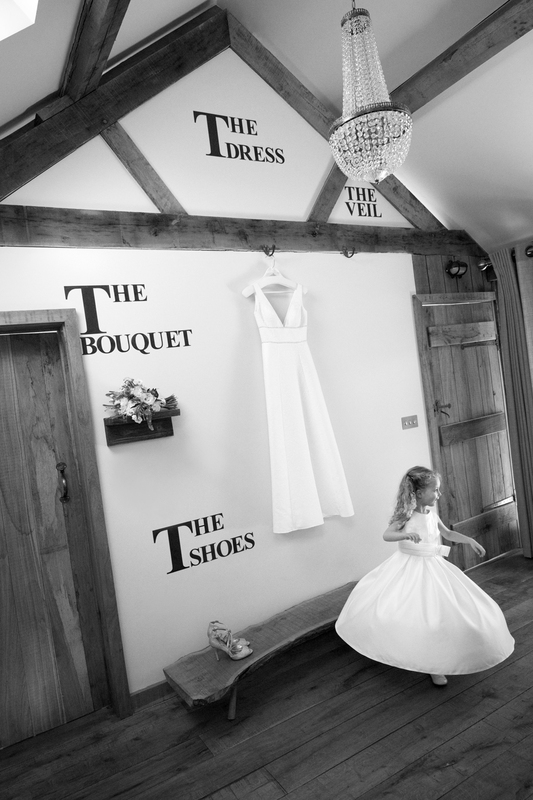 The Nook is divided in to two main rooms – one side caters solely for the bride whilst the other room has been created to offer a large space for the bridesmaids, mother of the bride, flower girl, page boy and so on. 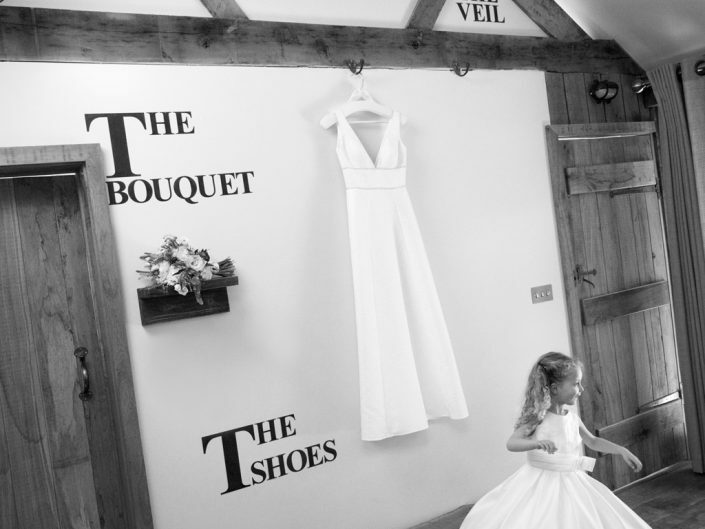 Both rooms have been carefully thought out and the needs of the bride and her attendants have been considered at every stage. 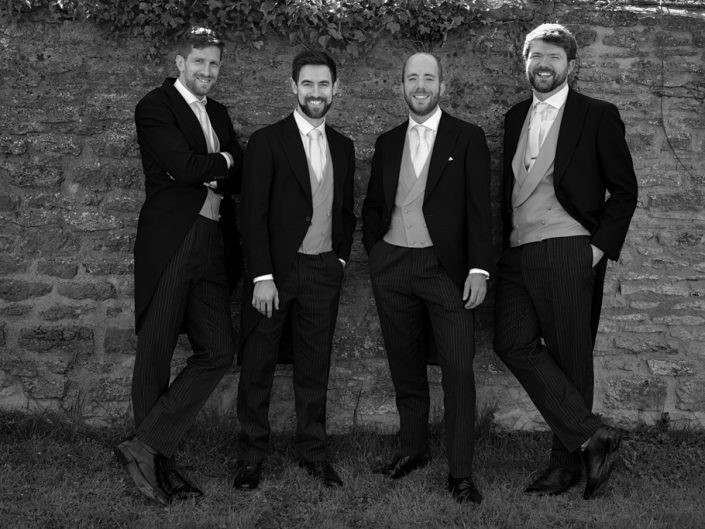 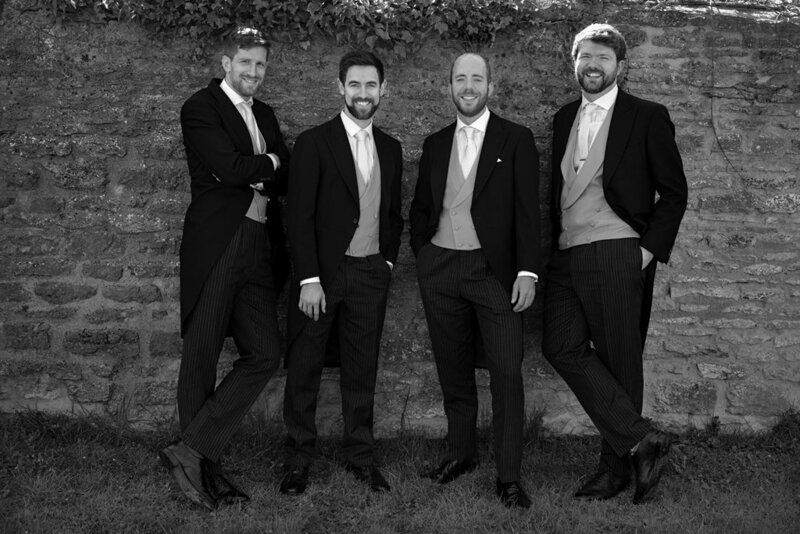 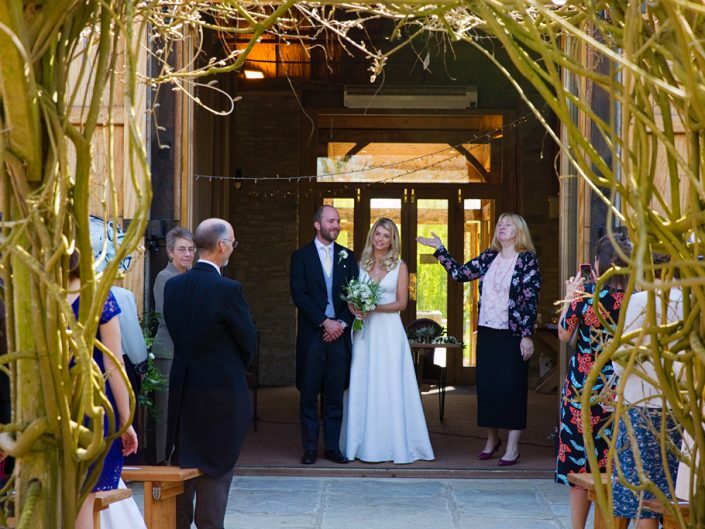 There is a lovely courtyard outside which was a perfect location in the sunshine for some portraits of the bridal party. 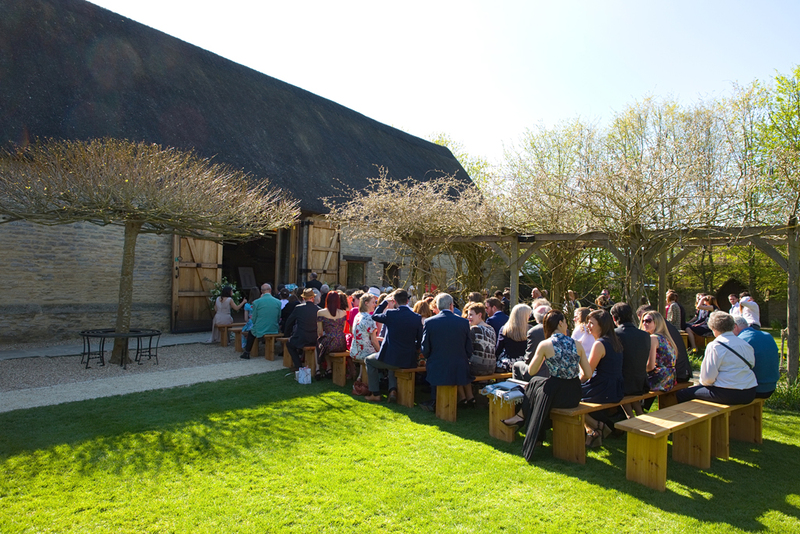 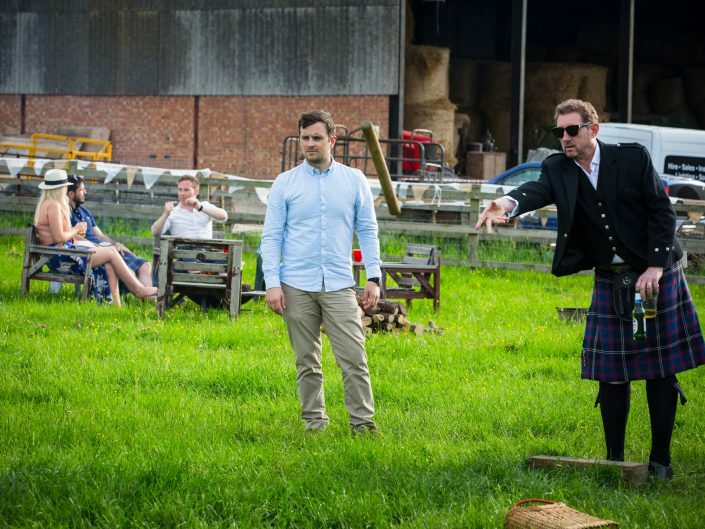 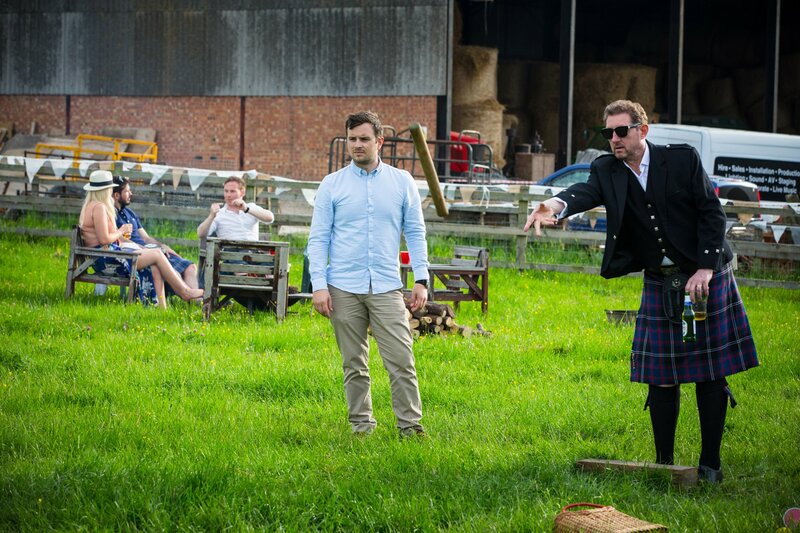 As the weather was so beautiful, sunny & lovely & warm for the time of year the team at the barn set the ceremony up in the garden. 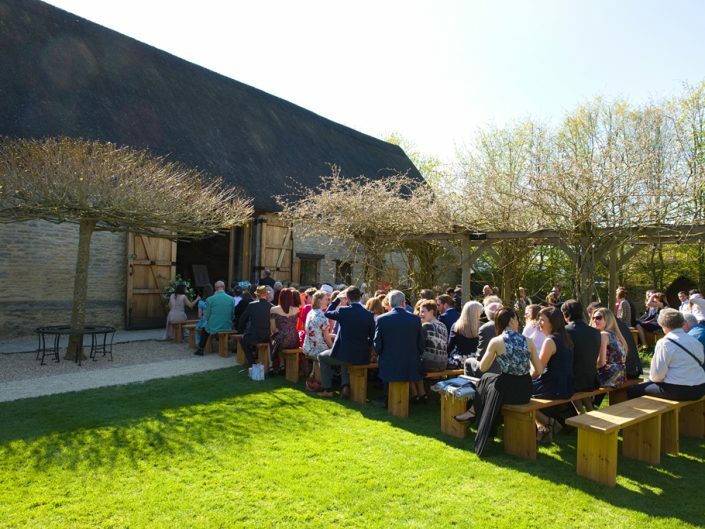 It’s such a wonderful outside space for the ceremony with the bride walking under the arbor, which will be covered with wisteria in a few weeks before standing with her groom in front of the large barn doors. 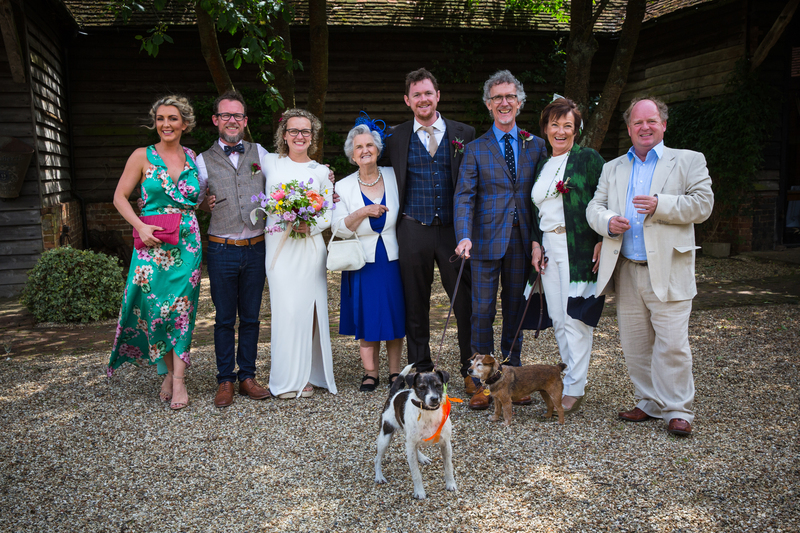 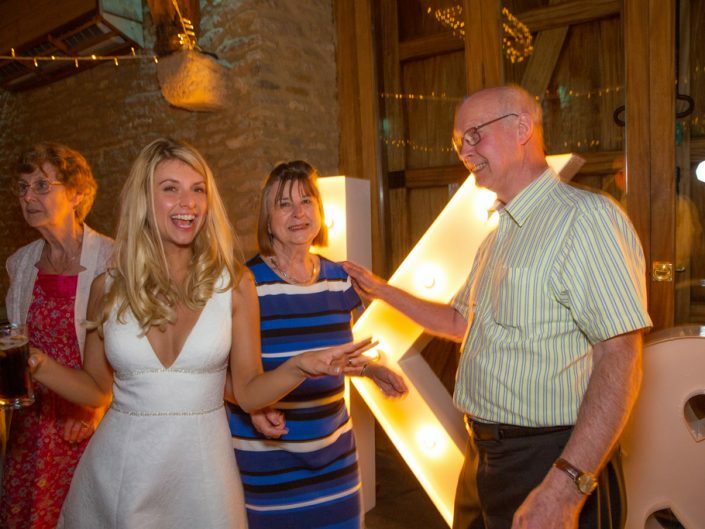 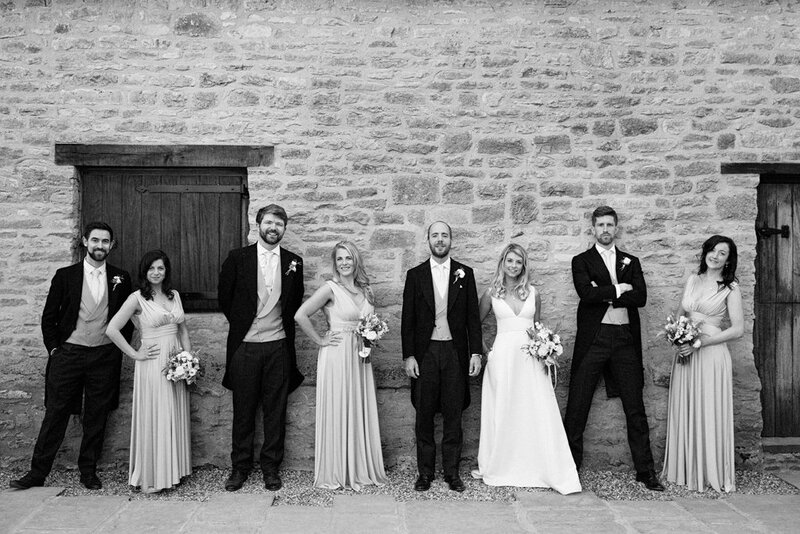 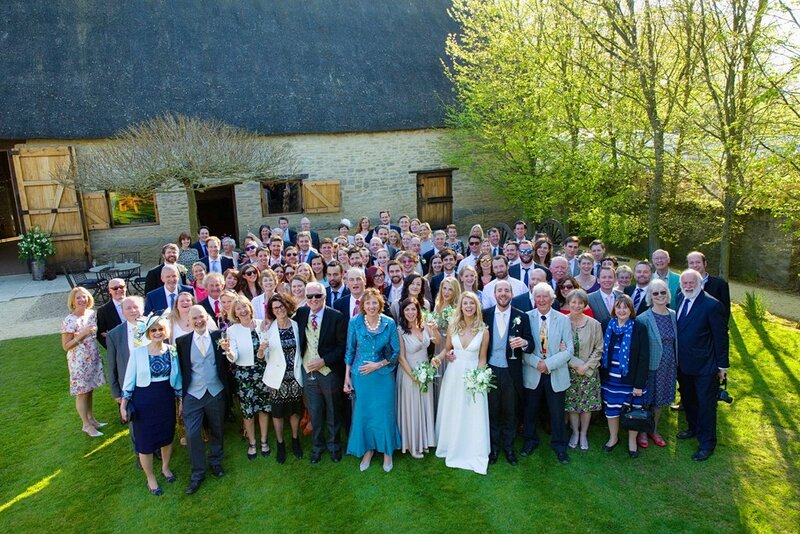 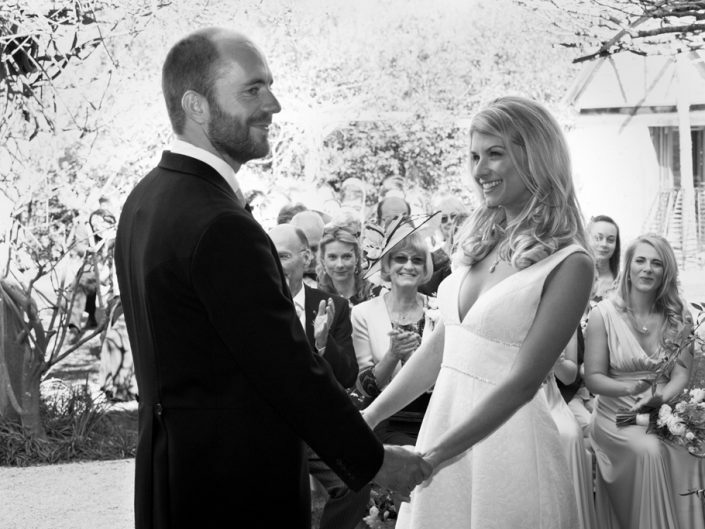 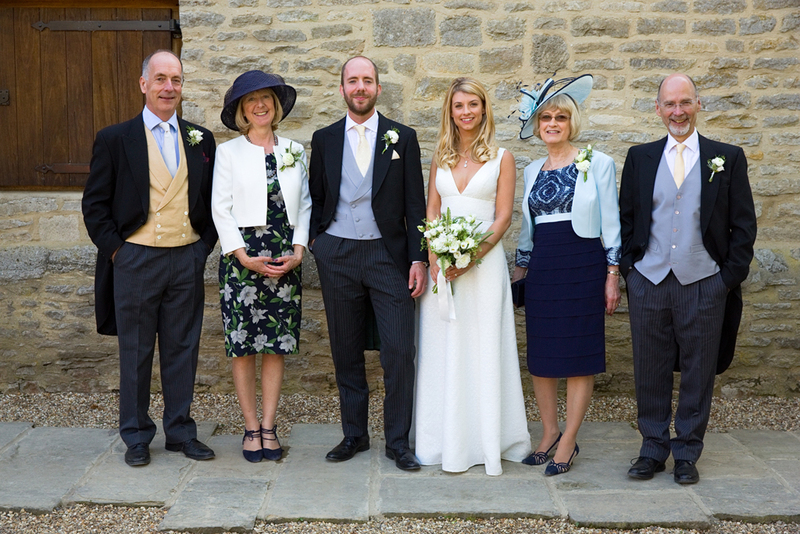 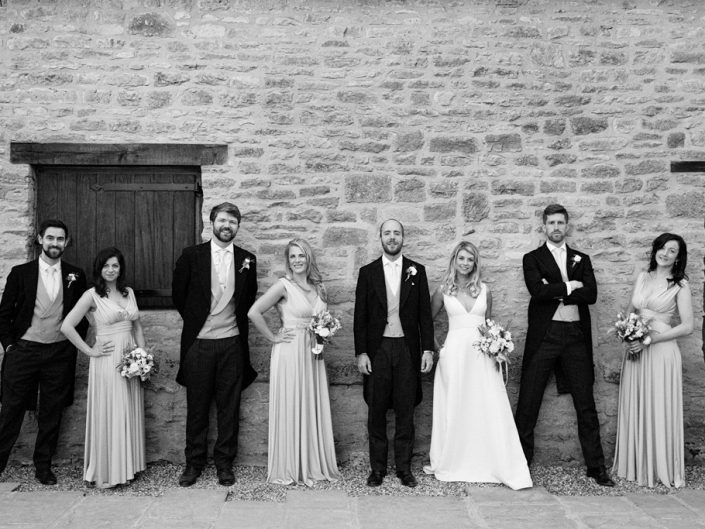 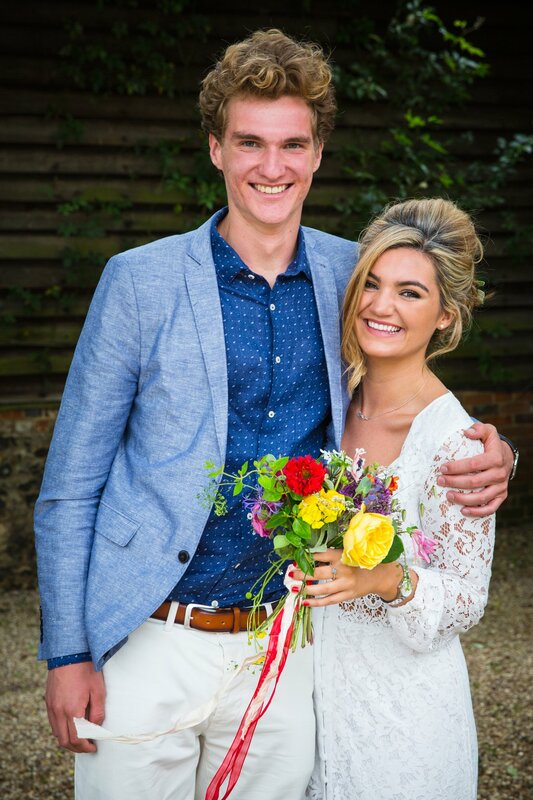 After the service Katie & Tom mingled with their guests in the garden before we gathered everyone together for the group photos with the golden Cotswold stone as a backdrop. 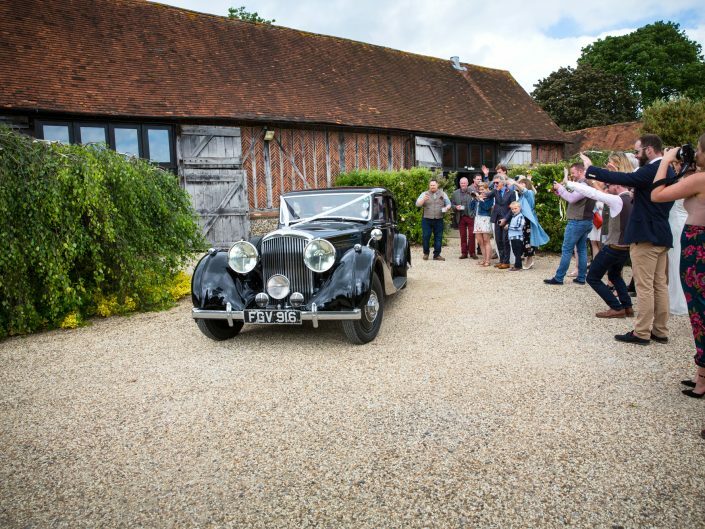 We then took the opportunity to steal the happy couple away to do some shots of the two of them in the grounds of the barn. 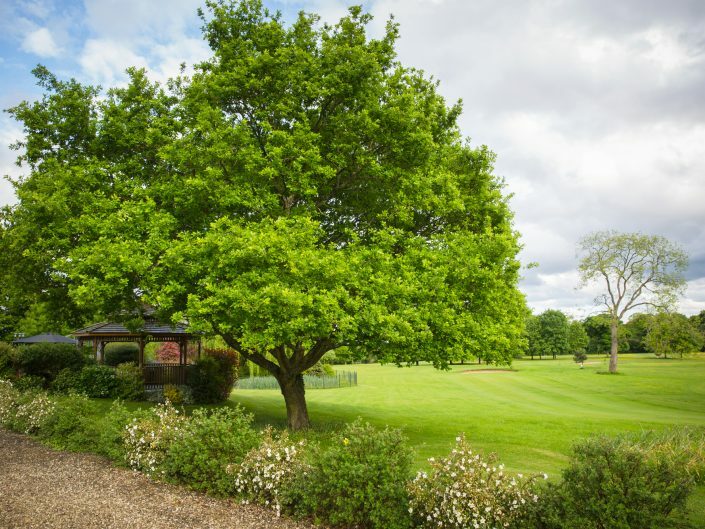 The grounds are just the right size. 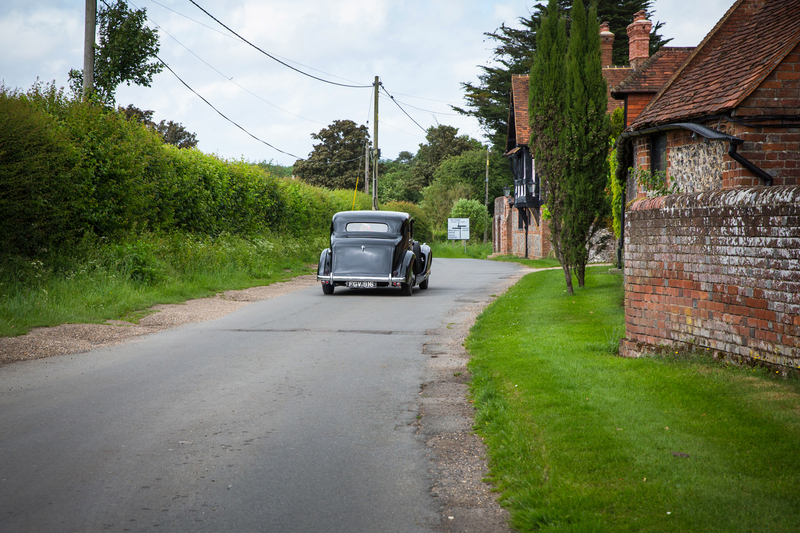 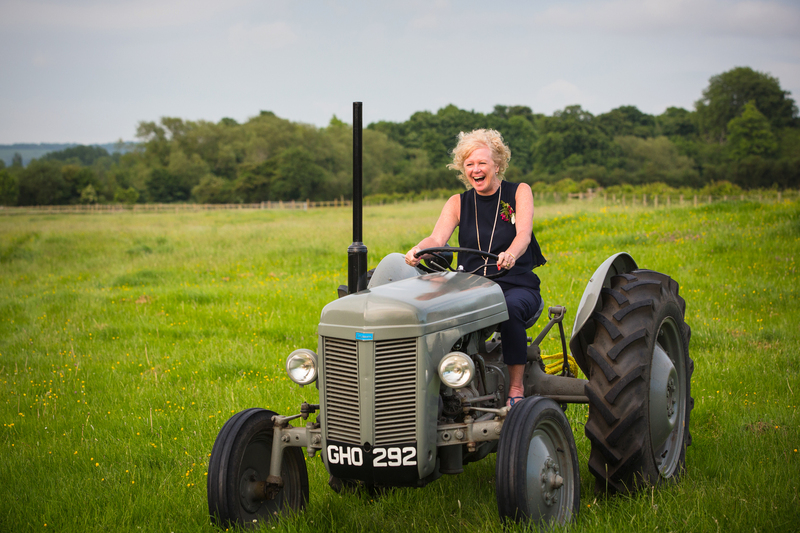 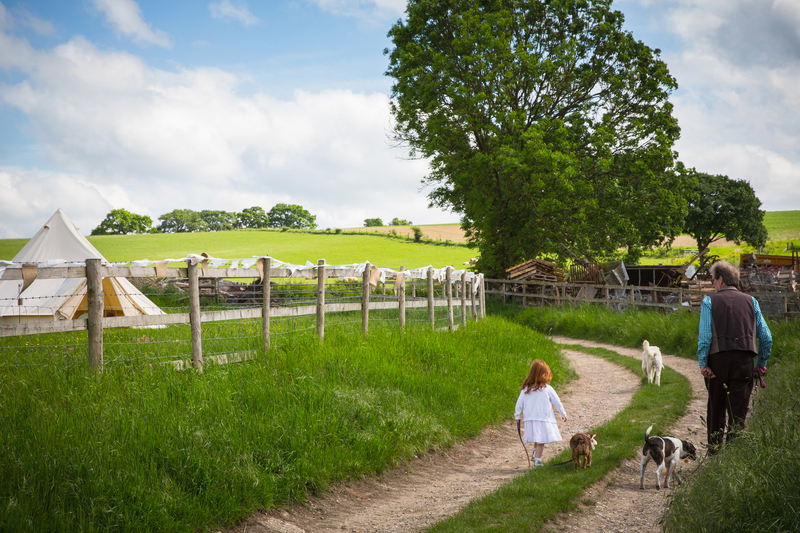 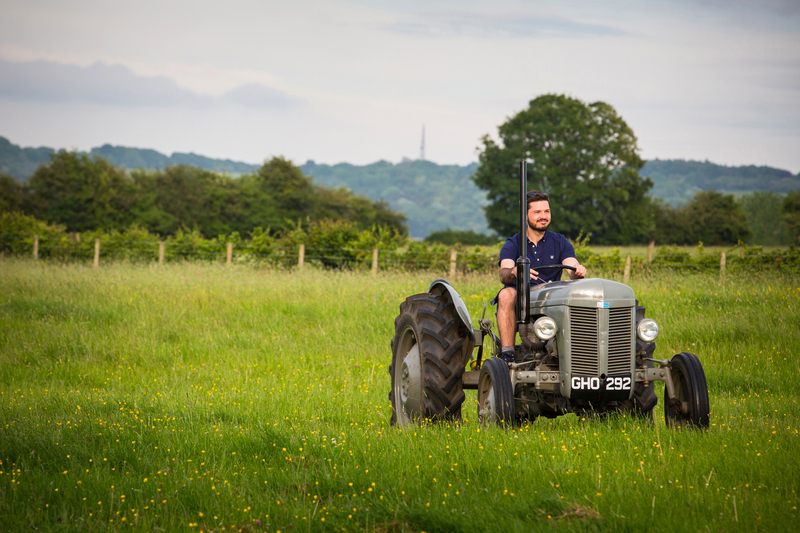 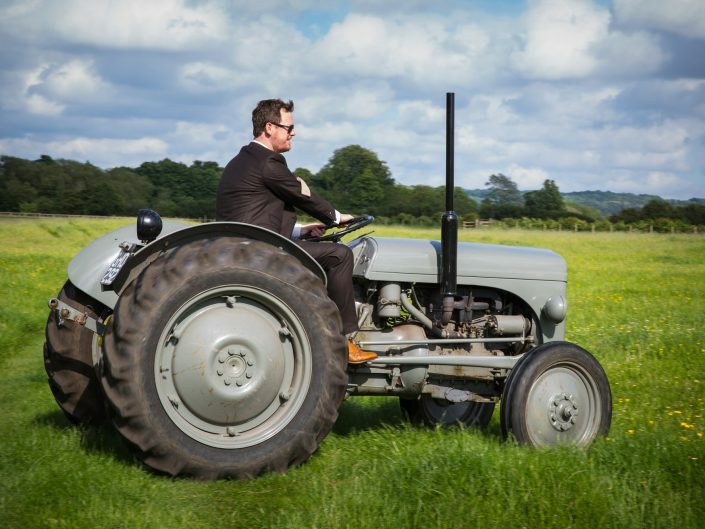 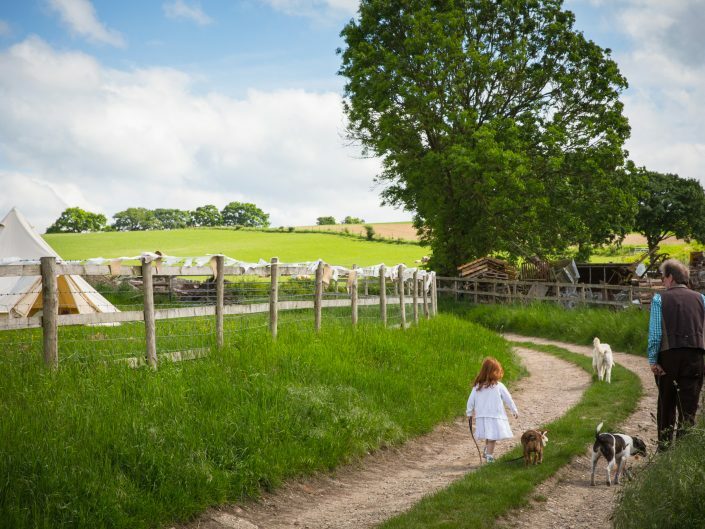 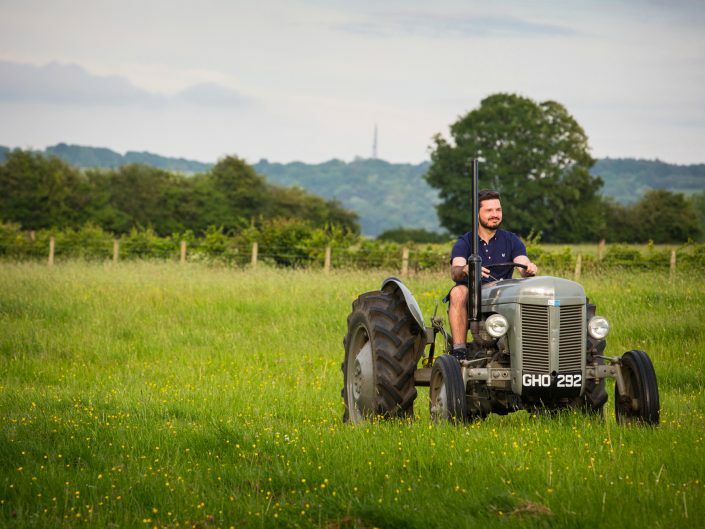 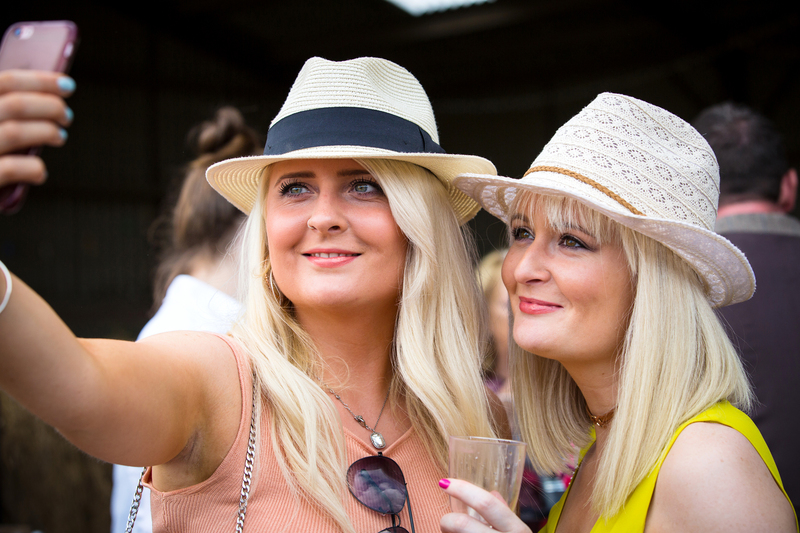 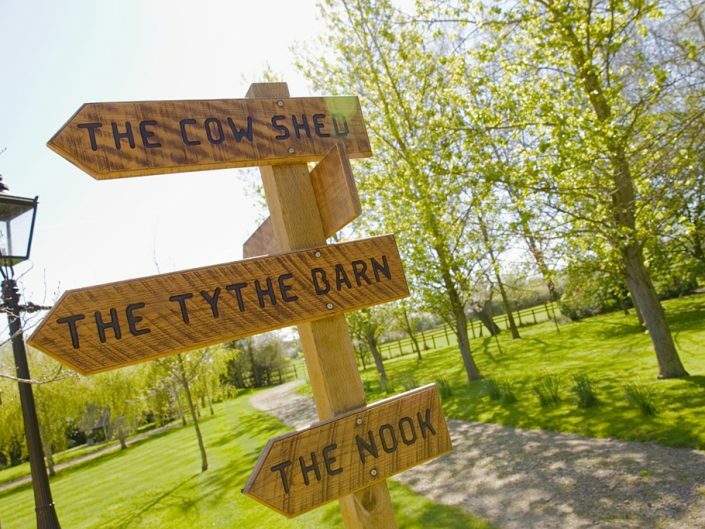 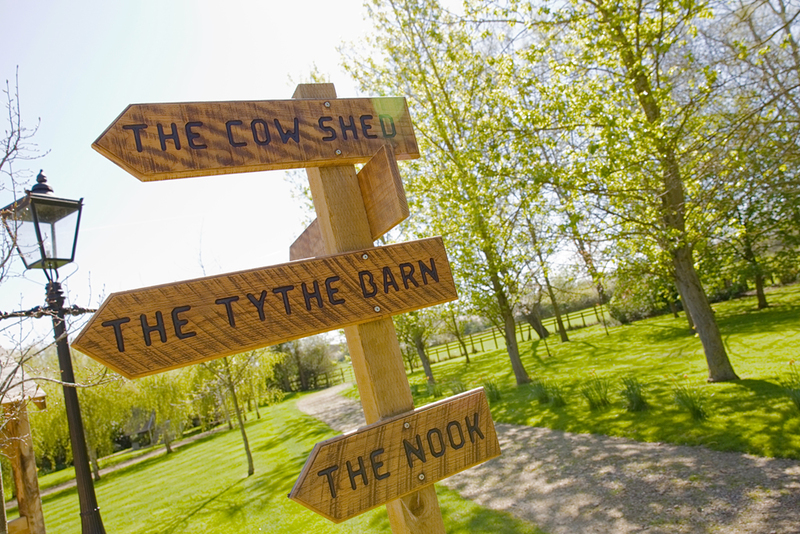 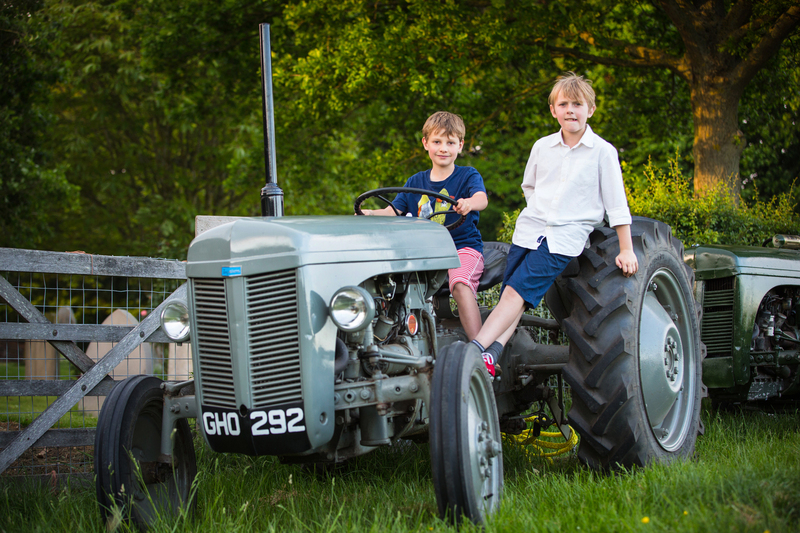 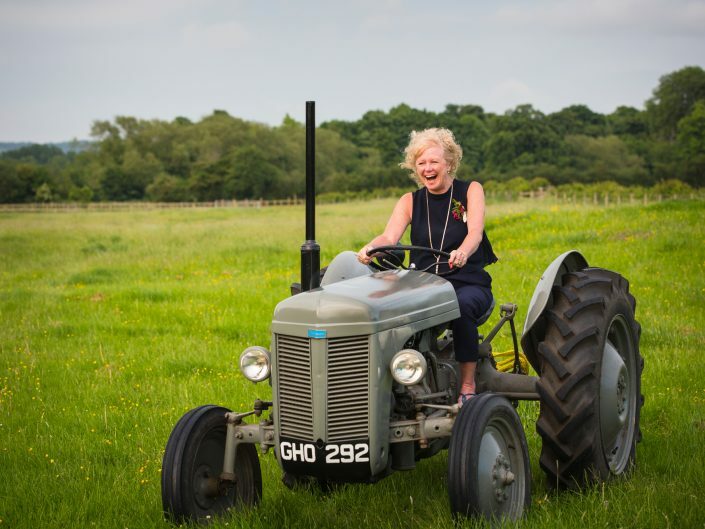 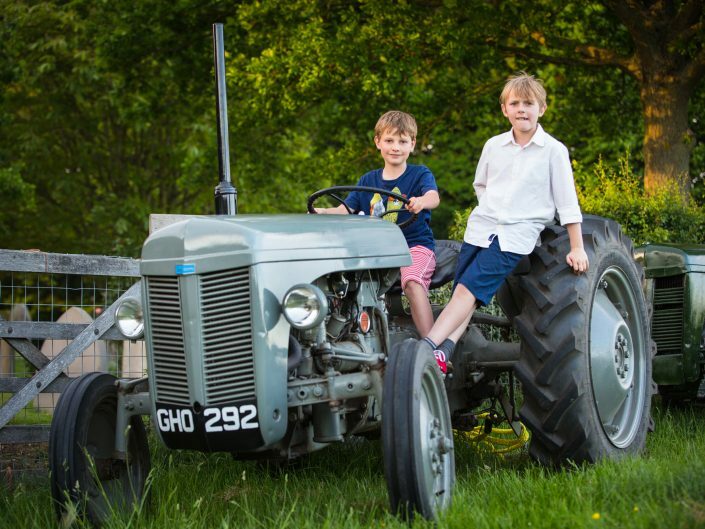 There are some great places around the barn for shots, the folly, shepherds hut & tree lined driveway to name but a few – all without walking miles! 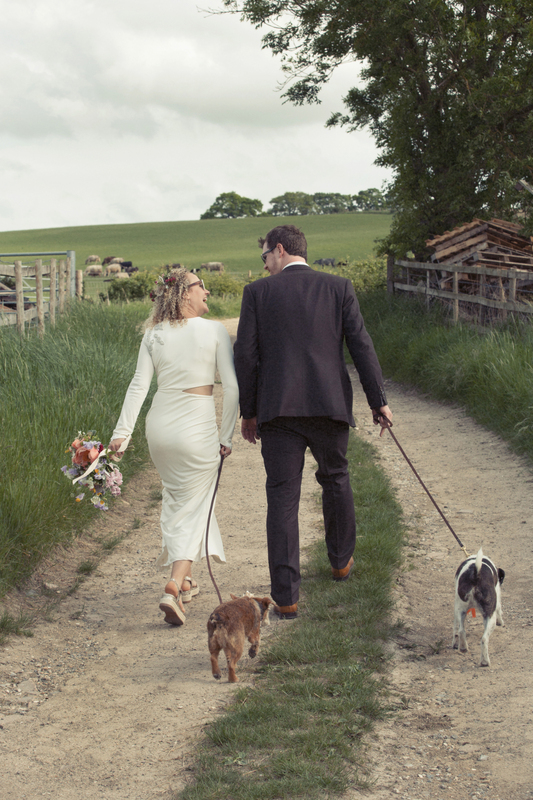 We don’t like to keep the couple away from their guests for too long so we made our way back to the barn. 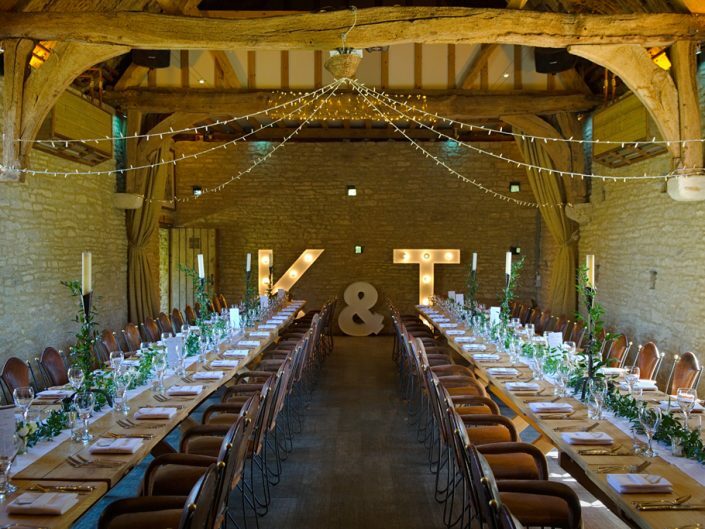 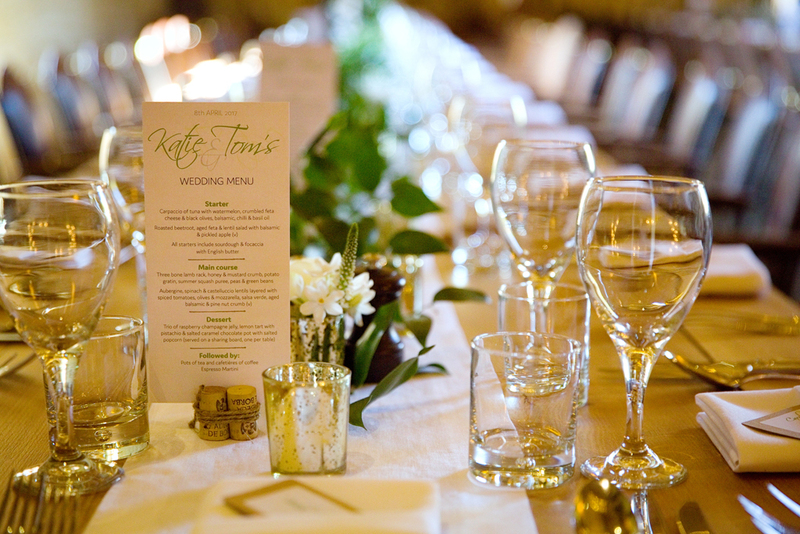 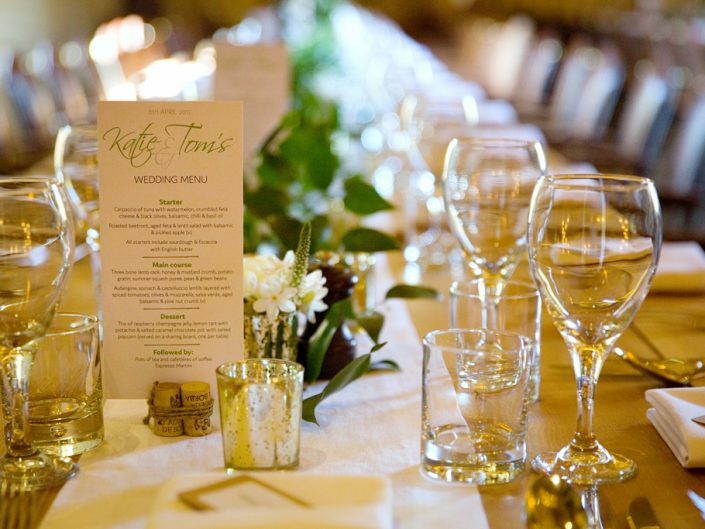 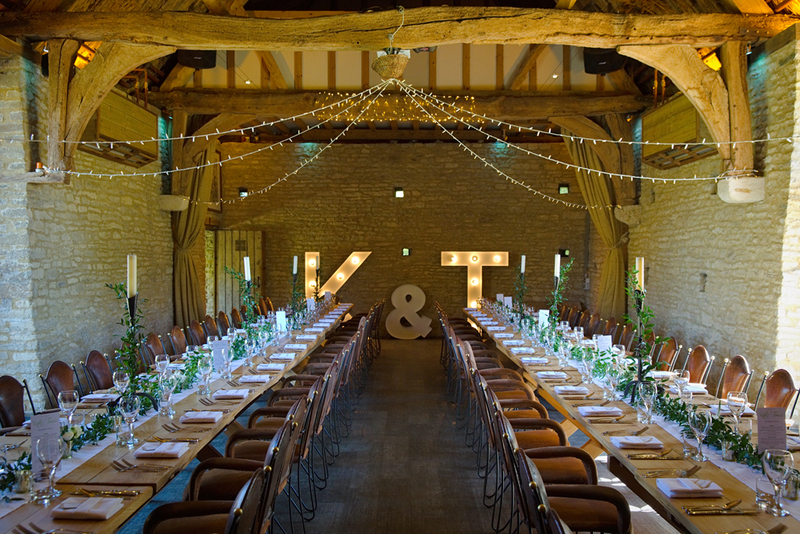 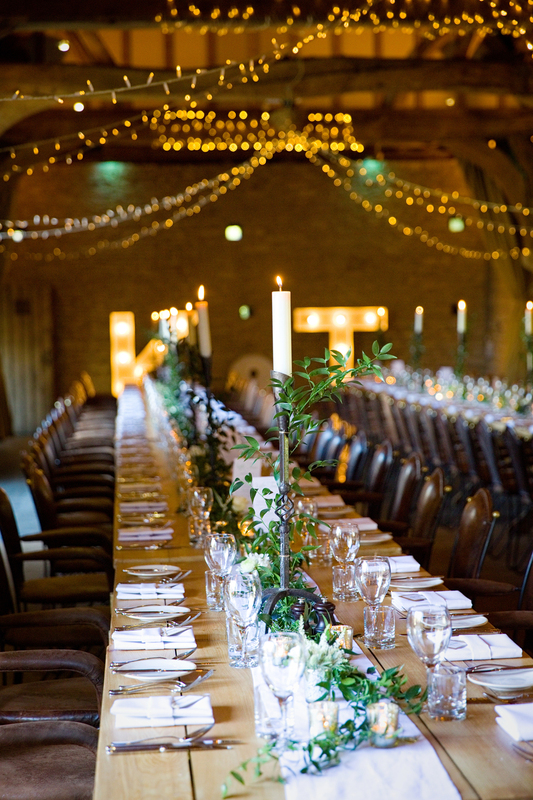 Katie & Tom’s reception tables were laid out banquet style & everyone stood & cheered as they made their way to the barn. 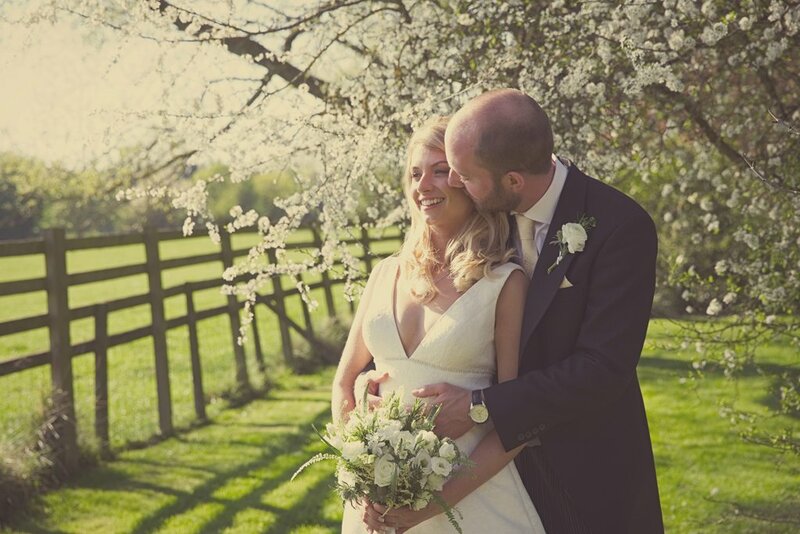 It was such a beautiful day, only enhanced by the stunning weather. 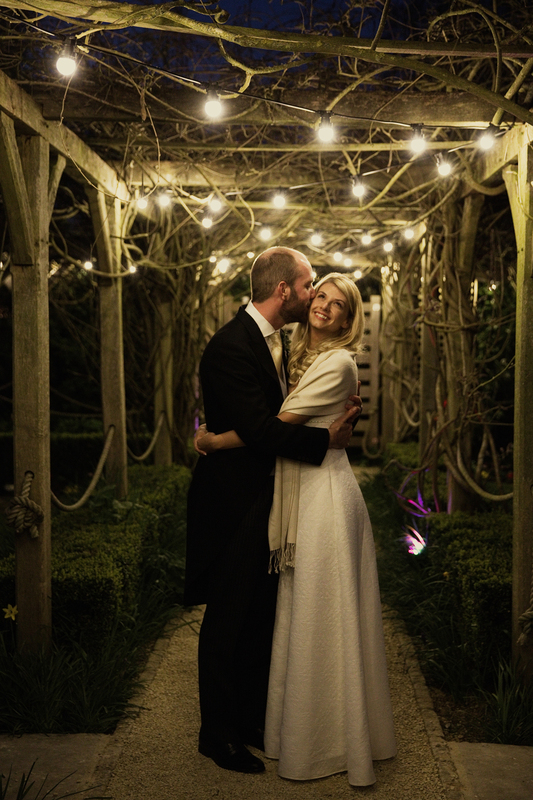 It was so warm that after dinner everyone mingled outside whilst I did some cool shots of the happy couple under the lights. 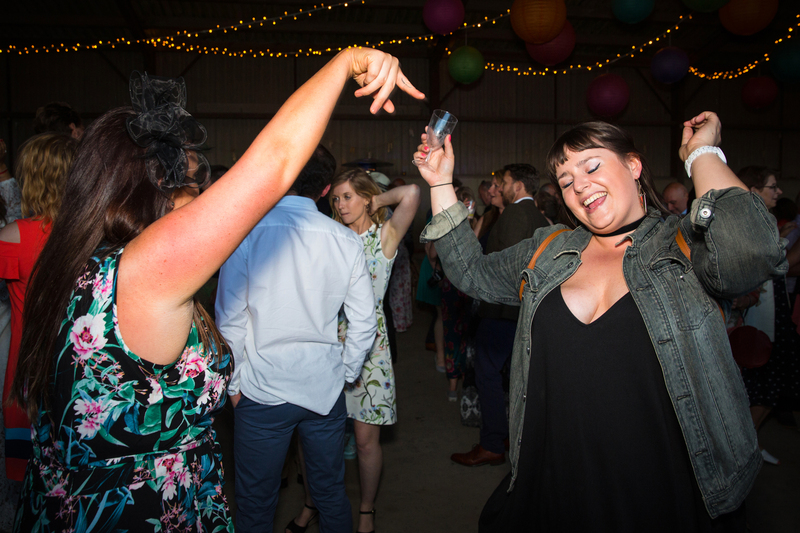 Before long it was time for everyone to hit the dancefloor & after capturing some shots of them boogying the night away we made our way home.